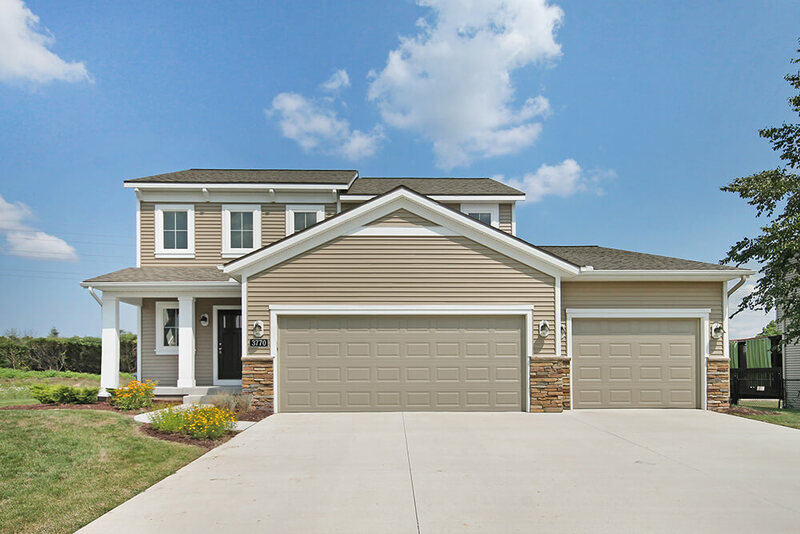 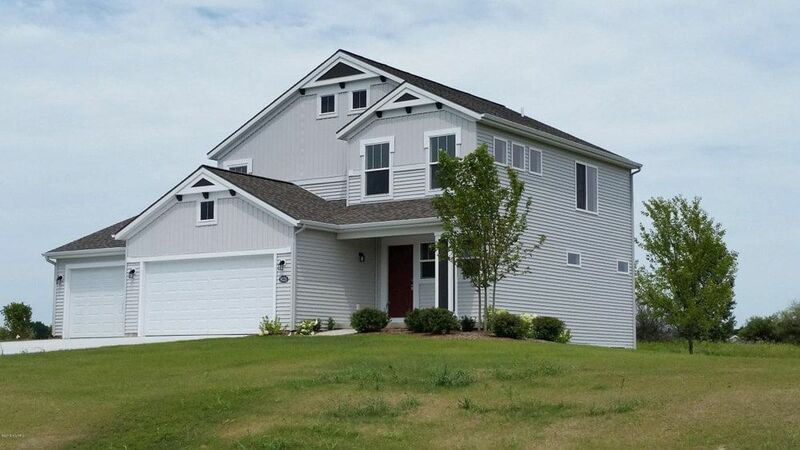 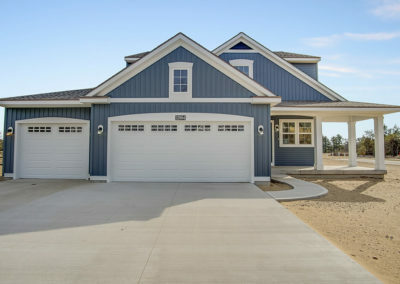 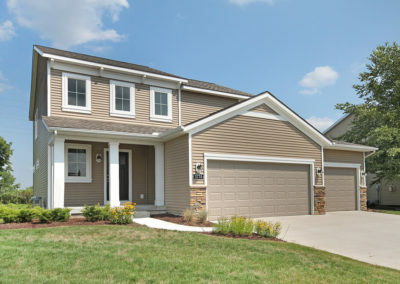 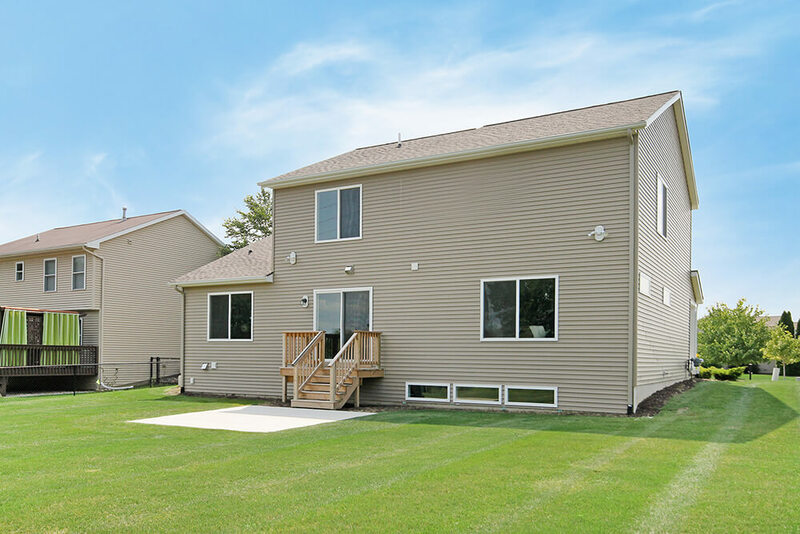 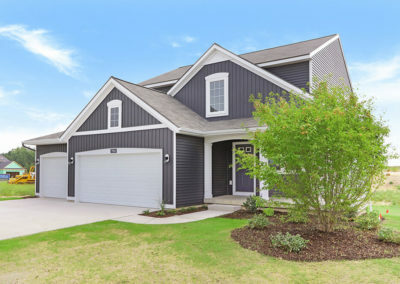 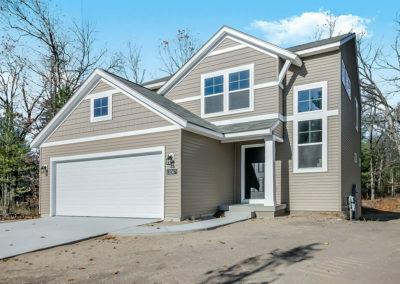 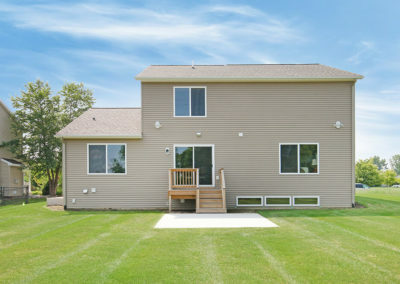 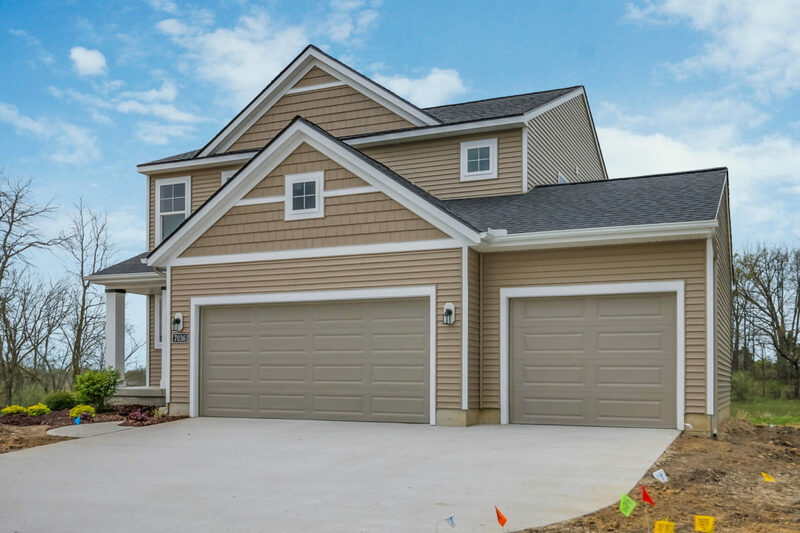 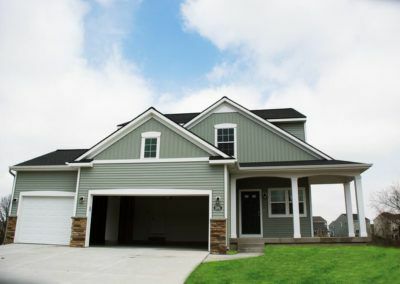 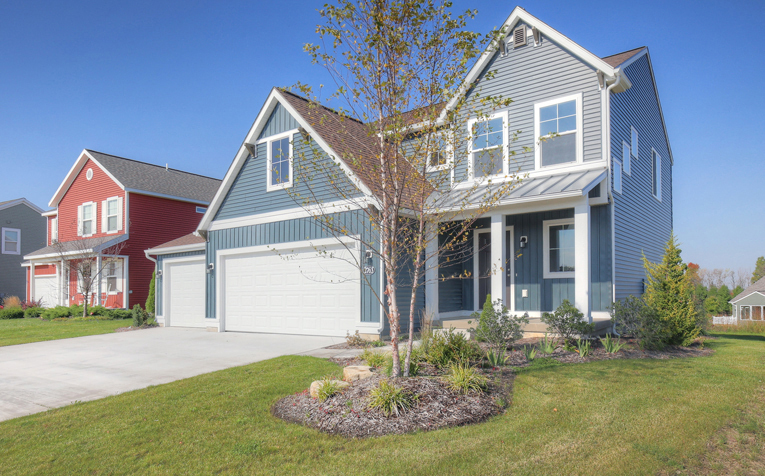 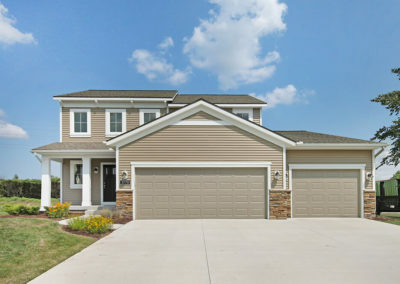 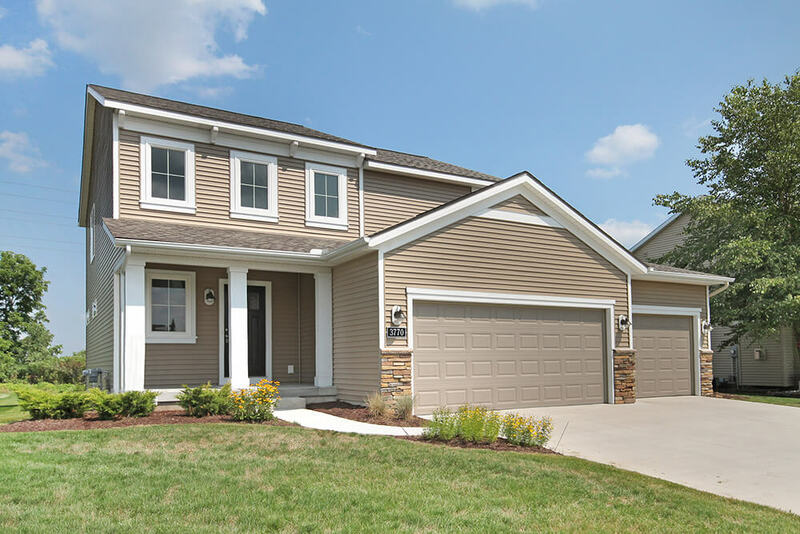 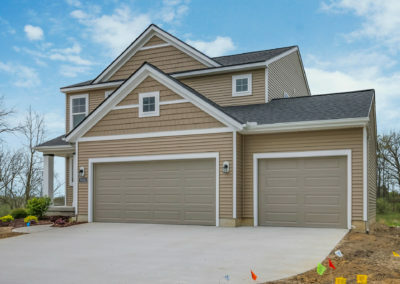 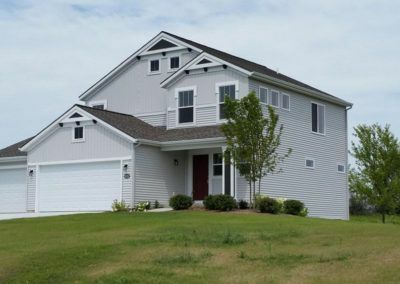 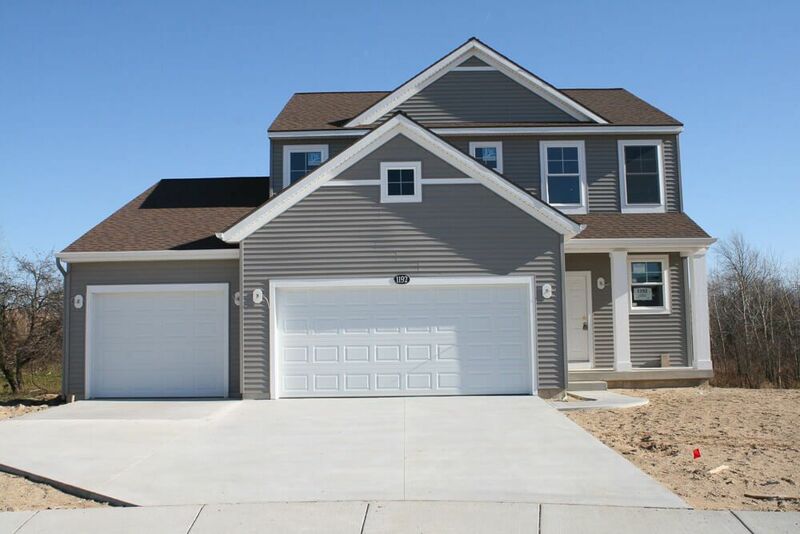 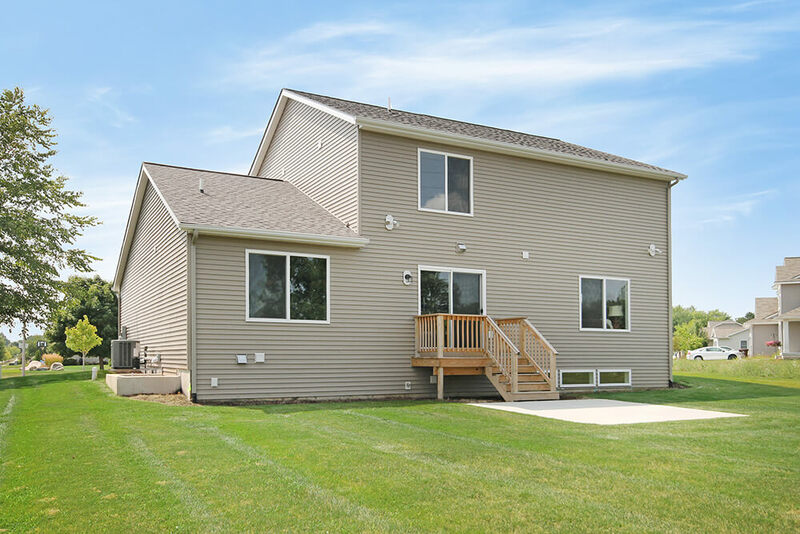 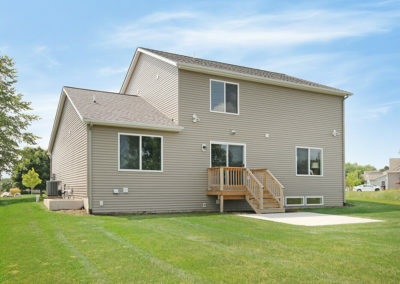 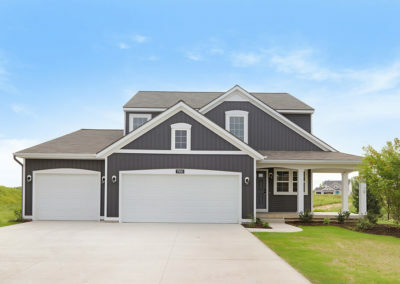 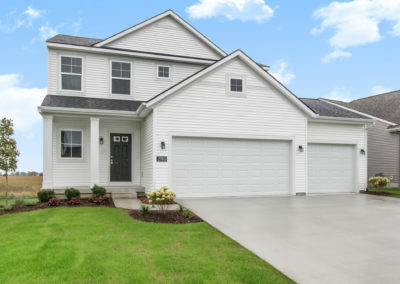 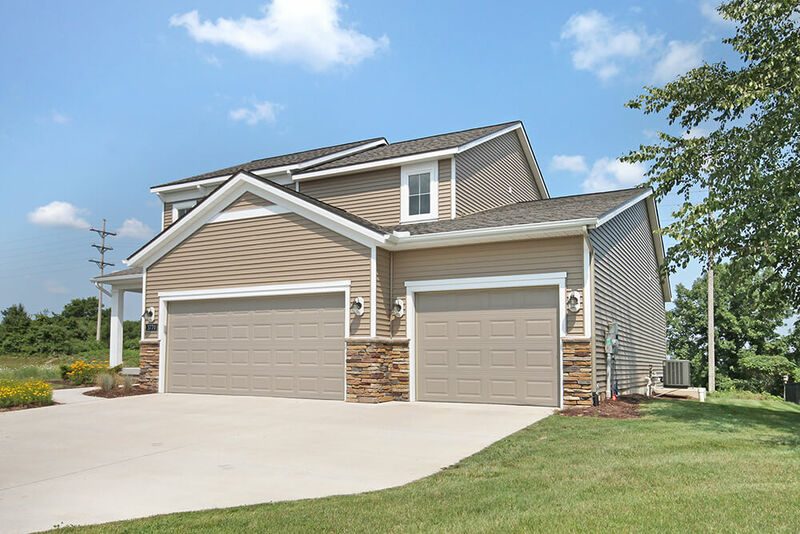 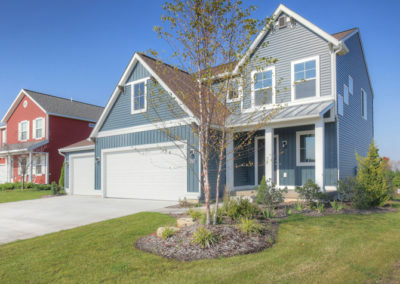 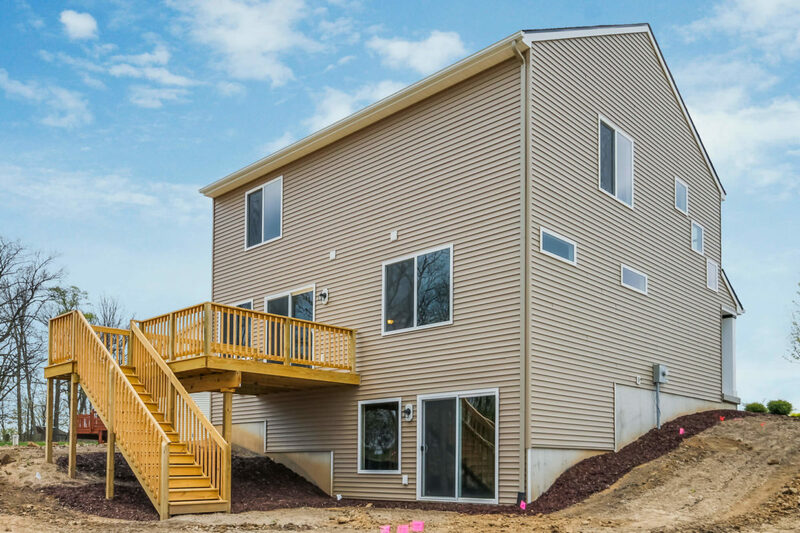 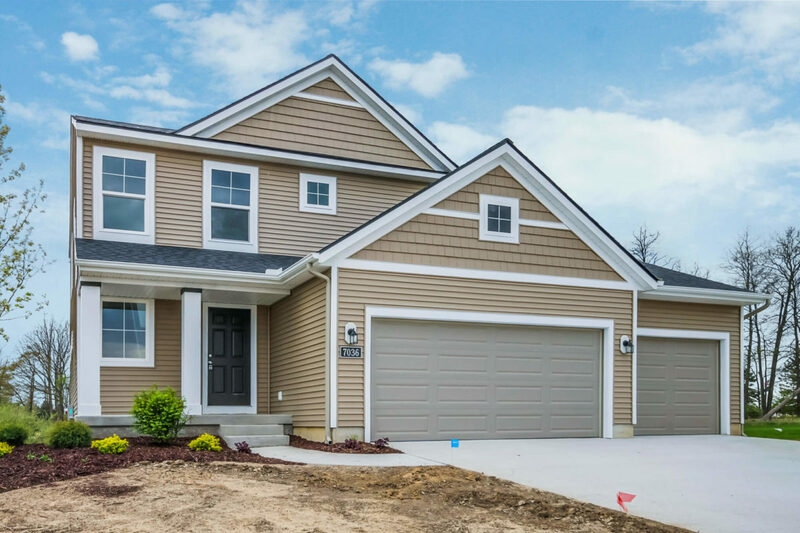 The Taylor plan is a charming, contemporary two story home with a wide range of options and flexibility to grow and transform to accommodate your changing lifestyle. 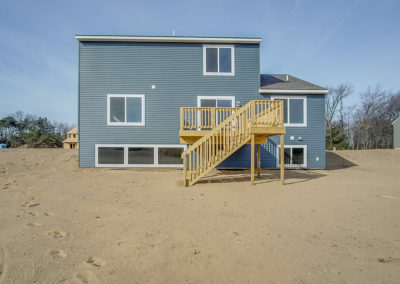 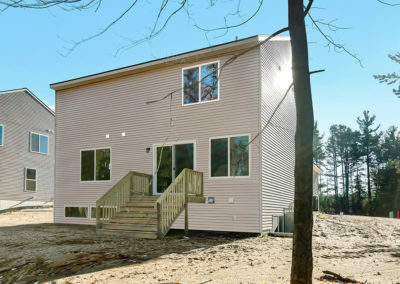 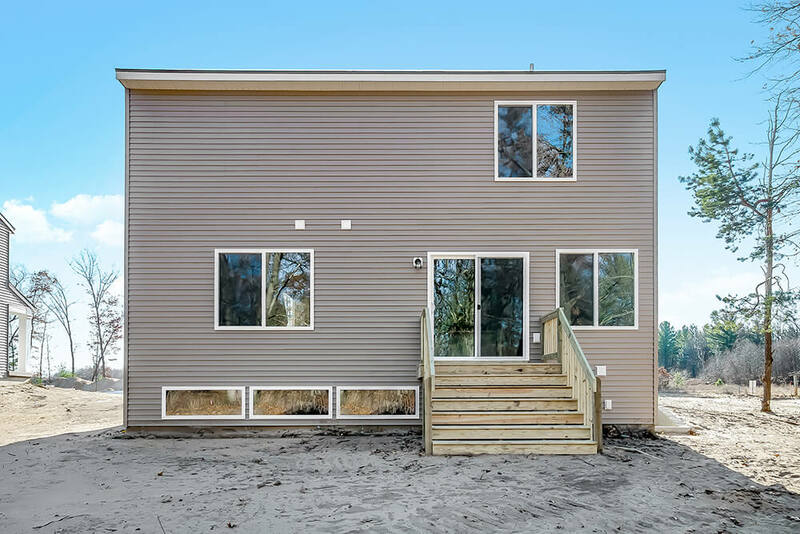 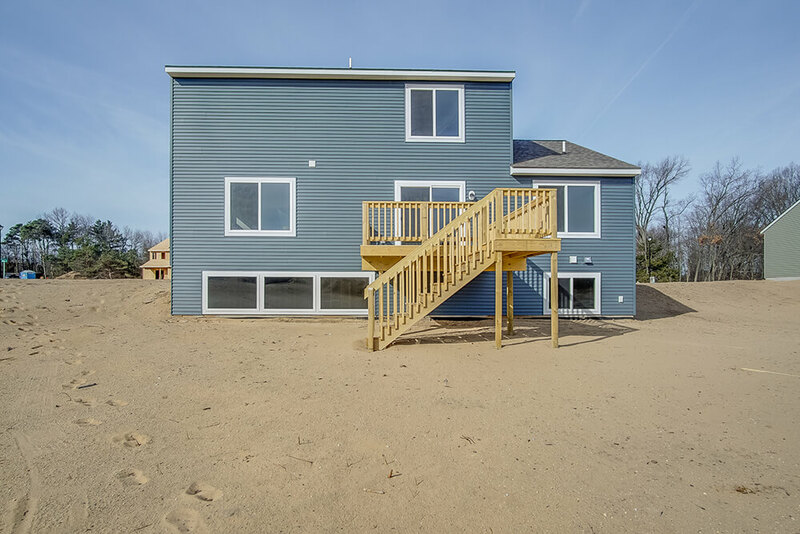 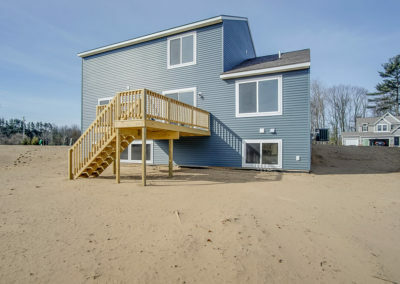 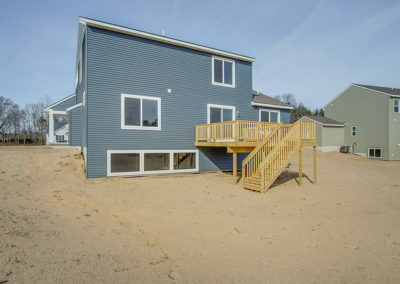 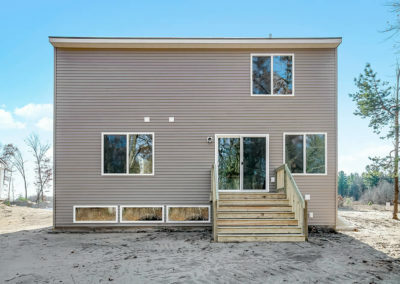 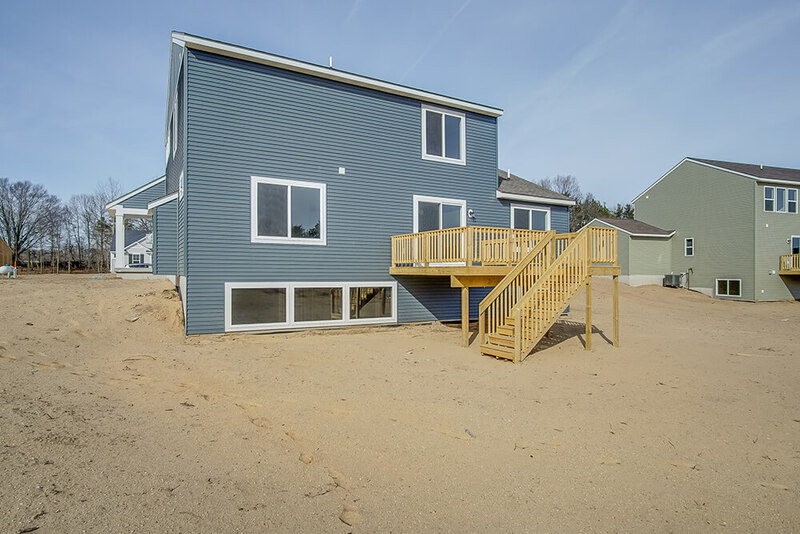 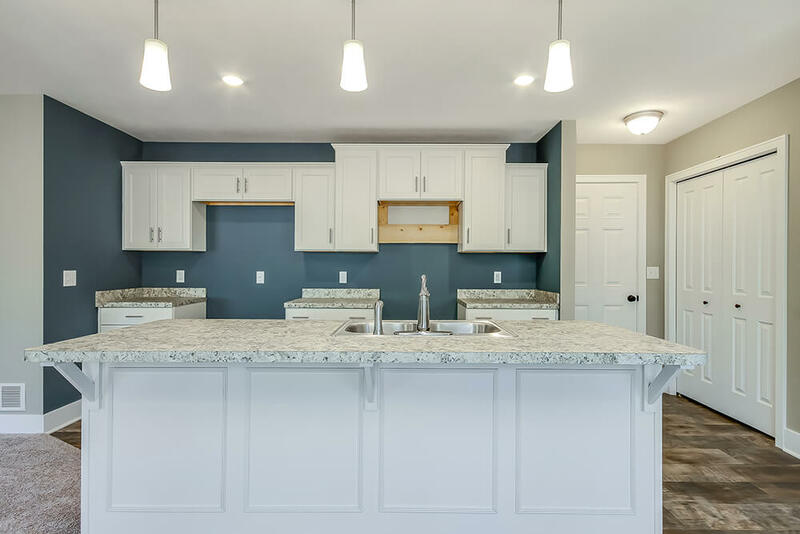 The basic plan includes 1720 square feet of finished living space, four bedrooms, two and a half baths, and an unfinished lower level. 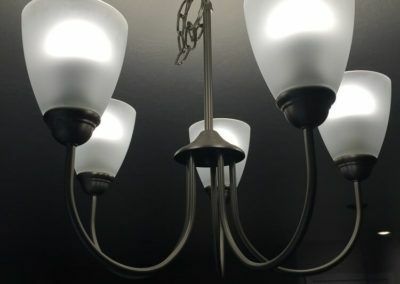 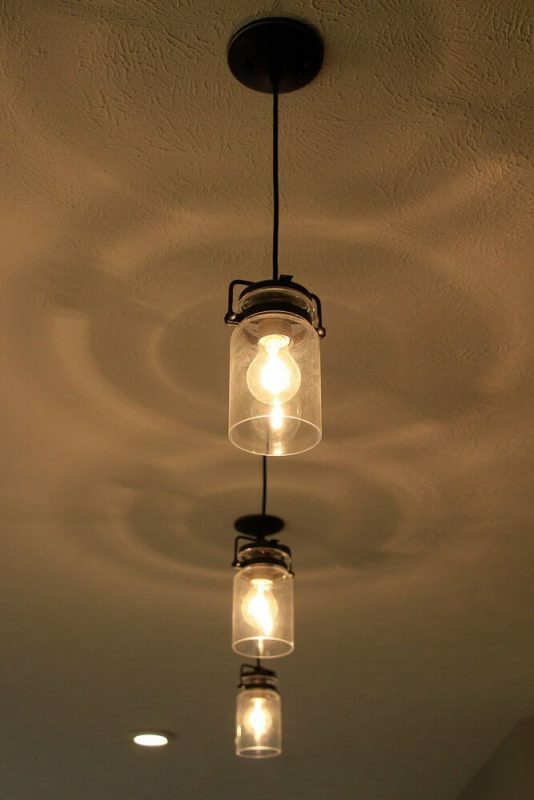 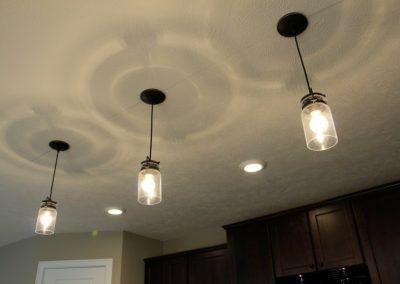 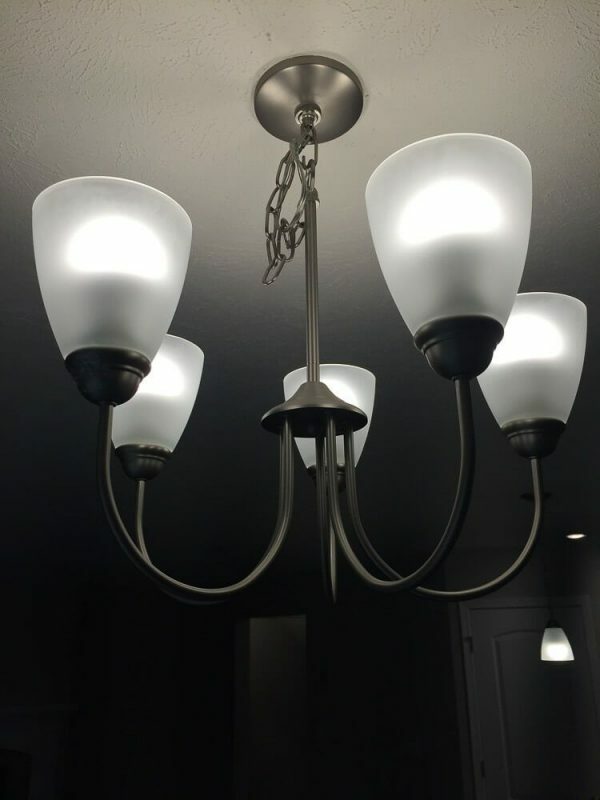 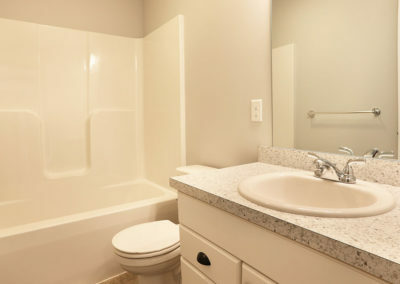 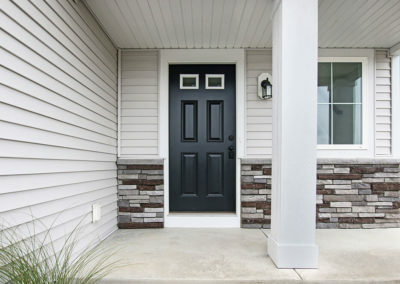 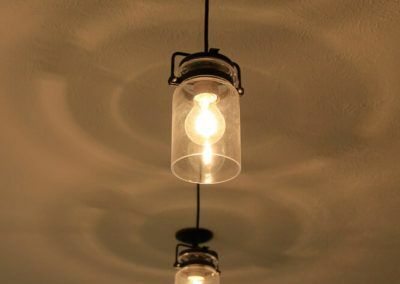 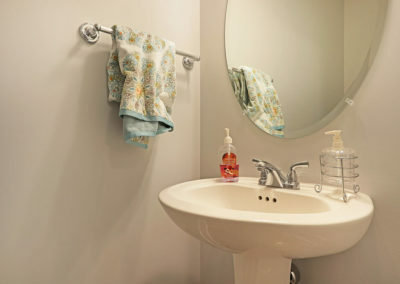 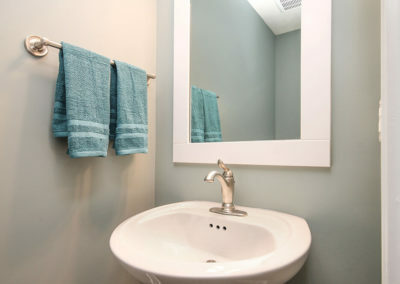 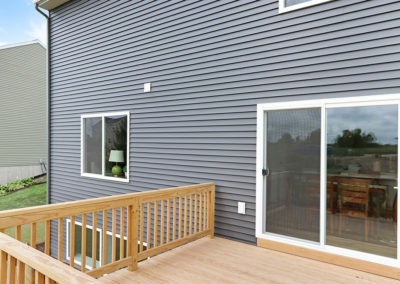 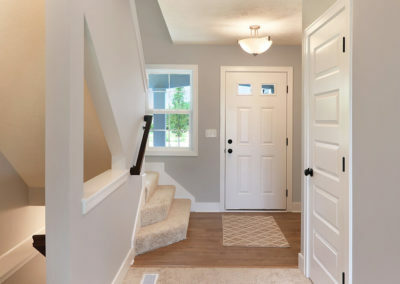 From this starting point numerous options are available to expand the plan, personalize the interior and exterior of your new home, and create a design that uniquely reflects your own style and personality. 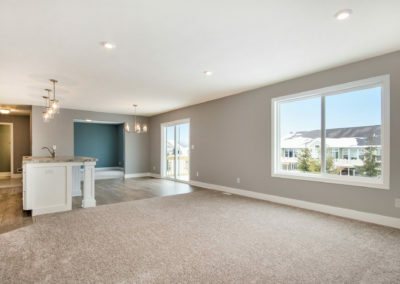 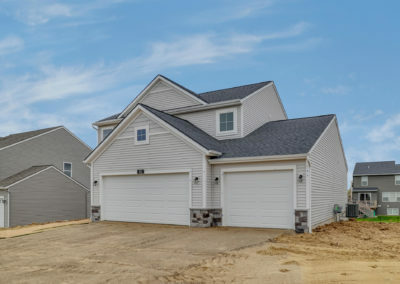 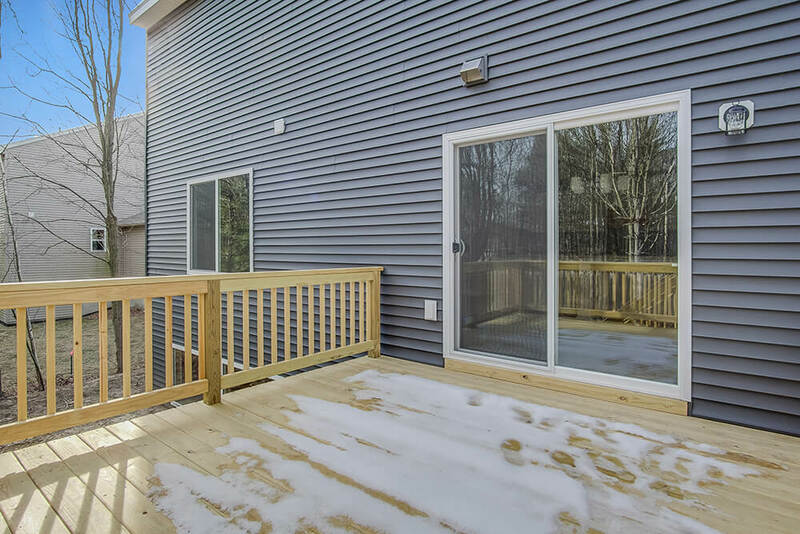 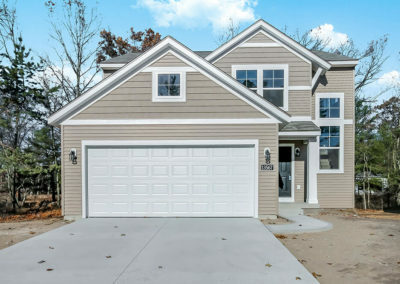 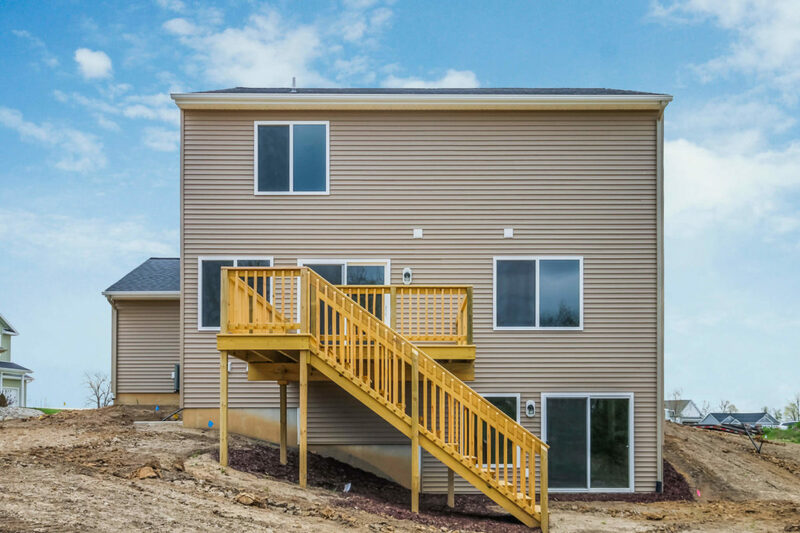 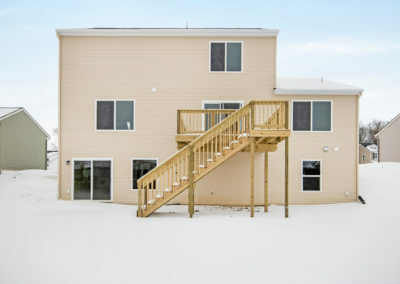 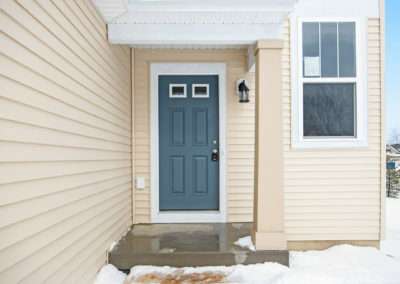 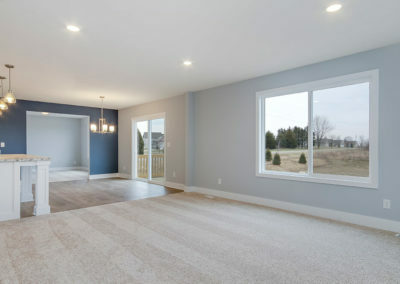 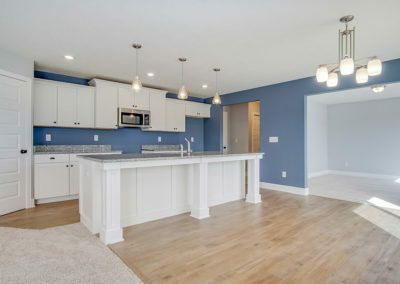 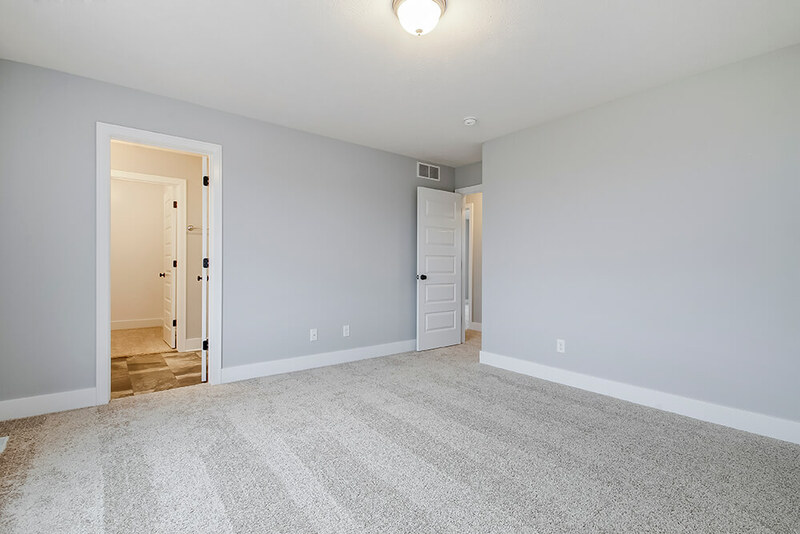 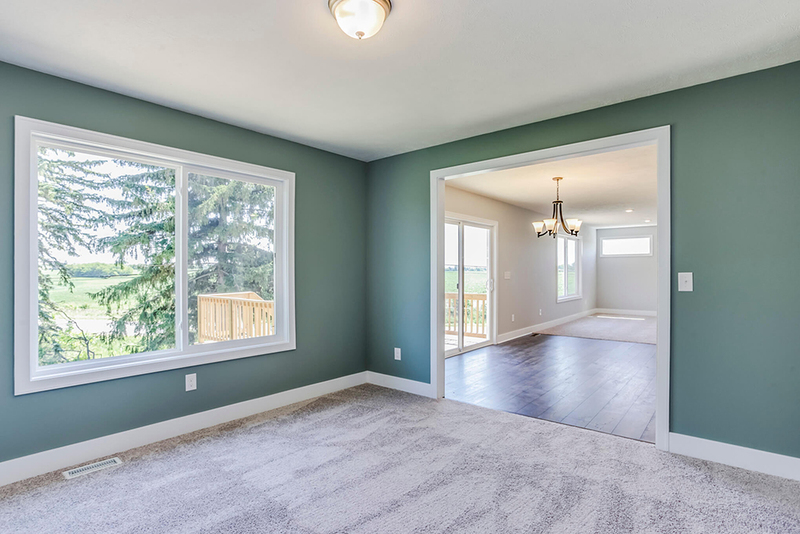 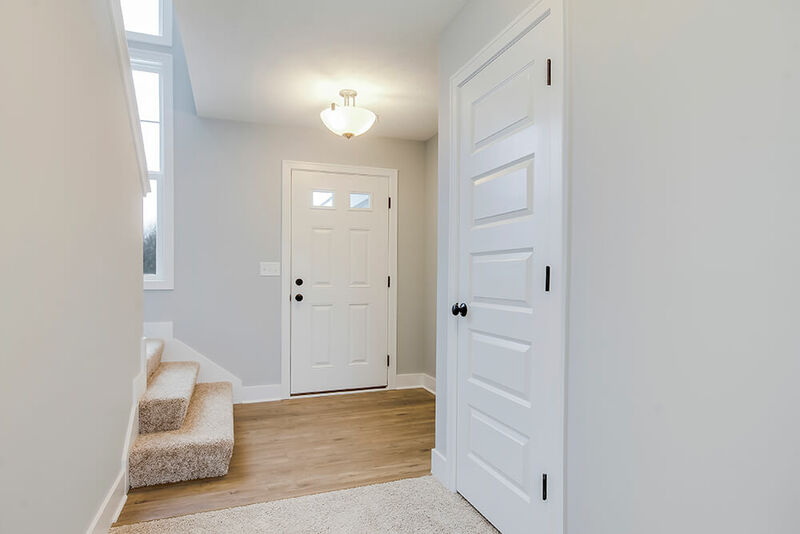 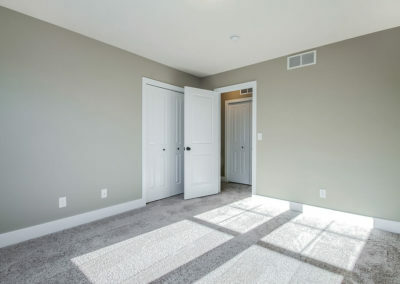 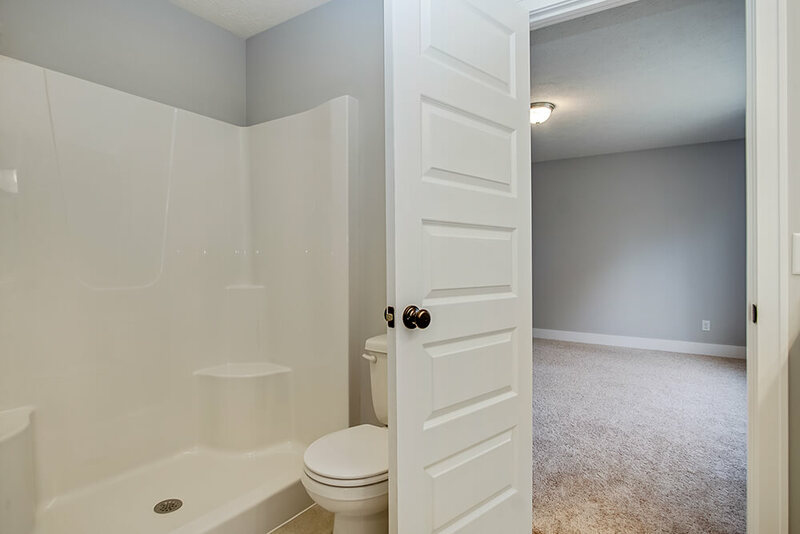 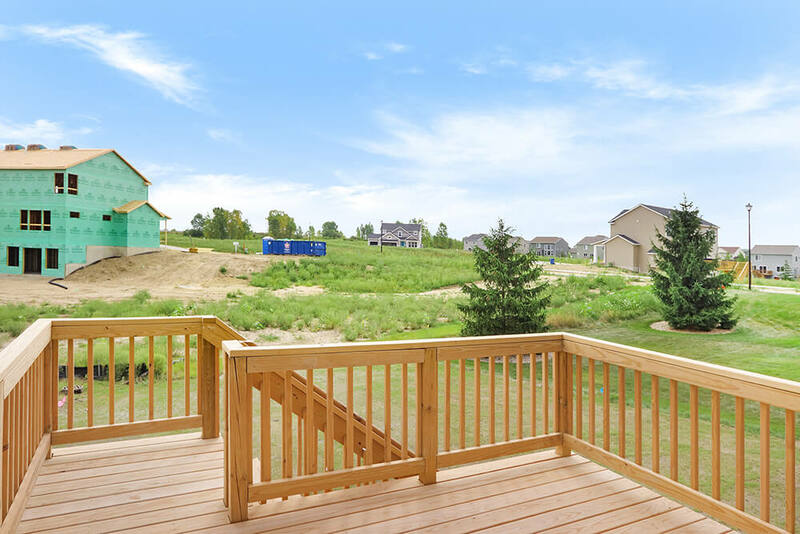 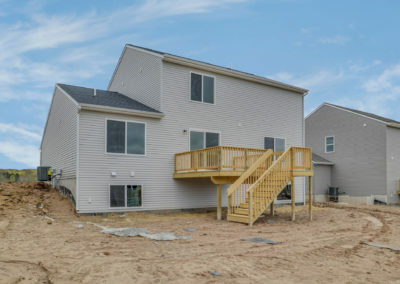 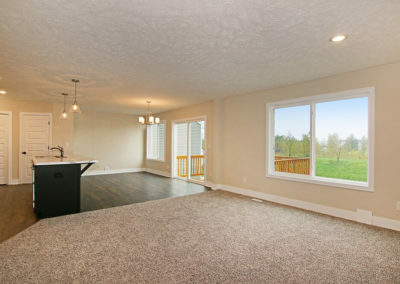 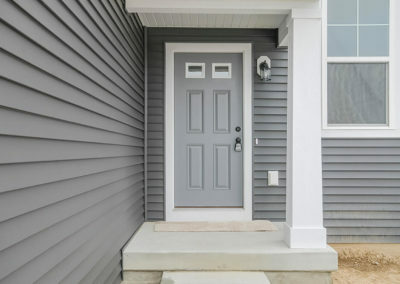 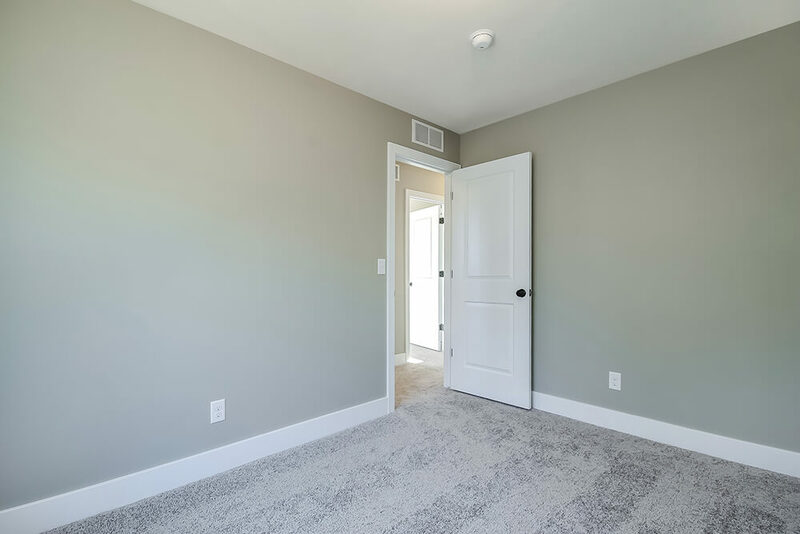 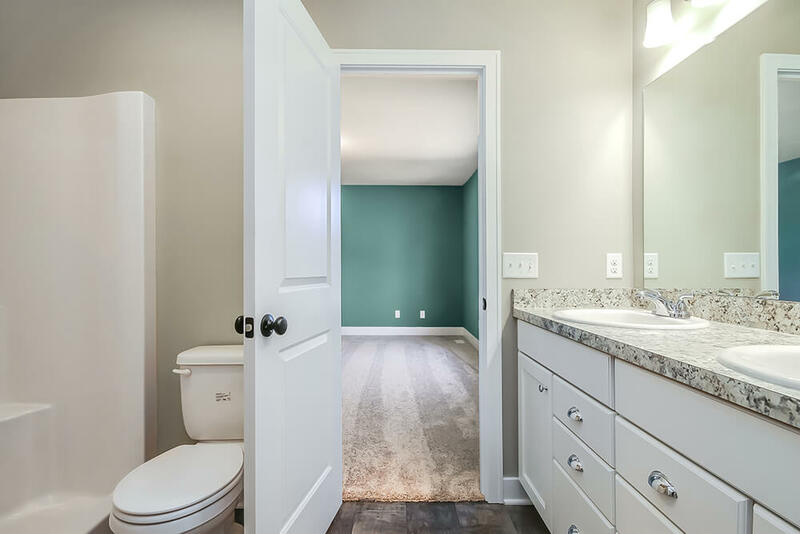 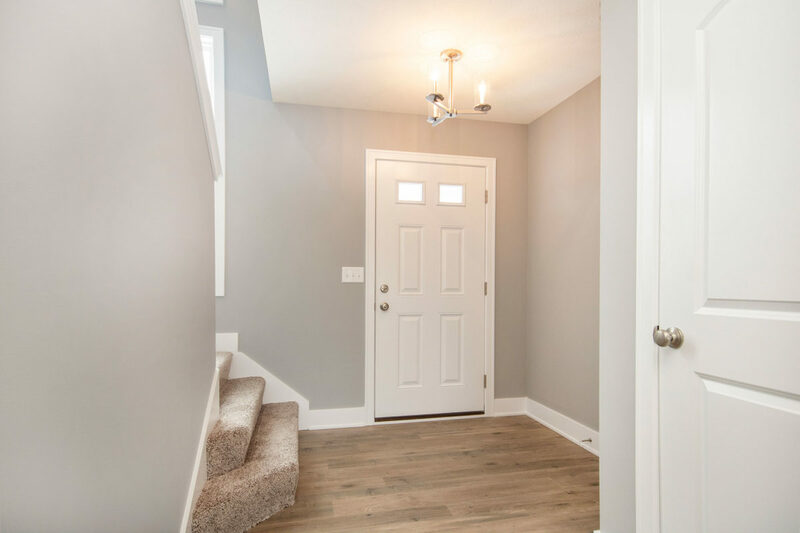 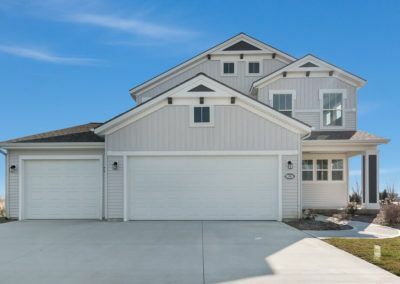 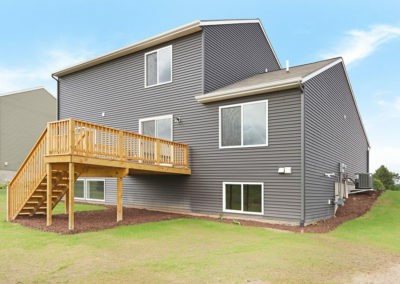 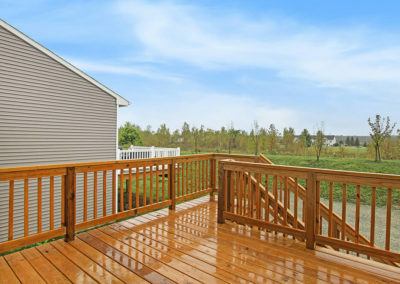 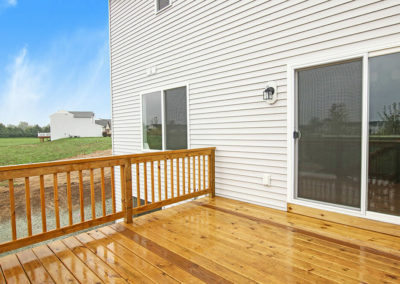 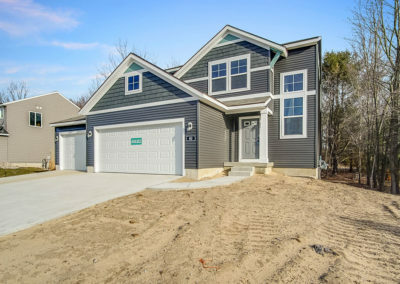 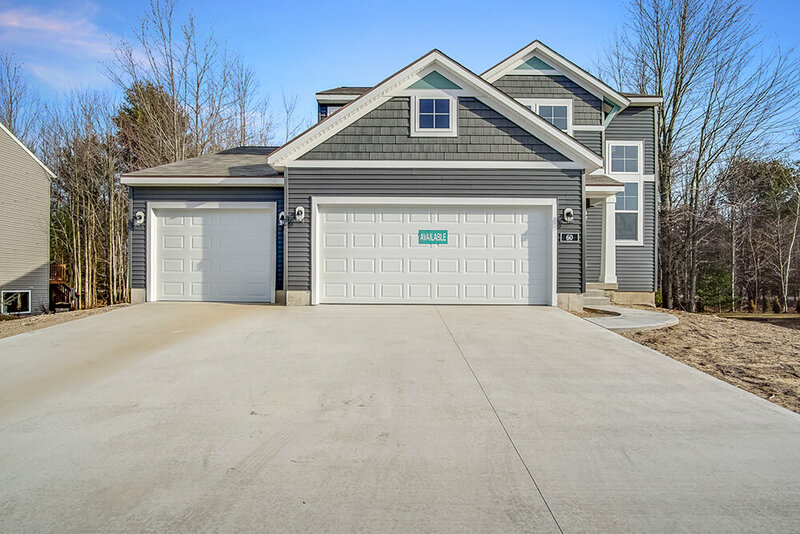 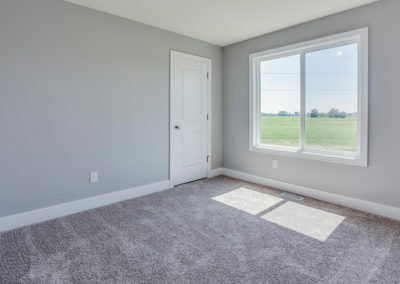 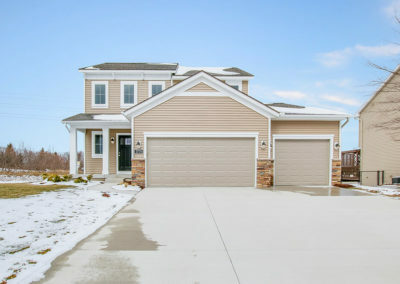 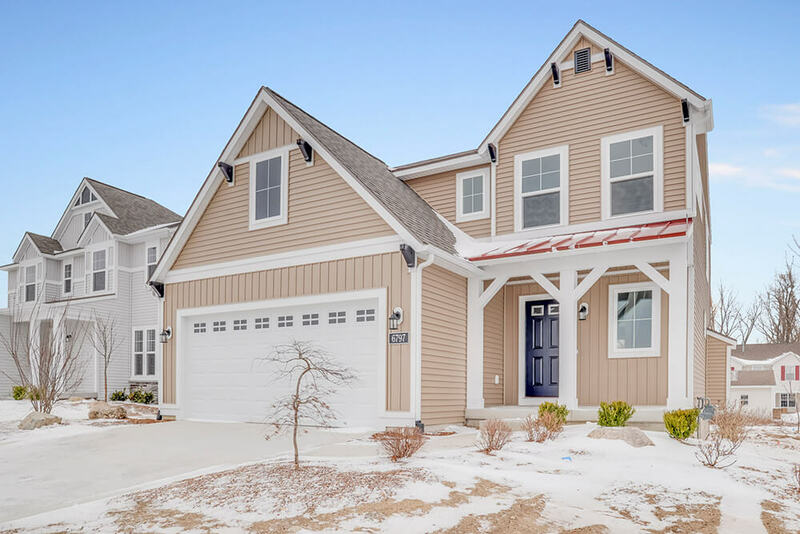 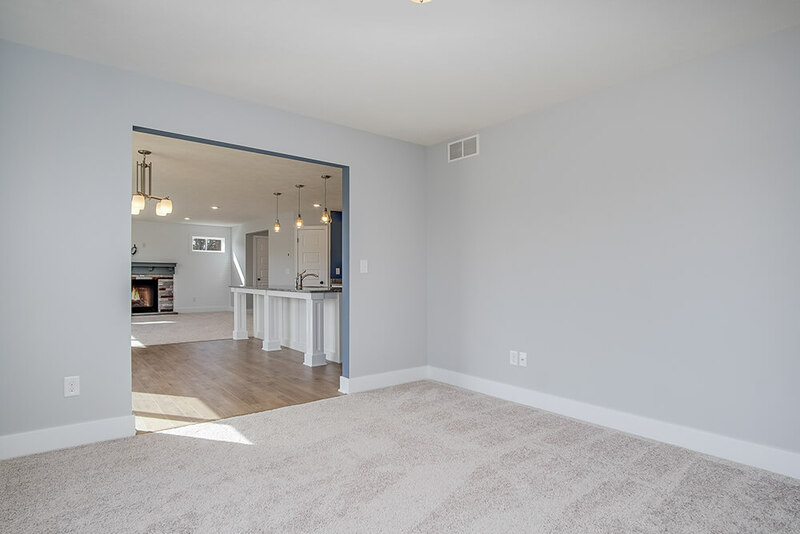 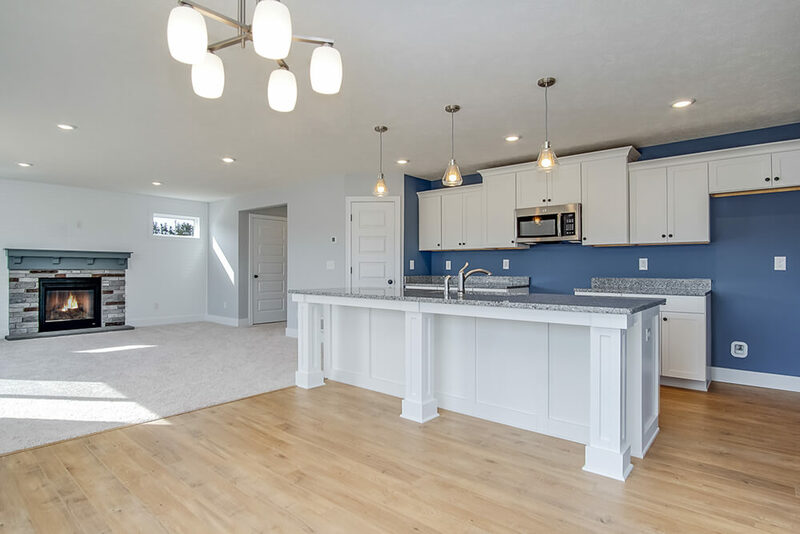 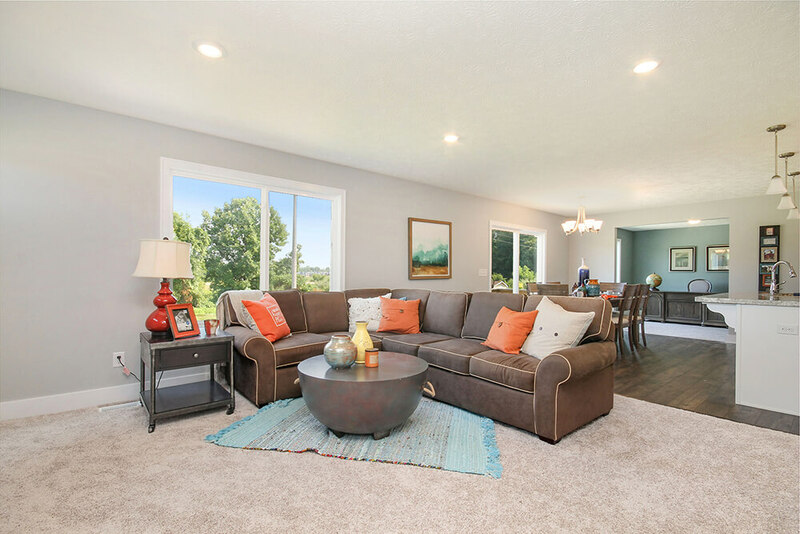 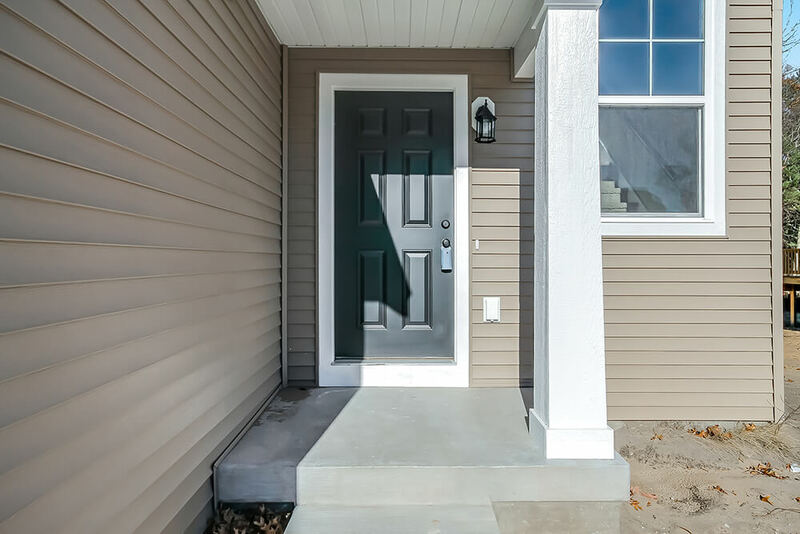 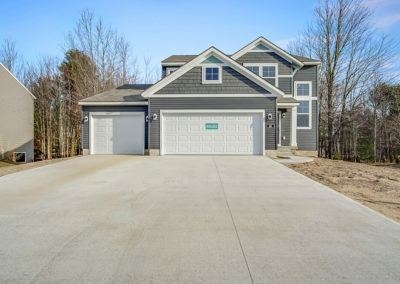 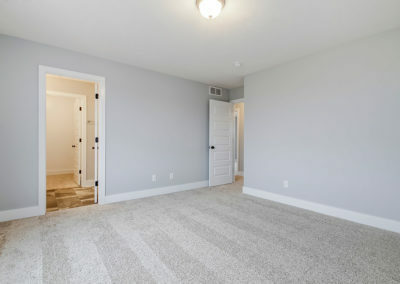 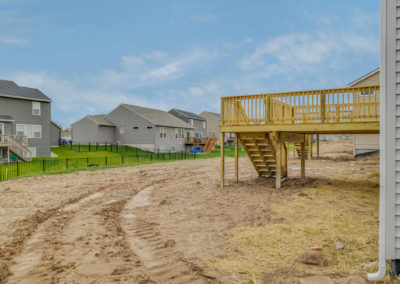 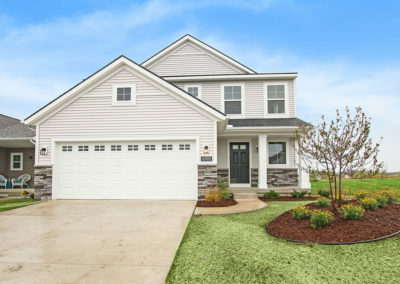 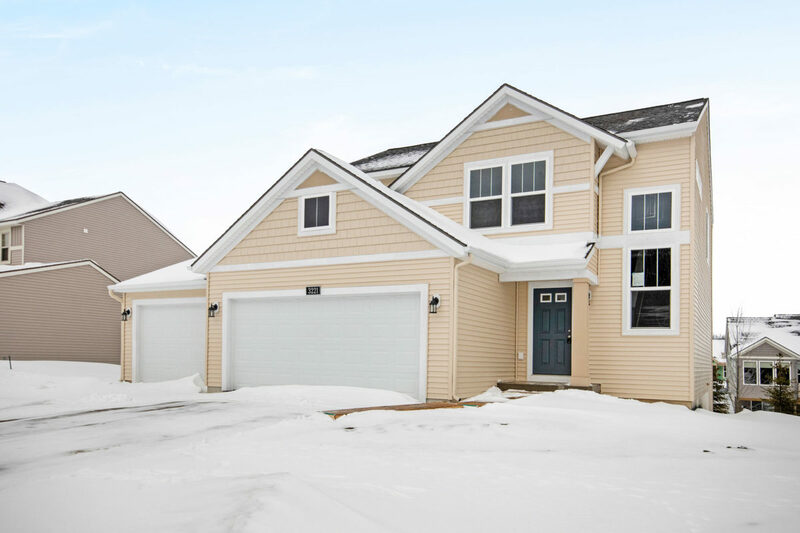 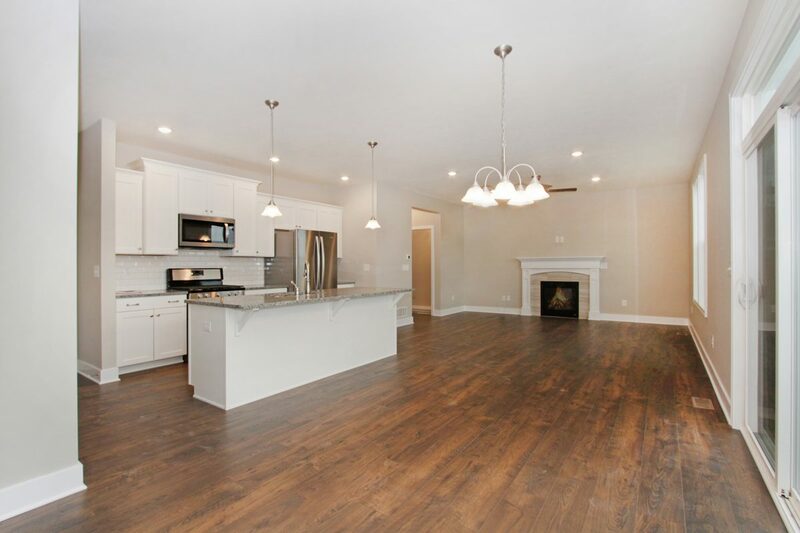 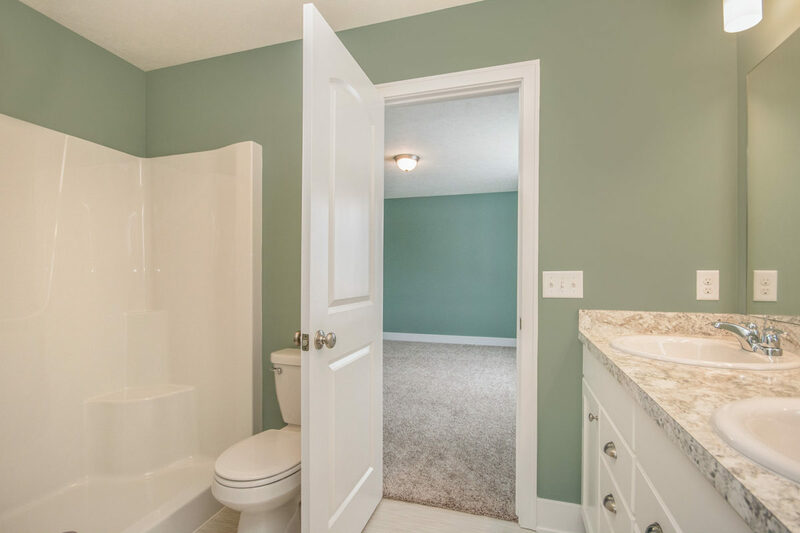 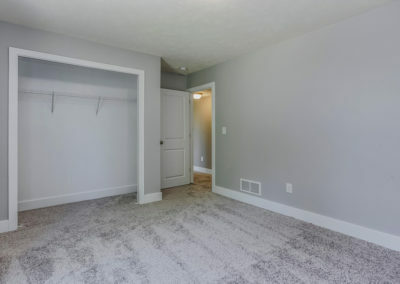 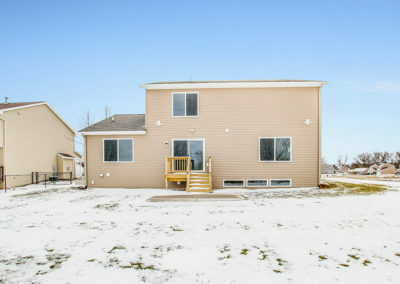 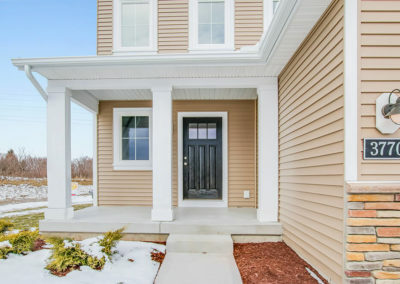 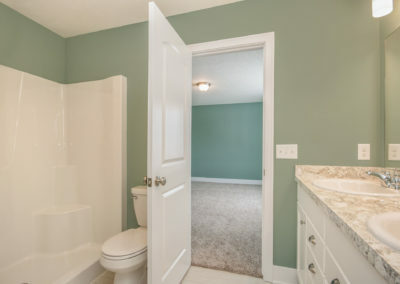 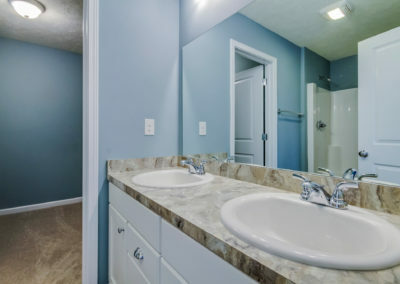 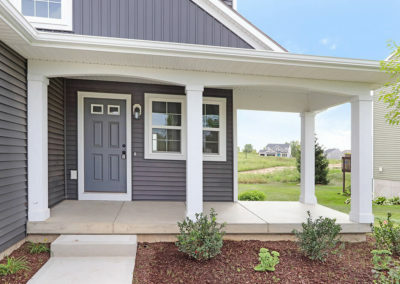 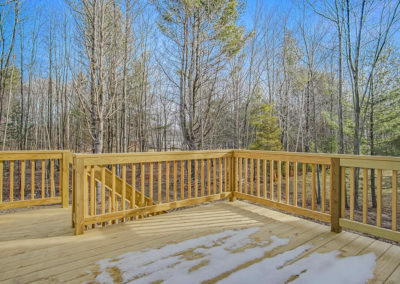 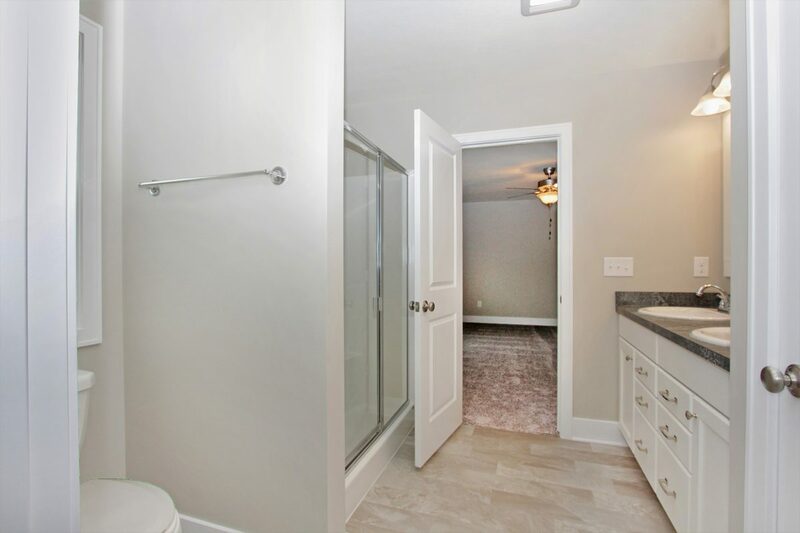 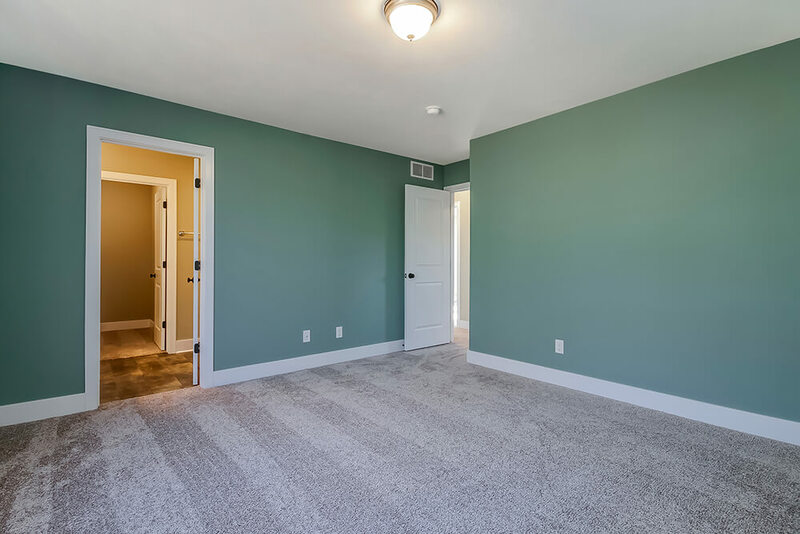 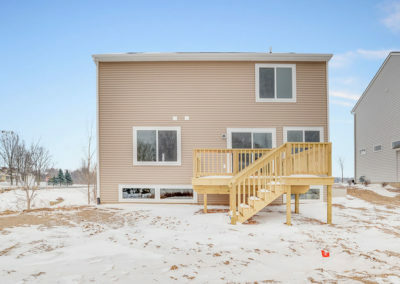 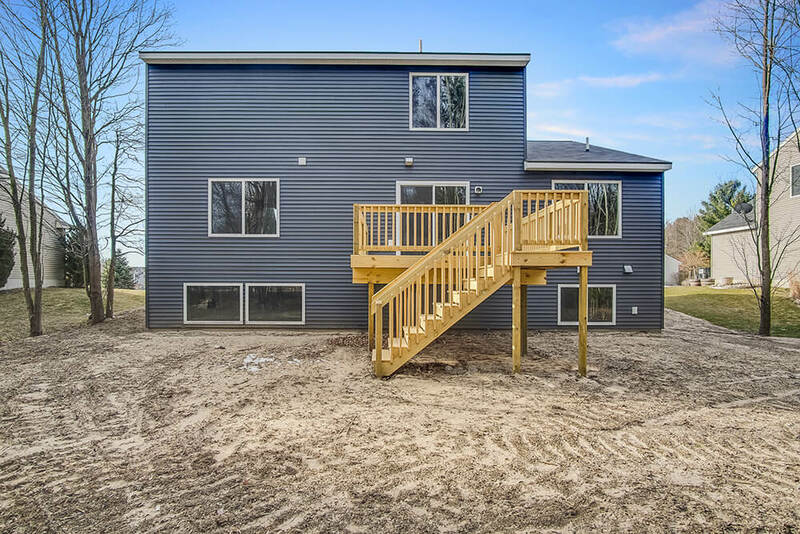 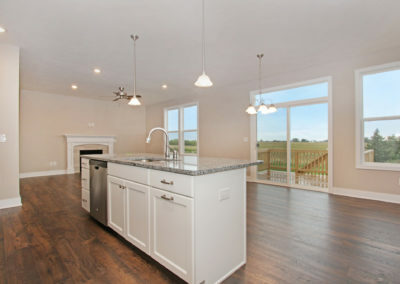 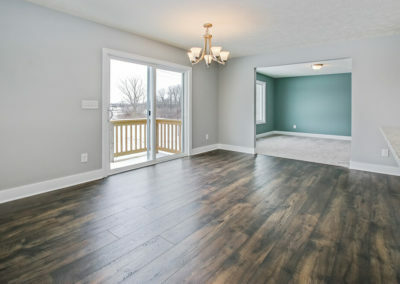 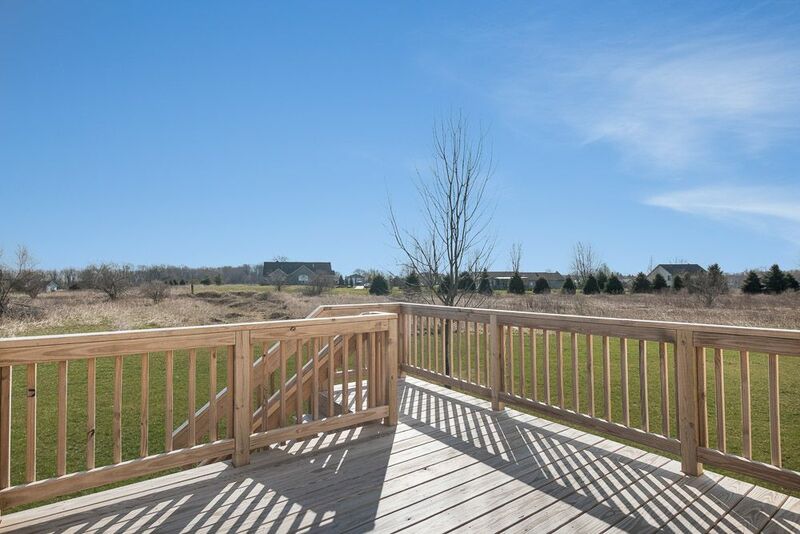 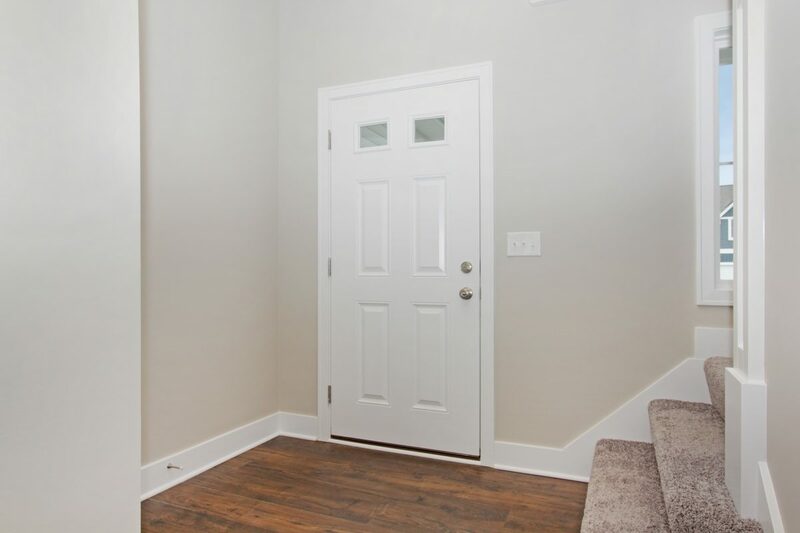 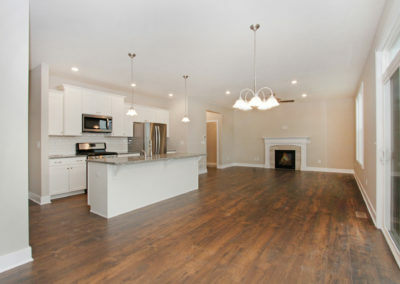 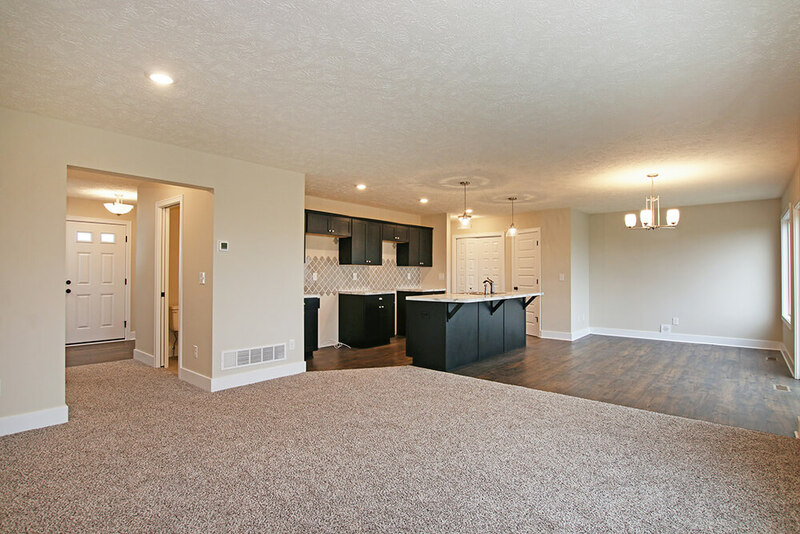 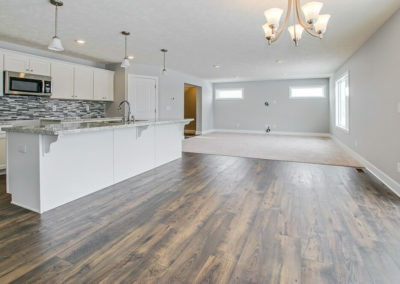 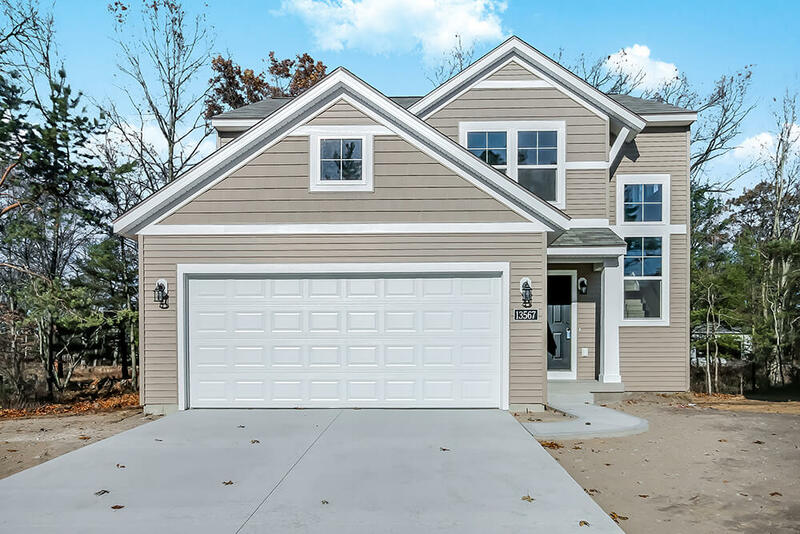 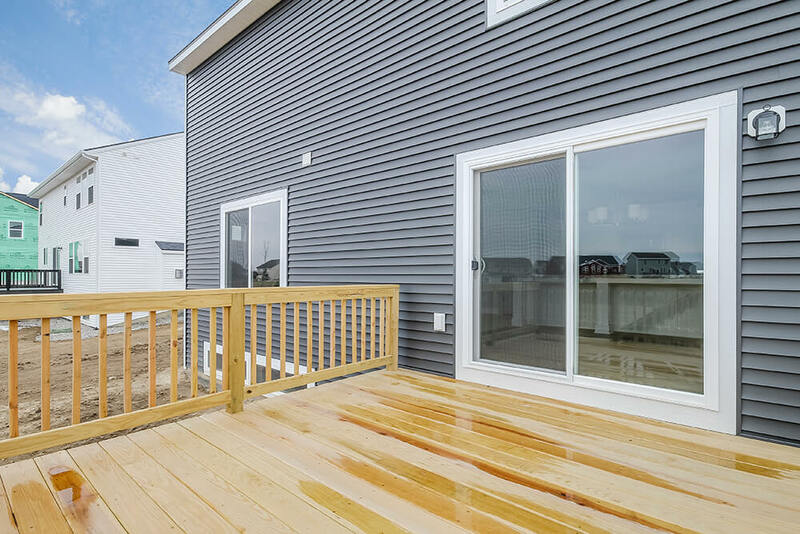 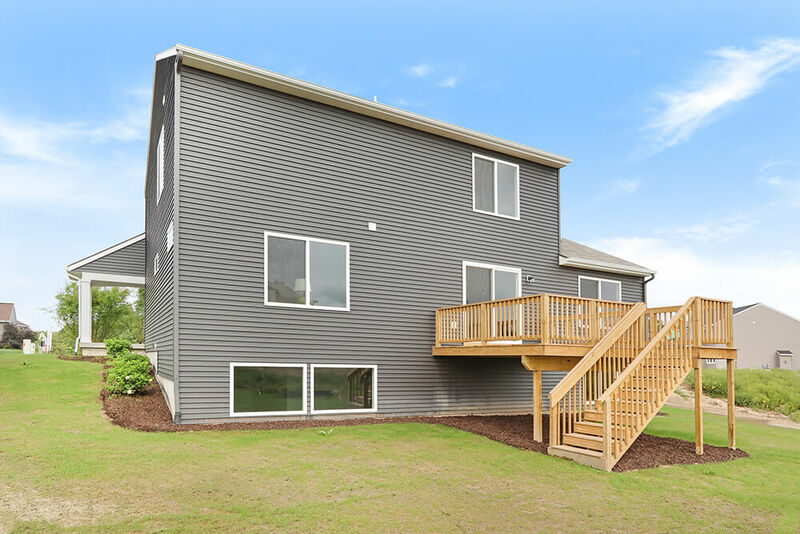 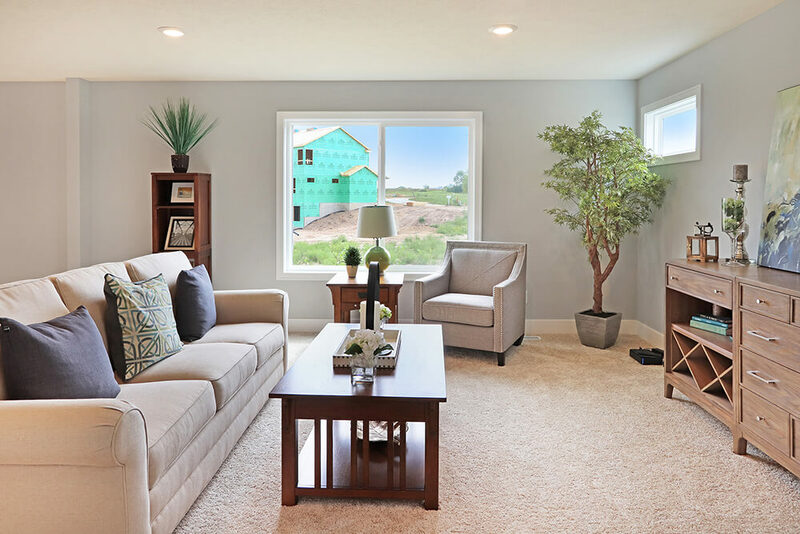 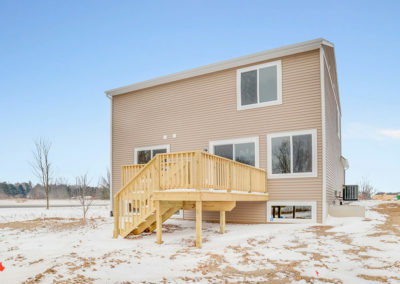 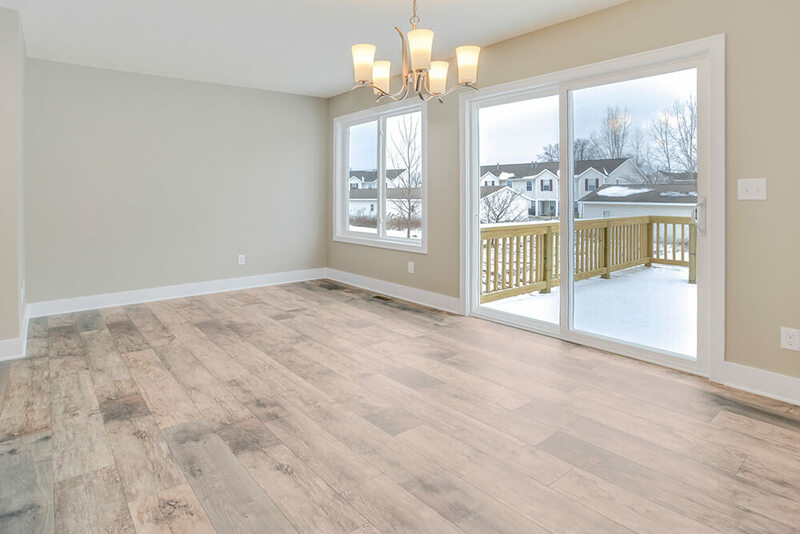 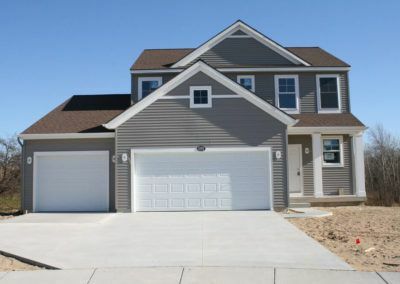 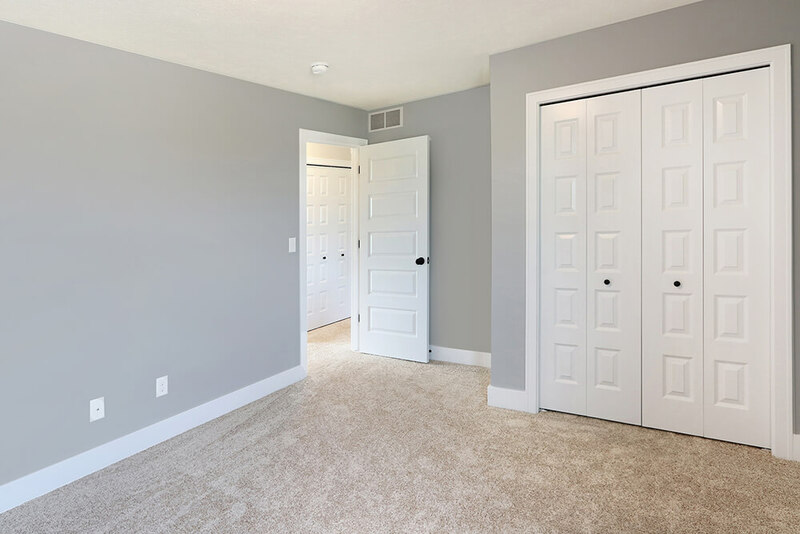 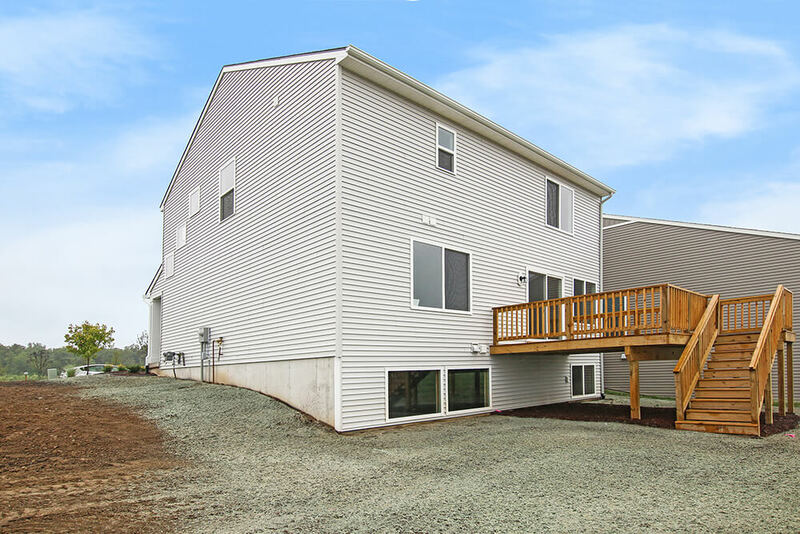 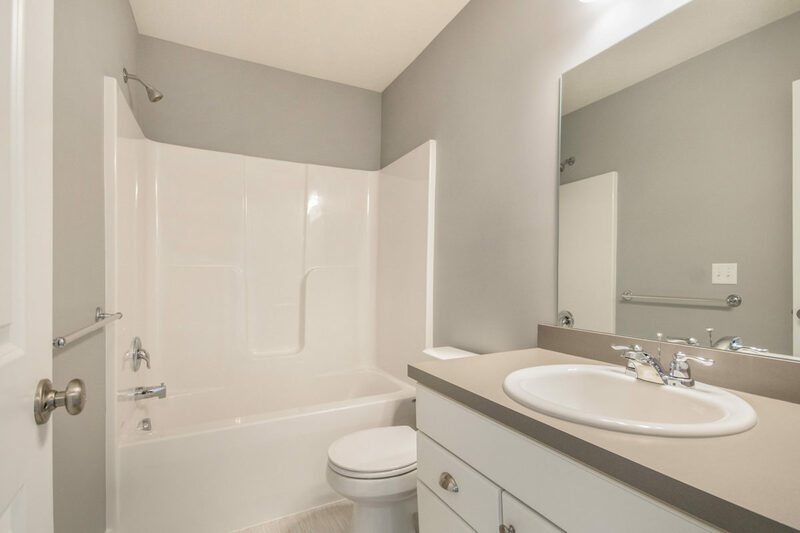 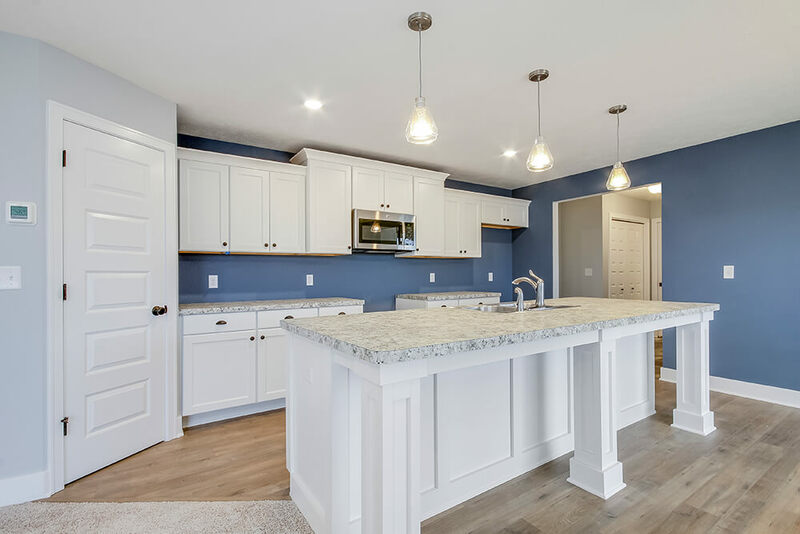 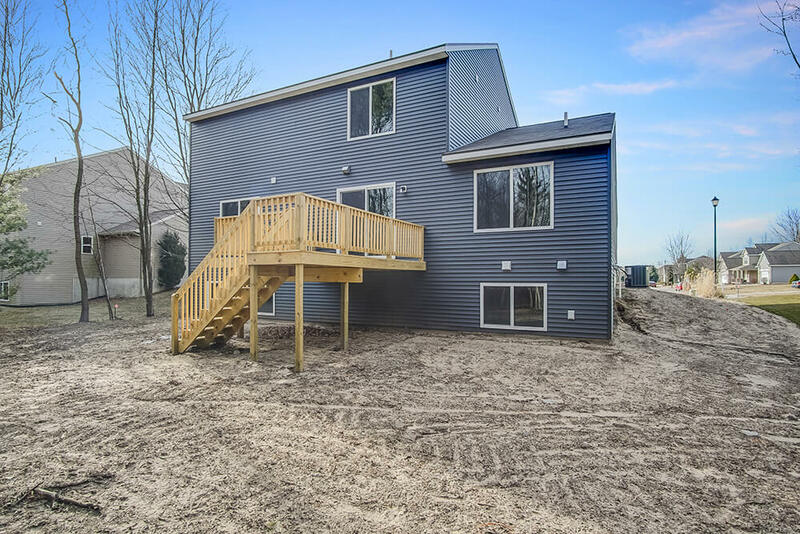 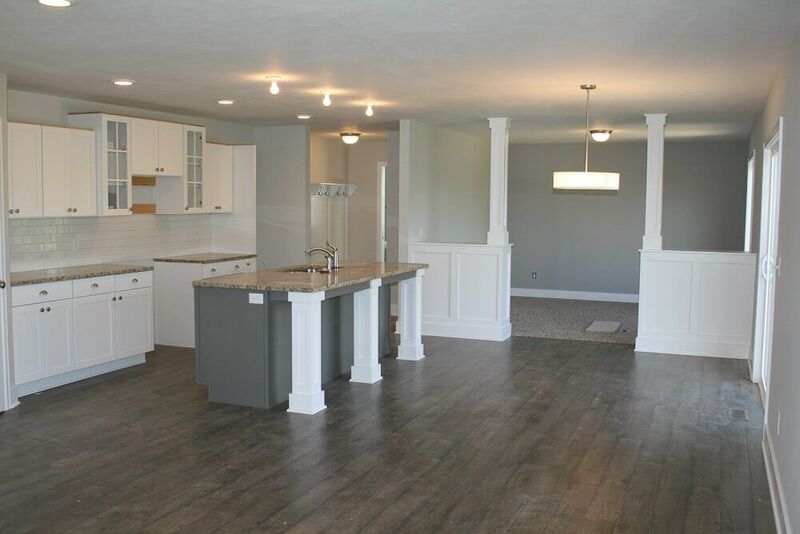 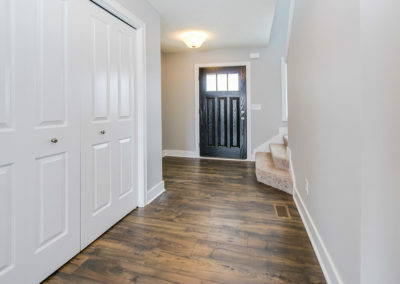 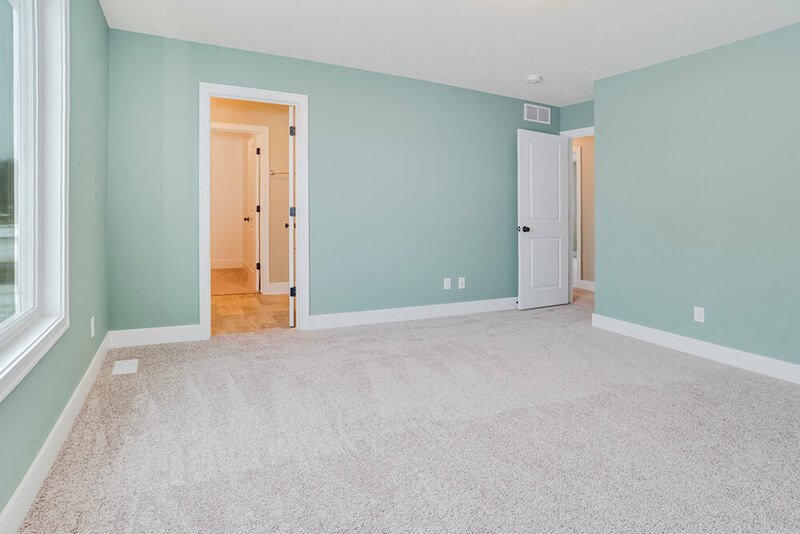 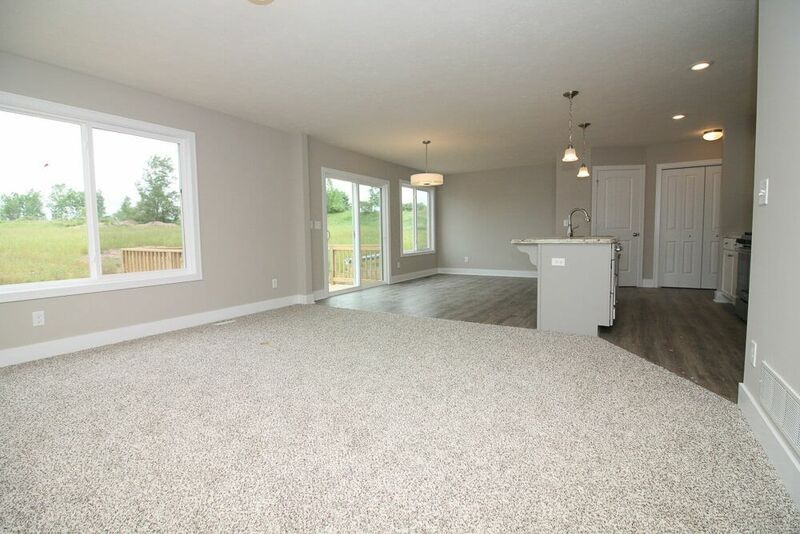 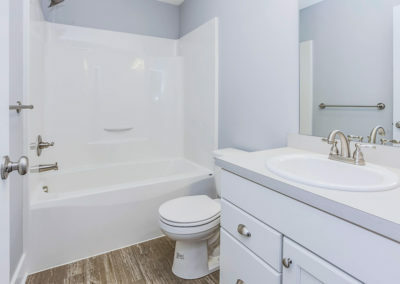 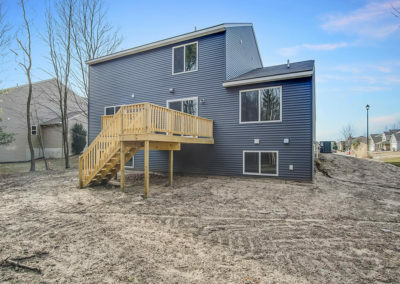 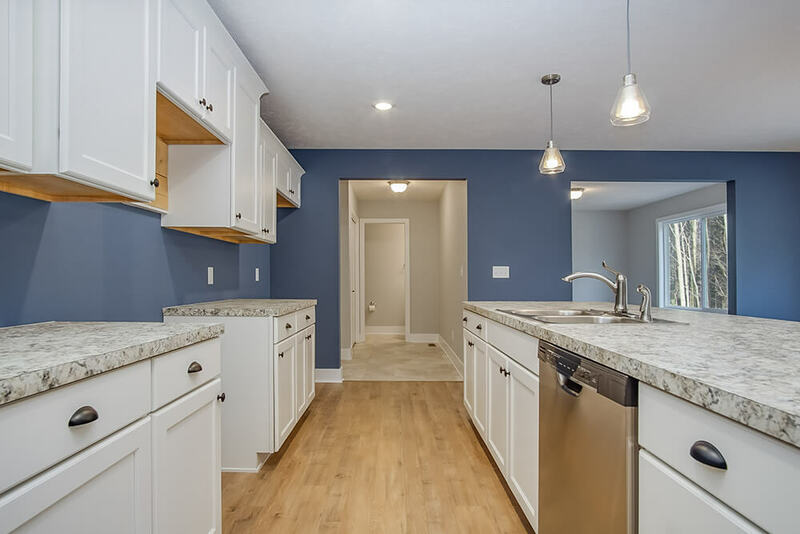 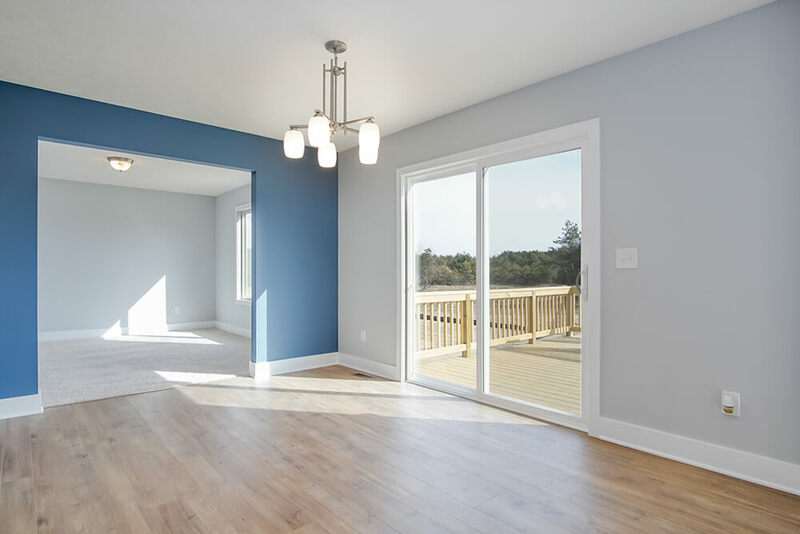 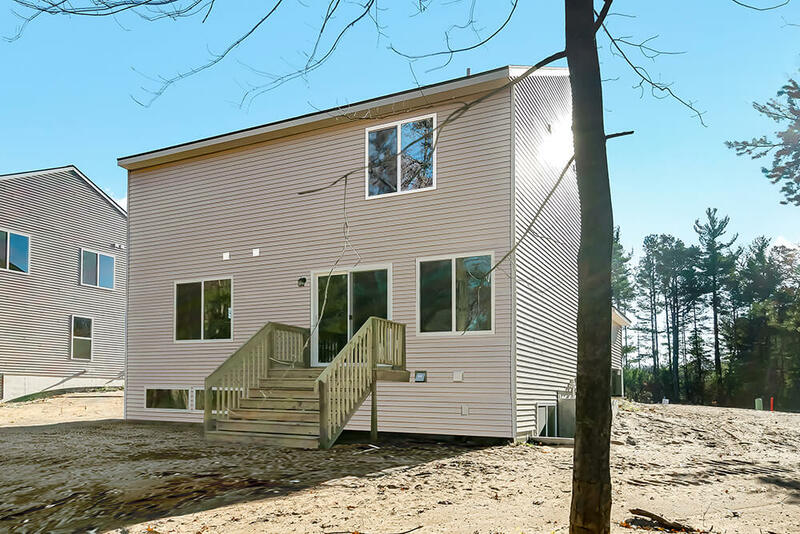 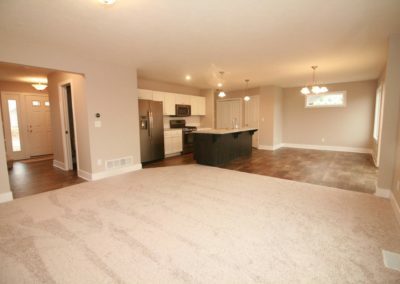 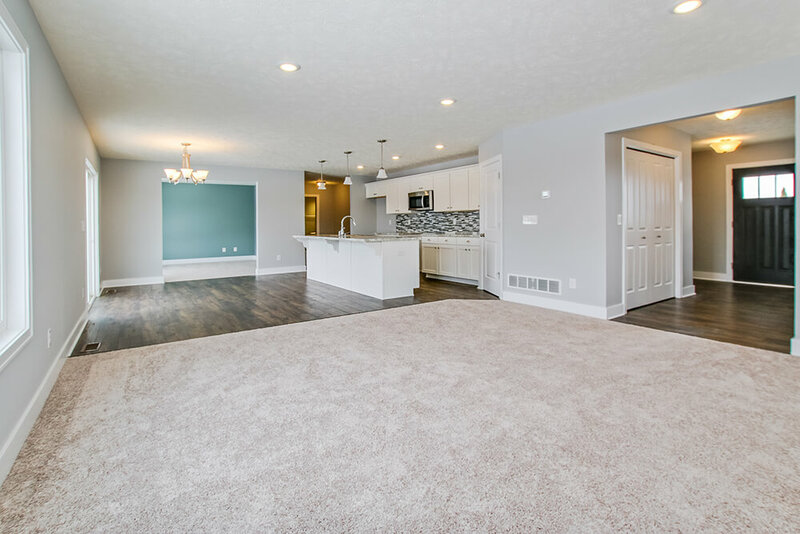 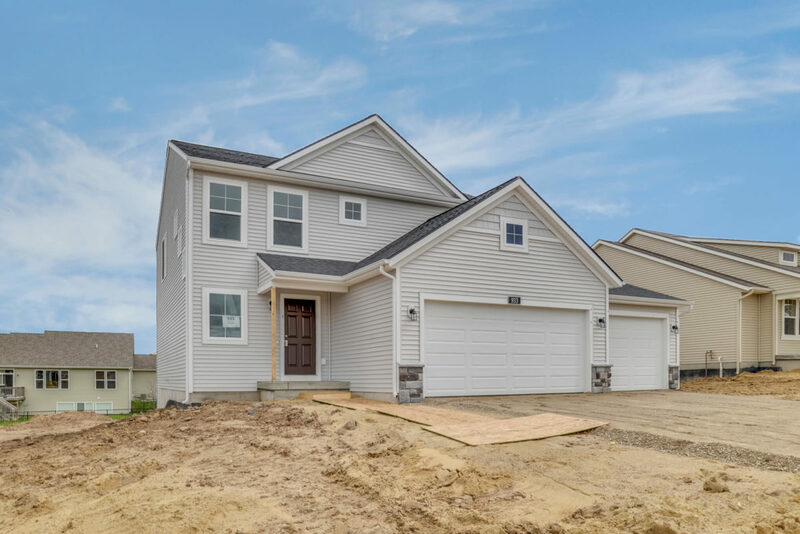 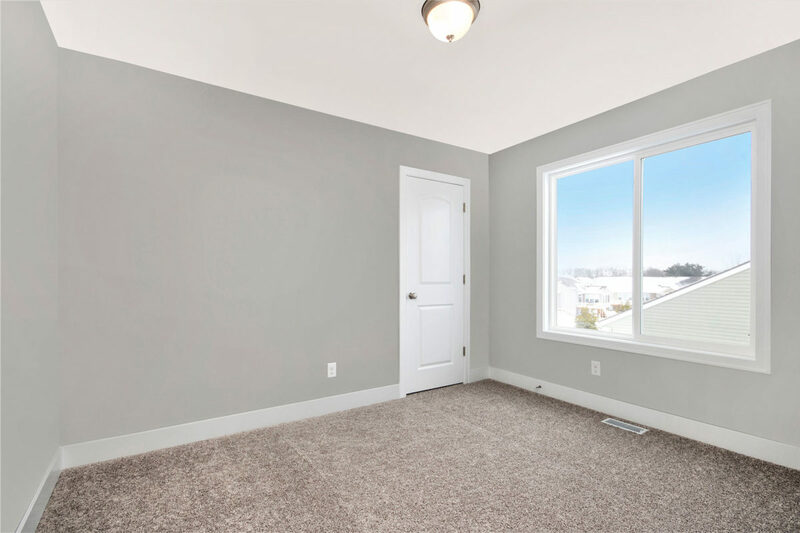 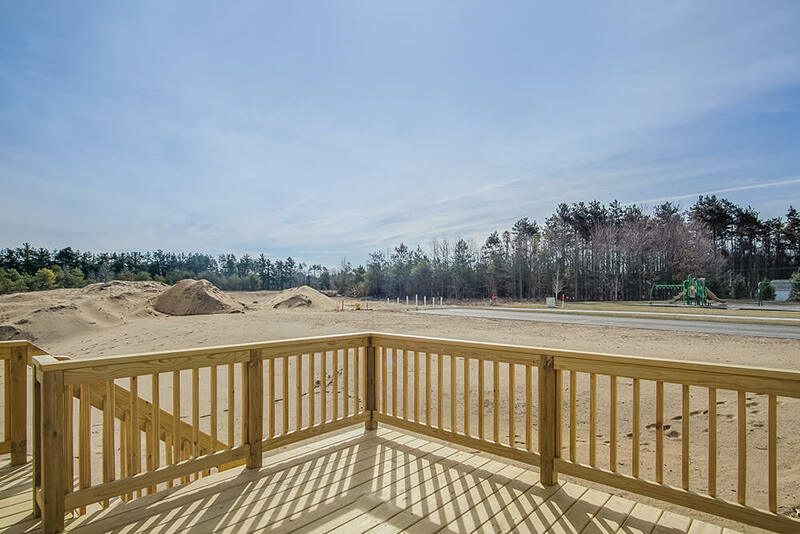 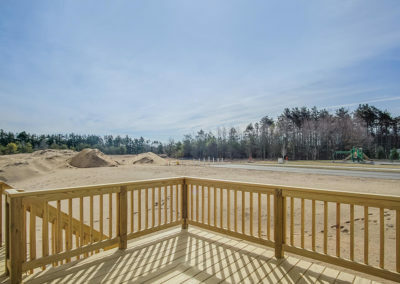 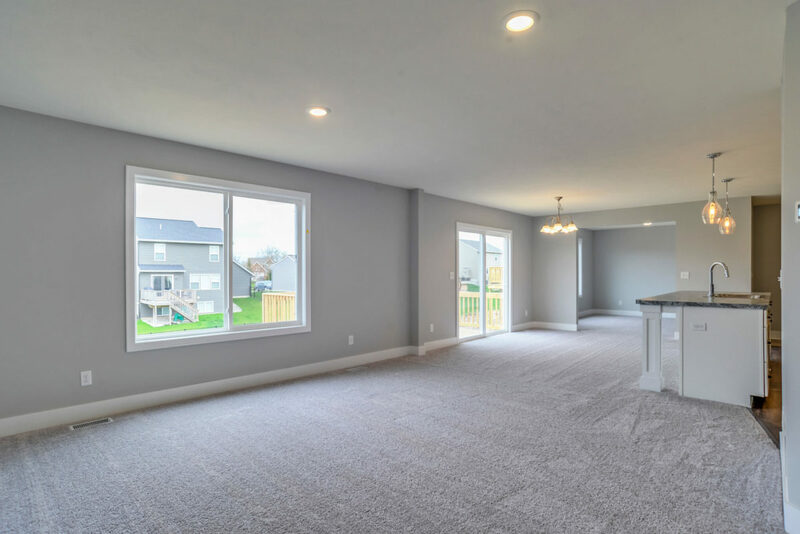 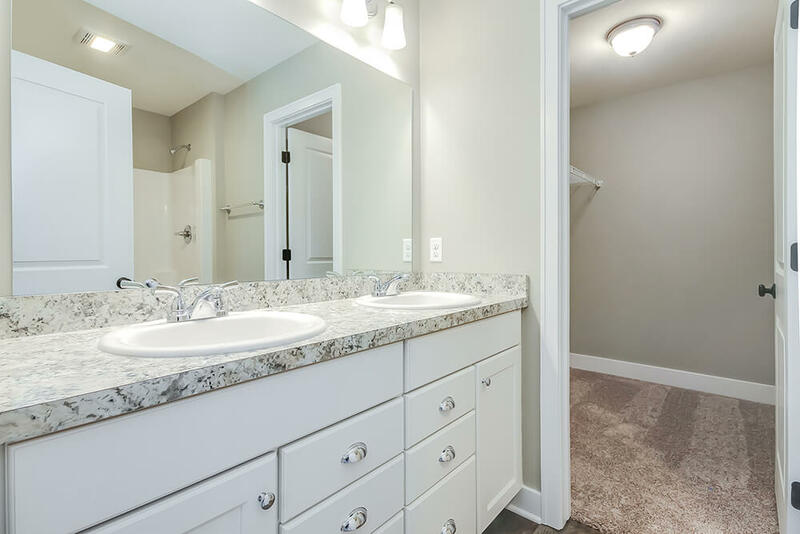 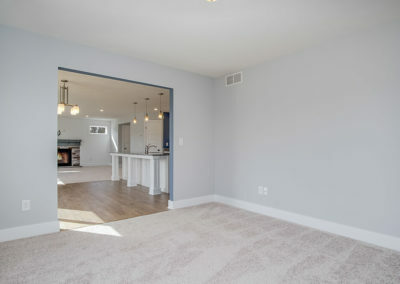 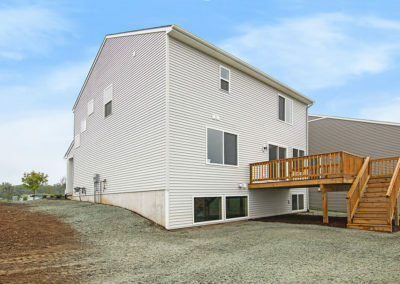 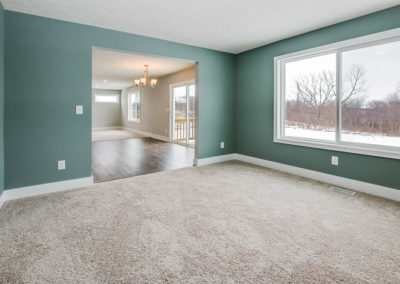 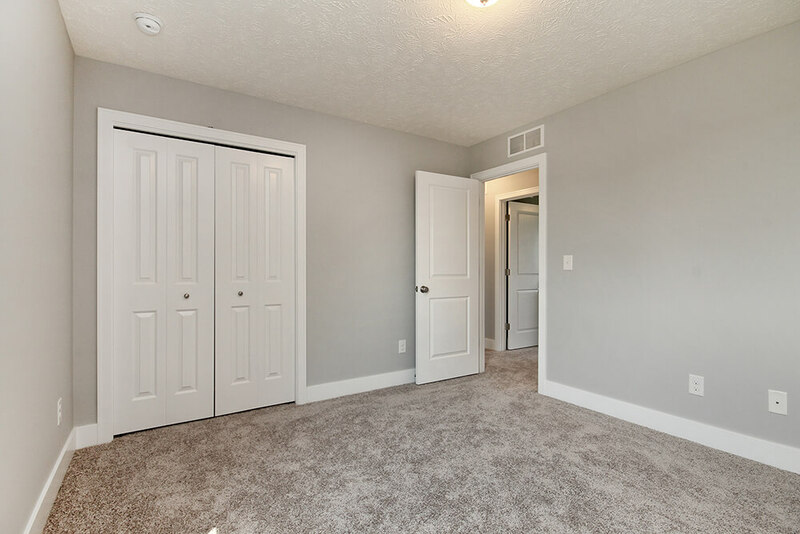 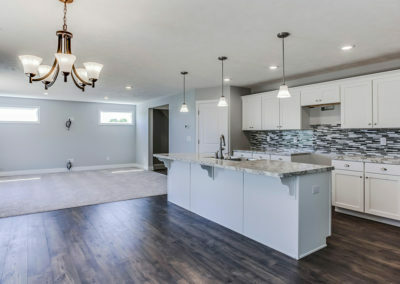 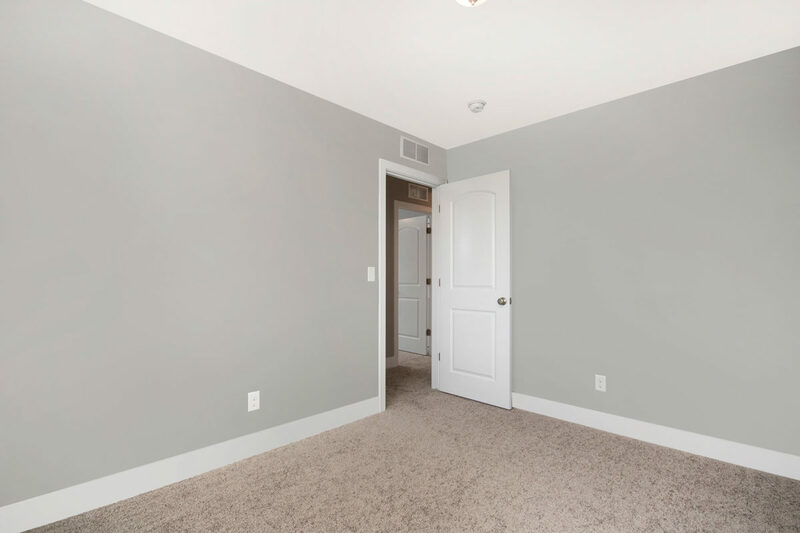 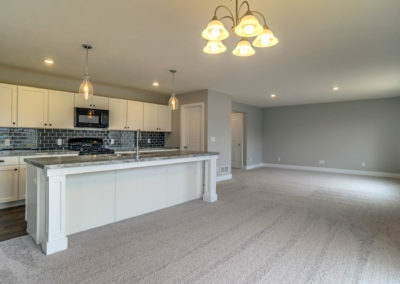 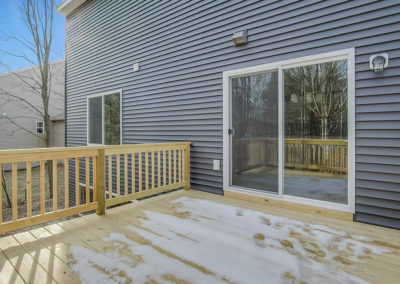 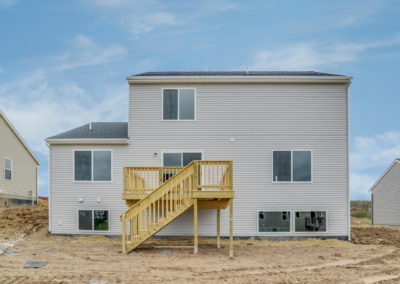 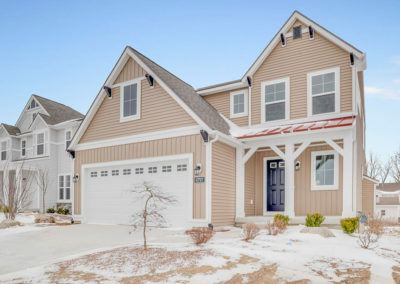 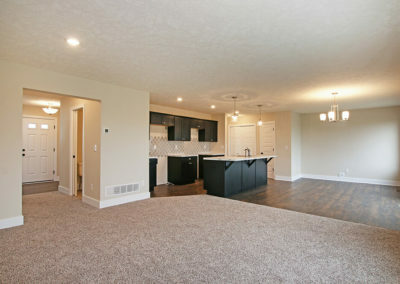 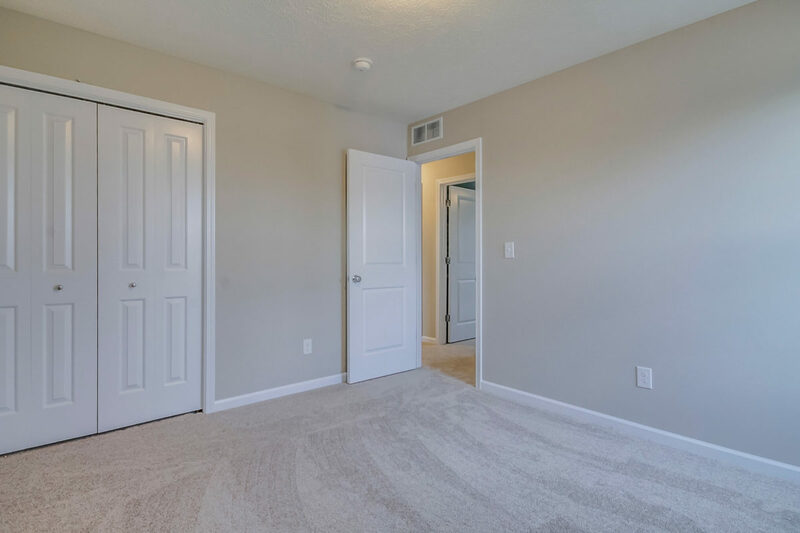 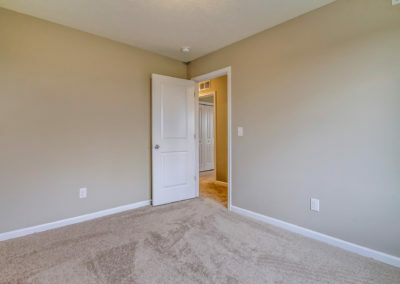 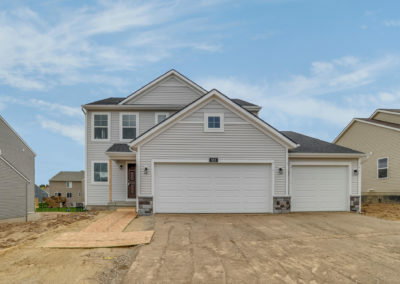 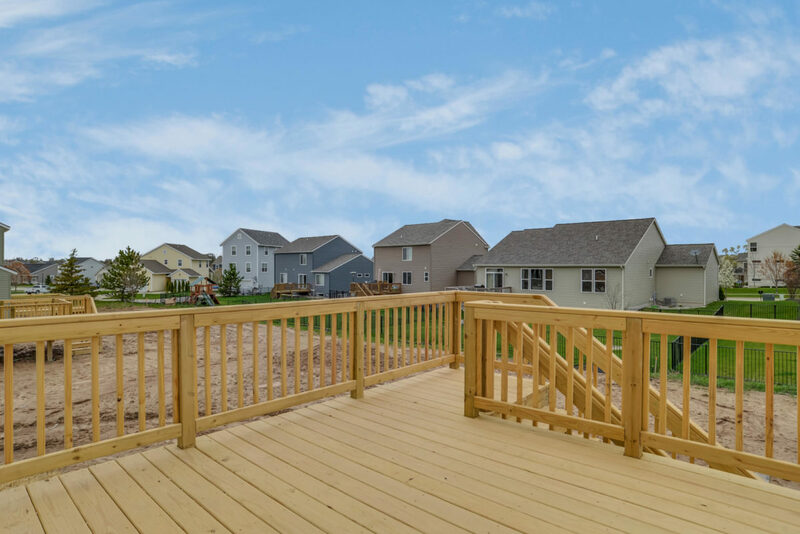 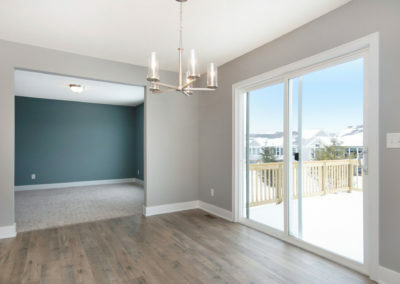 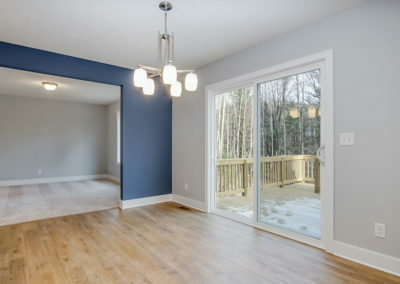 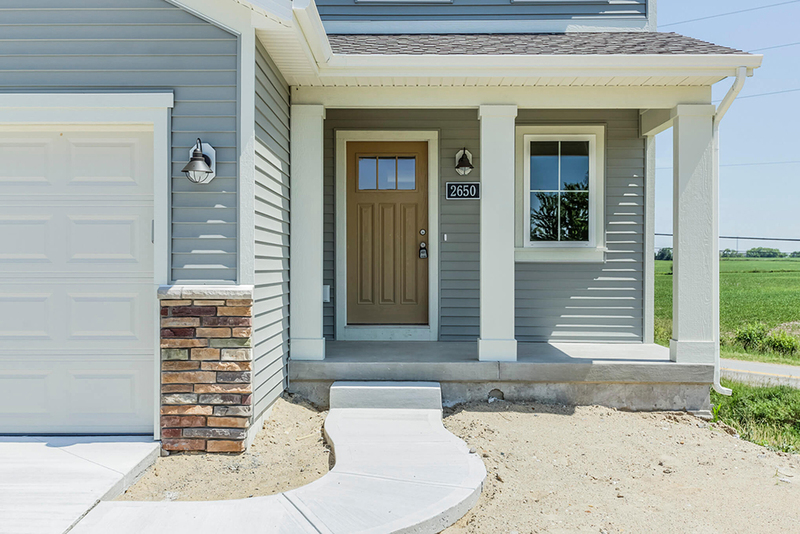 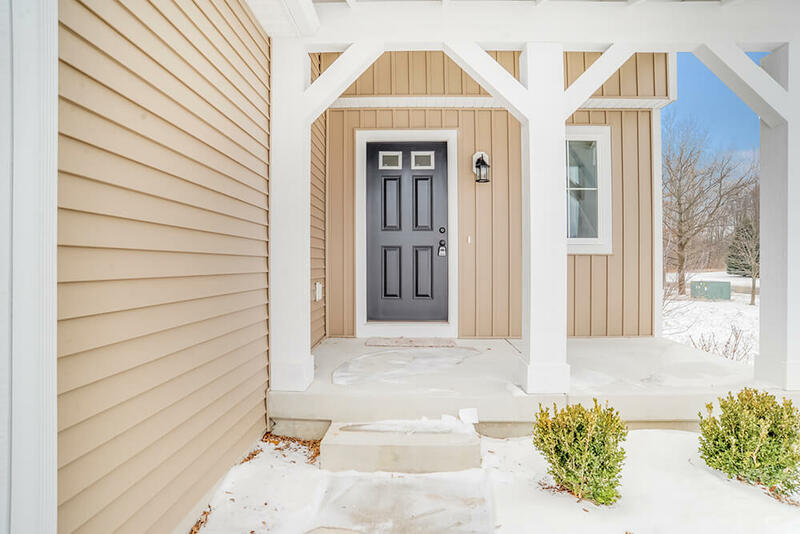 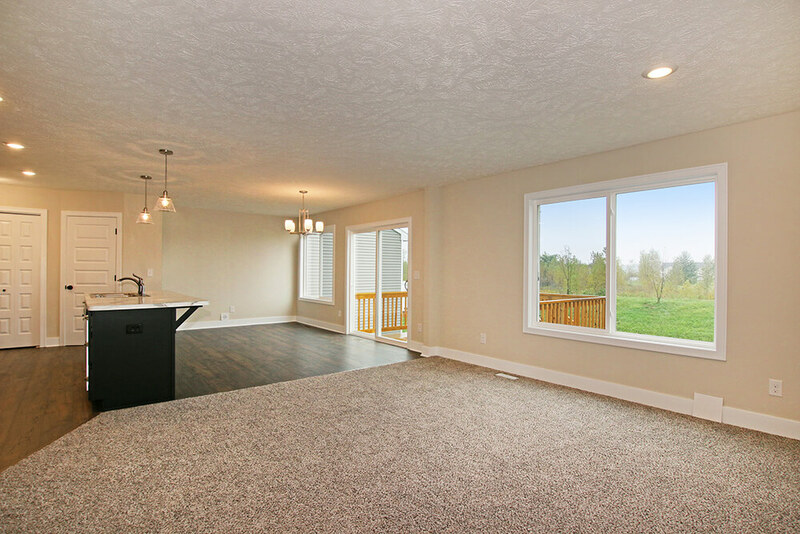 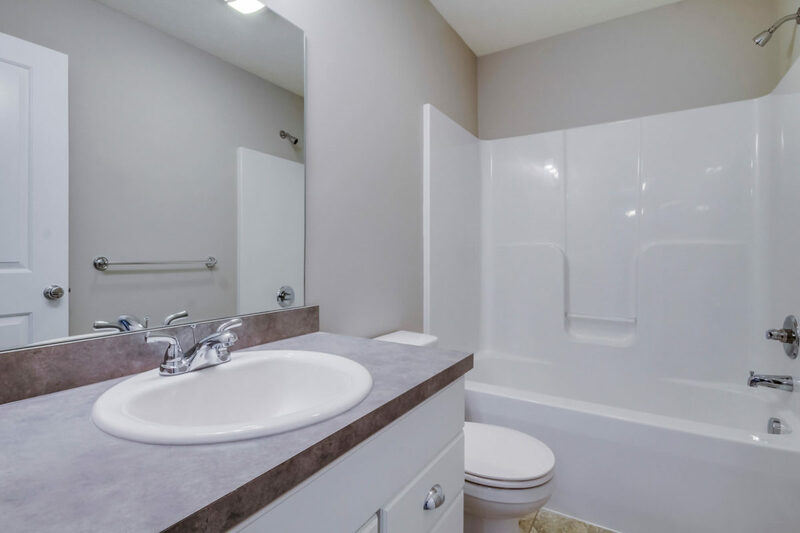 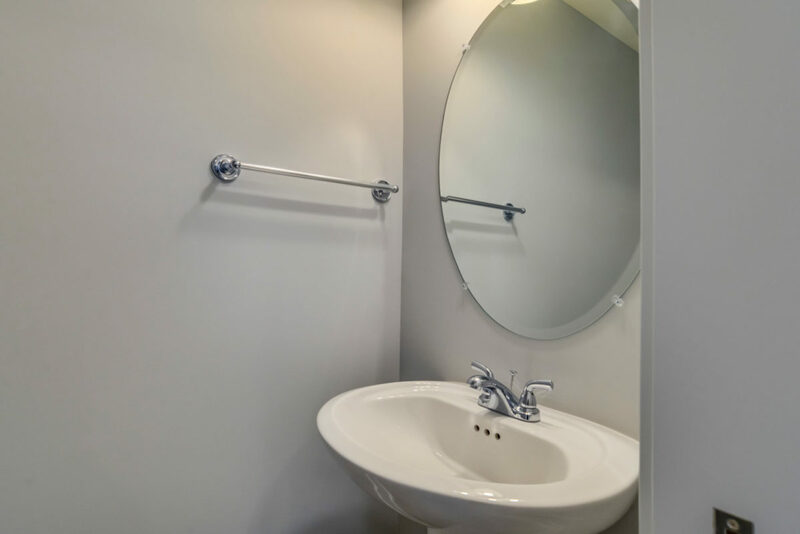 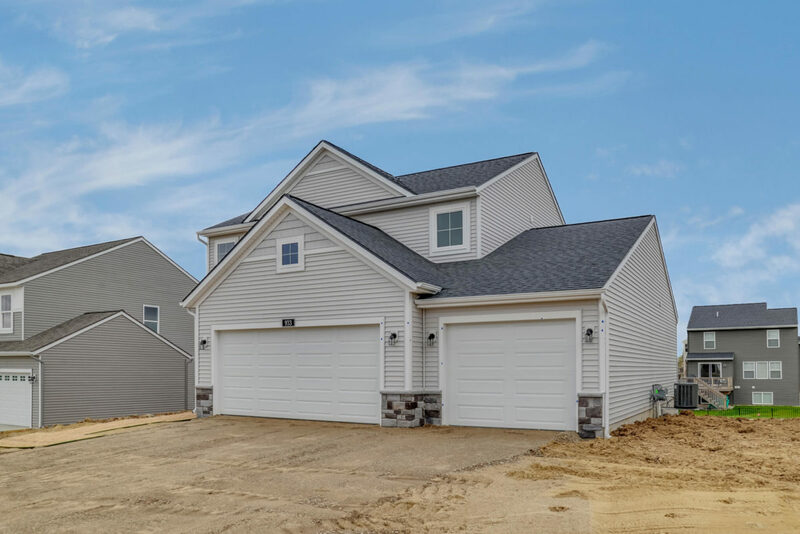 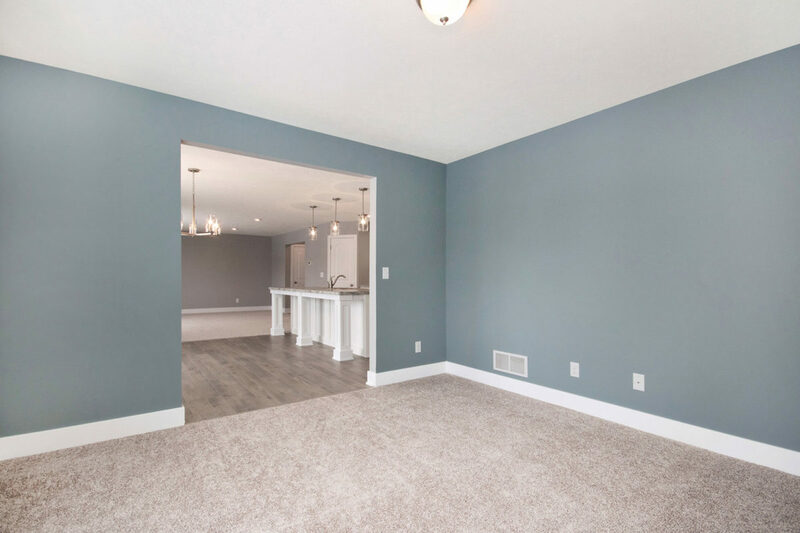 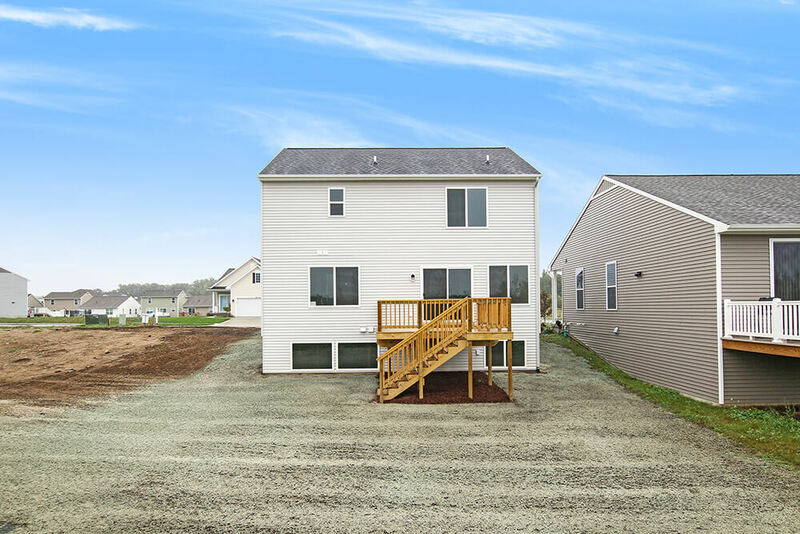 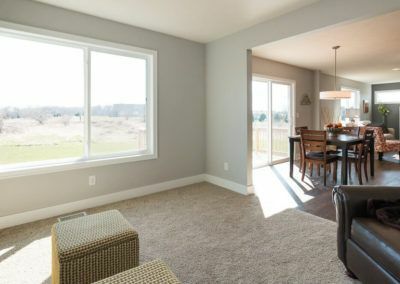 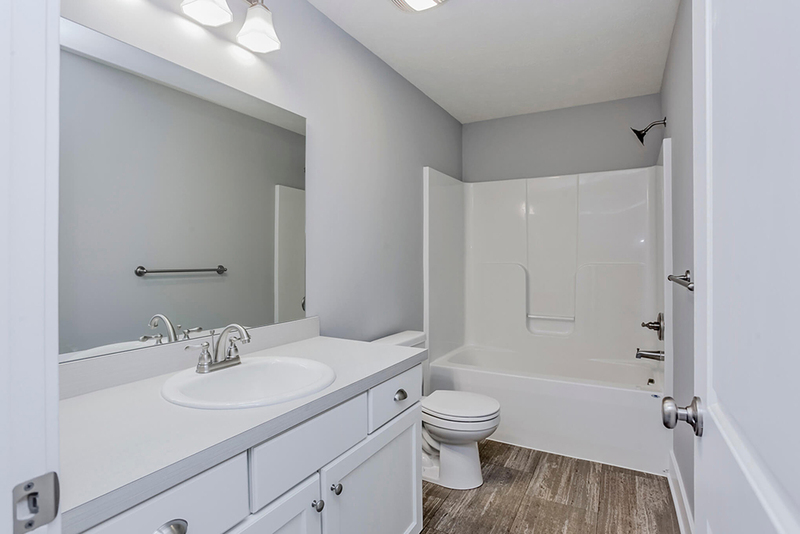 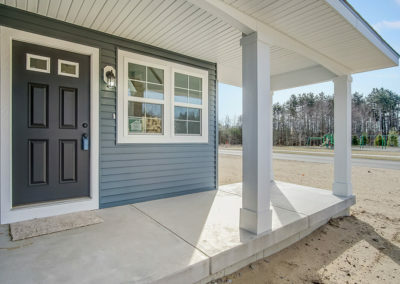 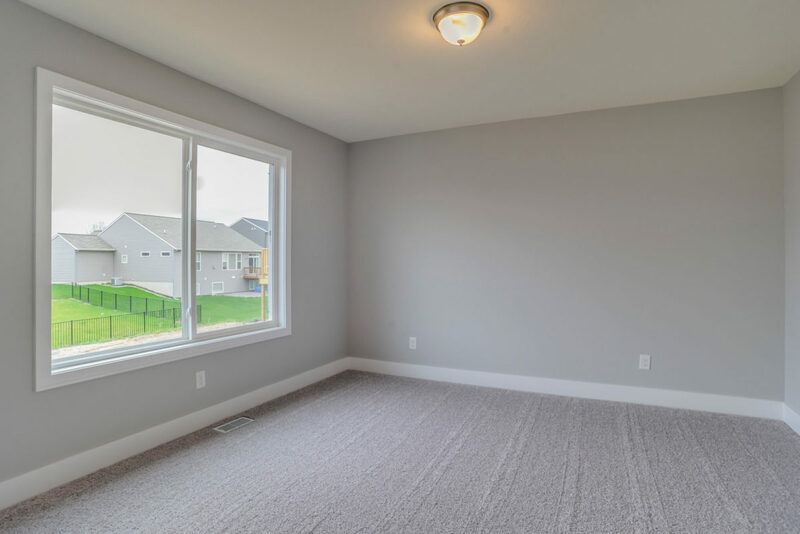 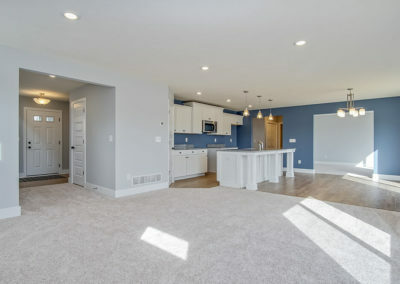 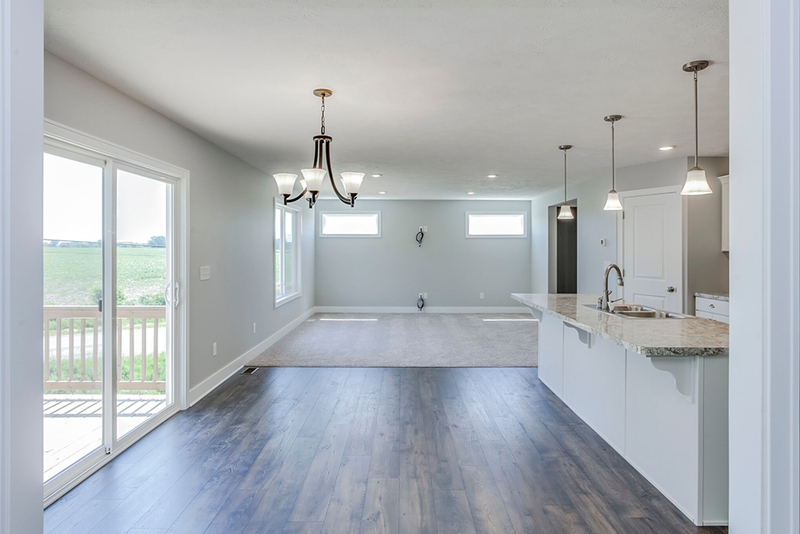 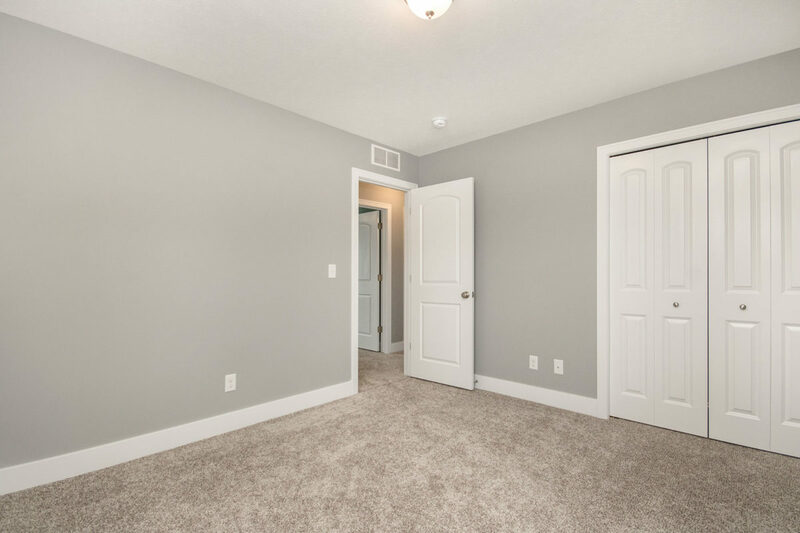 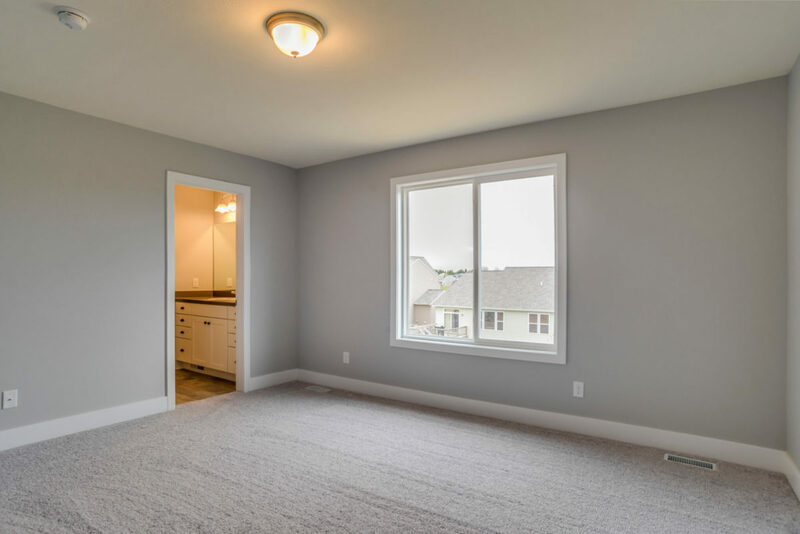 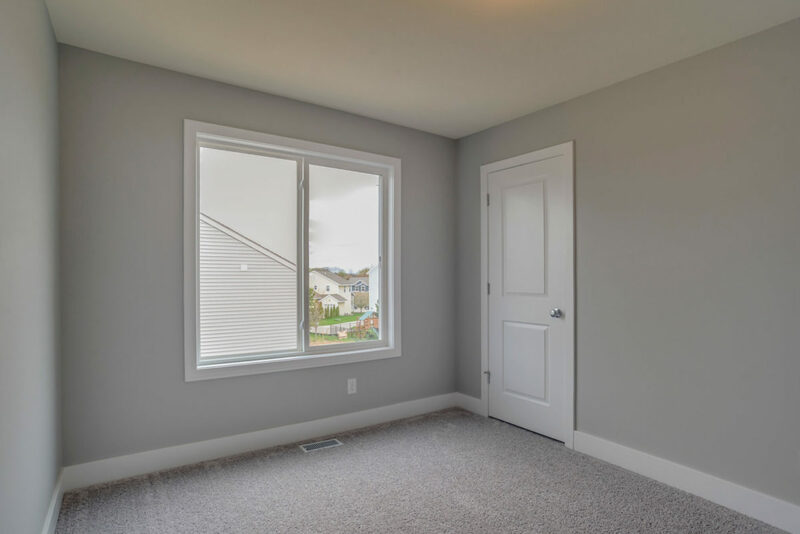 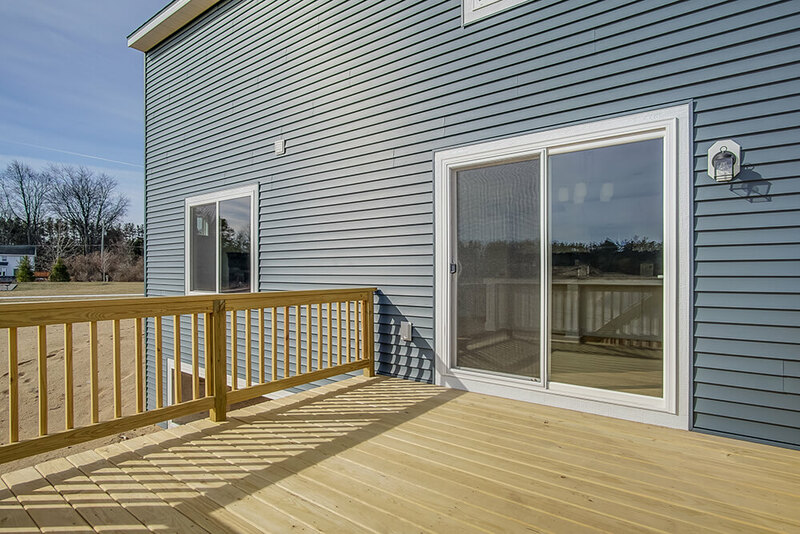 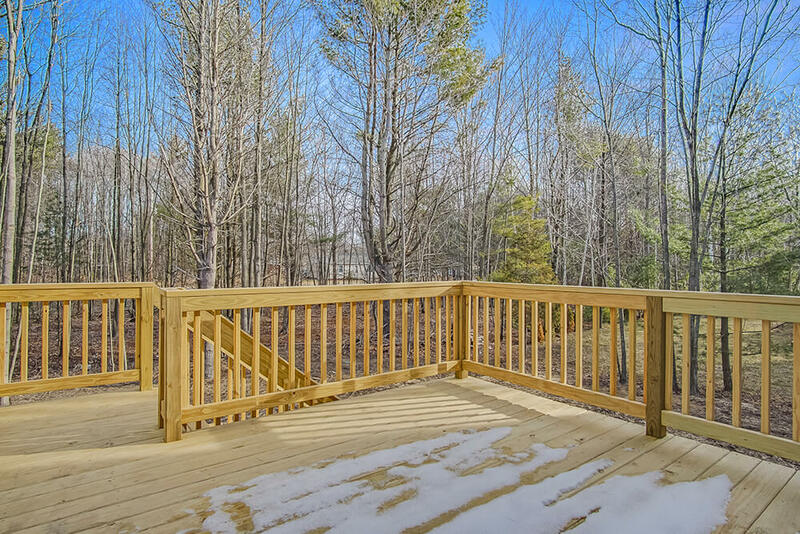 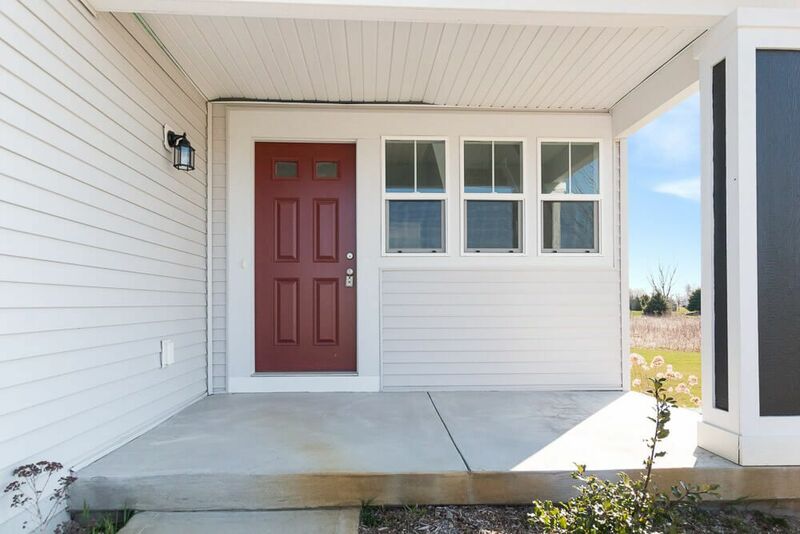 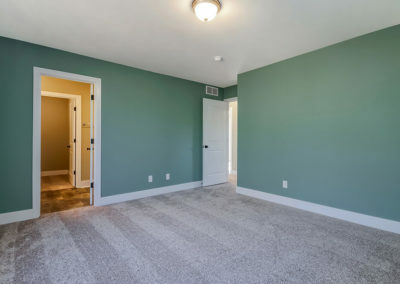 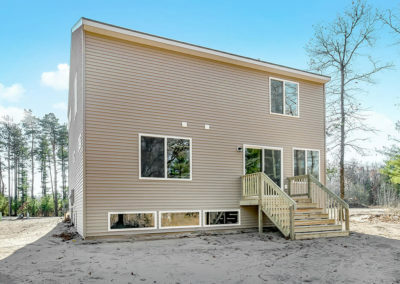 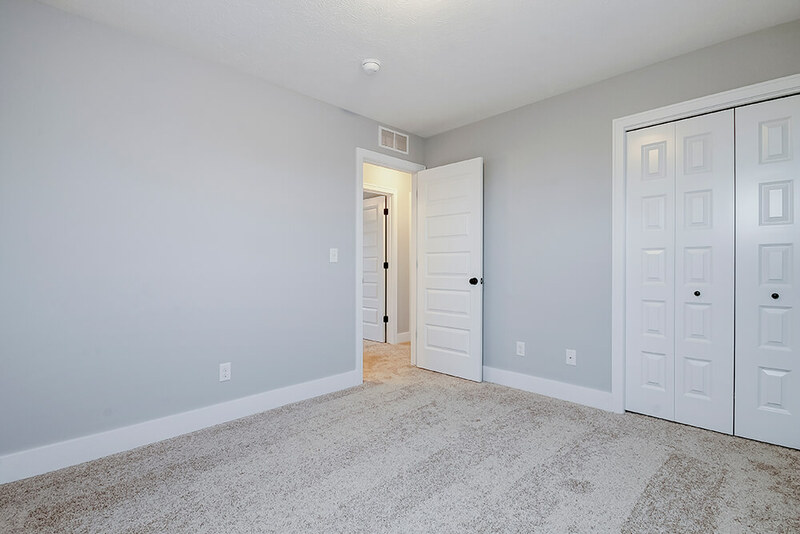 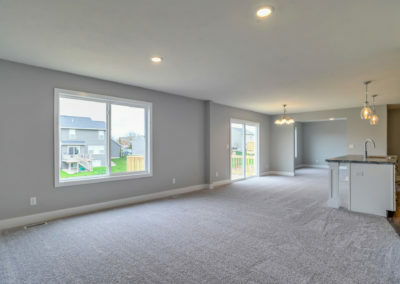 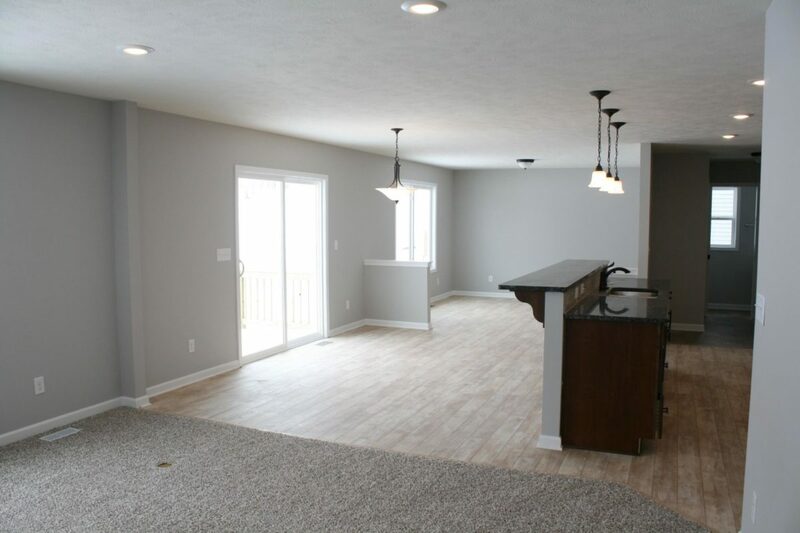 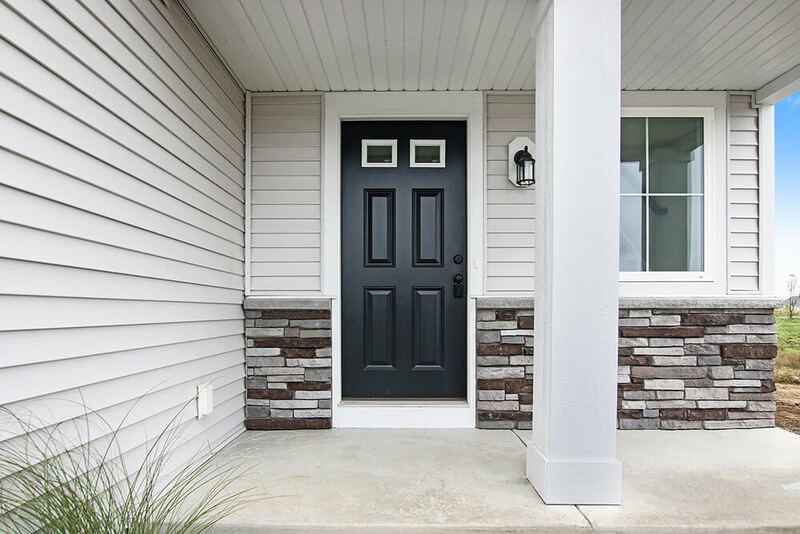 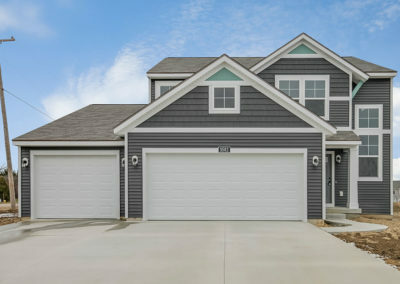 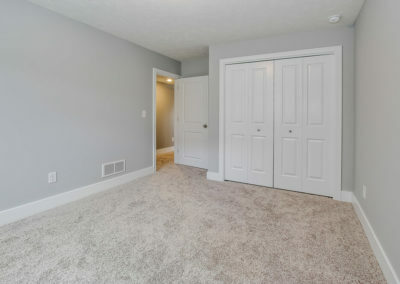 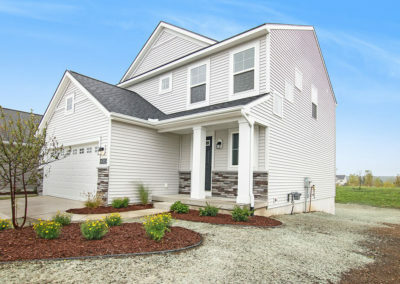 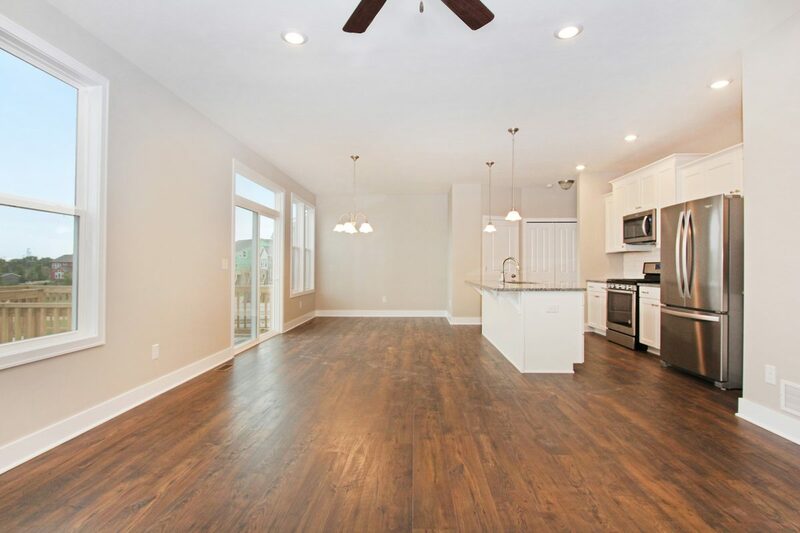 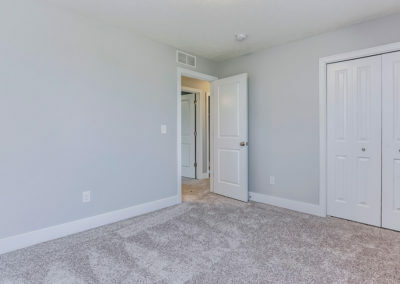 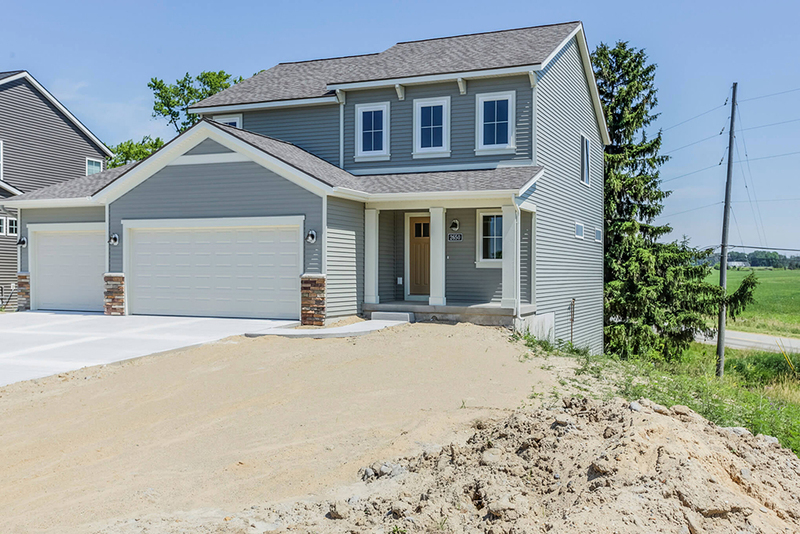 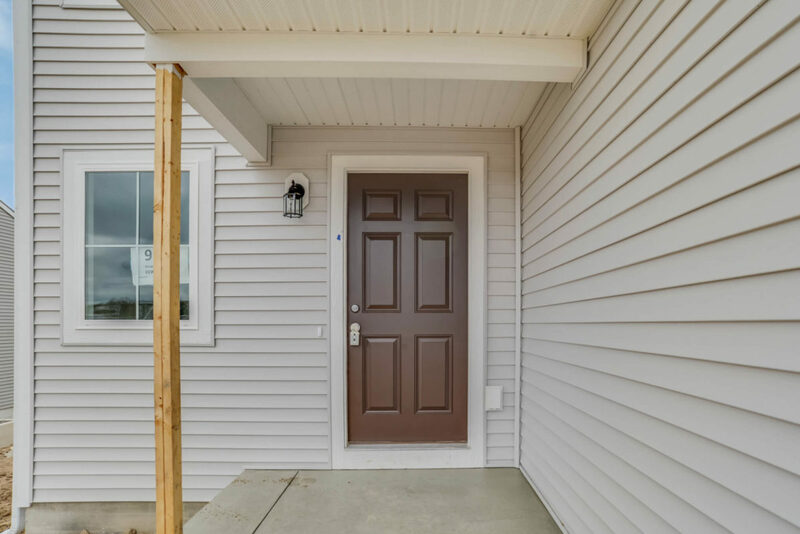 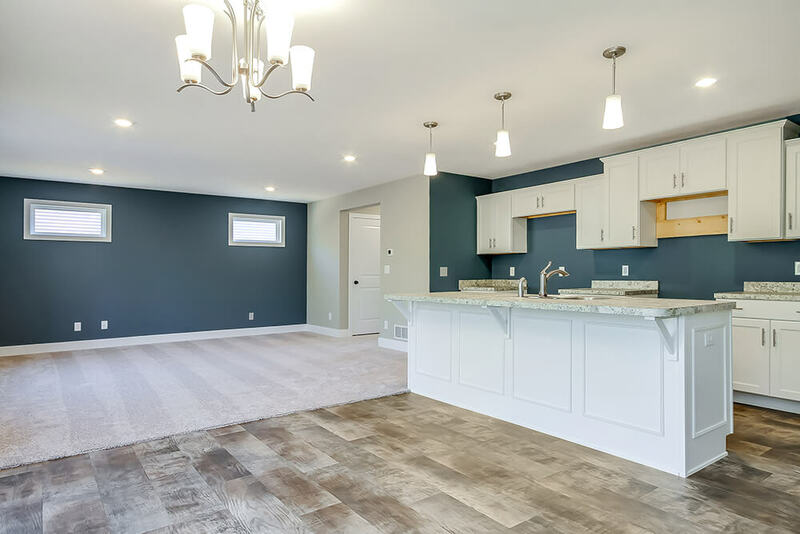 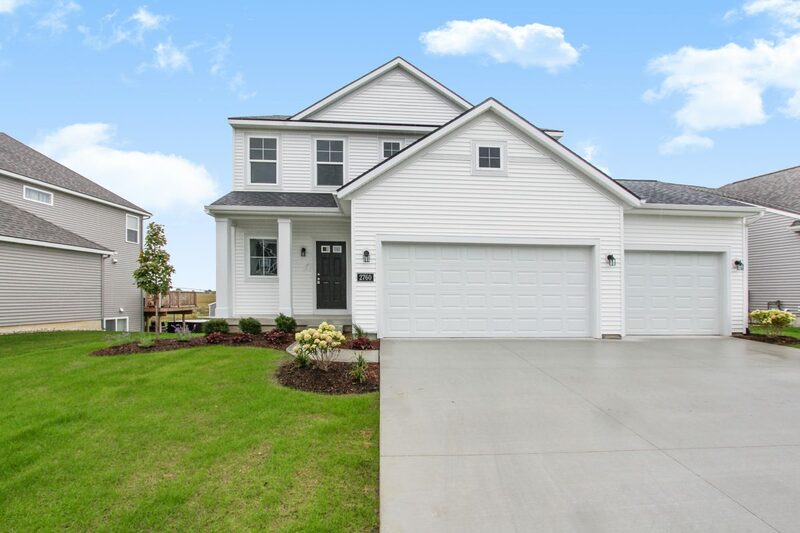 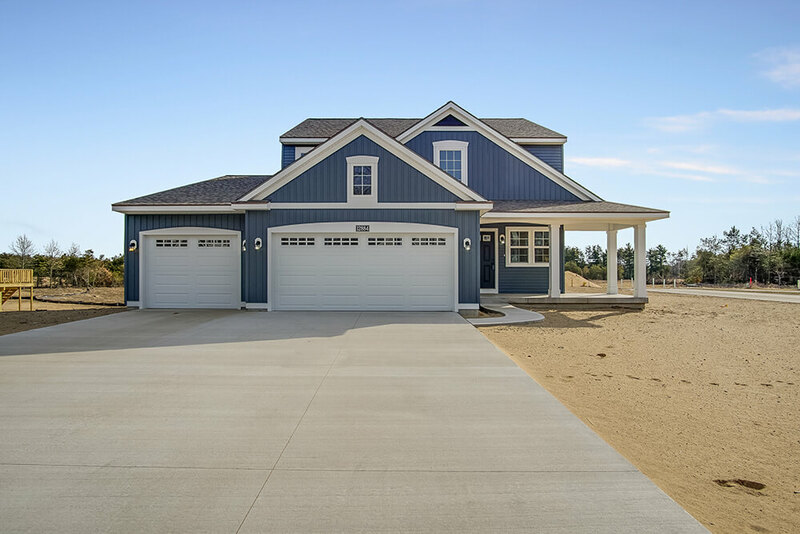 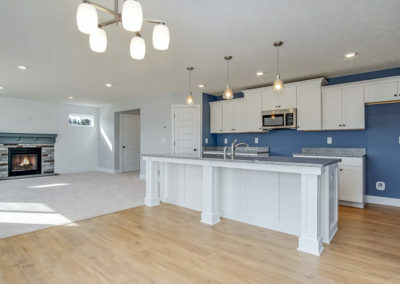 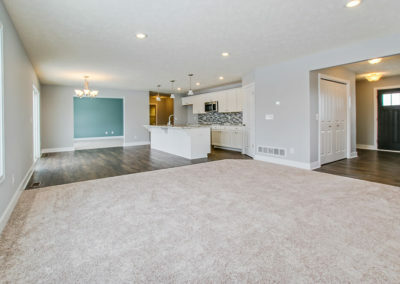 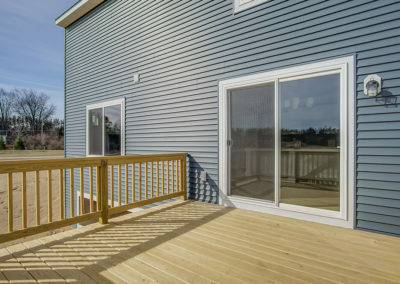 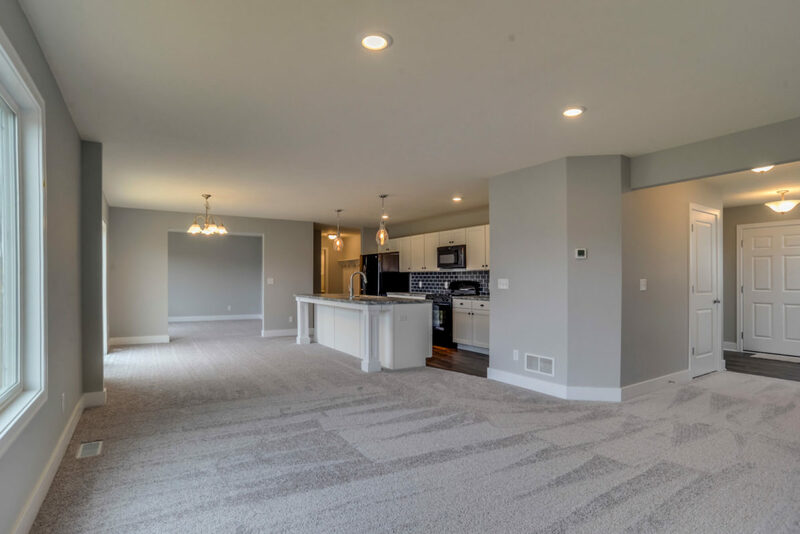 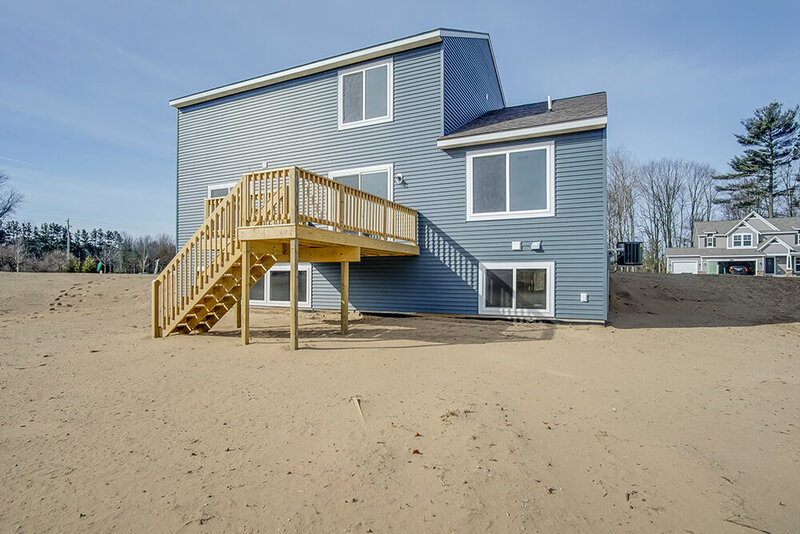 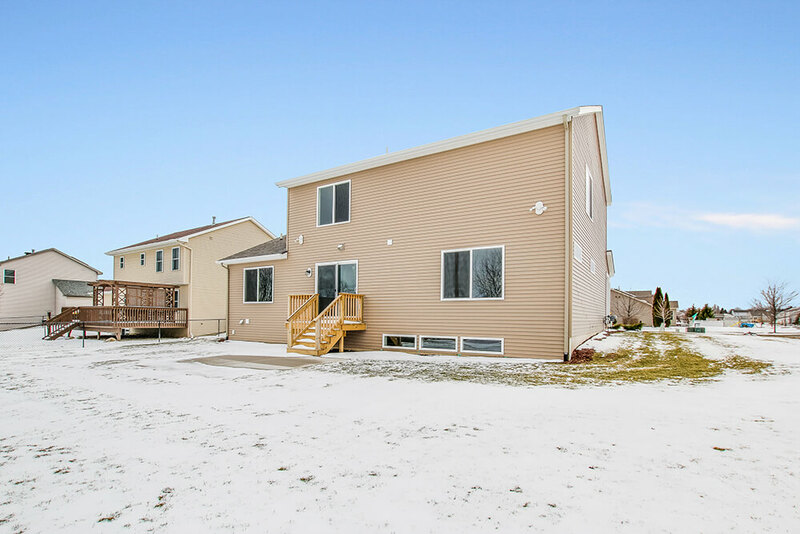 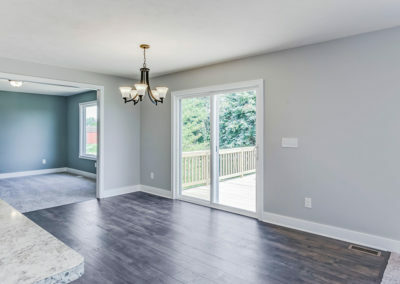 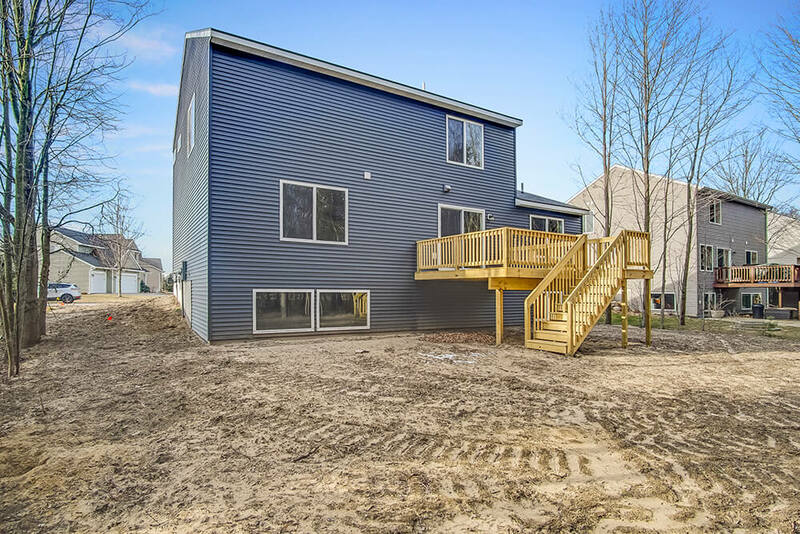 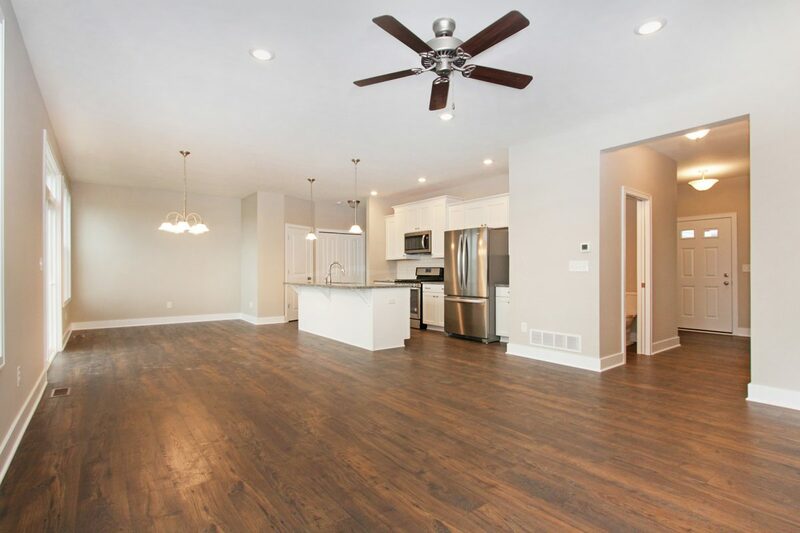 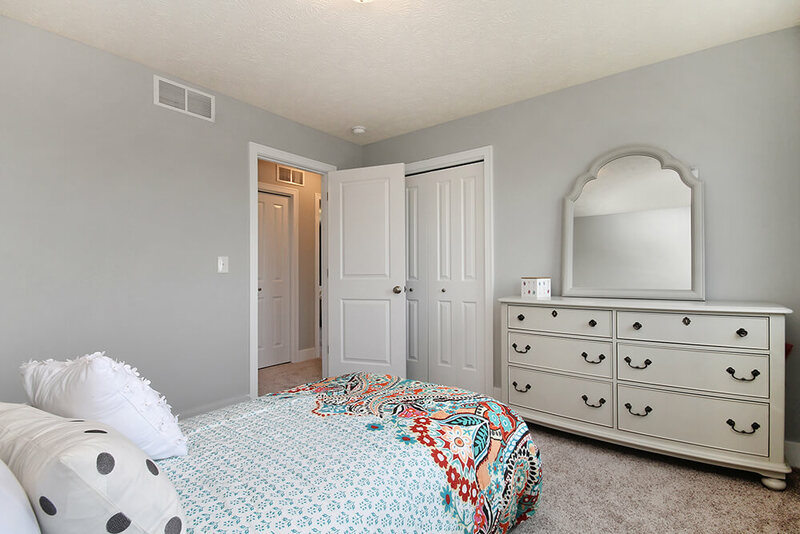 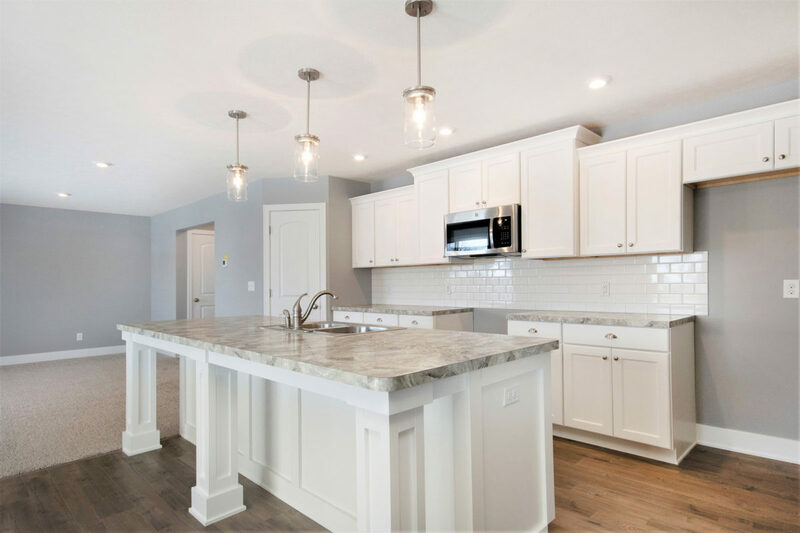 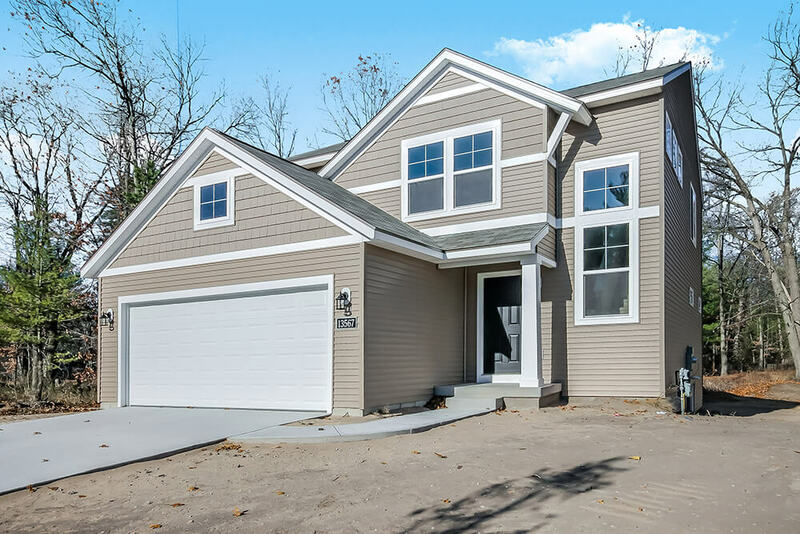 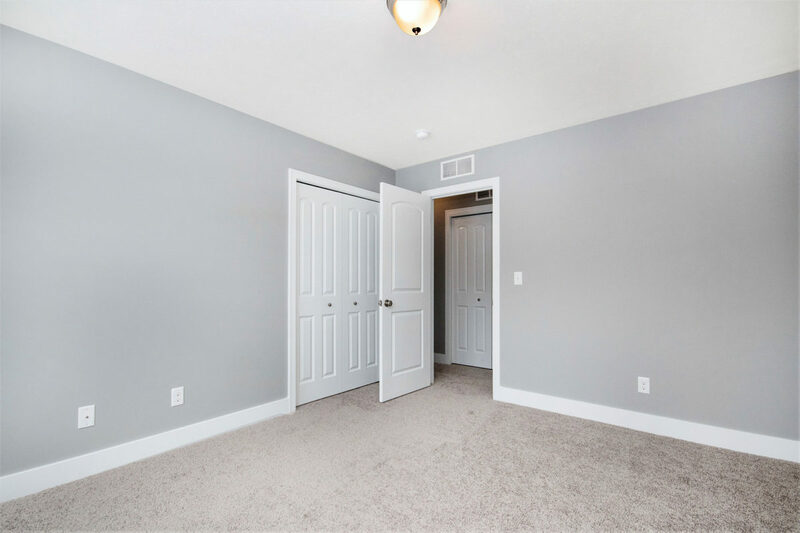 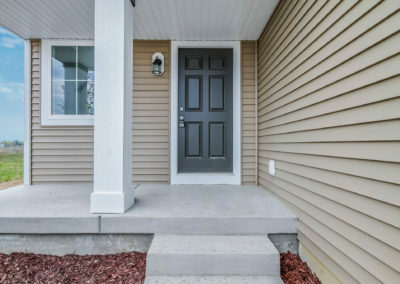 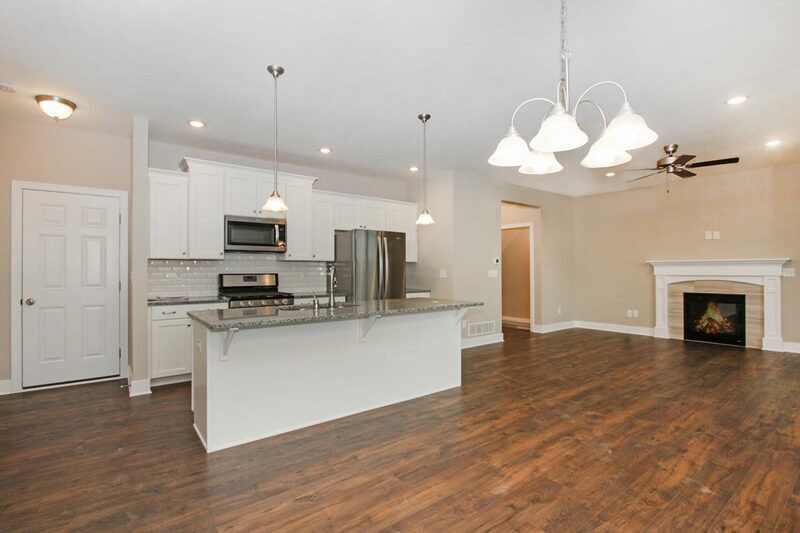 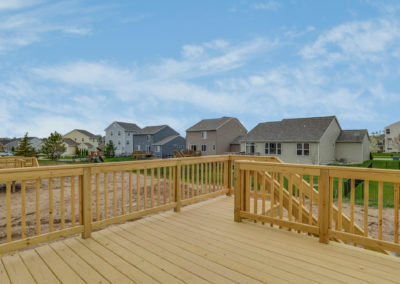 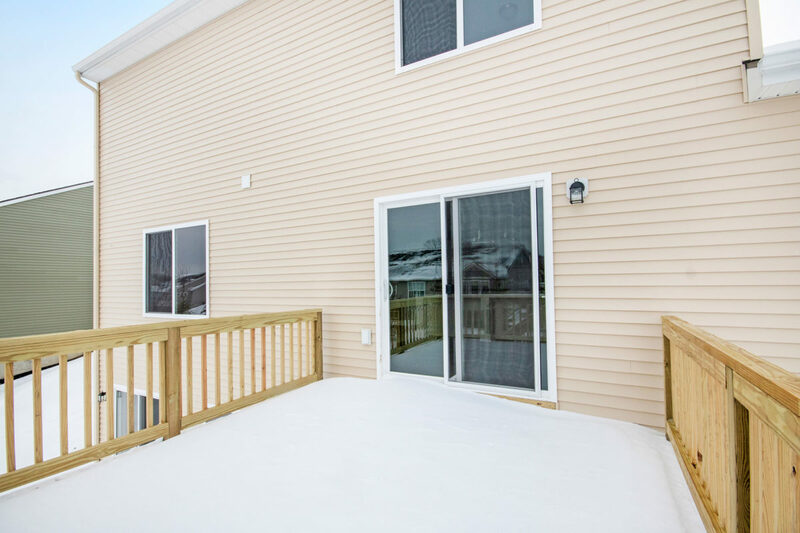 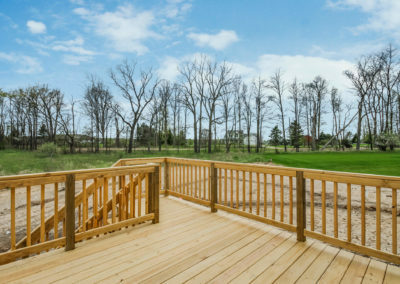 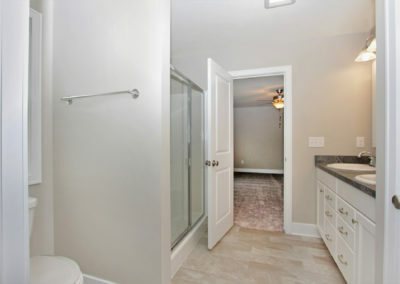 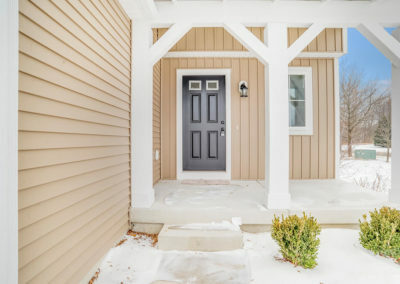 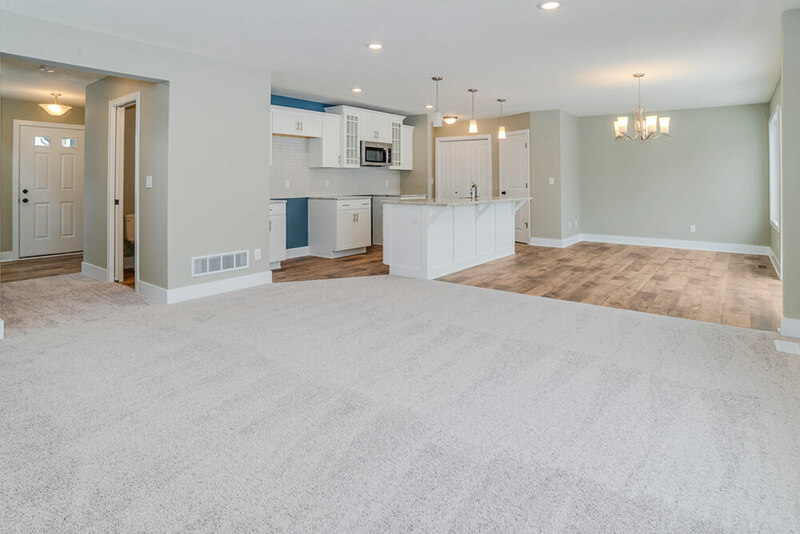 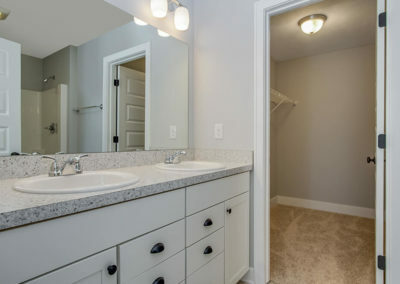 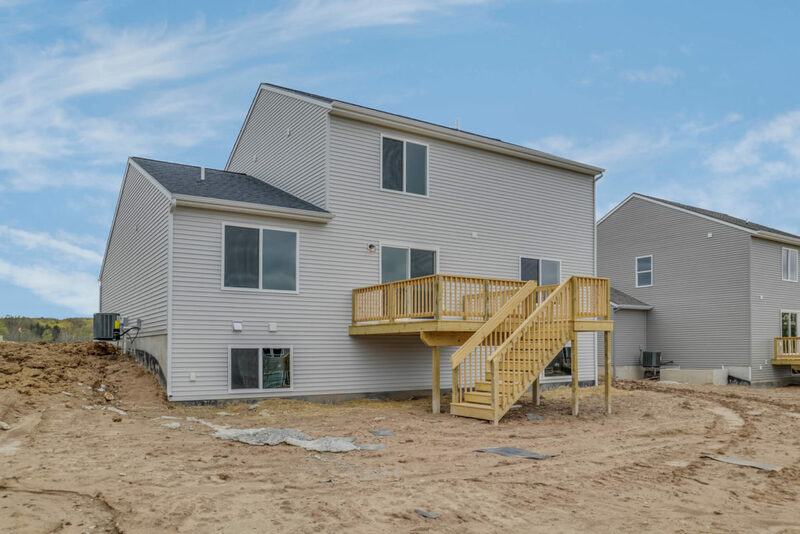 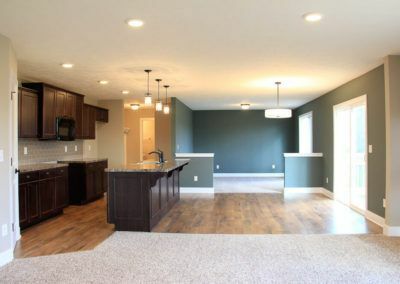 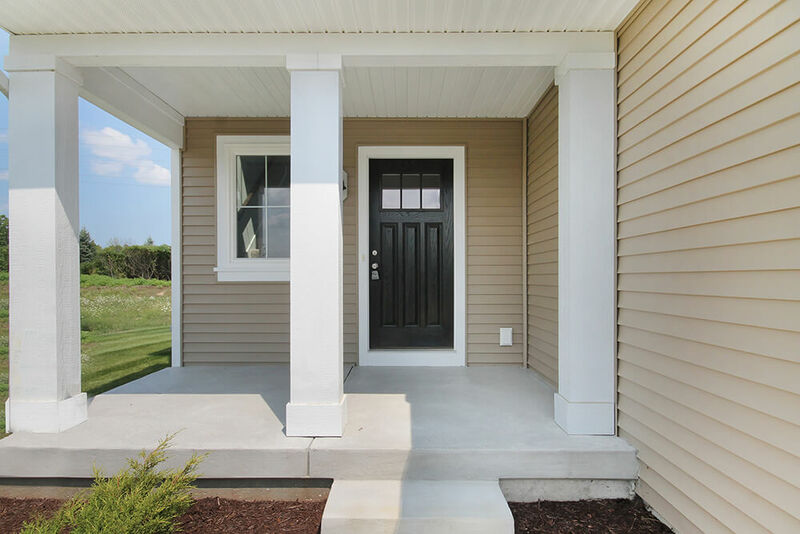 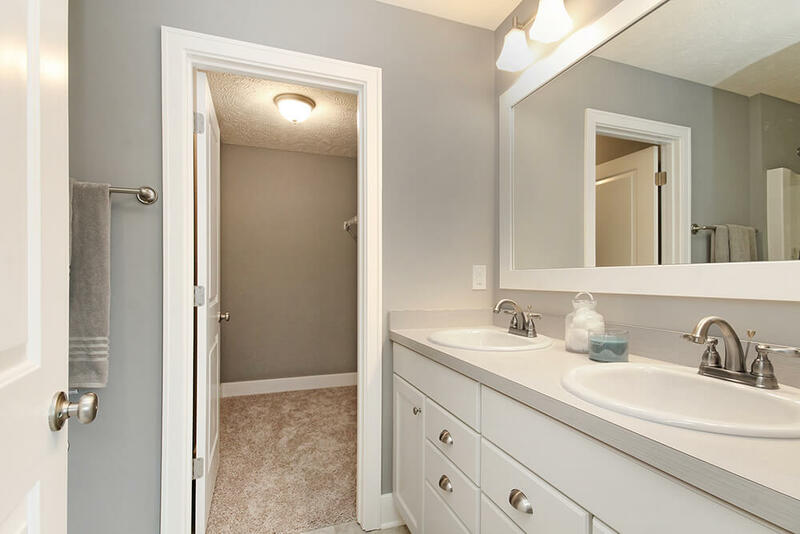 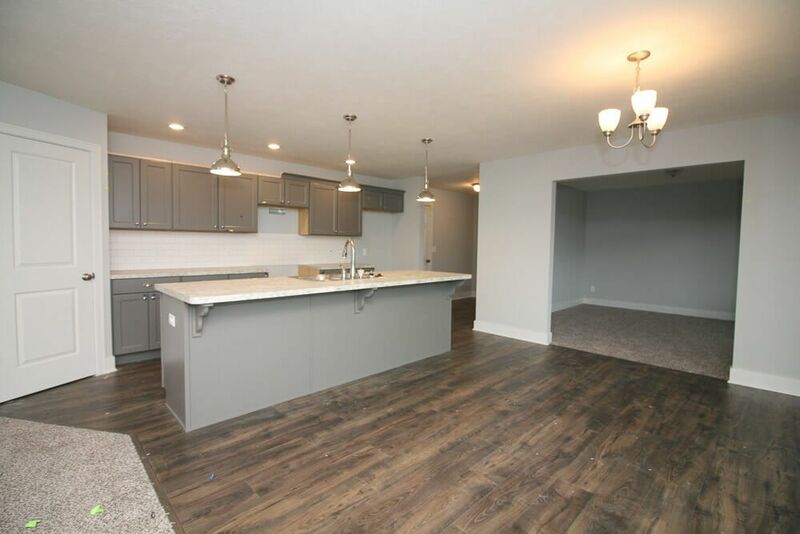 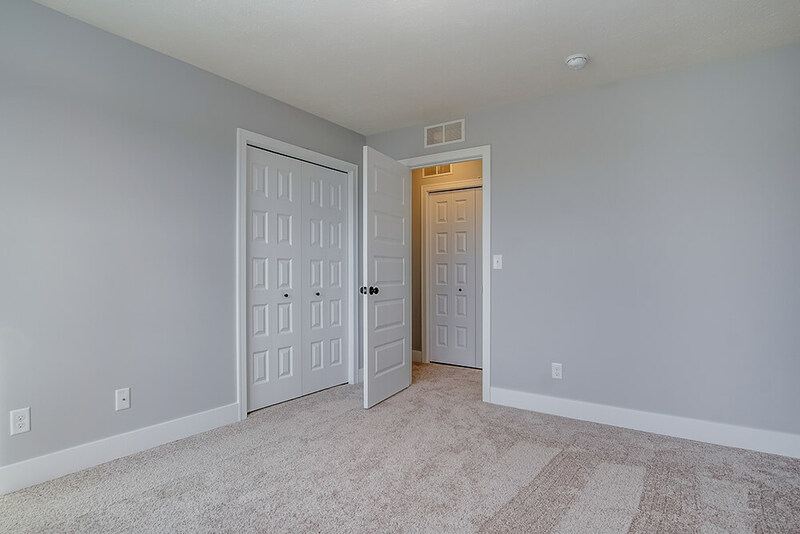 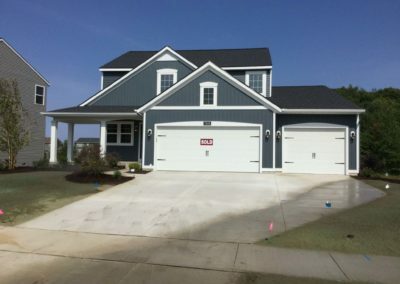 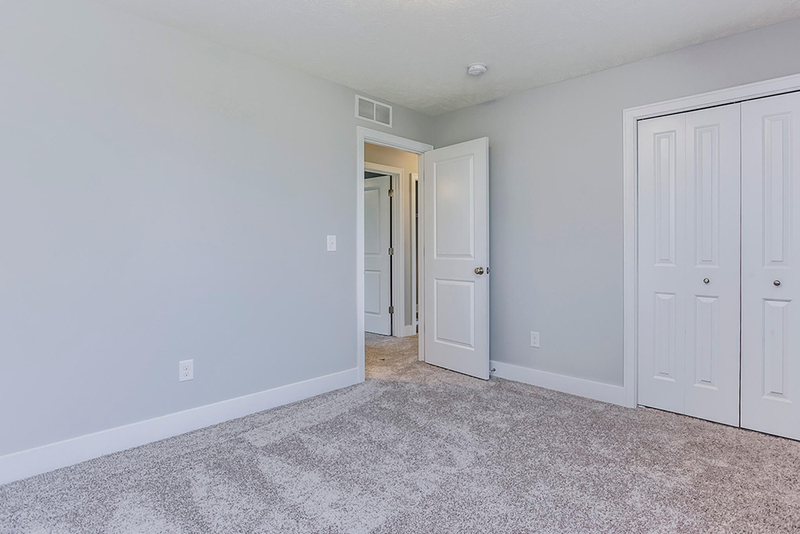 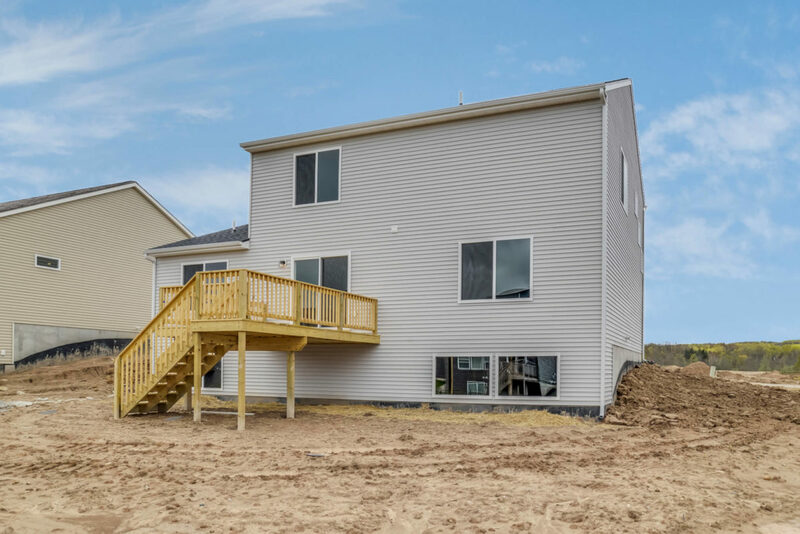 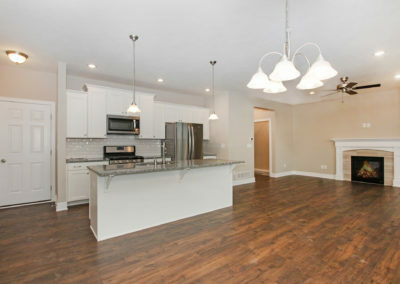 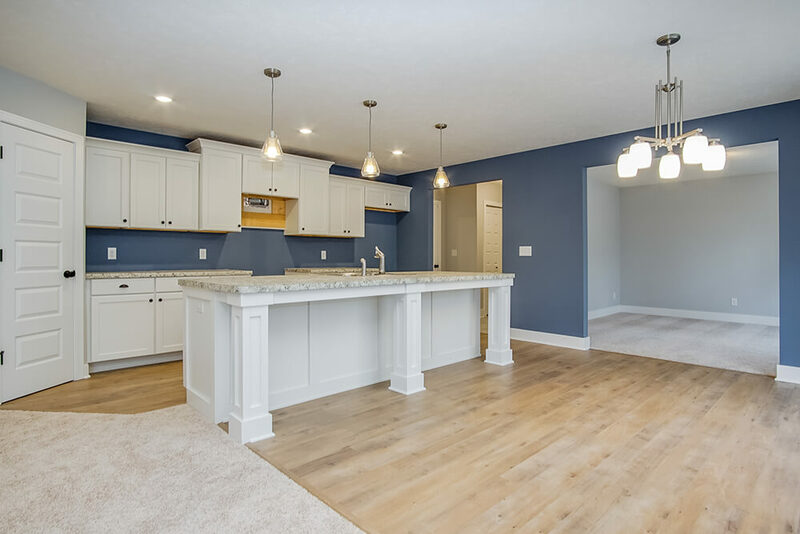 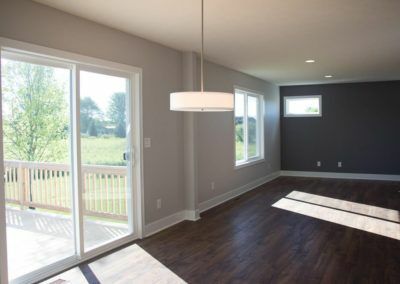 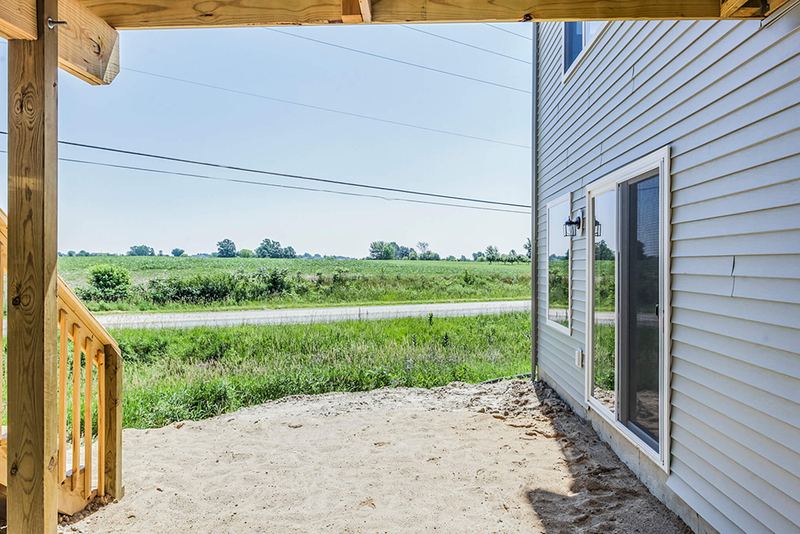 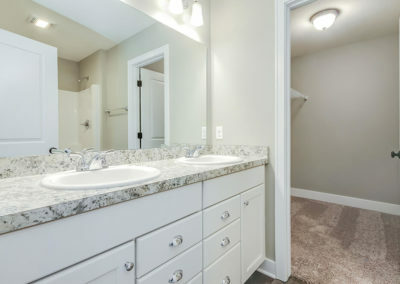 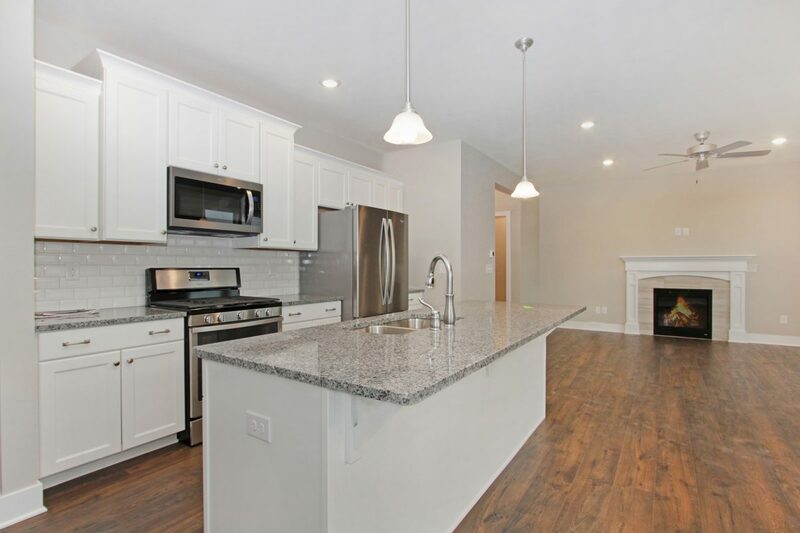 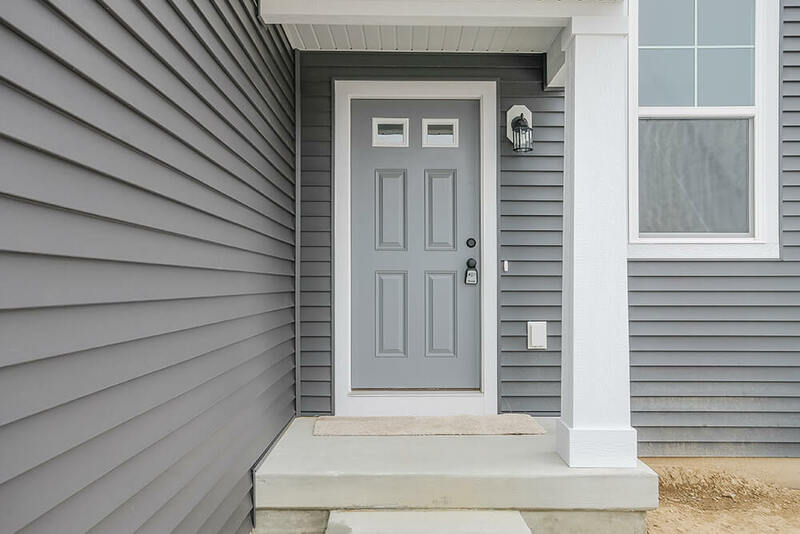 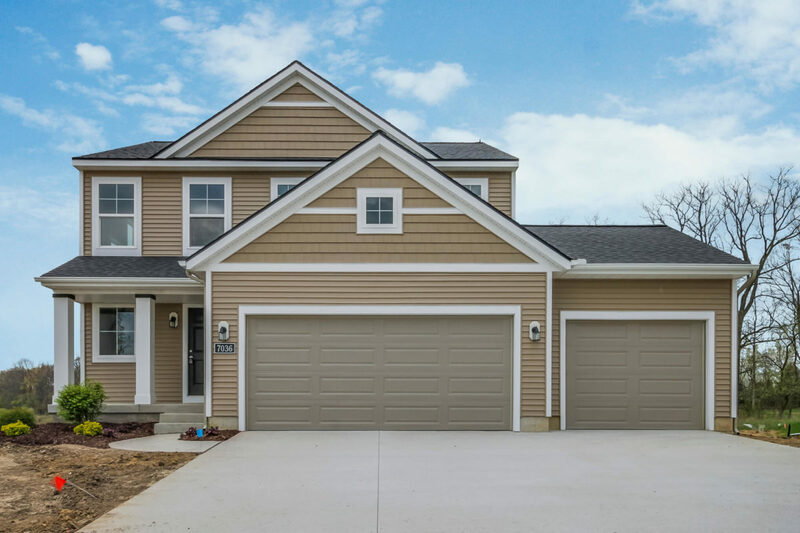 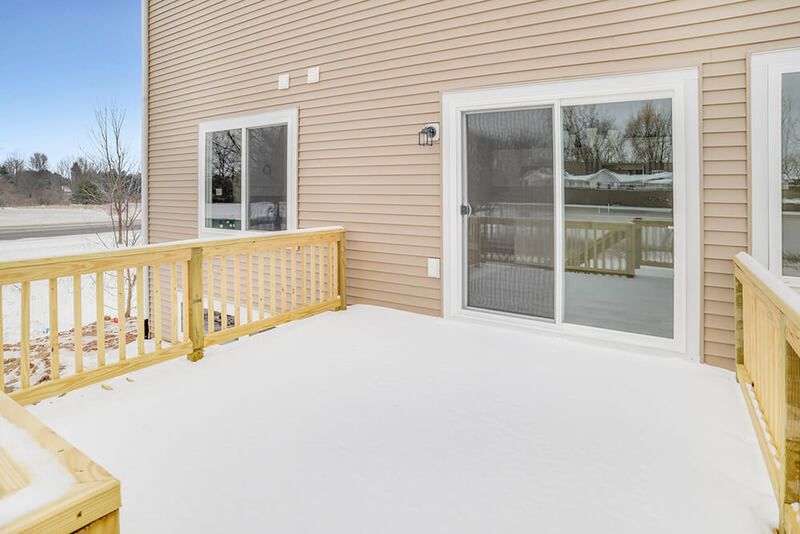 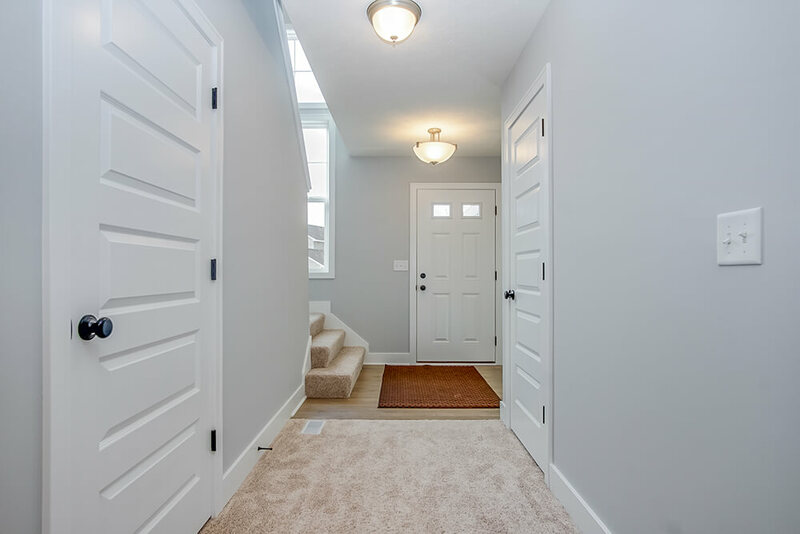 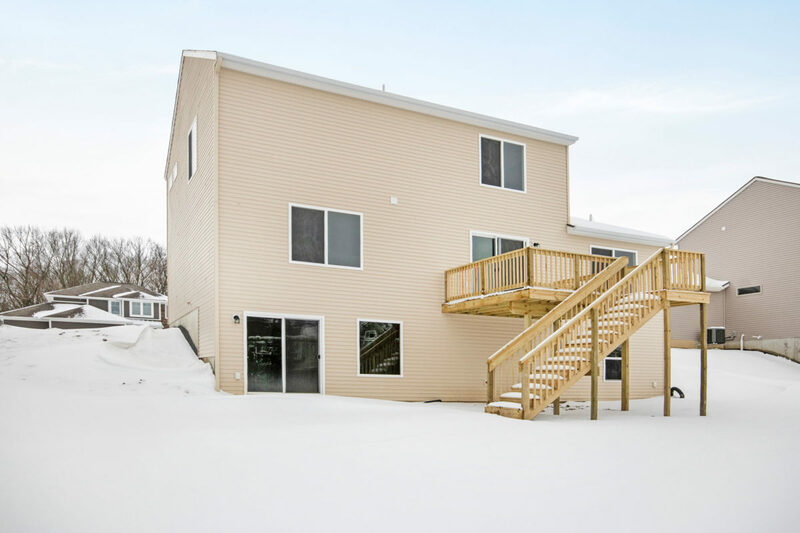 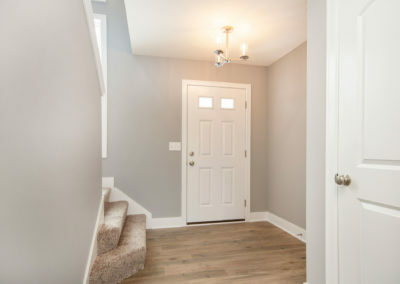 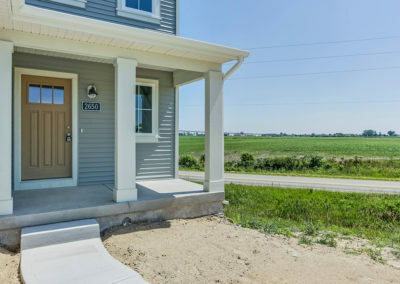 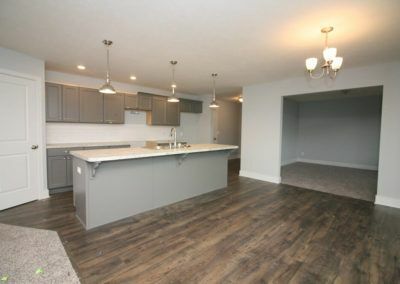 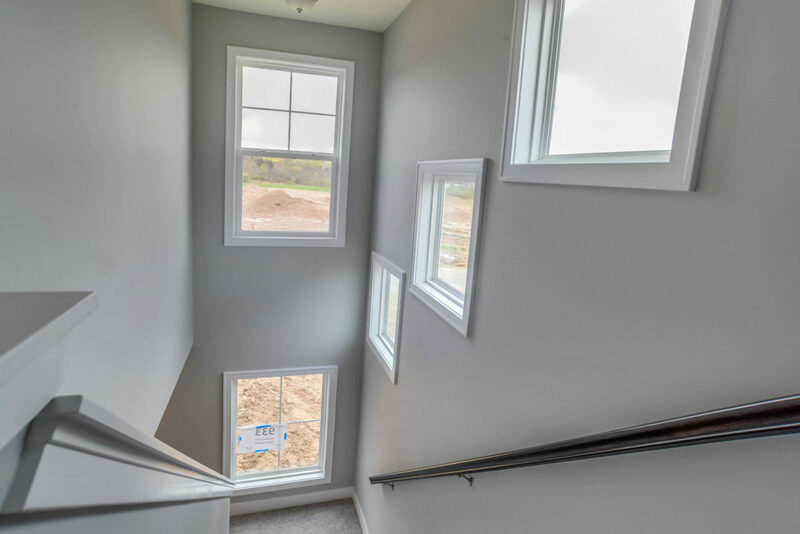 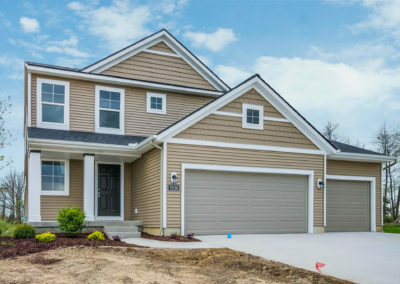 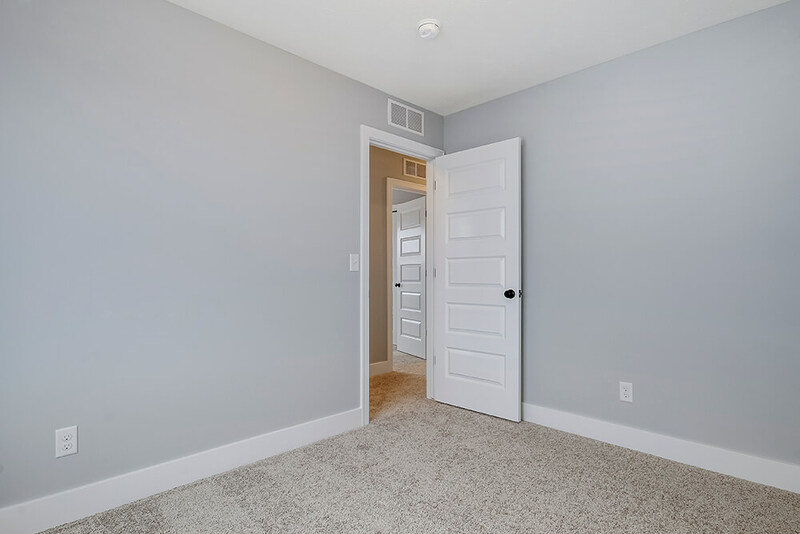 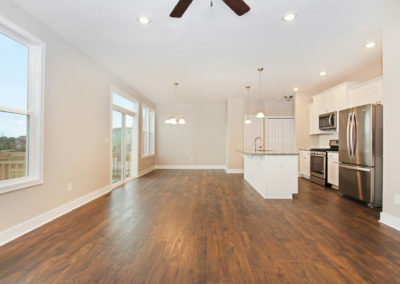 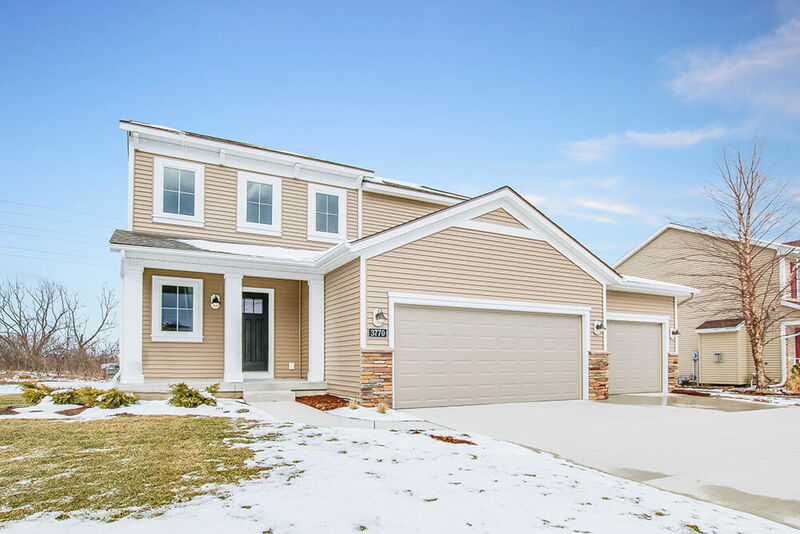 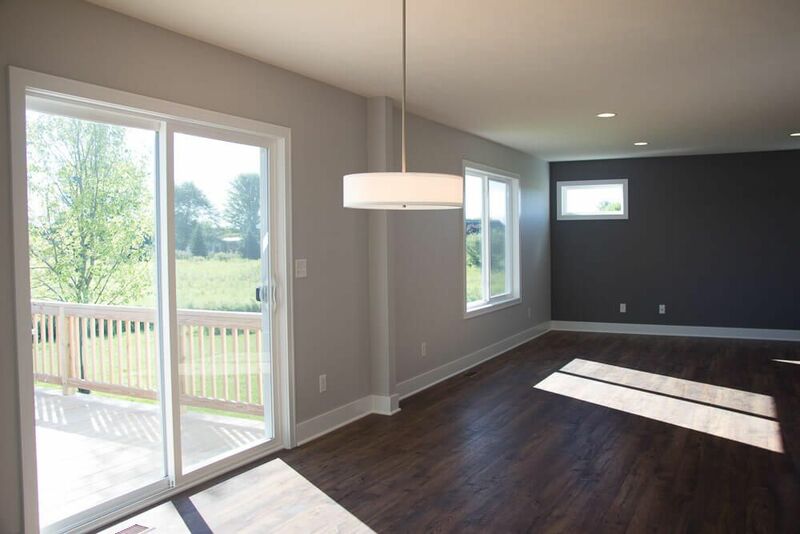 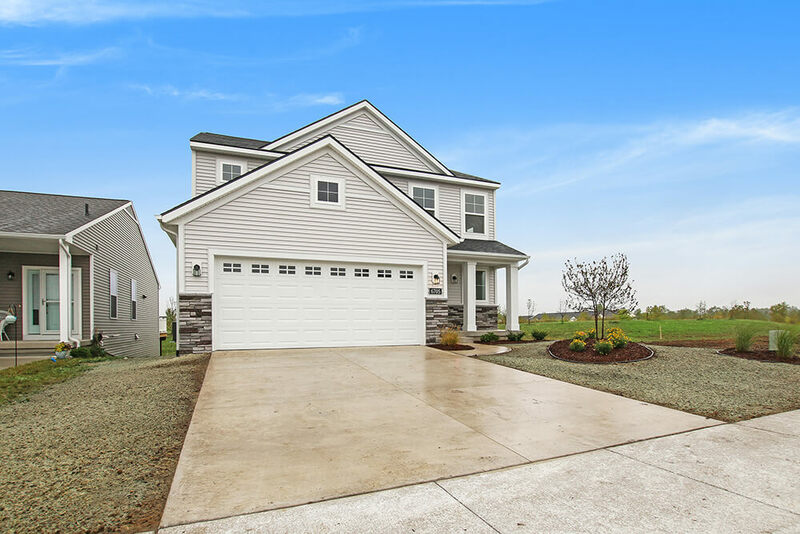 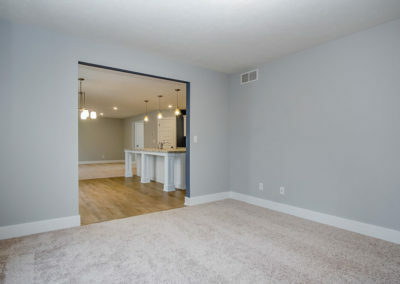 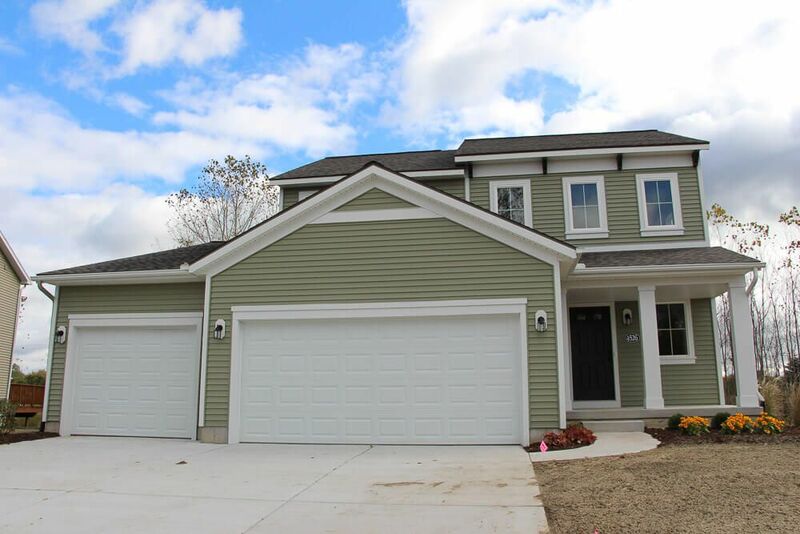 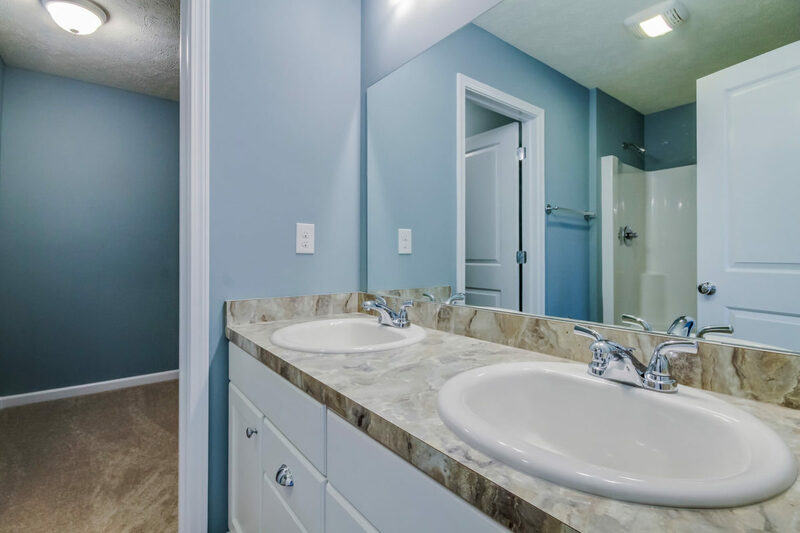 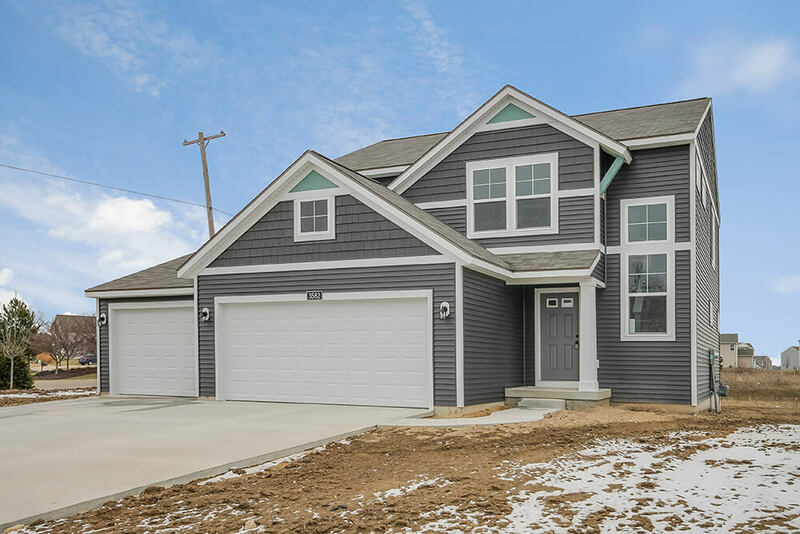 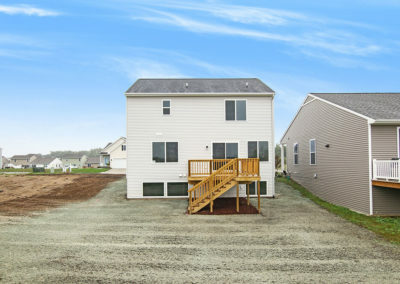 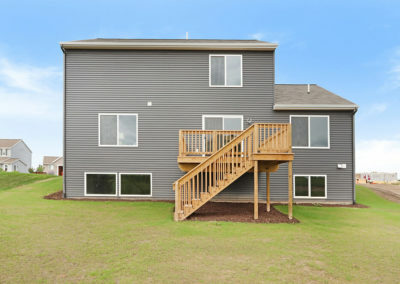 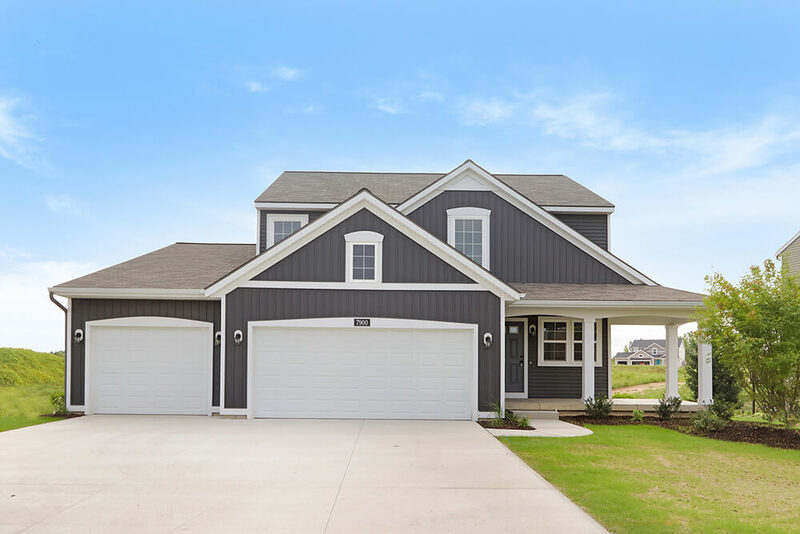 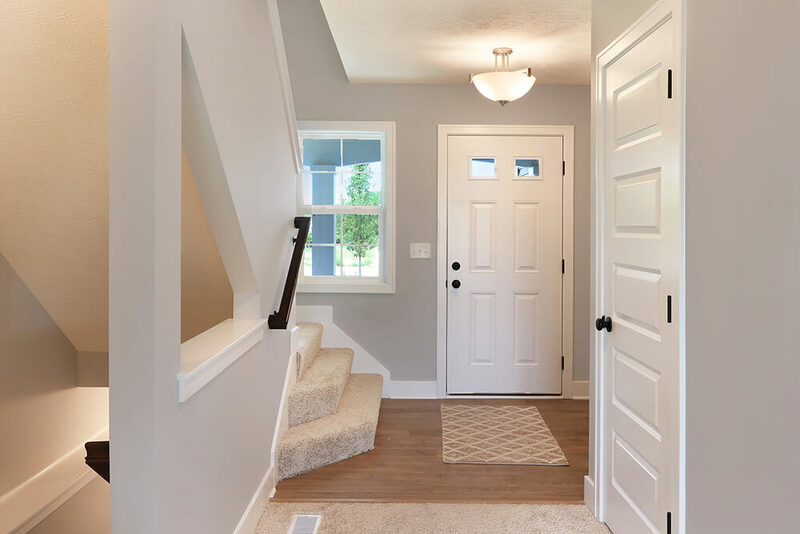 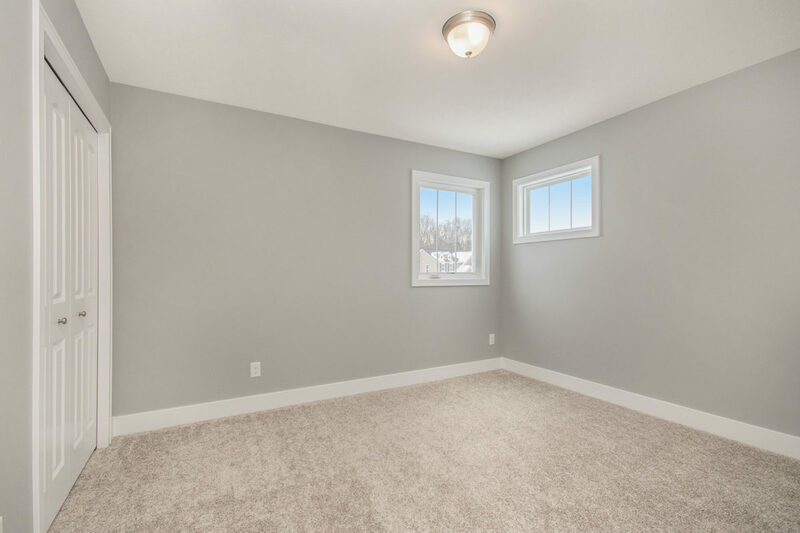 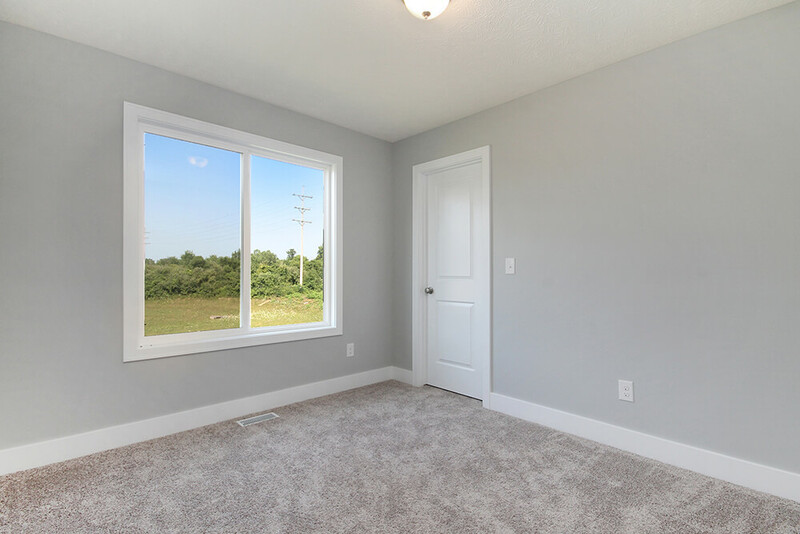 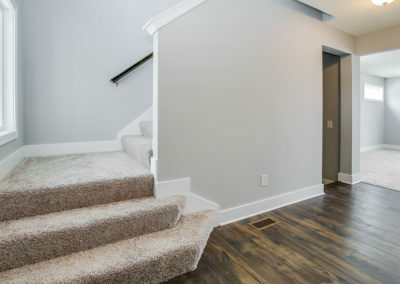 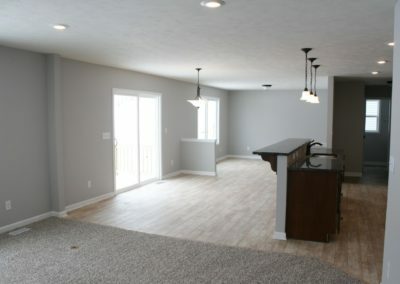 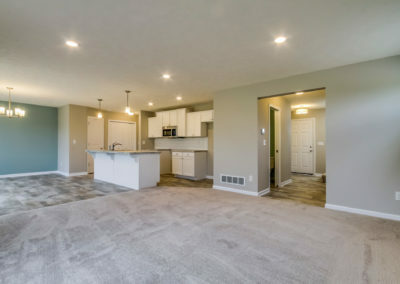 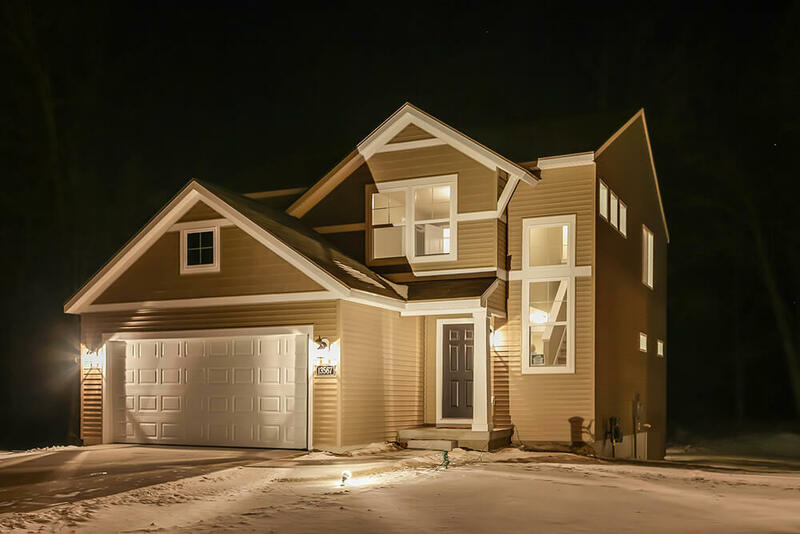 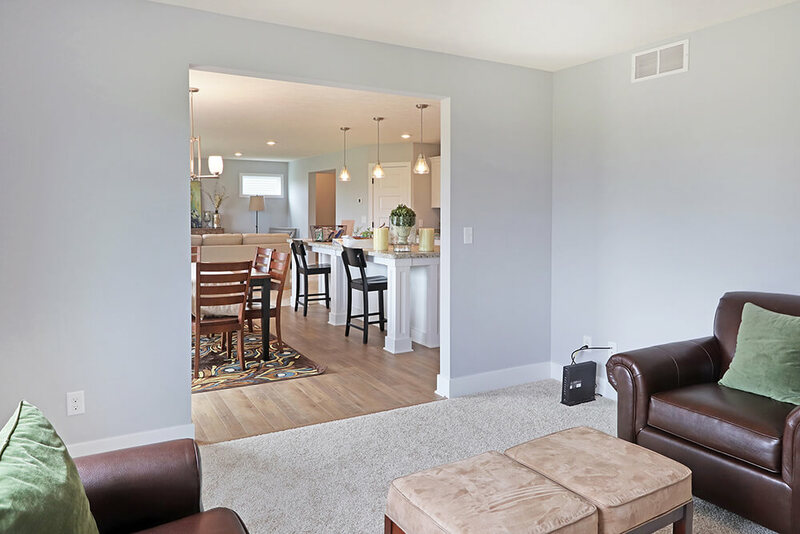 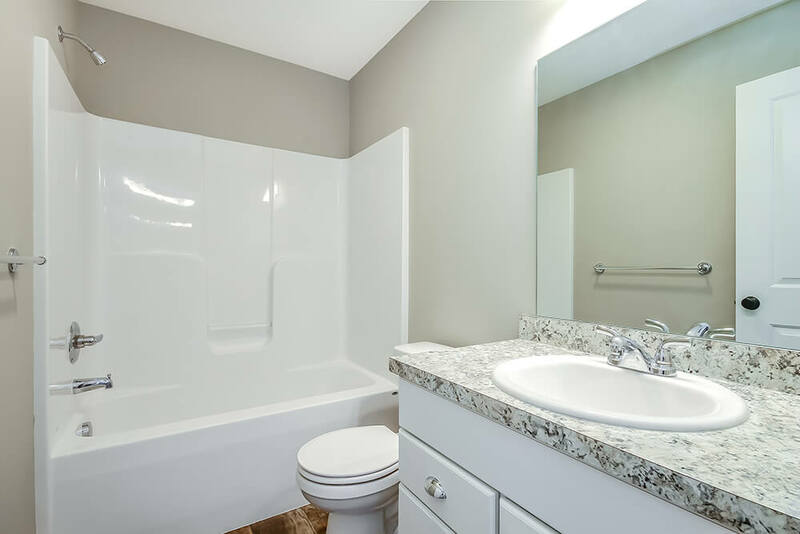 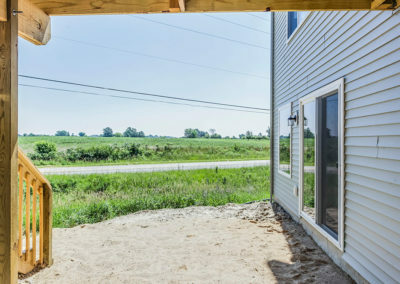 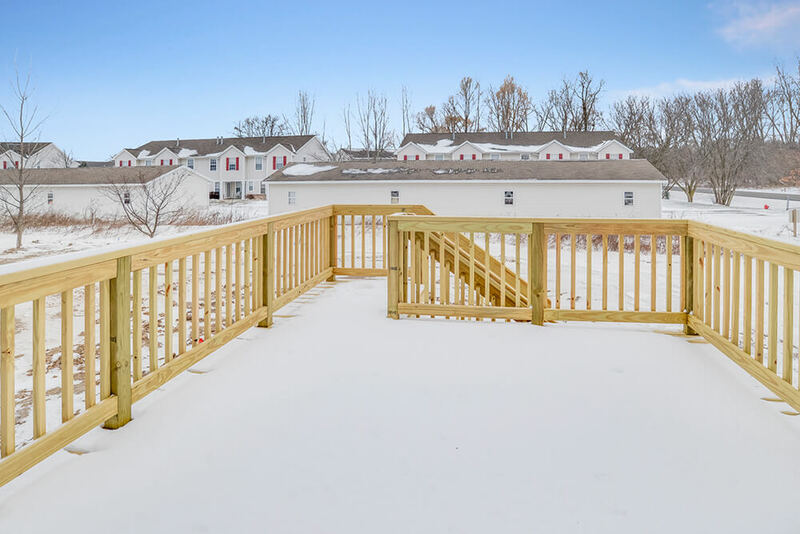 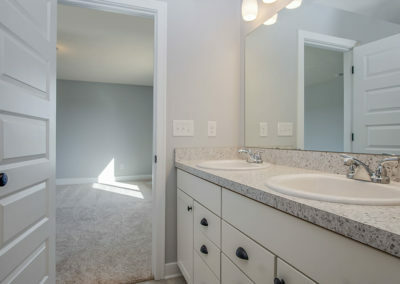 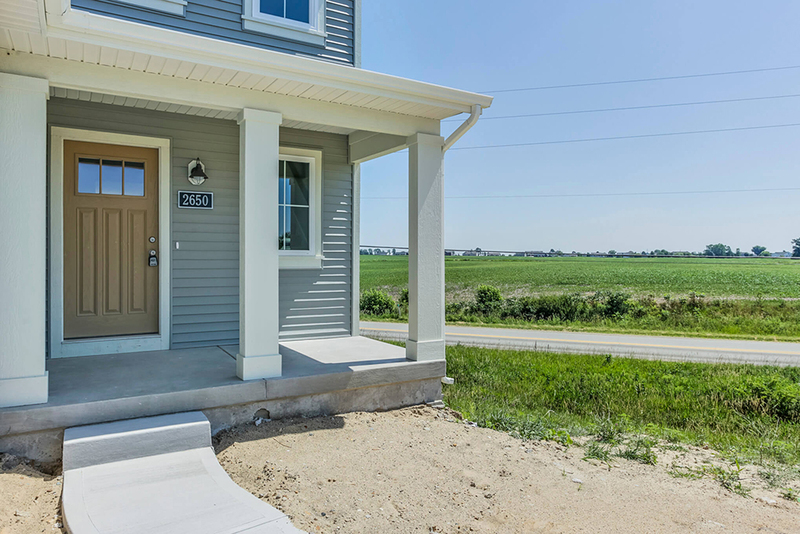 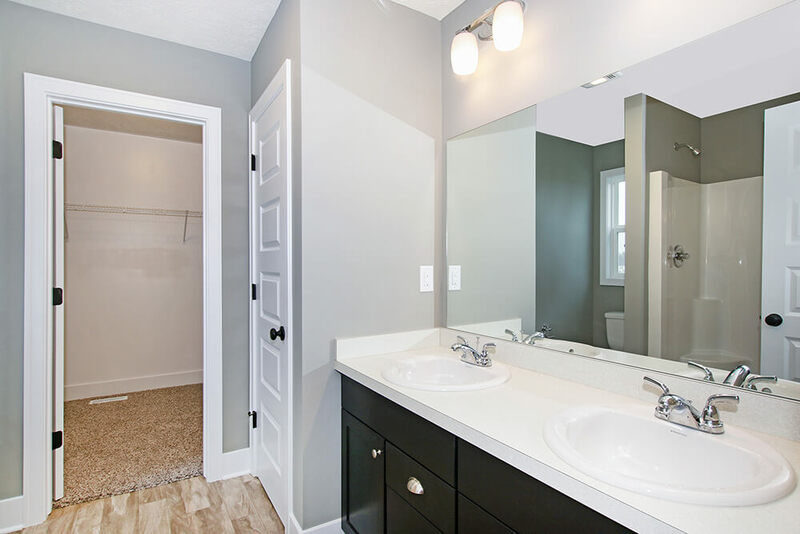 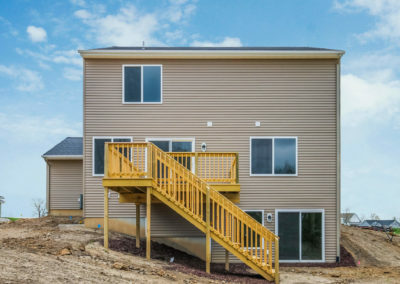 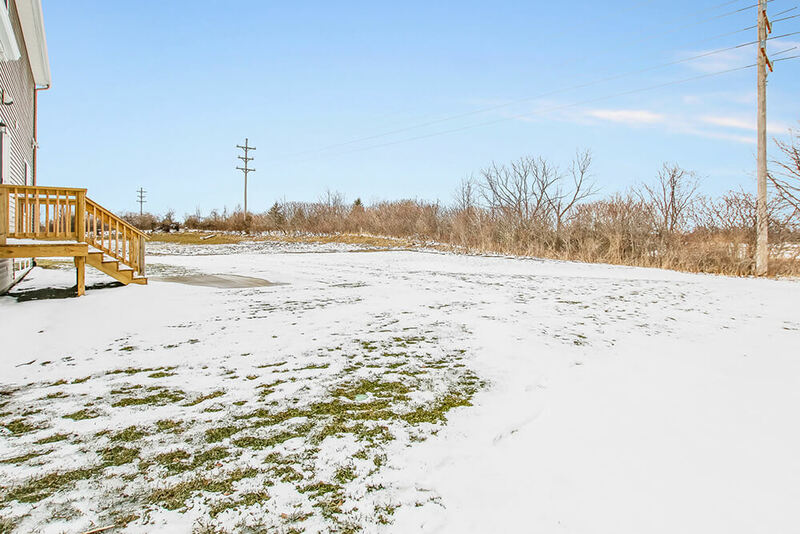 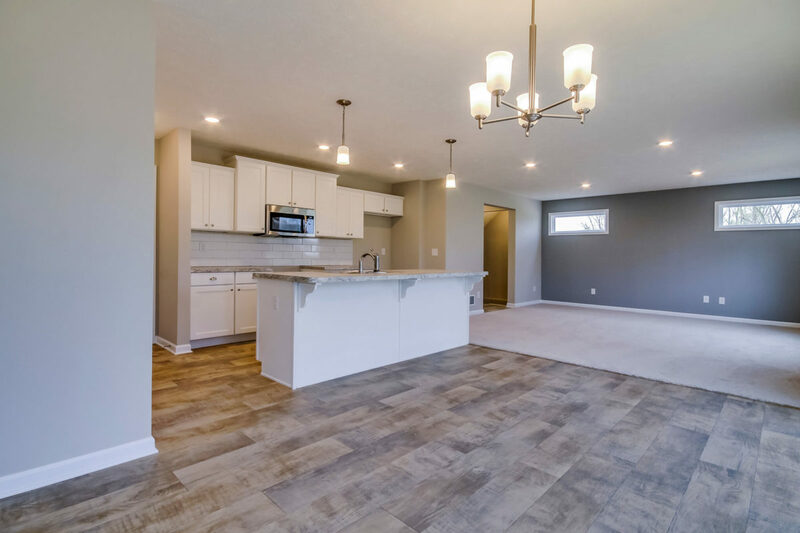 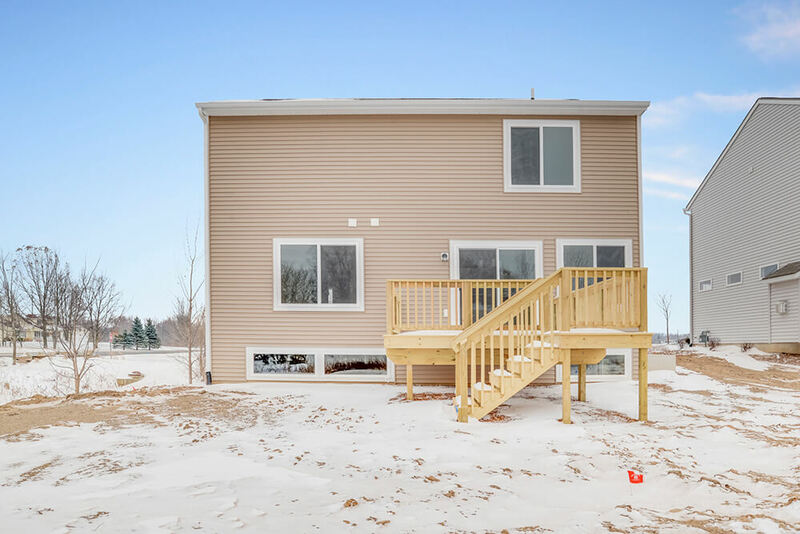 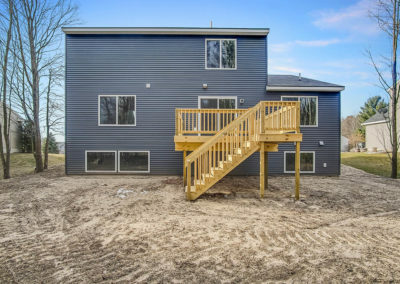 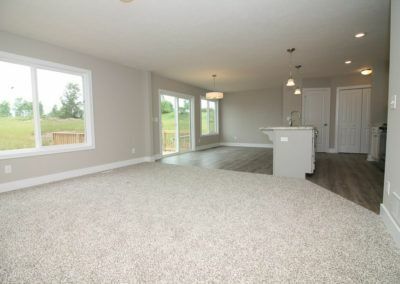 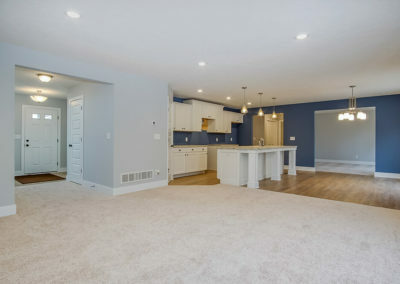 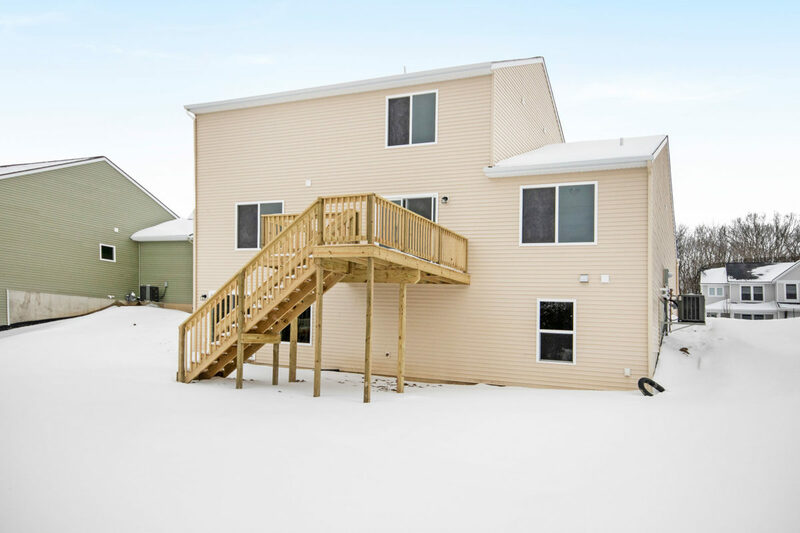 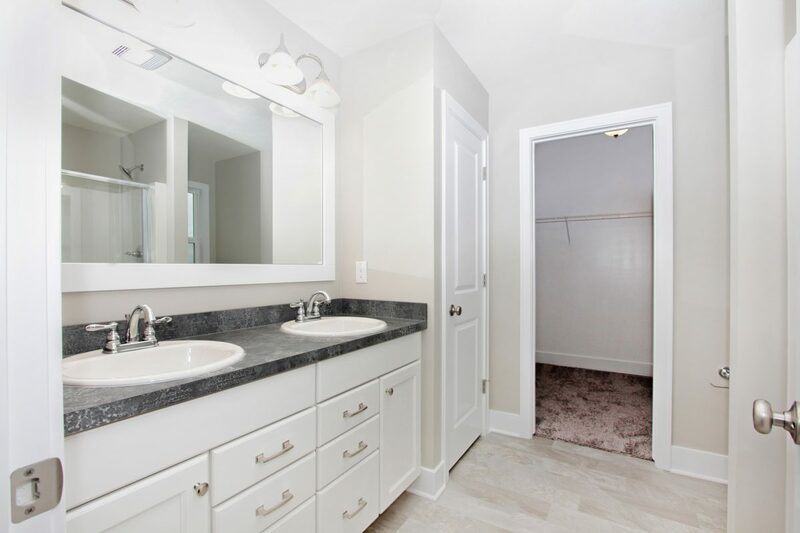 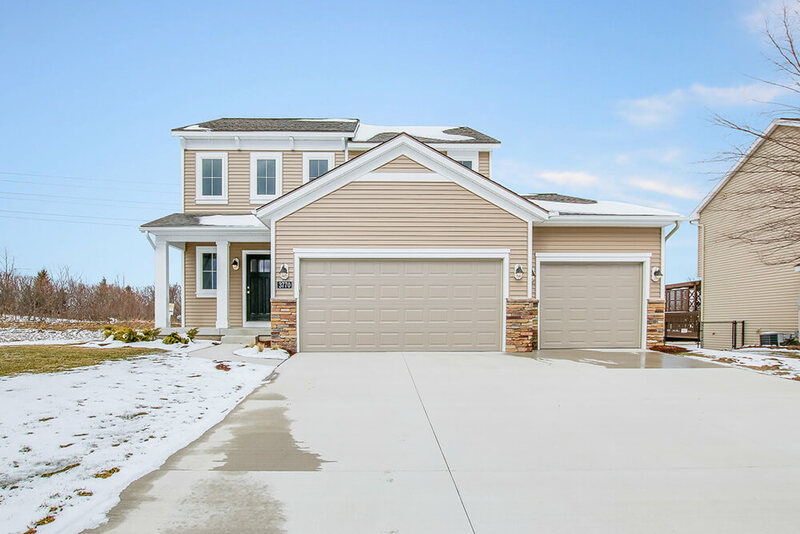 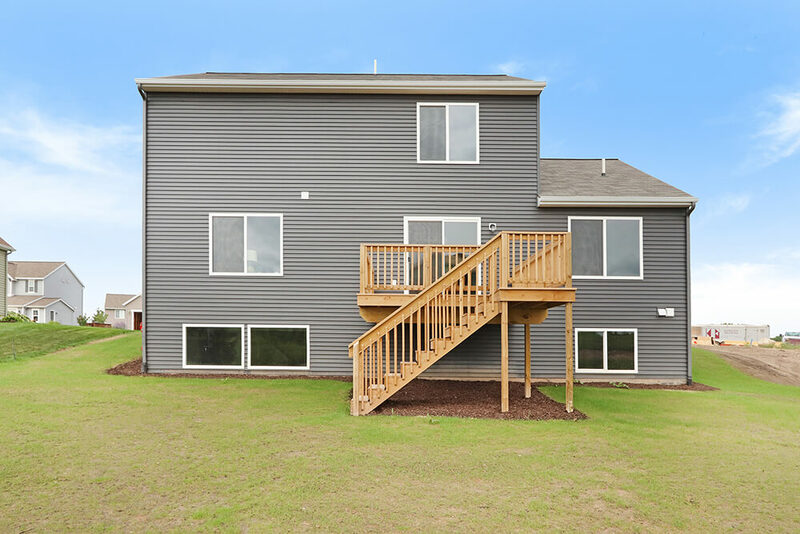 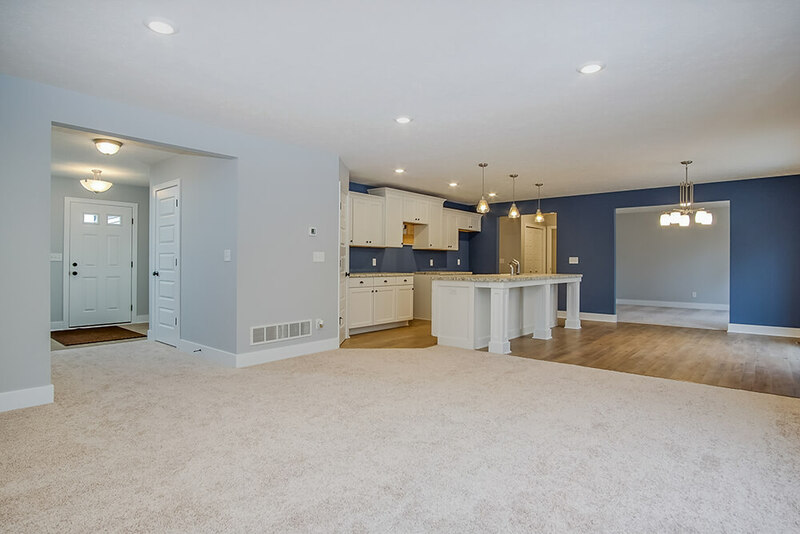 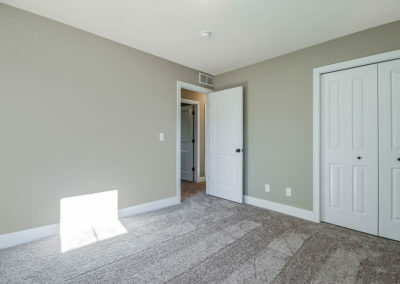 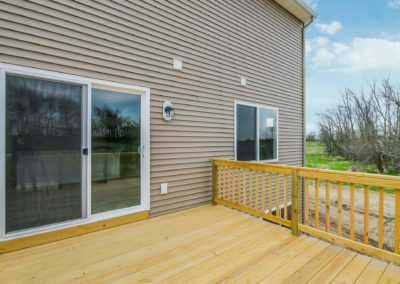 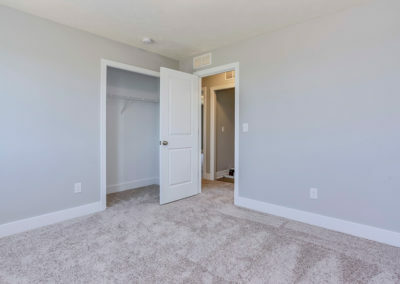 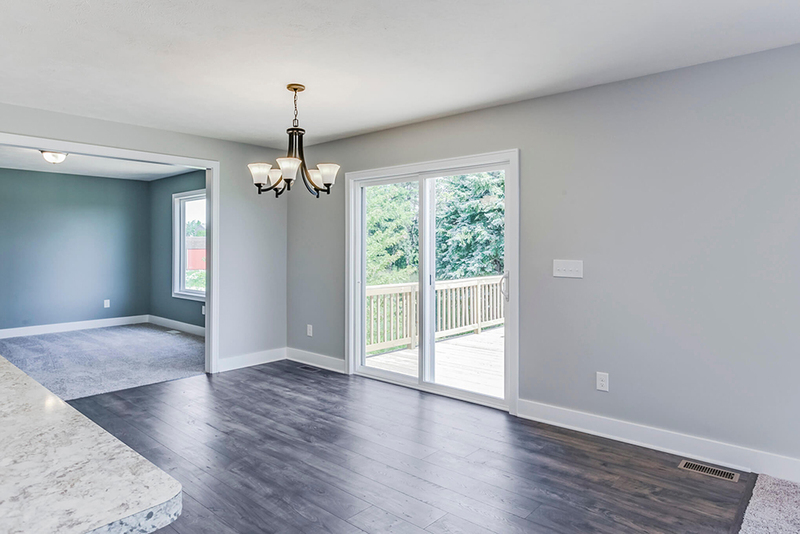 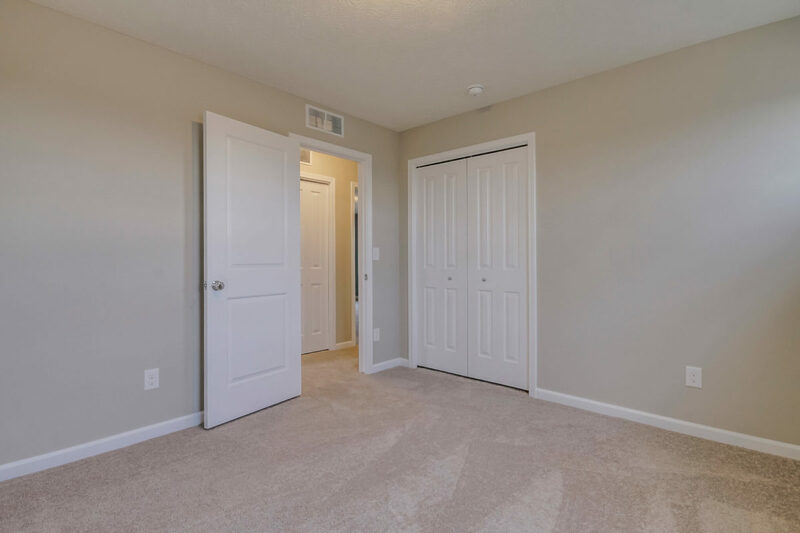 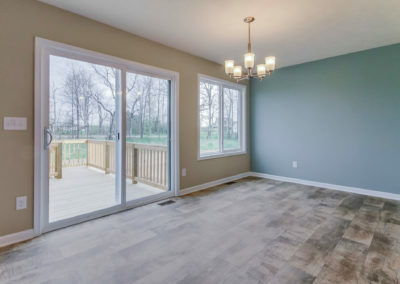 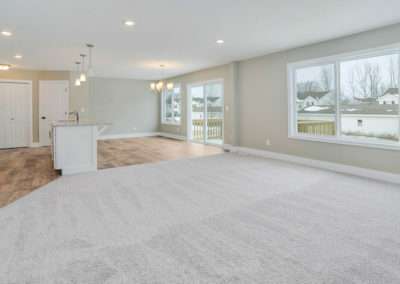 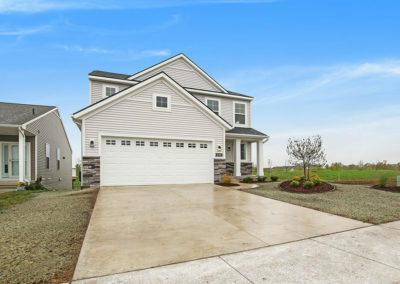 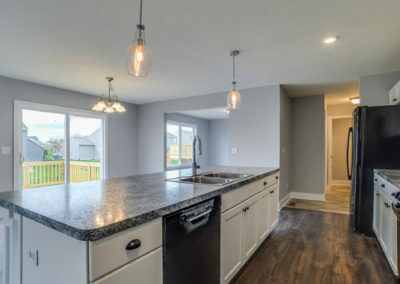 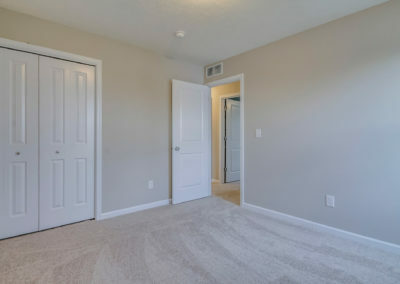 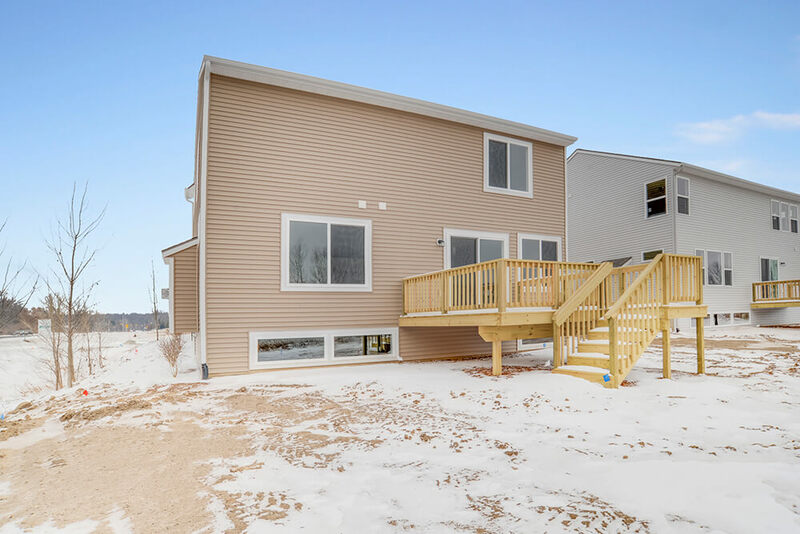 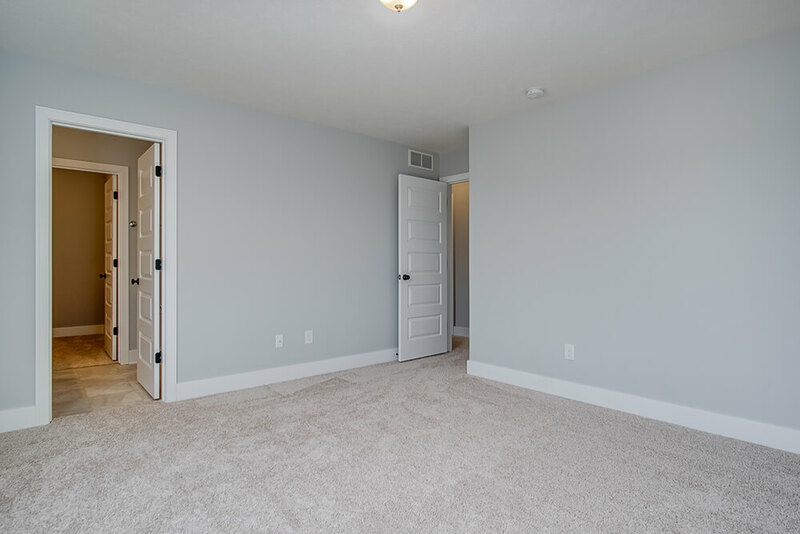 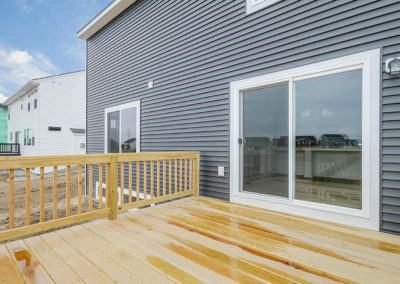 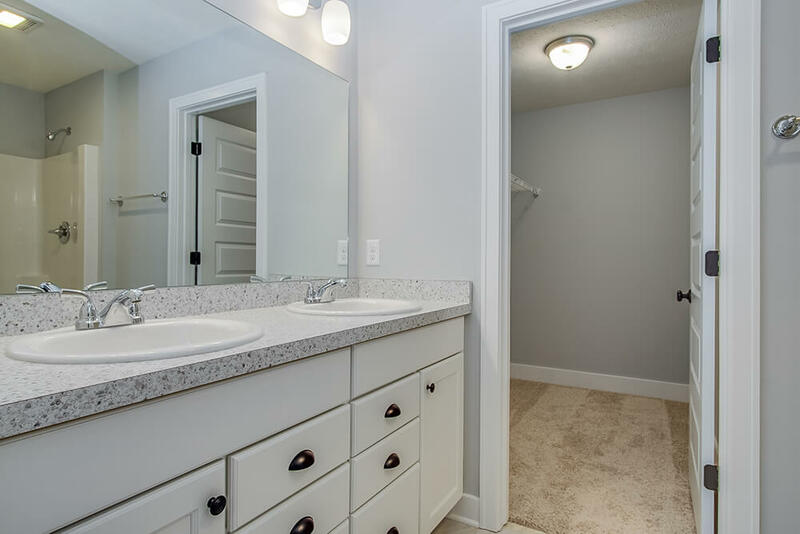 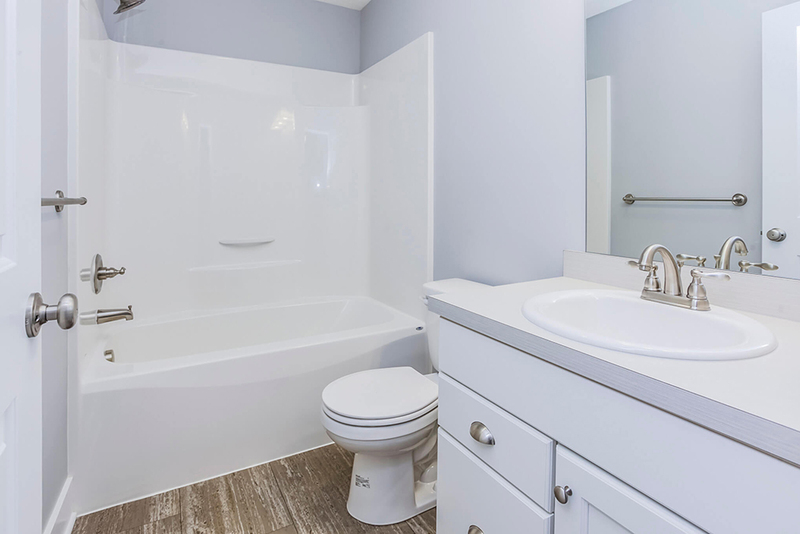 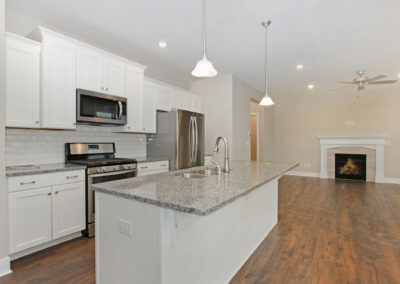 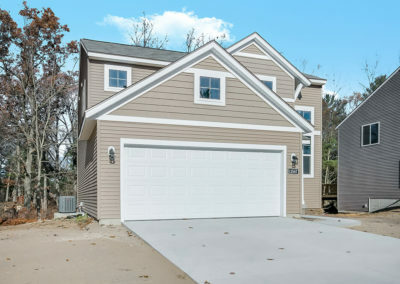 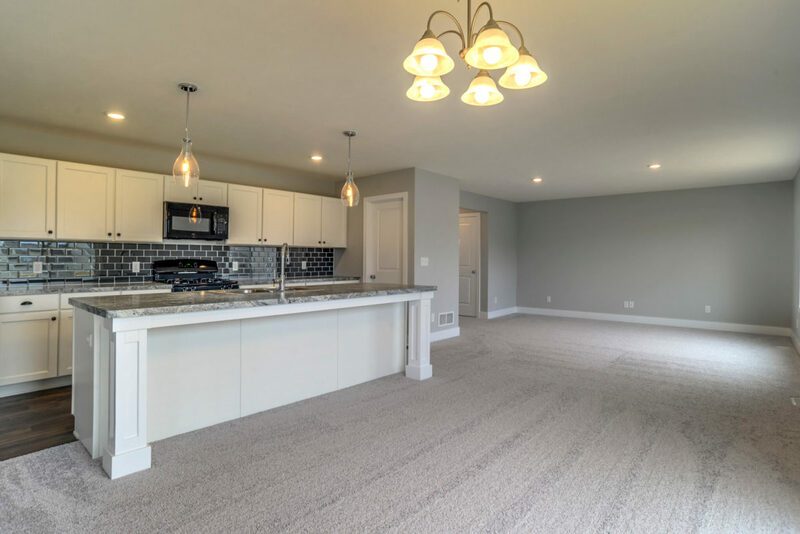 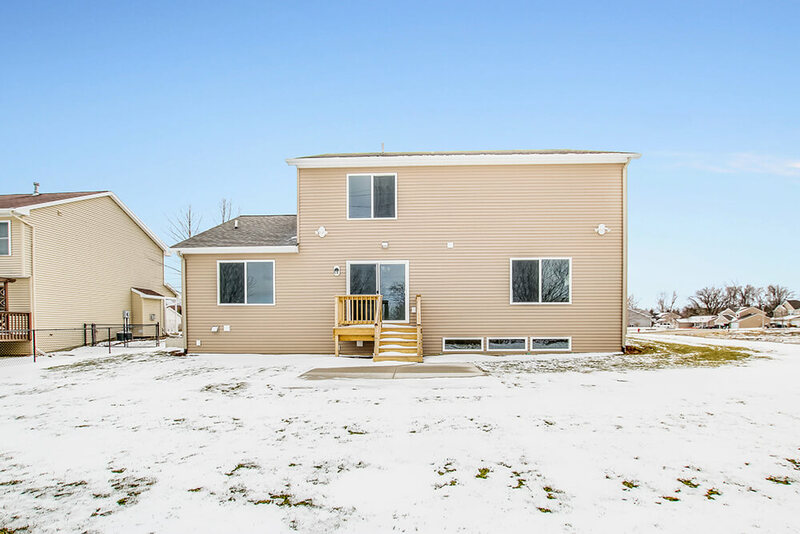 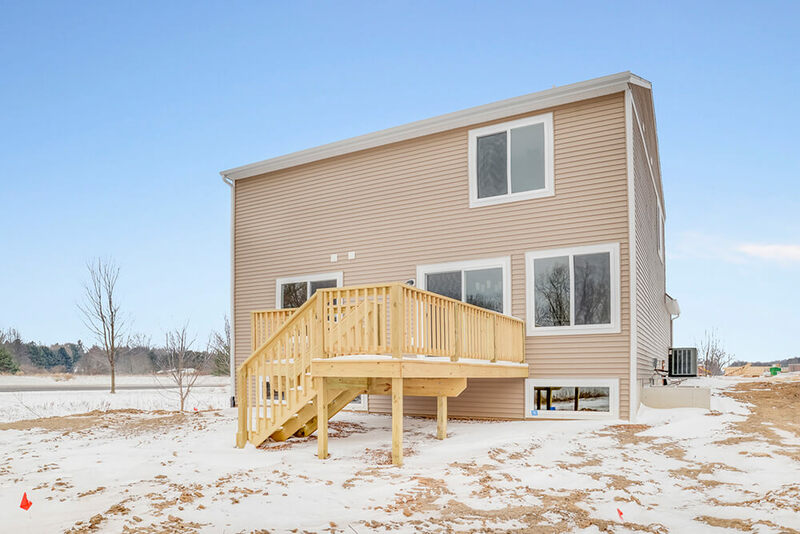 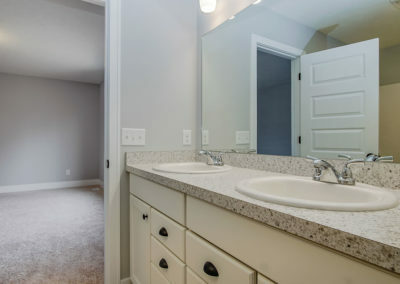 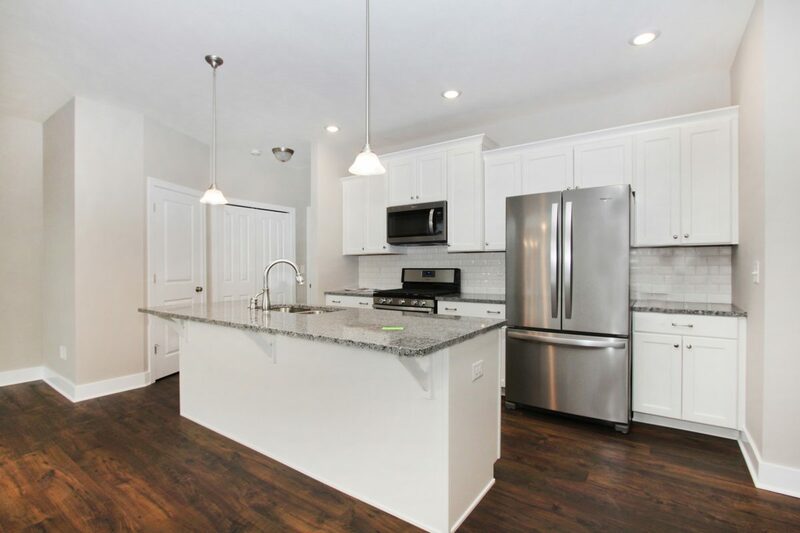 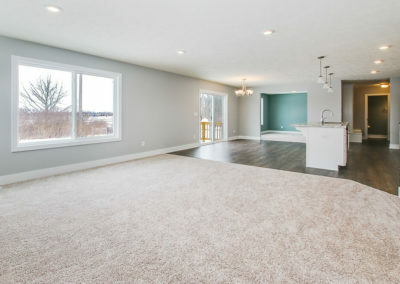 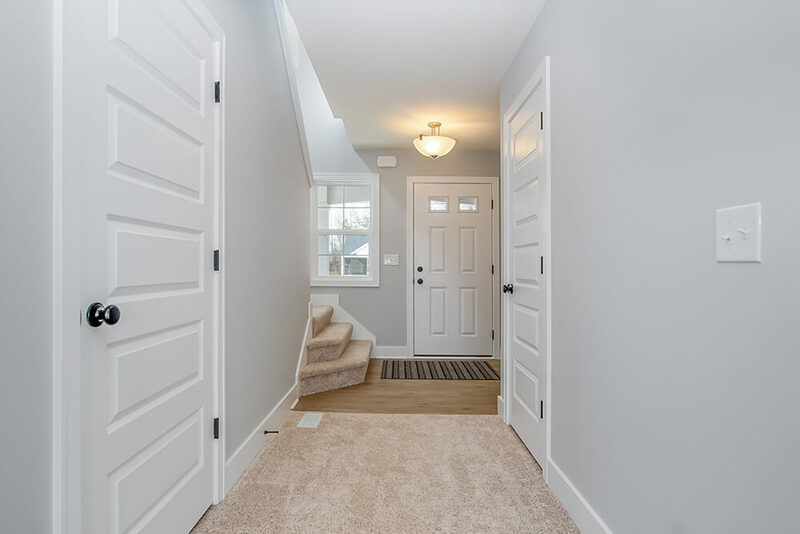 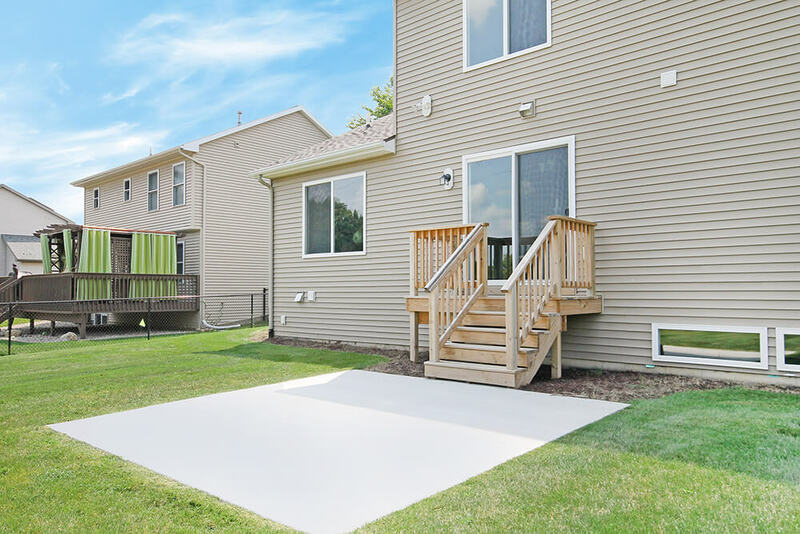 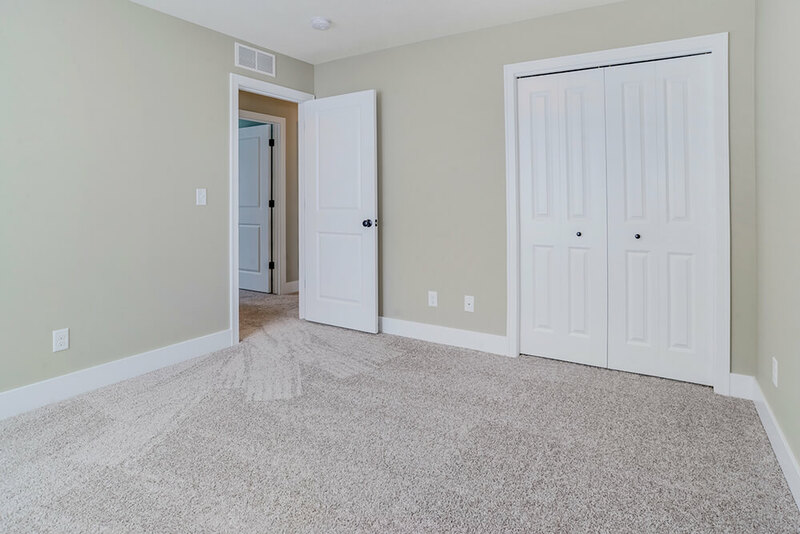 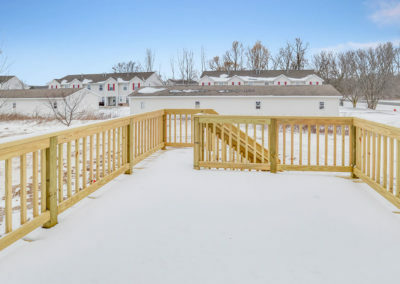 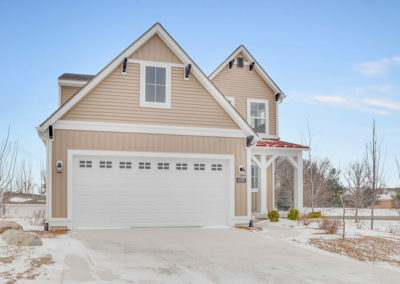 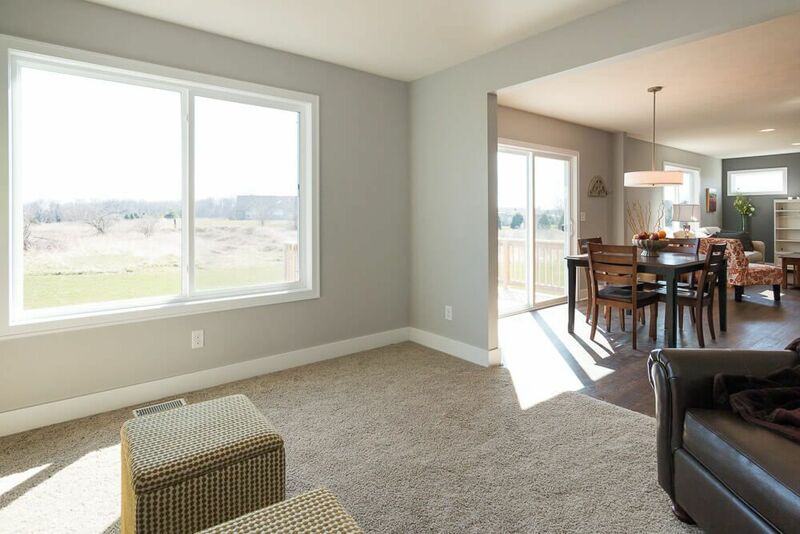 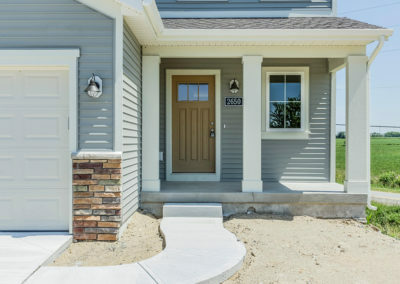 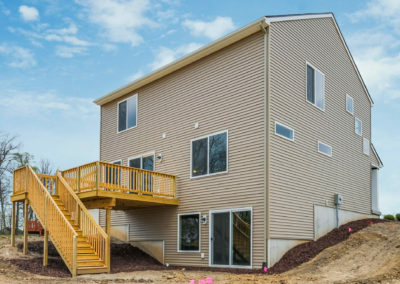 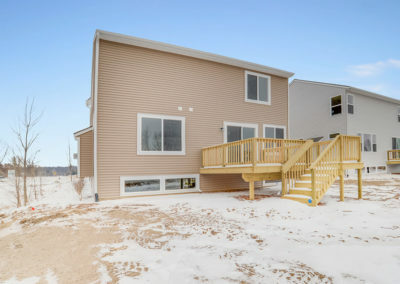 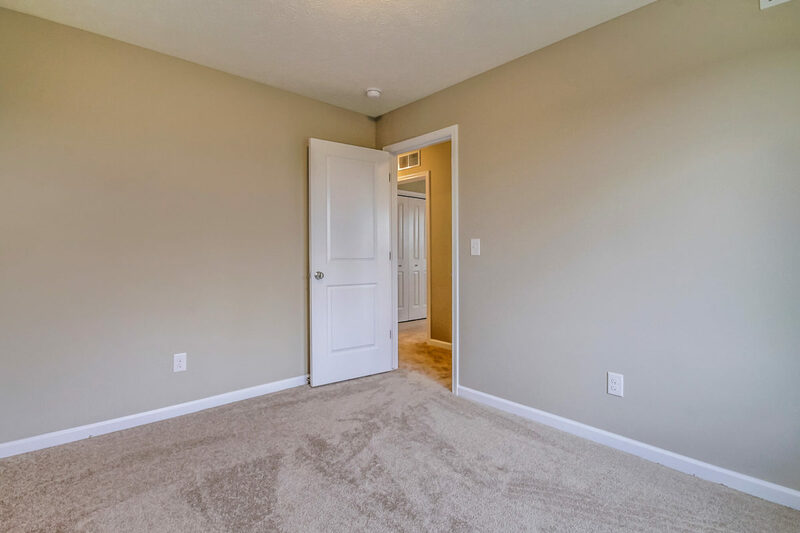 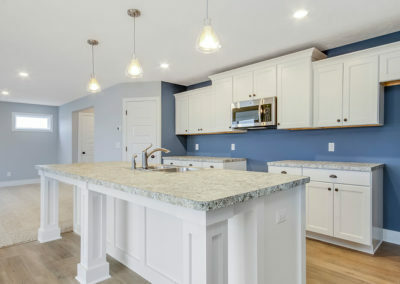 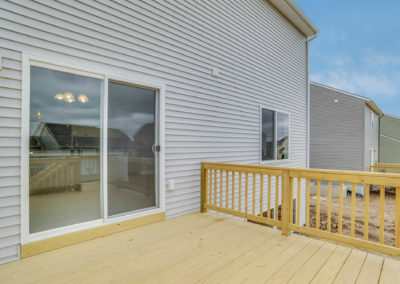 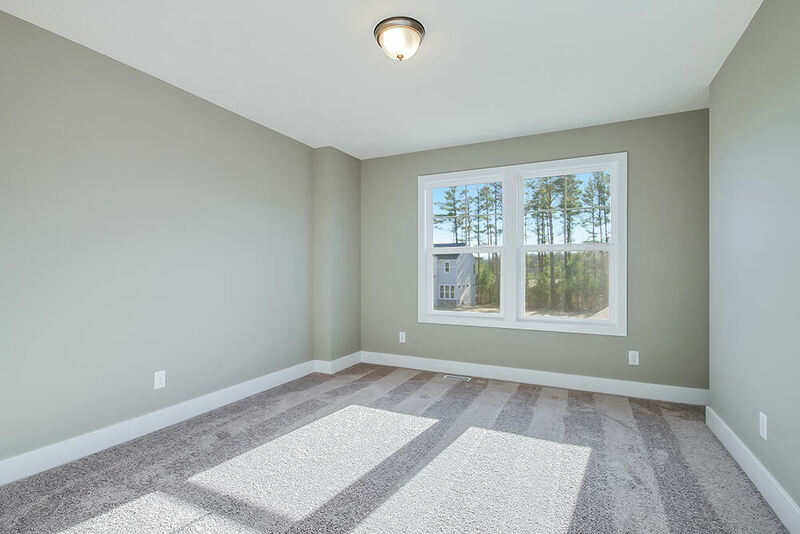 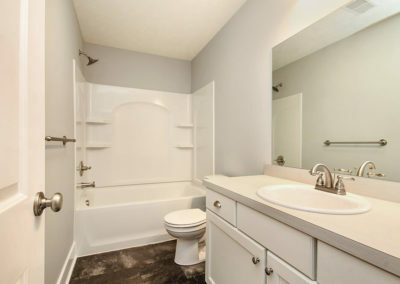 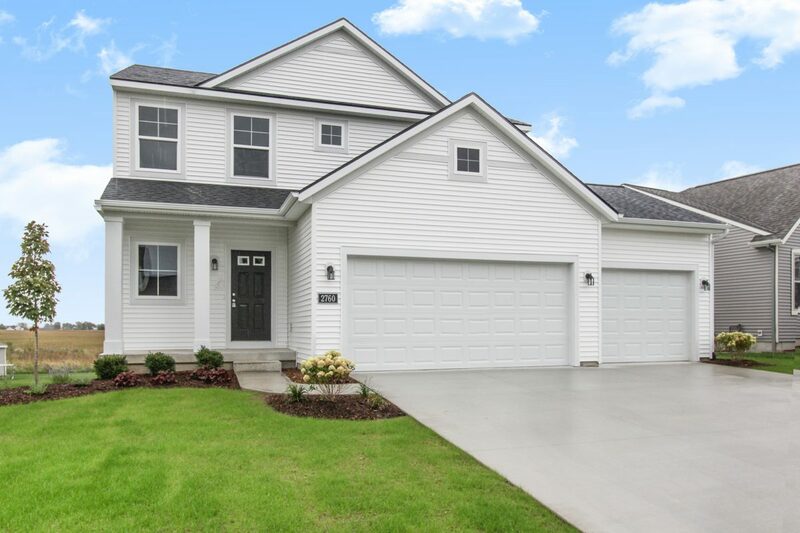 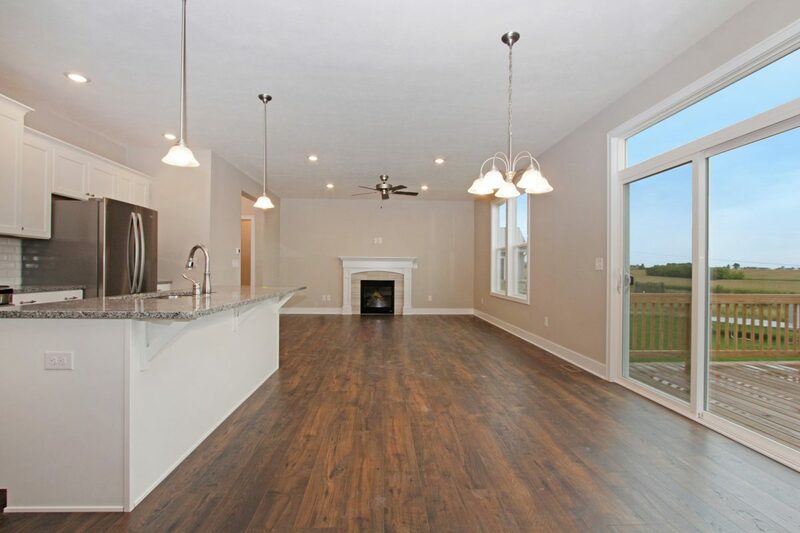 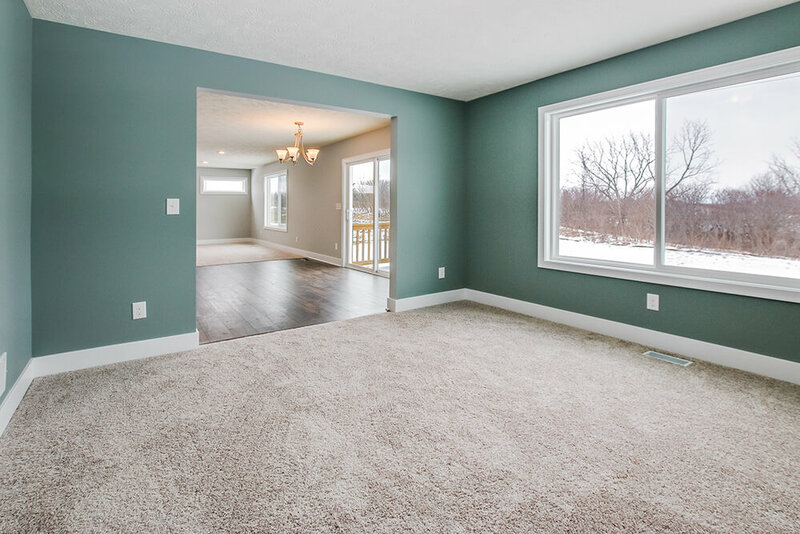 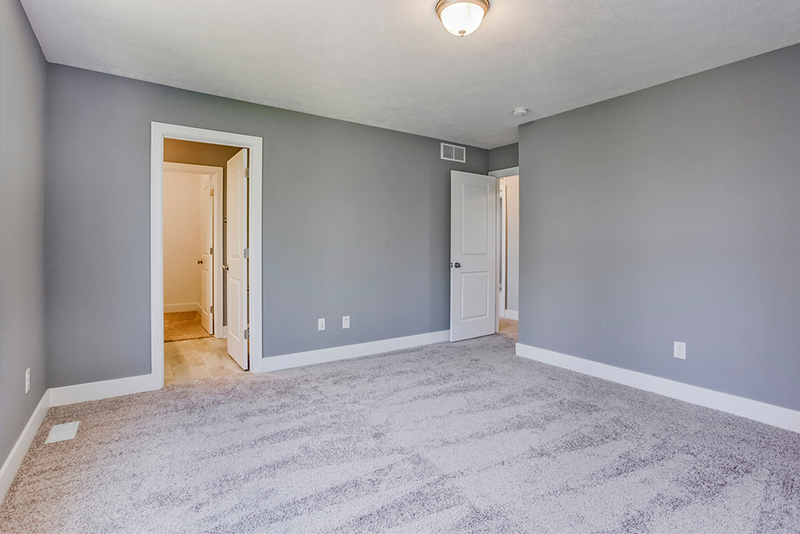 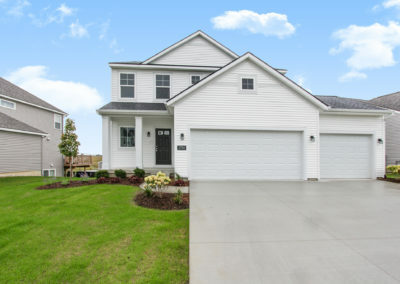 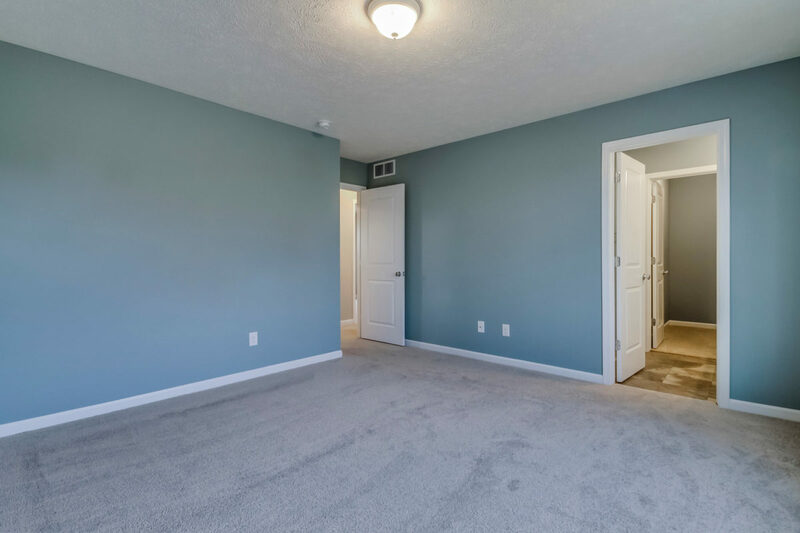 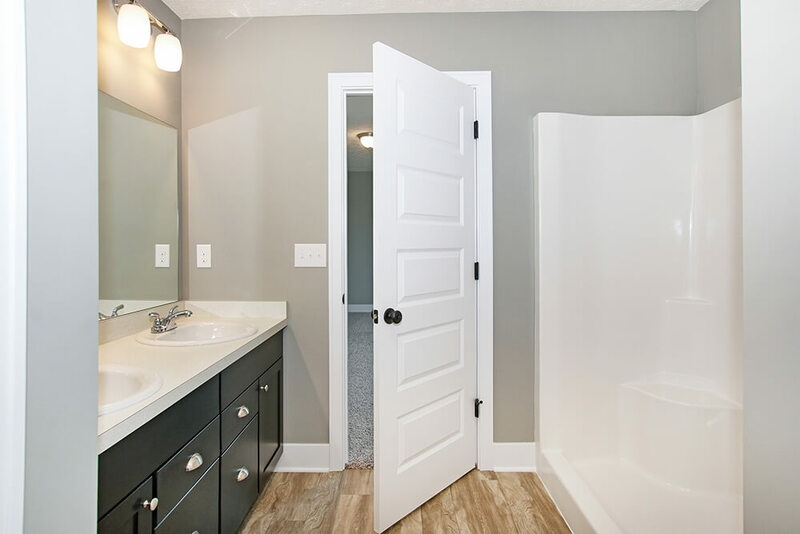 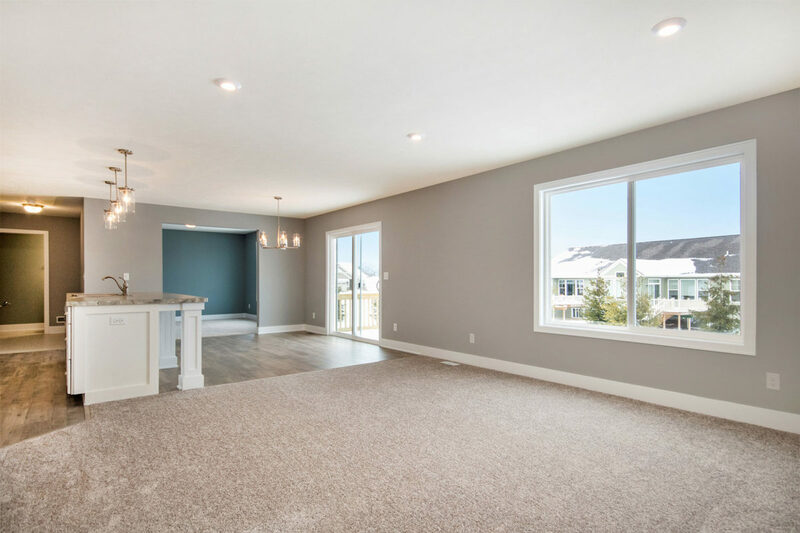 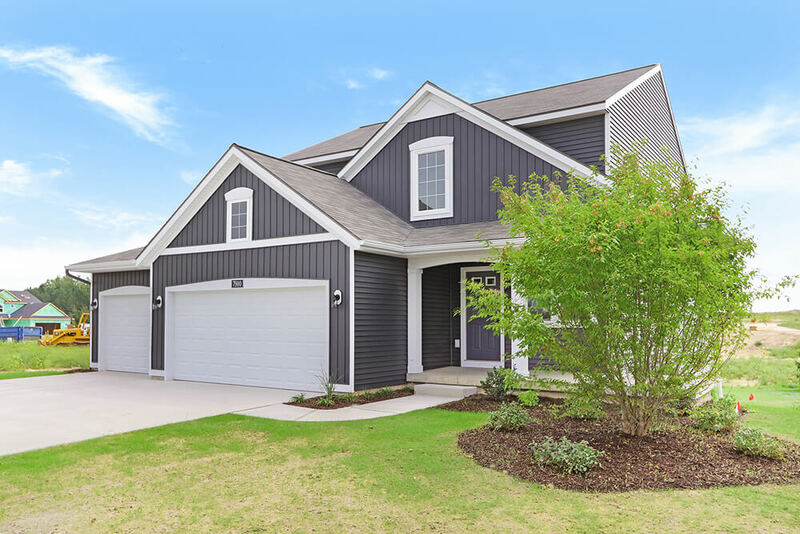 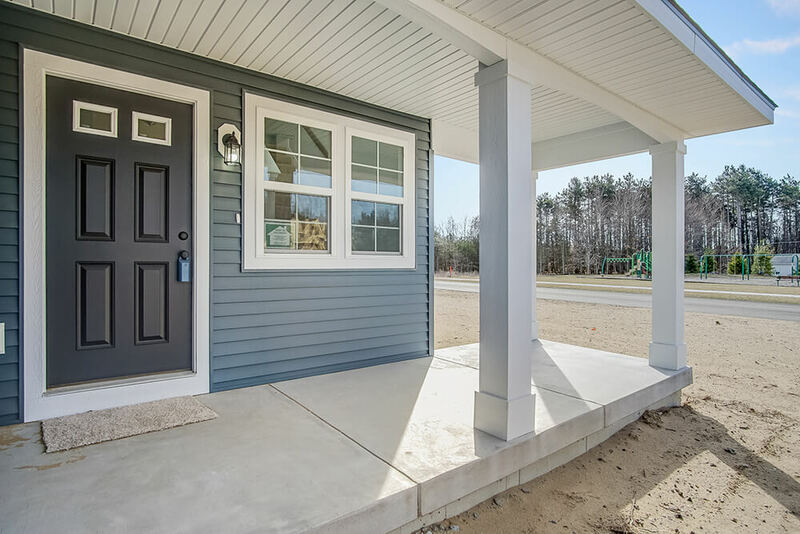 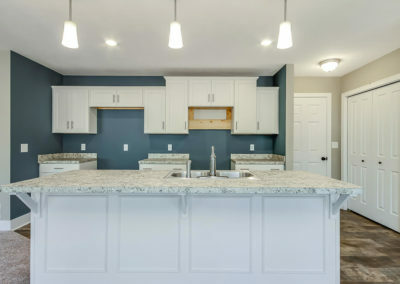 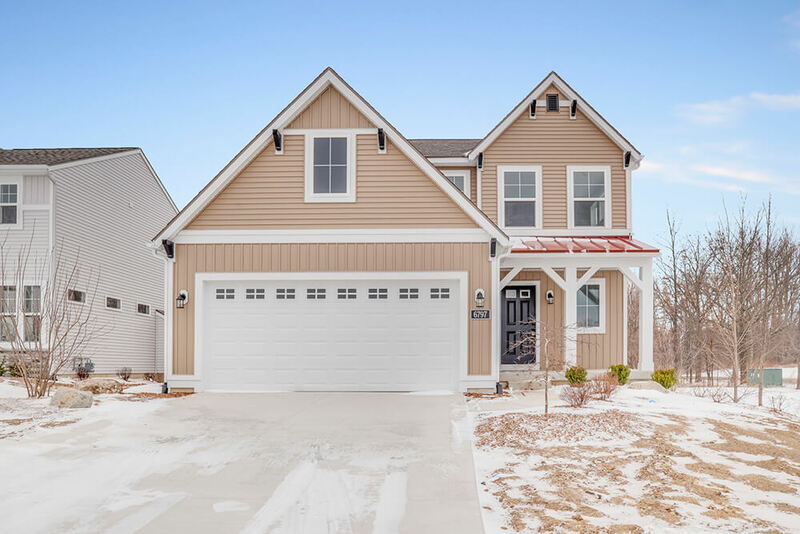 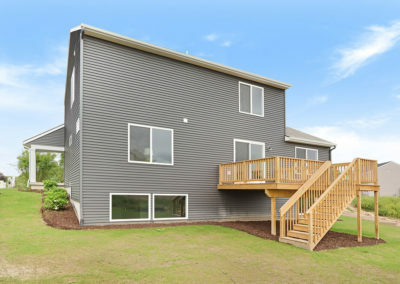 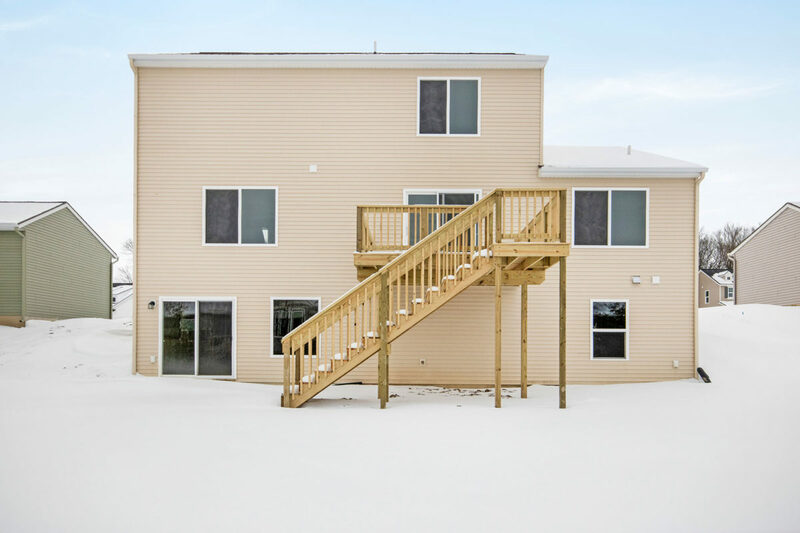 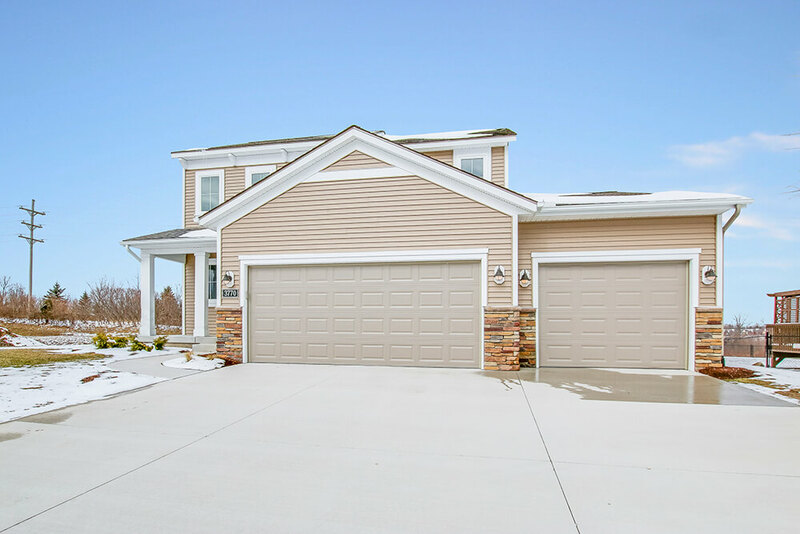 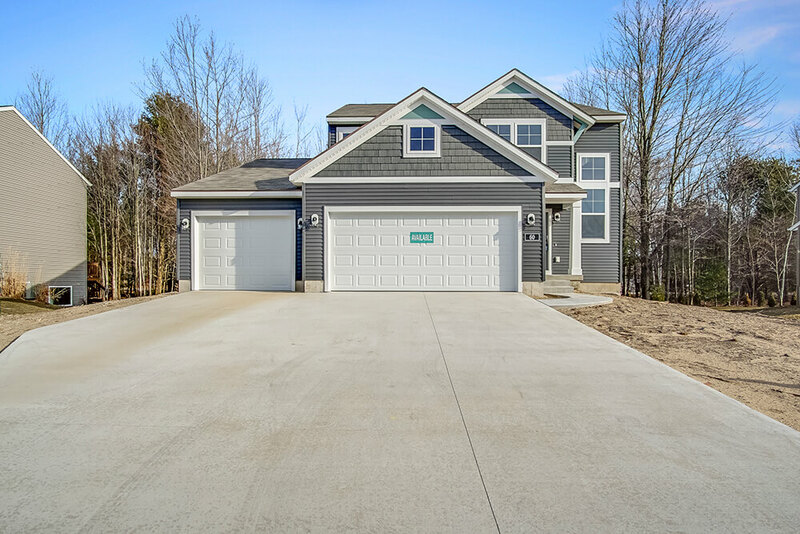 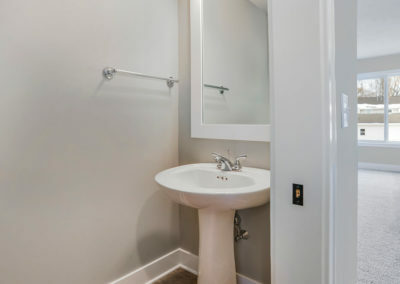 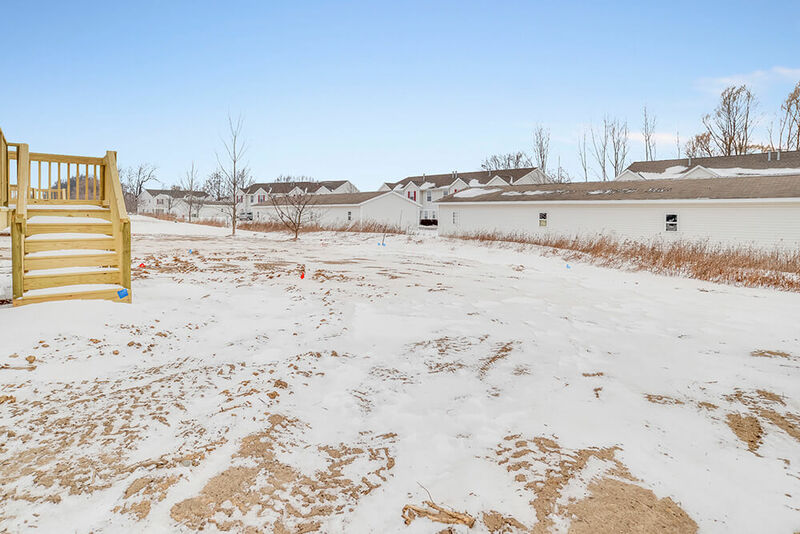 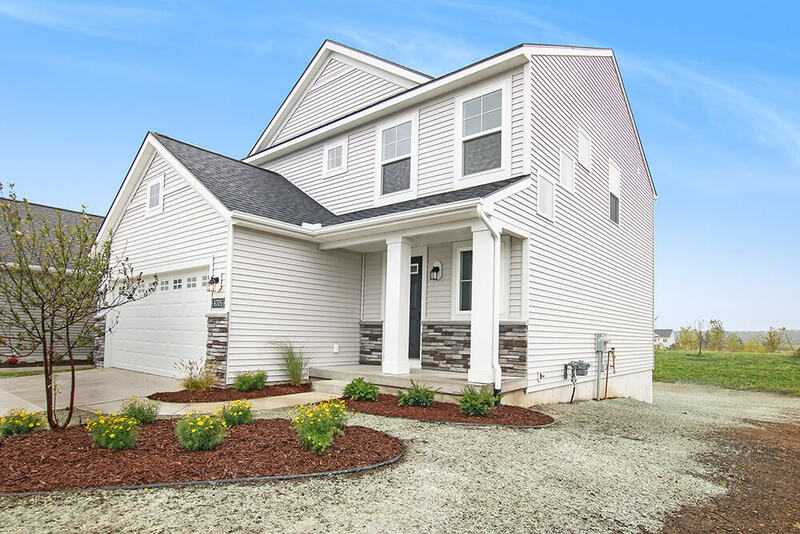 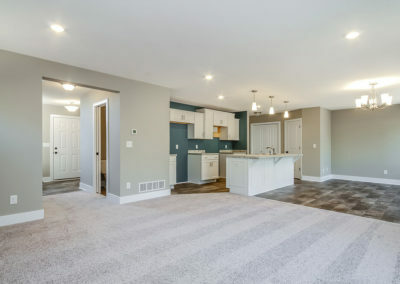 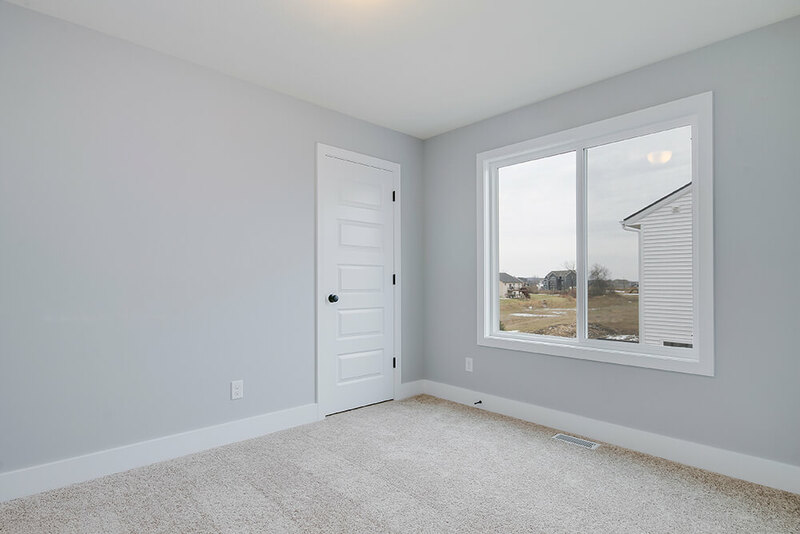 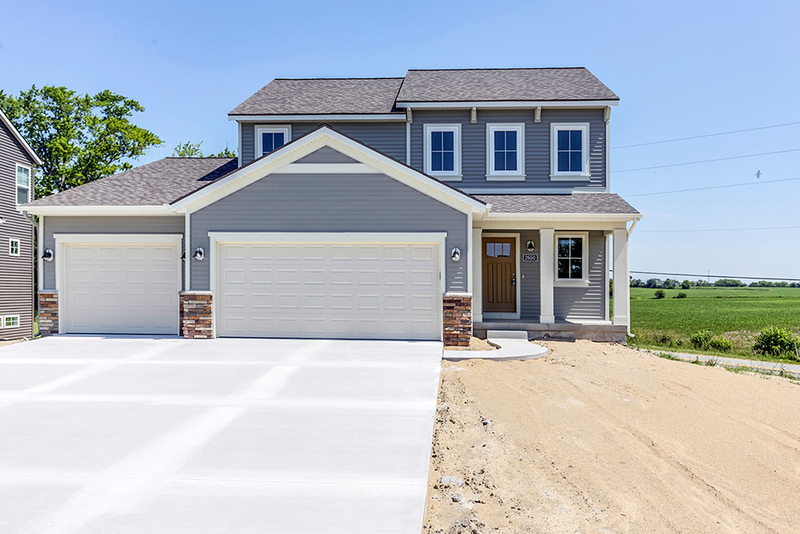 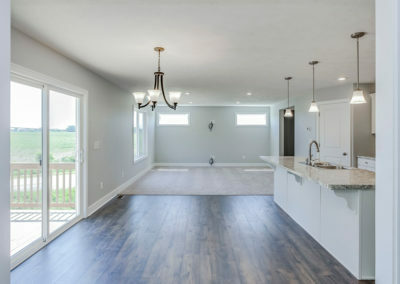 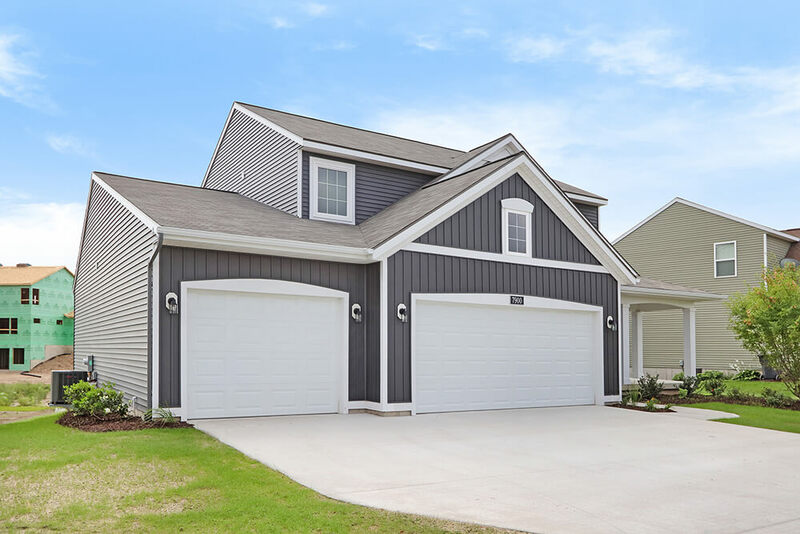 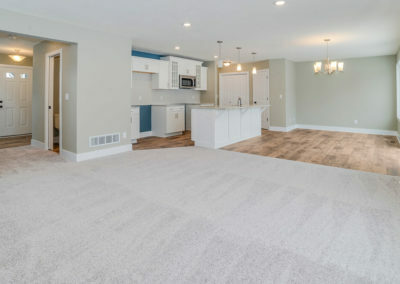 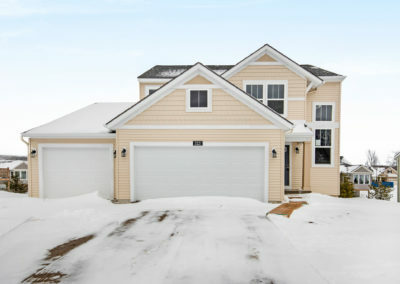 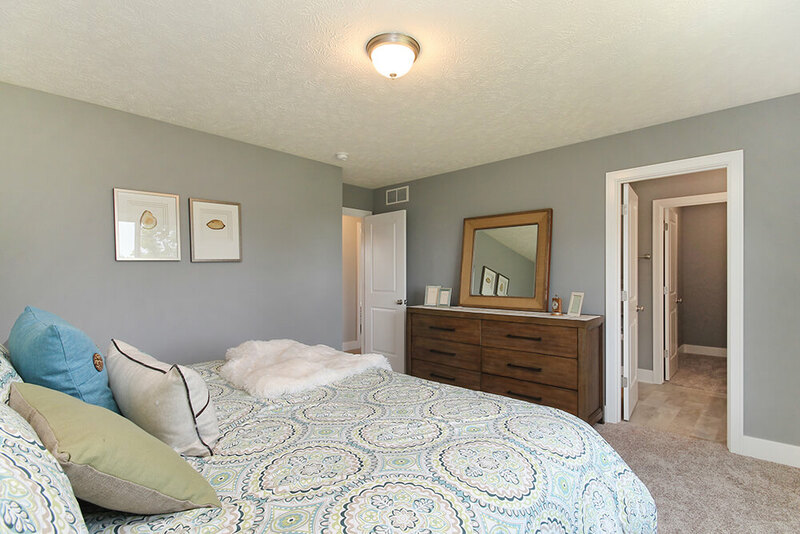 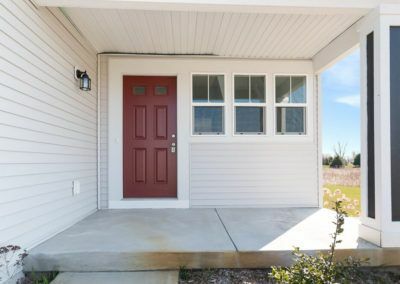 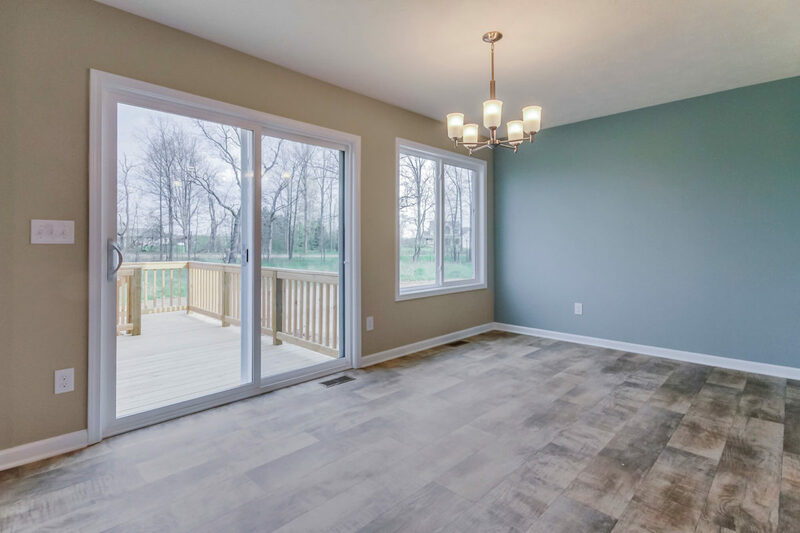 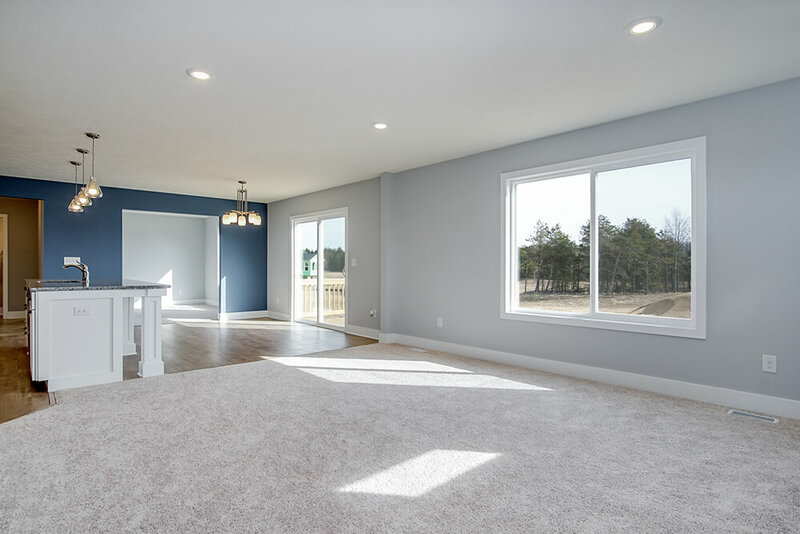 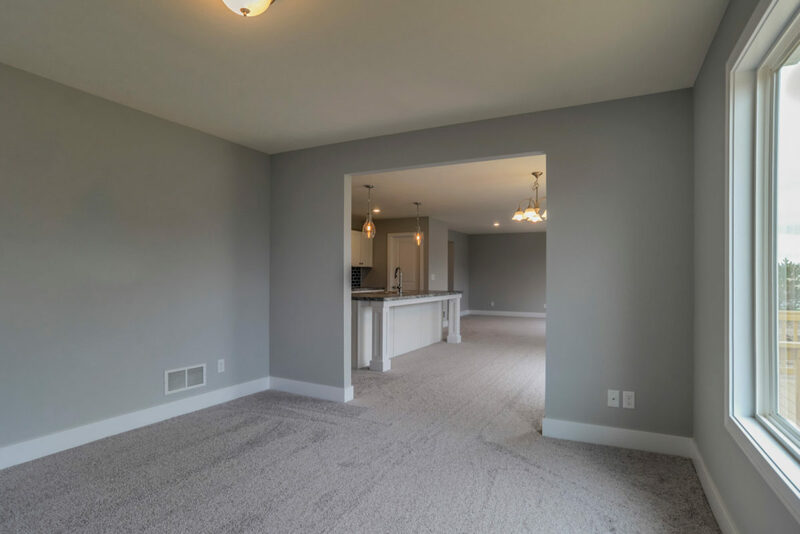 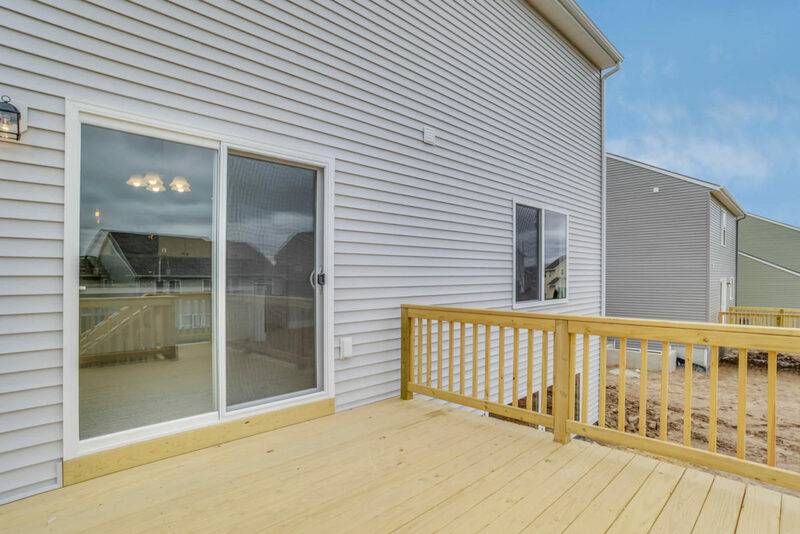 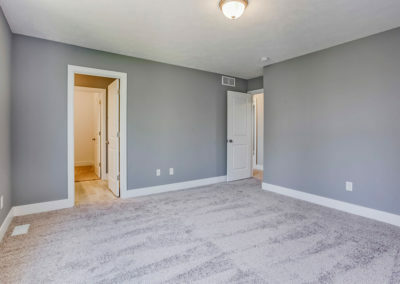 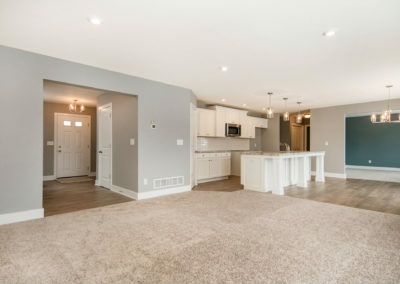 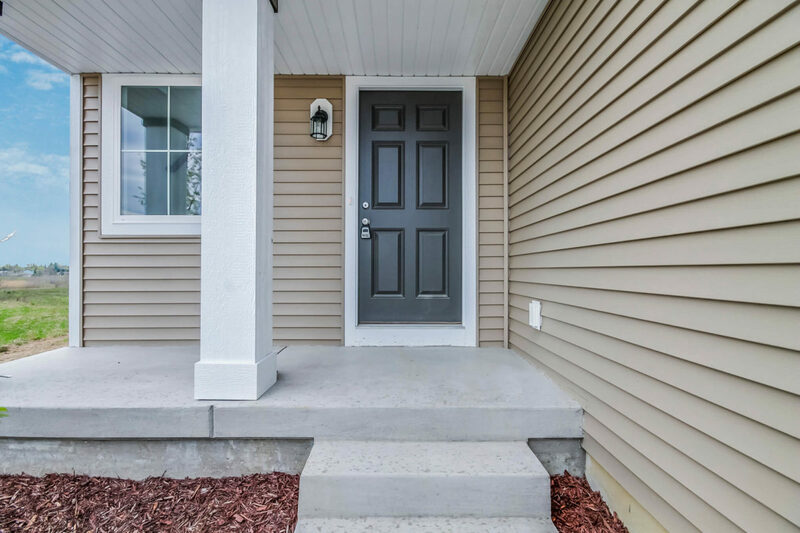 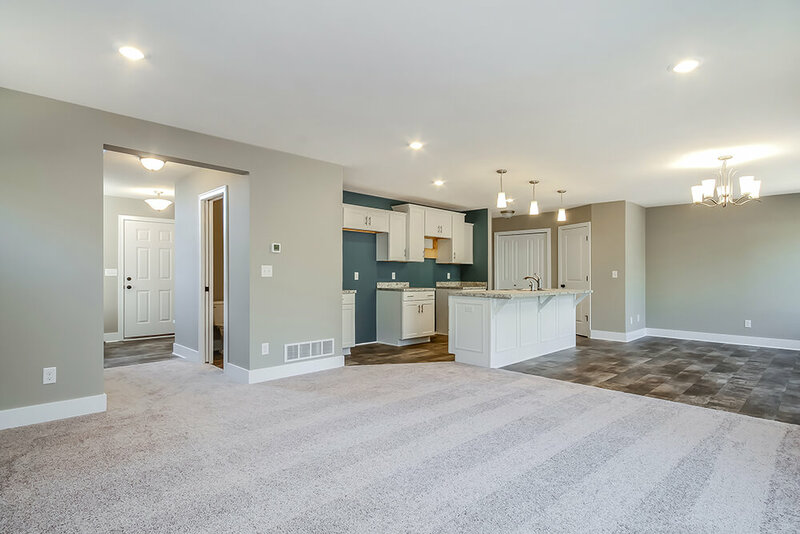 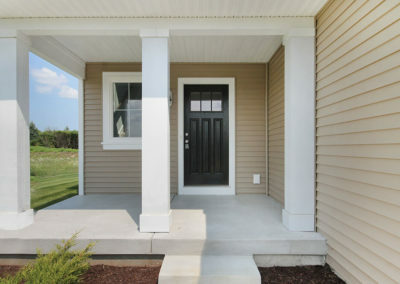 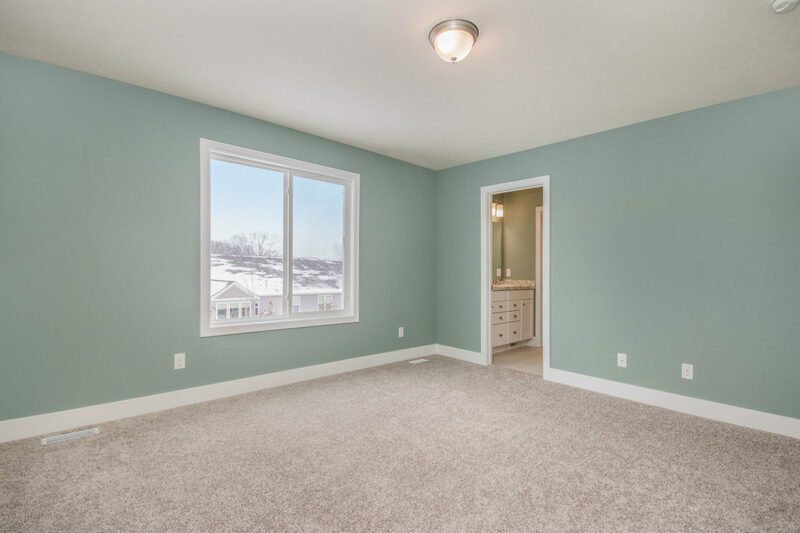 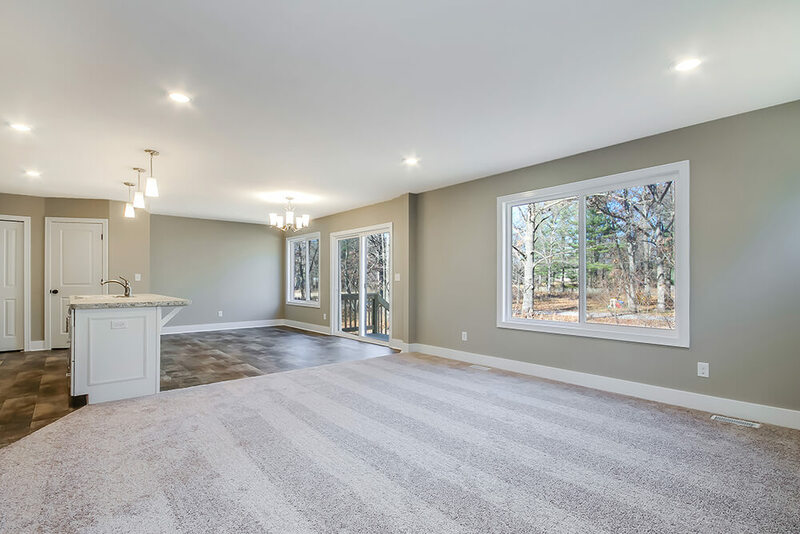 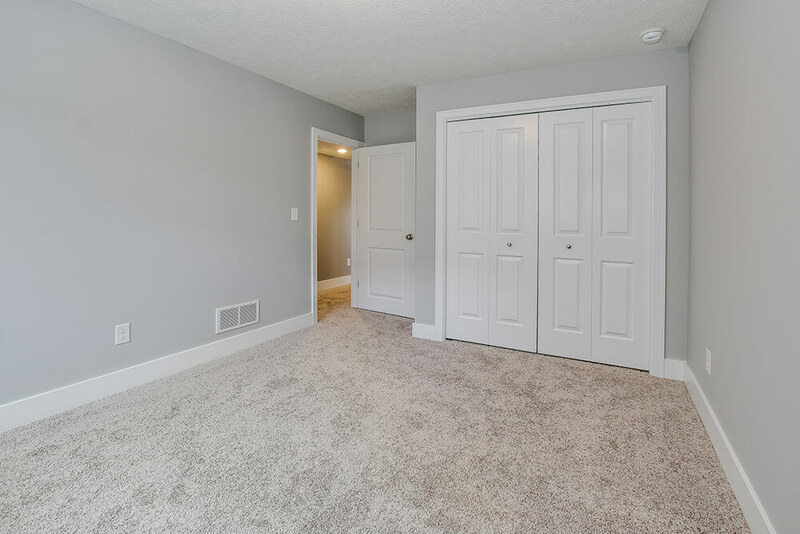 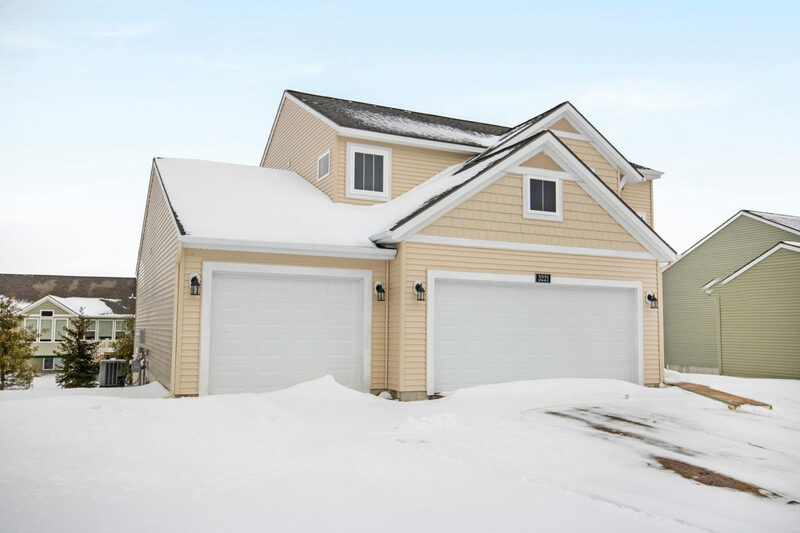 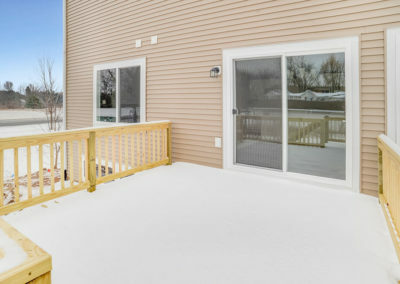 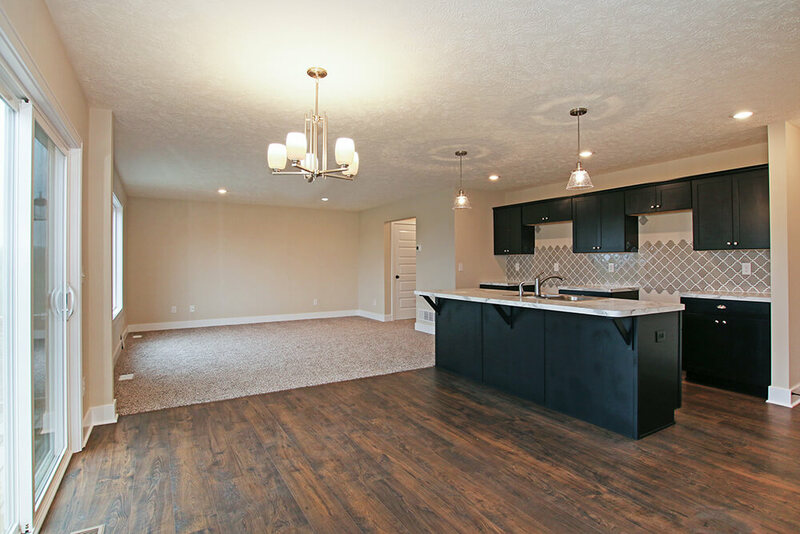 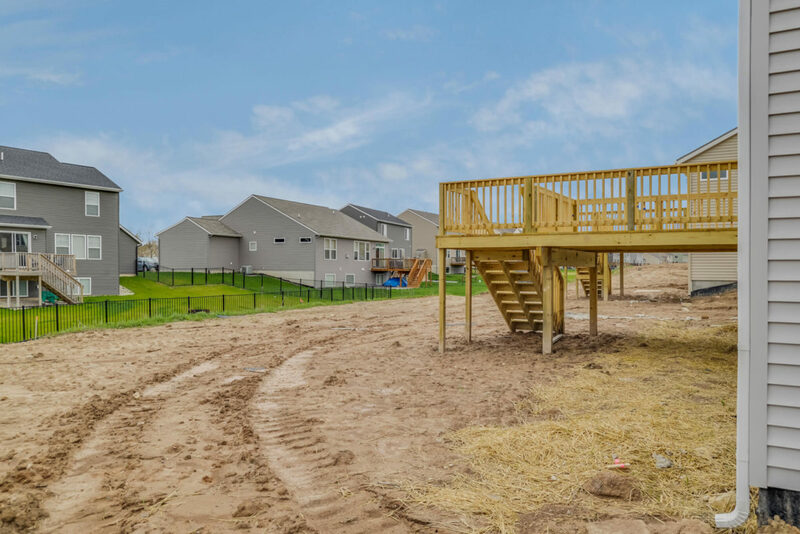 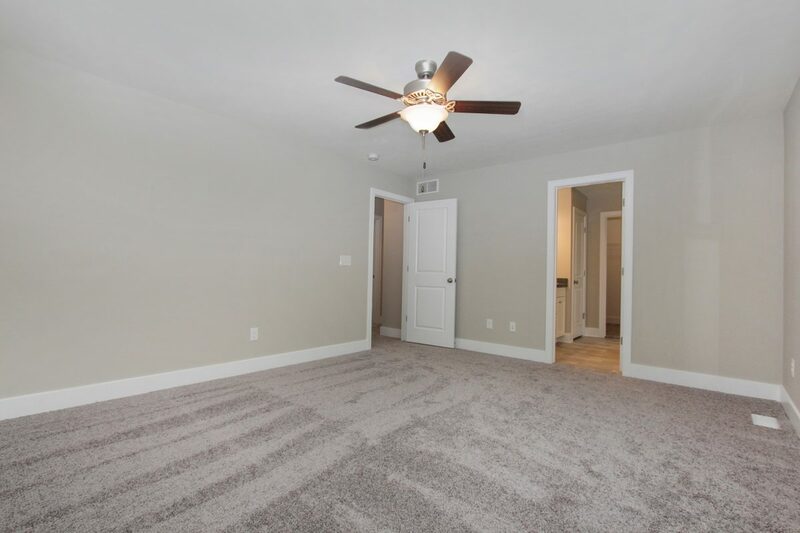 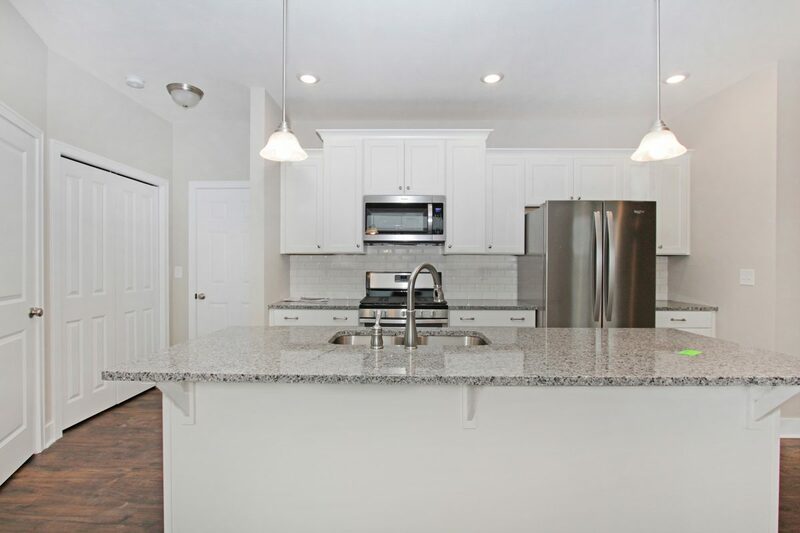 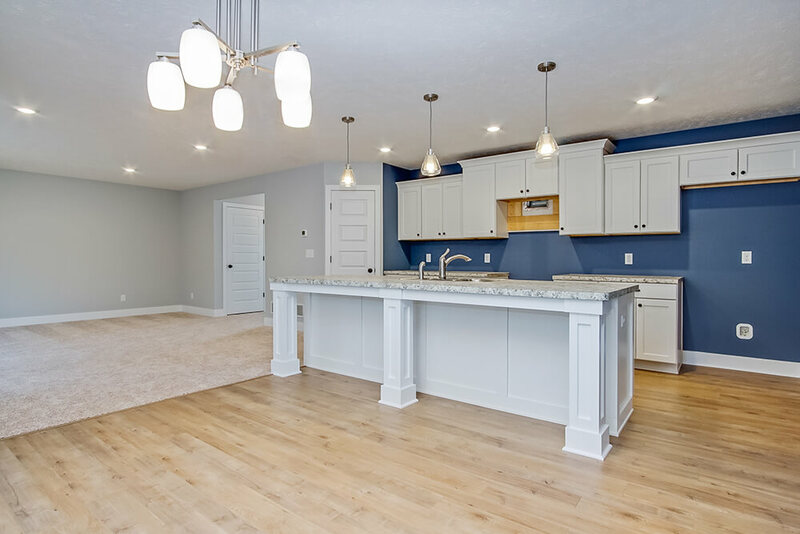 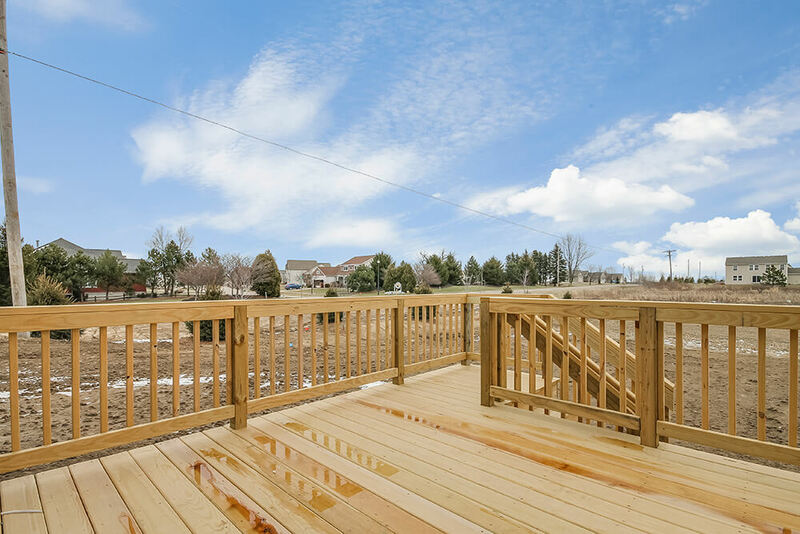 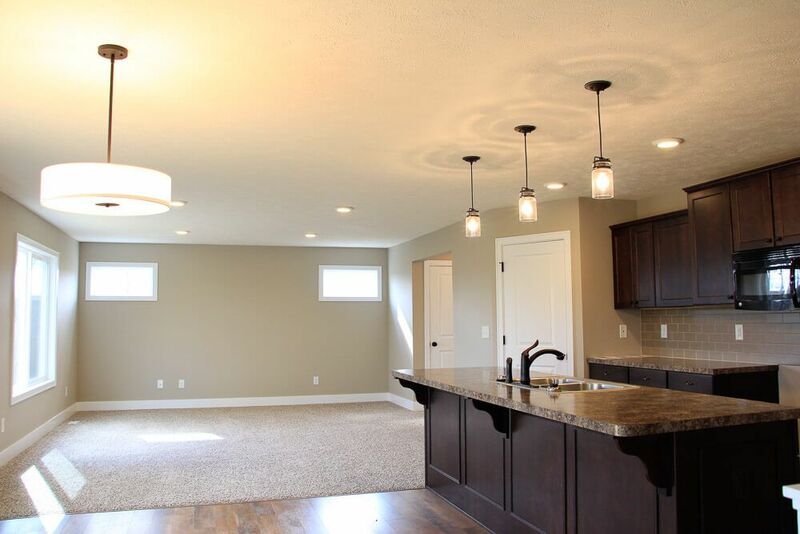 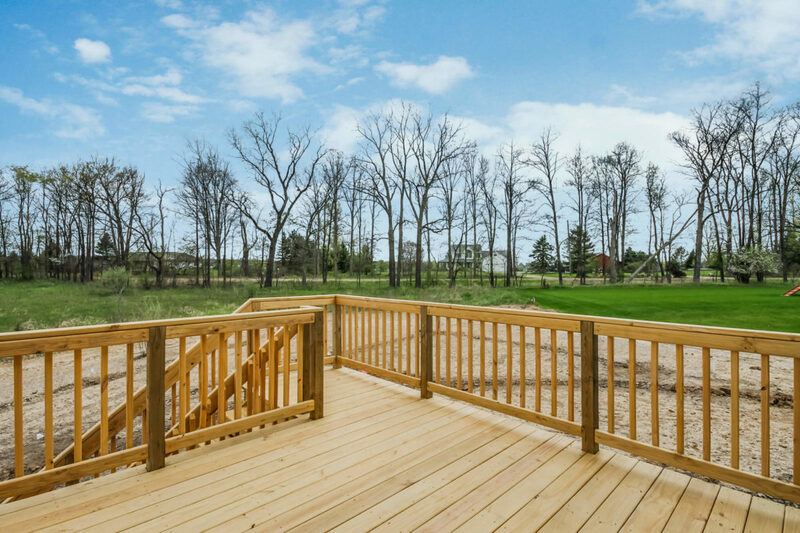 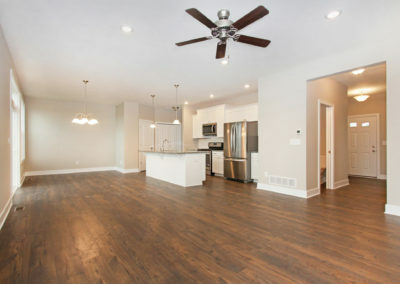 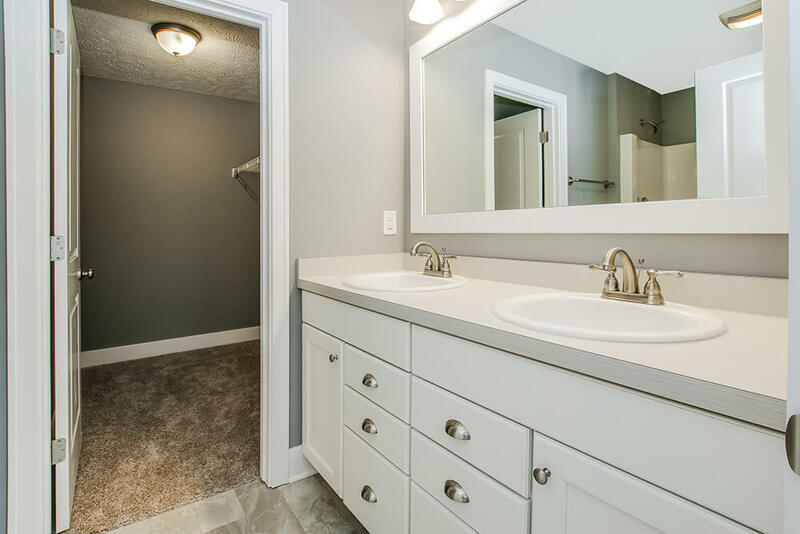 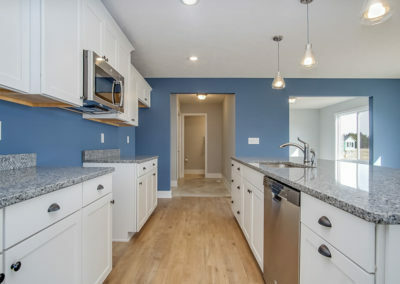 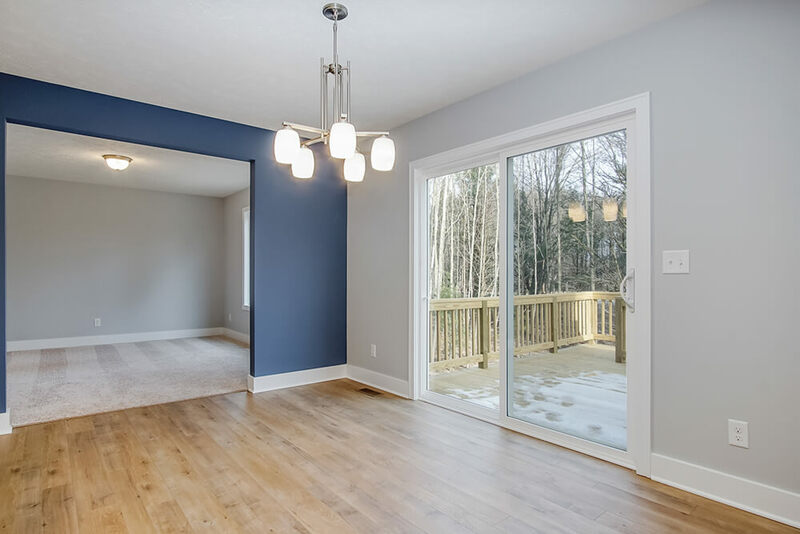 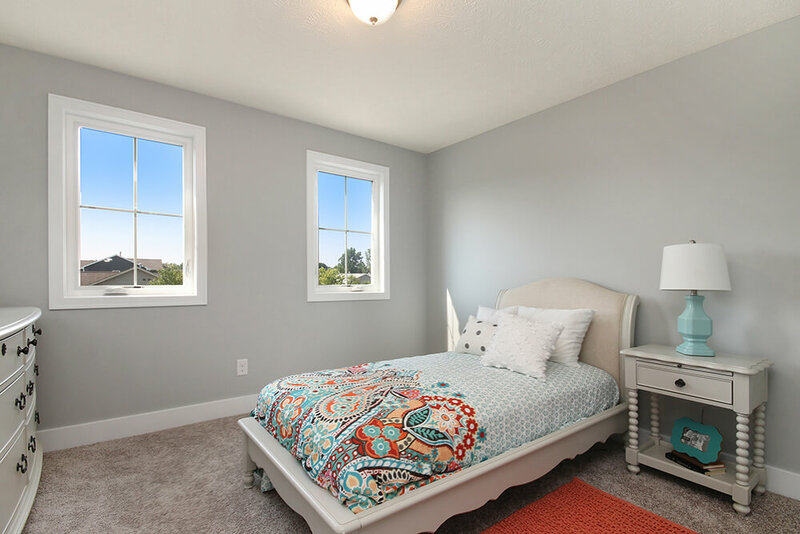 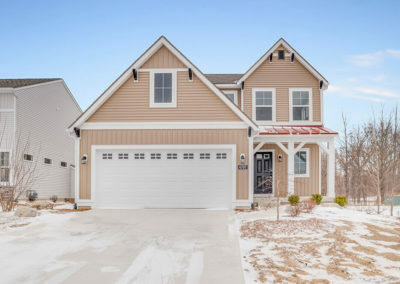 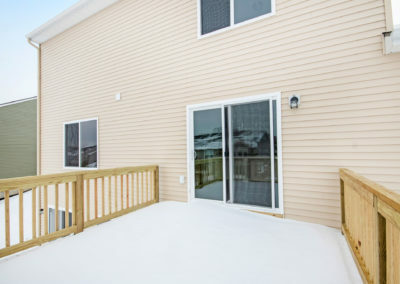 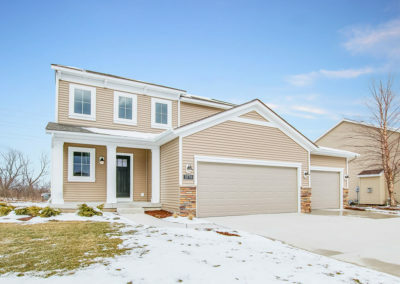 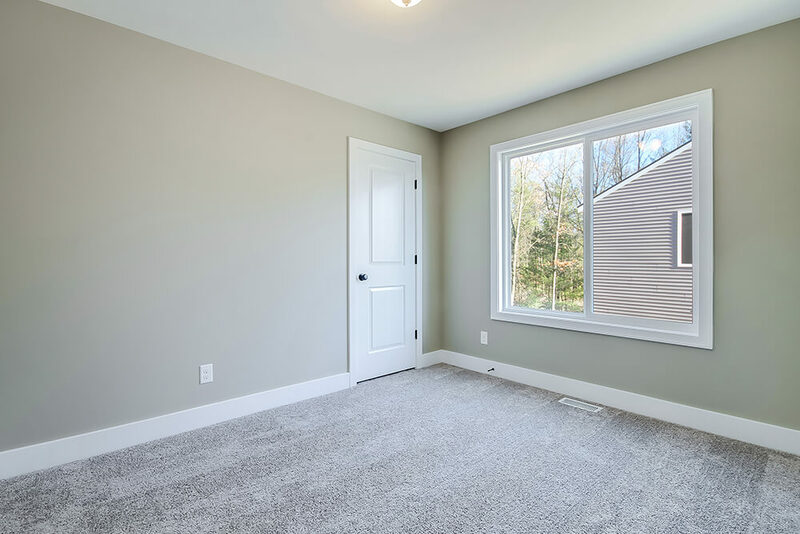 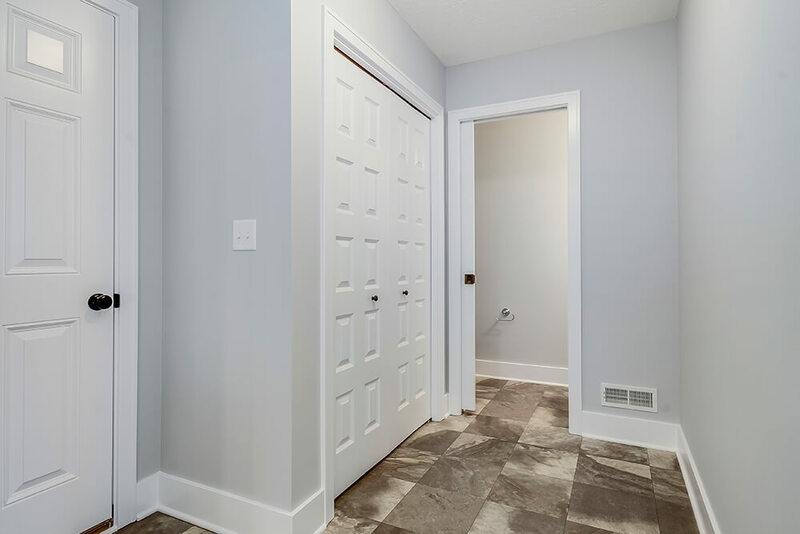 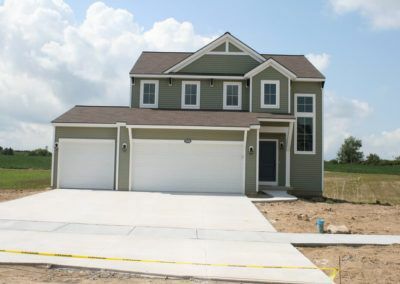 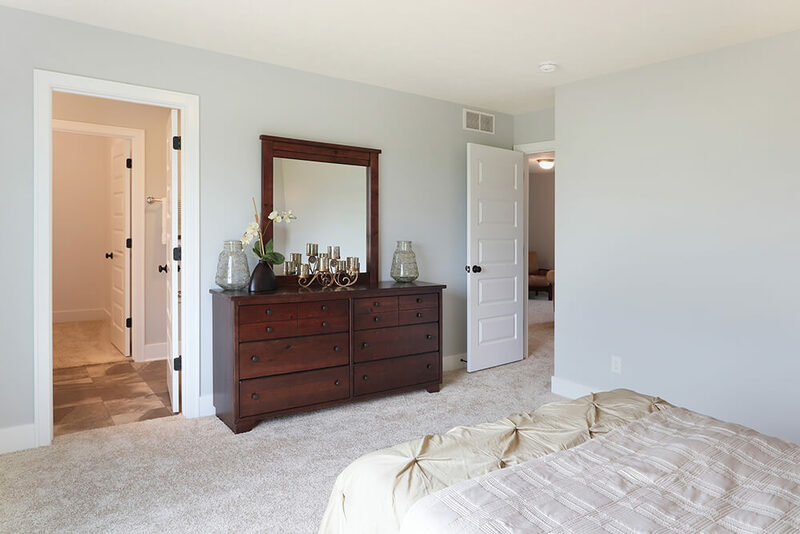 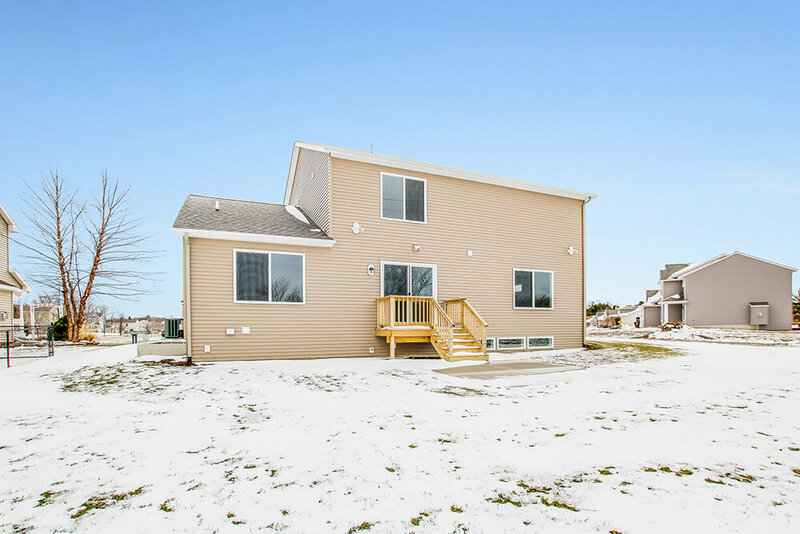 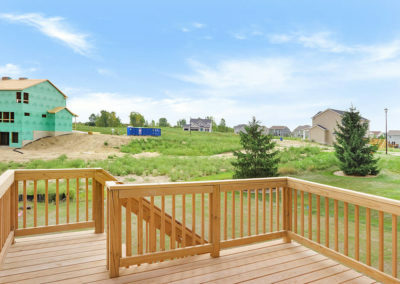 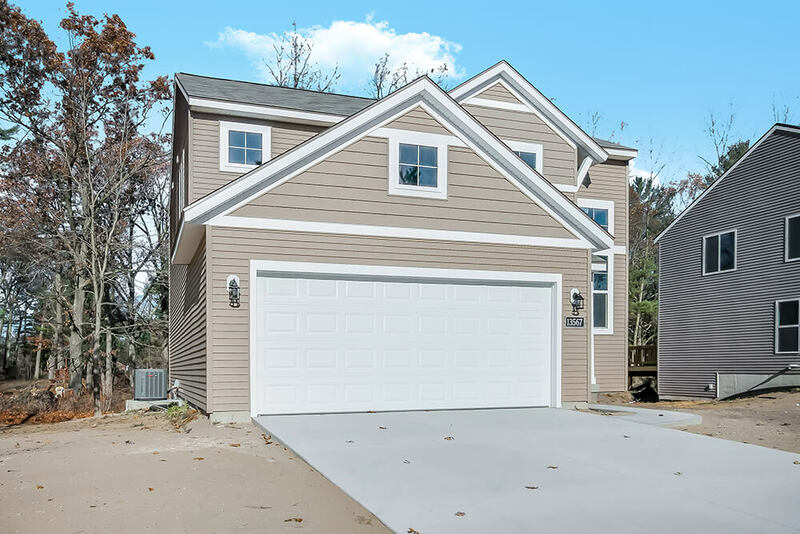 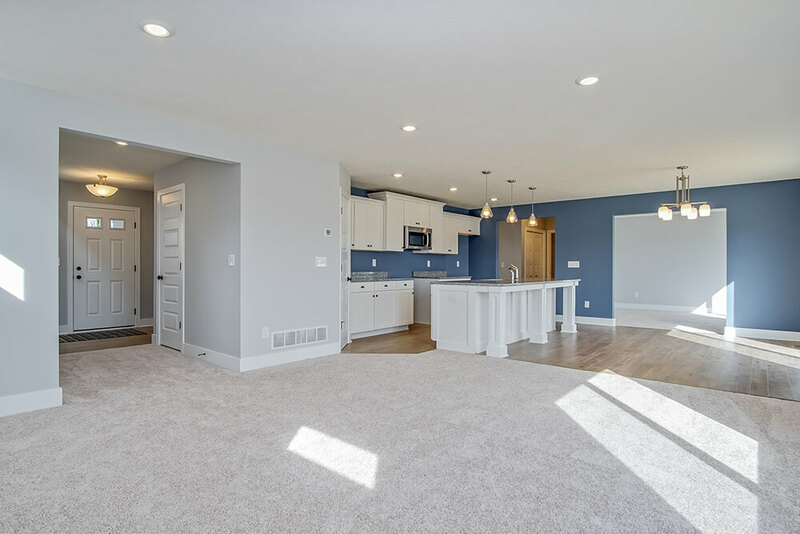 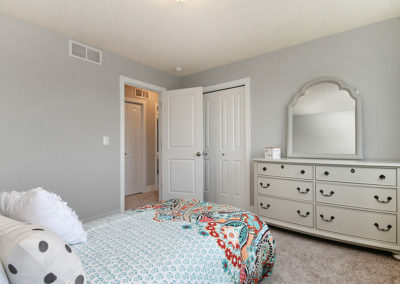 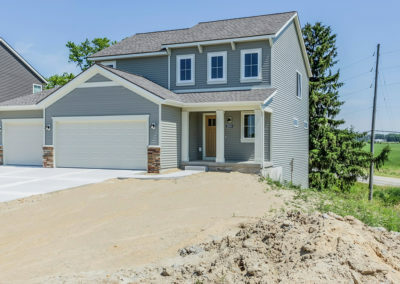 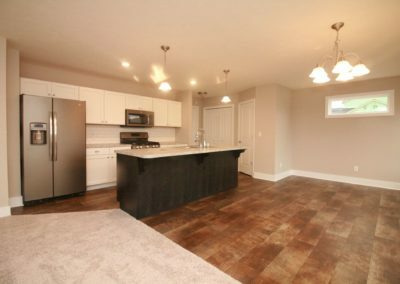 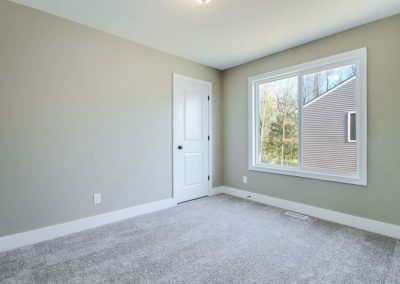 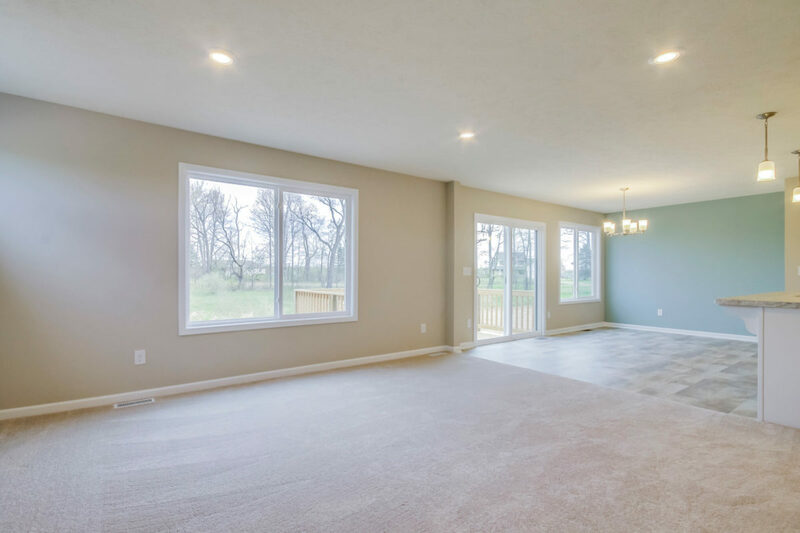 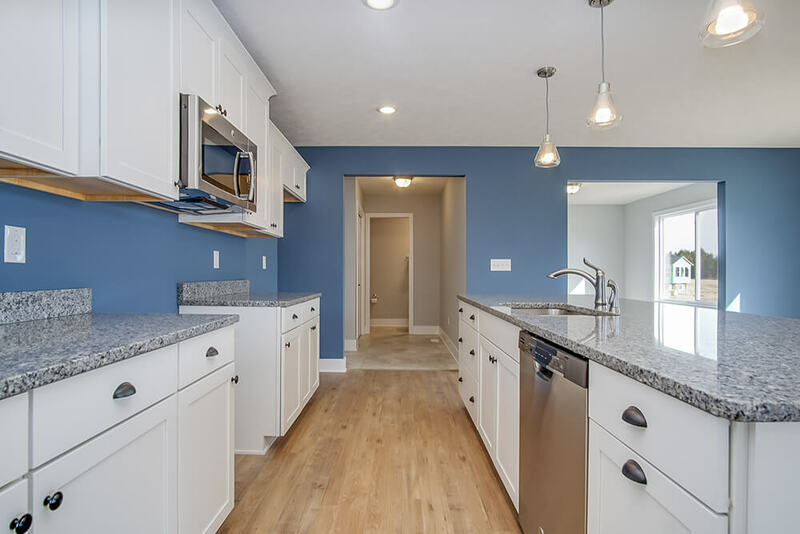 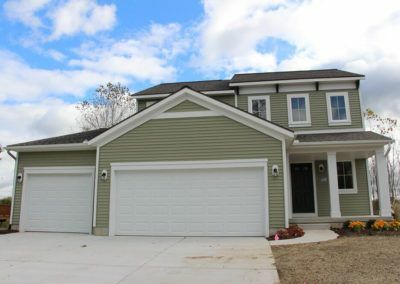 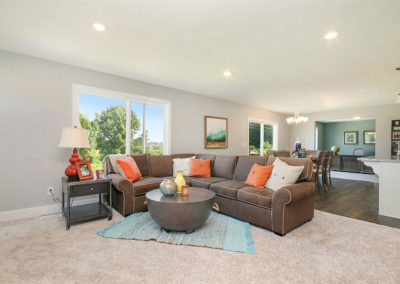 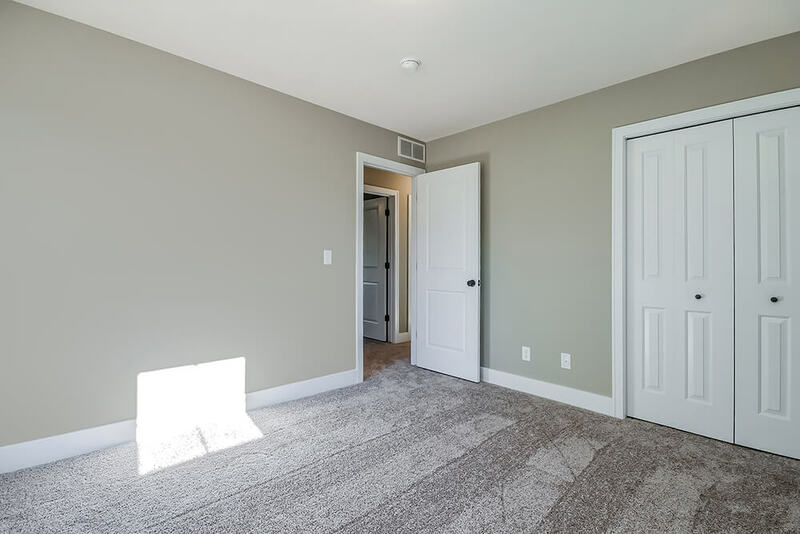 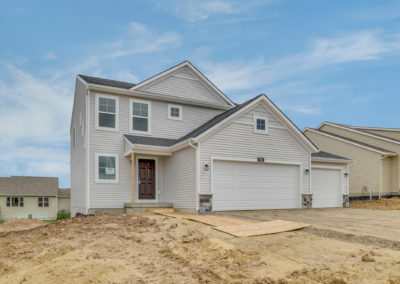 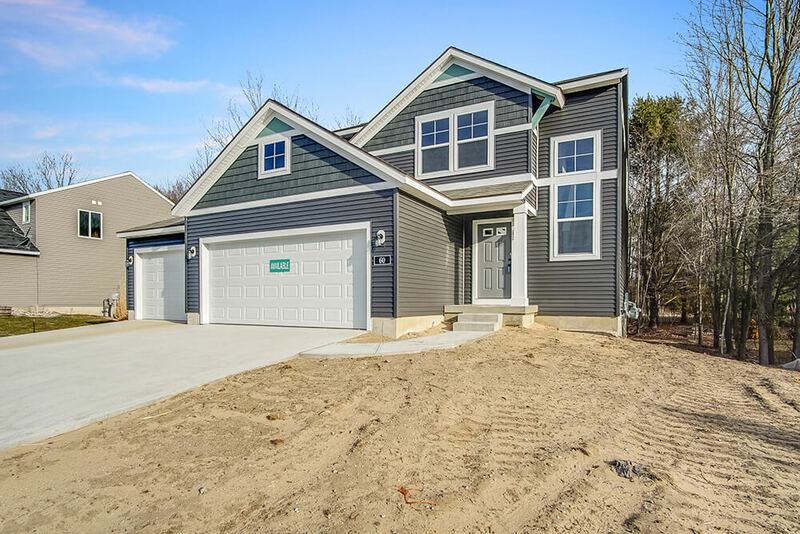 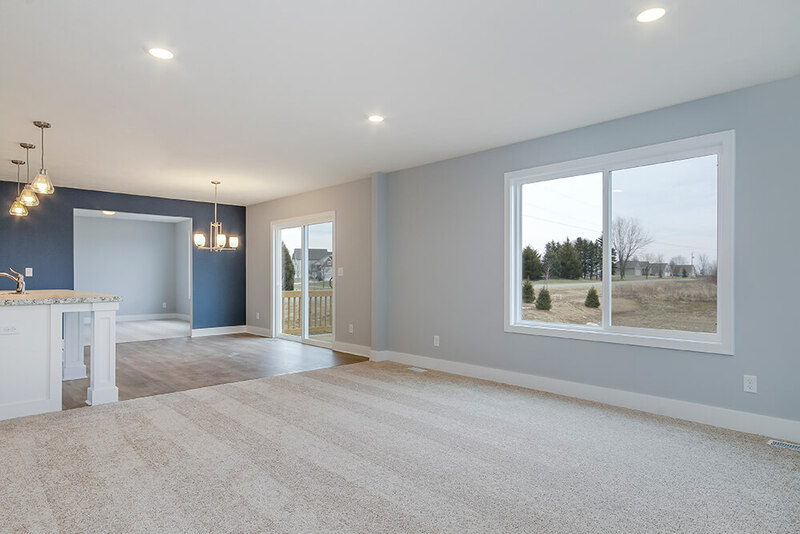 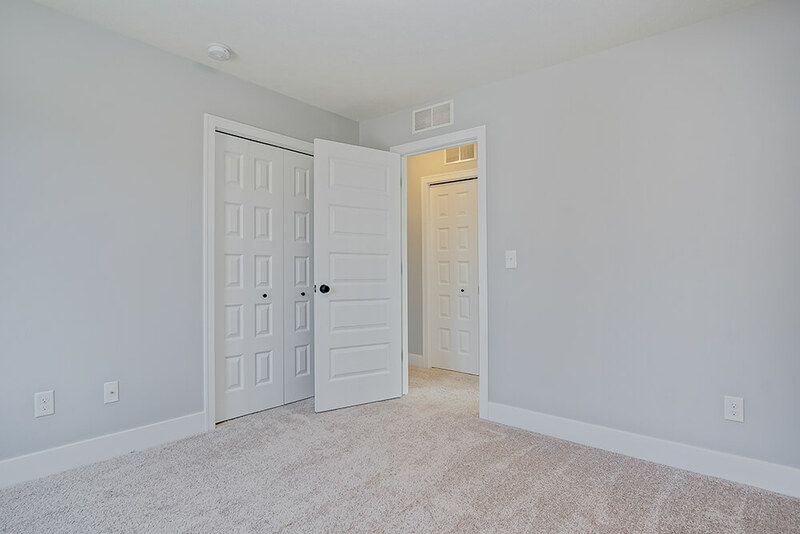 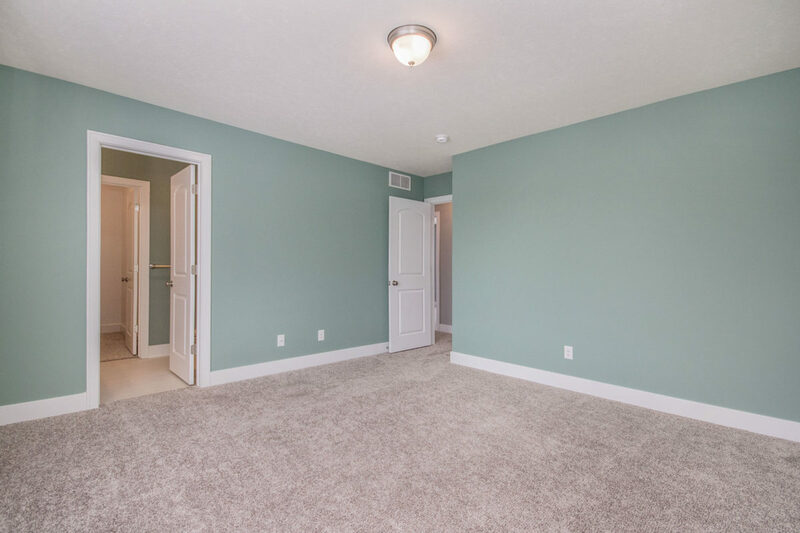 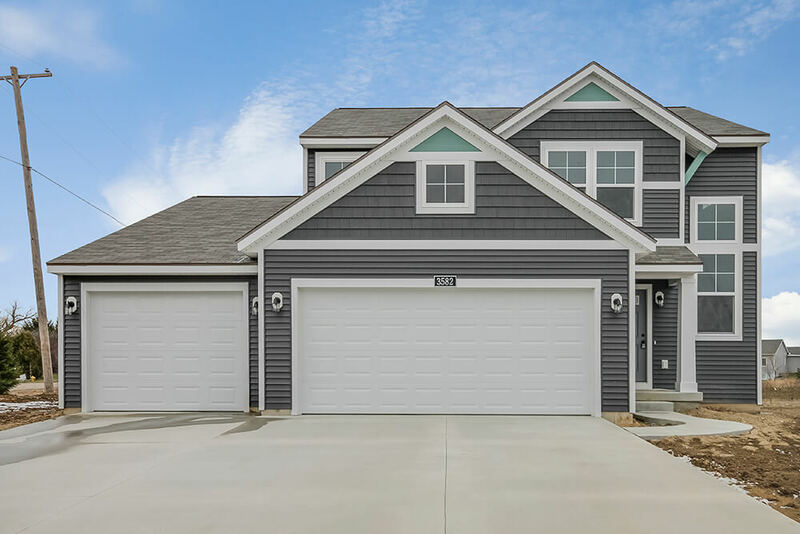 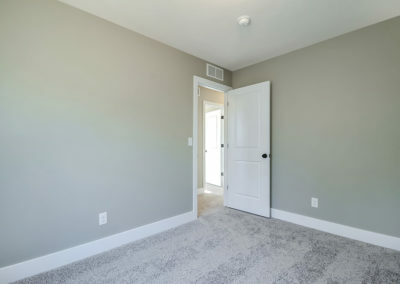 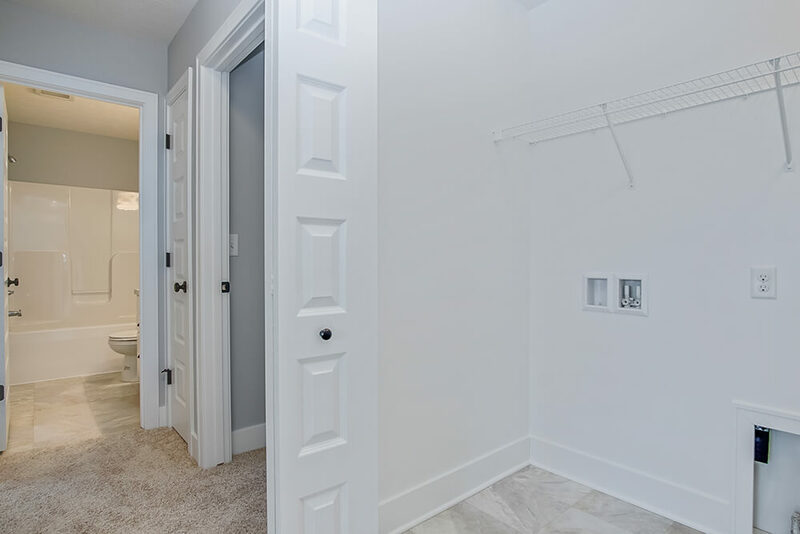 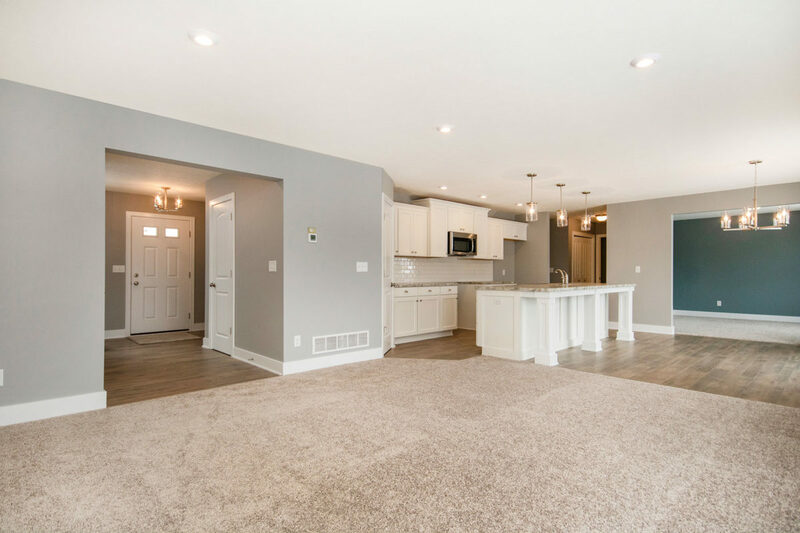 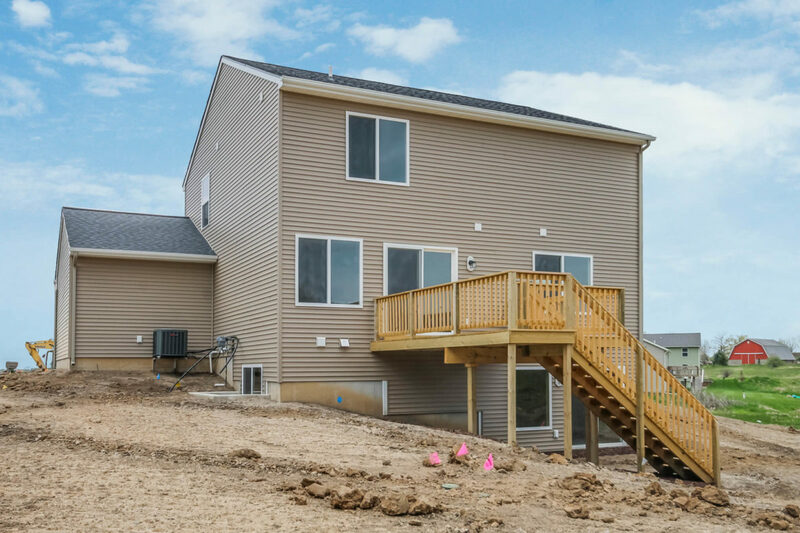 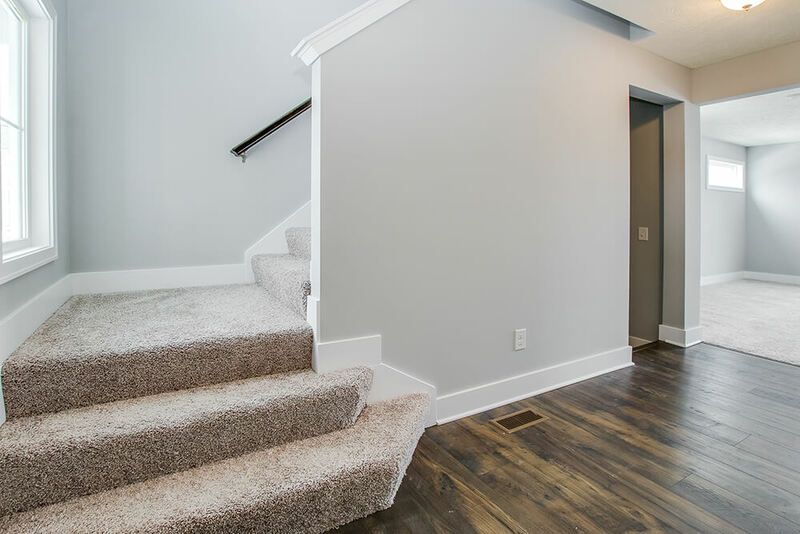 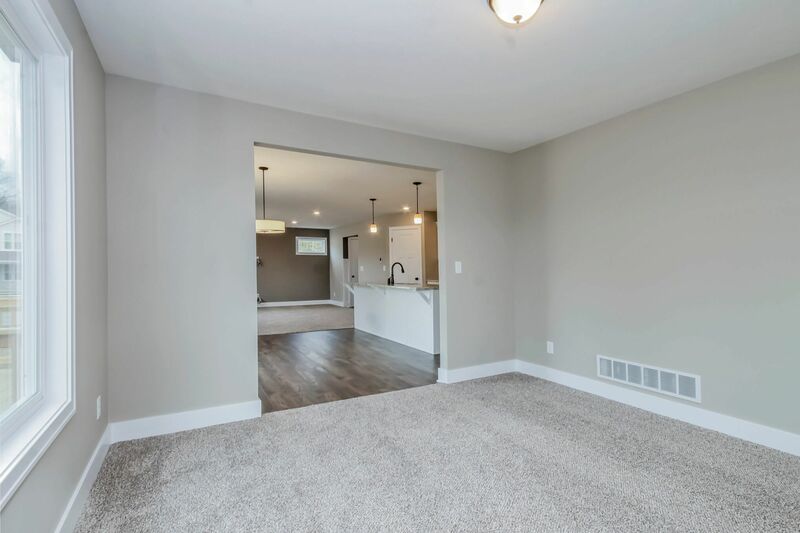 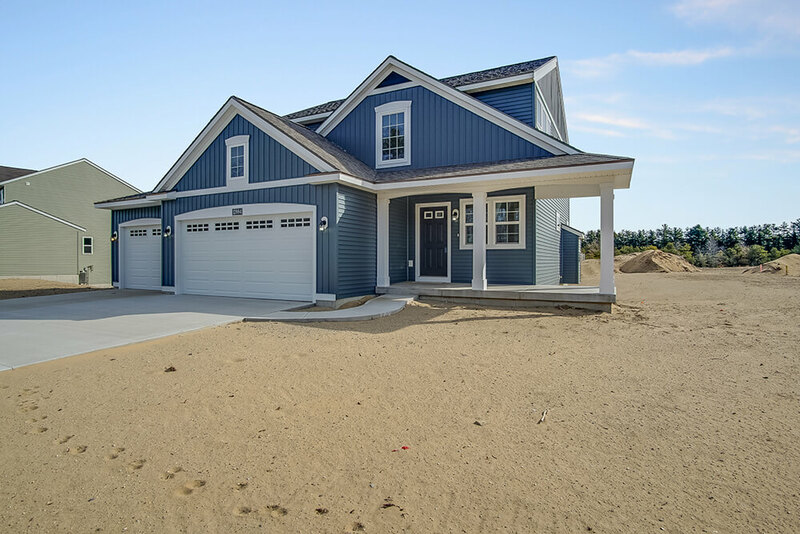 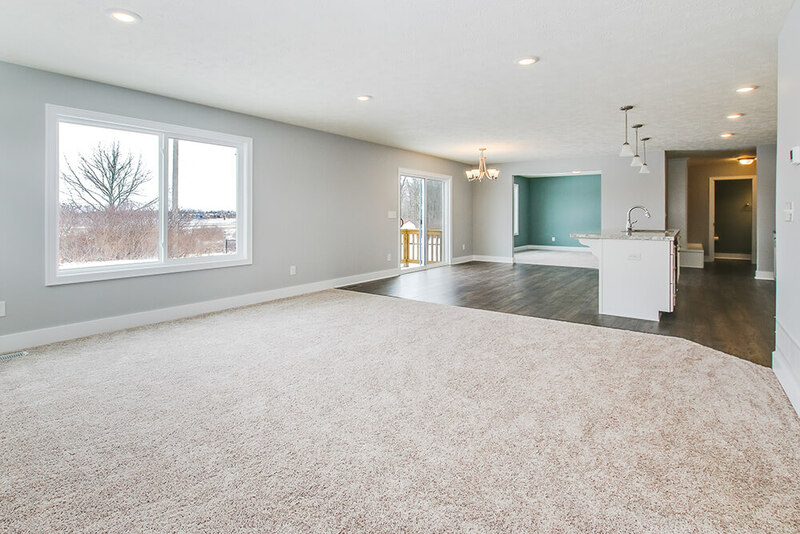 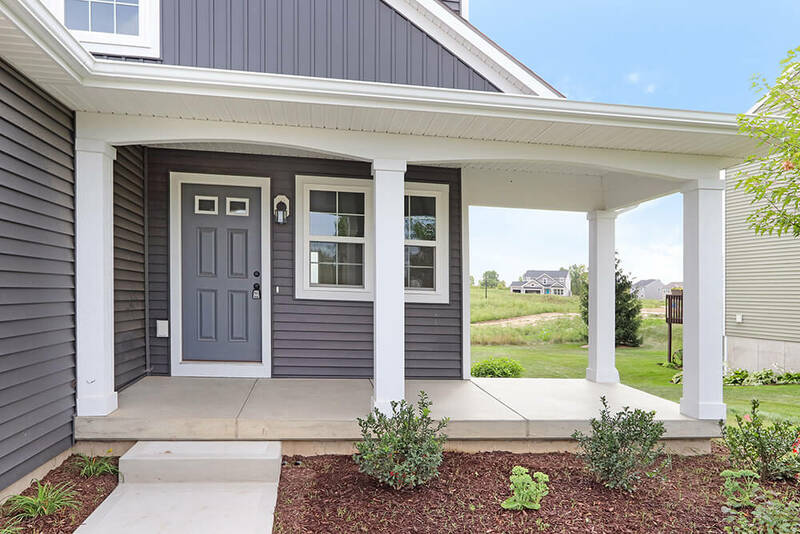 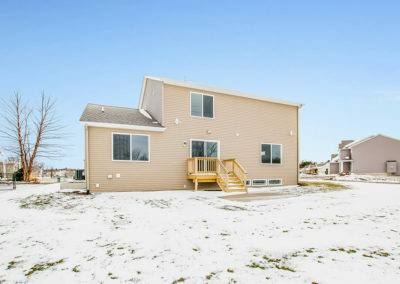 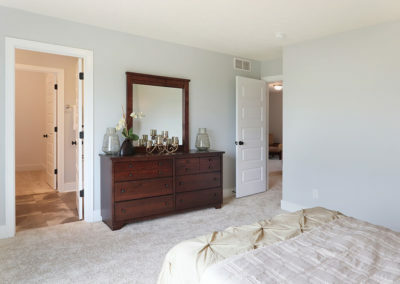 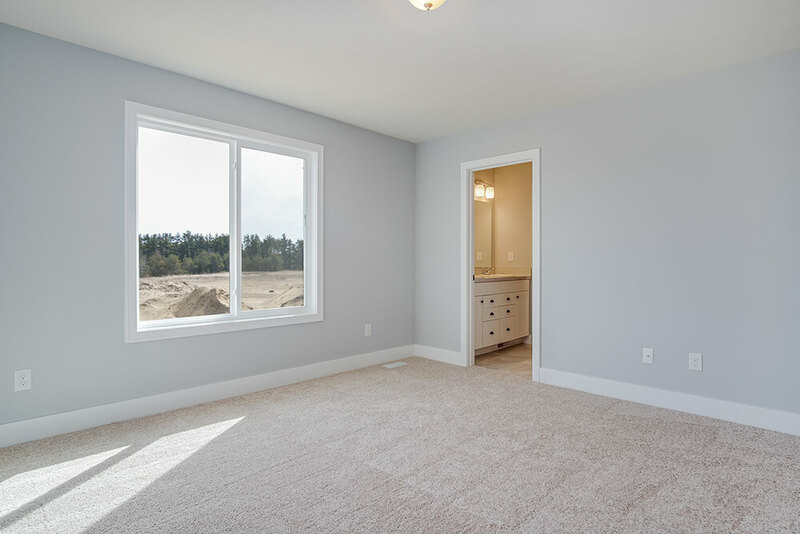 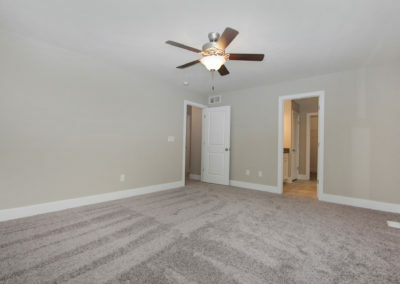 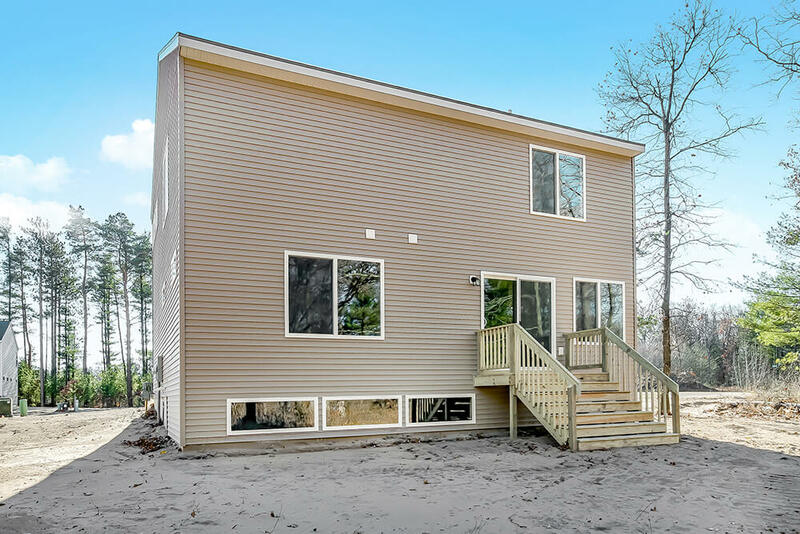 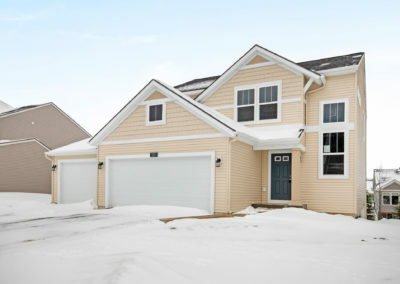 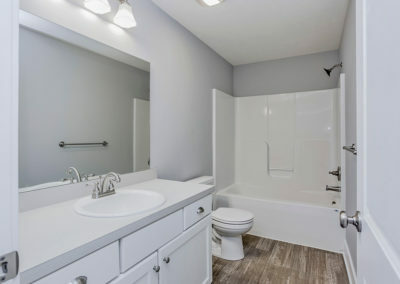 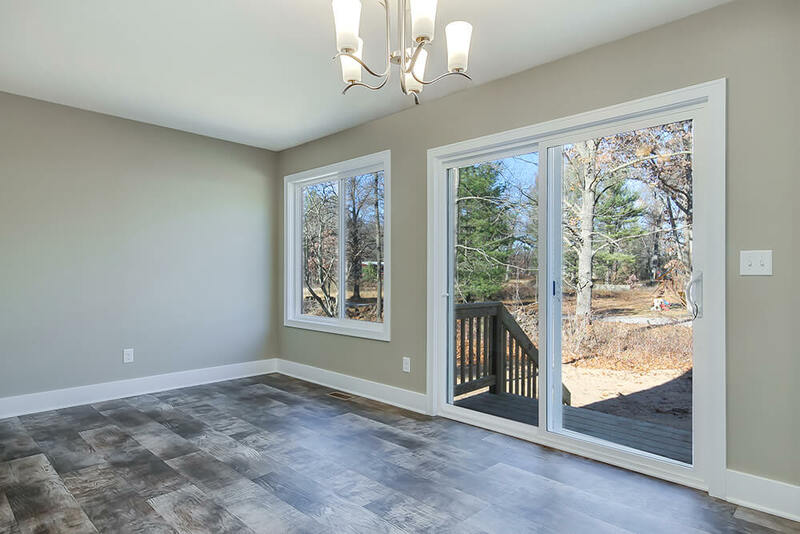 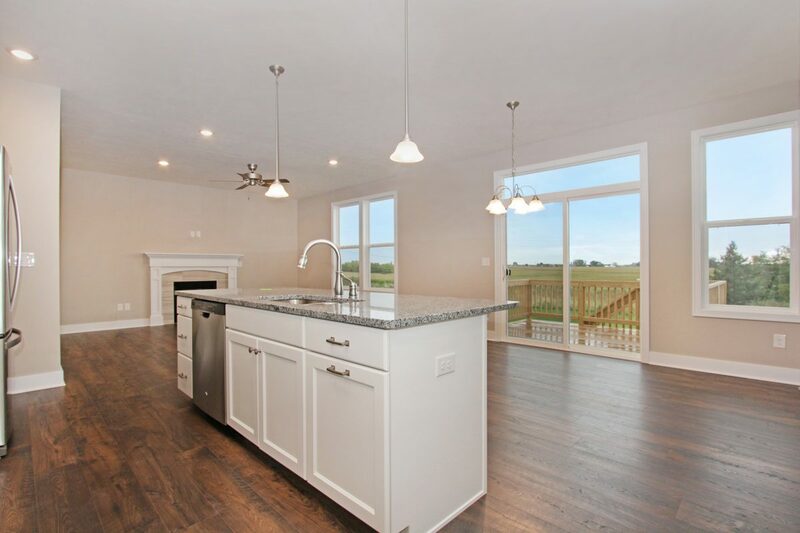 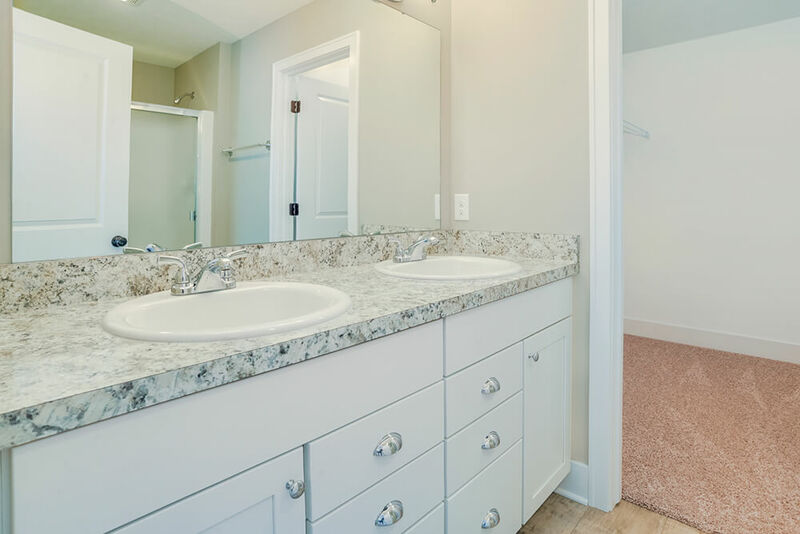 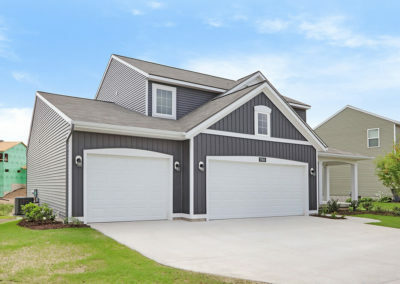 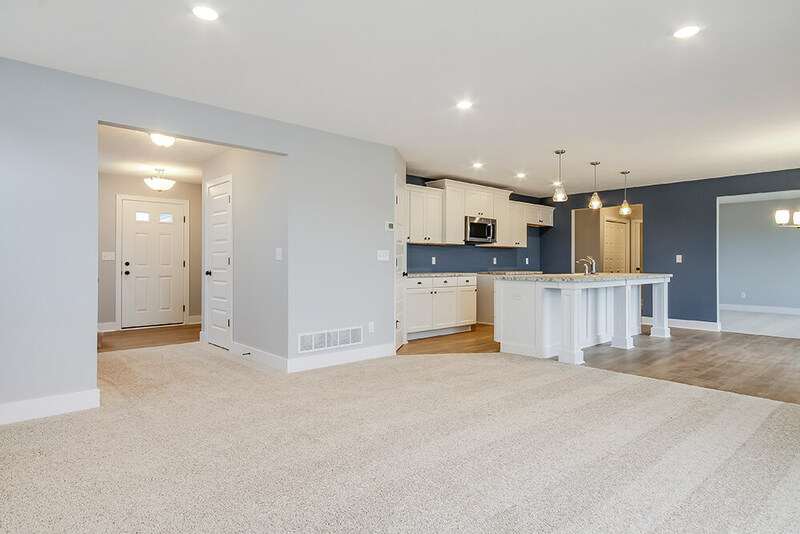 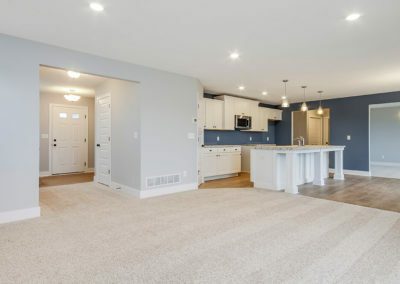 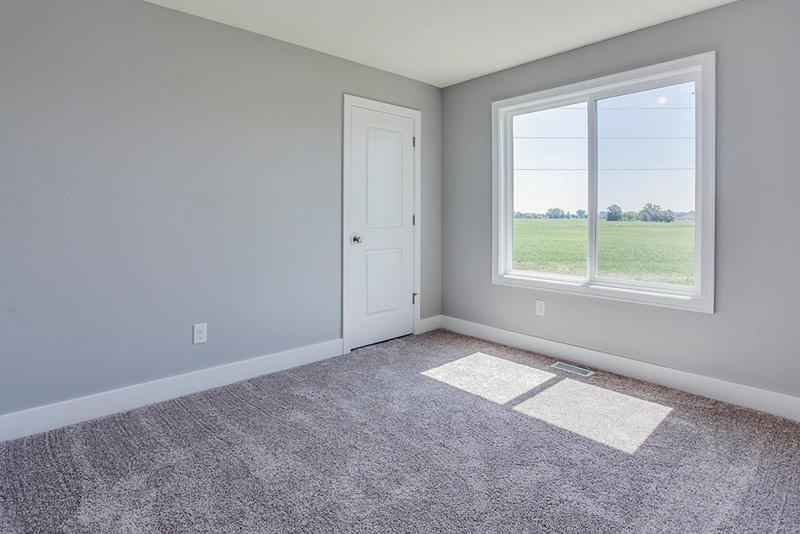 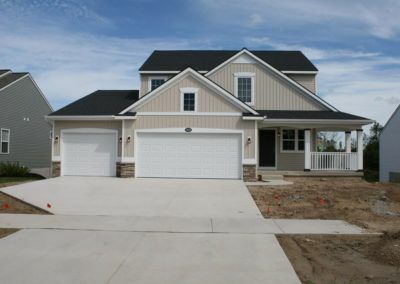 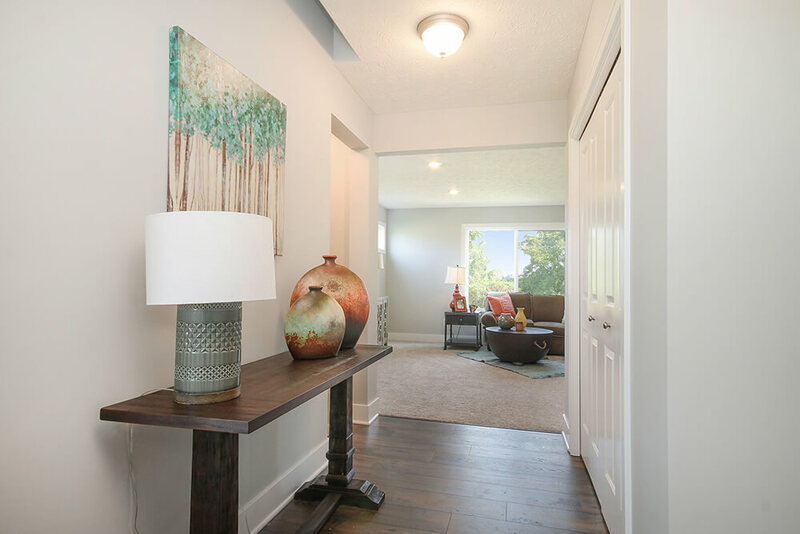 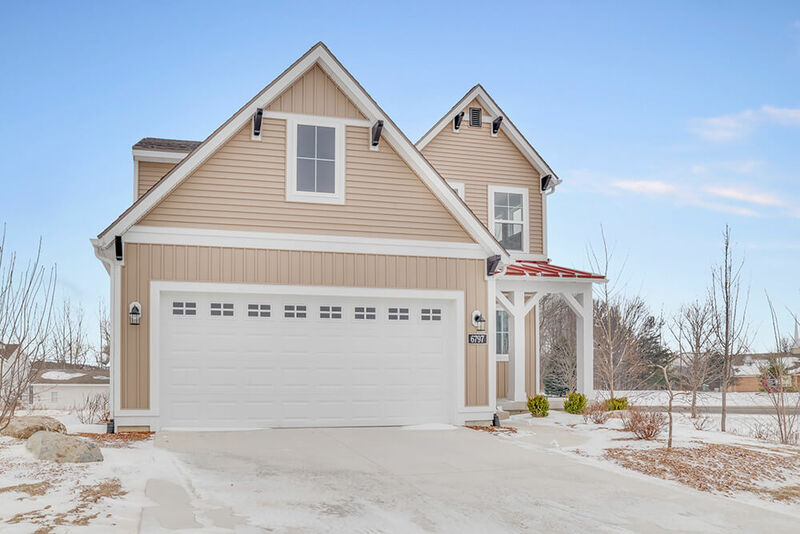 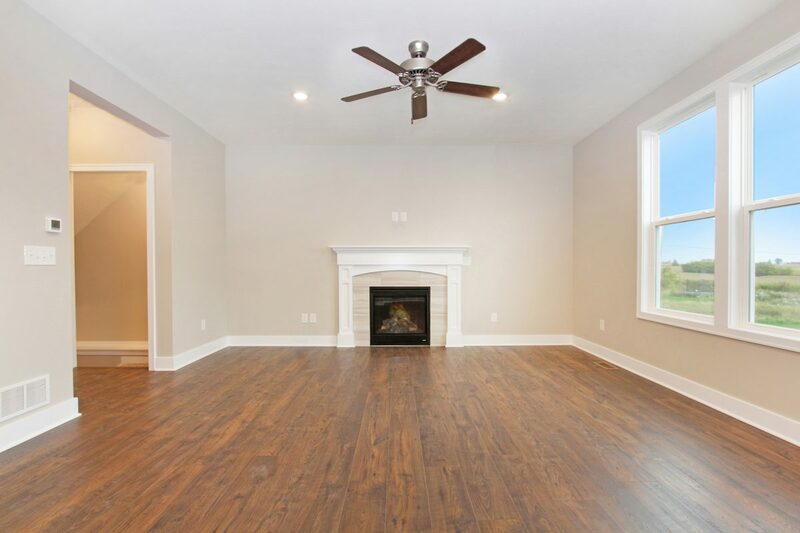 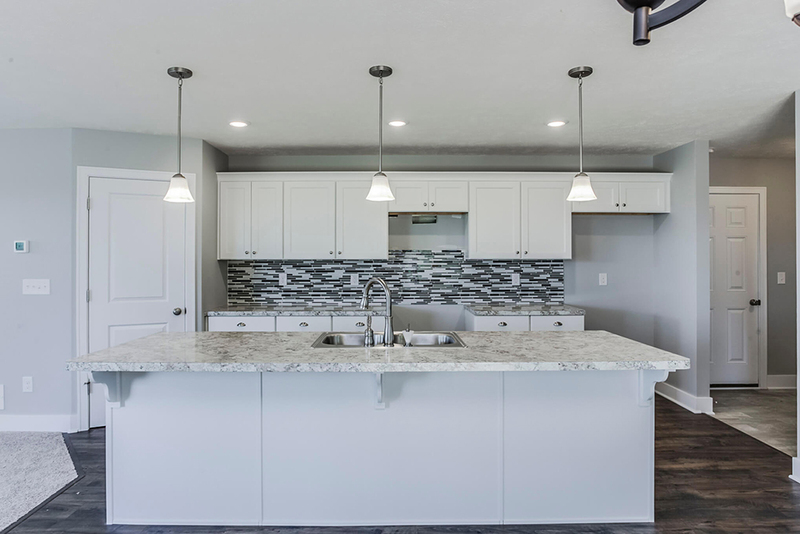 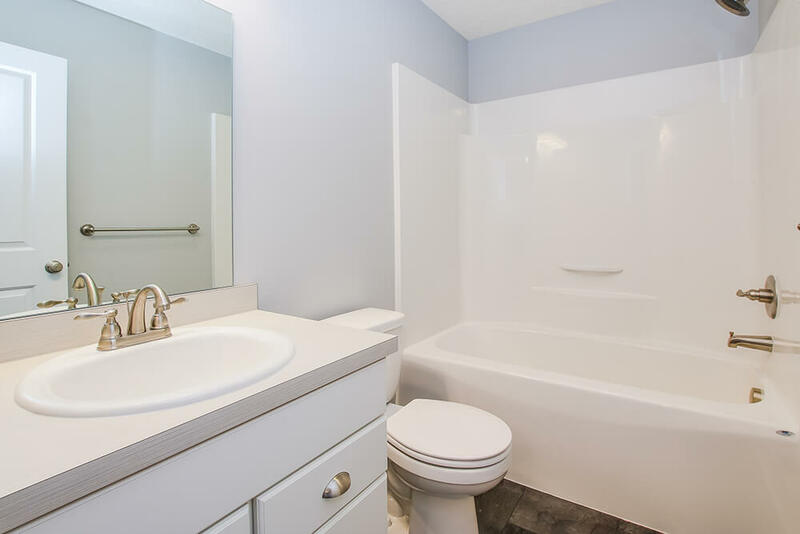 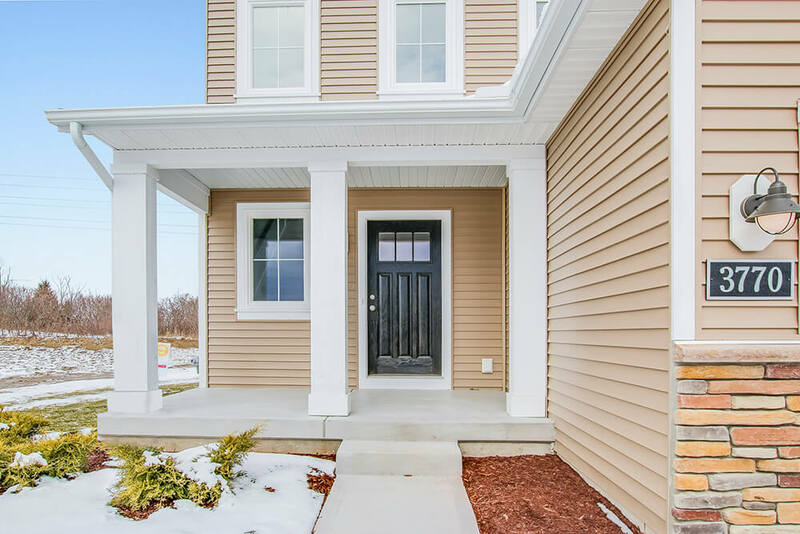 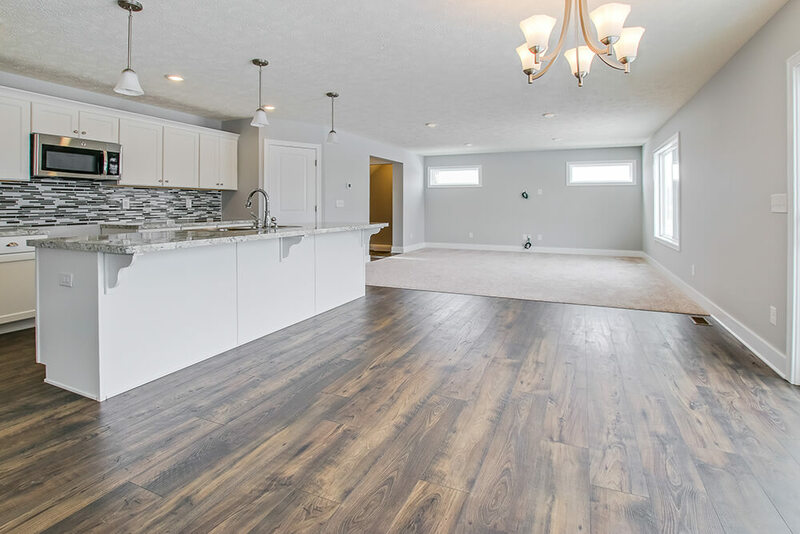 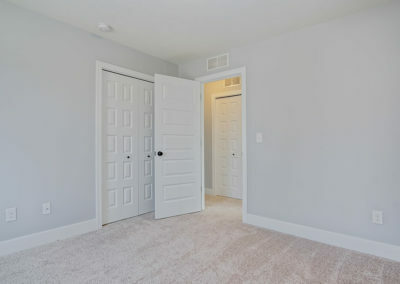 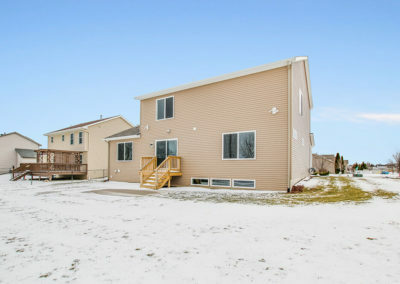 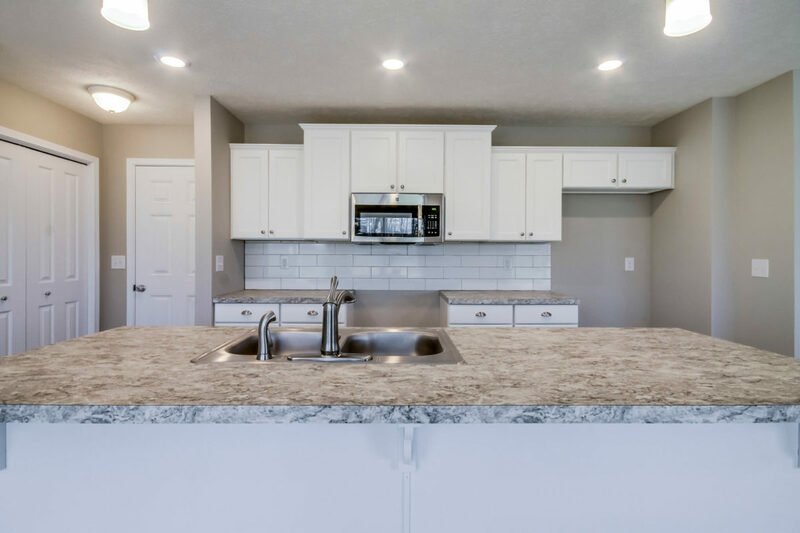 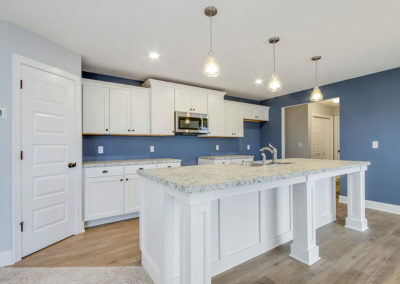 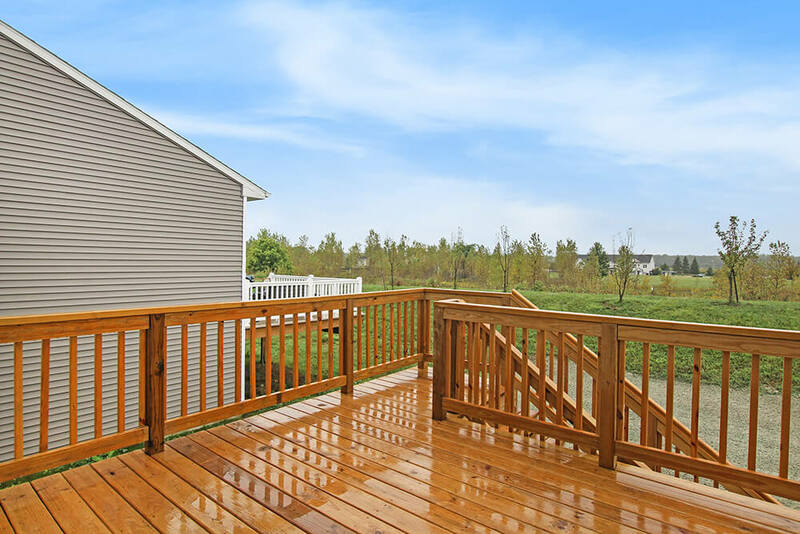 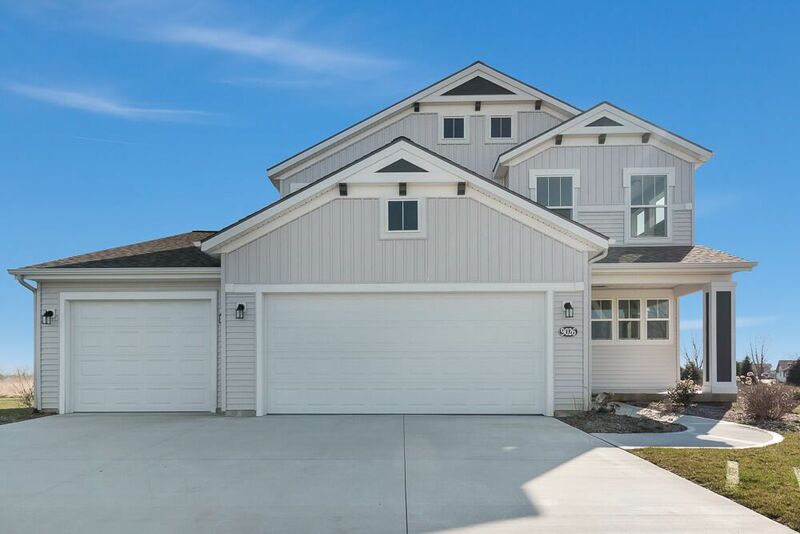 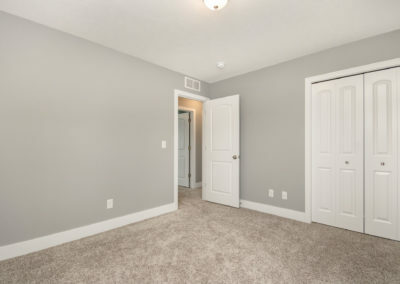 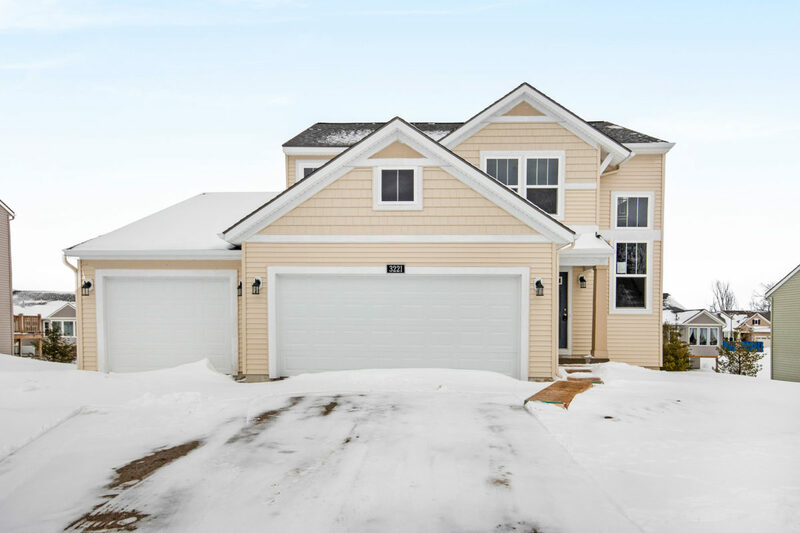 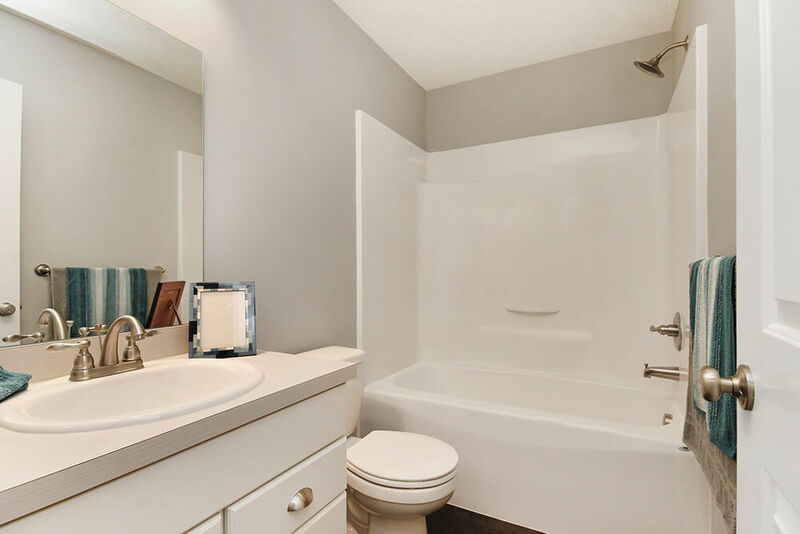 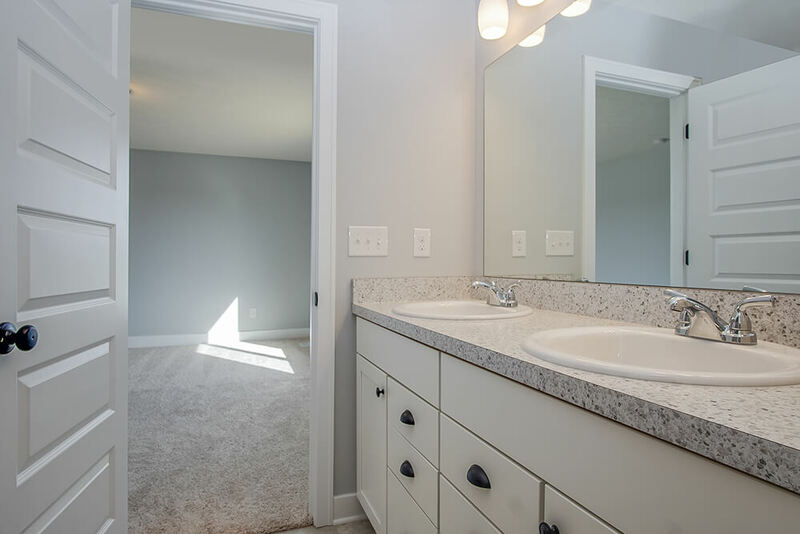 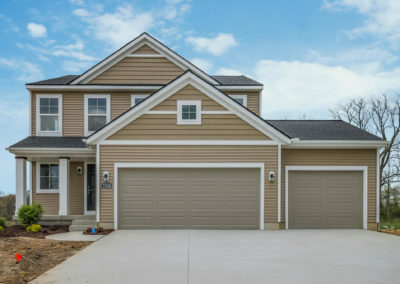 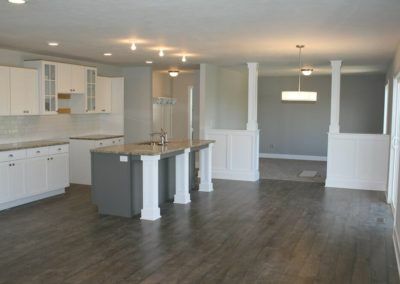 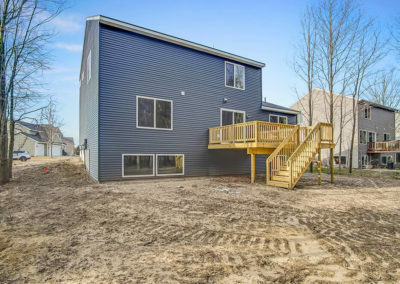 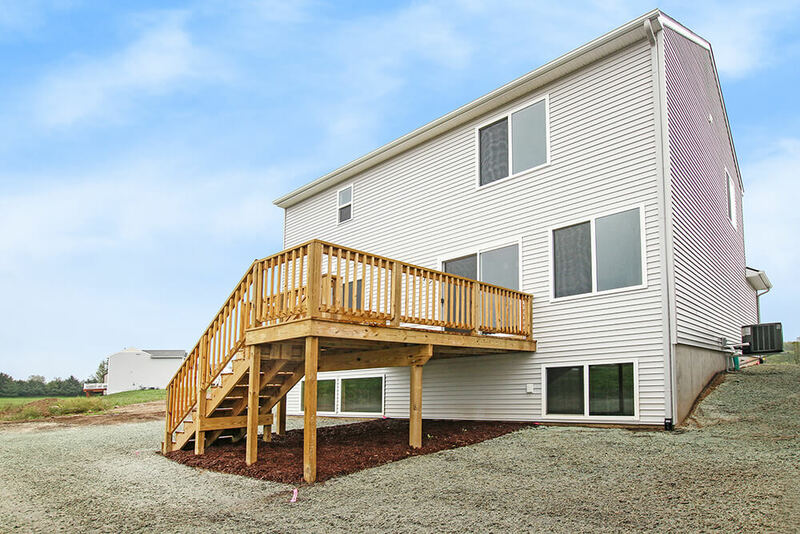 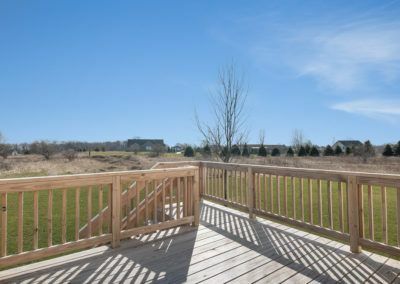 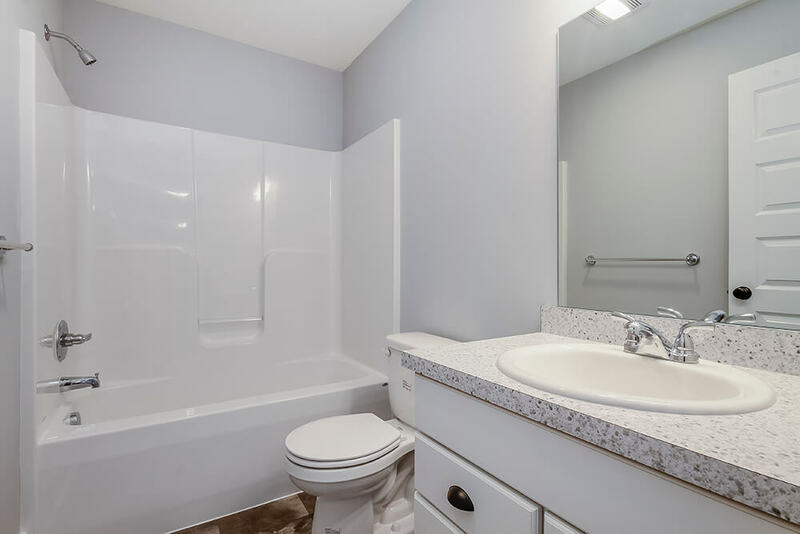 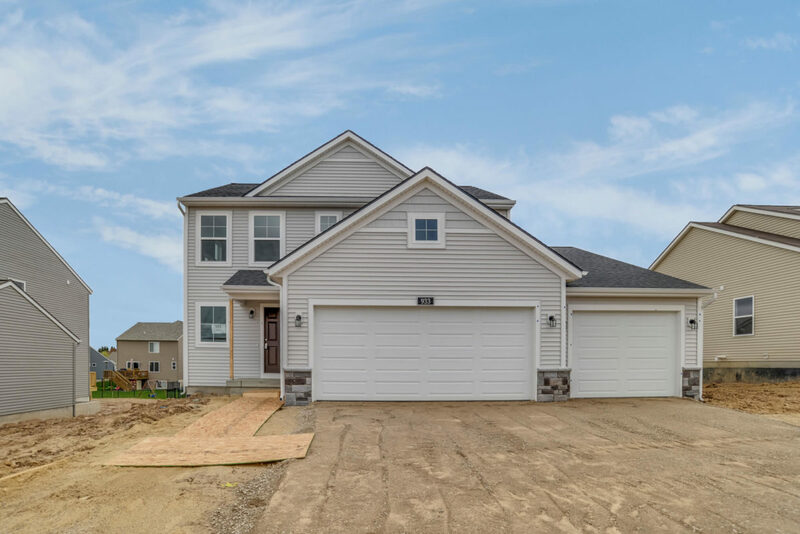 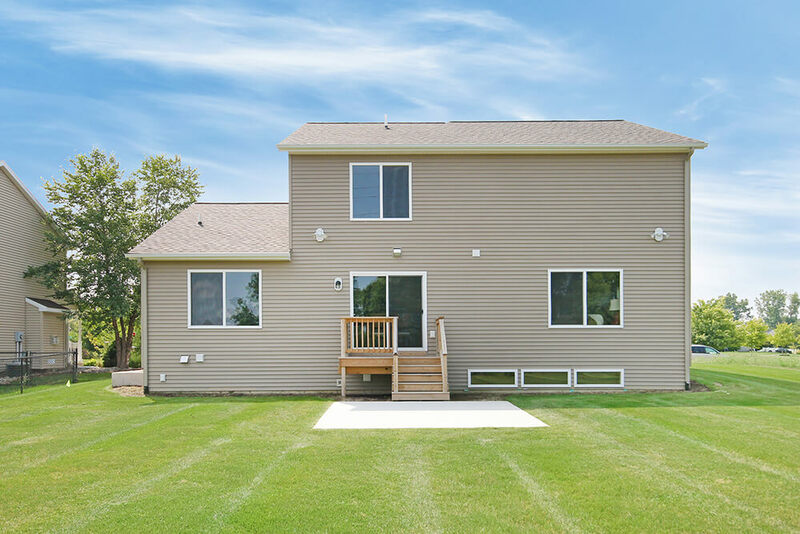 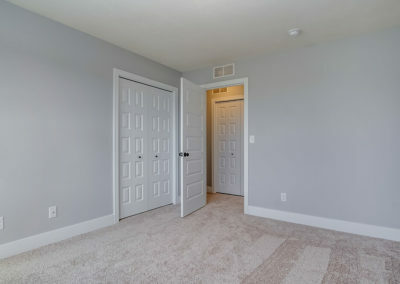 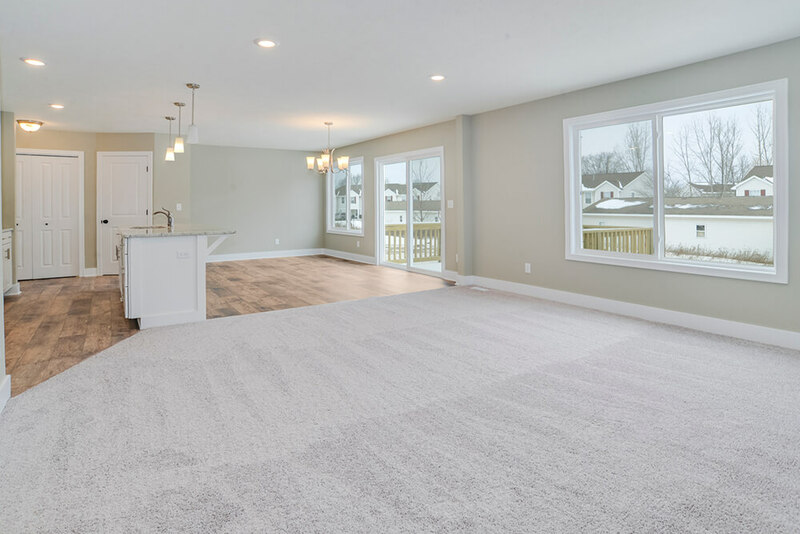 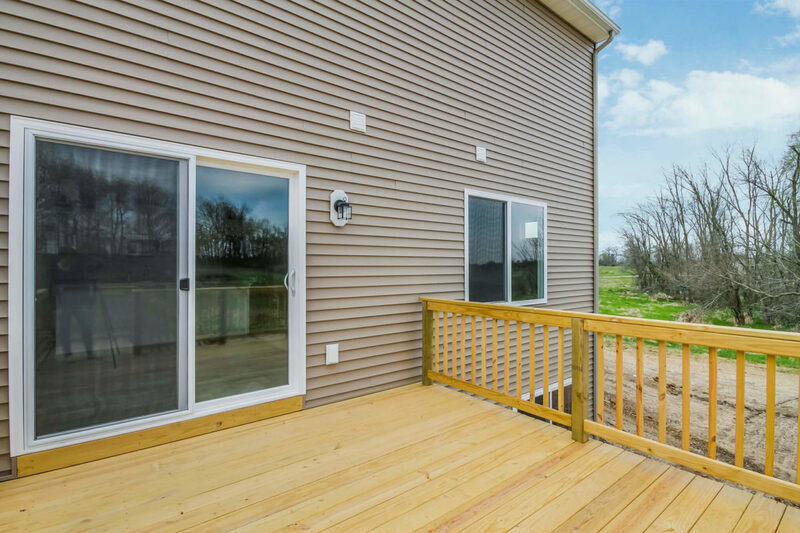 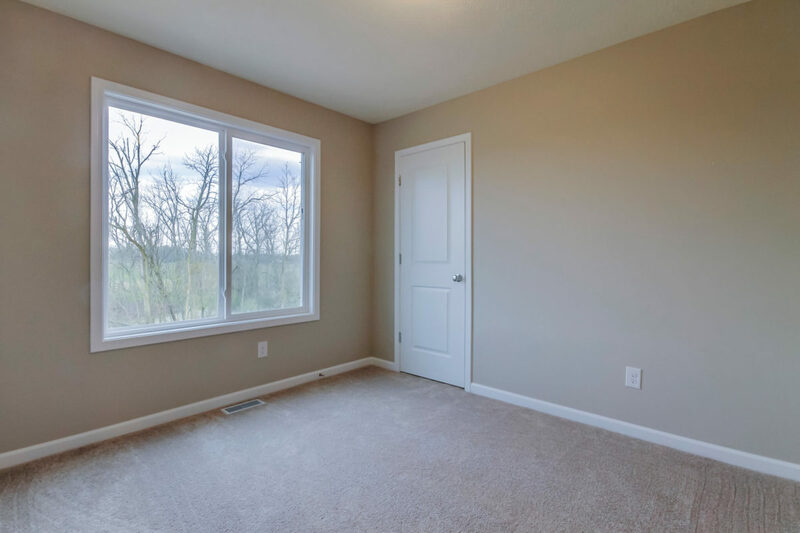 Walk into your new Taylor home from the front porch into the entry way, which leads past the main level half bath and opens into the sunny, free-flowing main living area. 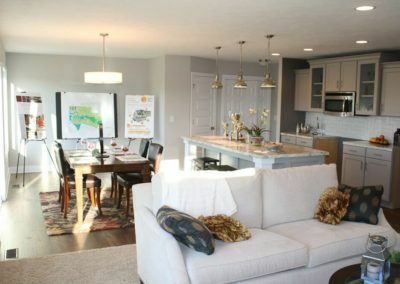 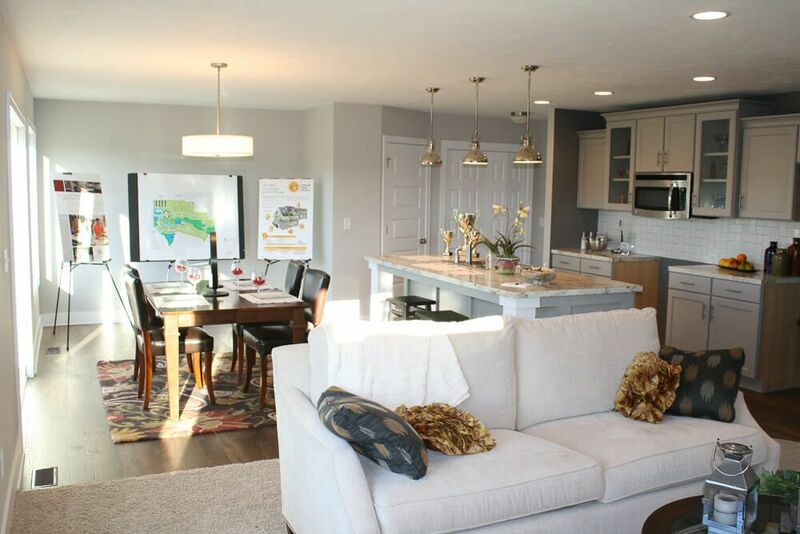 The living area combines the spacious family room, dining room, and kitchen into a bright and friendly space. 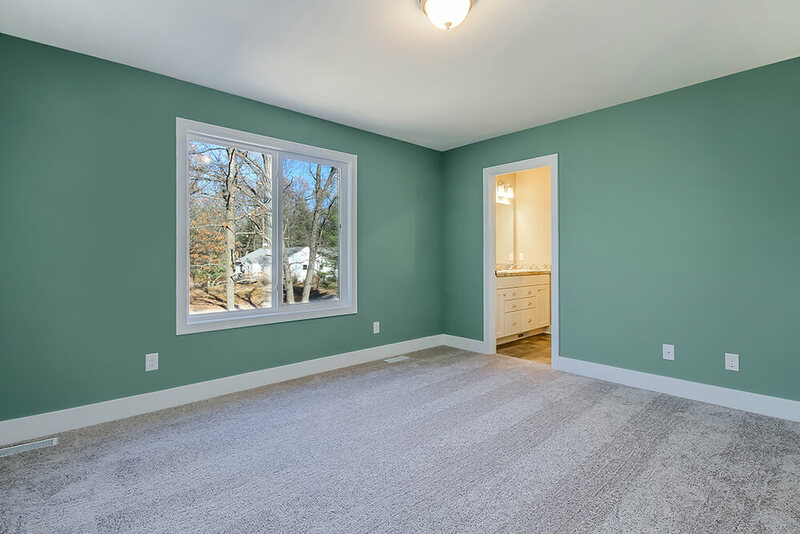 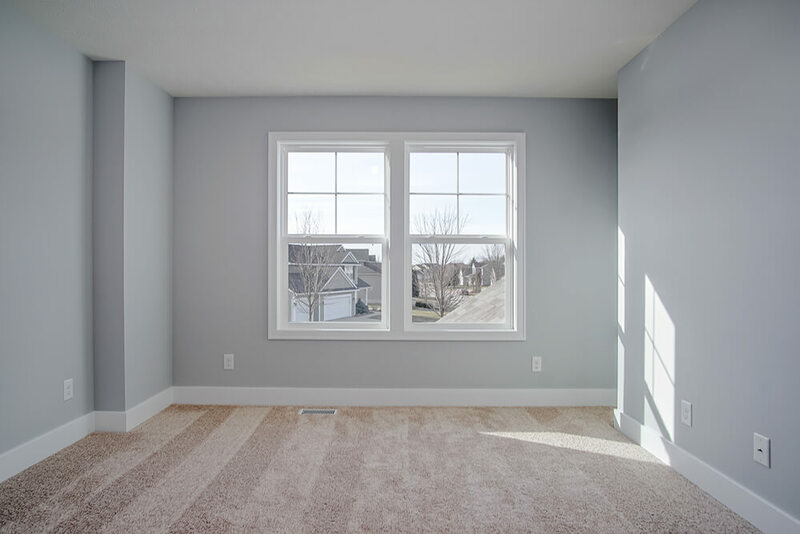 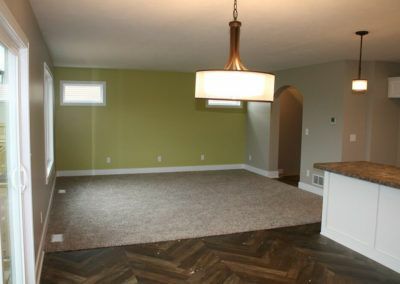 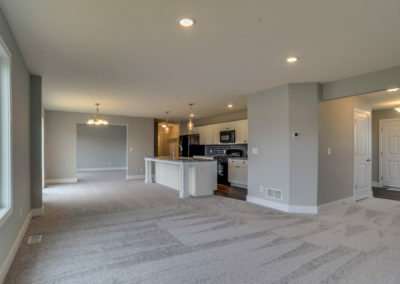 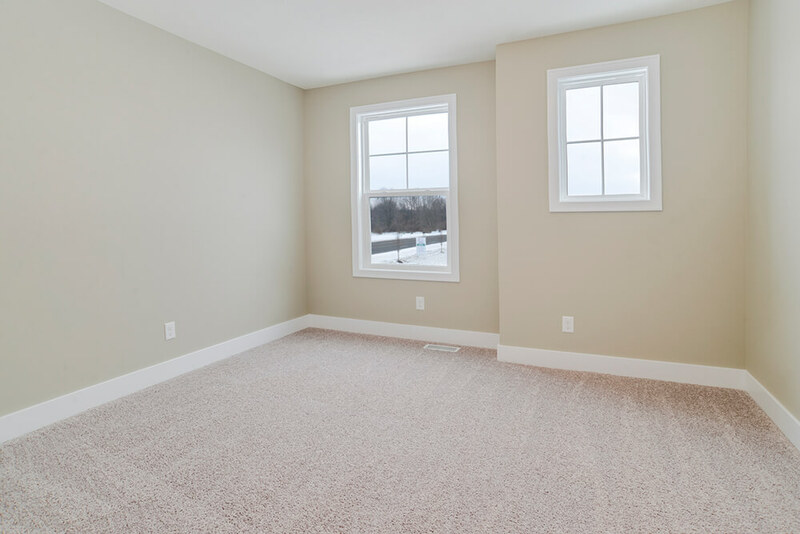 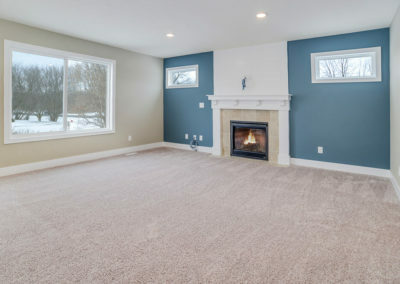 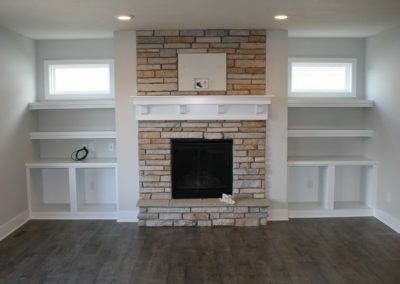 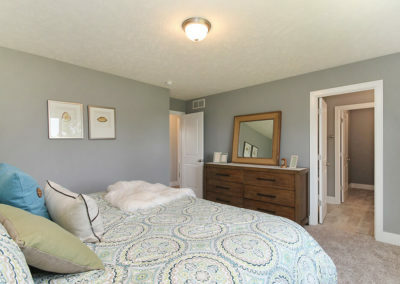 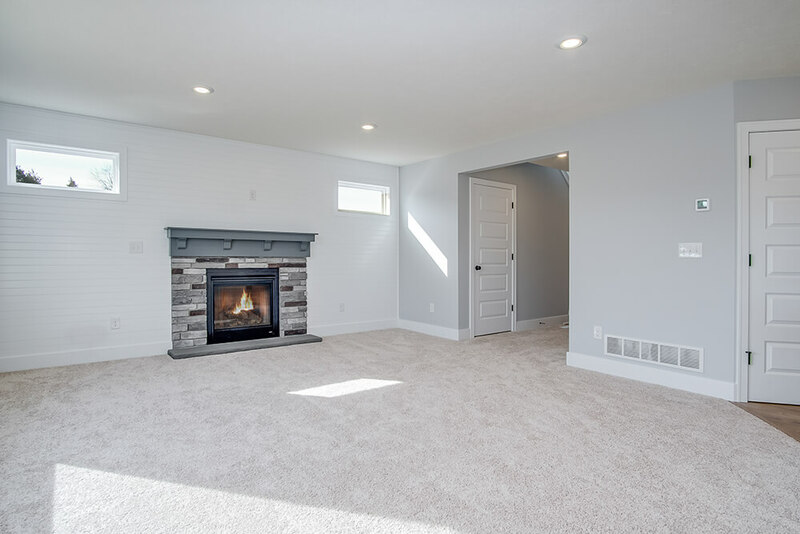 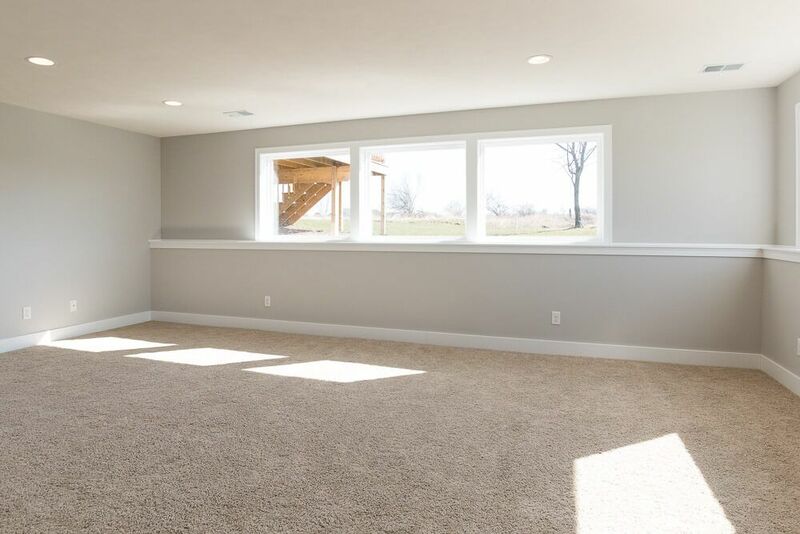 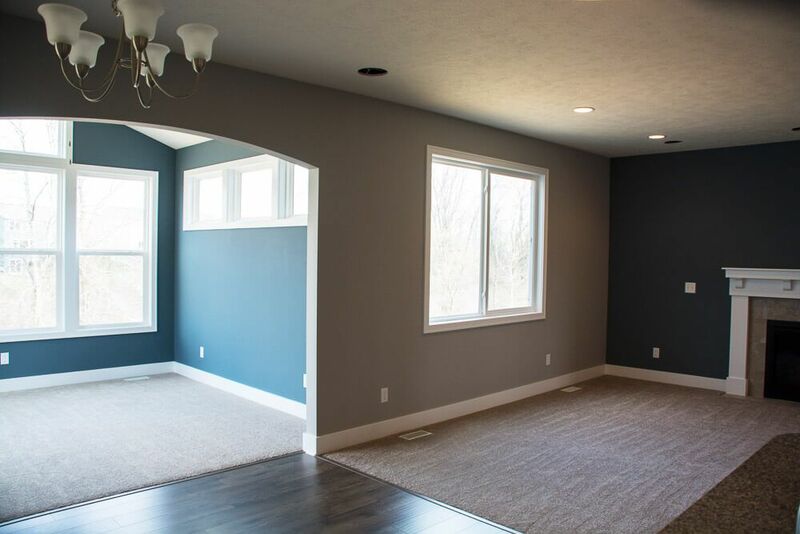 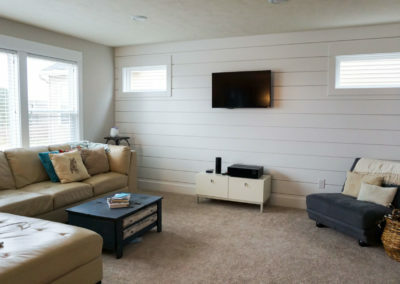 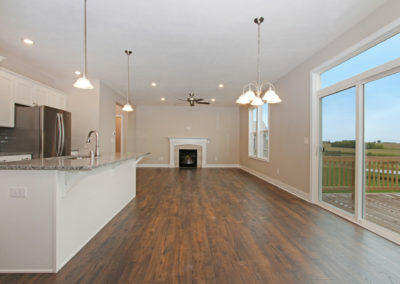 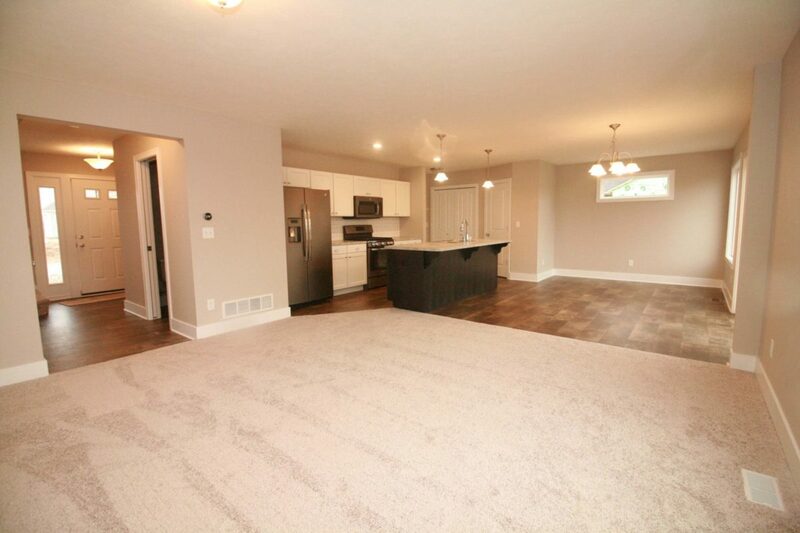 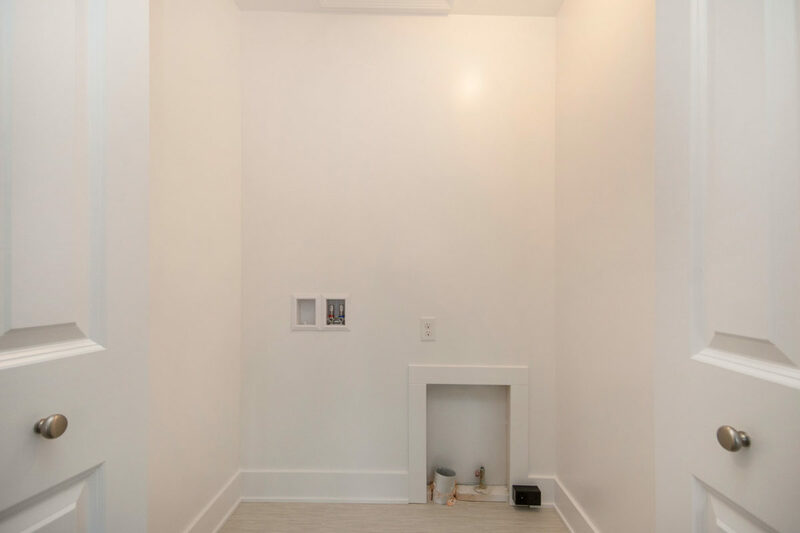 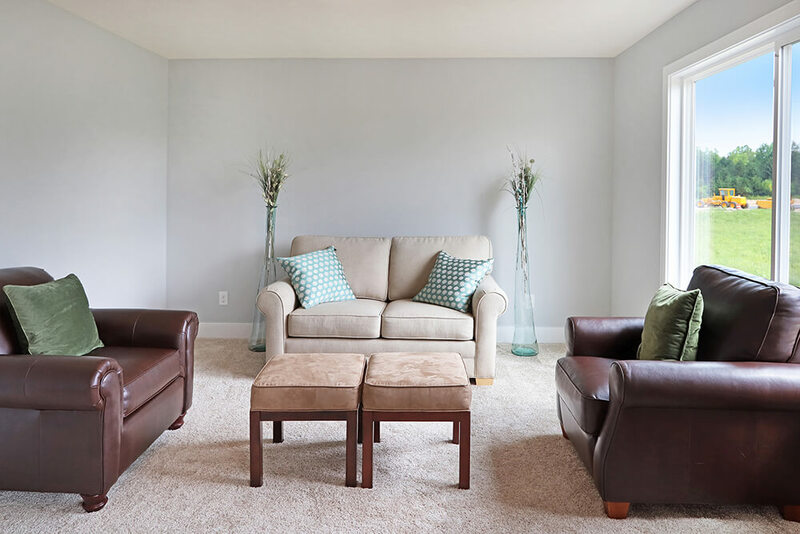 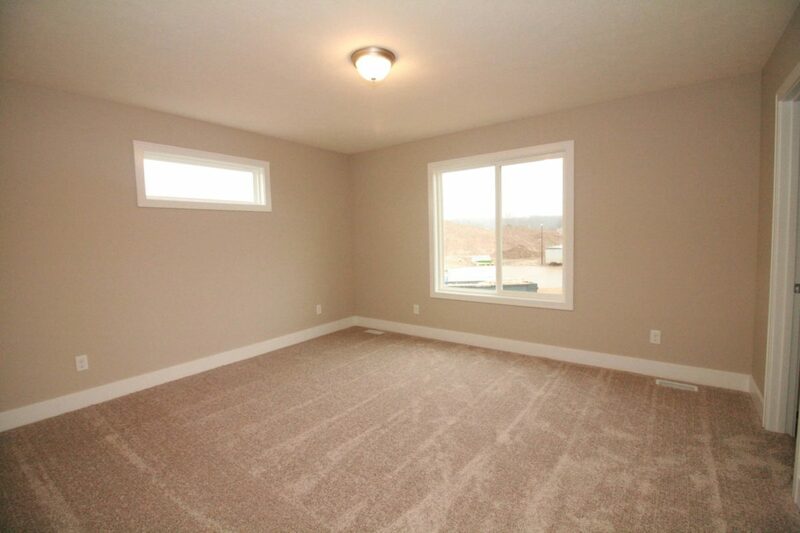 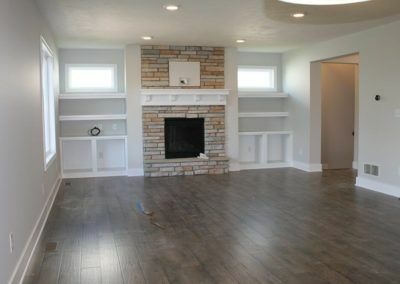 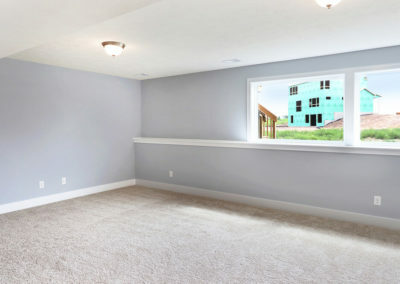 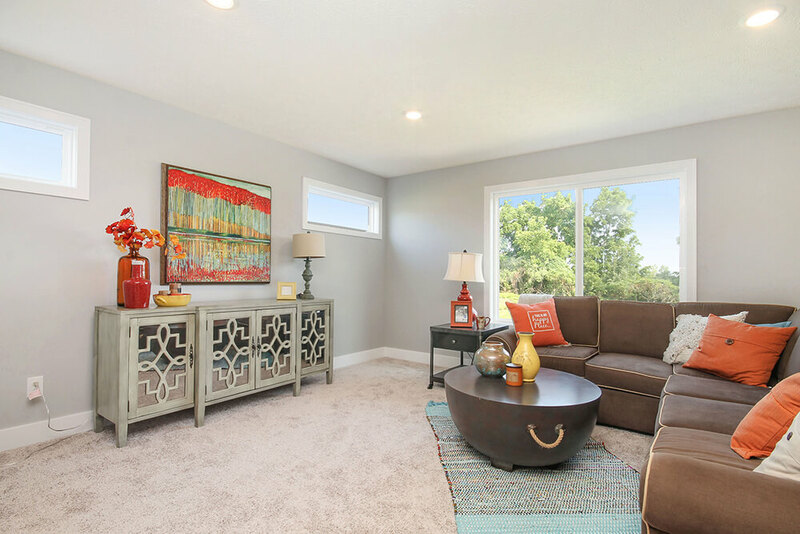 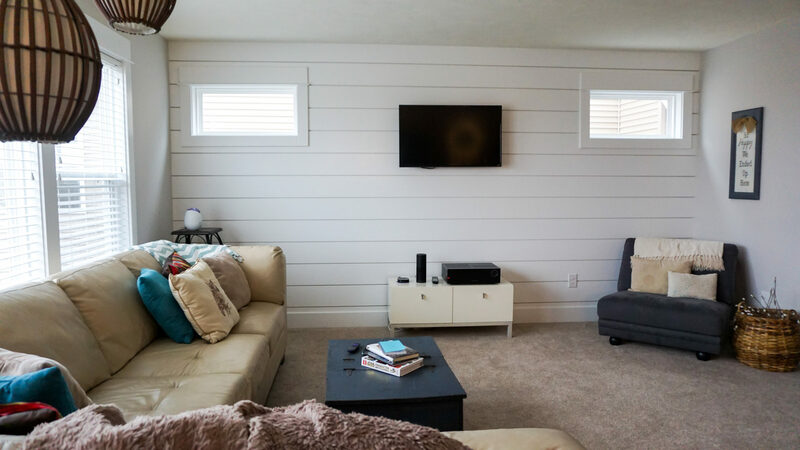 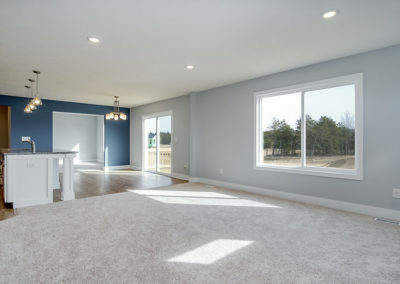 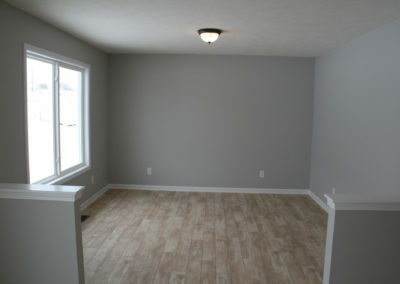 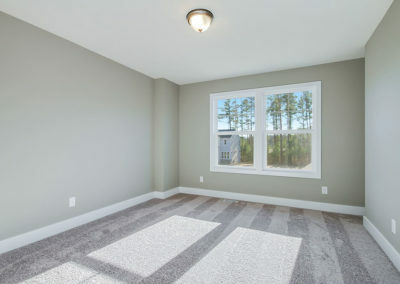 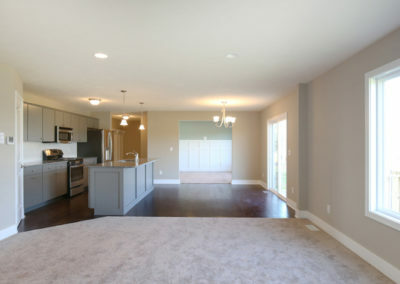 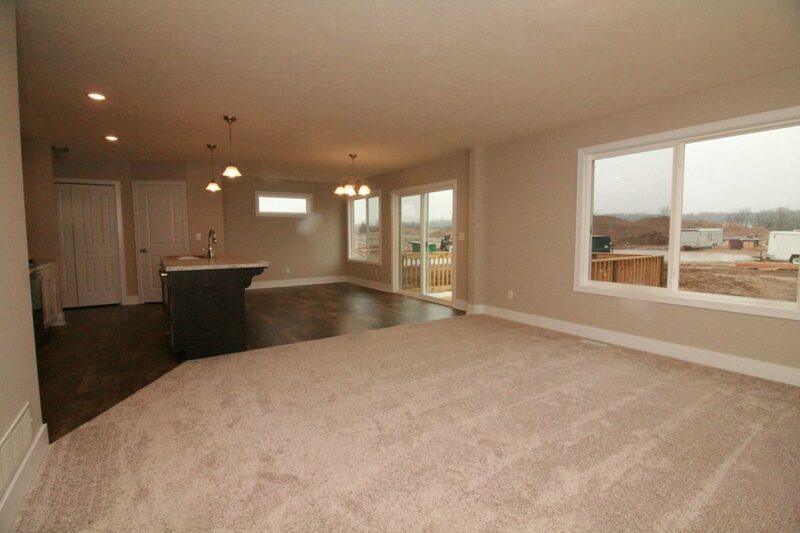 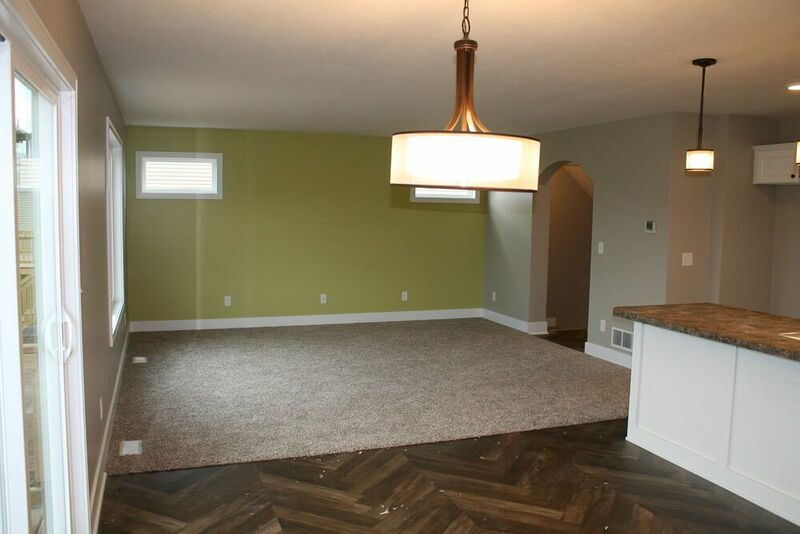 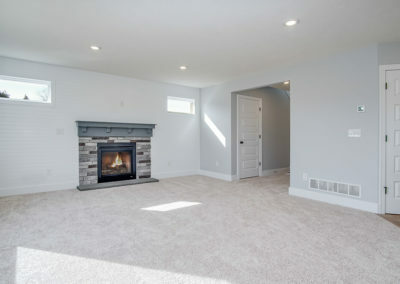 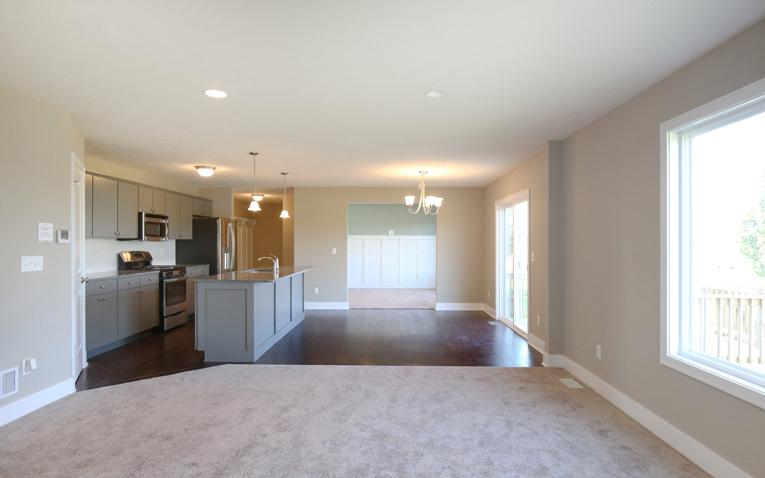 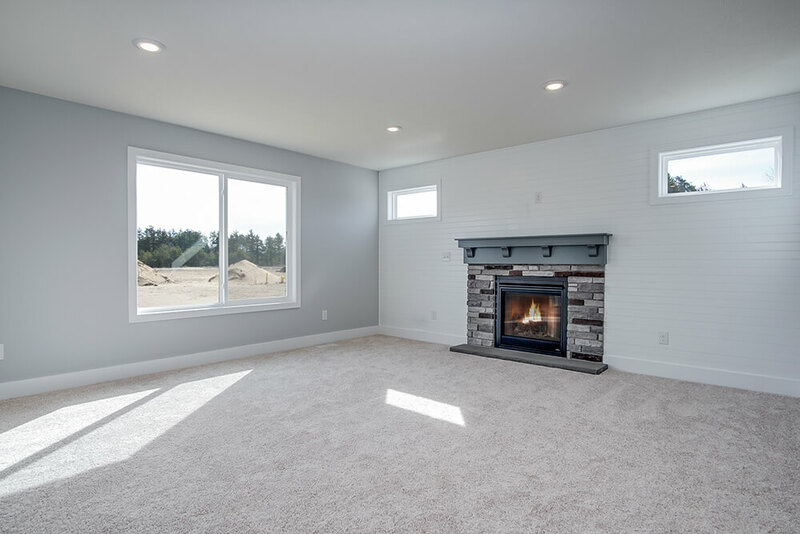 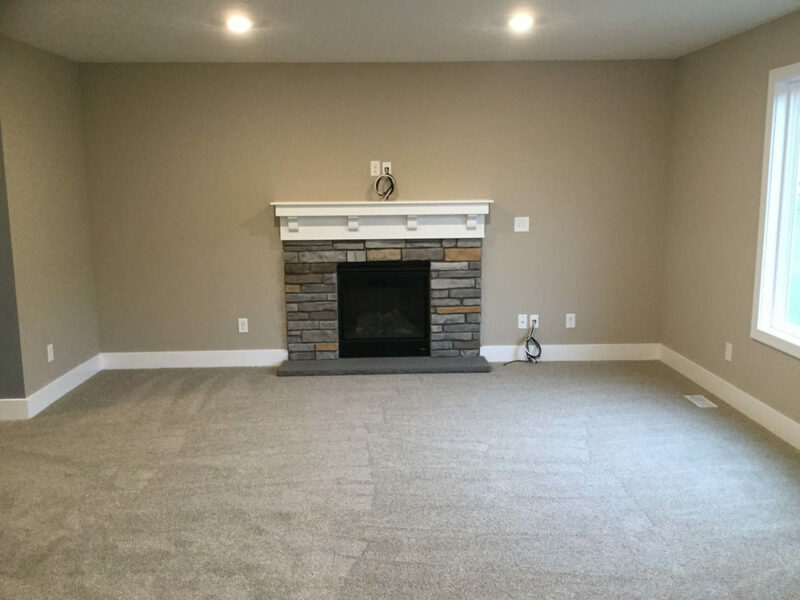 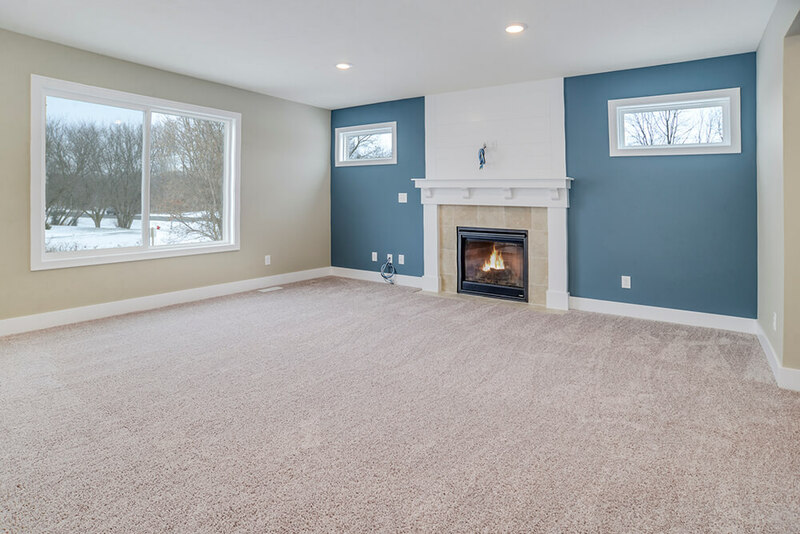 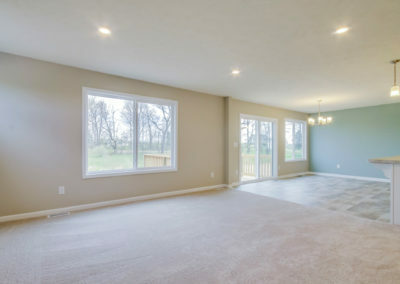 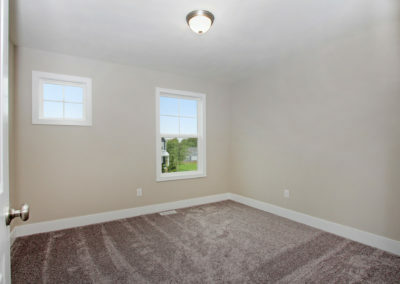 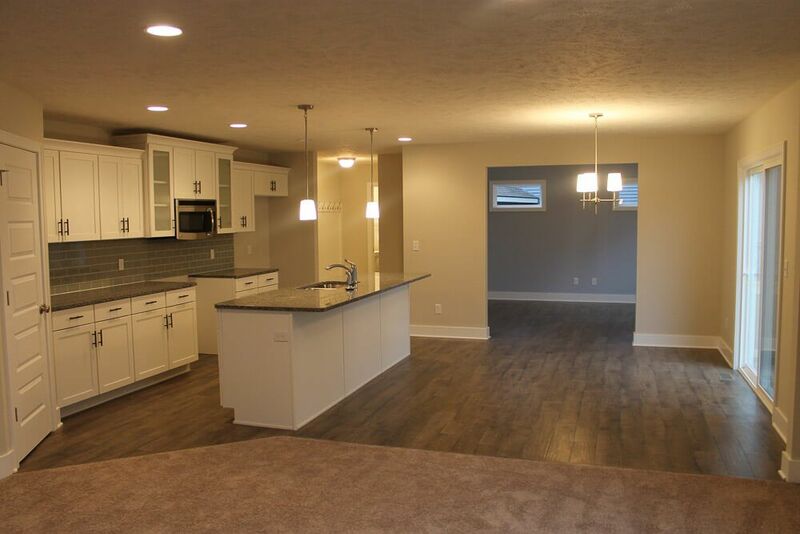 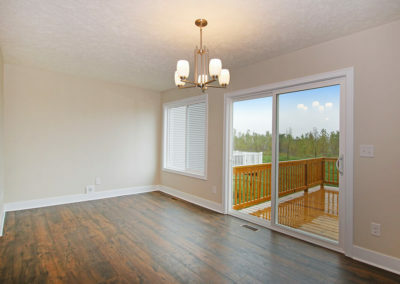 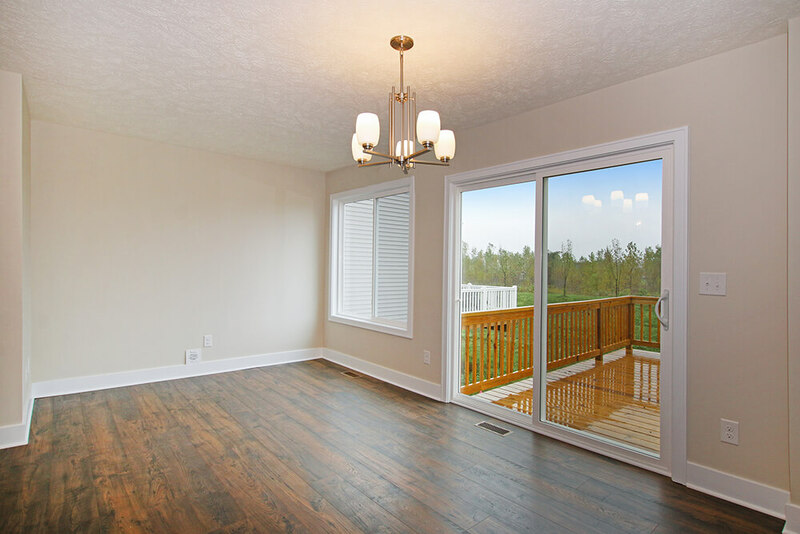 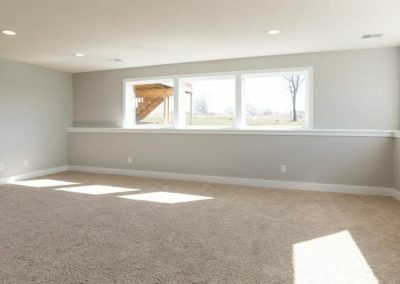 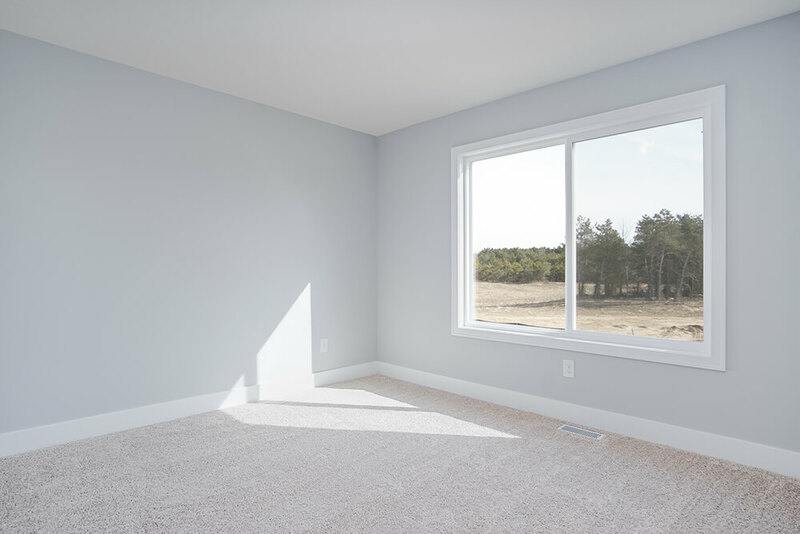 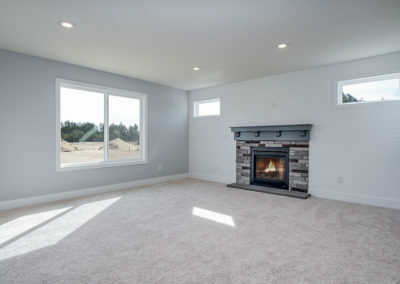 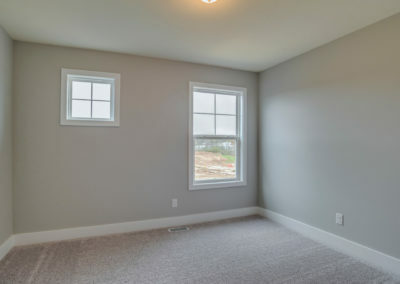 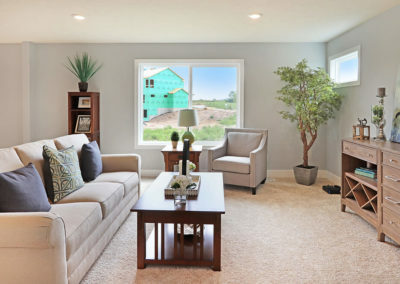 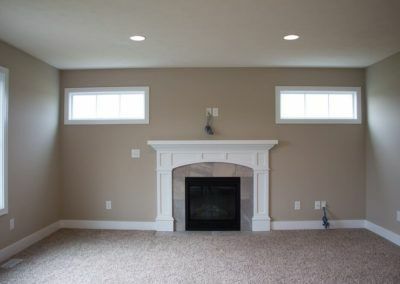 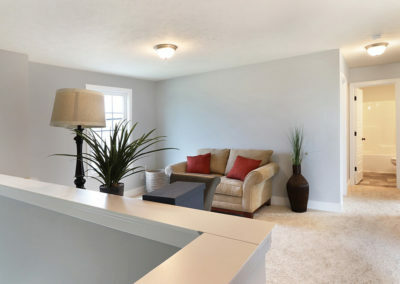 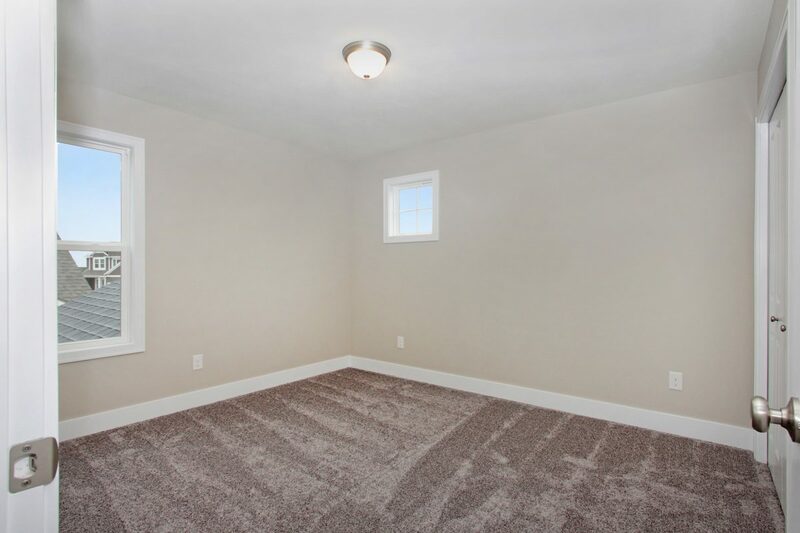 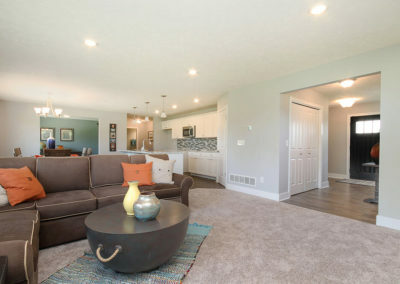 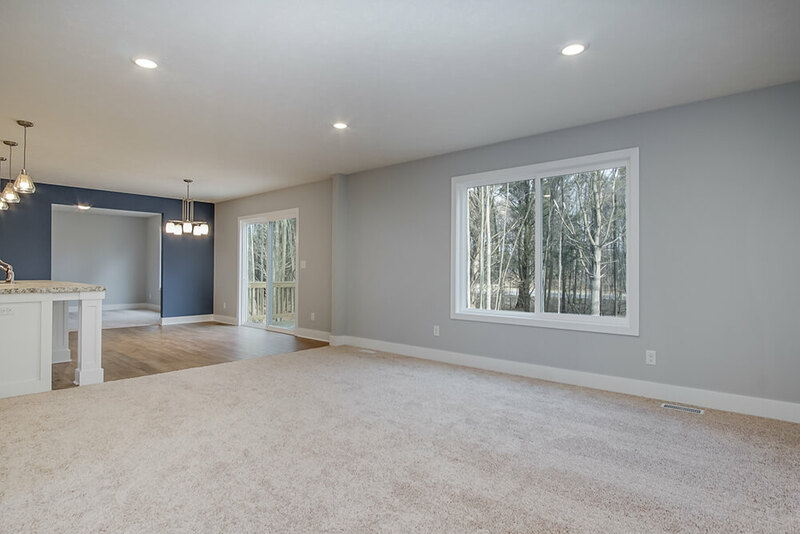 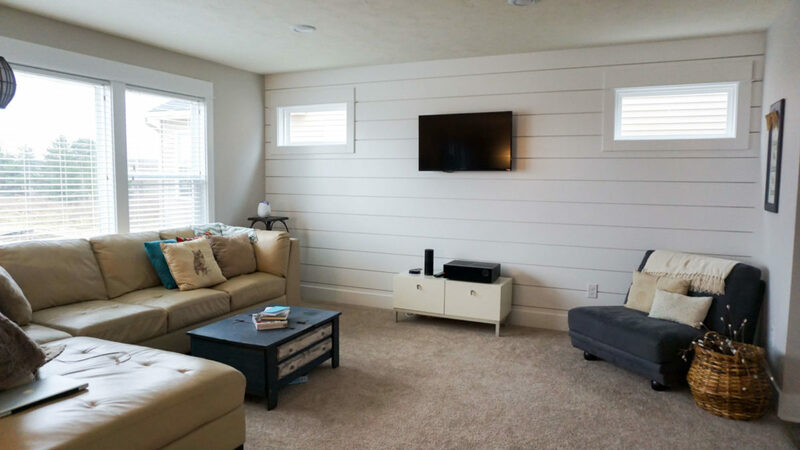 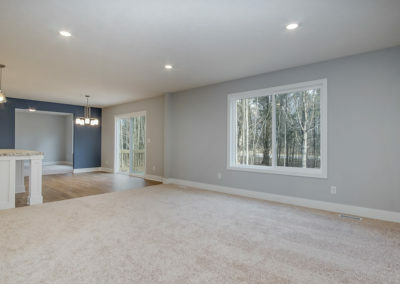 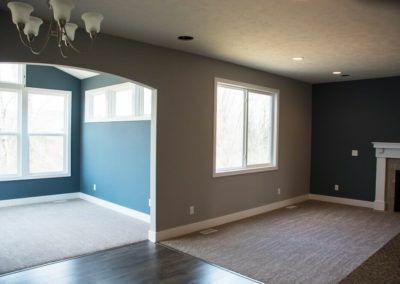 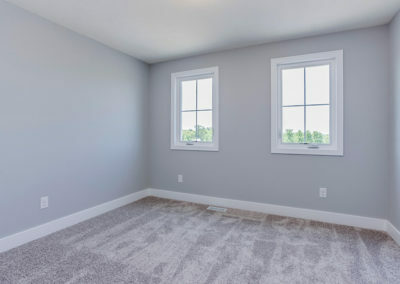 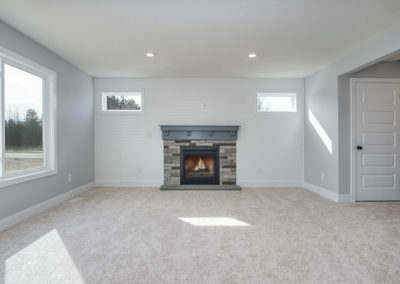 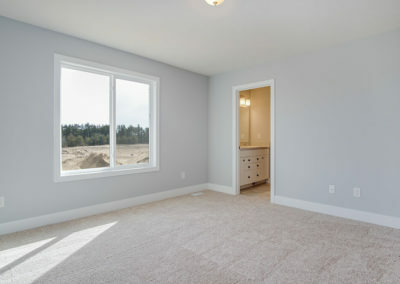 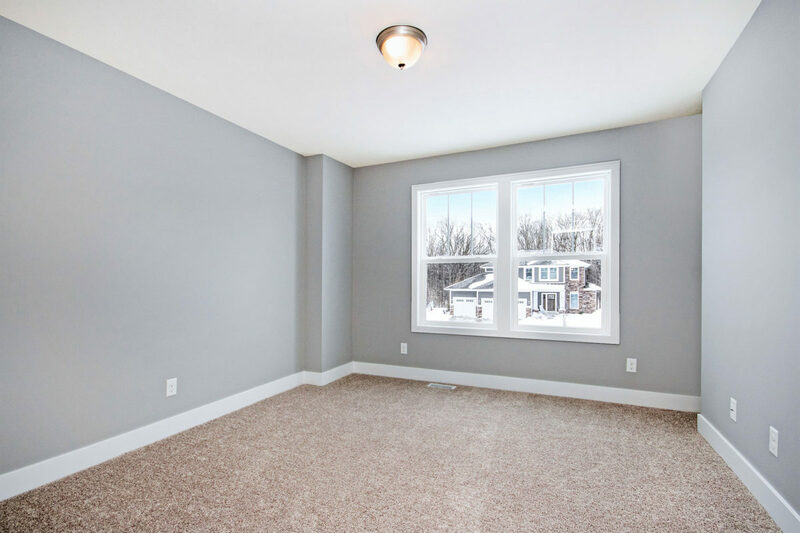 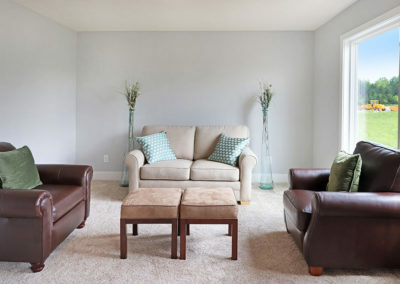 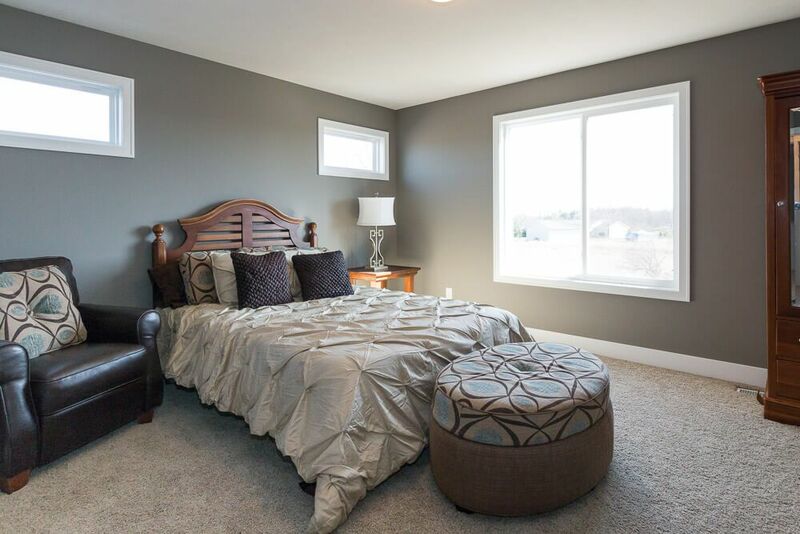 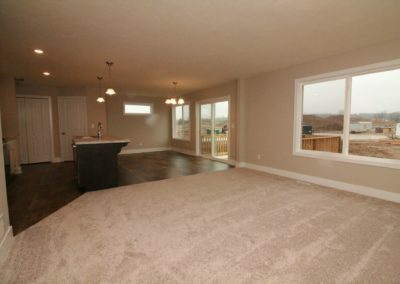 The family room offers the option to add a fireplace and even more windows. 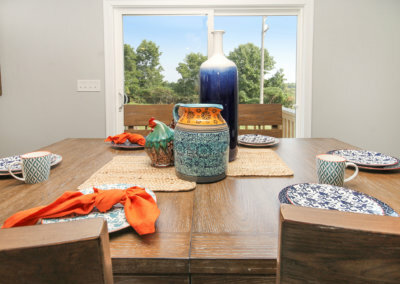 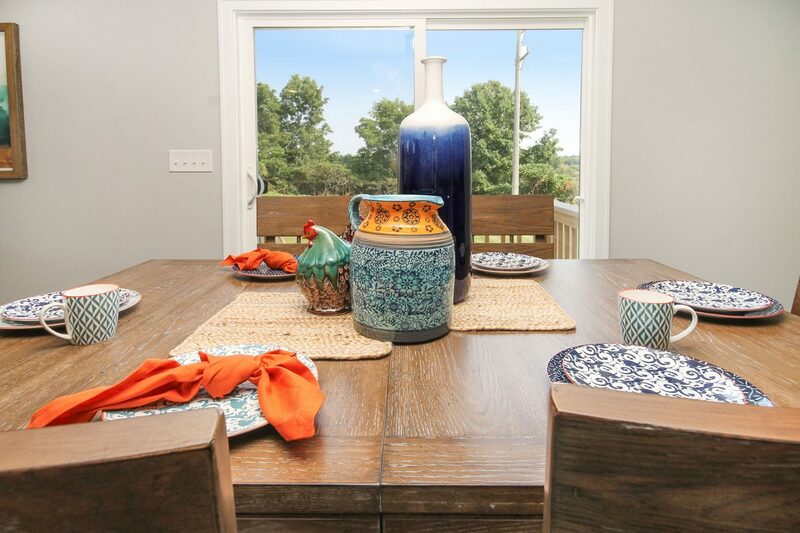 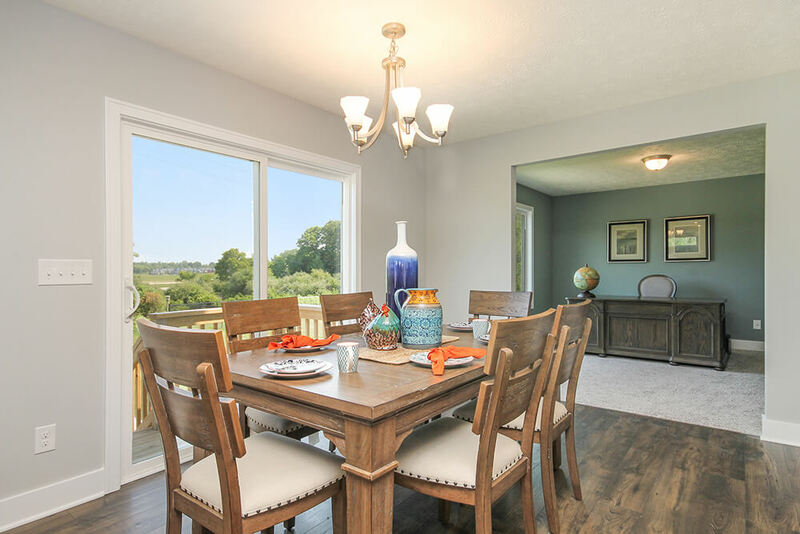 The dining area serves as the focal point, joining the family room, kitchen, and back yard through a sliding door. 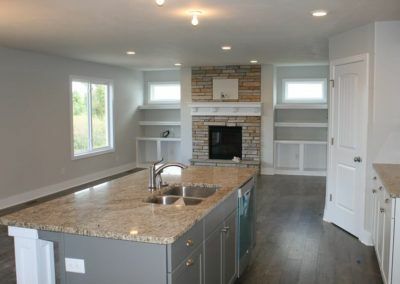 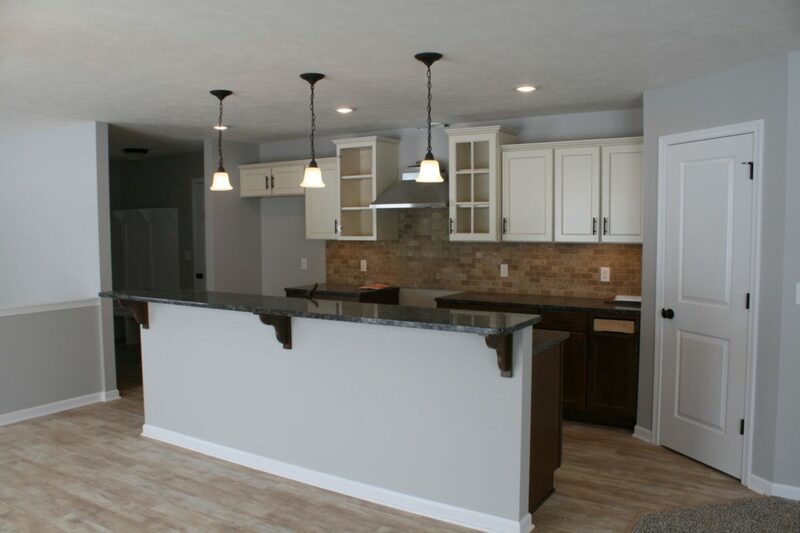 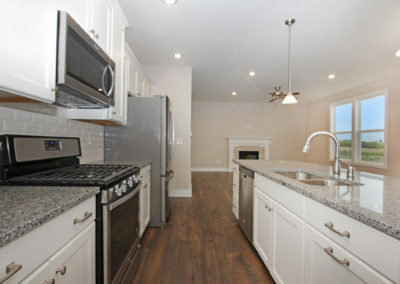 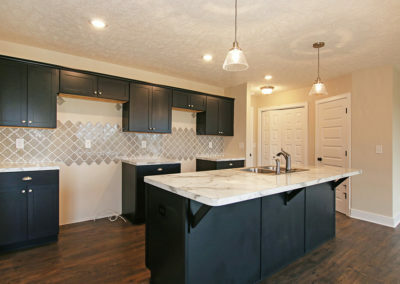 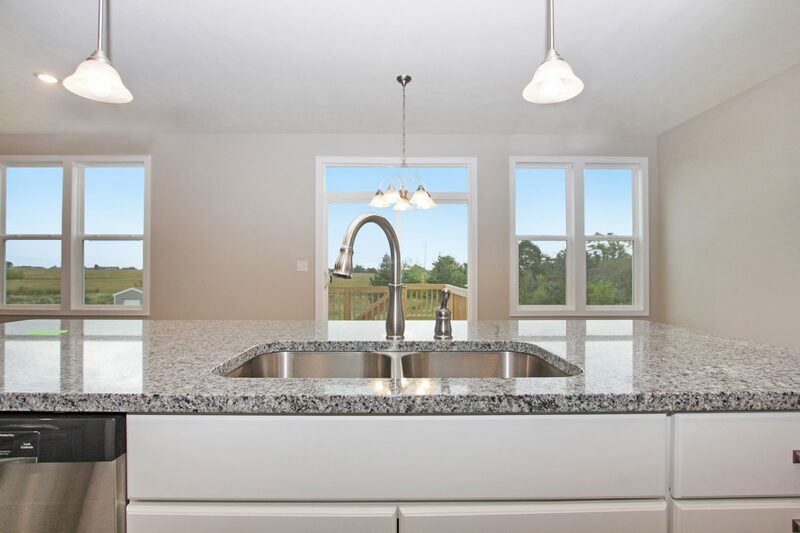 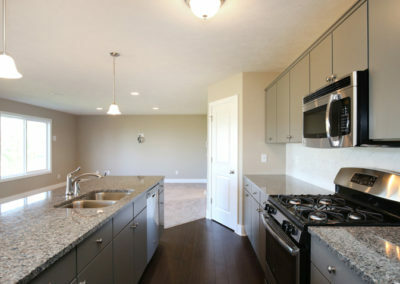 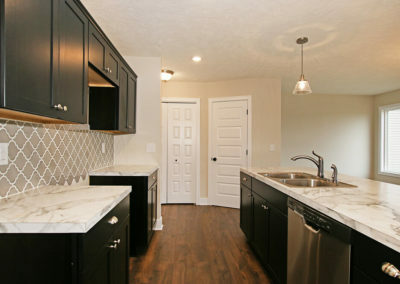 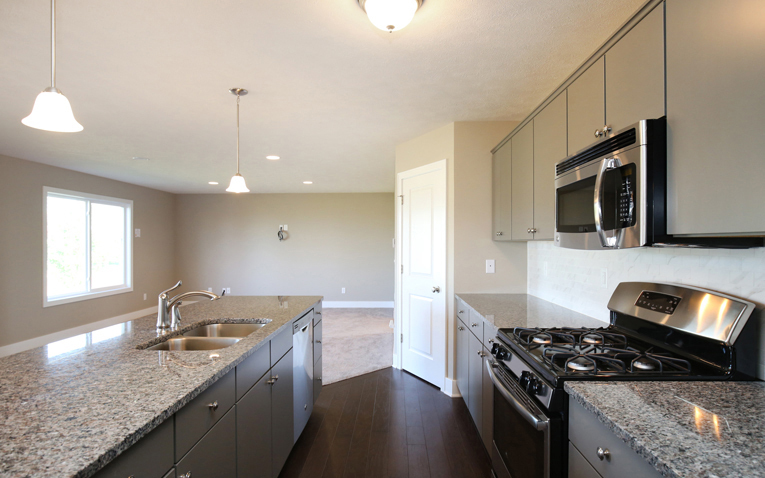 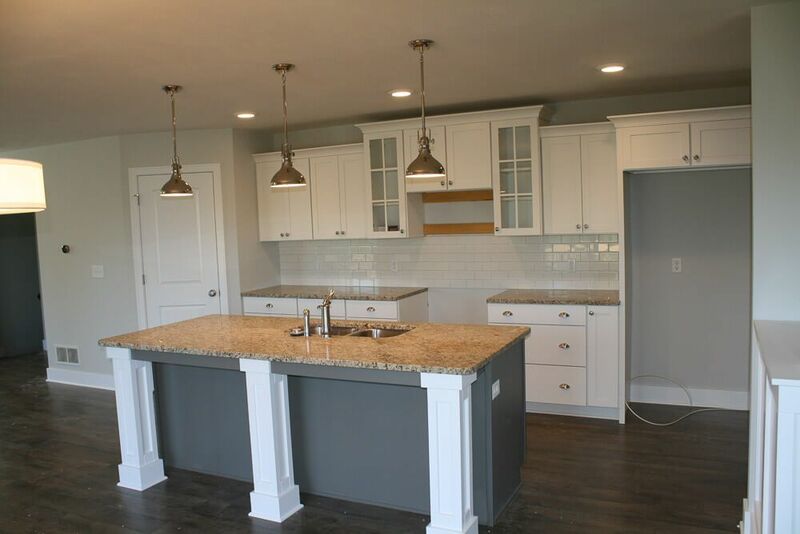 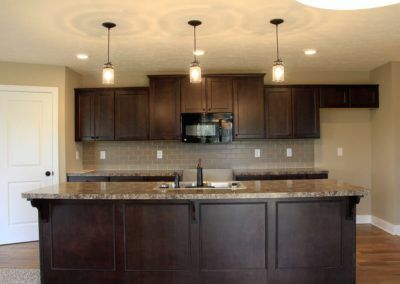 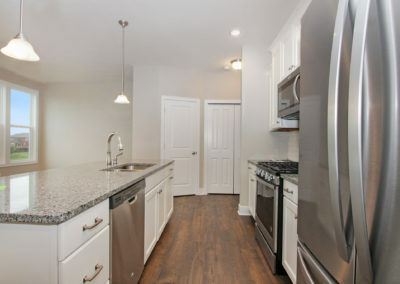 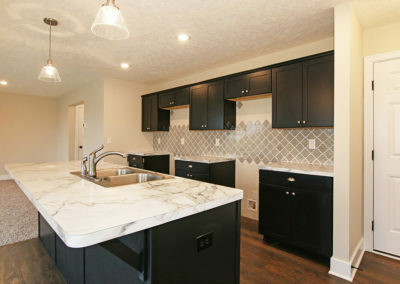 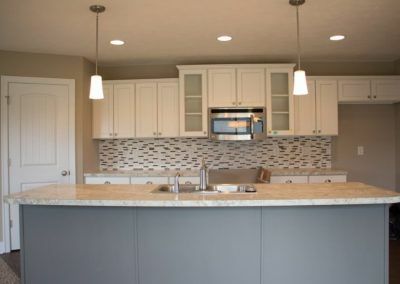 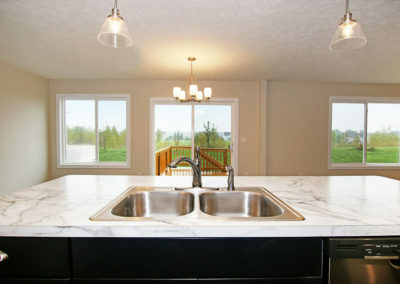 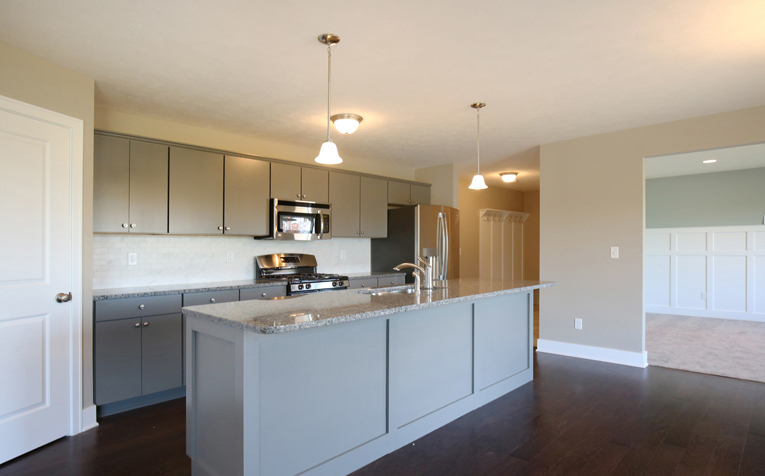 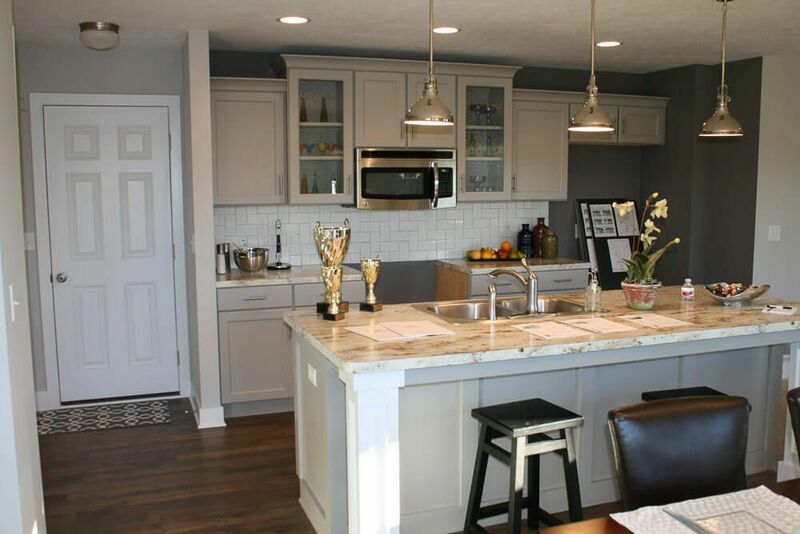 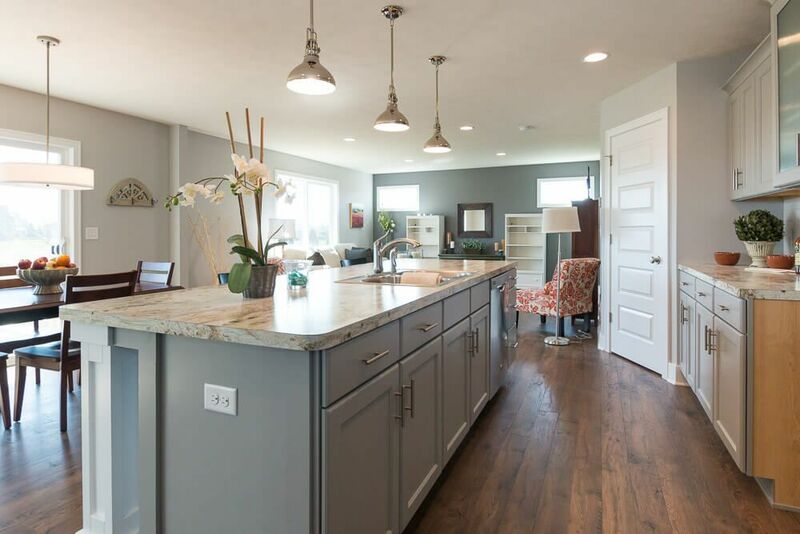 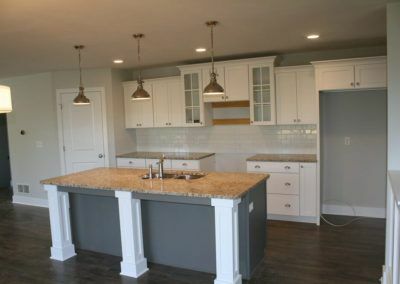 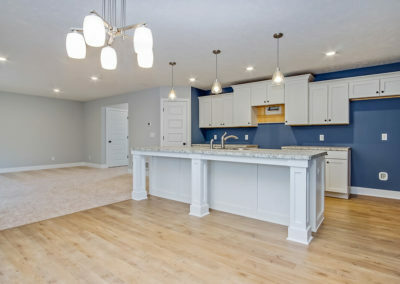 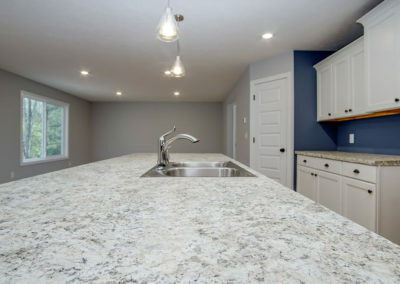 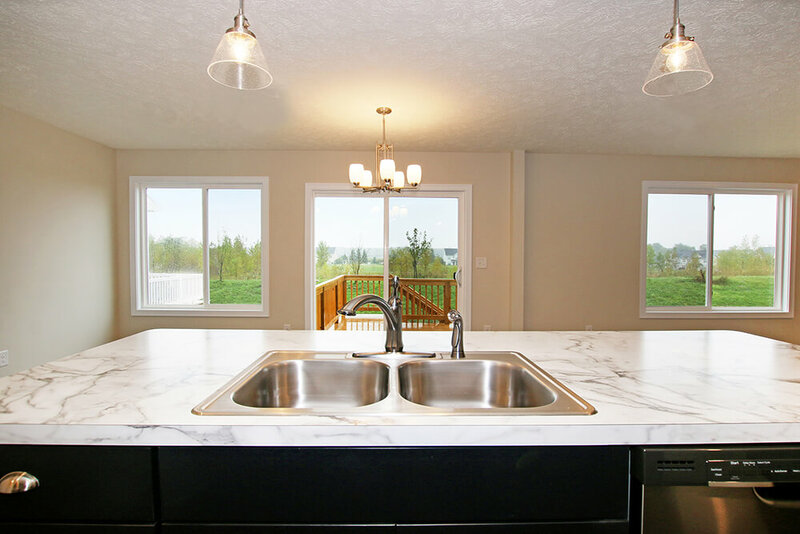 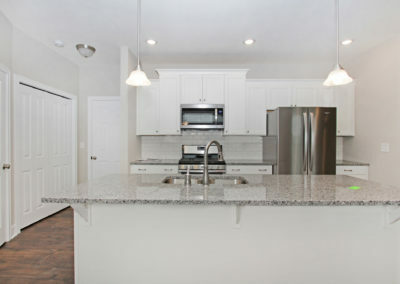 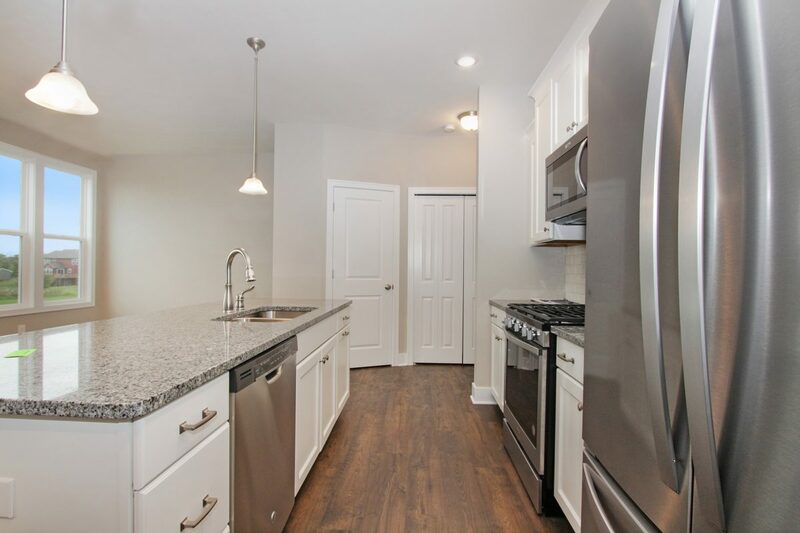 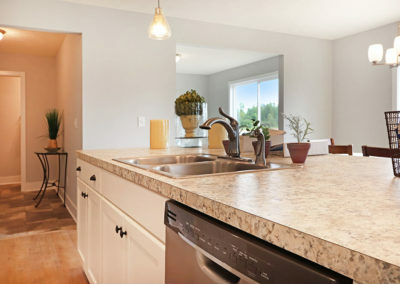 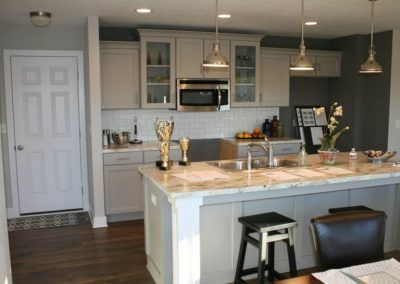 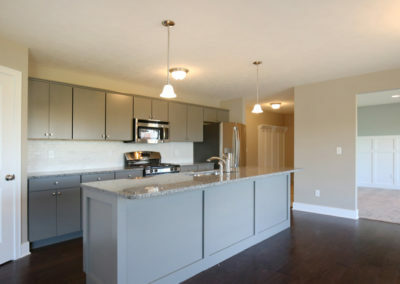 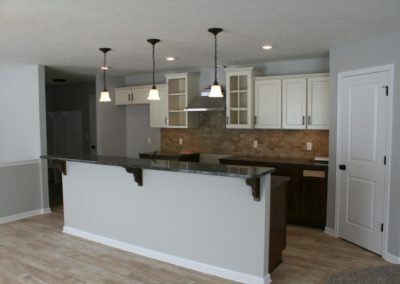 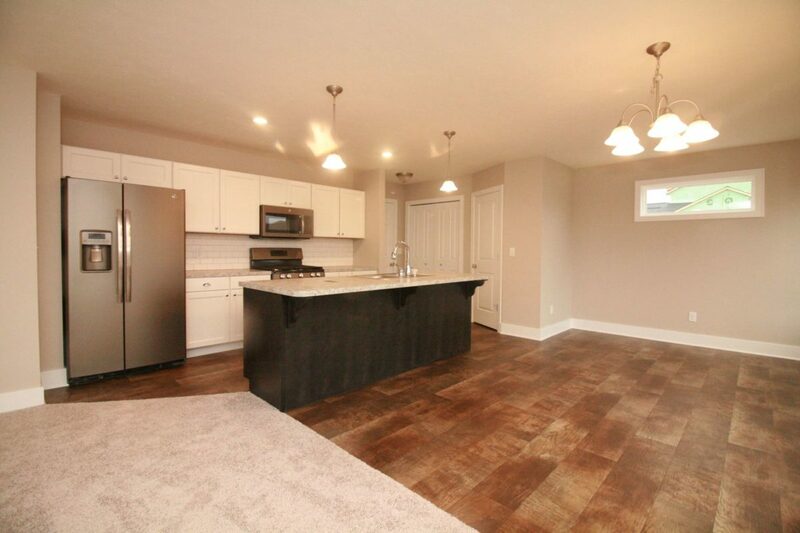 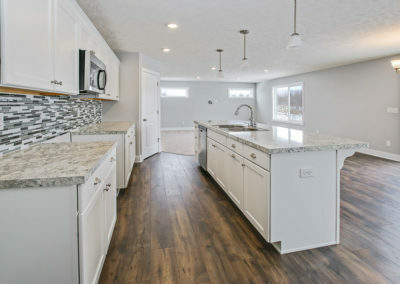 The generous kitchen has a walk-in pantry, a large island with double sink, and offers access to the two car garage. 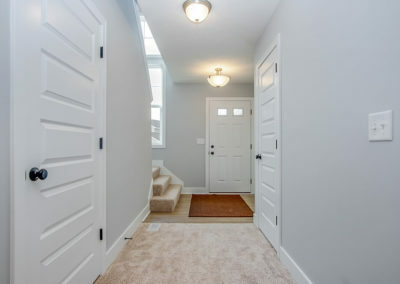 The main level also offers the option to select a sizable addition. 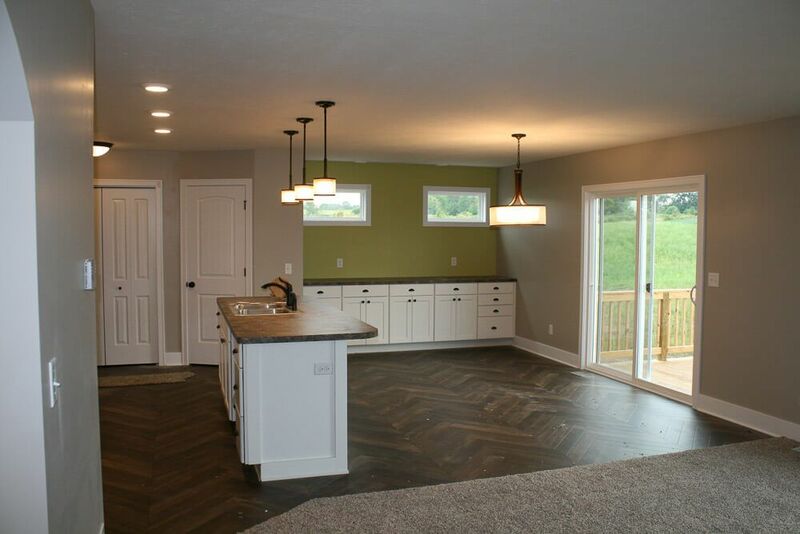 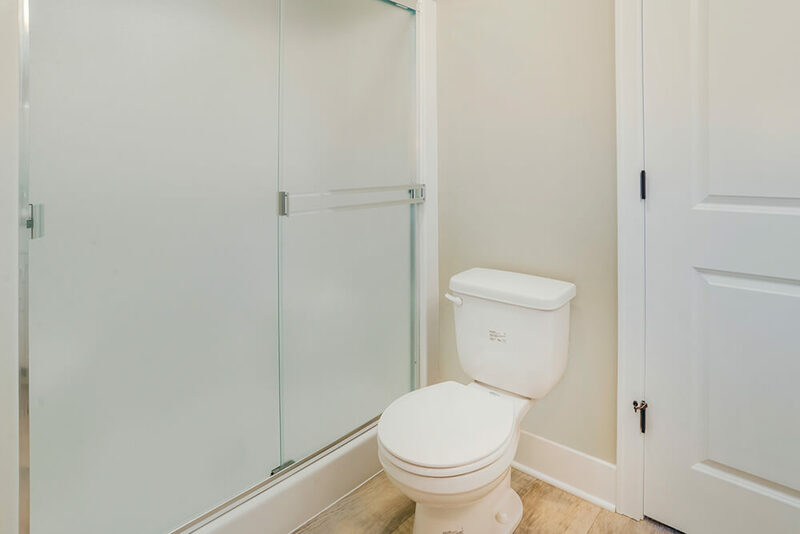 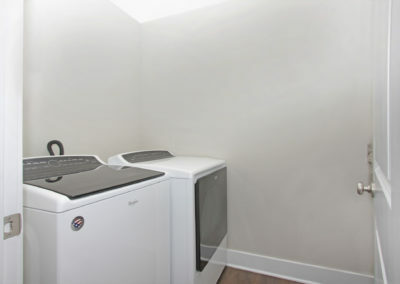 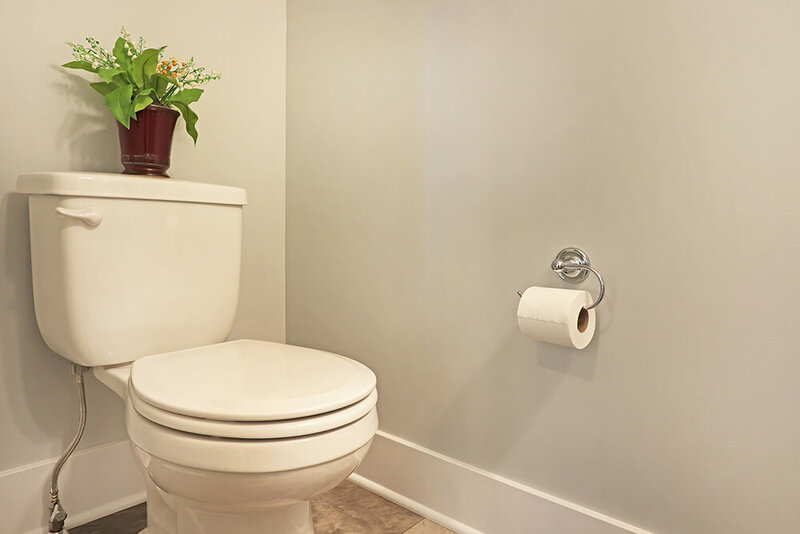 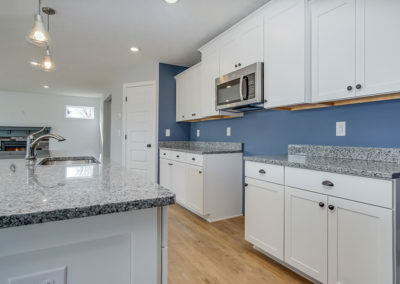 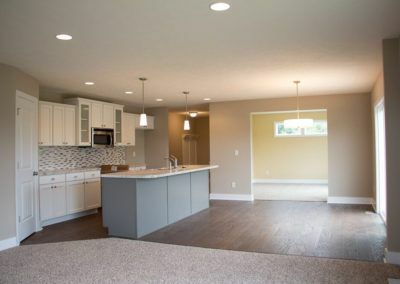 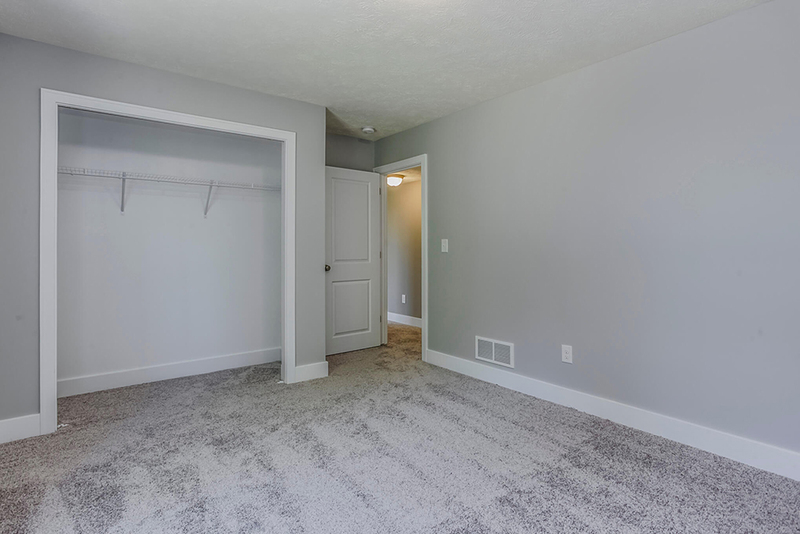 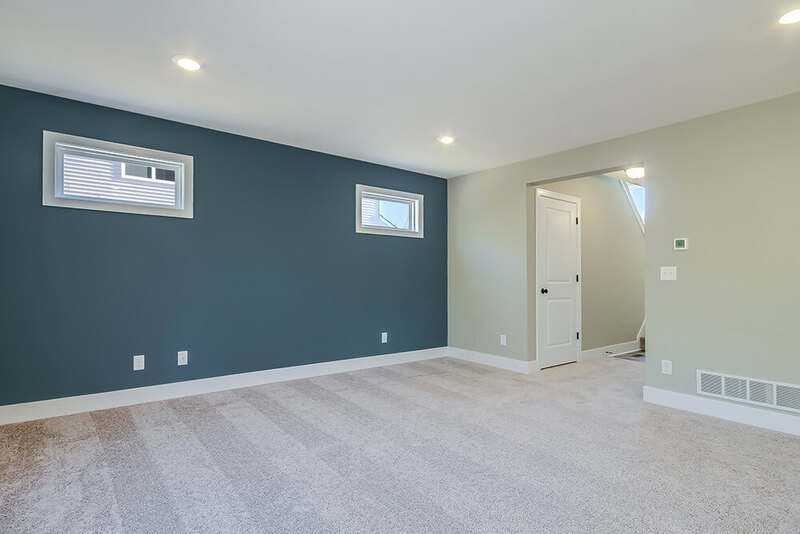 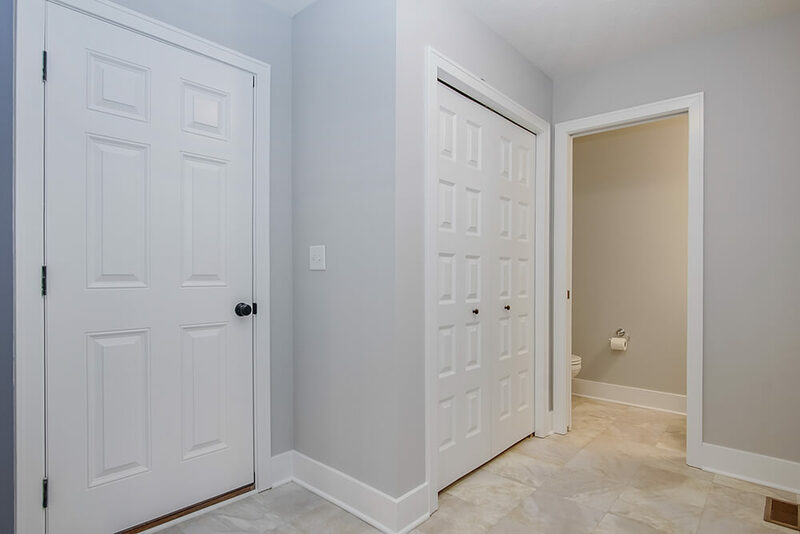 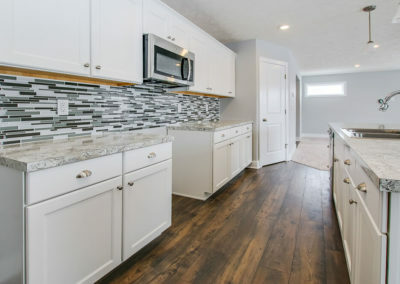 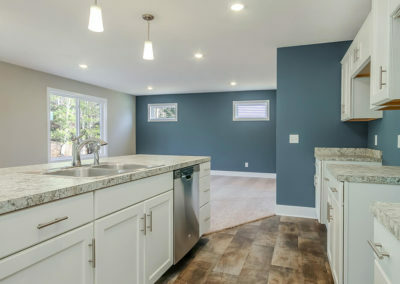 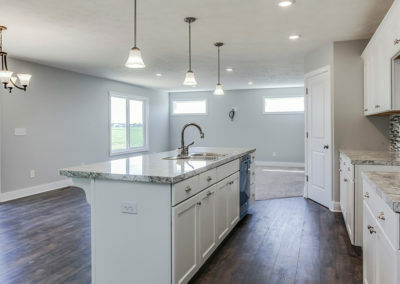 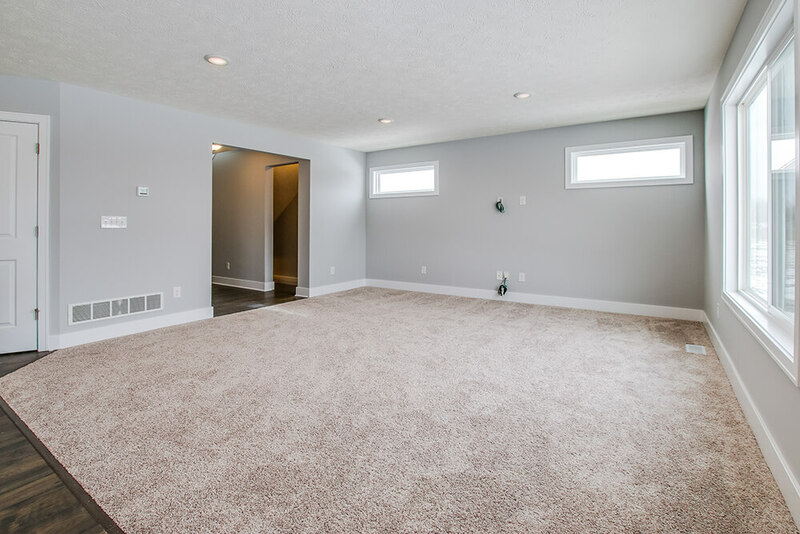 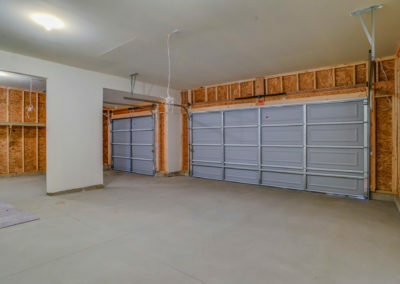 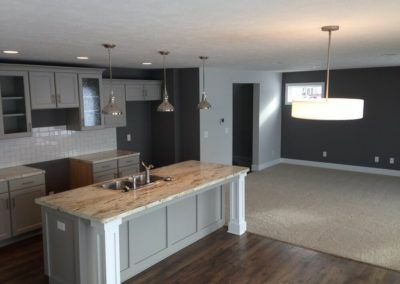 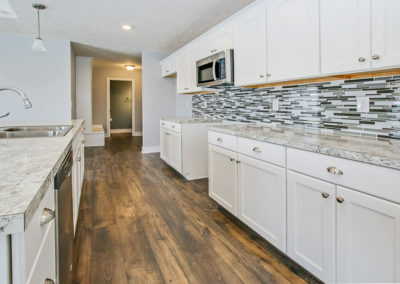 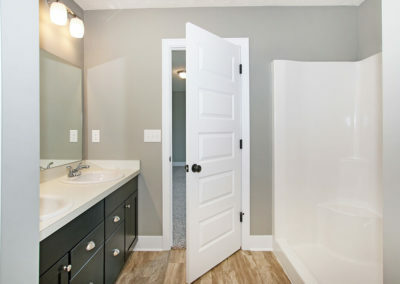 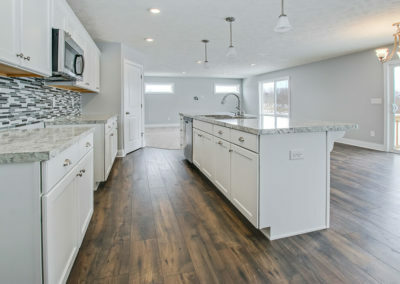 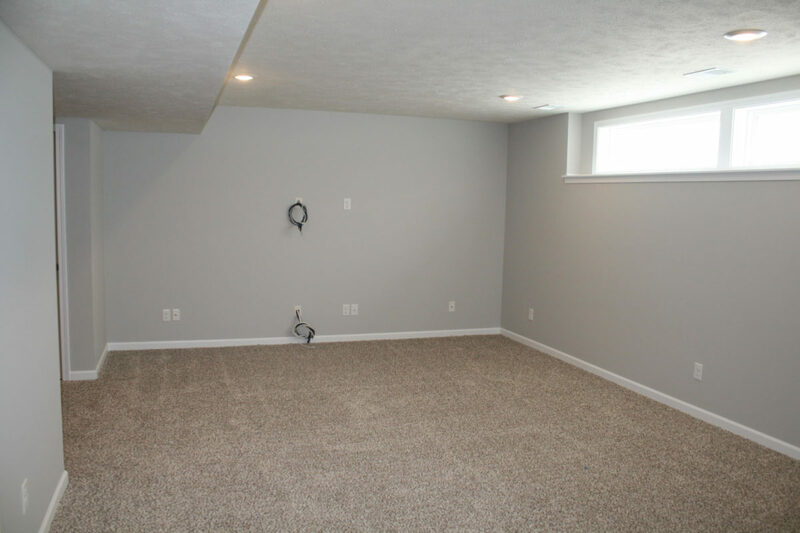 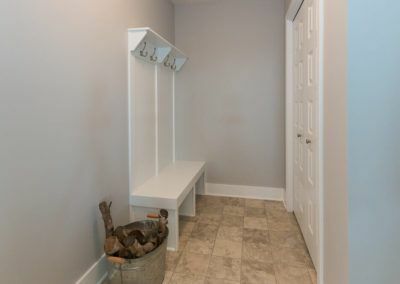 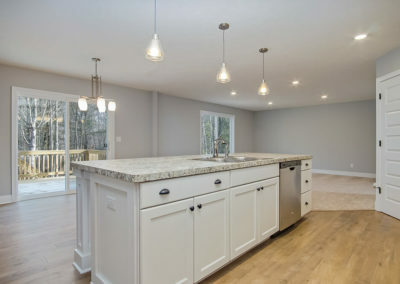 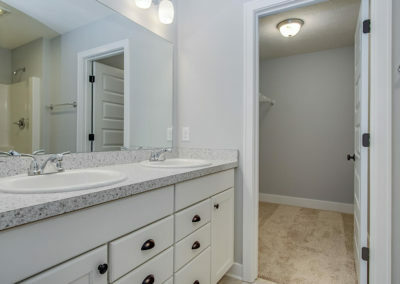 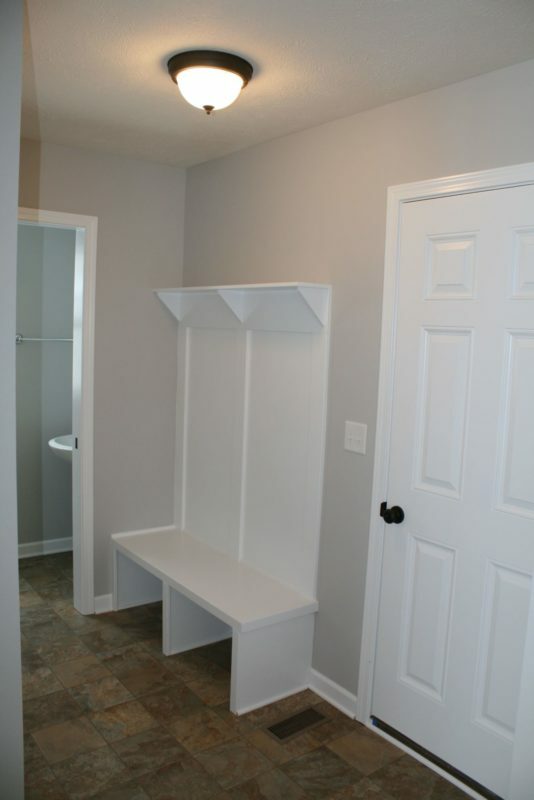 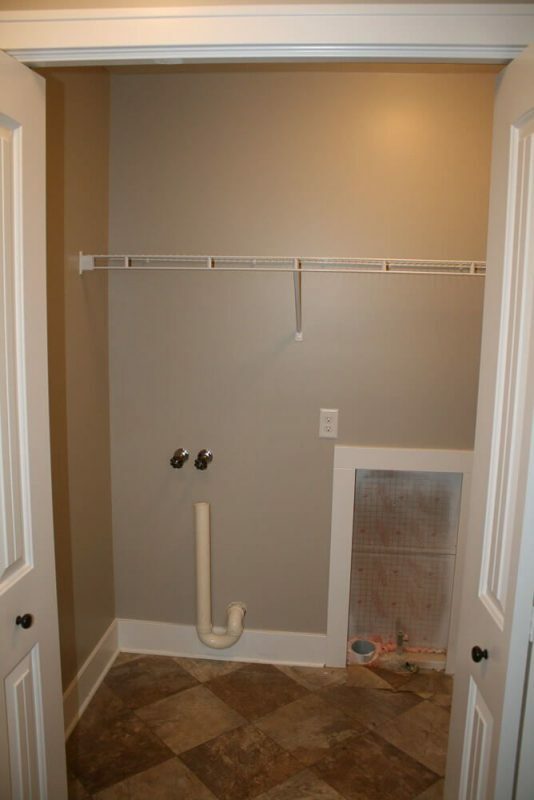 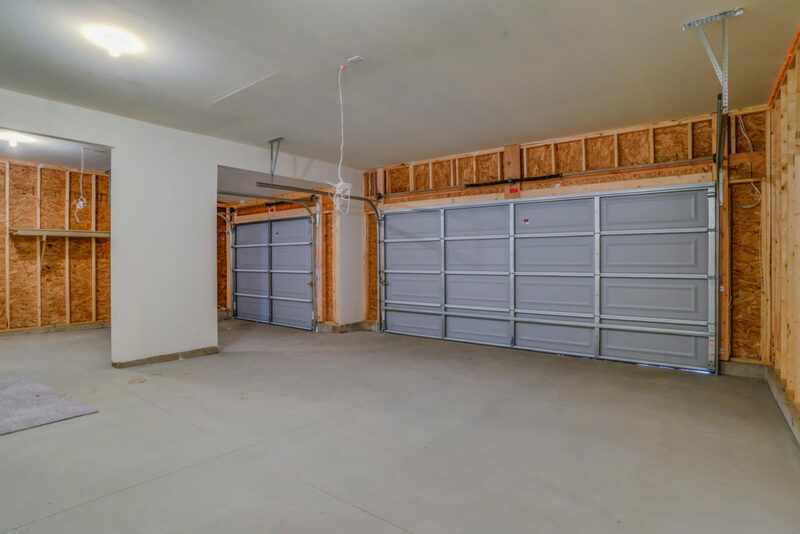 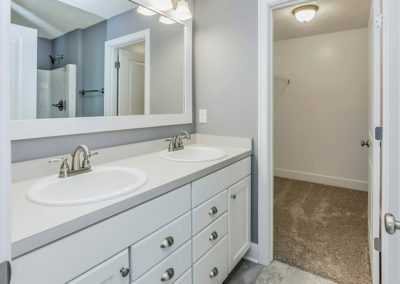 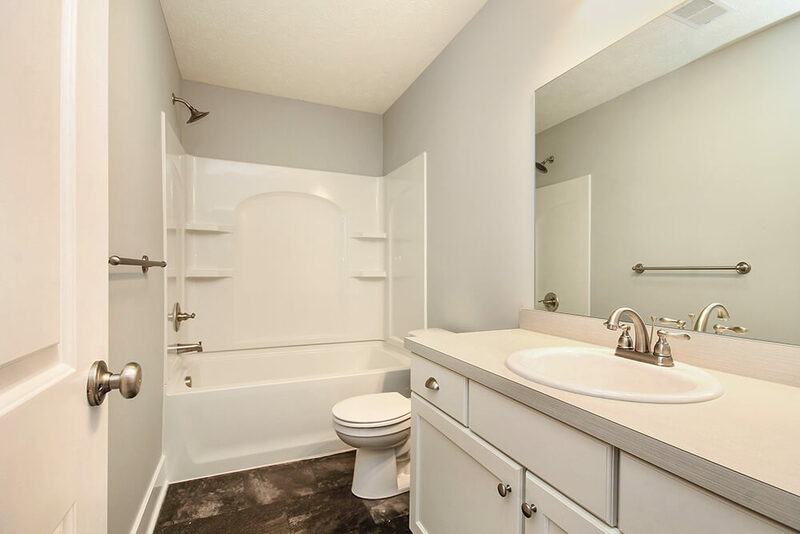 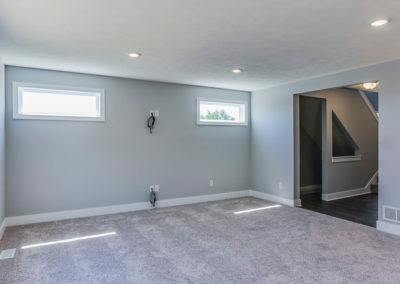 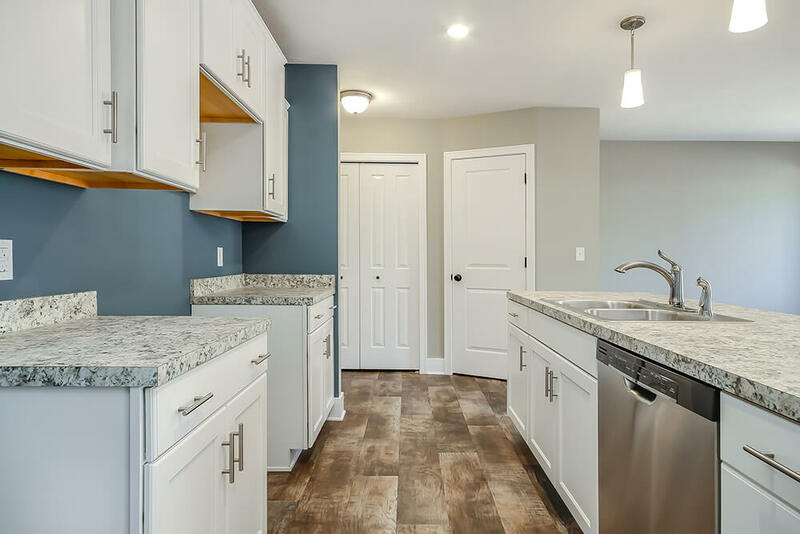 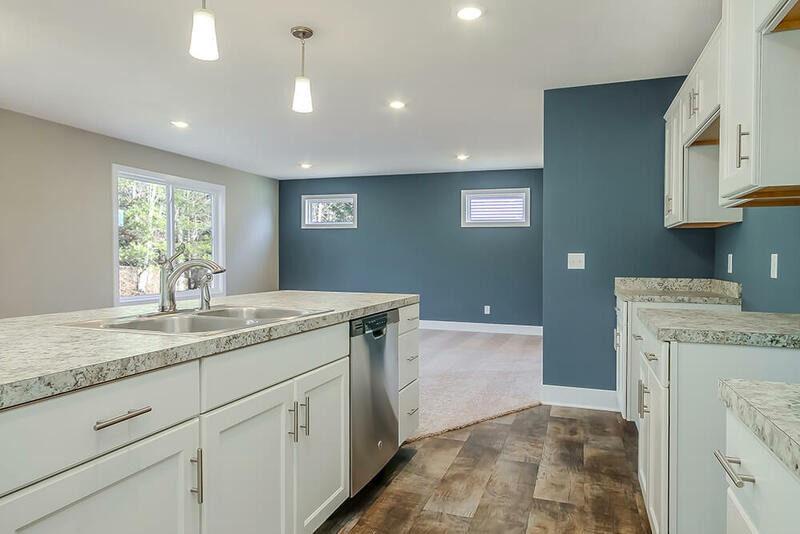 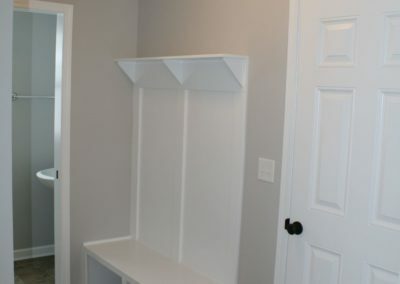 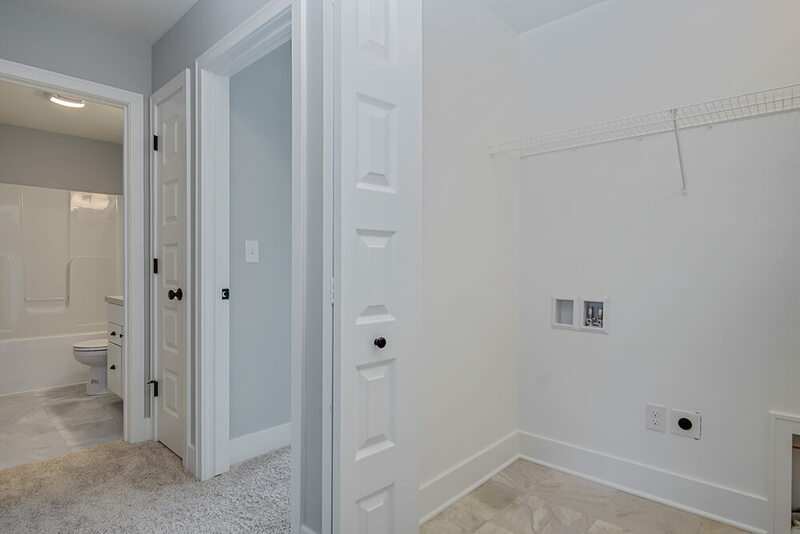 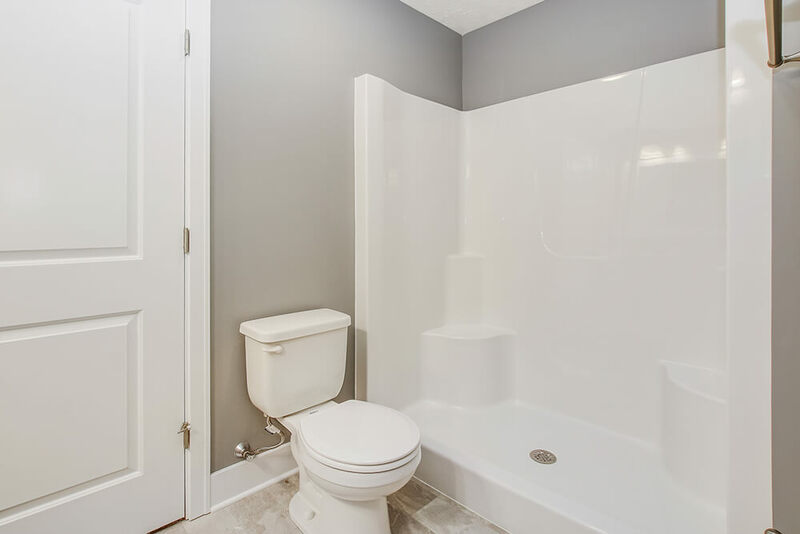 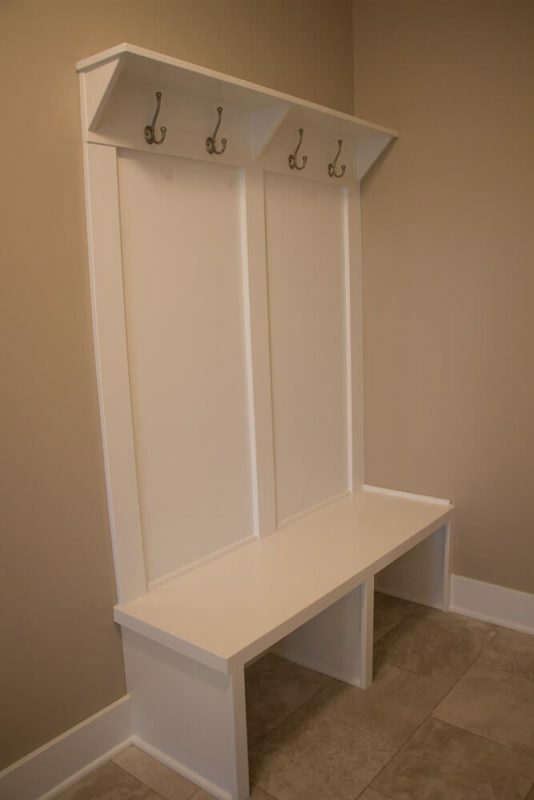 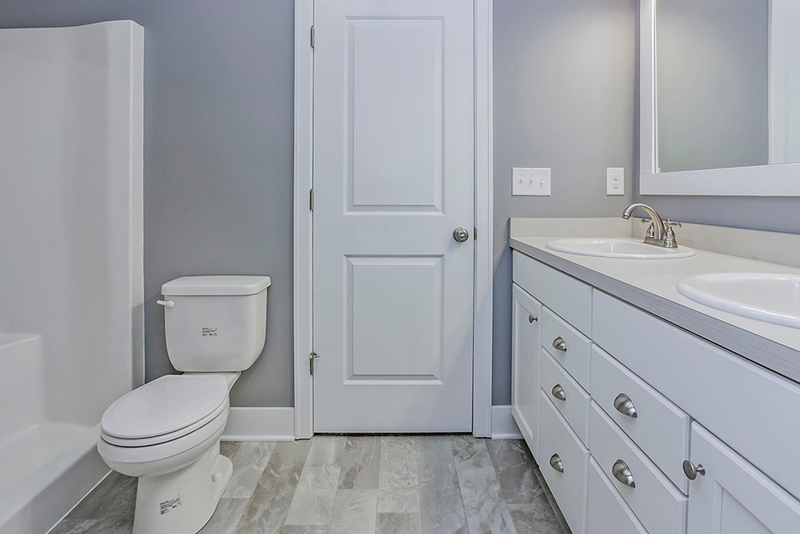 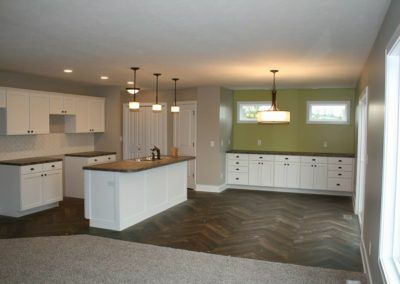 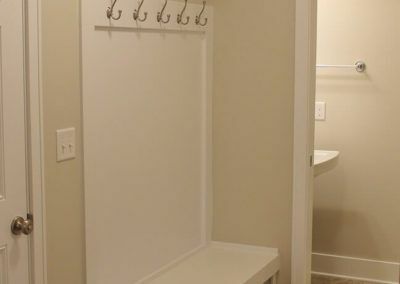 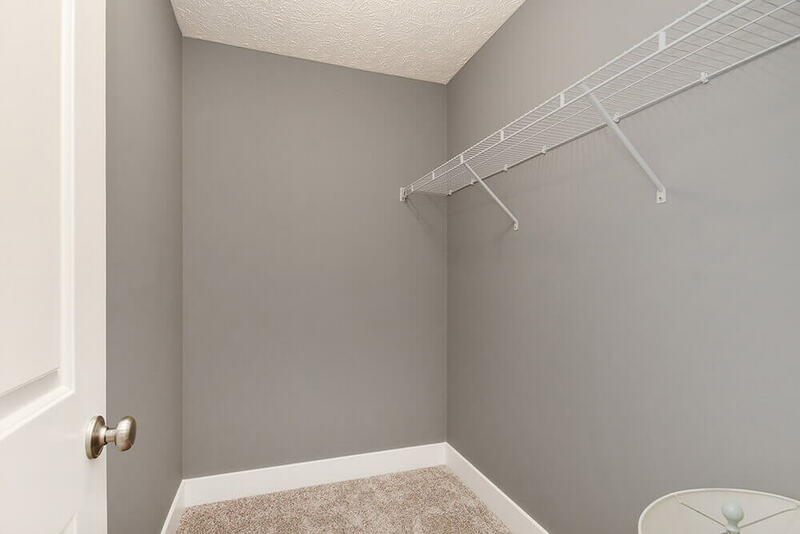 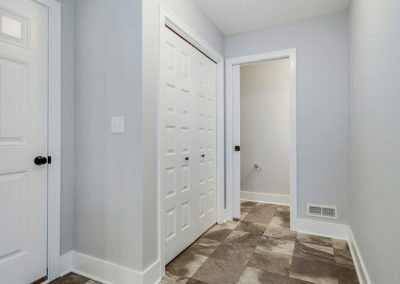 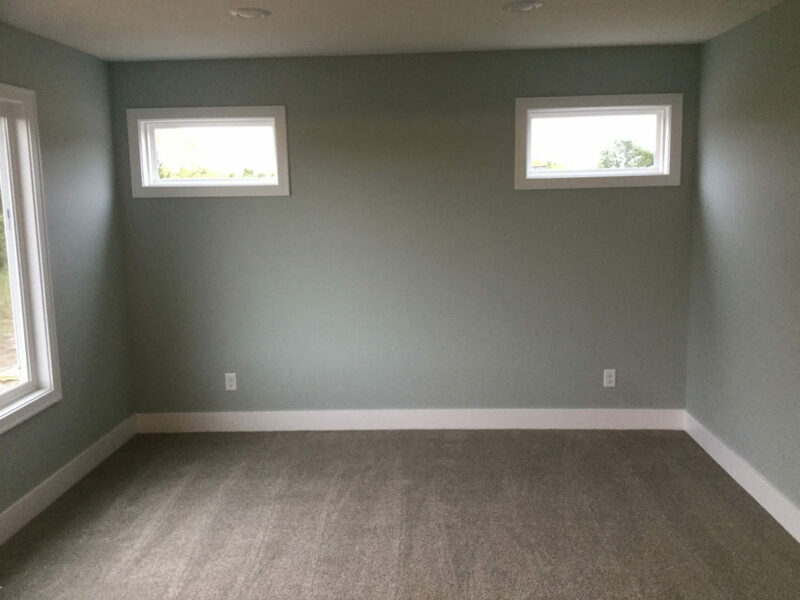 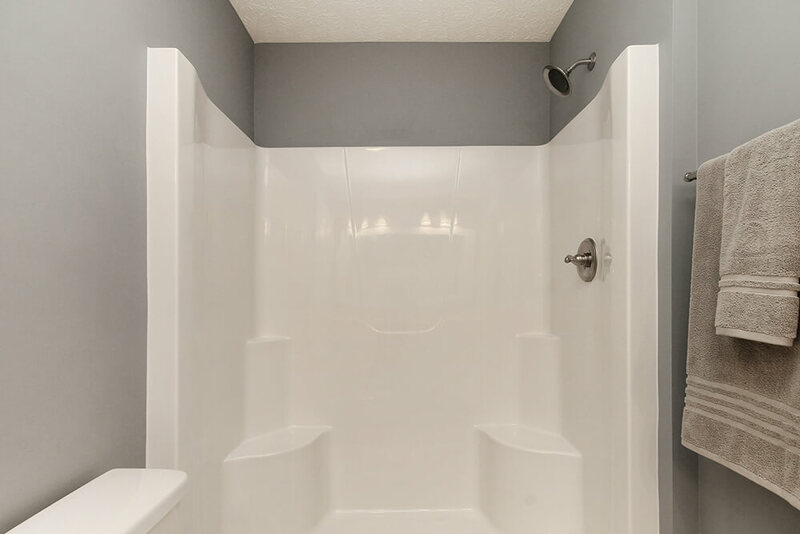 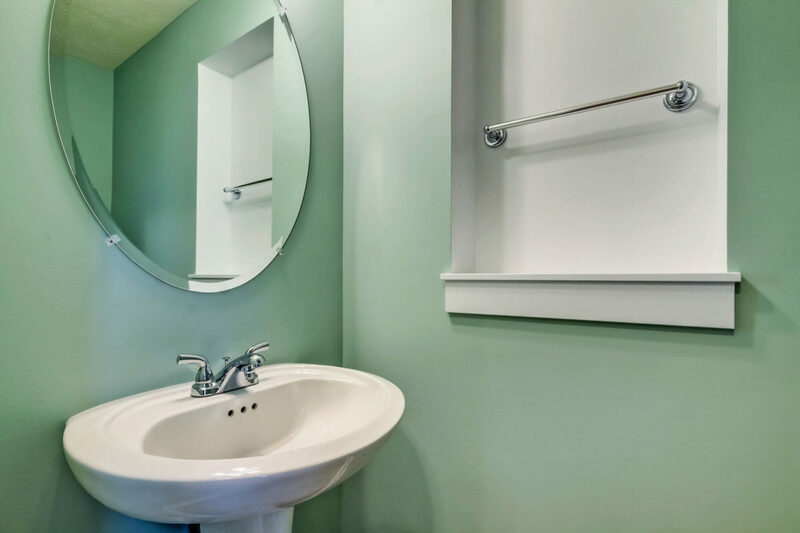 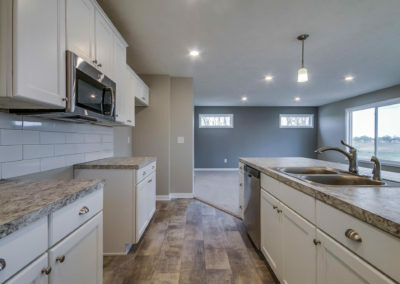 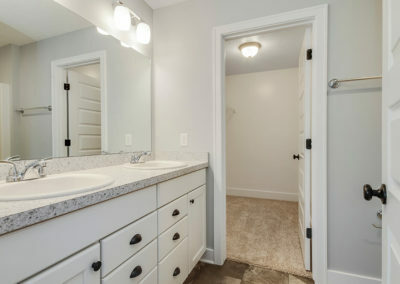 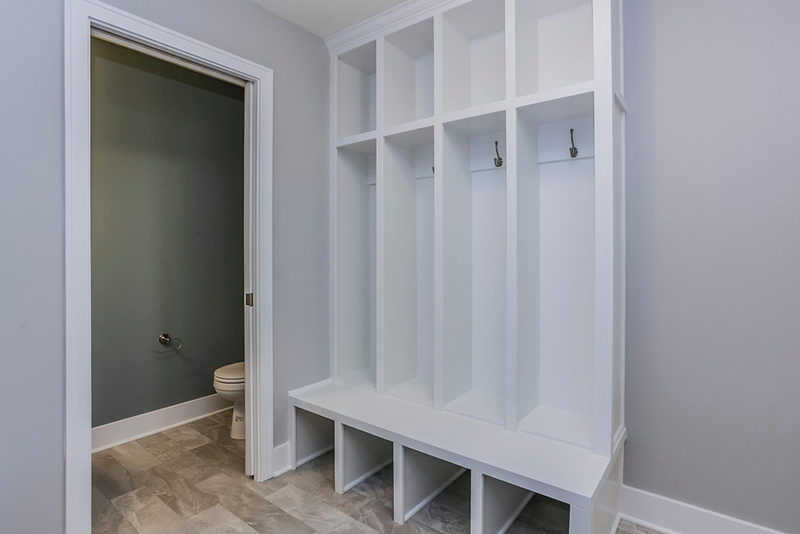 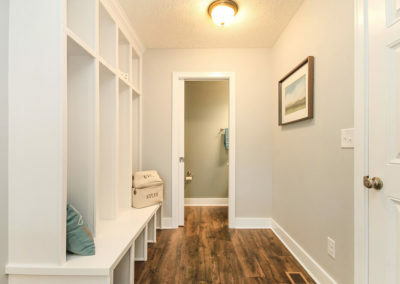 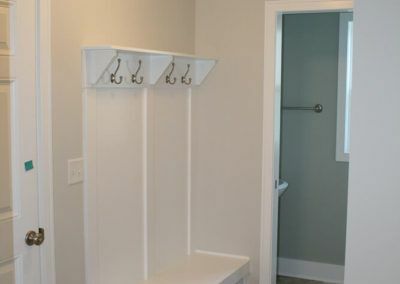 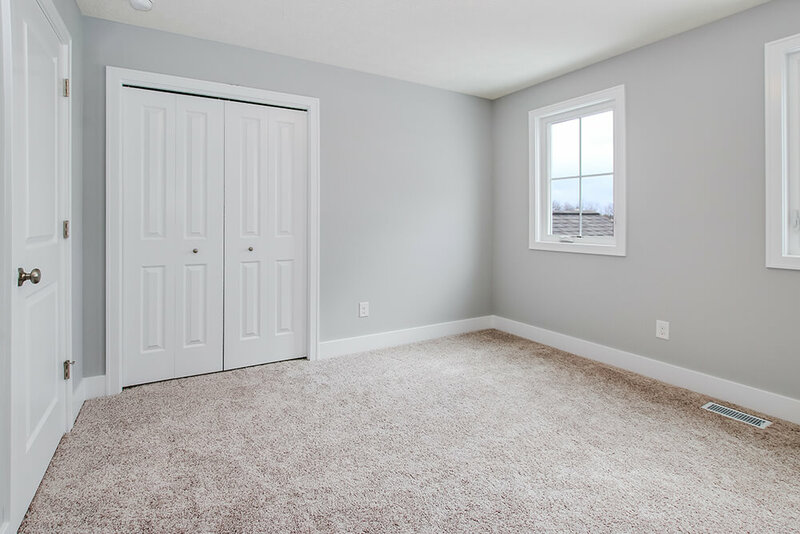 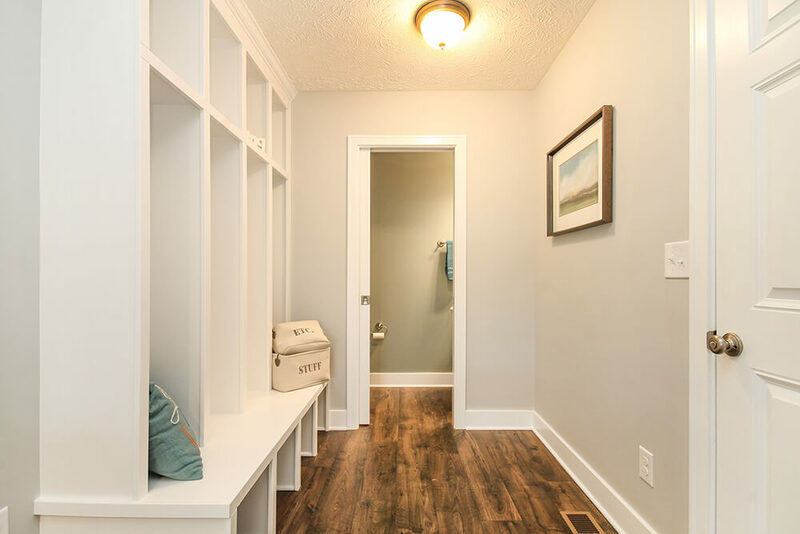 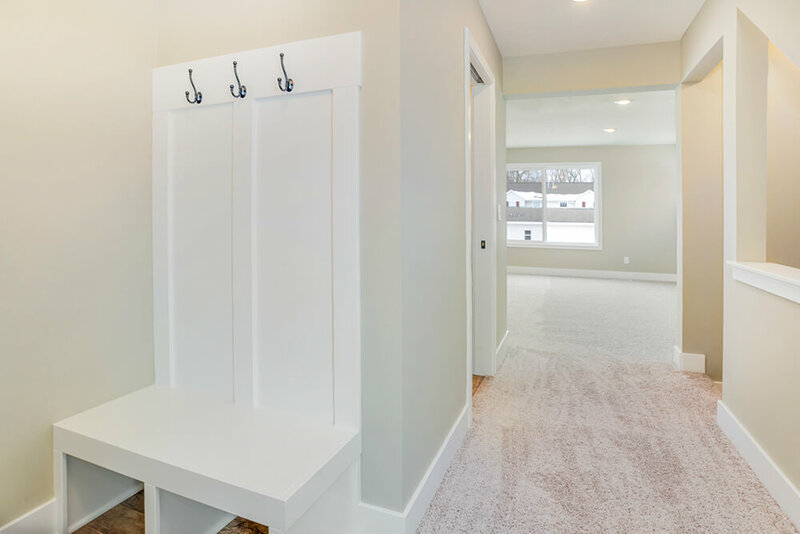 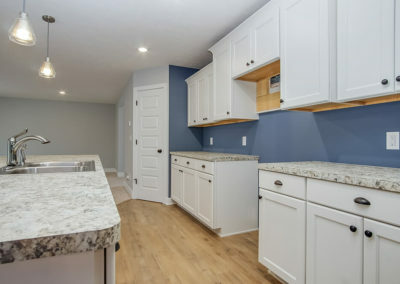 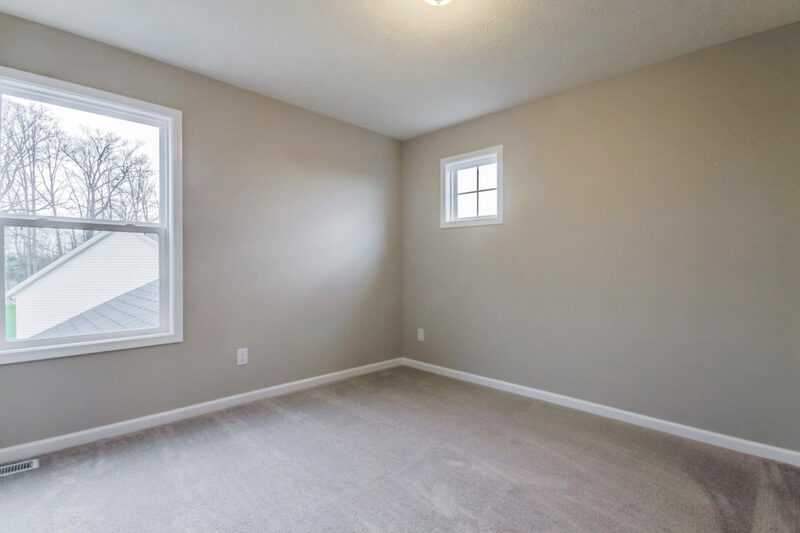 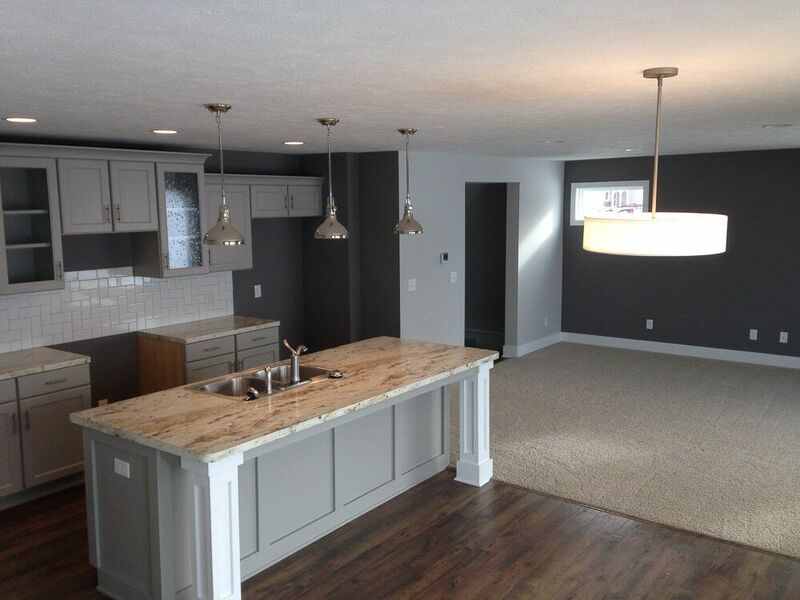 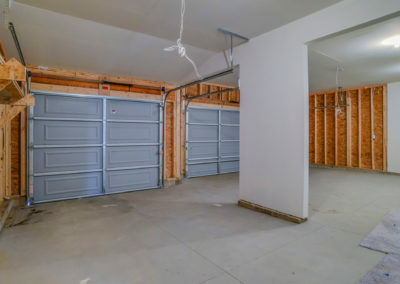 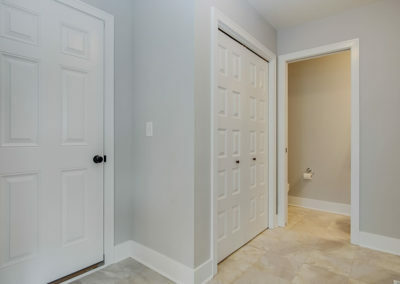 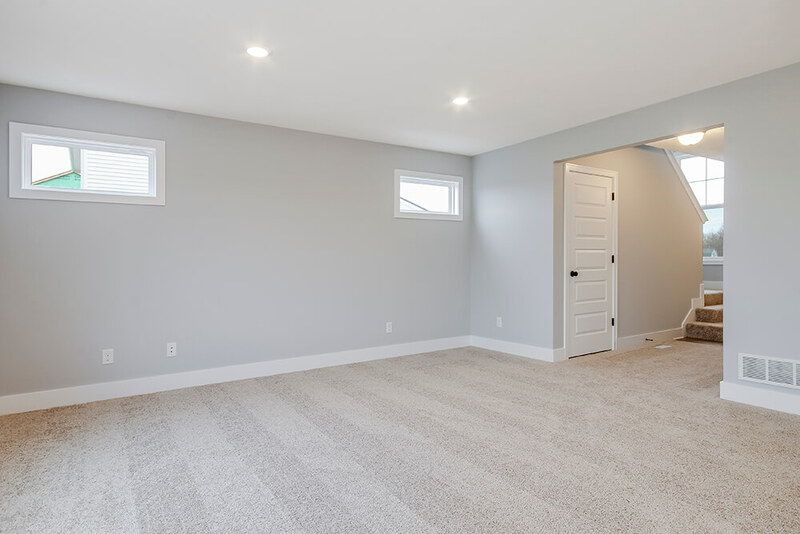 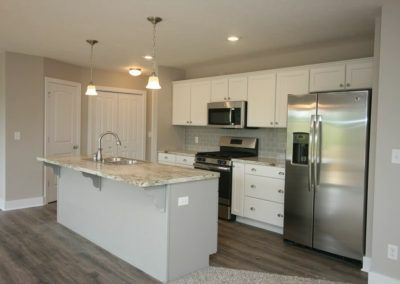 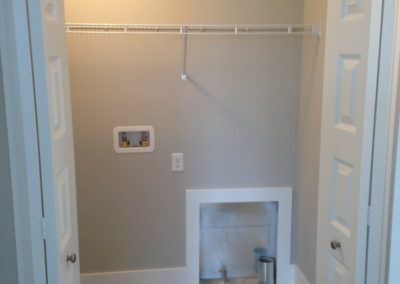 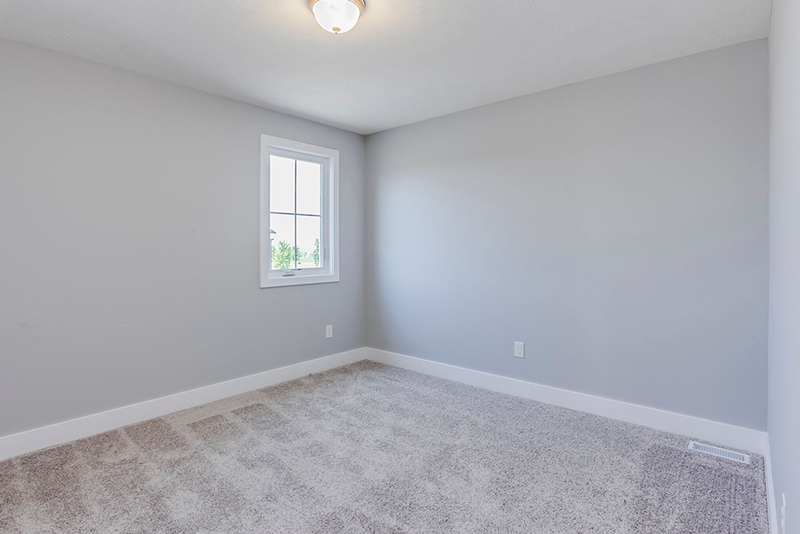 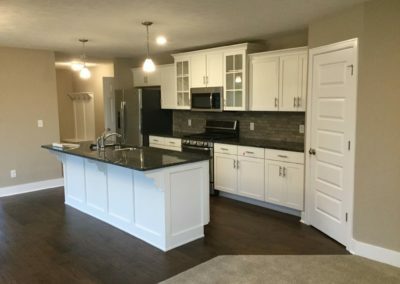 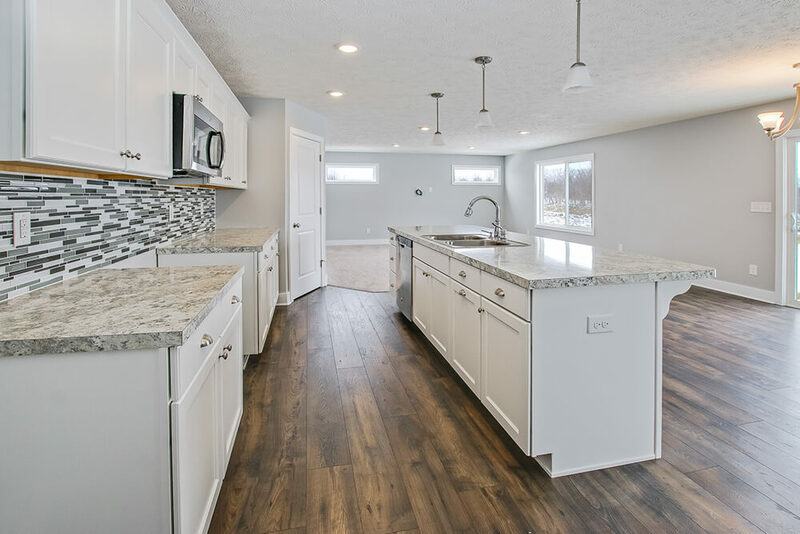 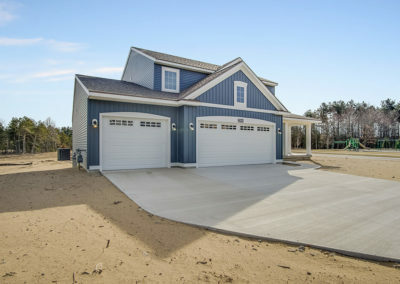 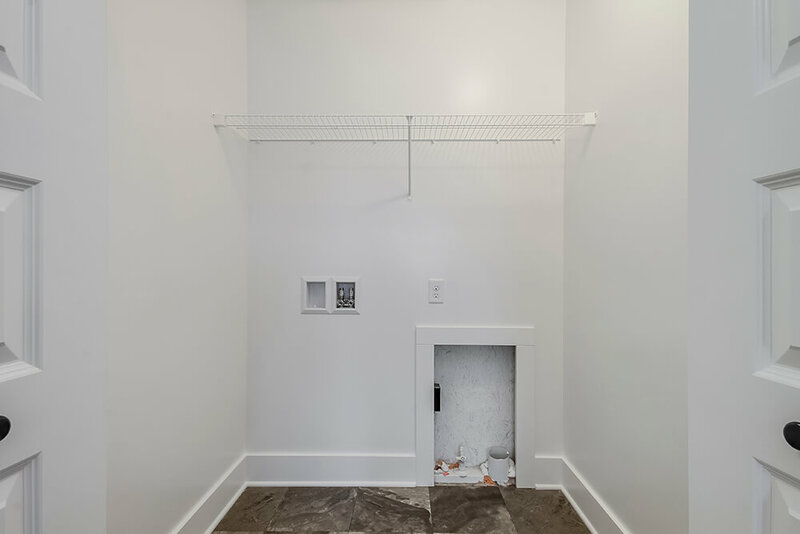 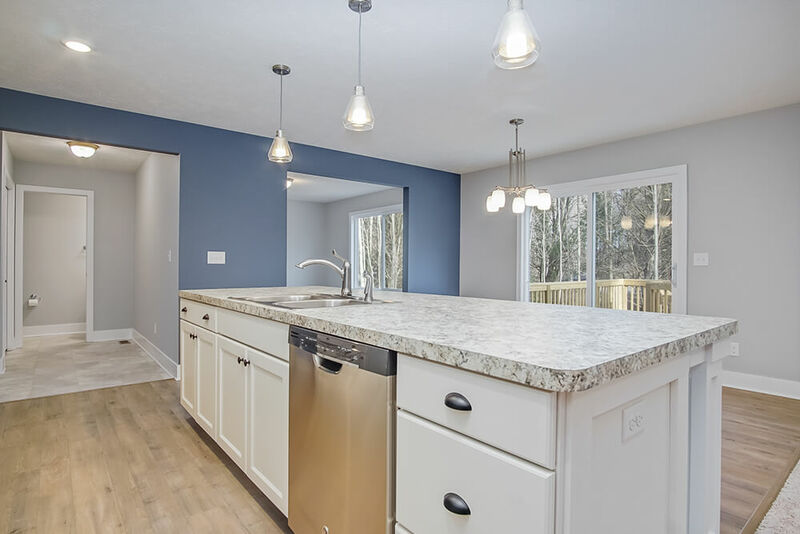 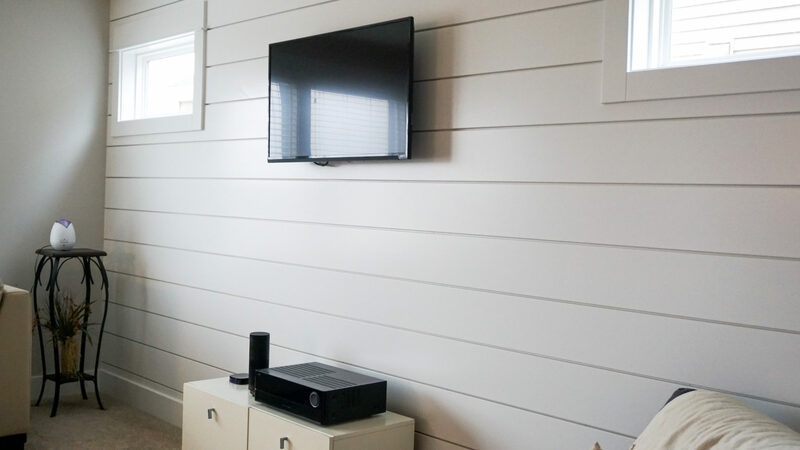 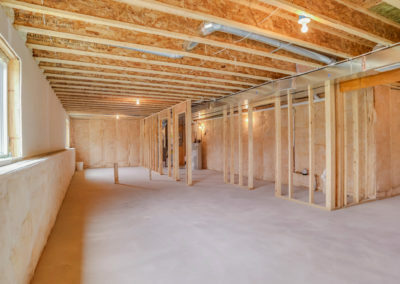 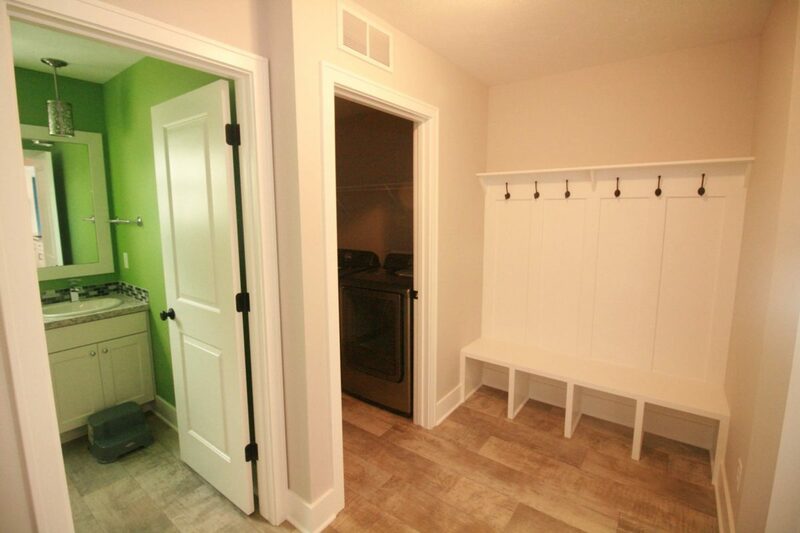 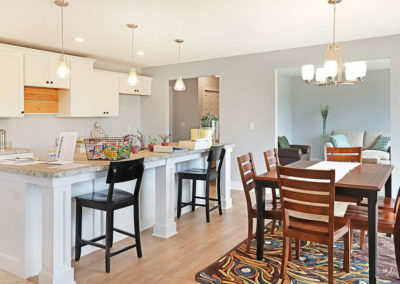 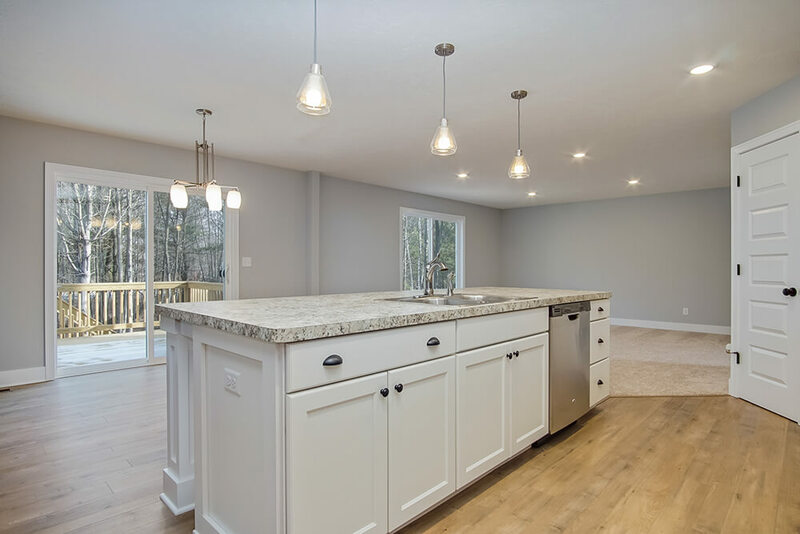 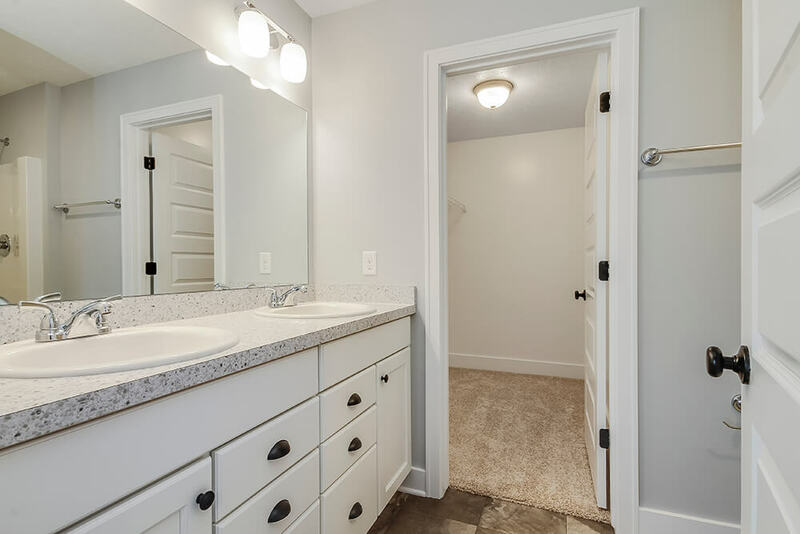 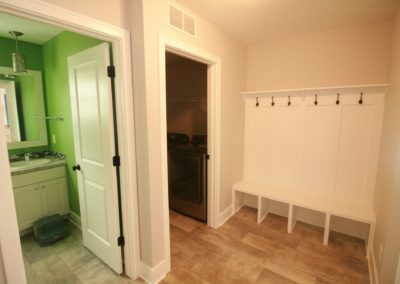 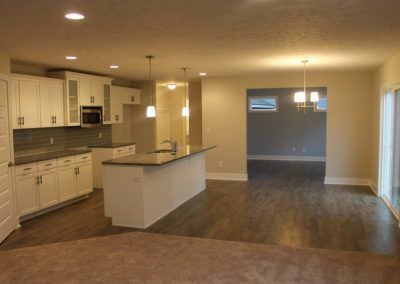 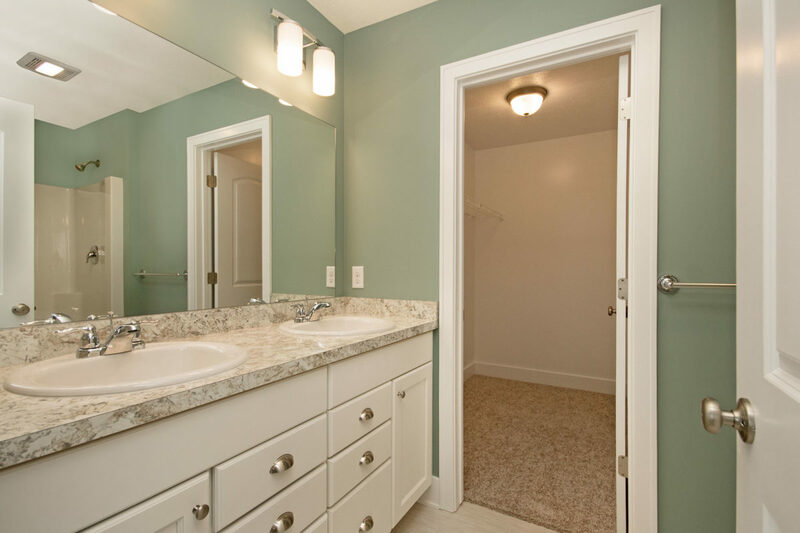 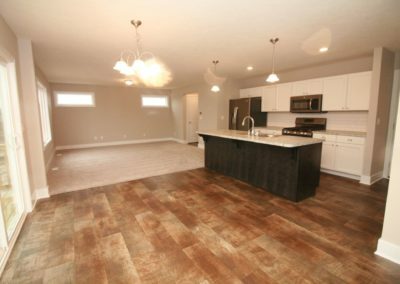 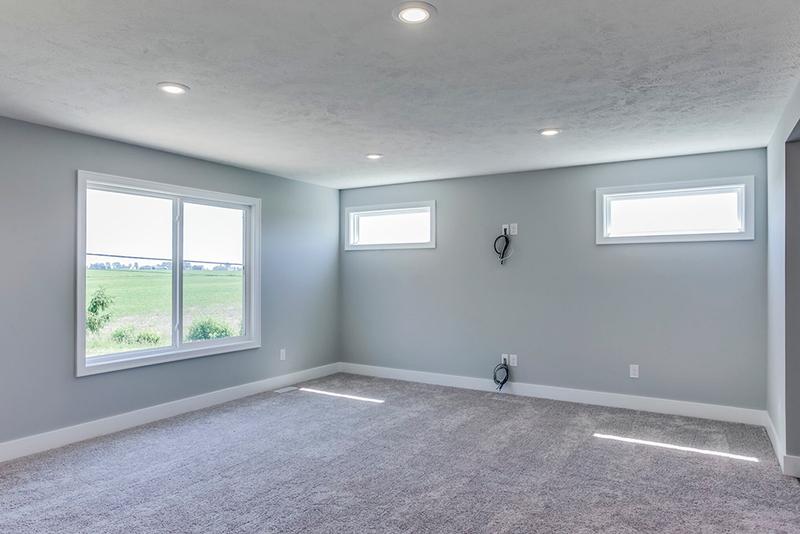 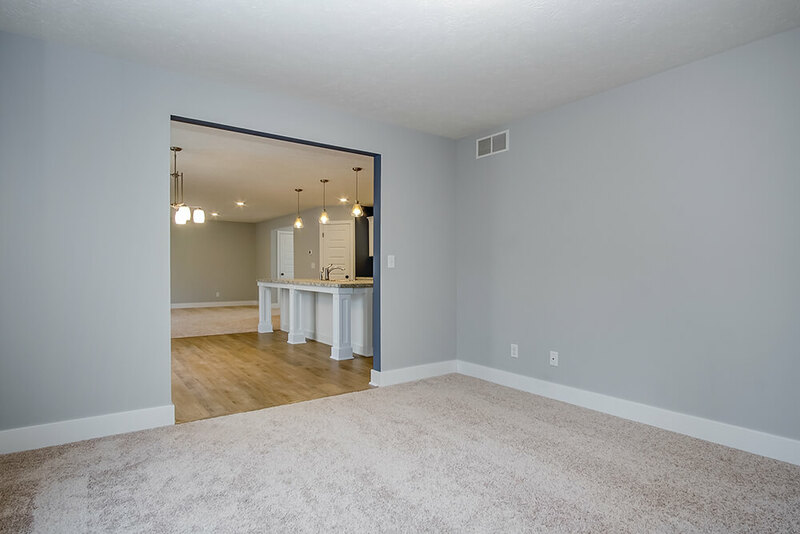 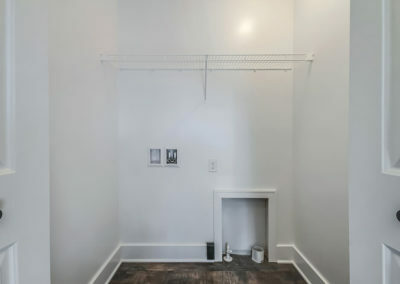 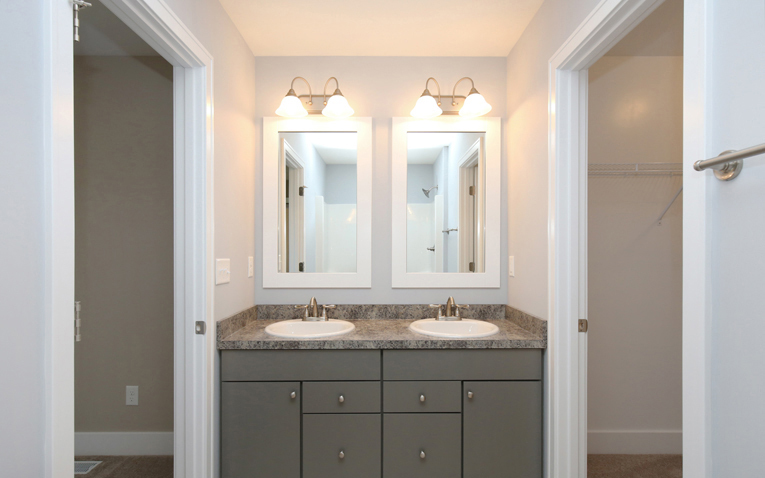 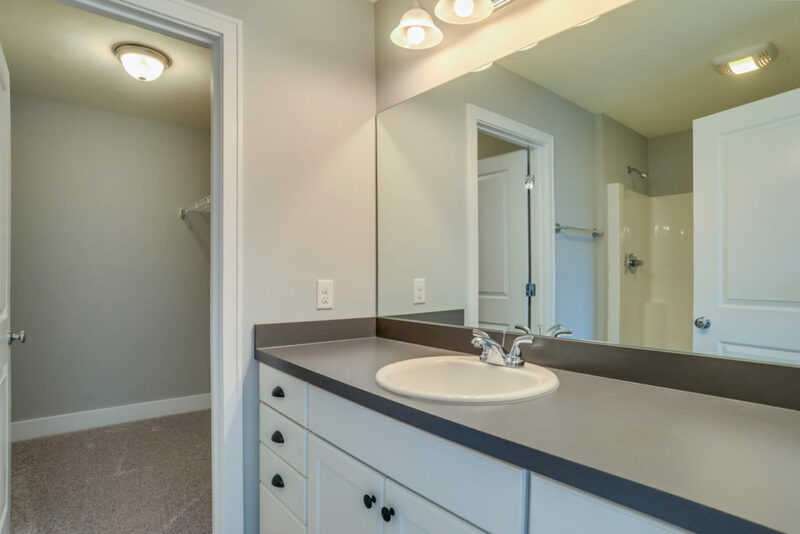 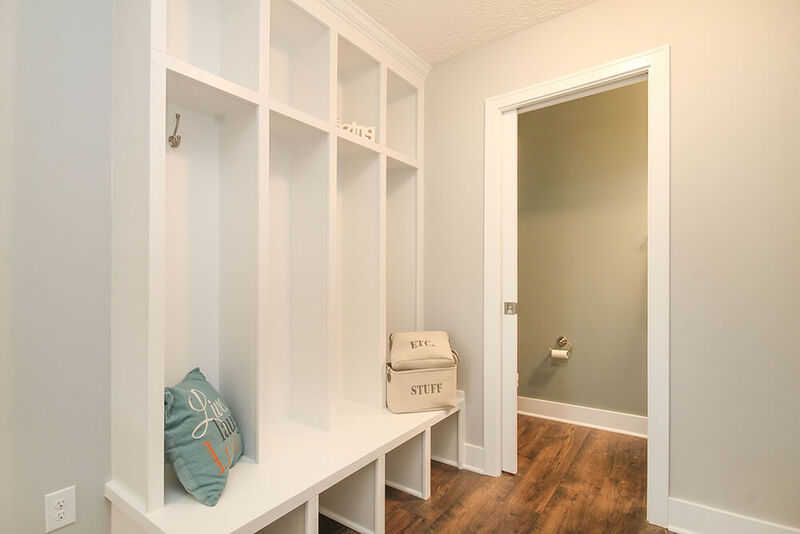 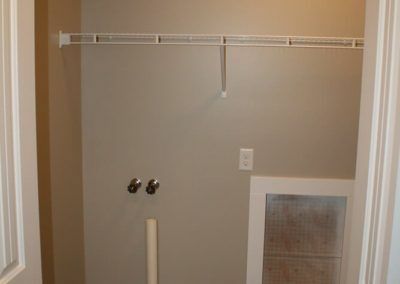 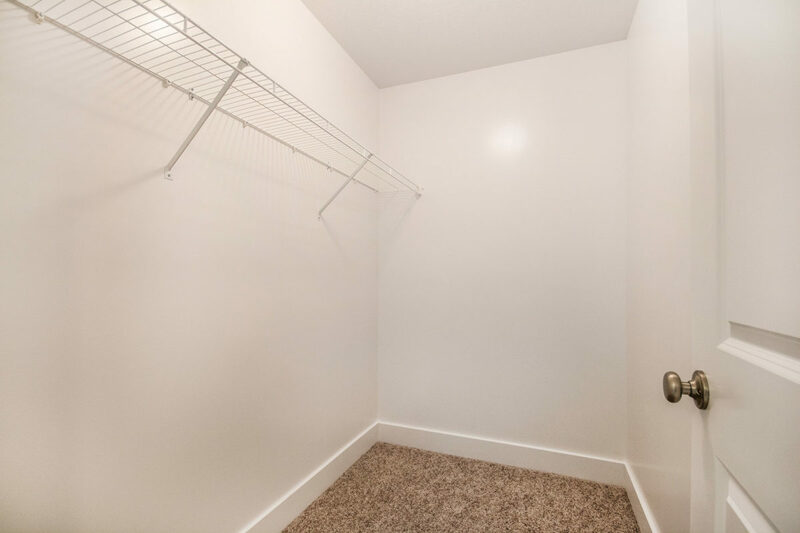 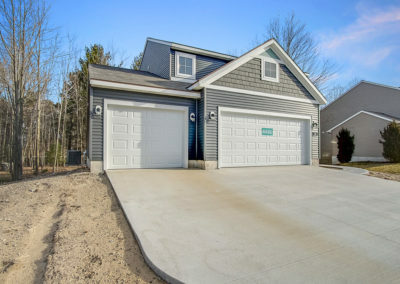 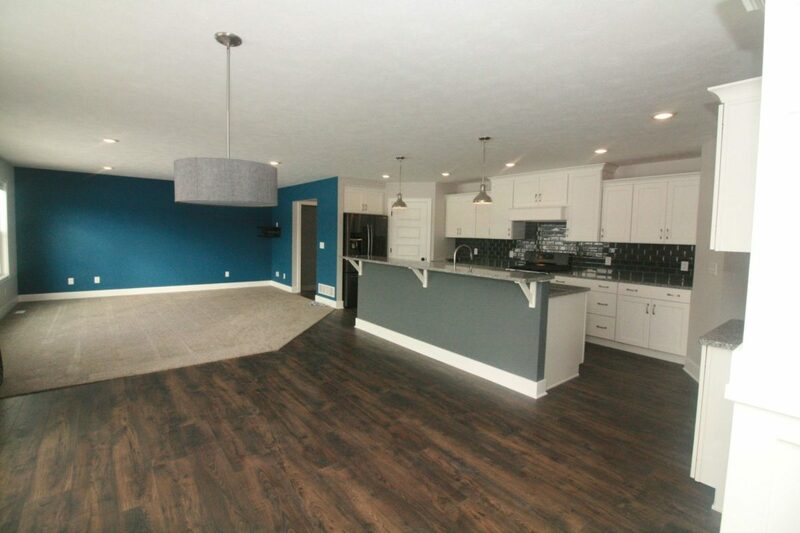 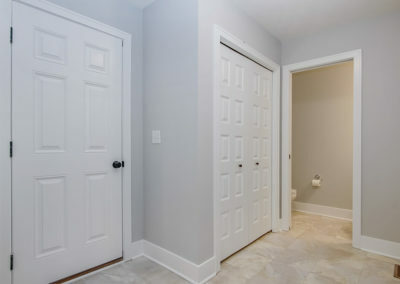 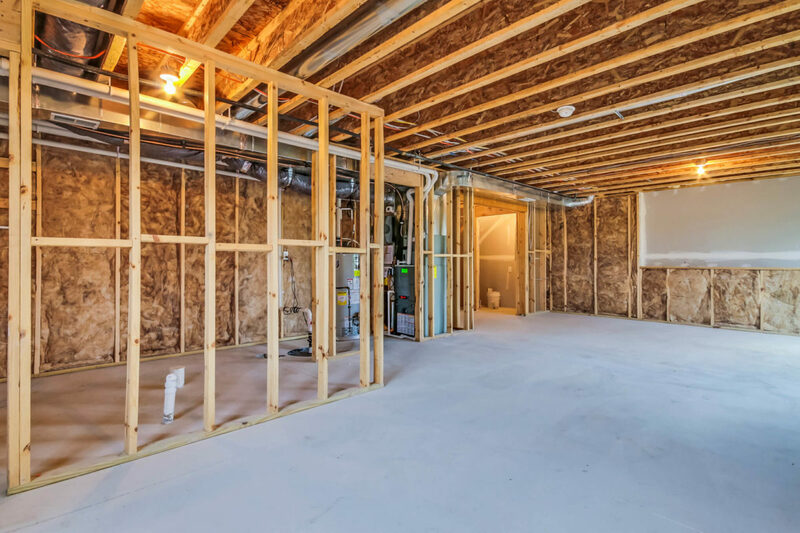 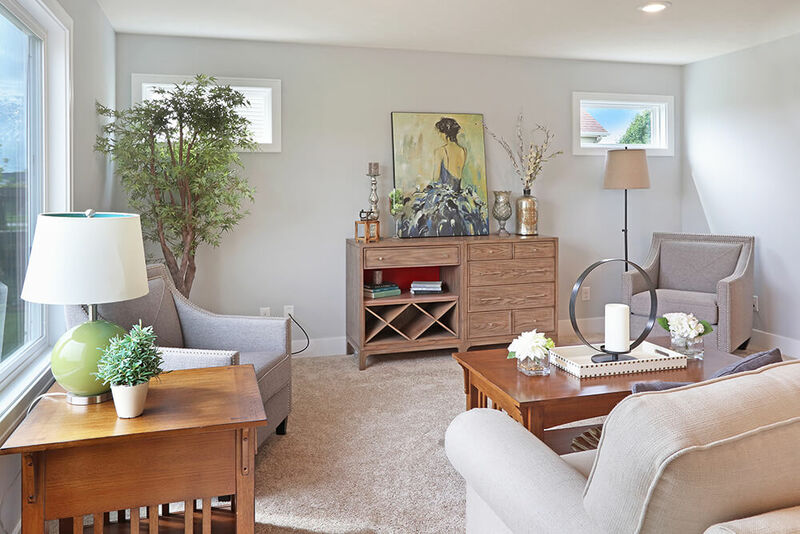 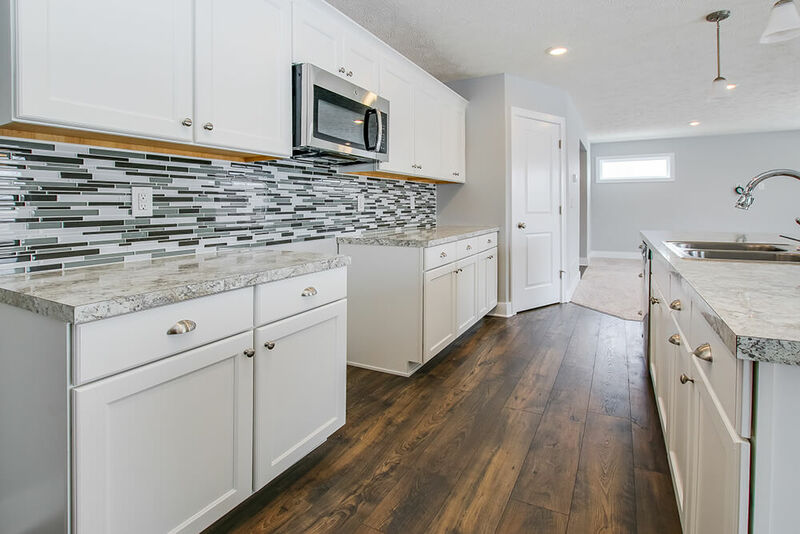 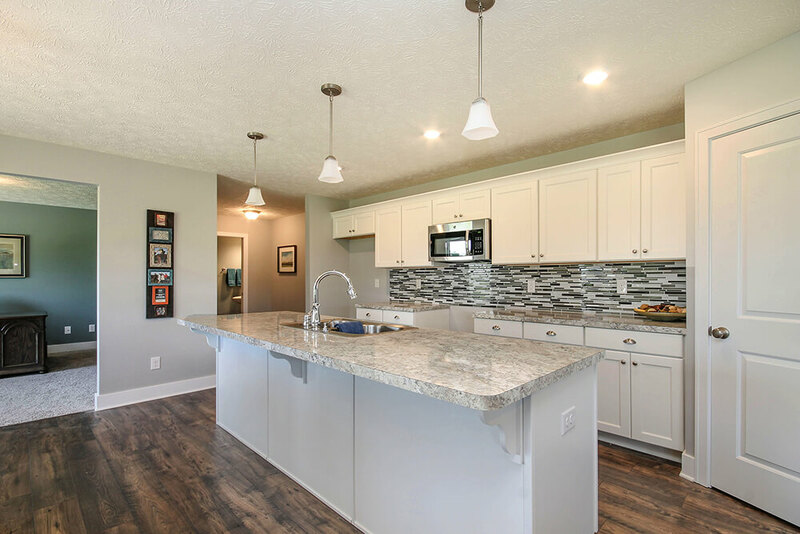 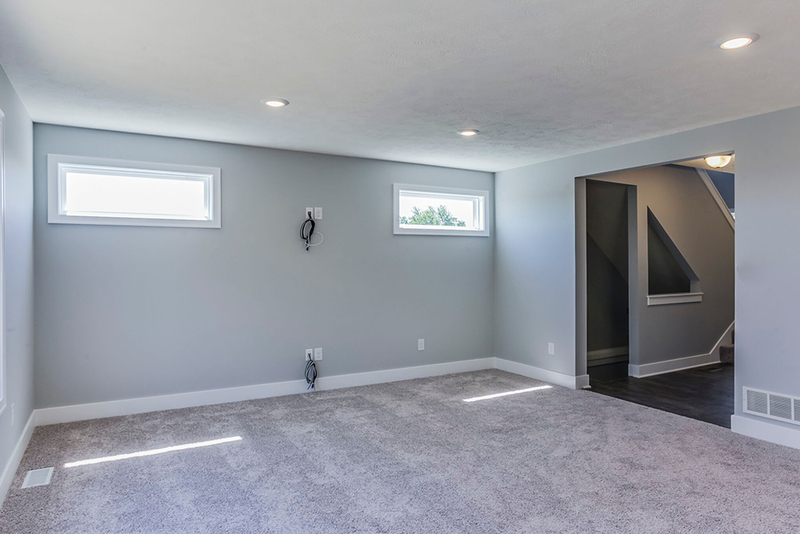 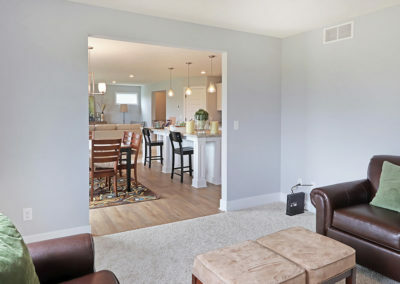 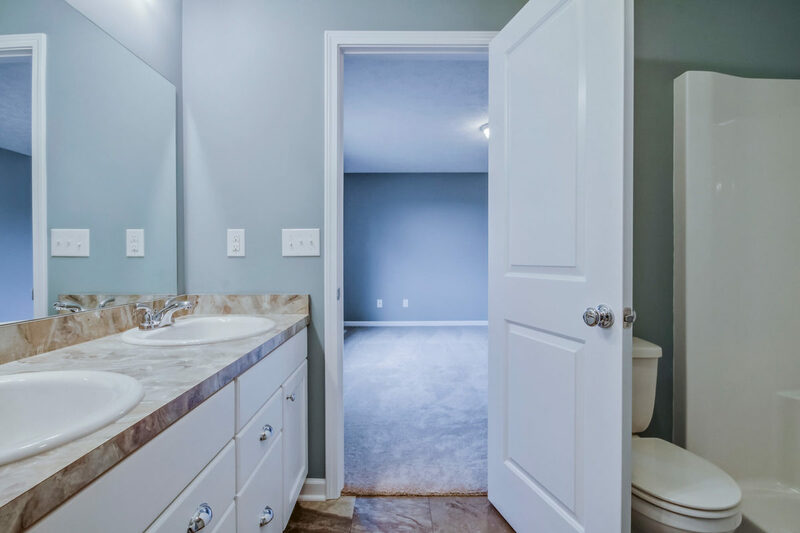 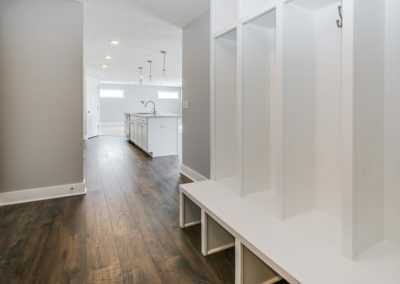 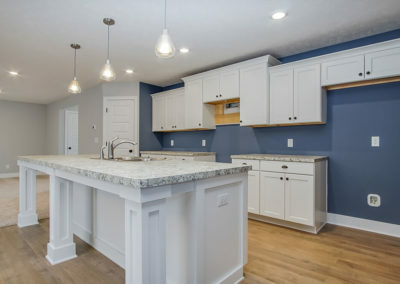 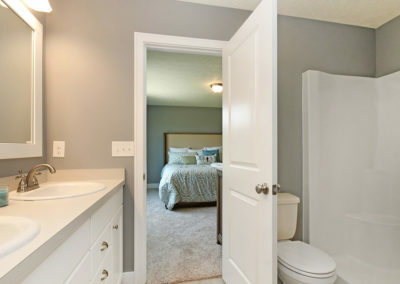 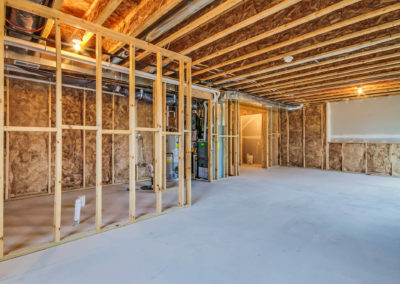 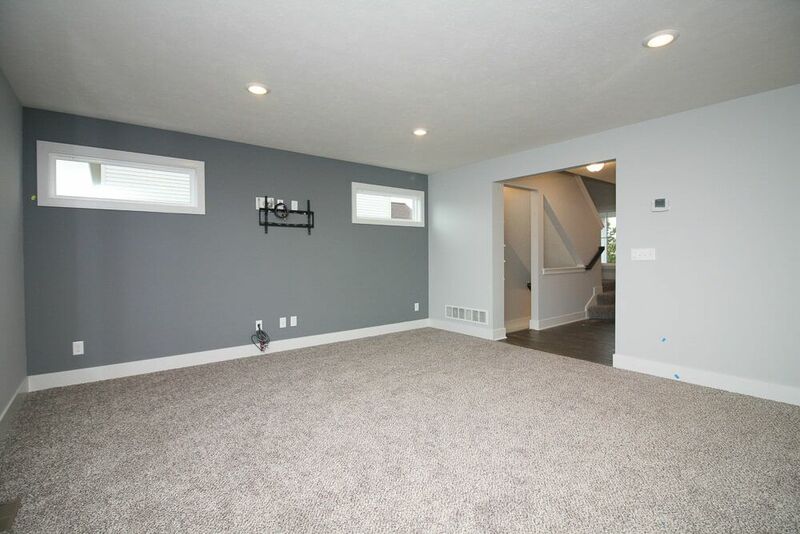 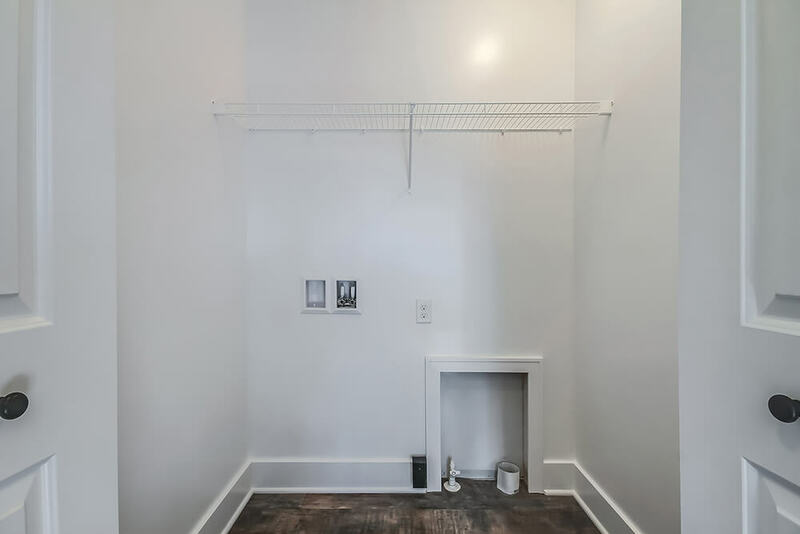 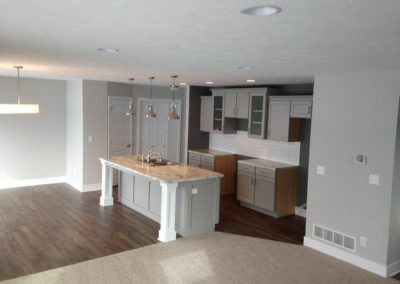 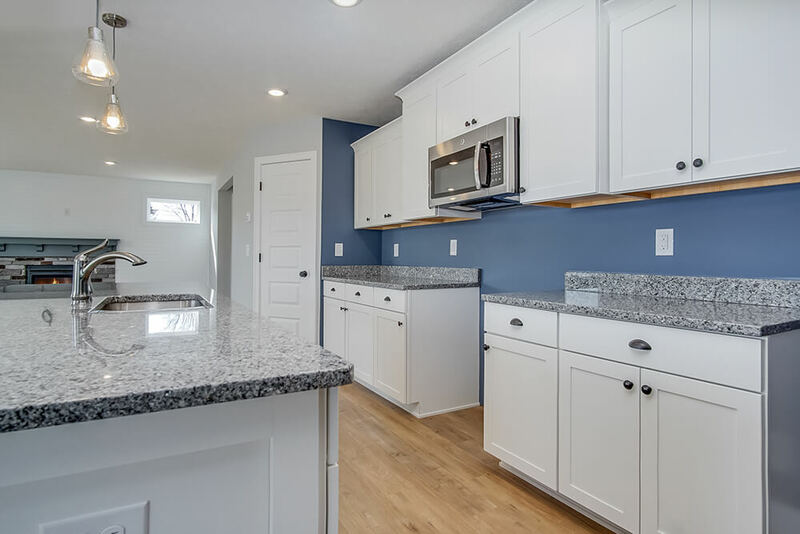 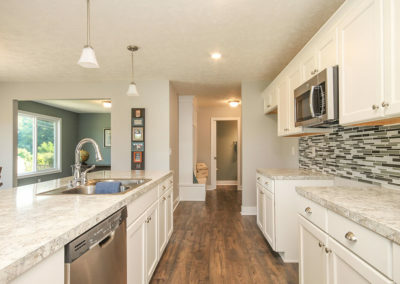 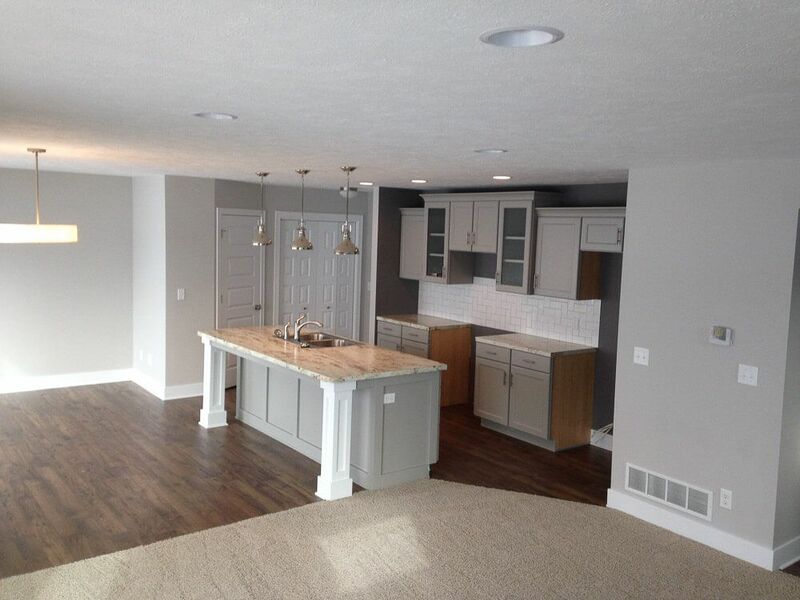 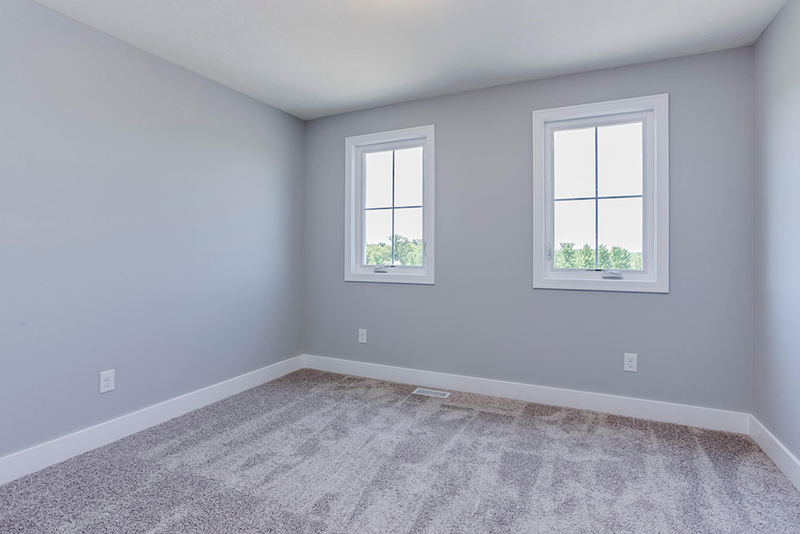 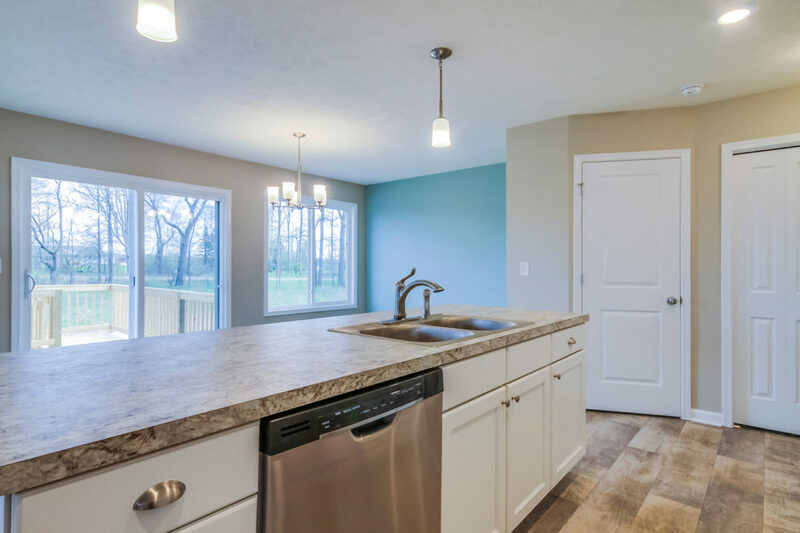 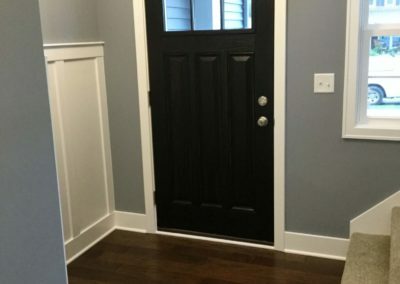 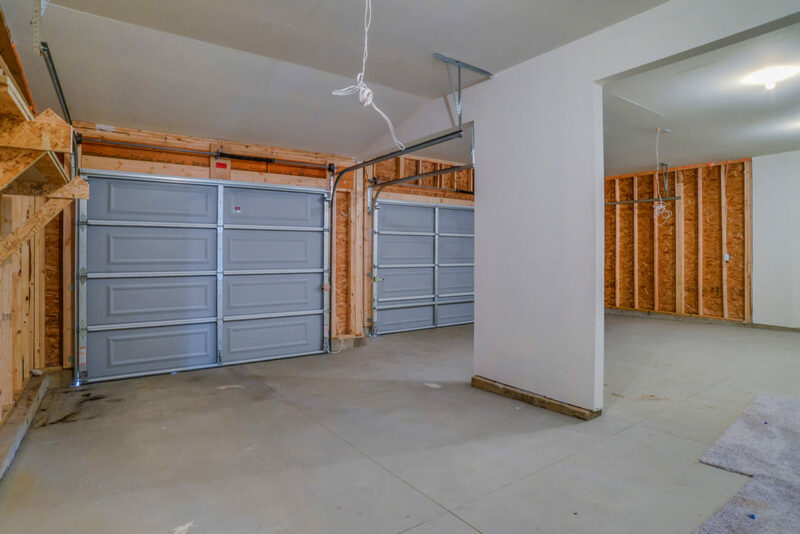 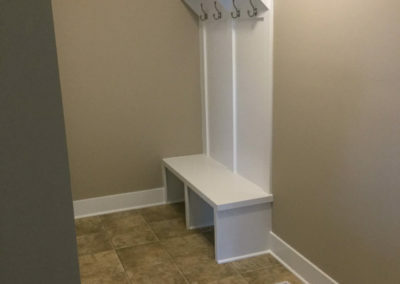 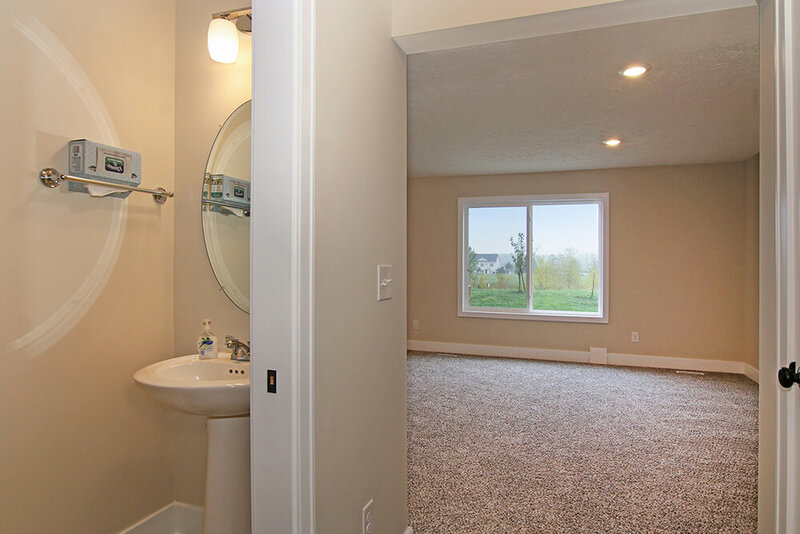 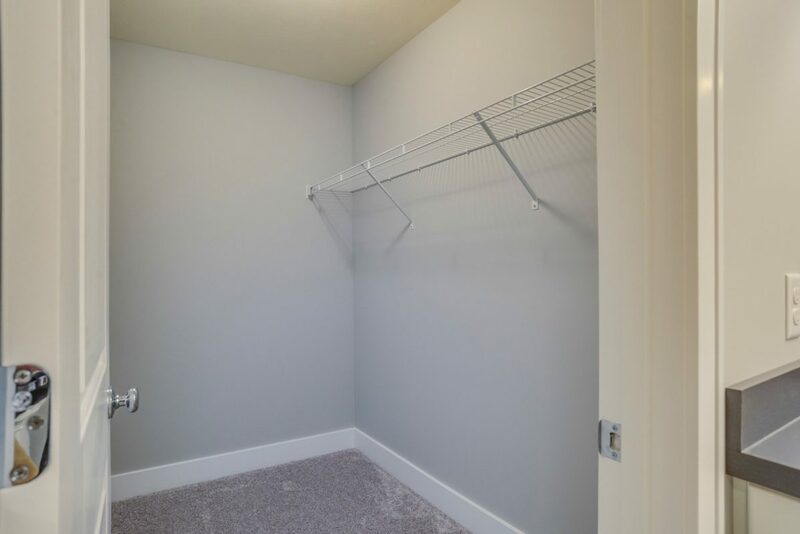 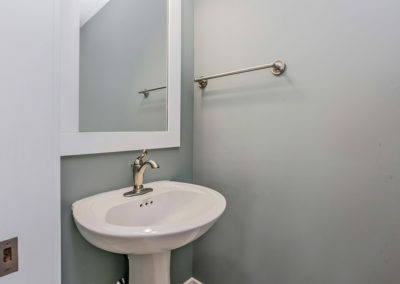 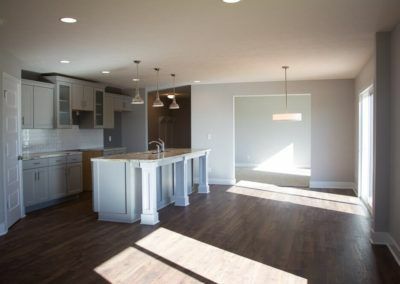 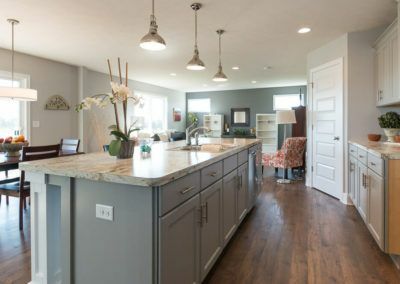 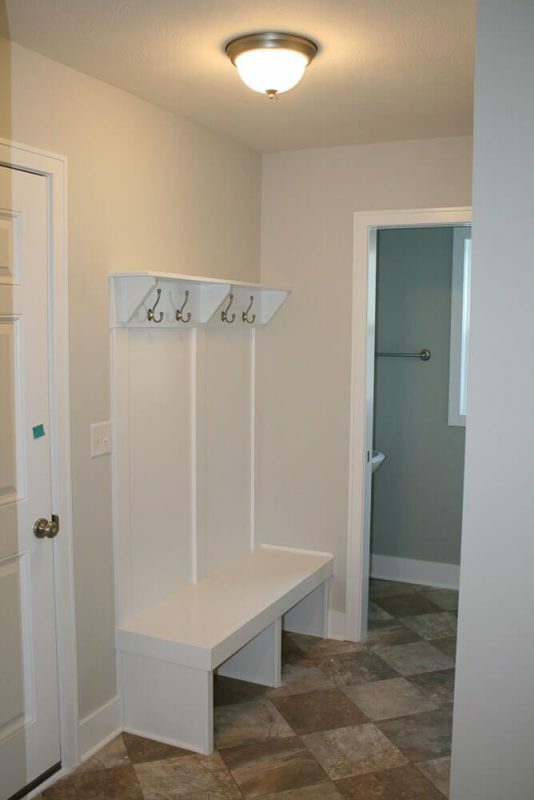 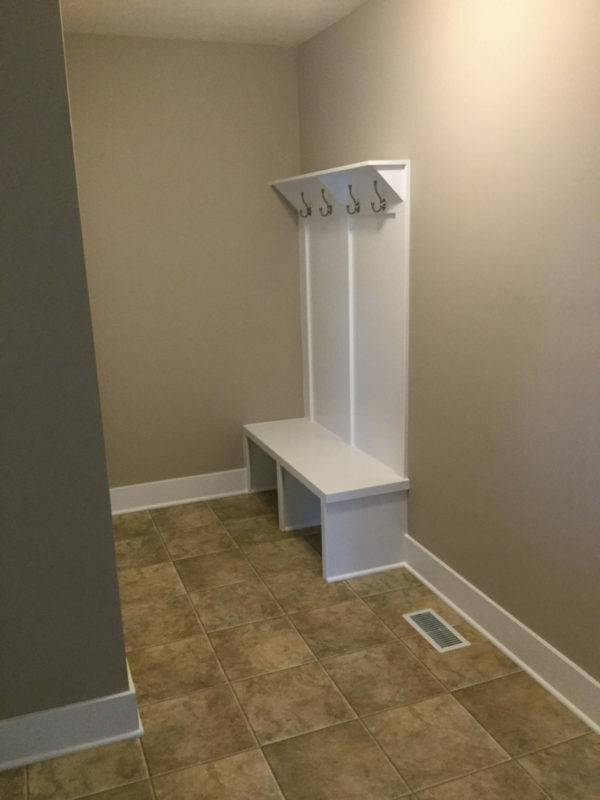 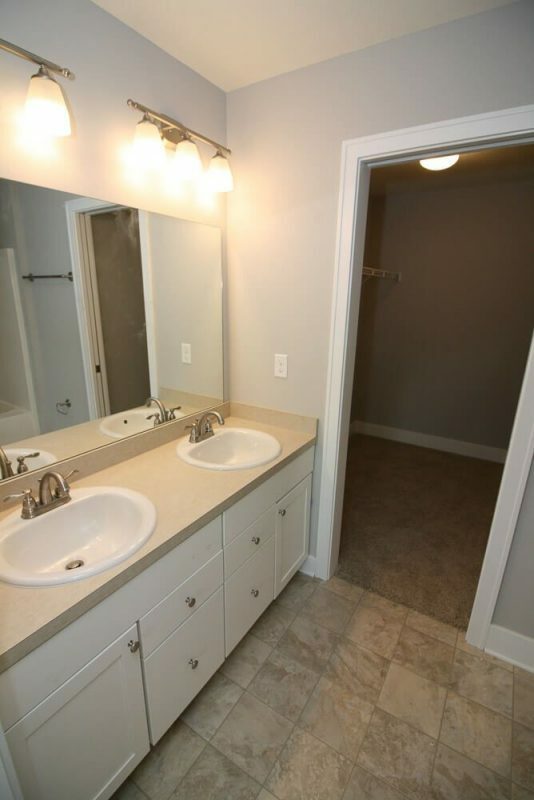 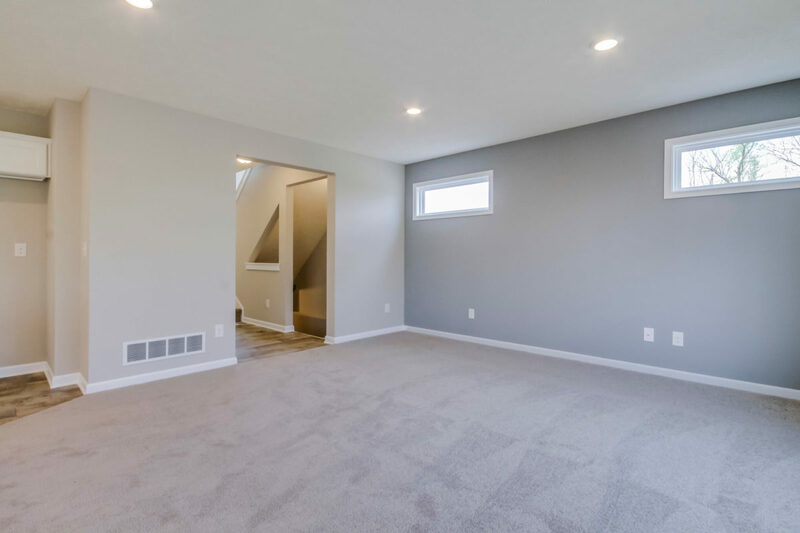 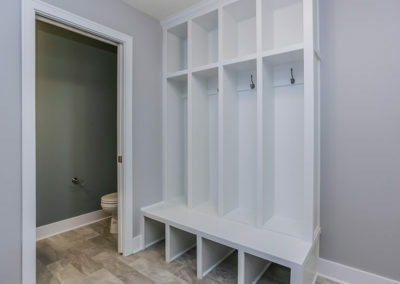 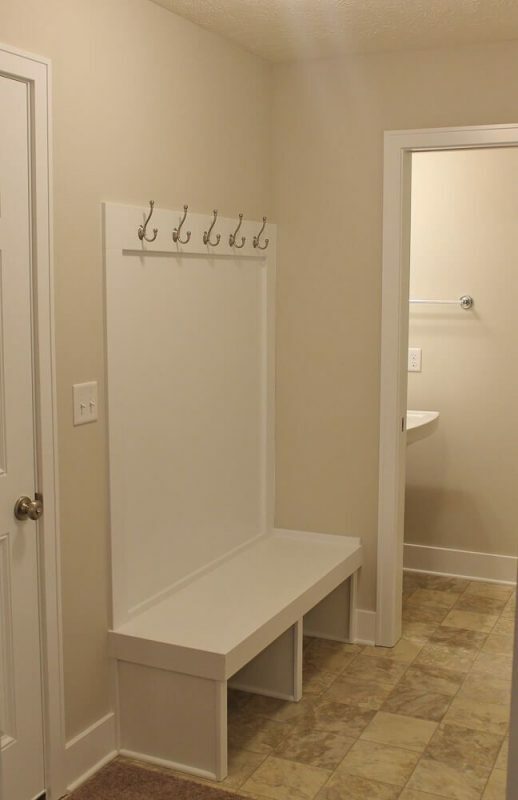 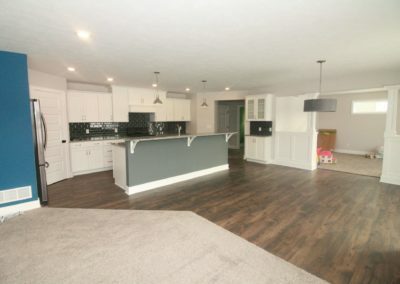 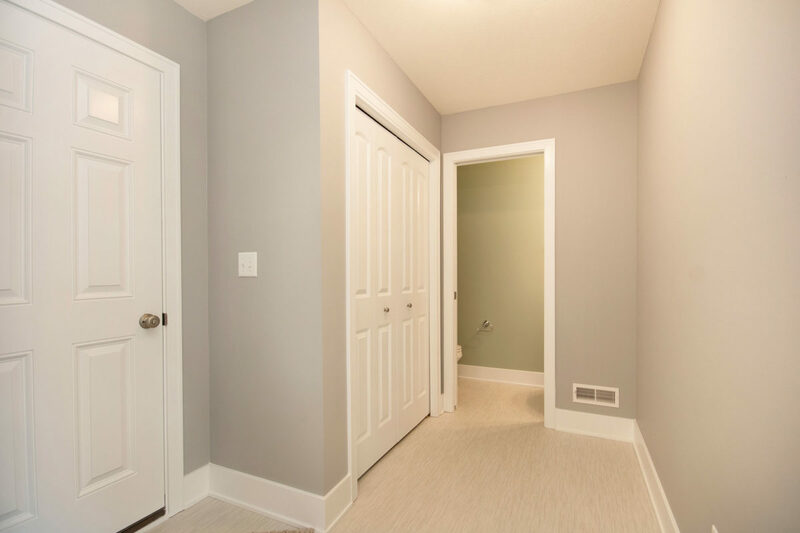 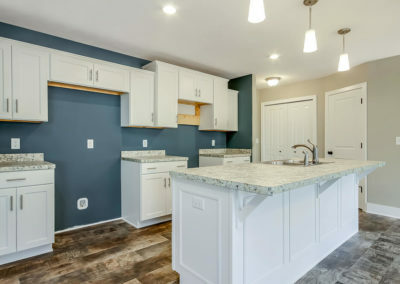 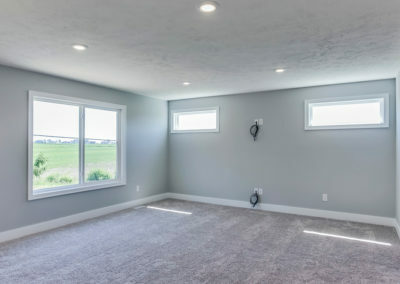 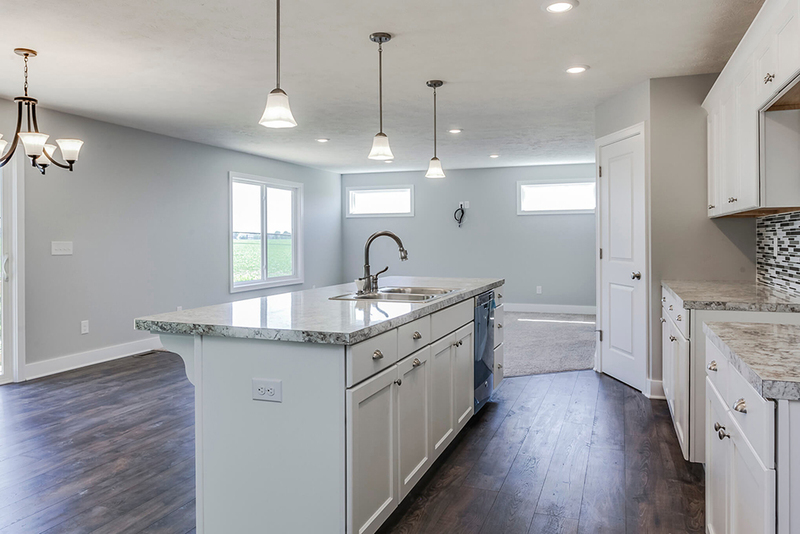 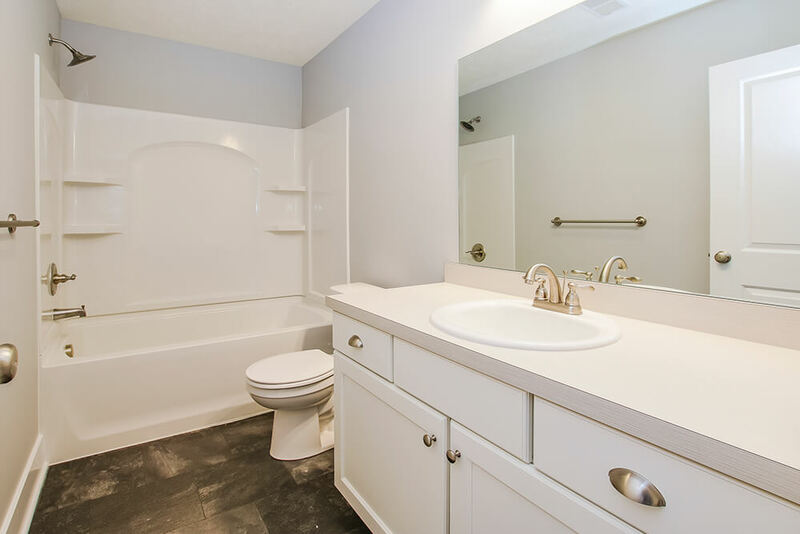 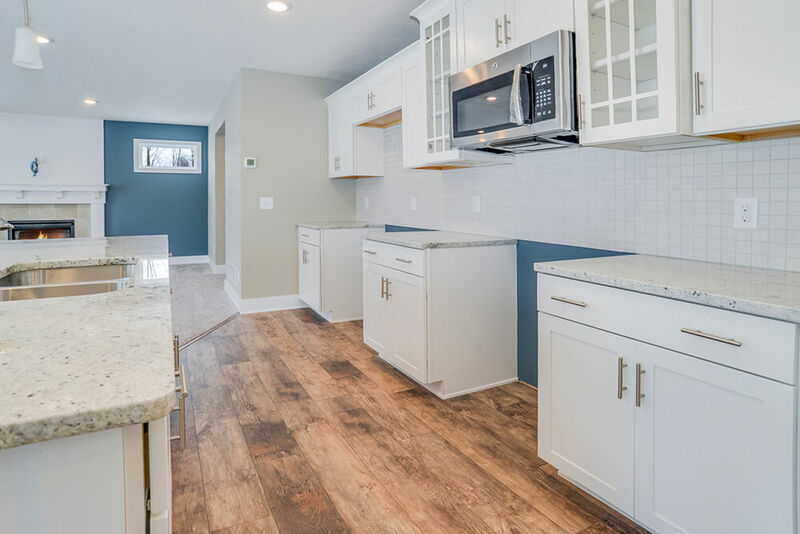 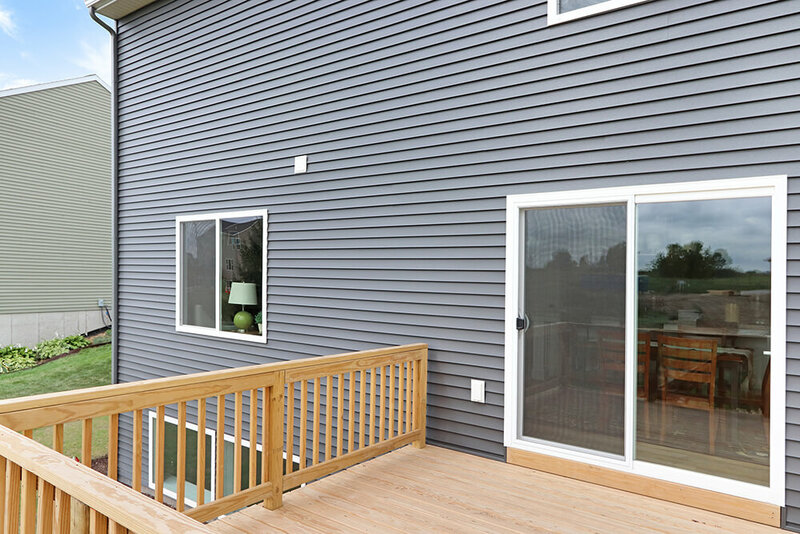 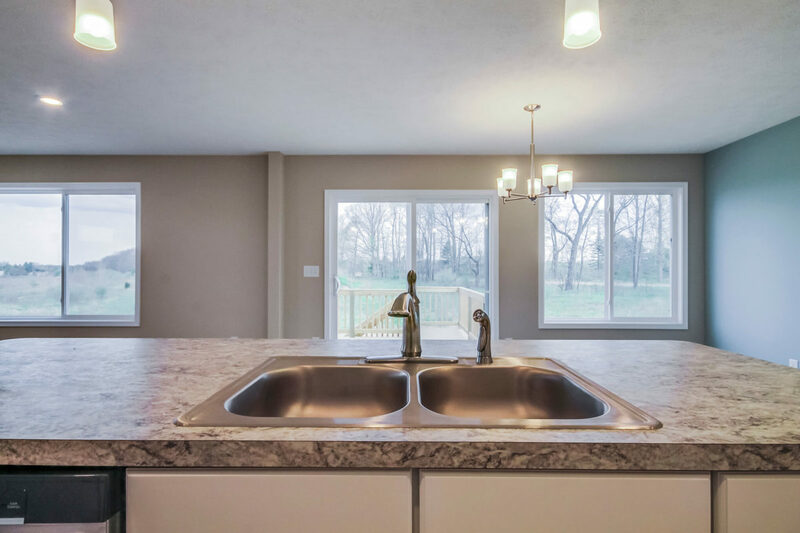 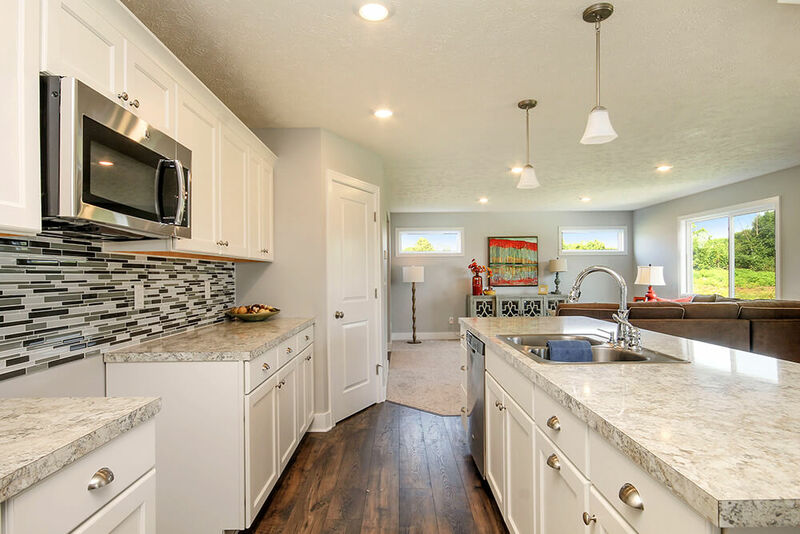 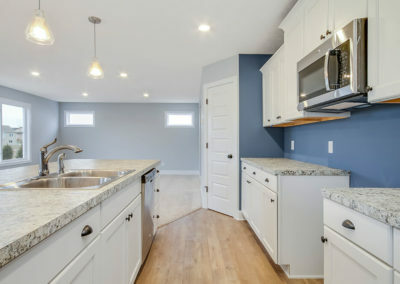 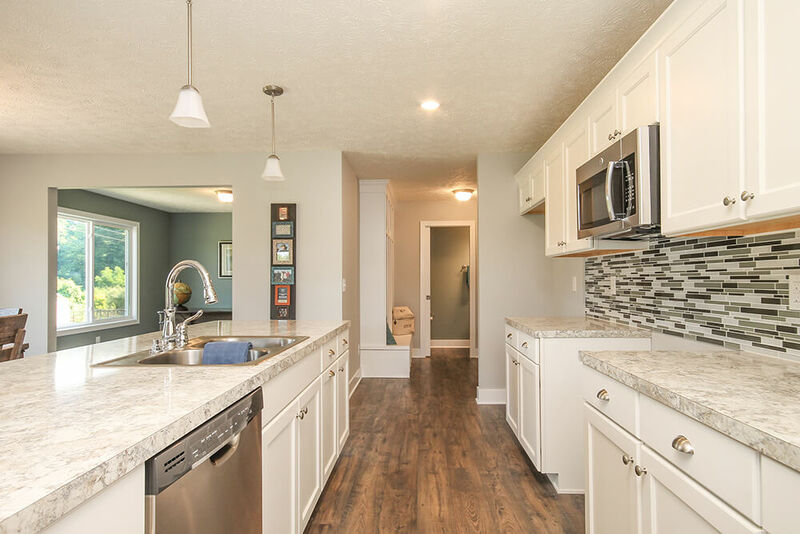 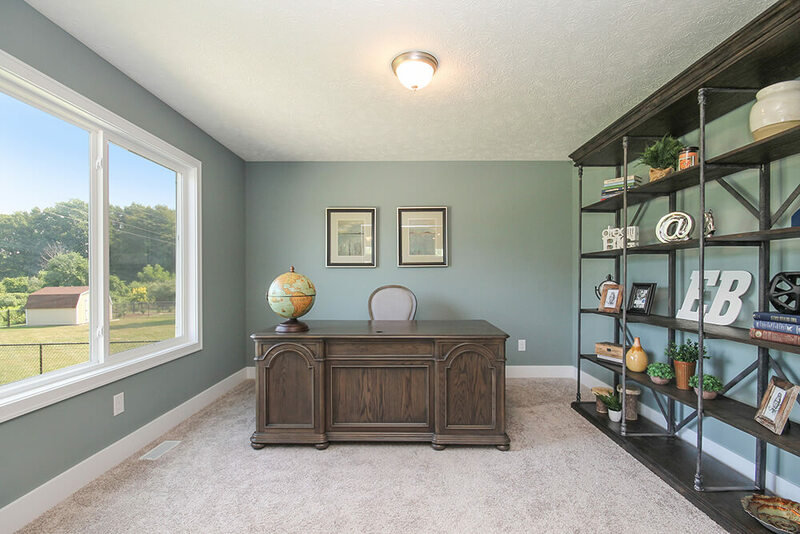 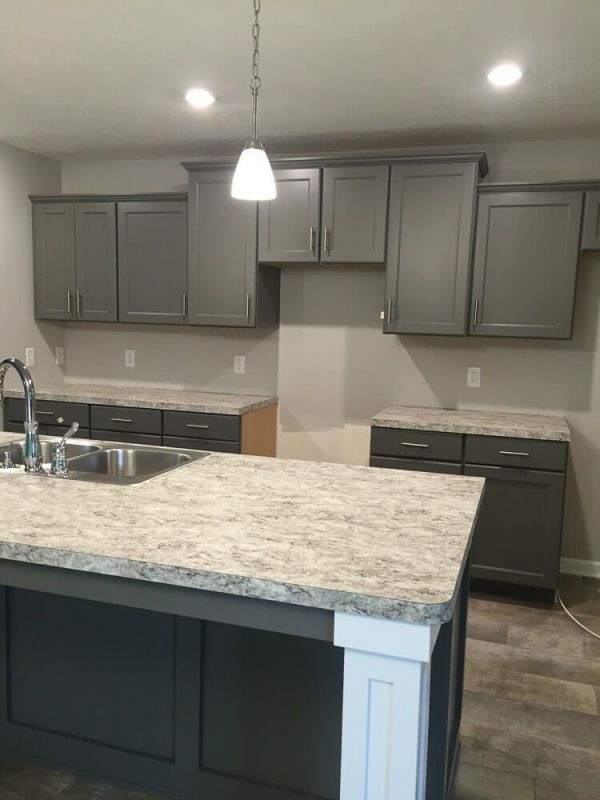 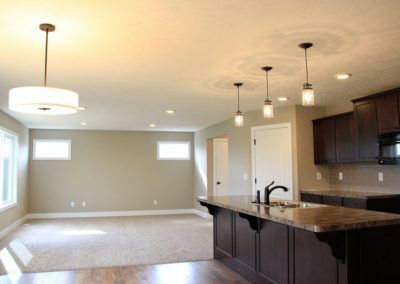 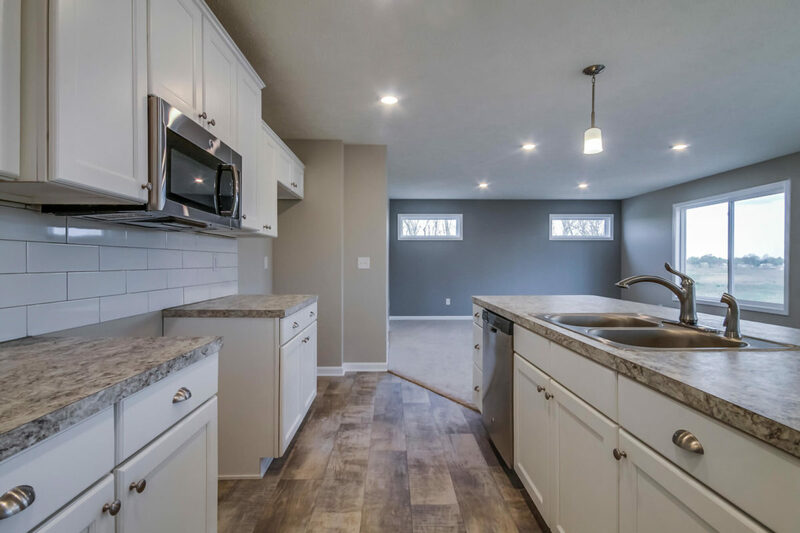 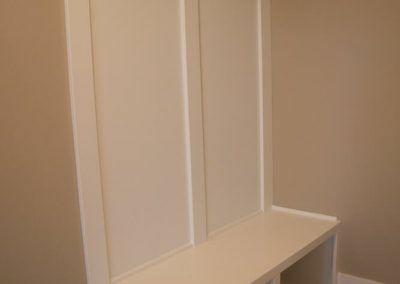 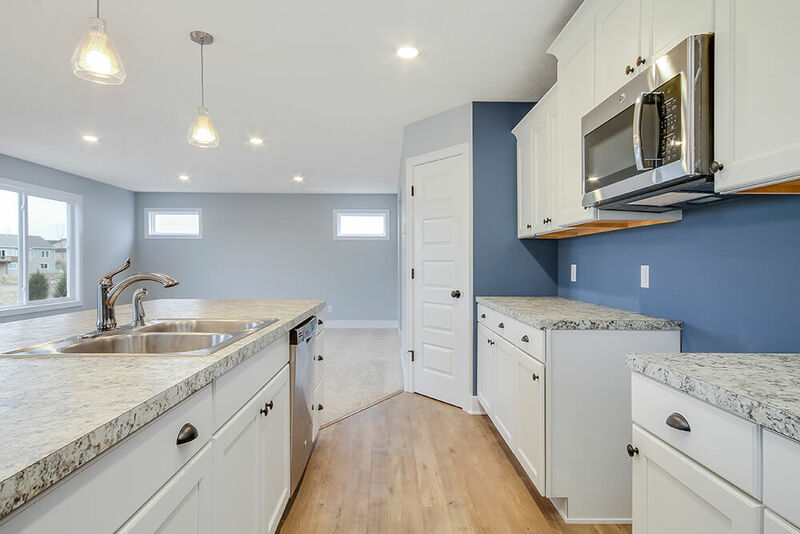 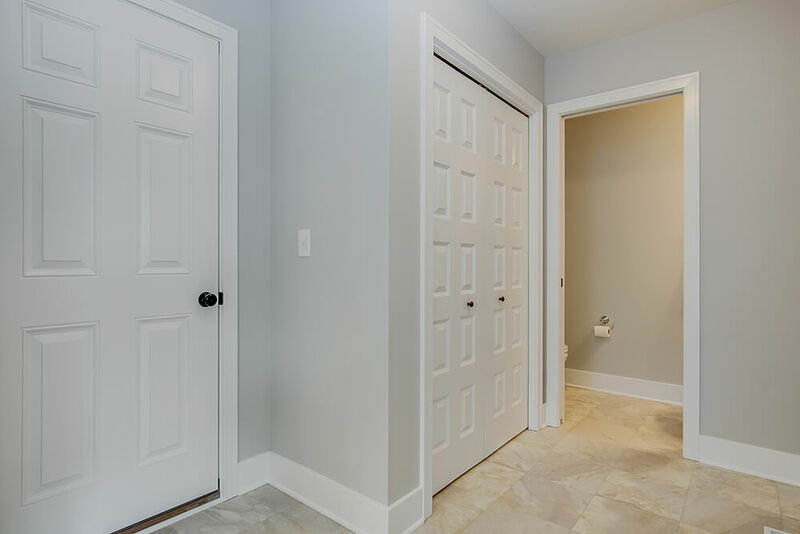 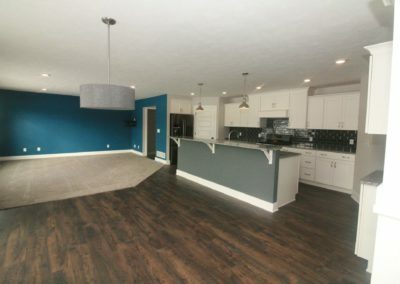 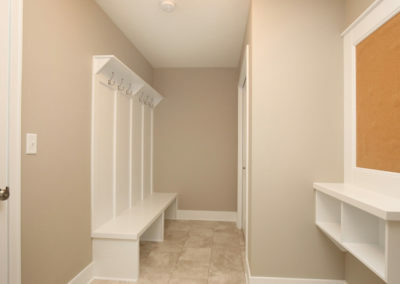 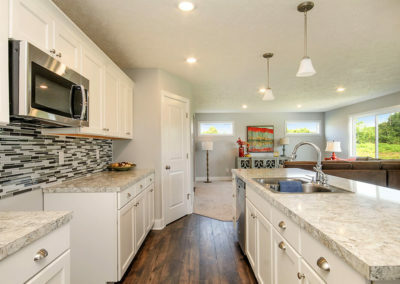 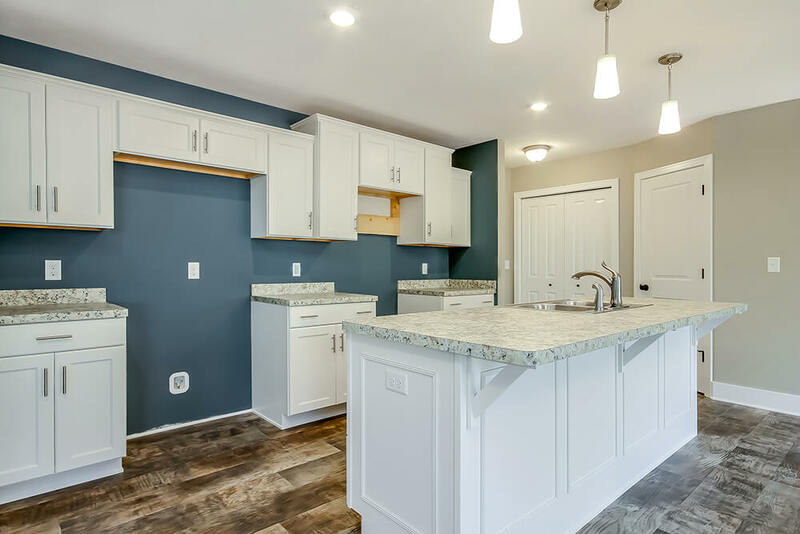 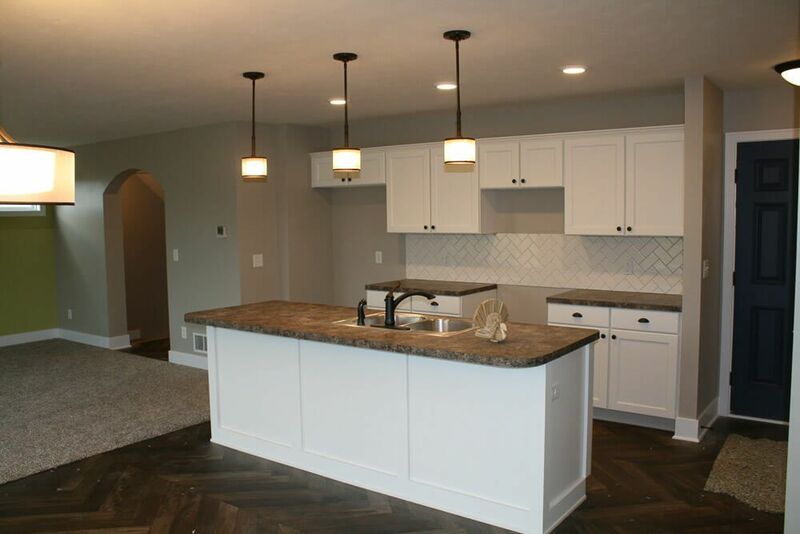 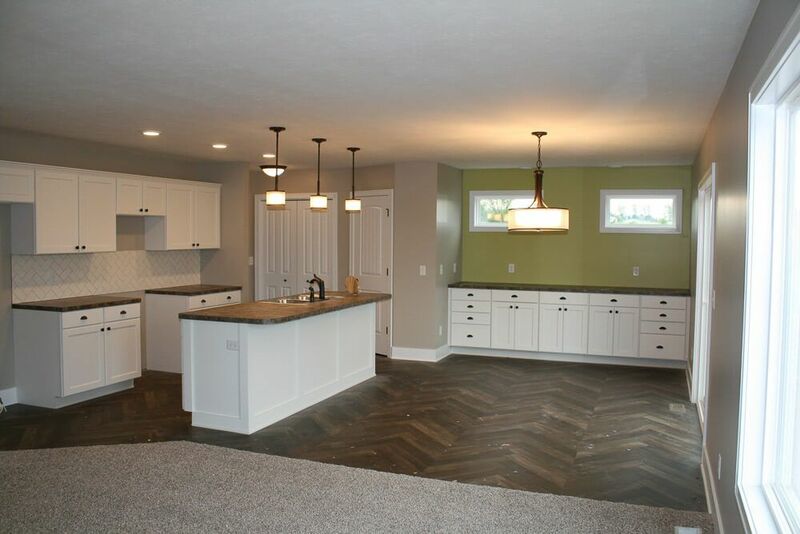 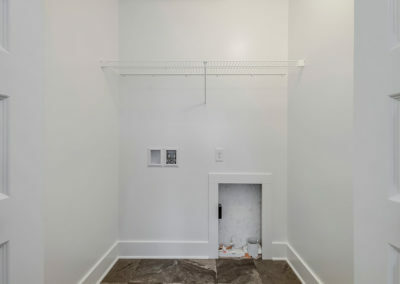 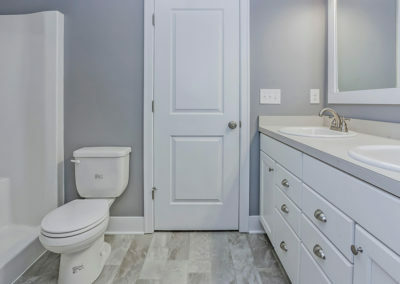 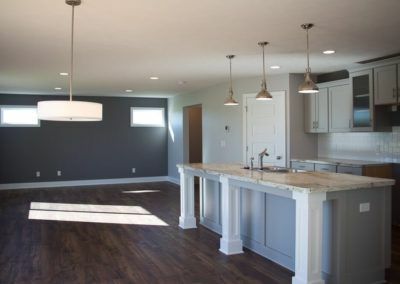 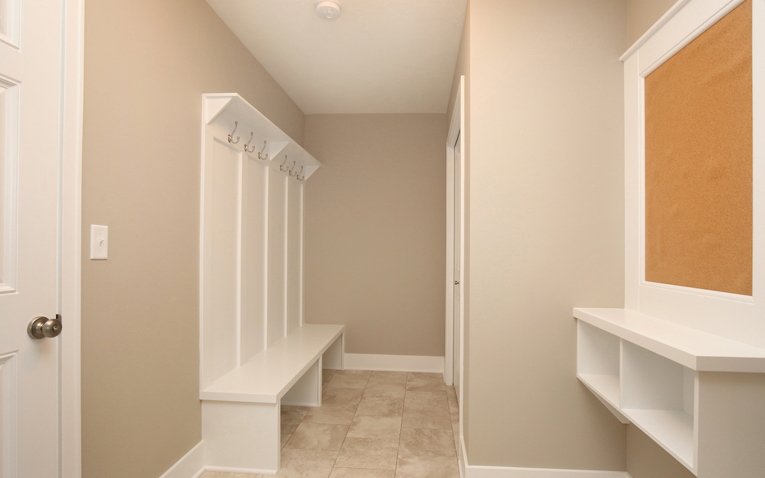 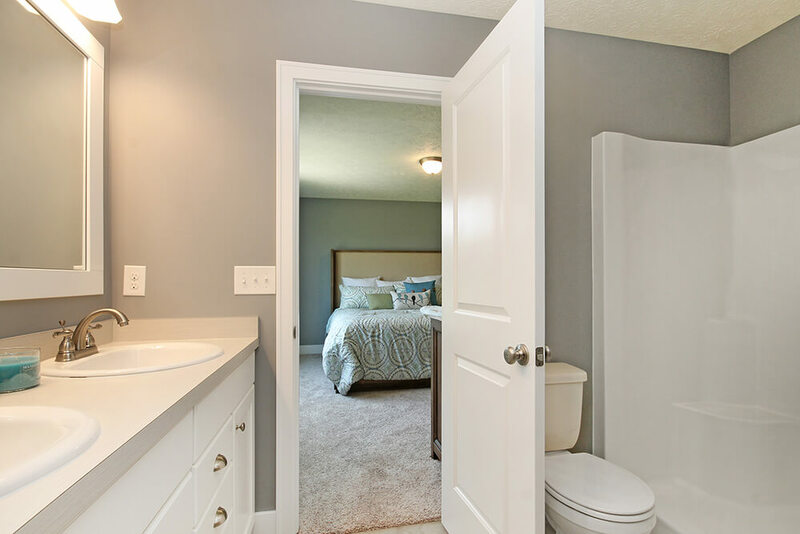 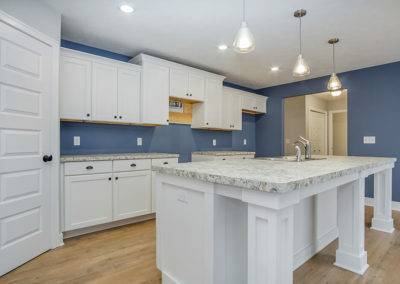 The expanded main level option adds a third stall to the garage, expands the garage entry way into a mudroom with optional bench and organization station, increases the size of the kitchen, and adds a flexible bonus room off of the dining area. 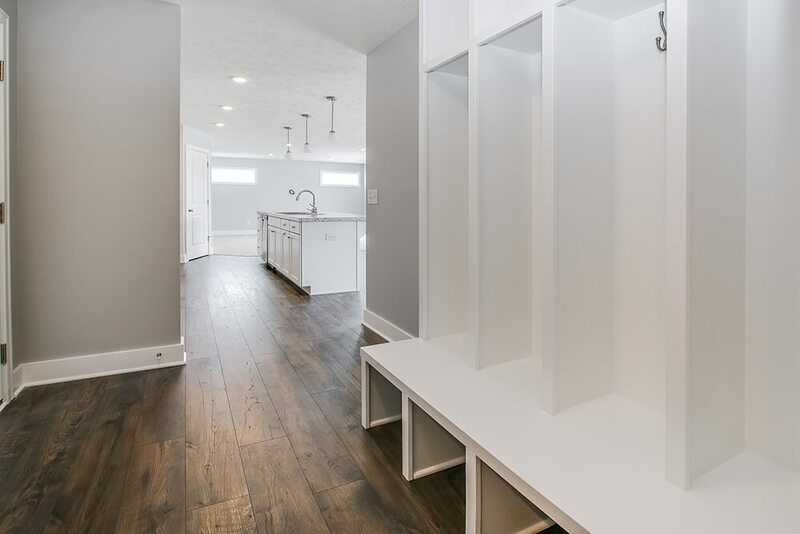 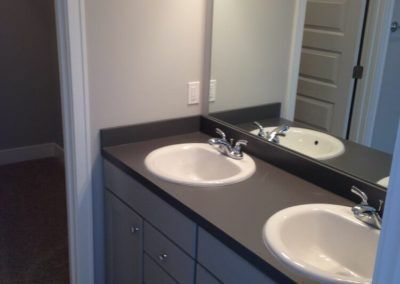 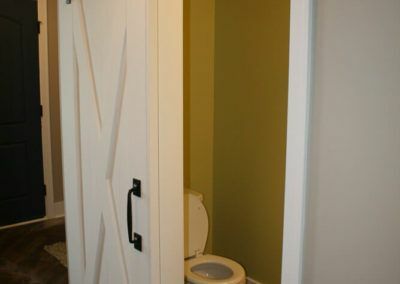 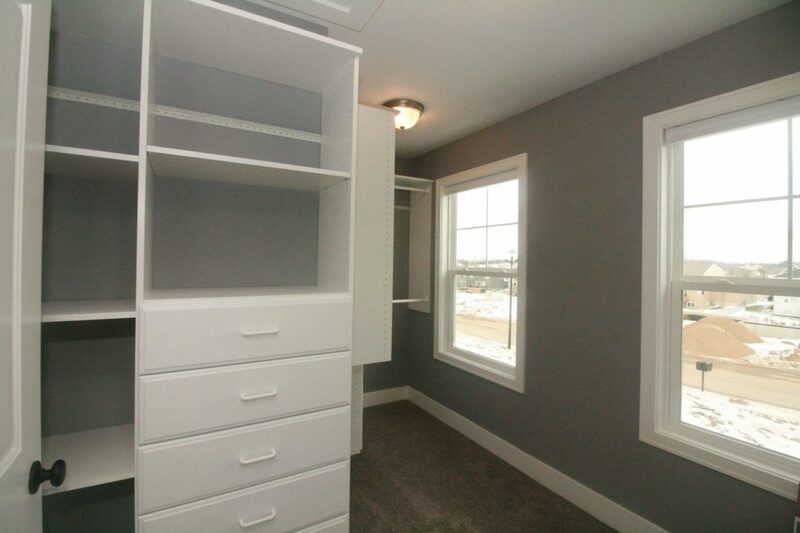 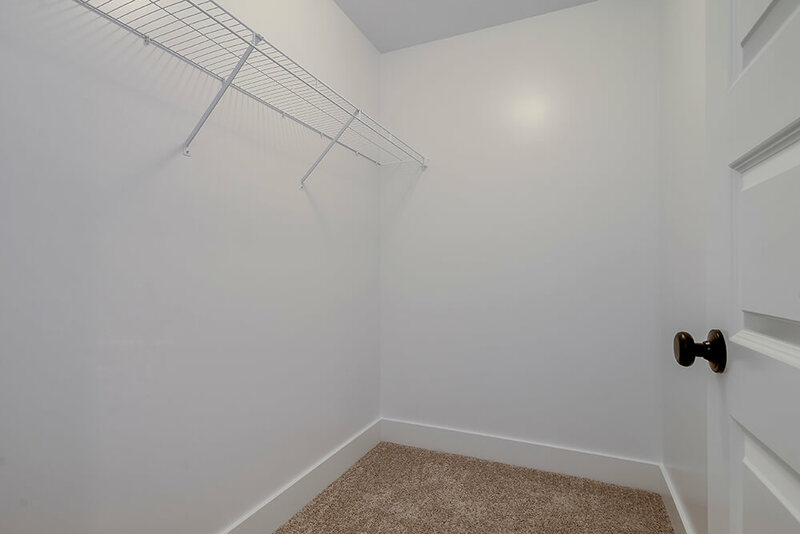 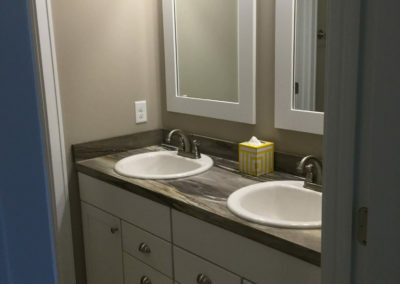 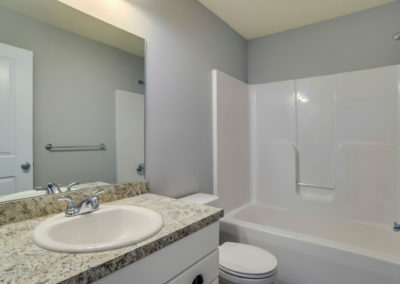 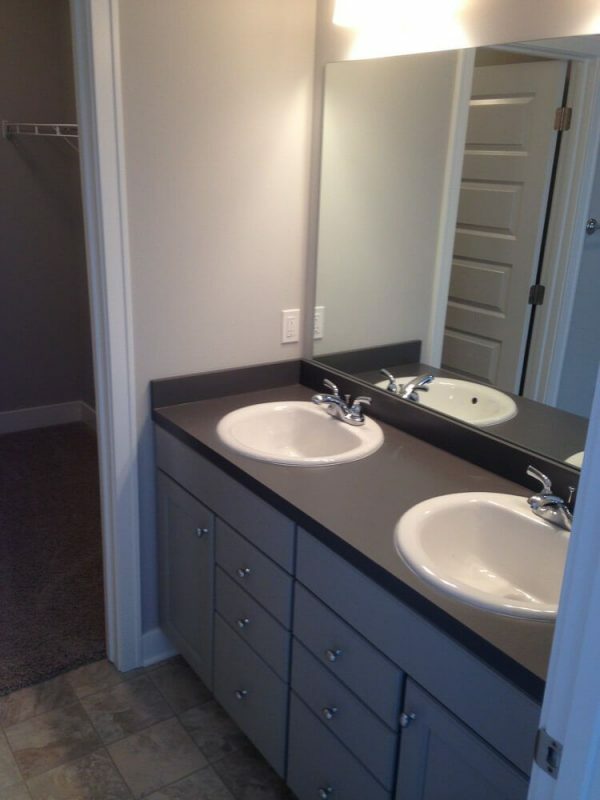 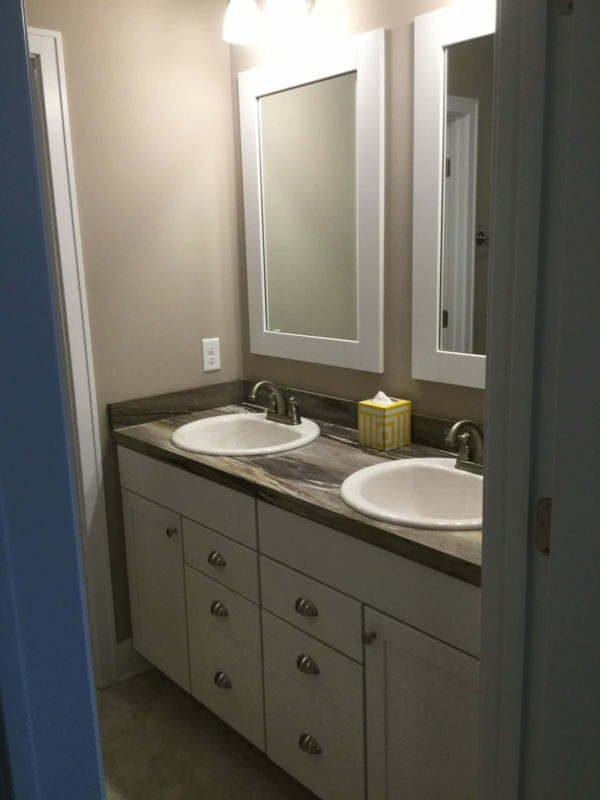 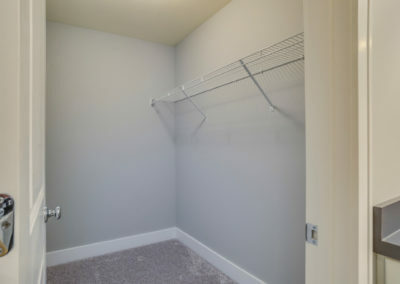 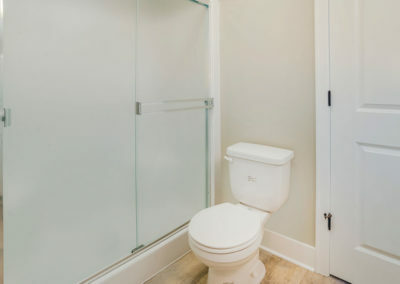 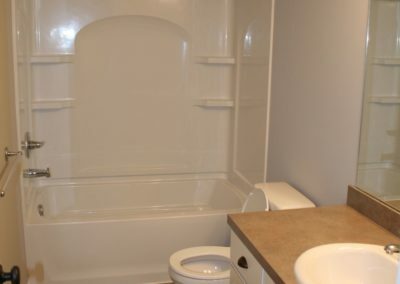 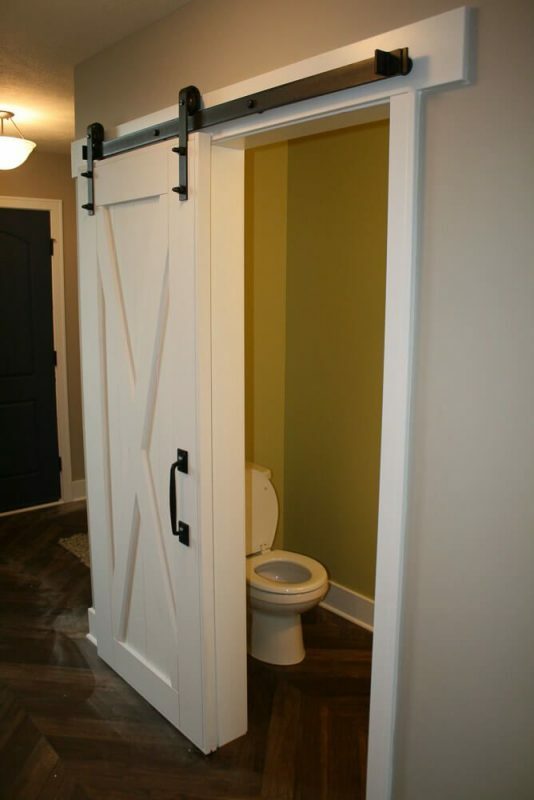 In total this option adds 240 finished square feet to your new home as well as expanding the garage from two to three stalls. 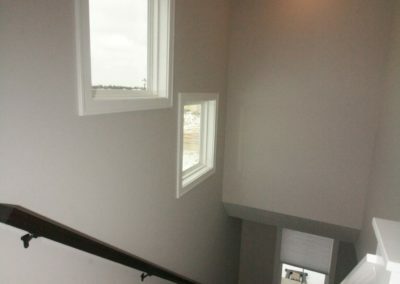 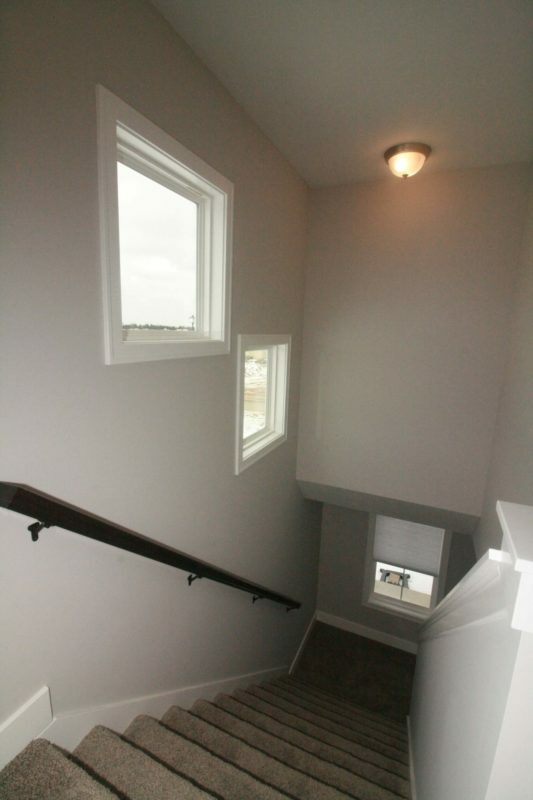 The Taylor’s upper level can be reached via the staircase in the front entry way. 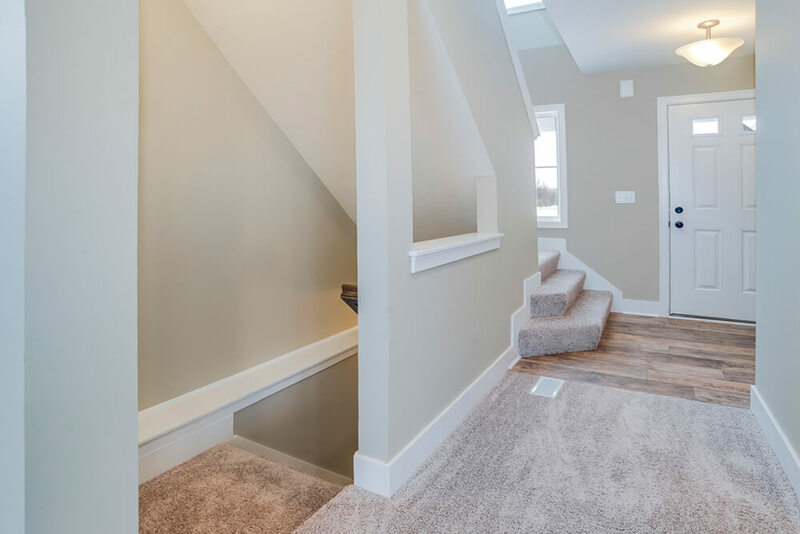 The upper level includes the master suite, a full bath, and three bedrooms, one of which can be transformed into an open loft space. 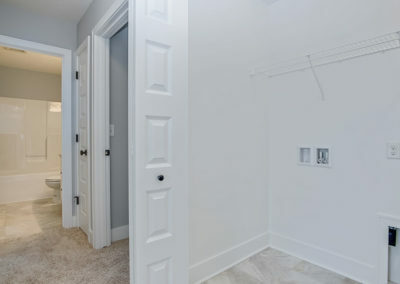 The master suit incorporates a substantial master bedroom, a private master bath with optional double bowl sink, and a large walk-in closet. 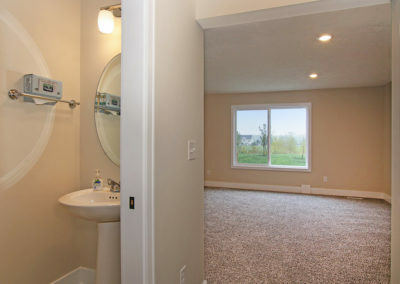 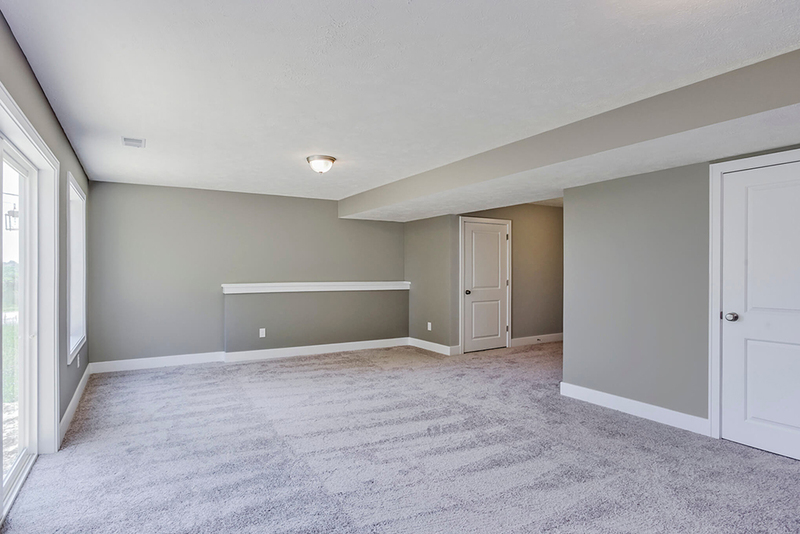 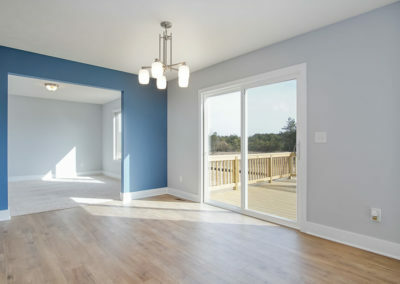 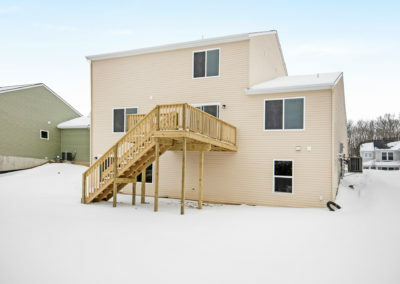 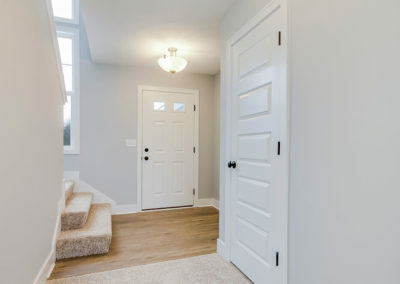 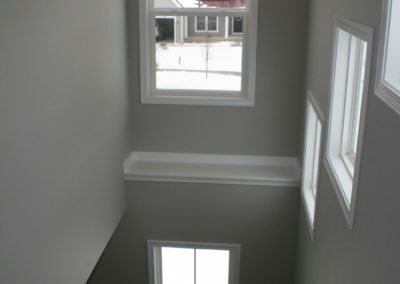 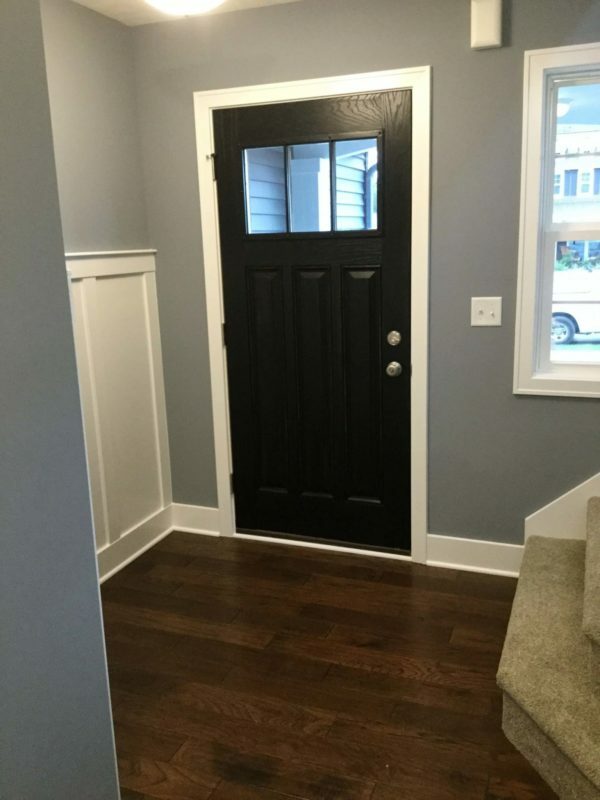 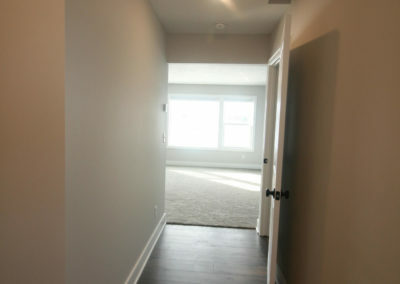 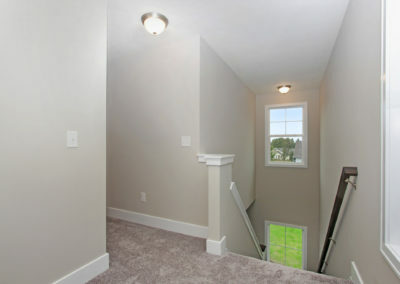 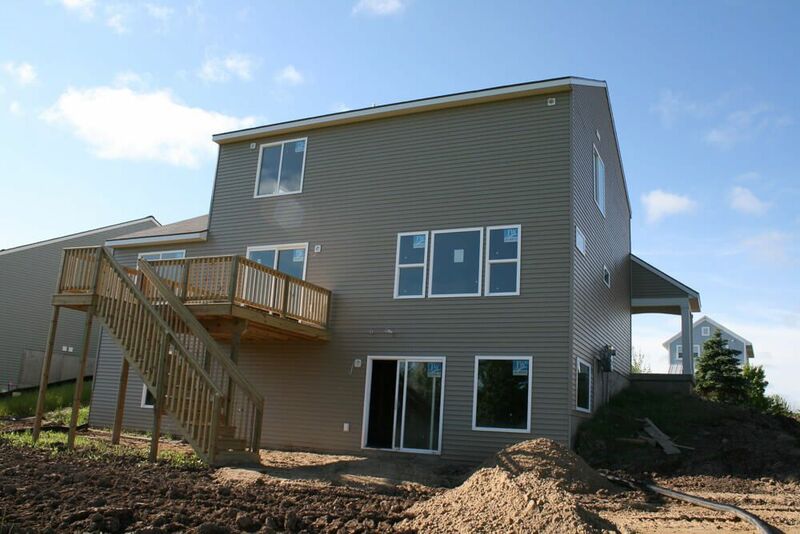 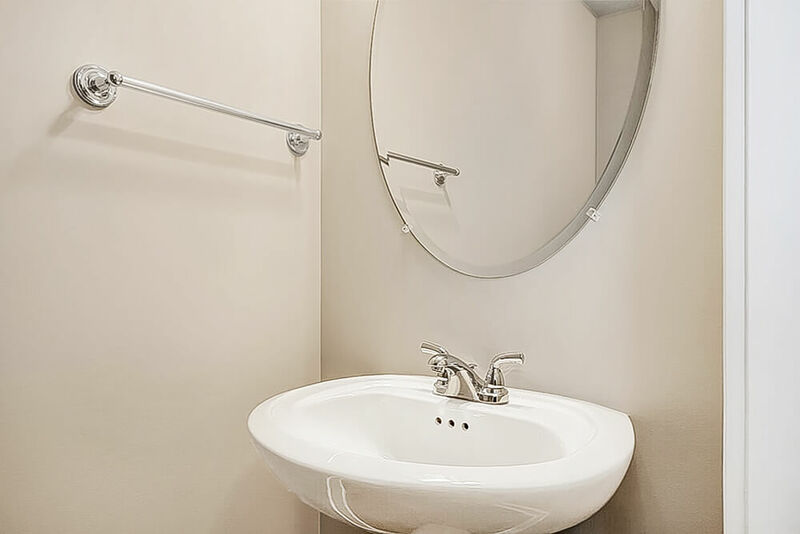 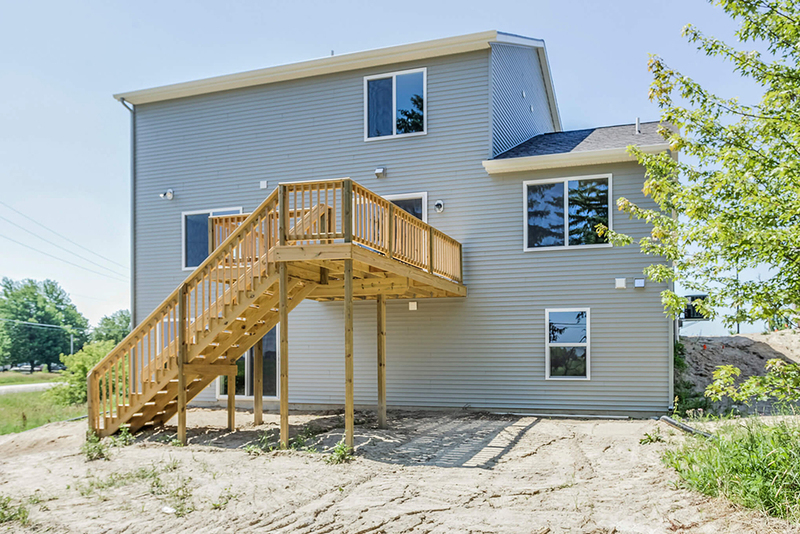 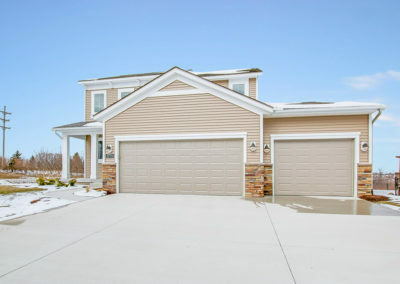 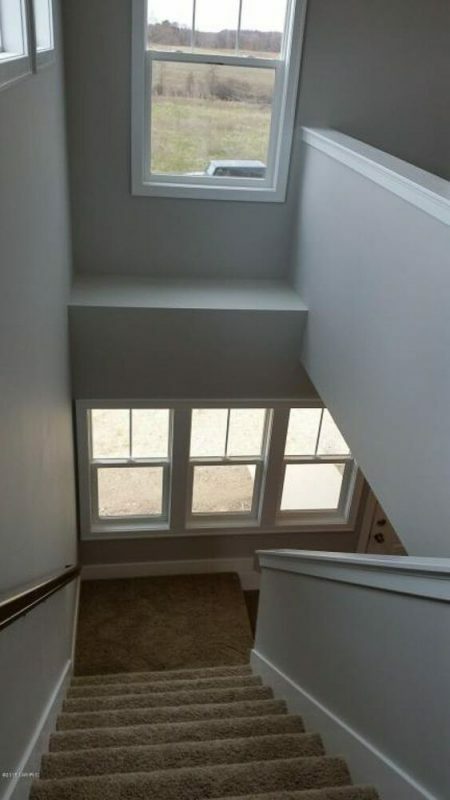 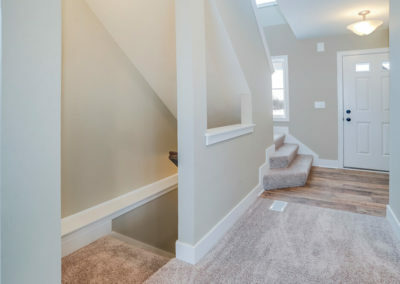 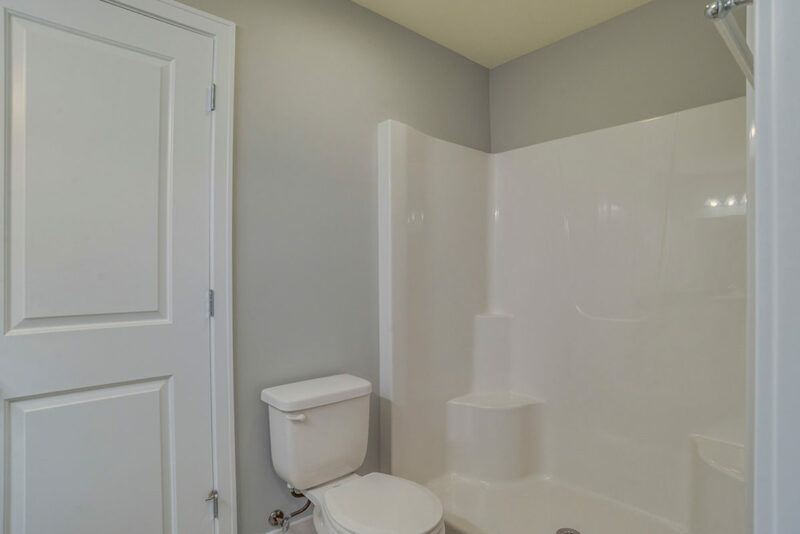 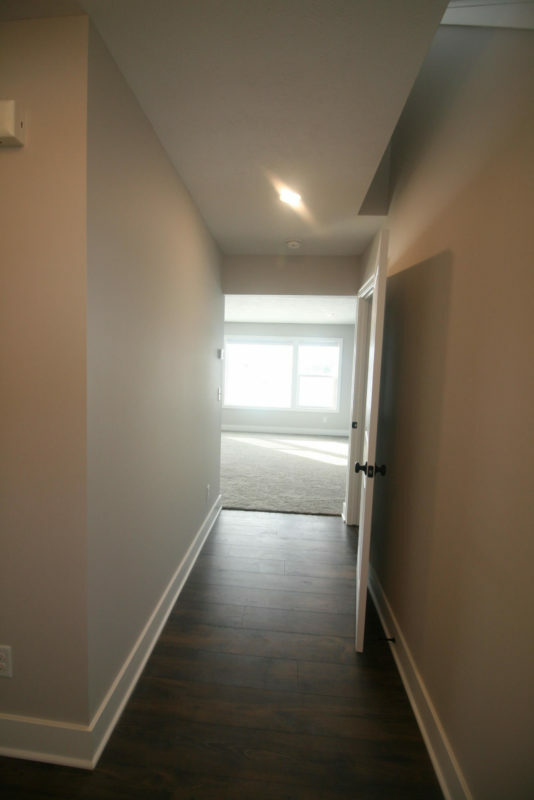 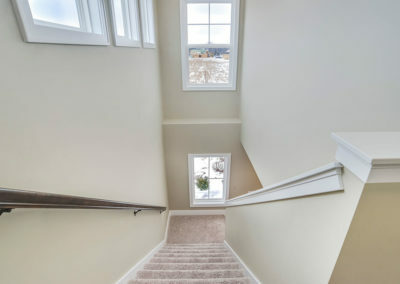 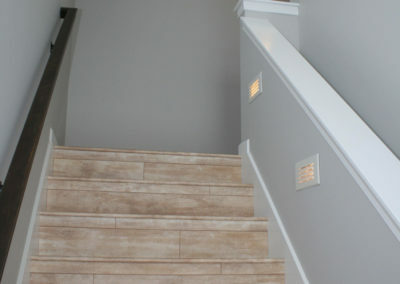 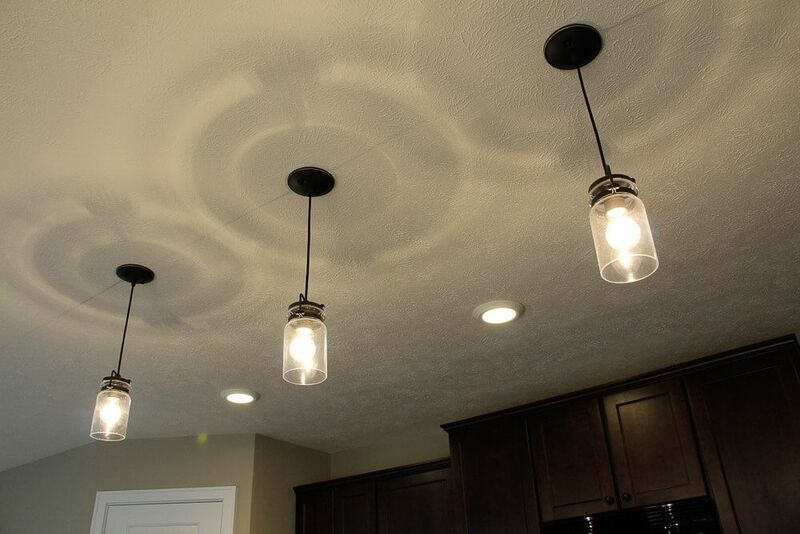 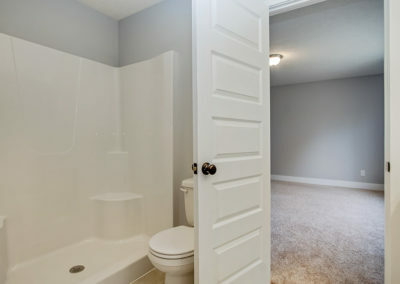 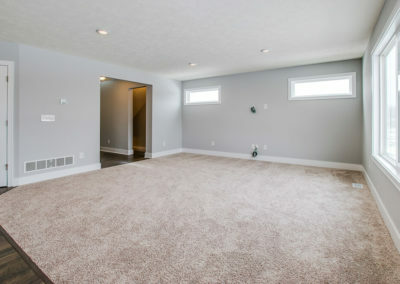 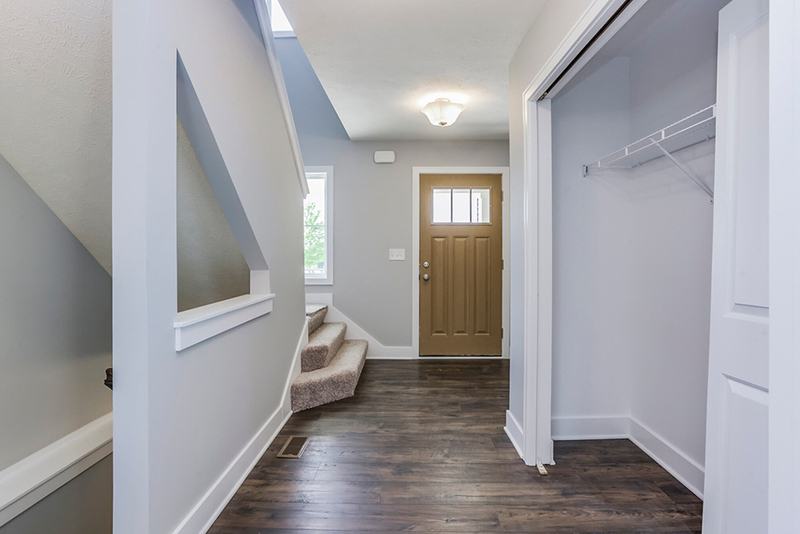 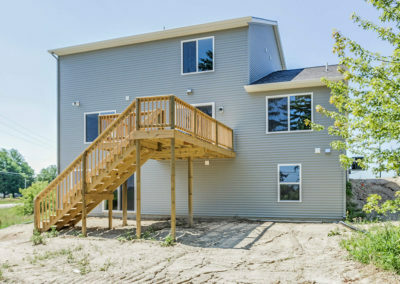 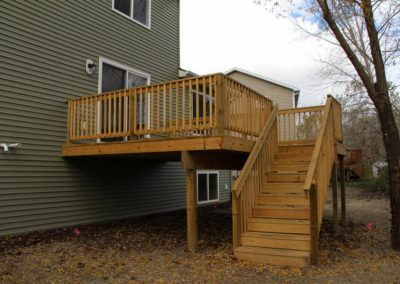 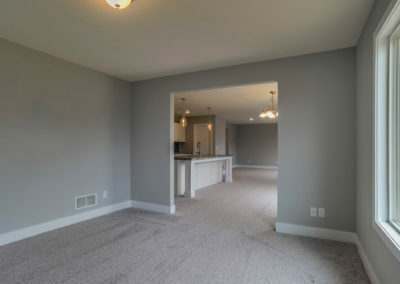 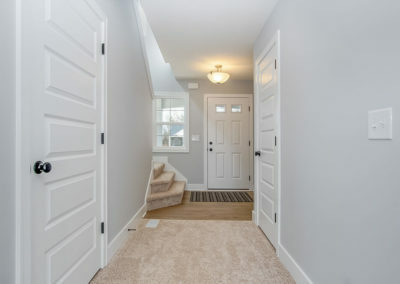 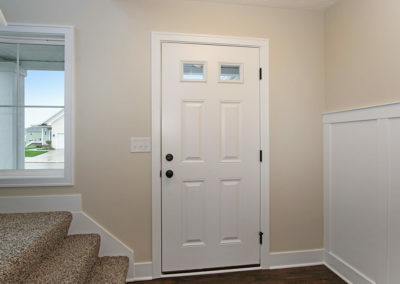 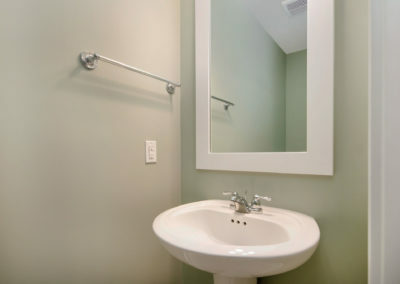 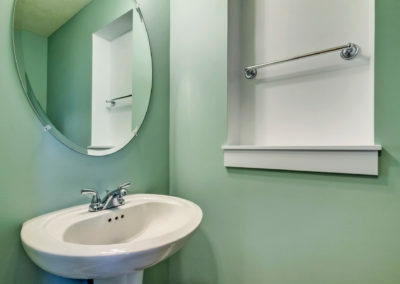 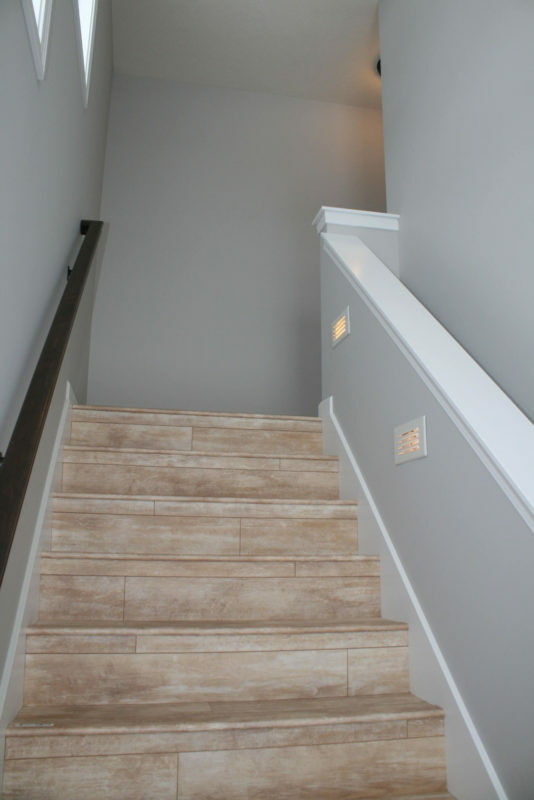 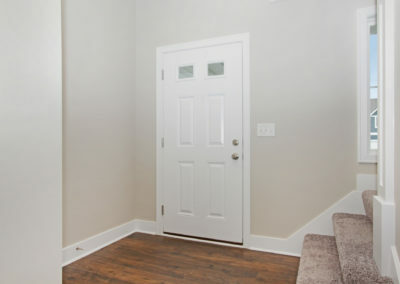 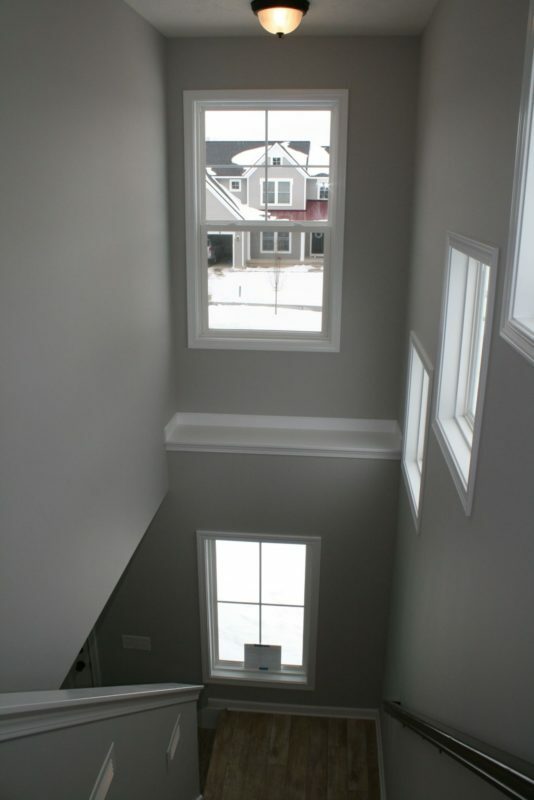 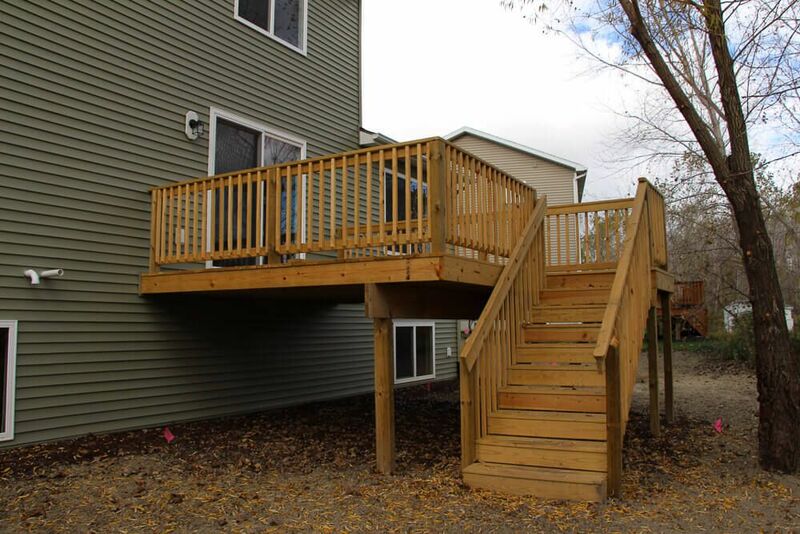 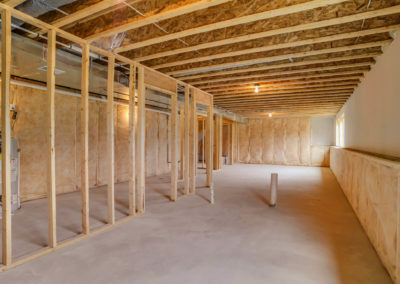 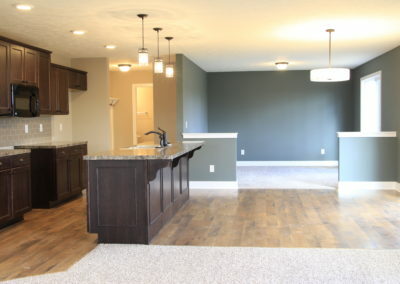 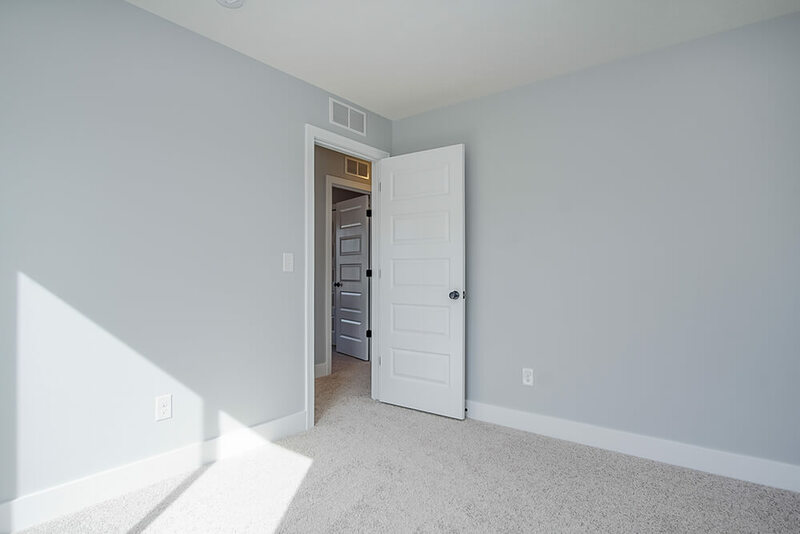 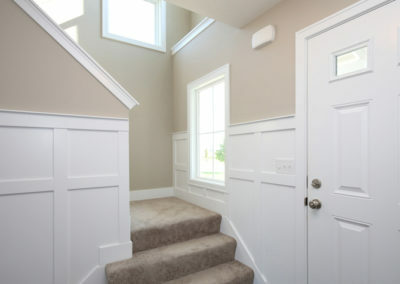 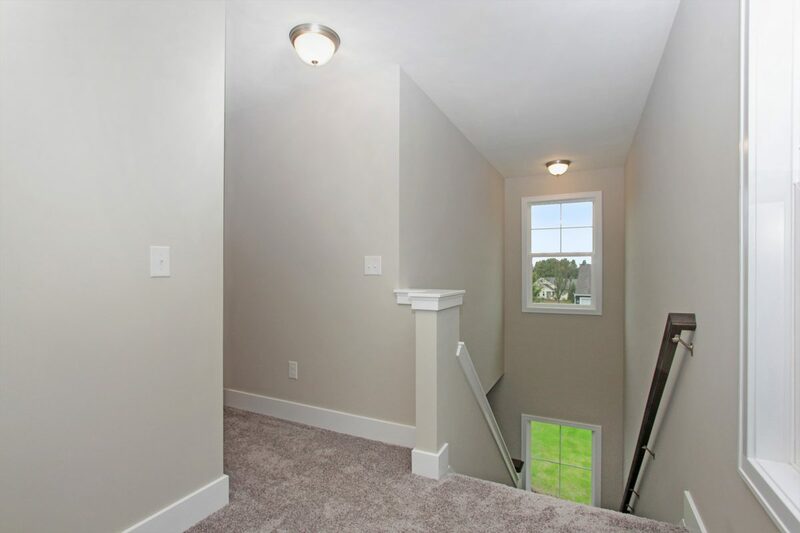 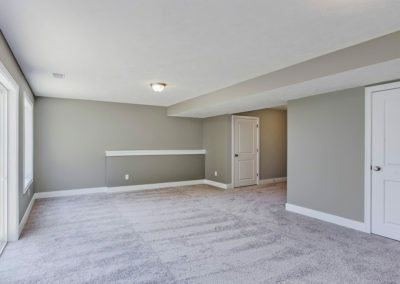 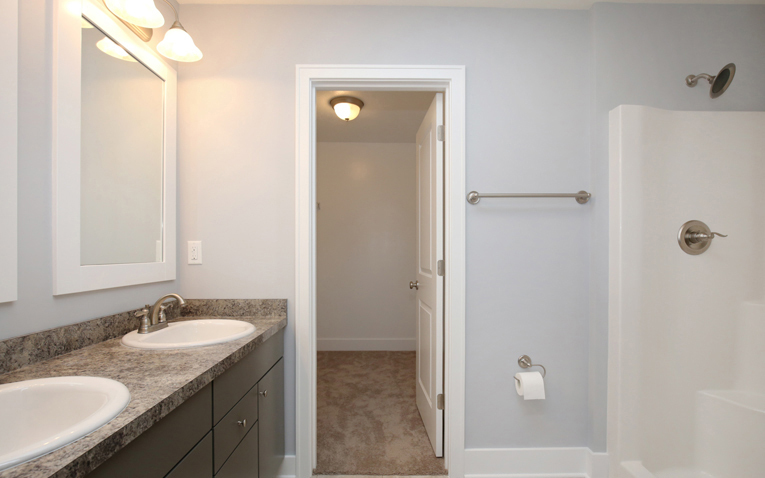 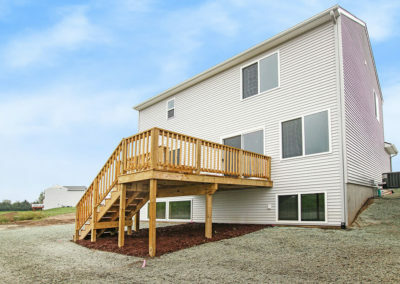 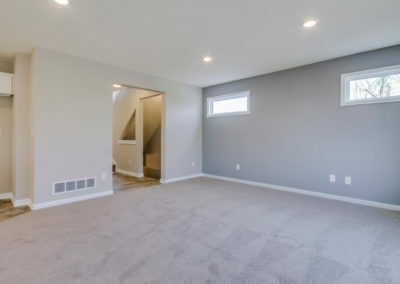 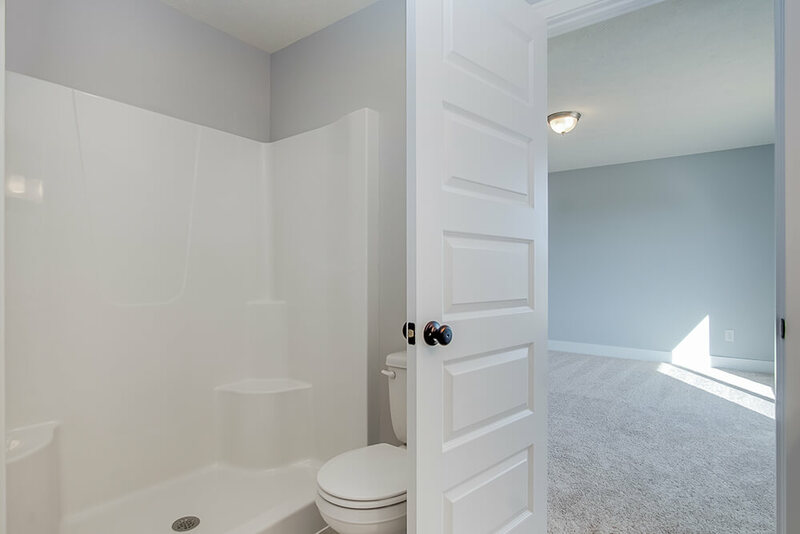 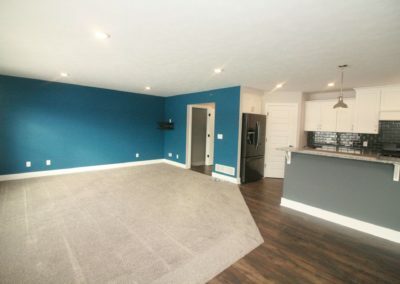 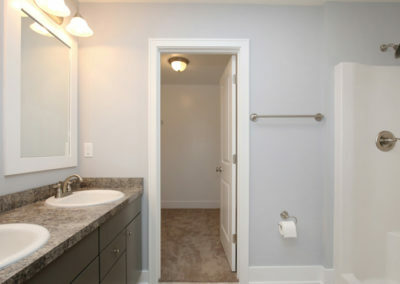 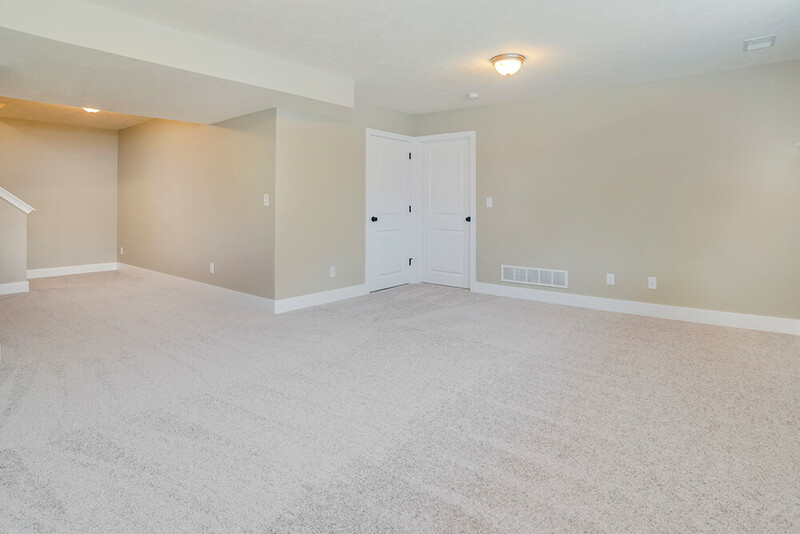 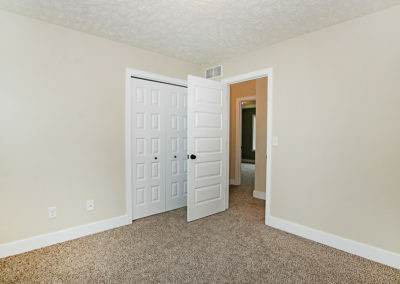 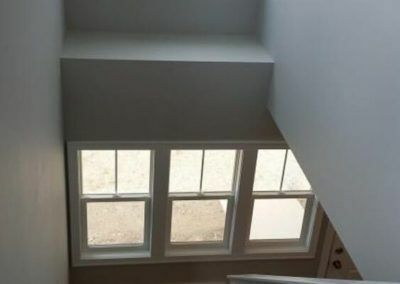 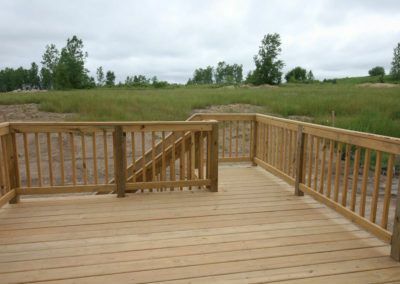 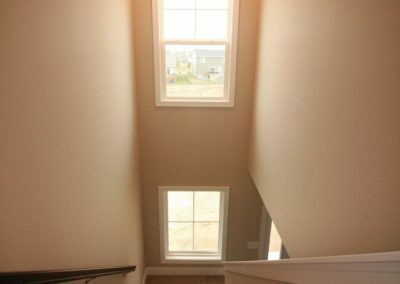 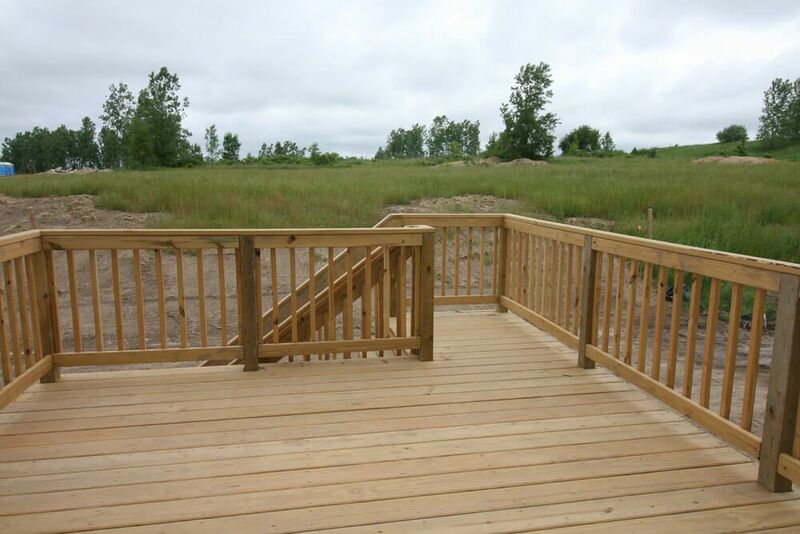 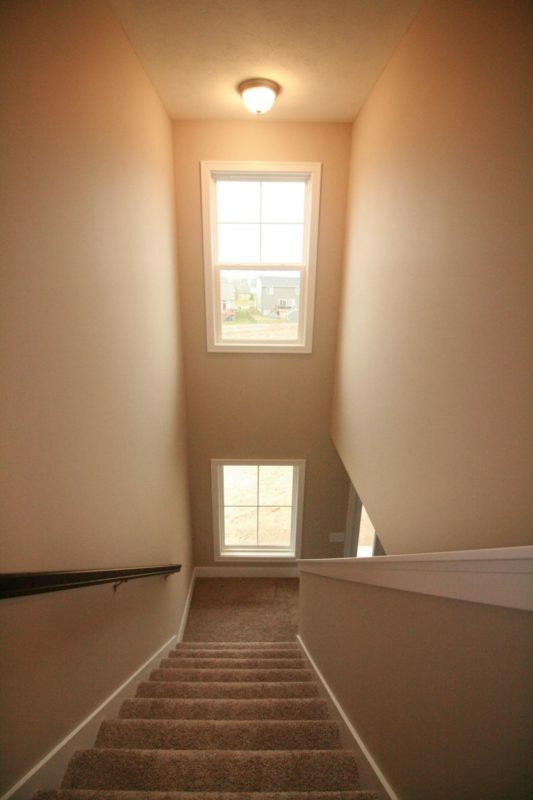 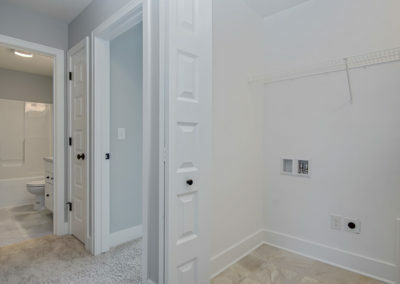 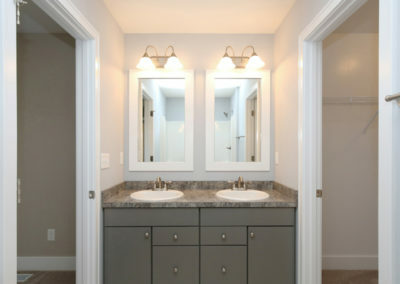 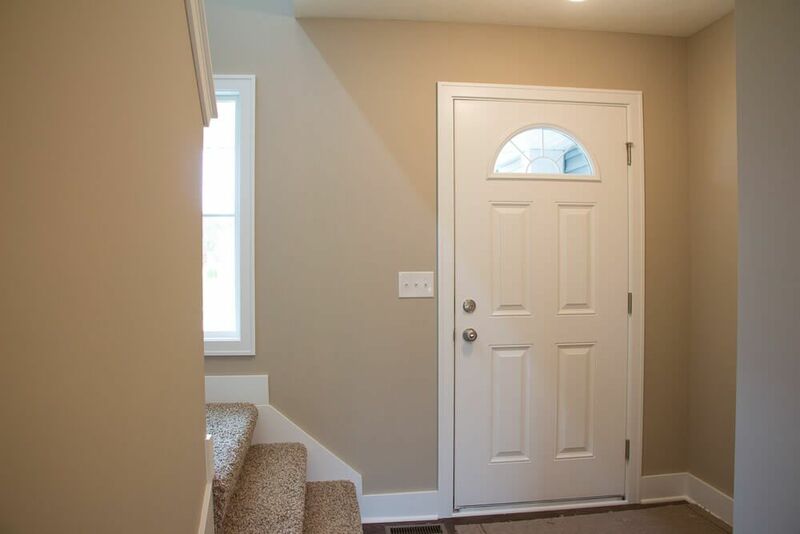 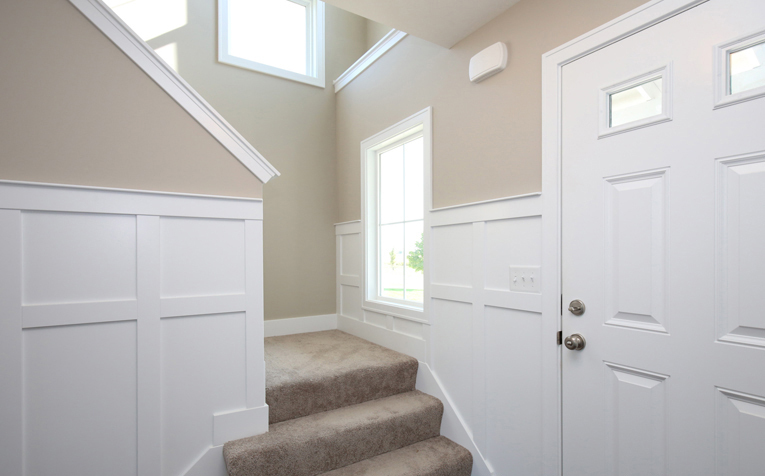 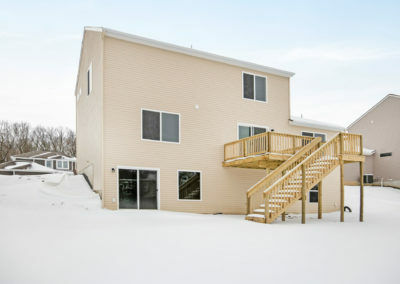 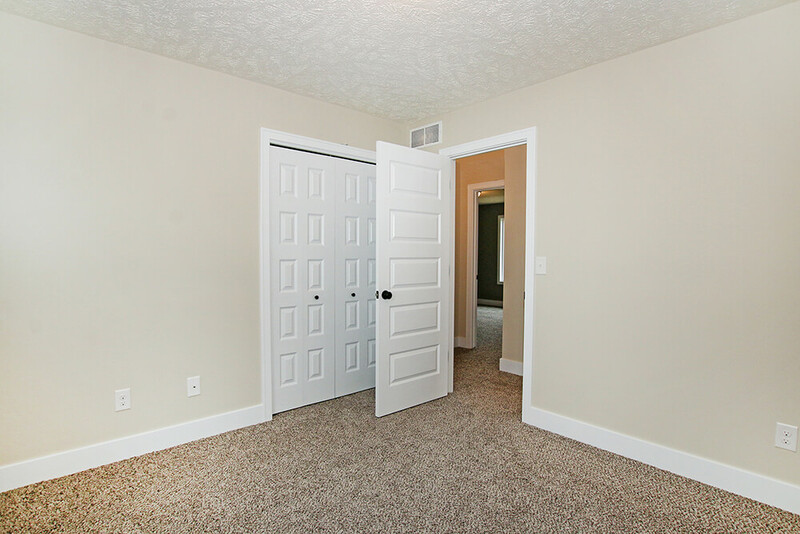 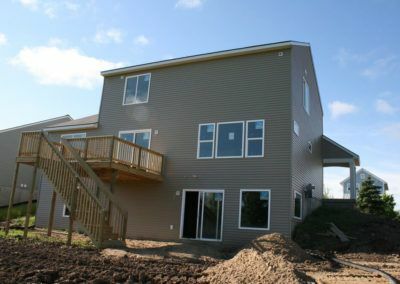 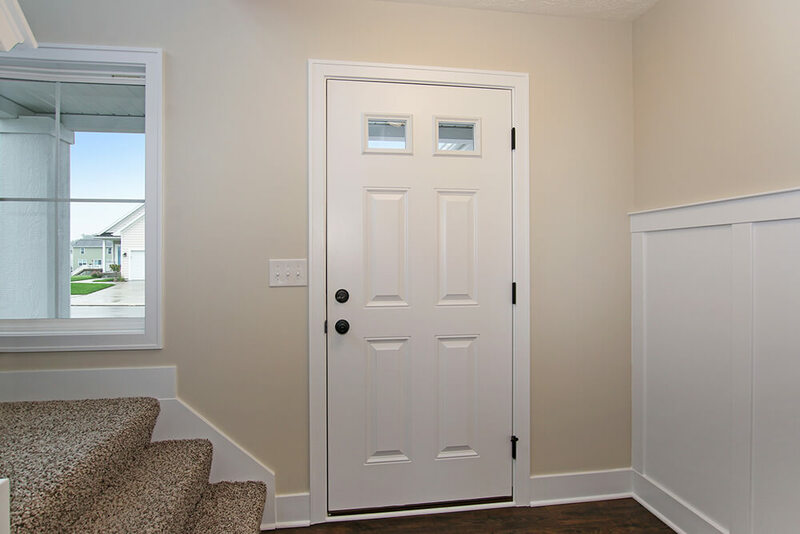 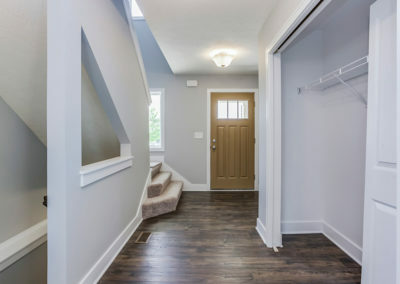 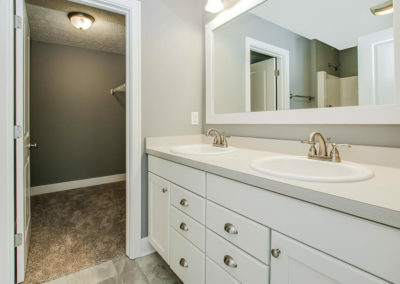 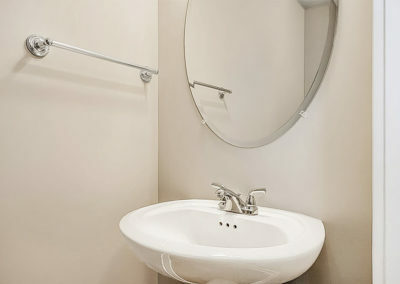 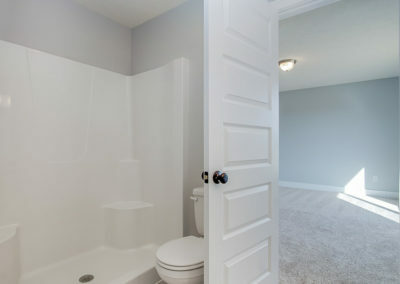 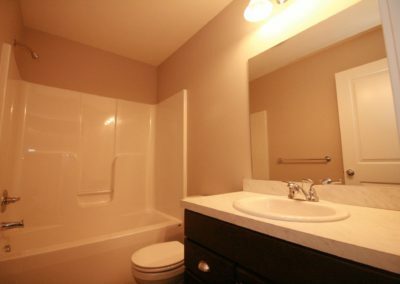 The lower level of your new home is also accessible from the front entry way. 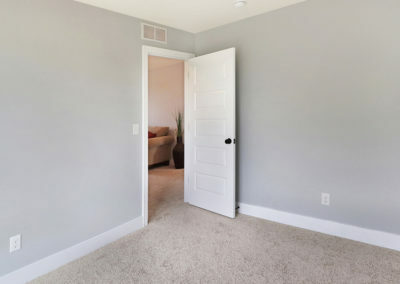 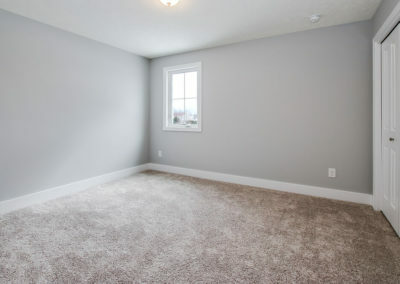 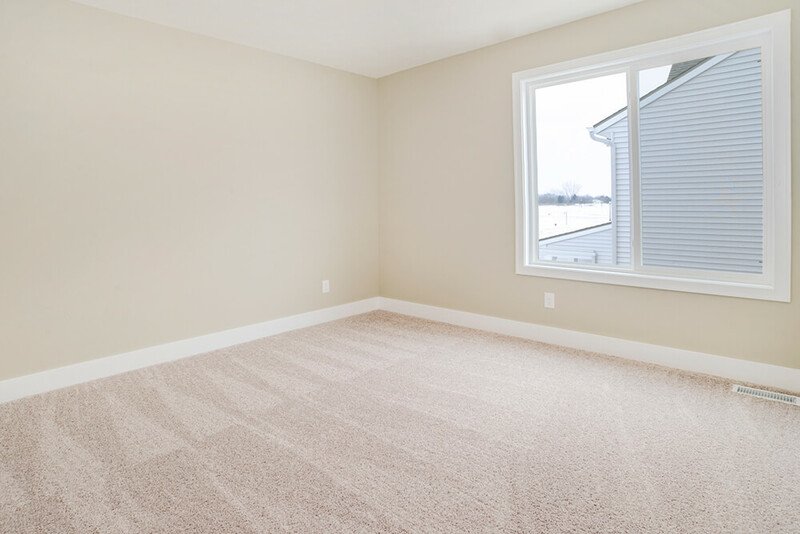 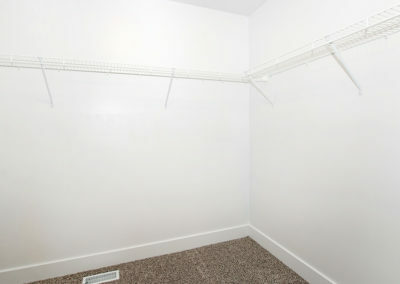 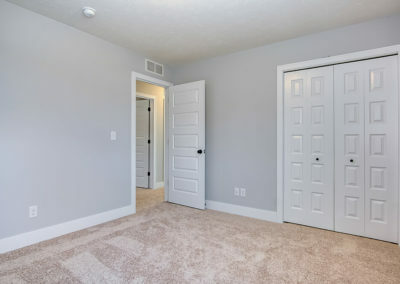 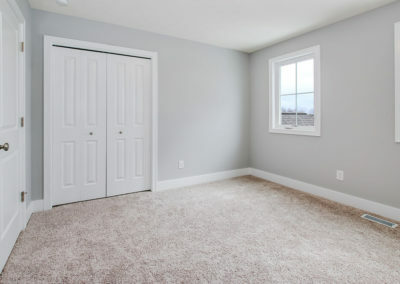 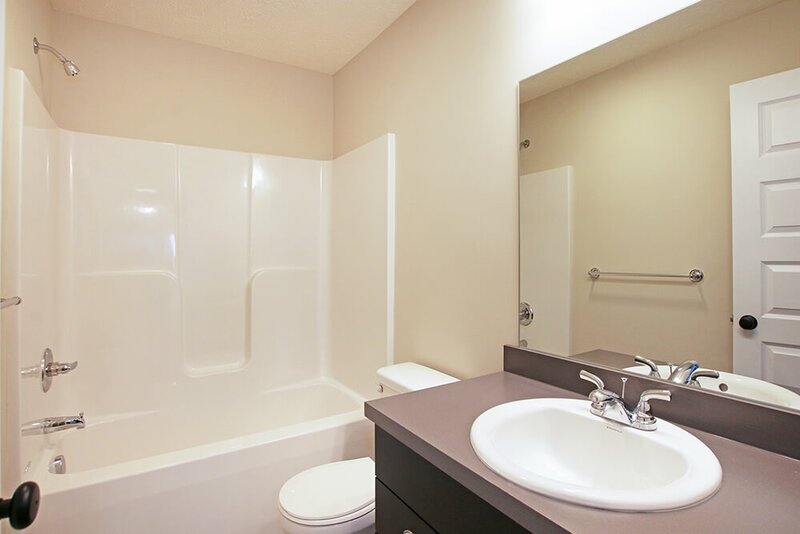 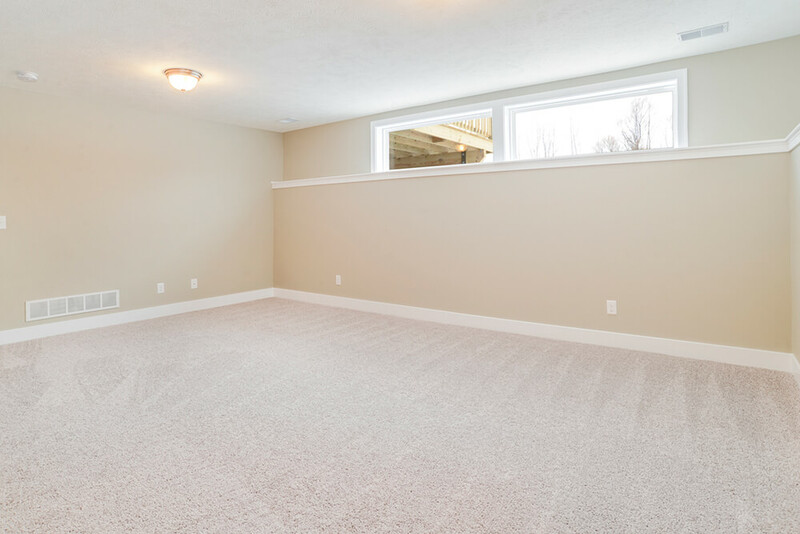 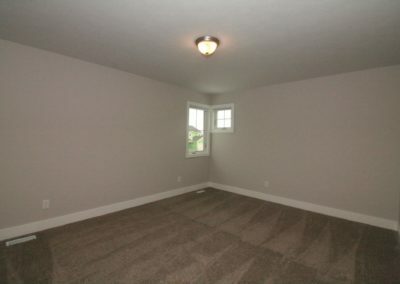 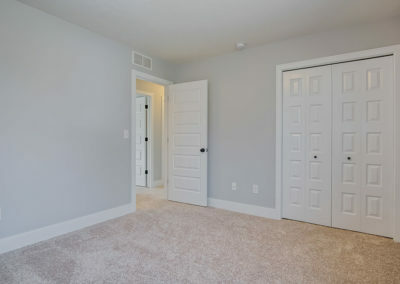 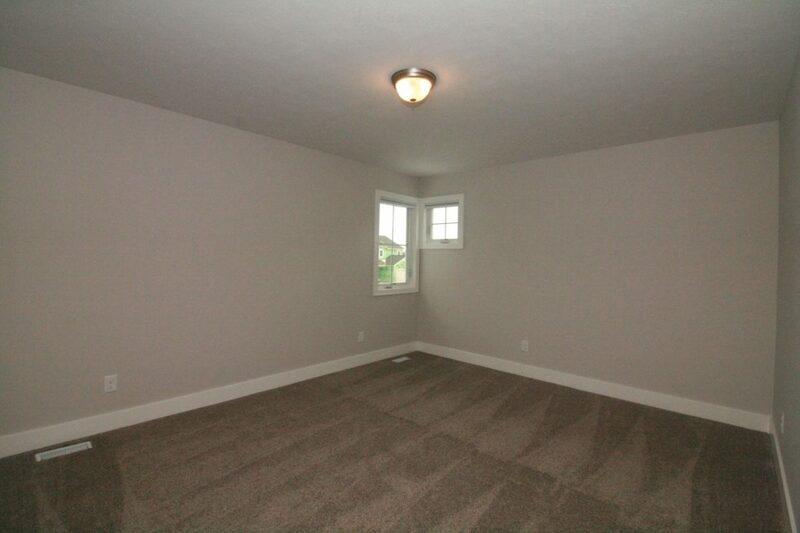 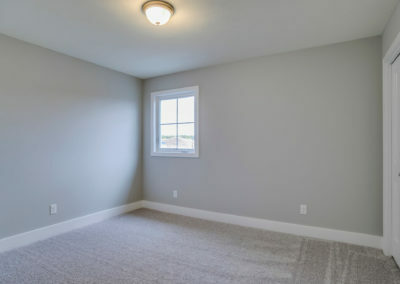 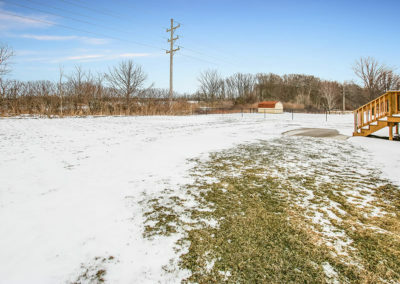 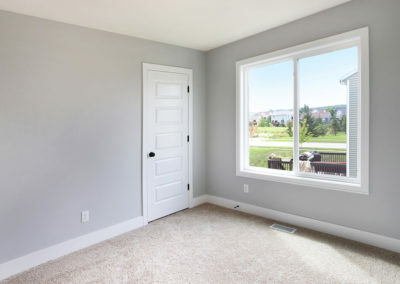 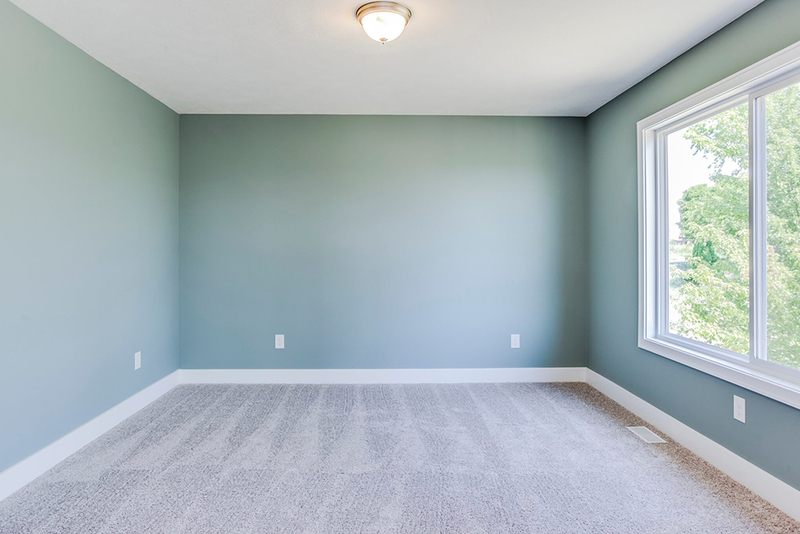 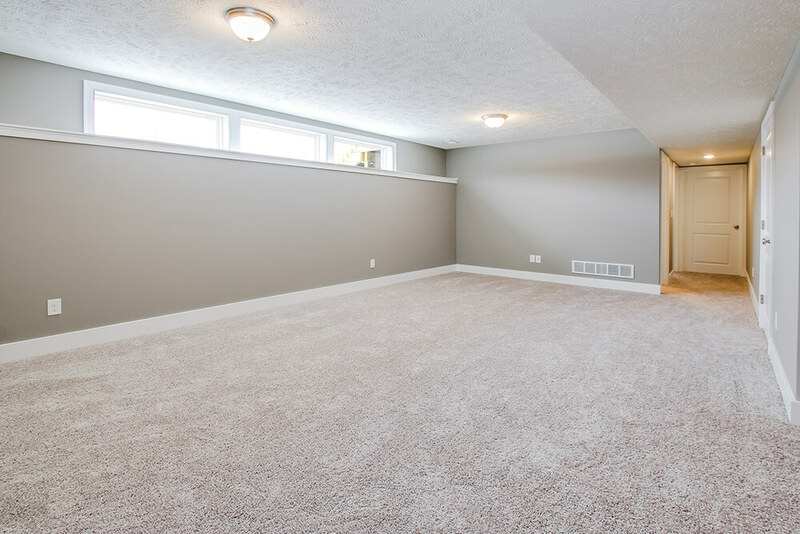 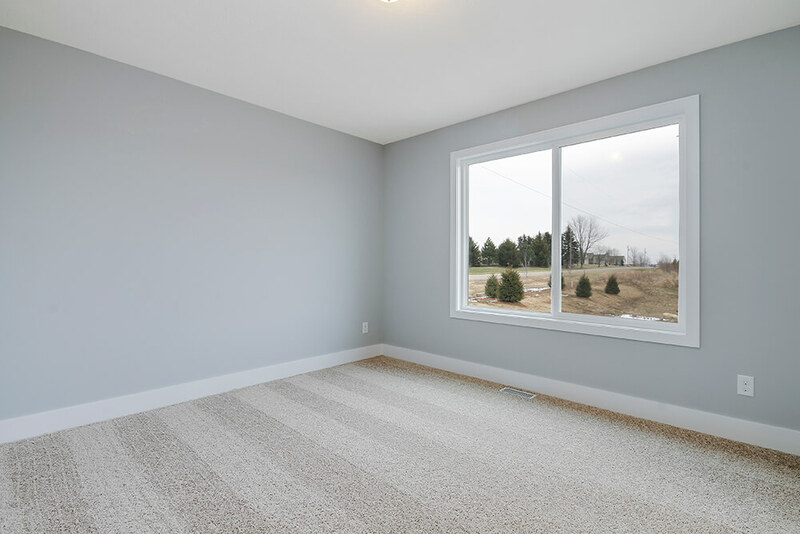 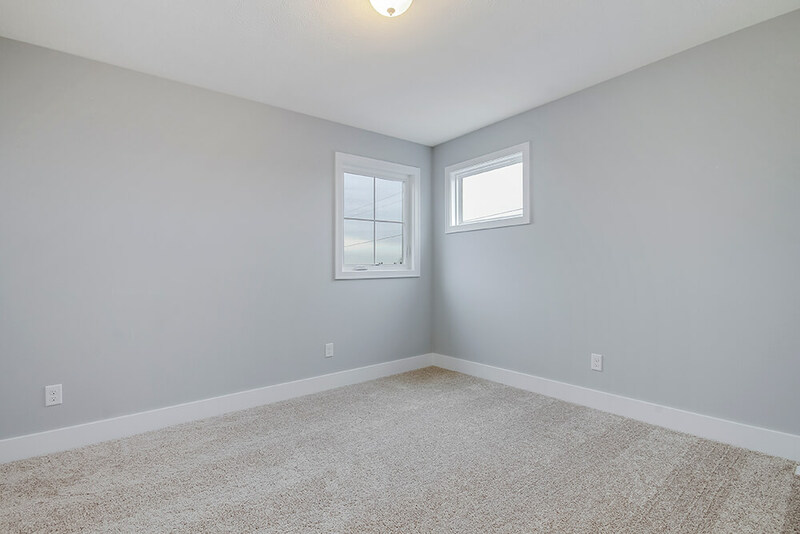 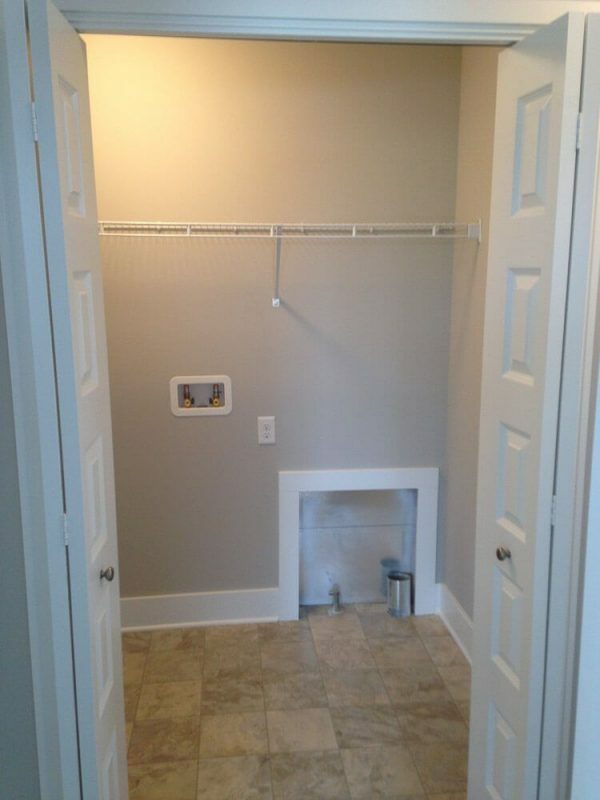 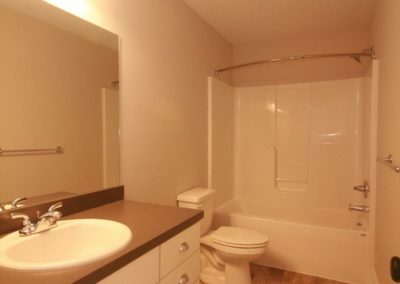 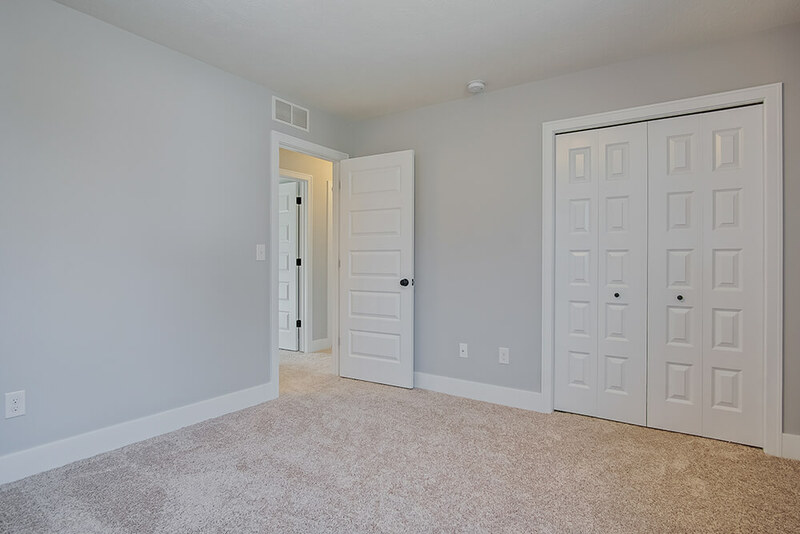 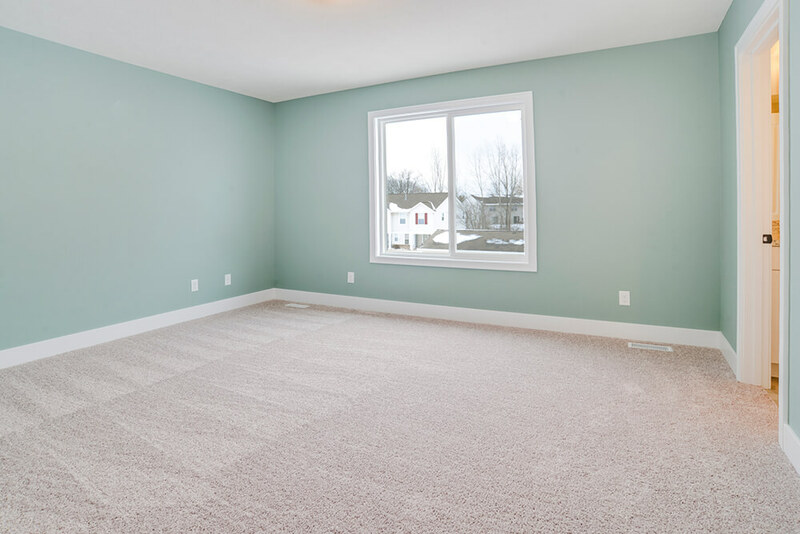 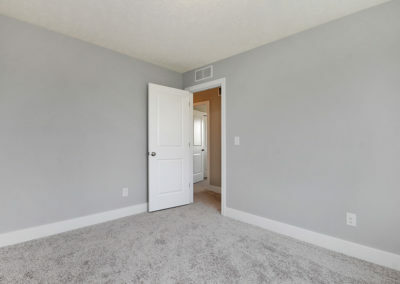 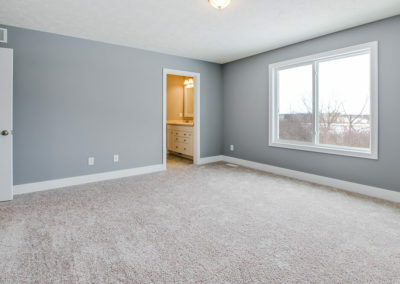 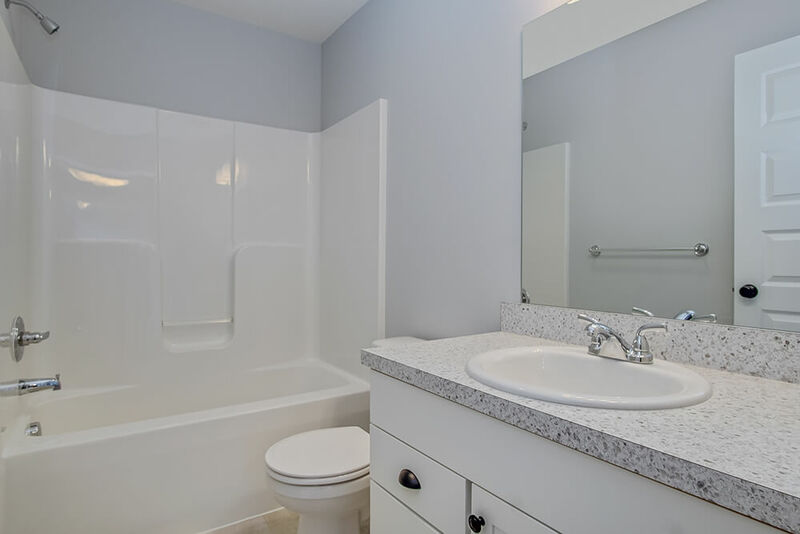 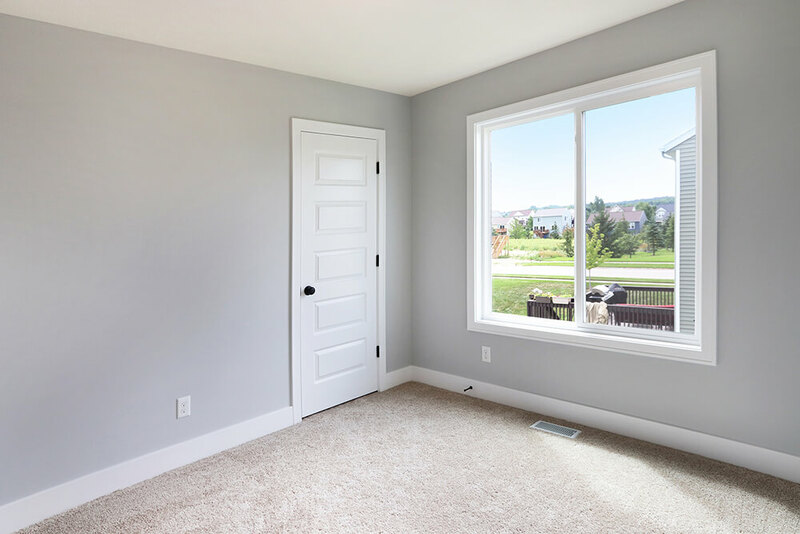 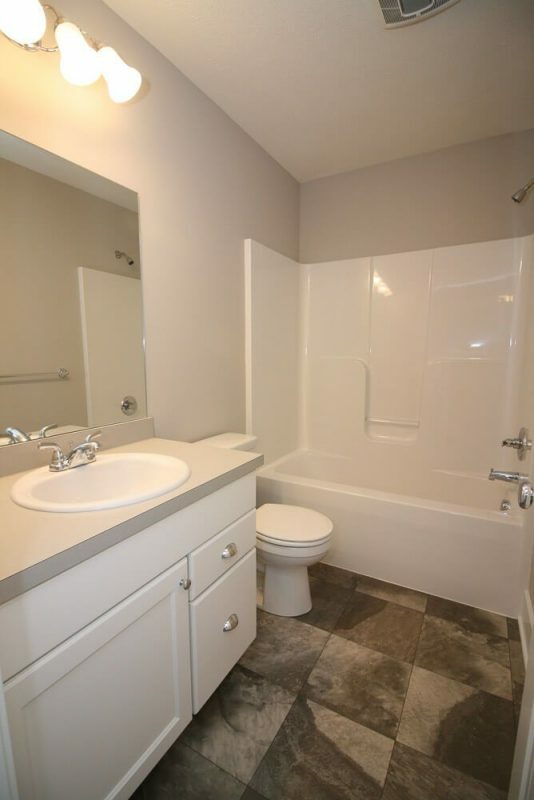 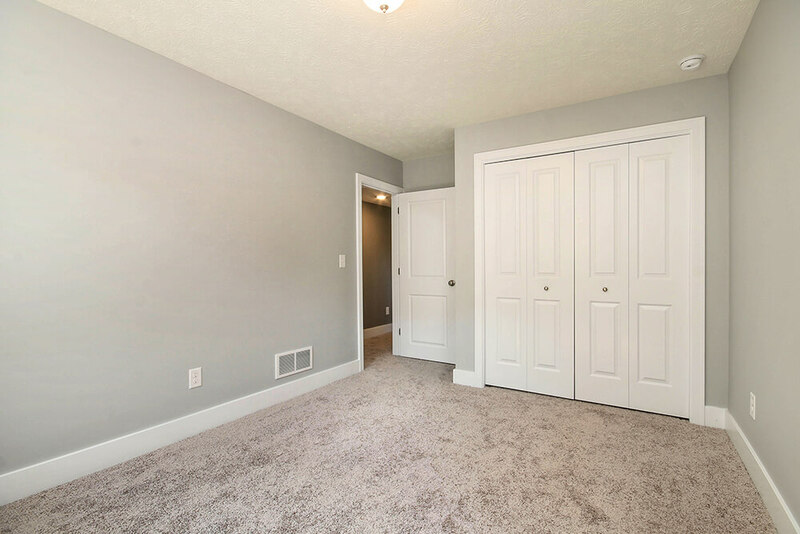 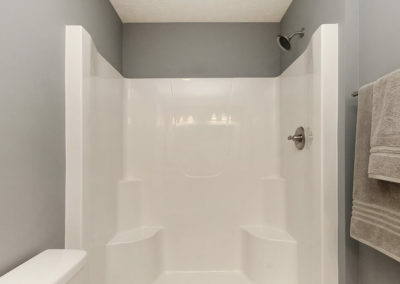 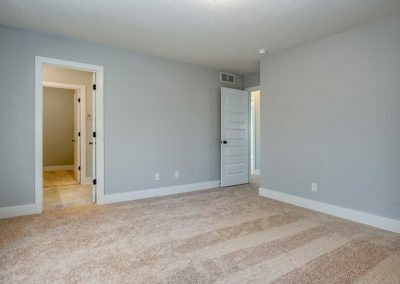 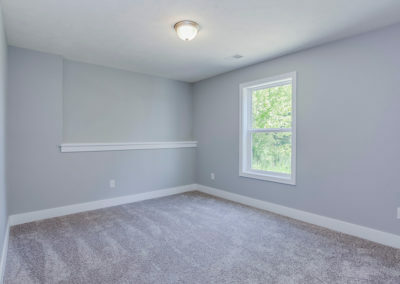 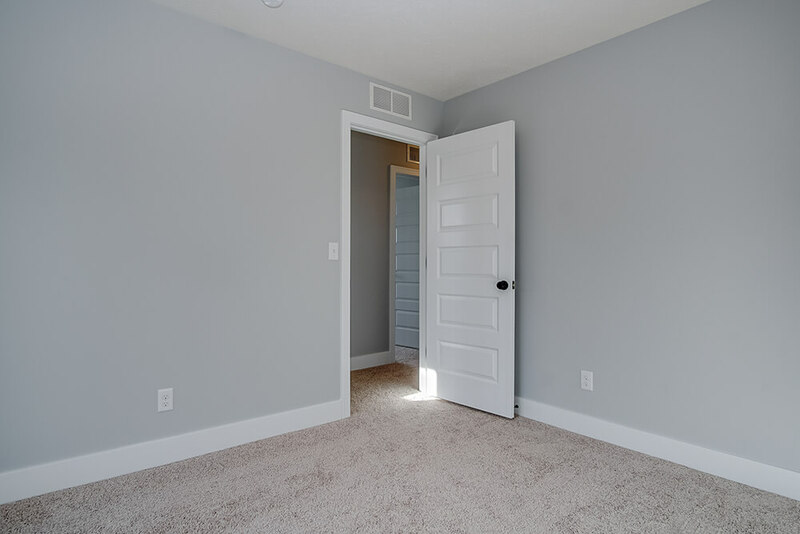 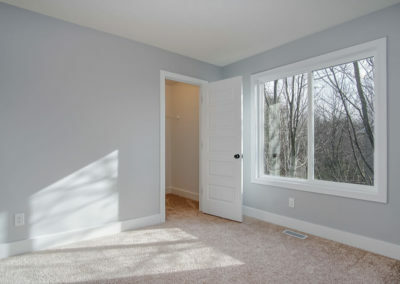 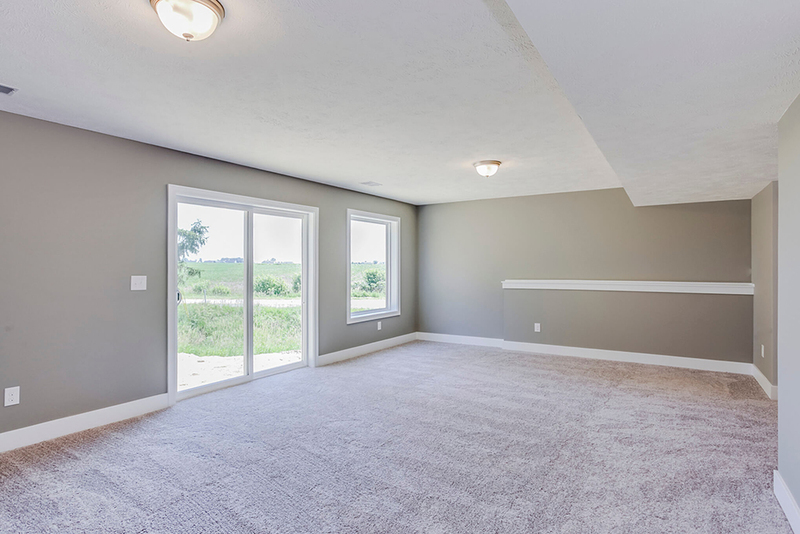 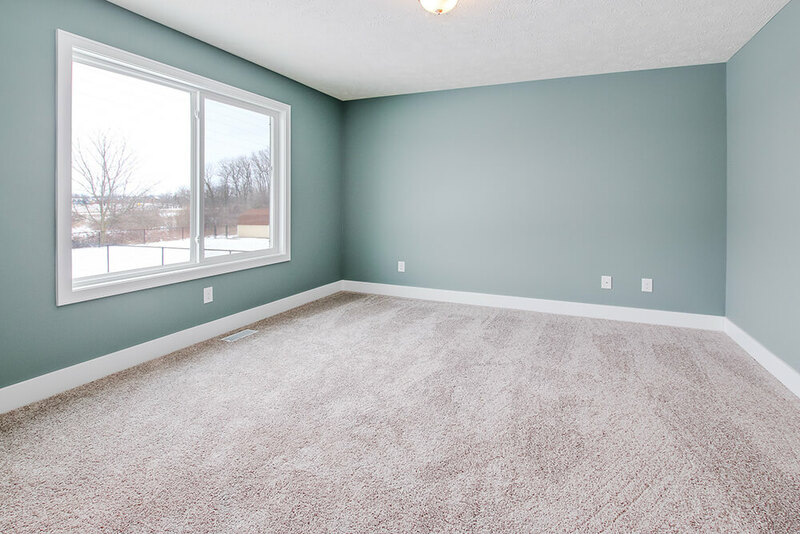 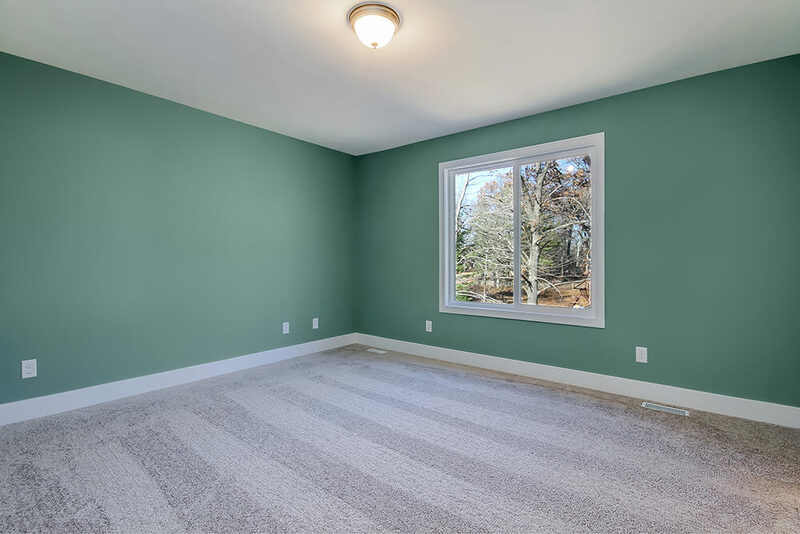 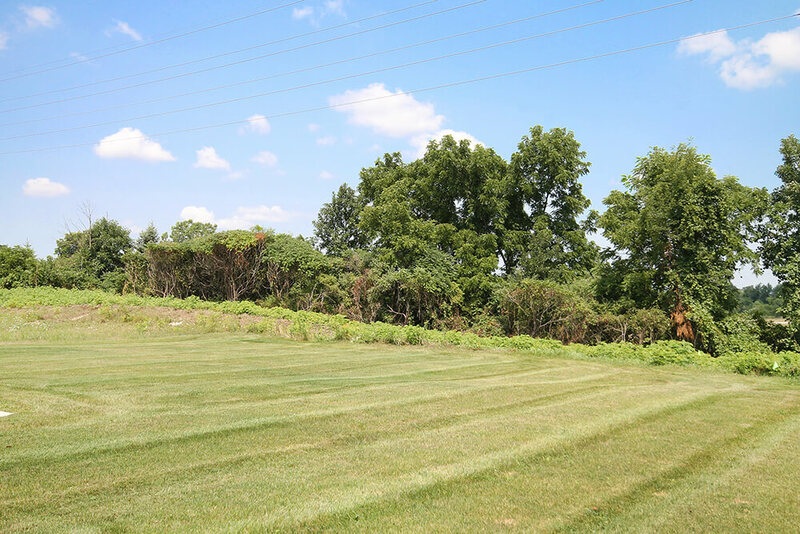 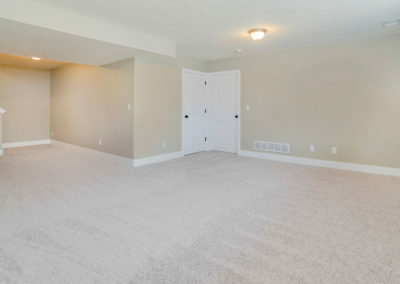 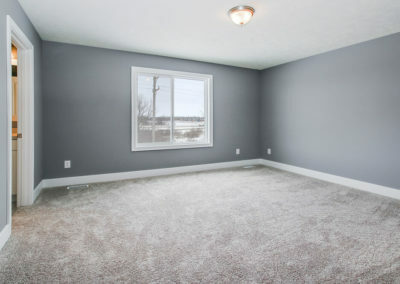 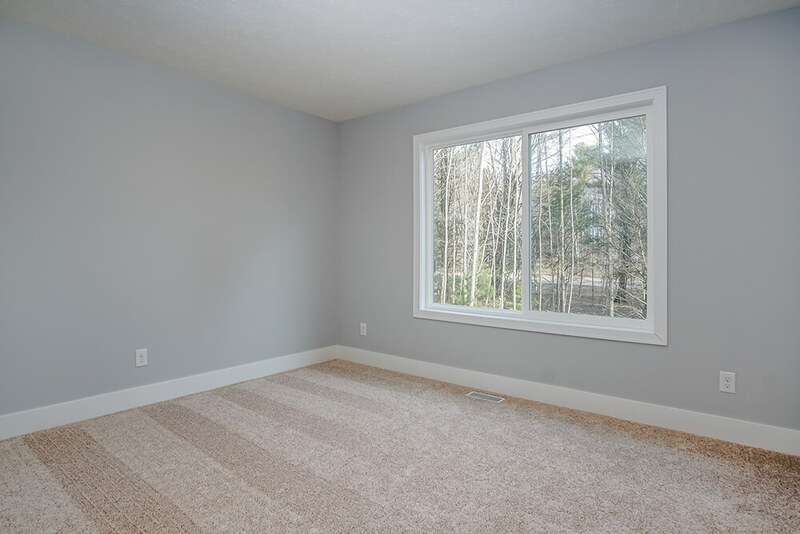 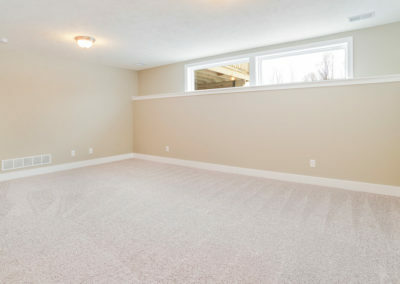 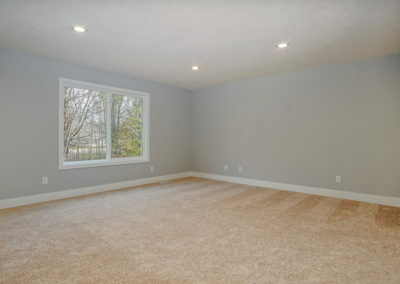 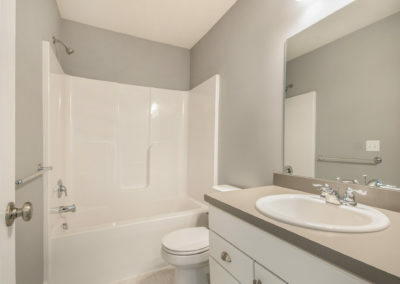 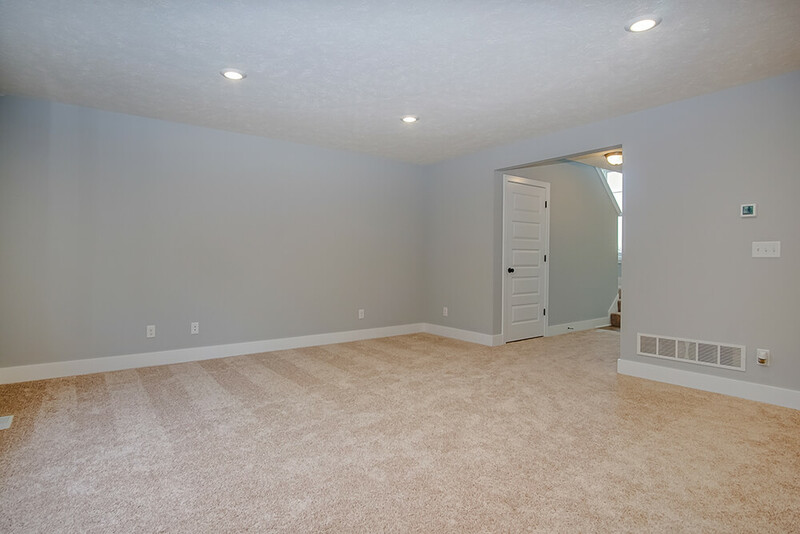 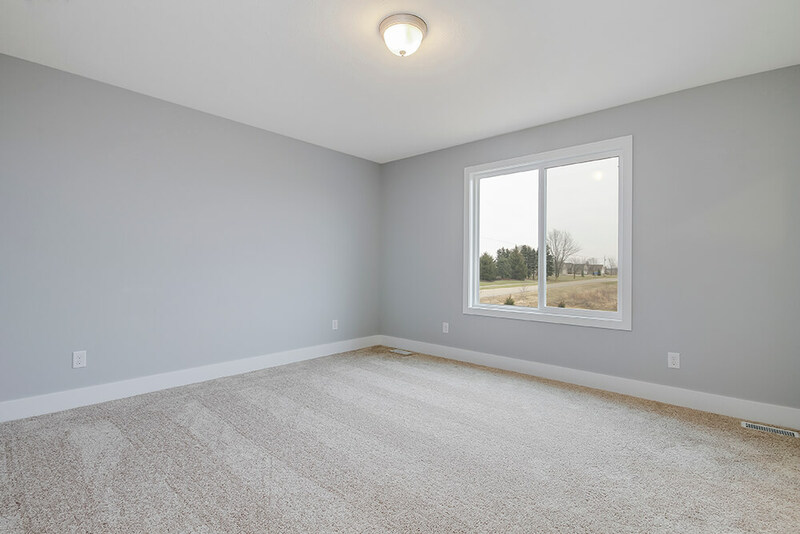 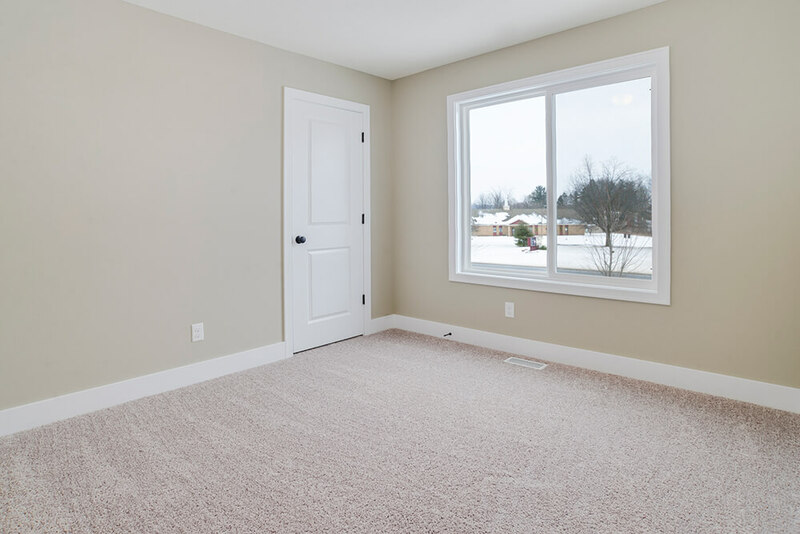 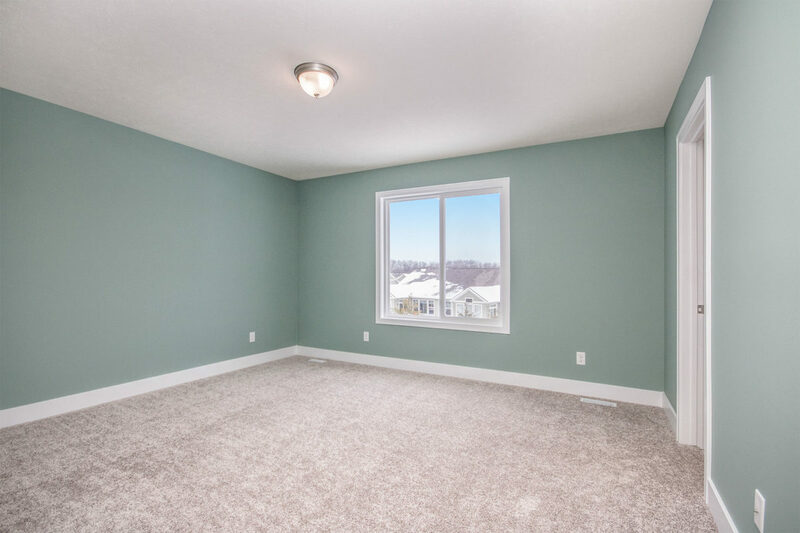 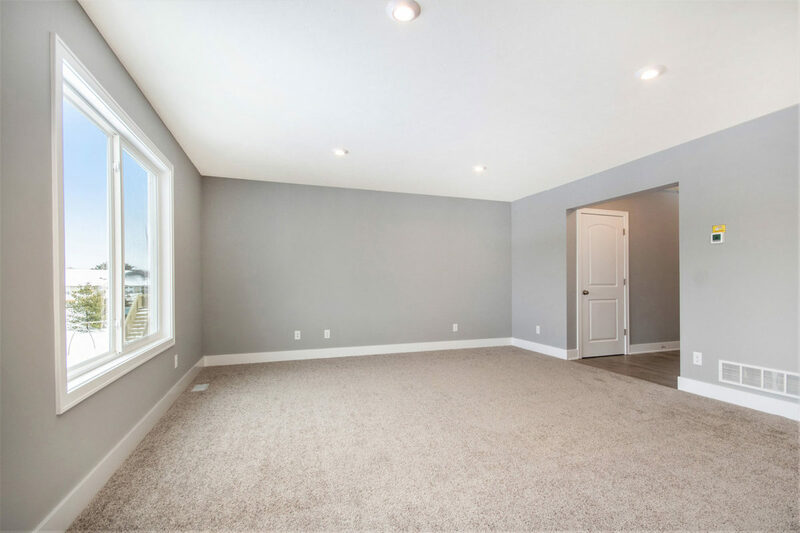 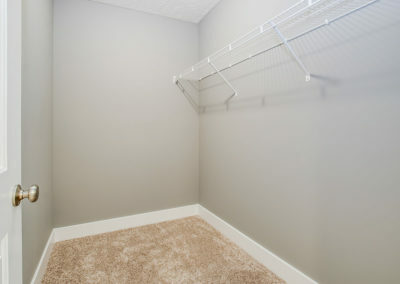 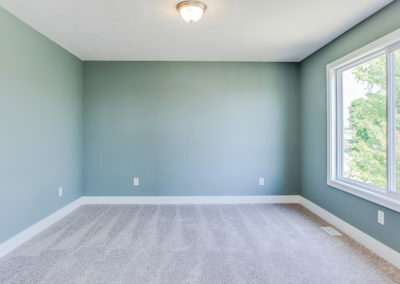 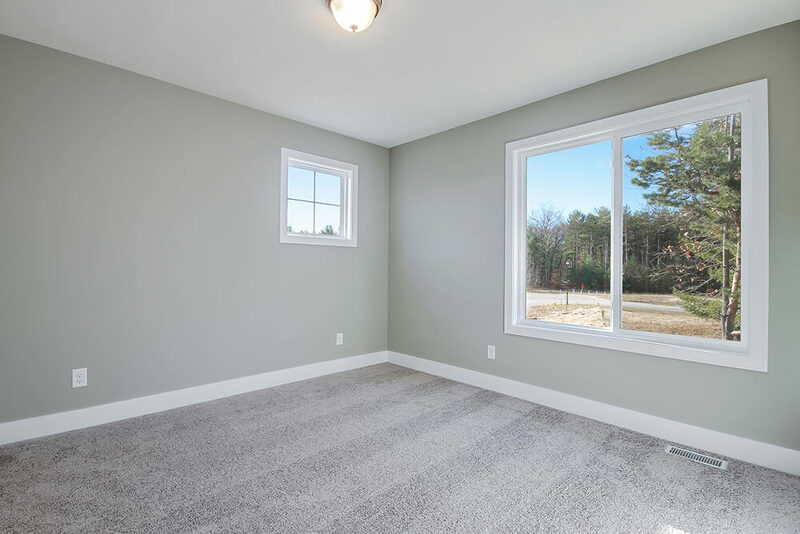 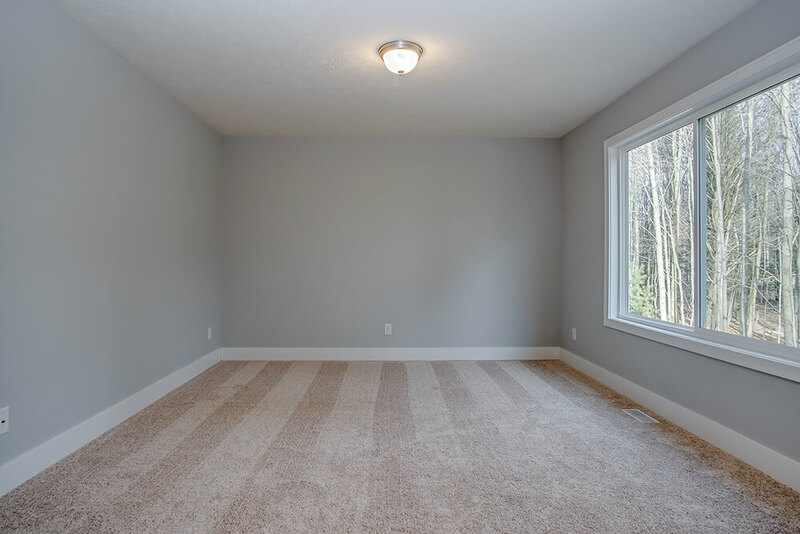 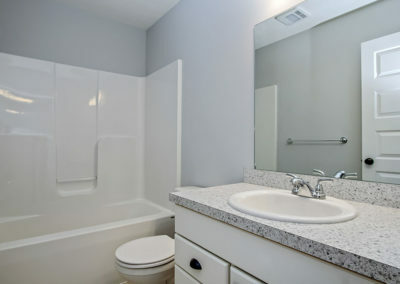 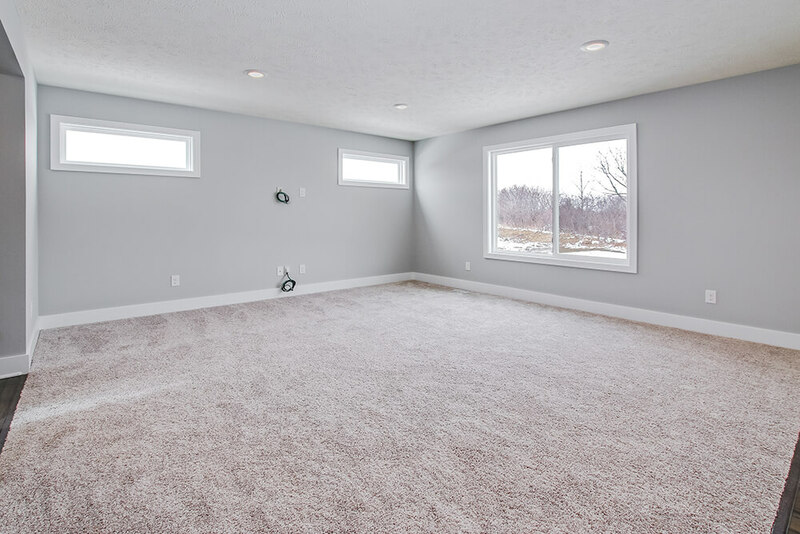 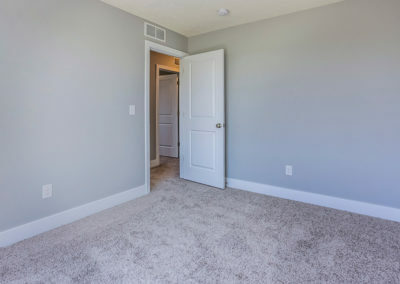 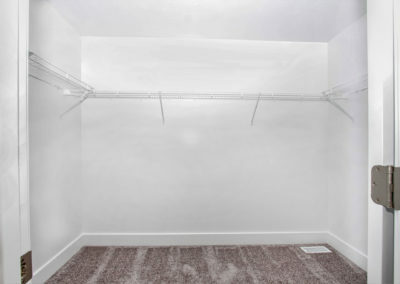 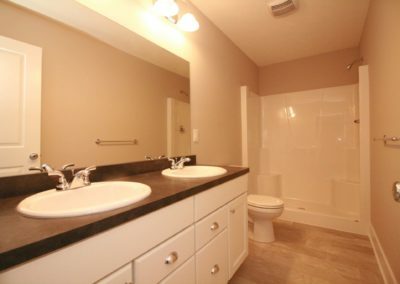 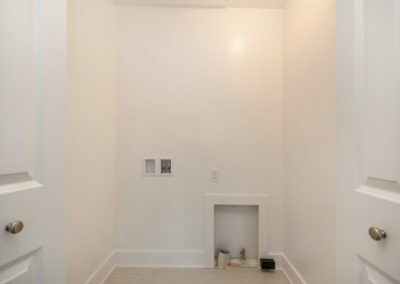 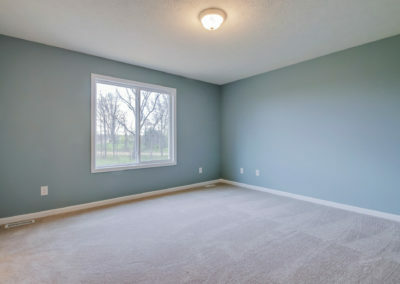 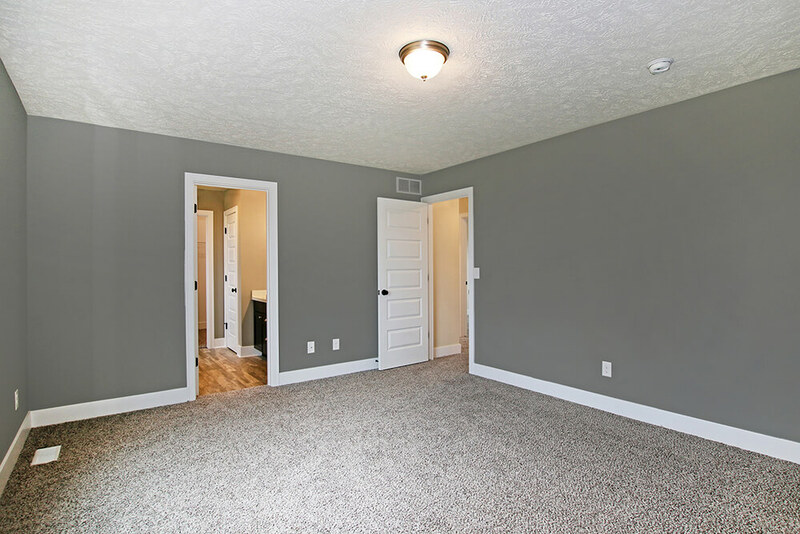 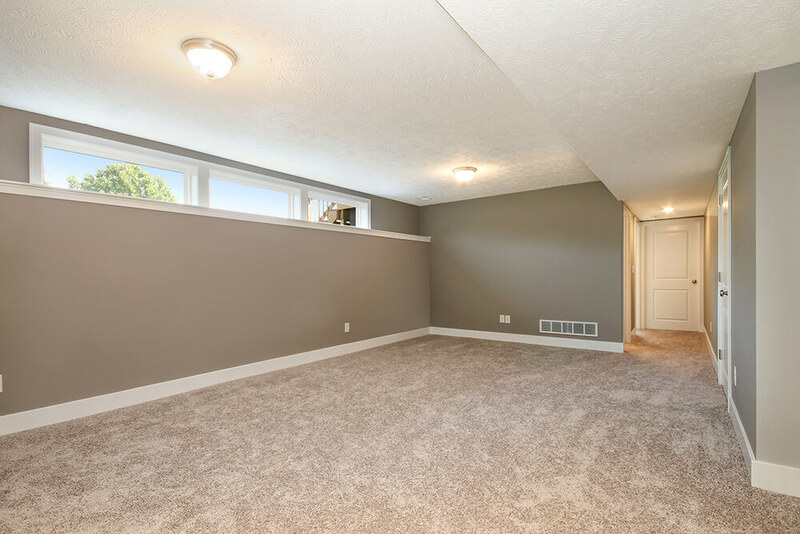 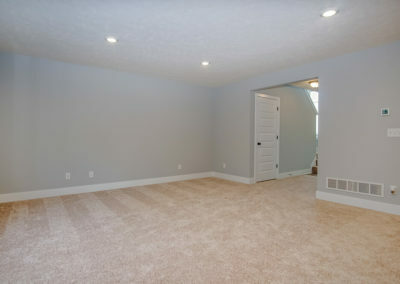 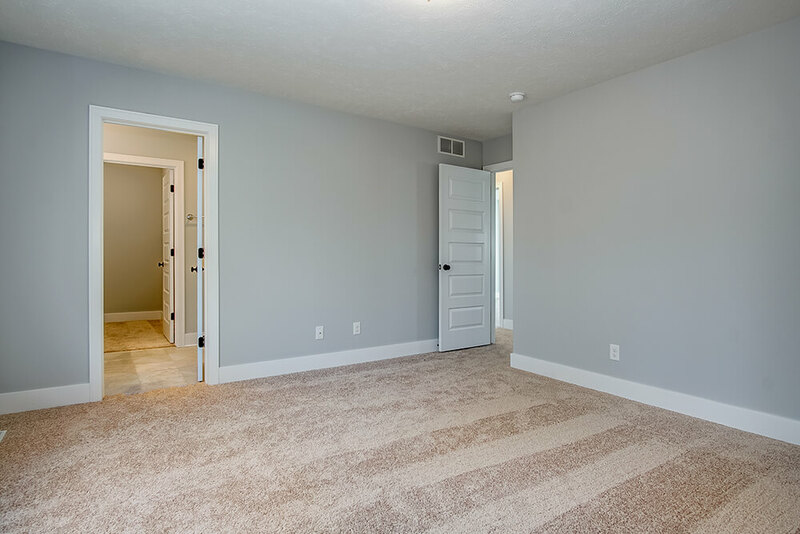 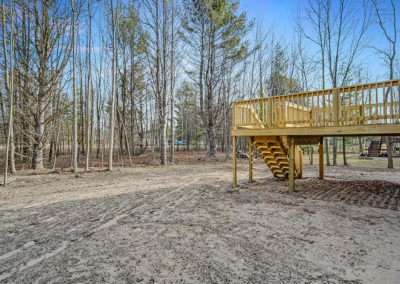 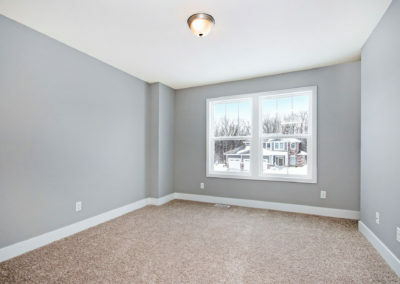 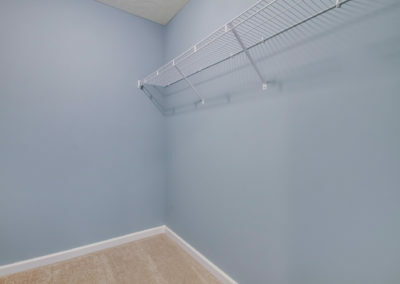 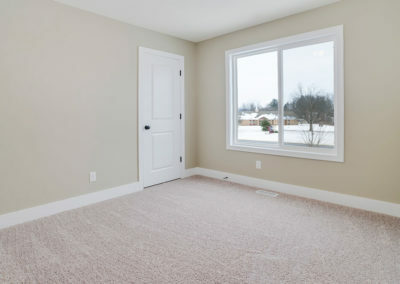 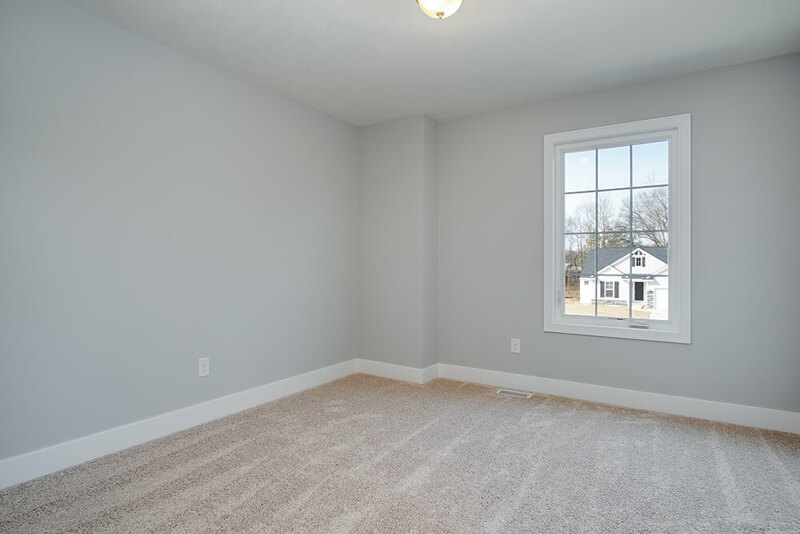 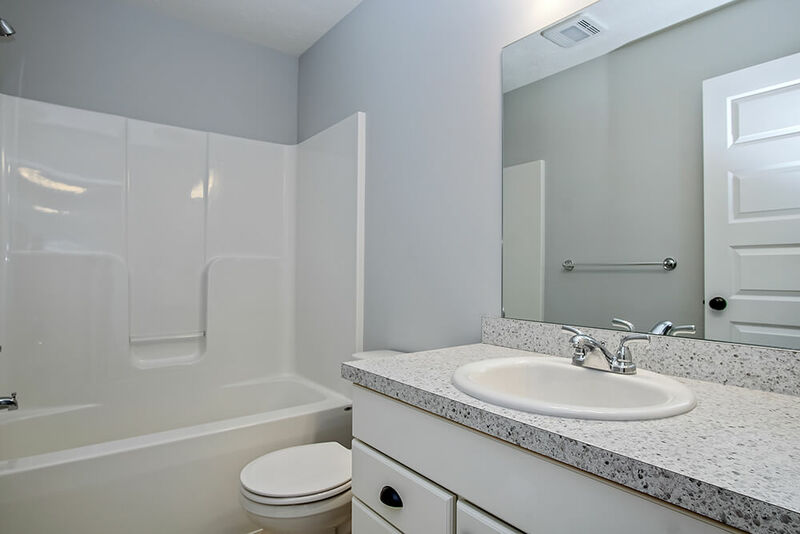 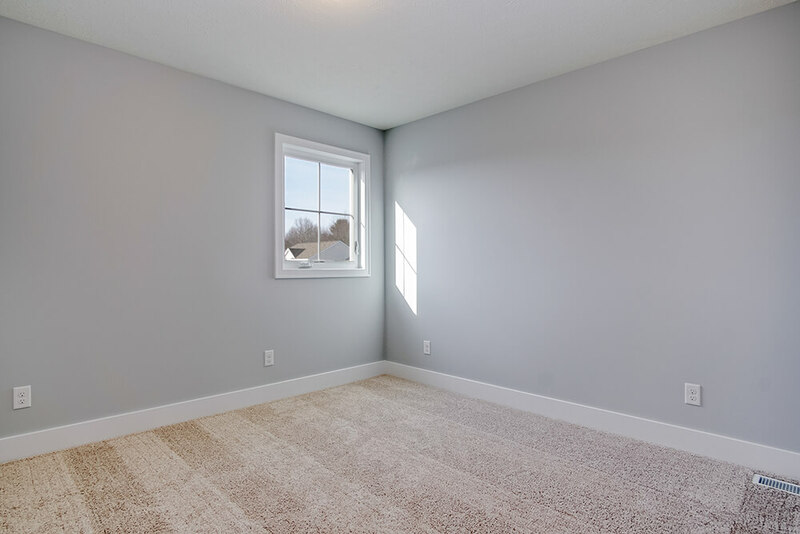 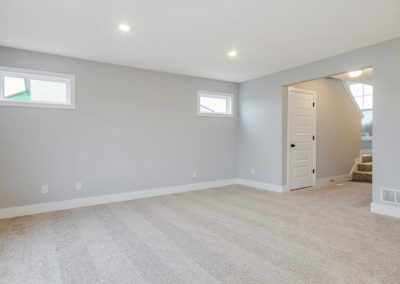 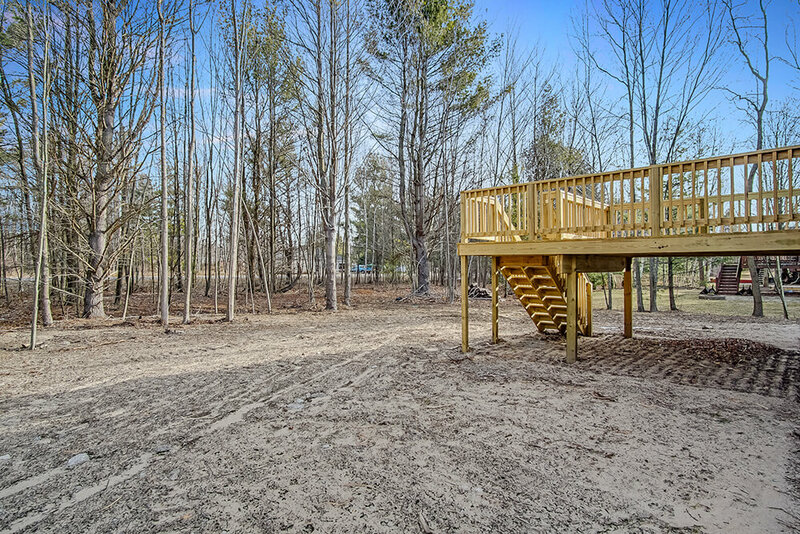 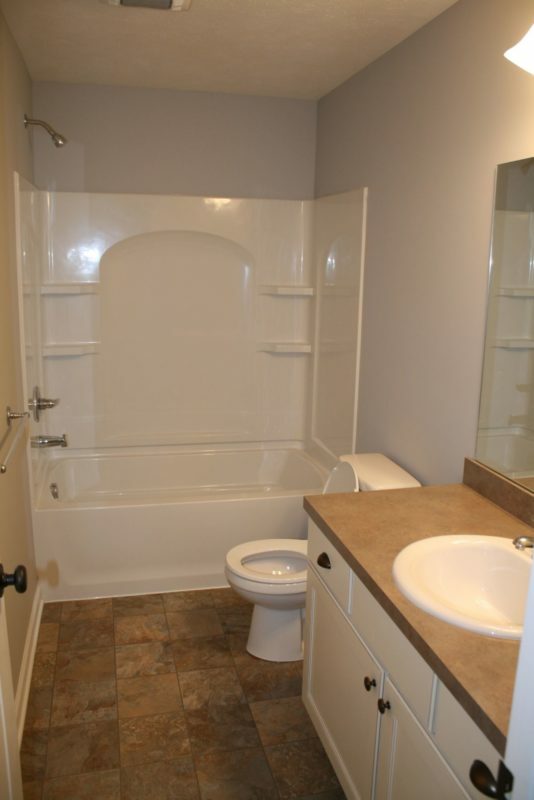 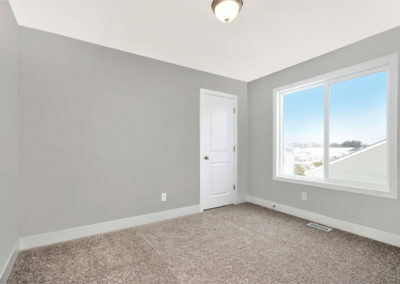 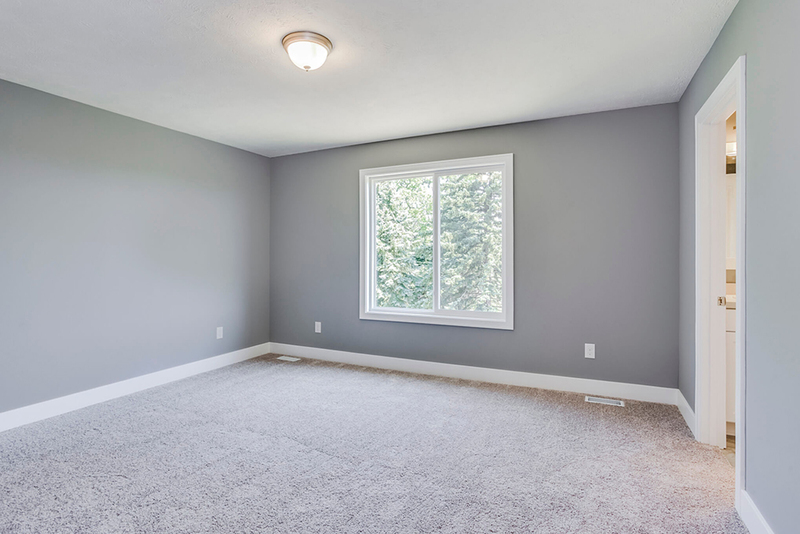 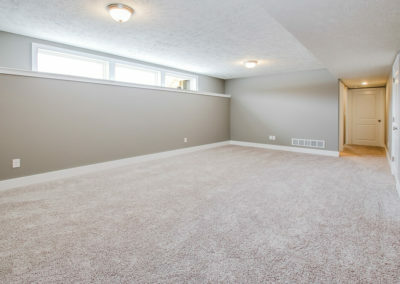 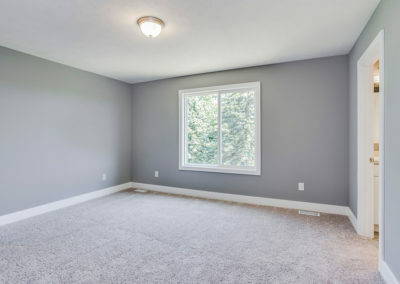 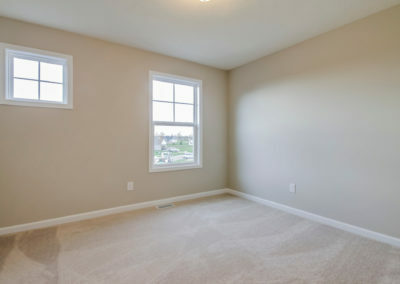 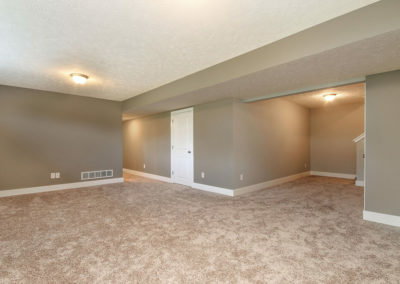 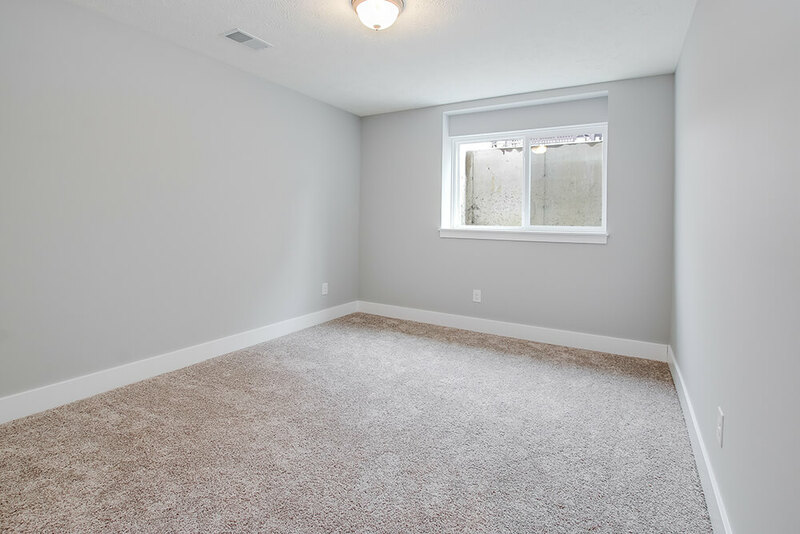 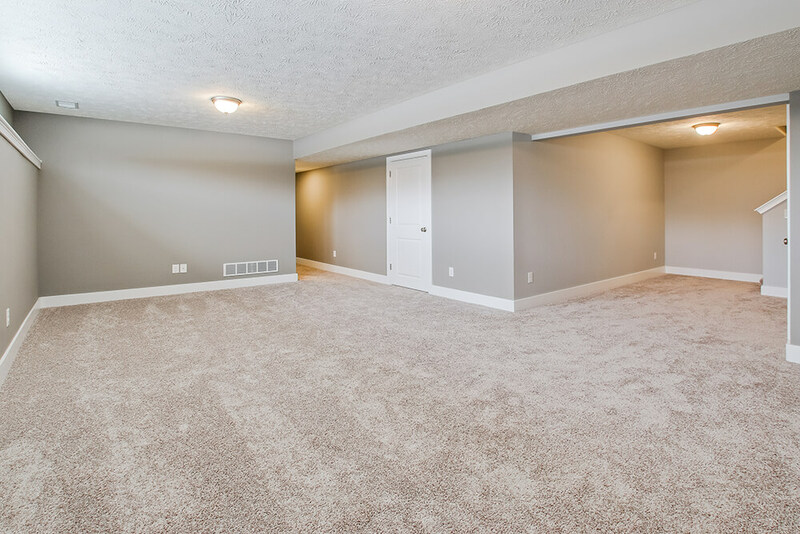 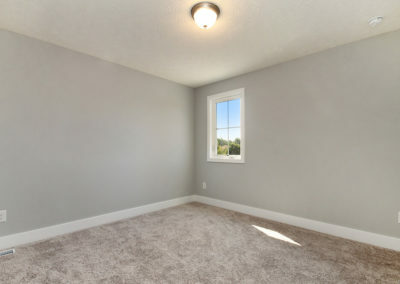 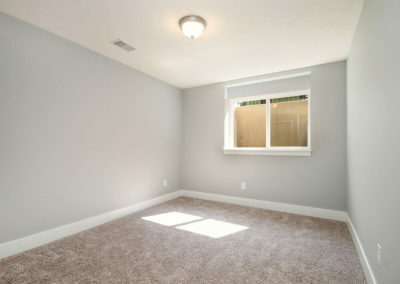 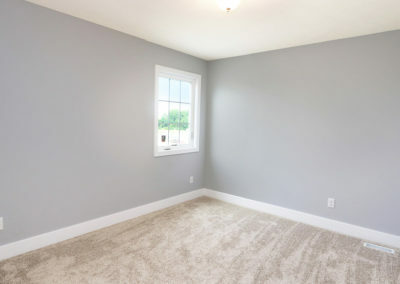 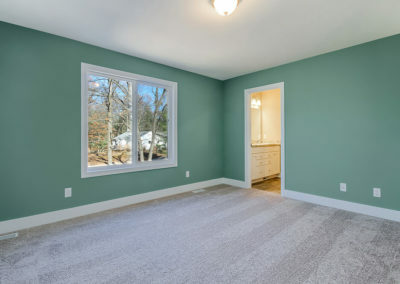 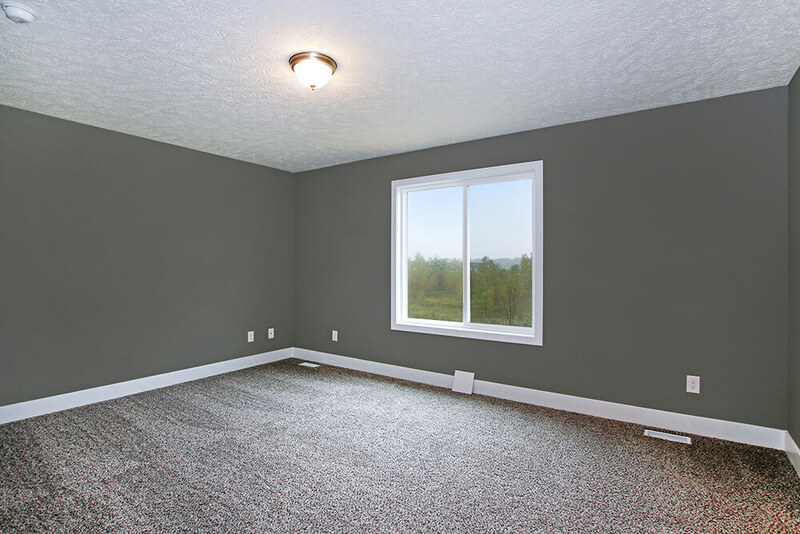 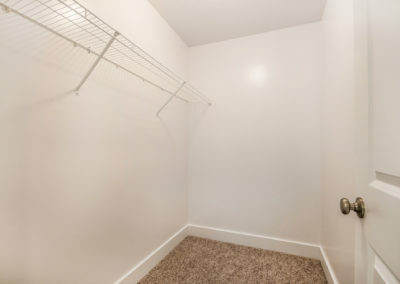 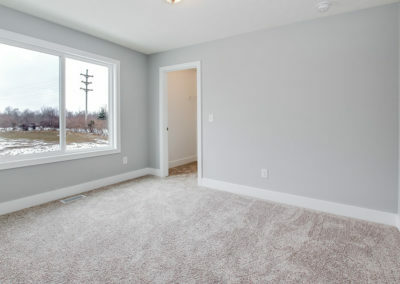 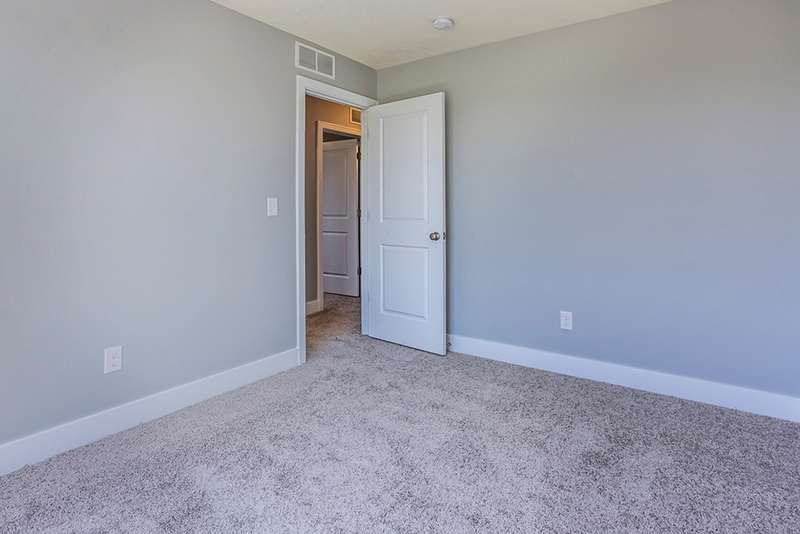 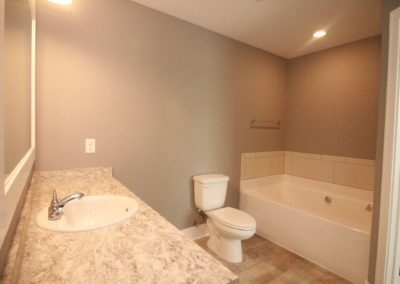 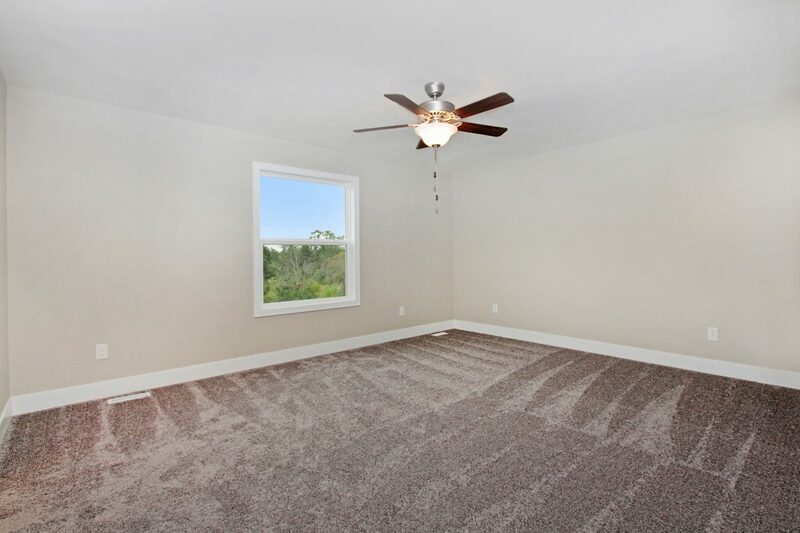 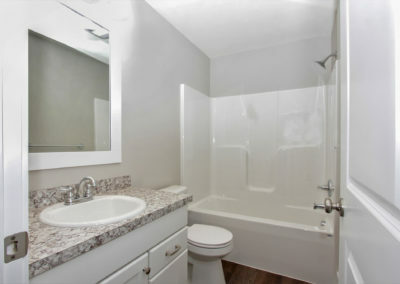 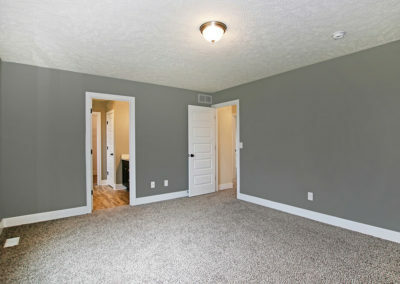 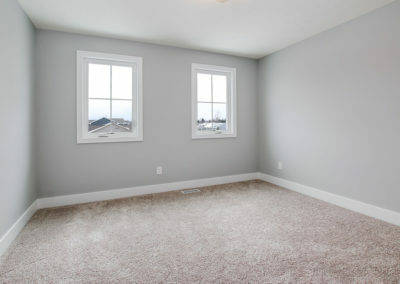 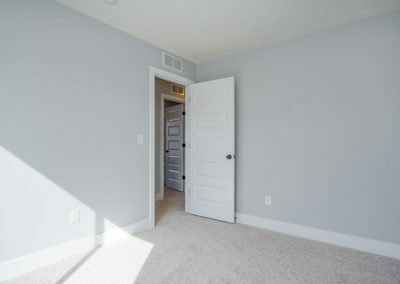 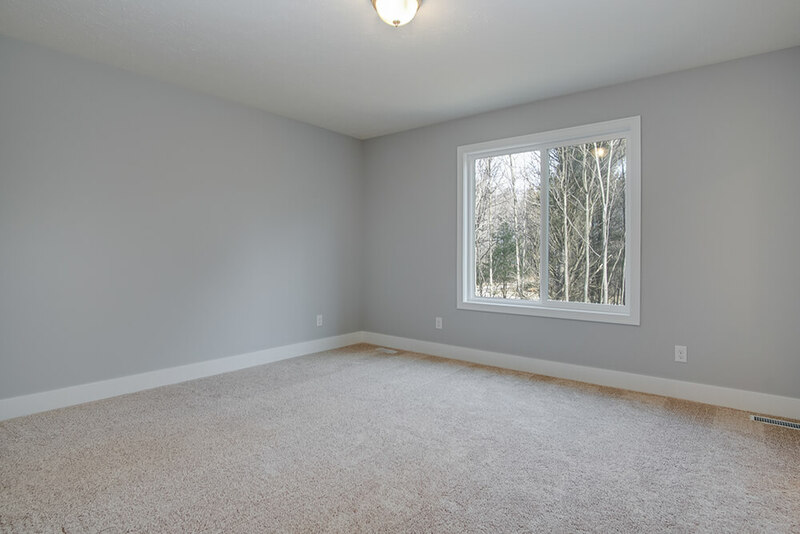 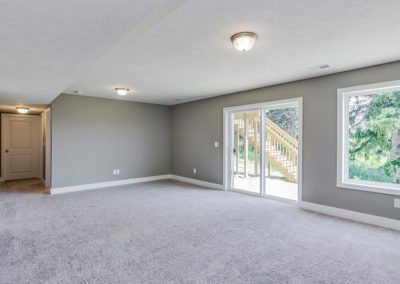 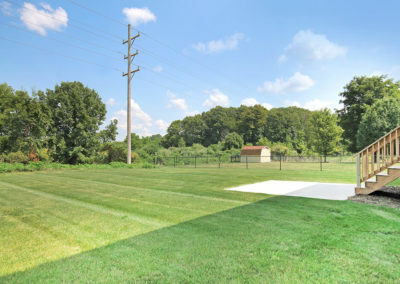 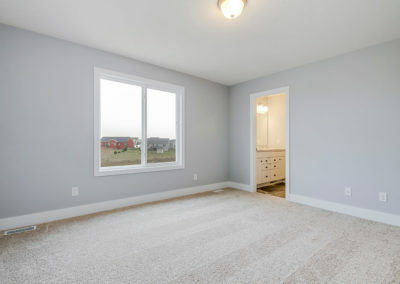 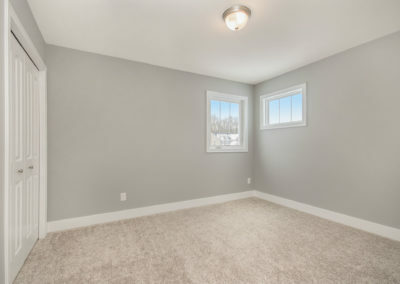 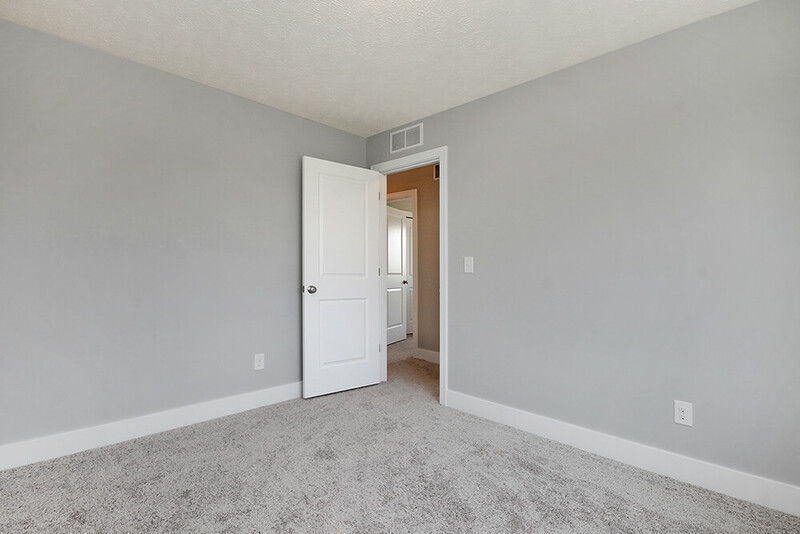 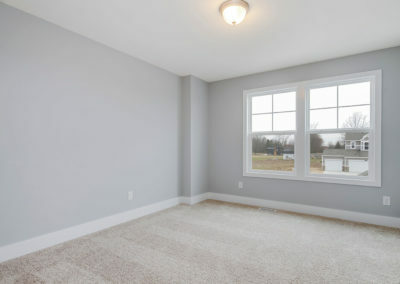 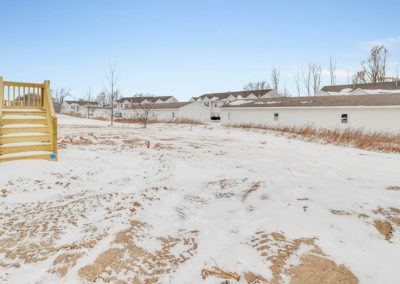 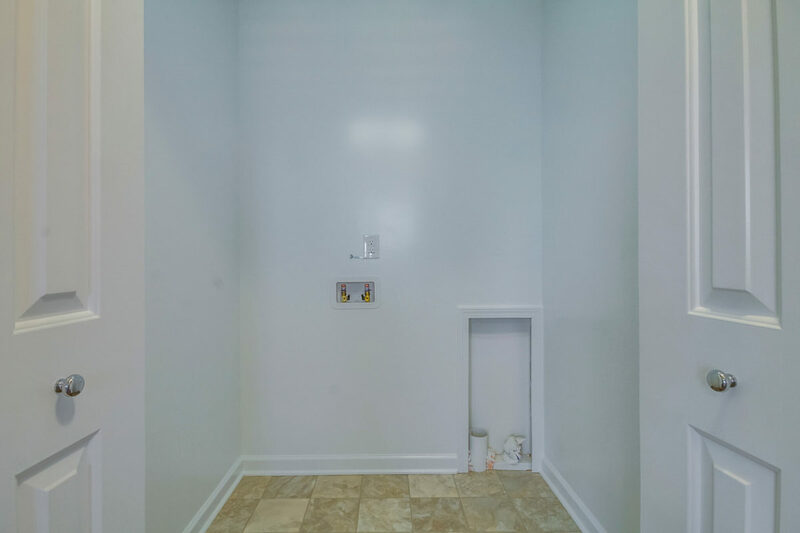 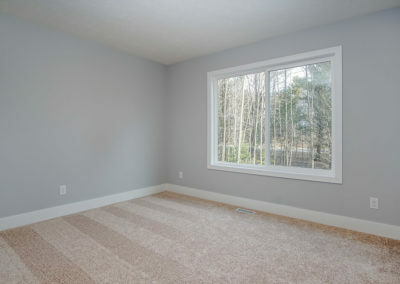 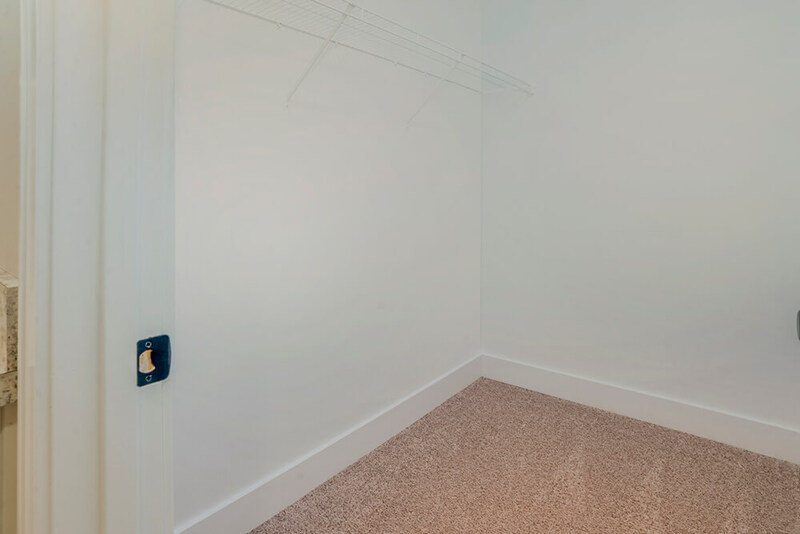 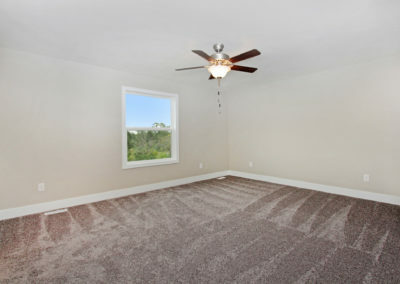 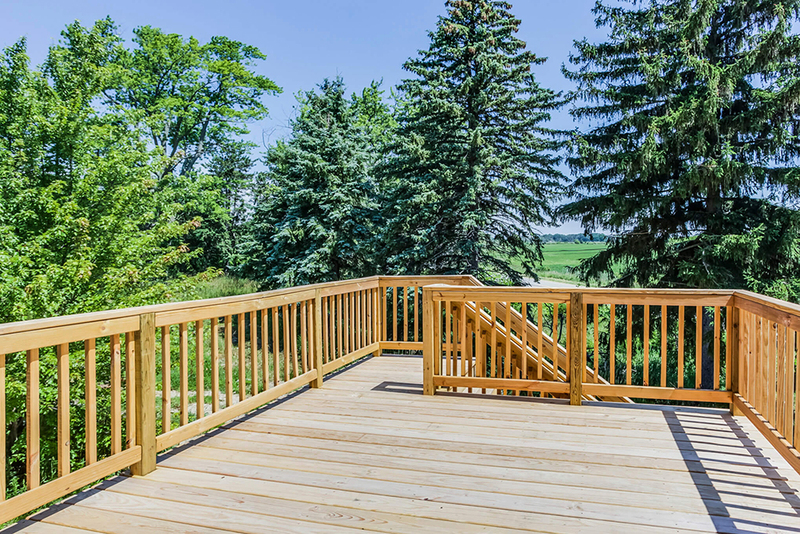 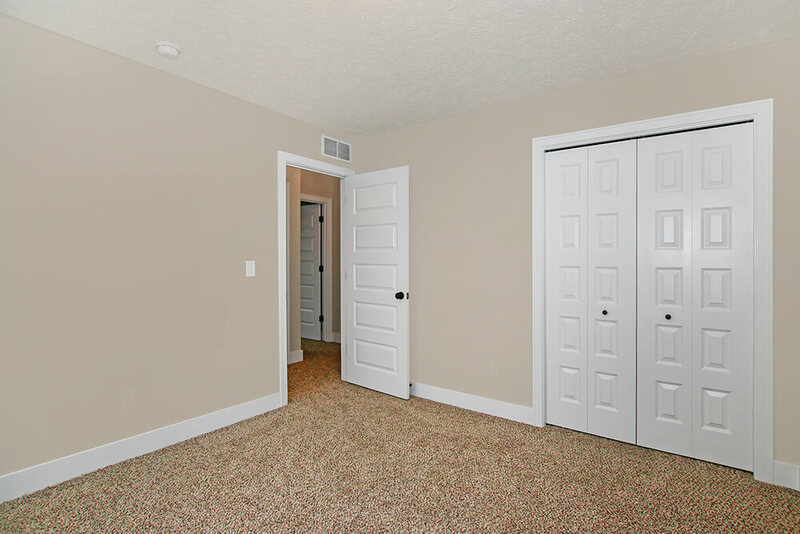 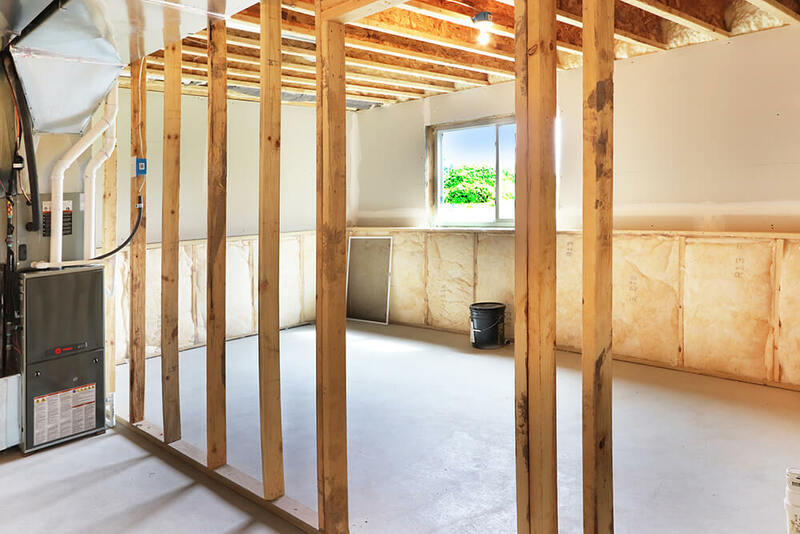 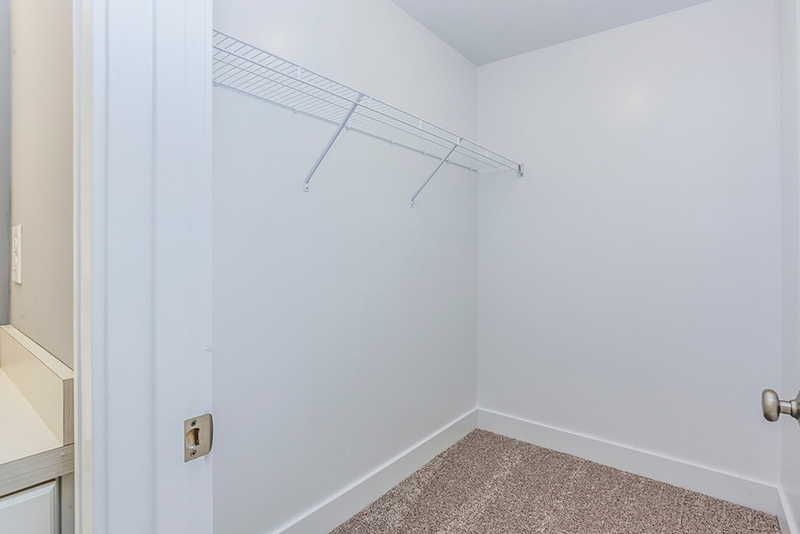 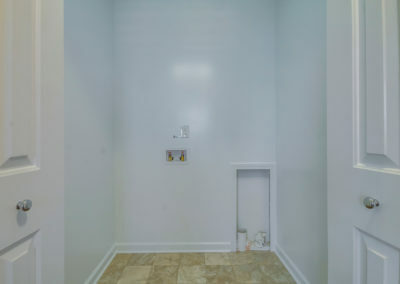 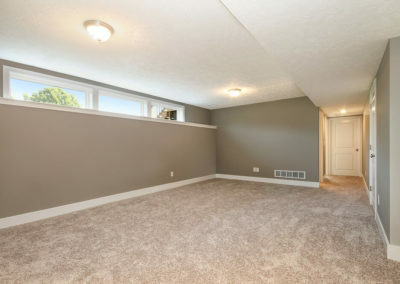 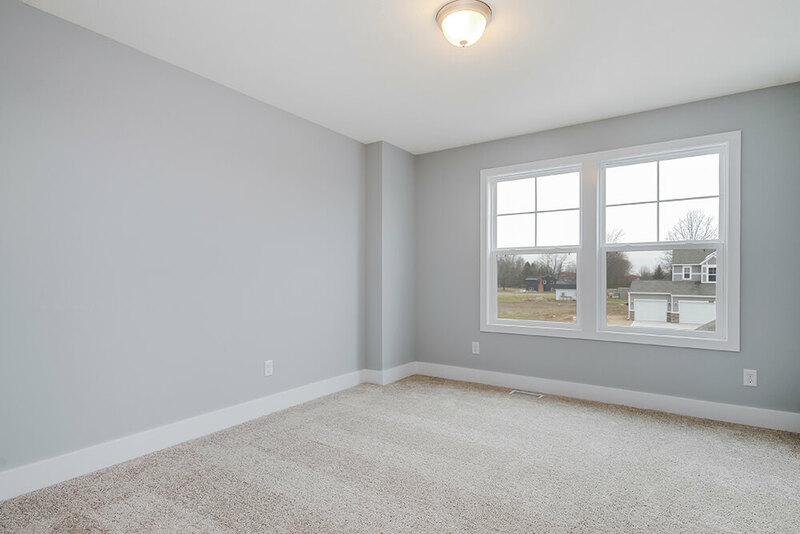 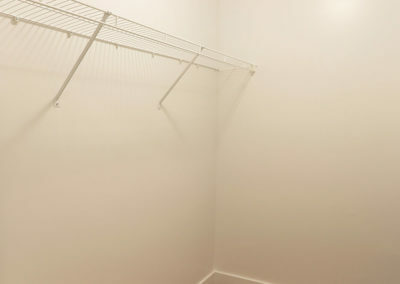 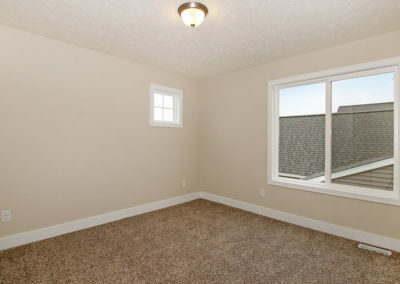 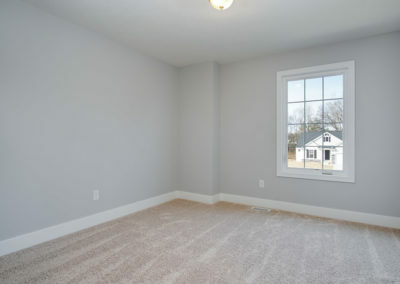 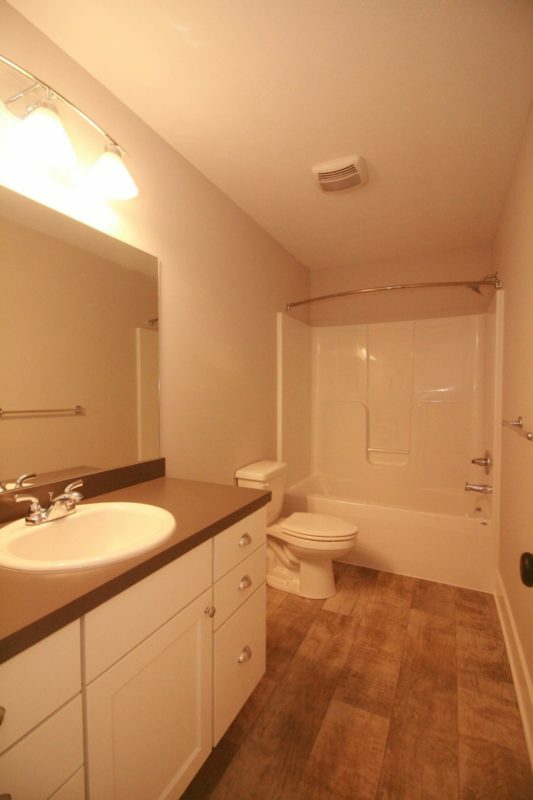 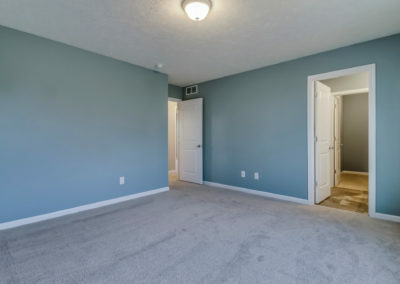 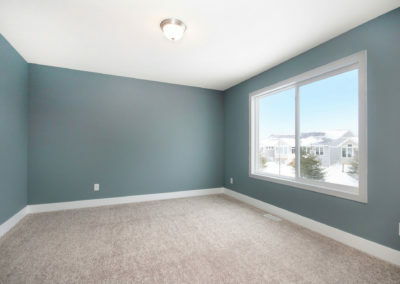 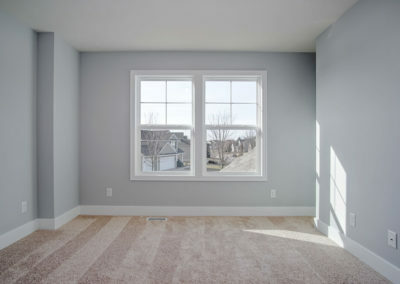 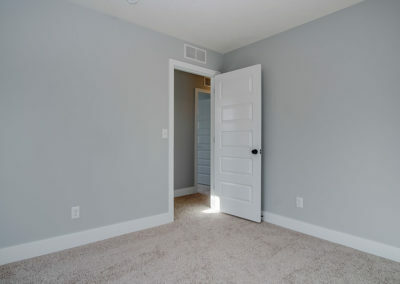 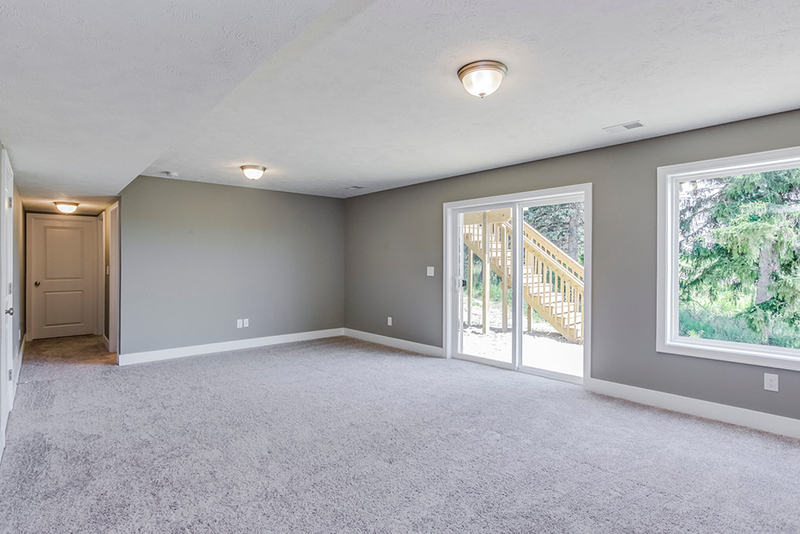 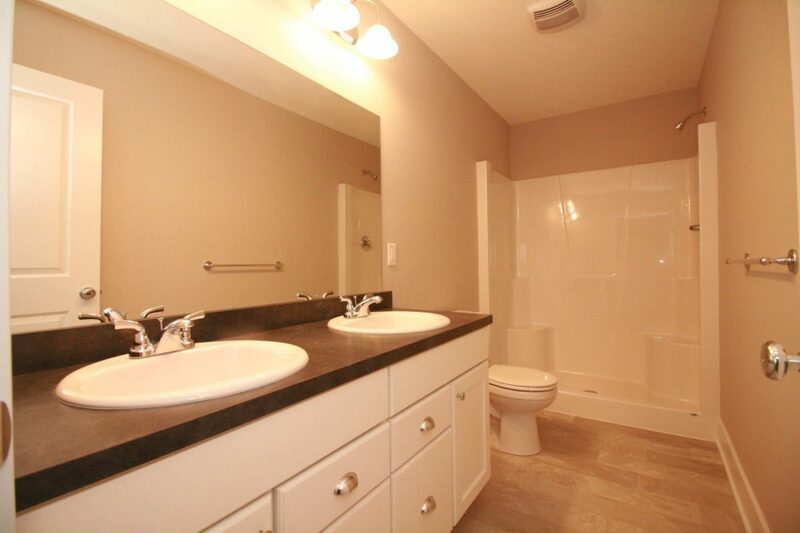 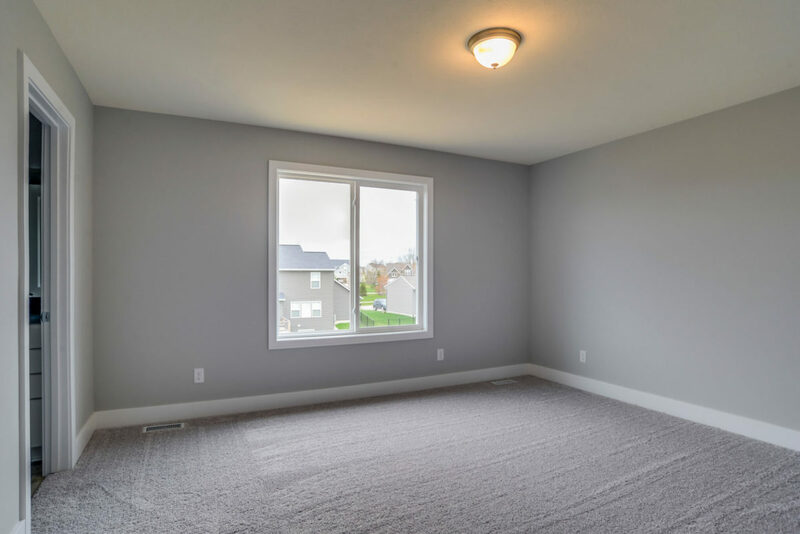 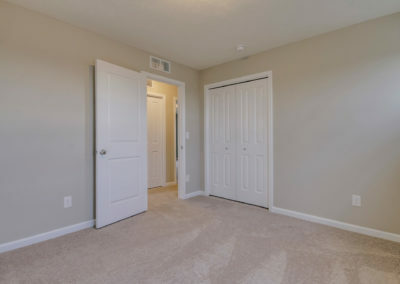 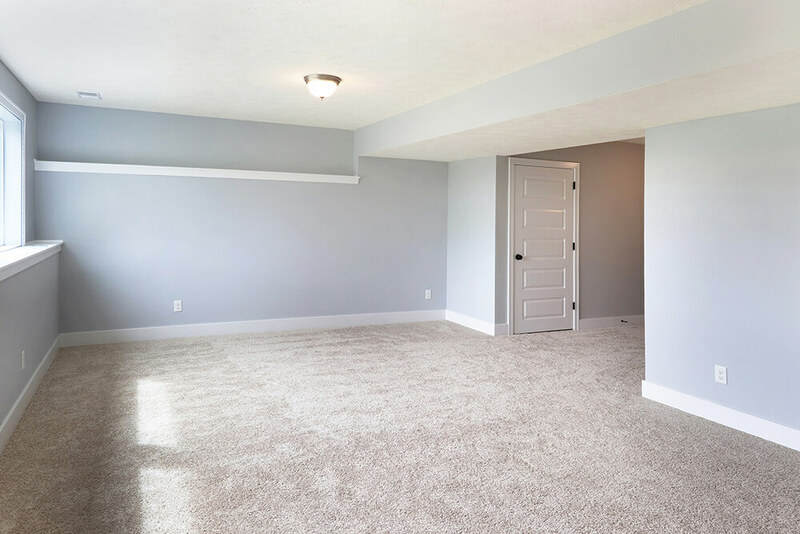 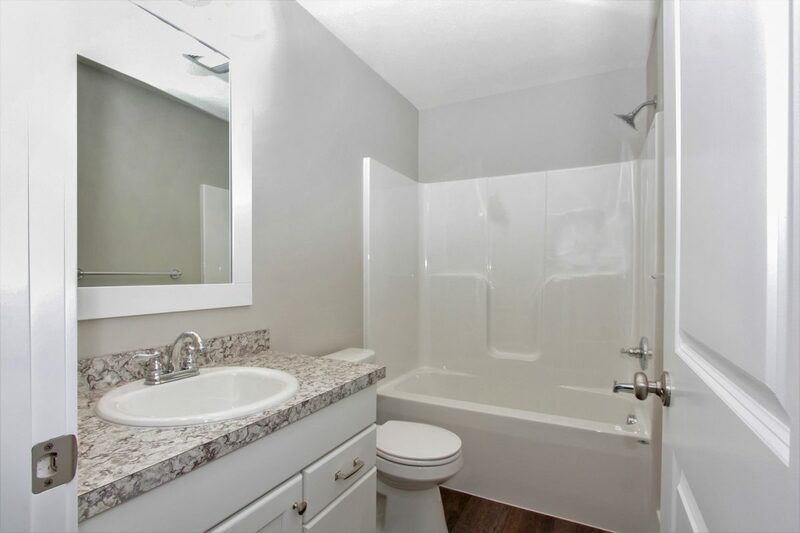 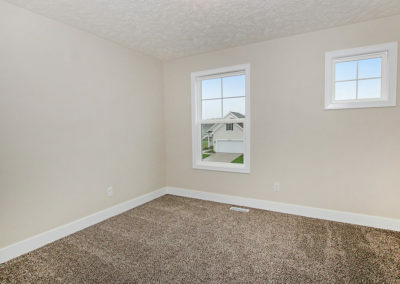 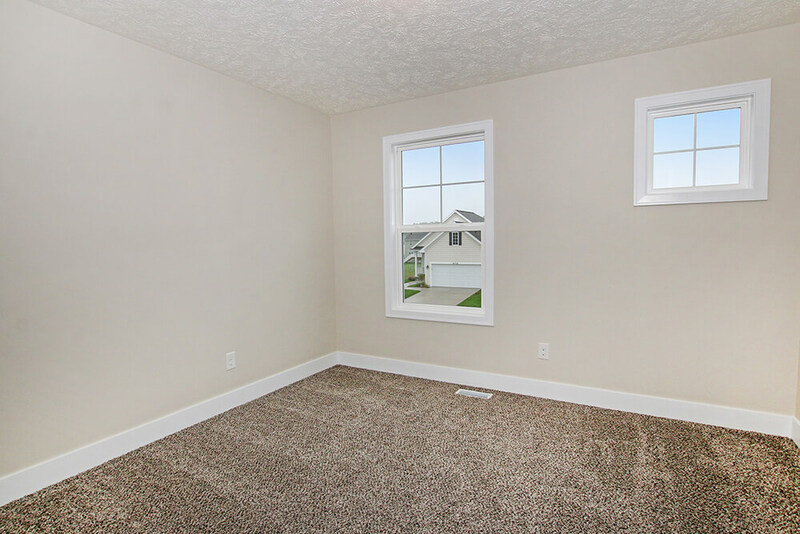 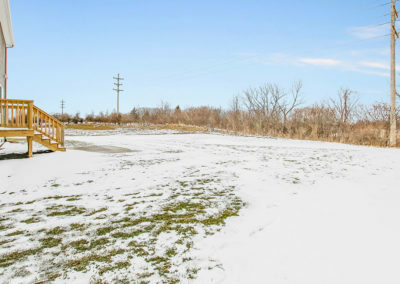 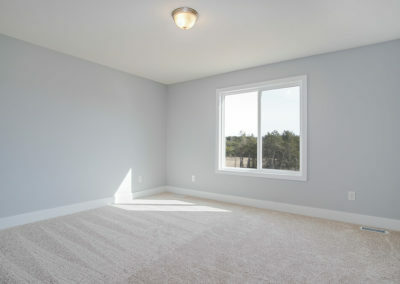 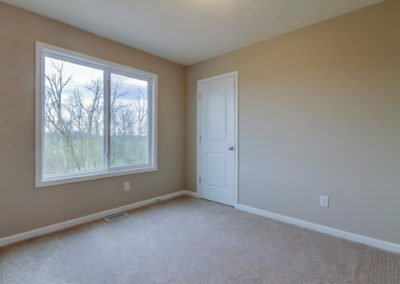 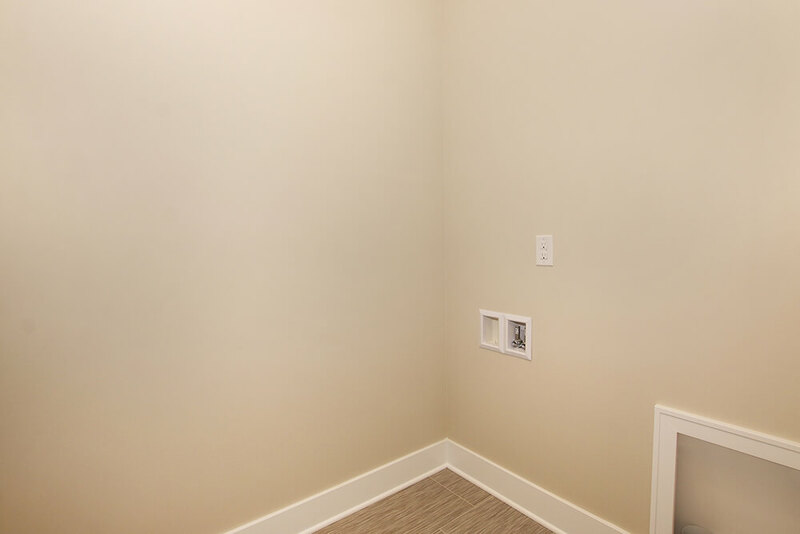 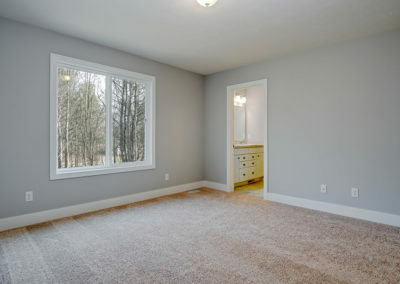 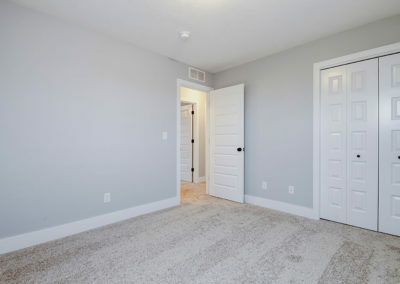 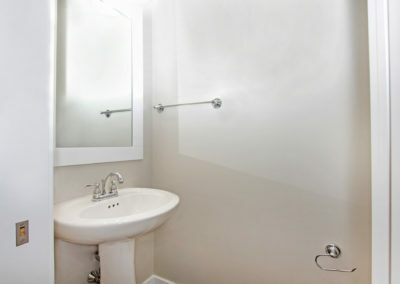 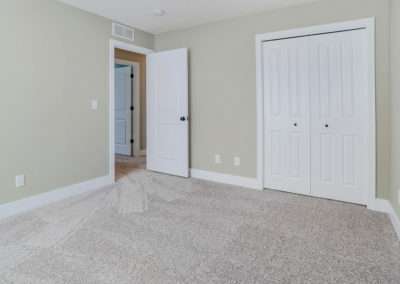 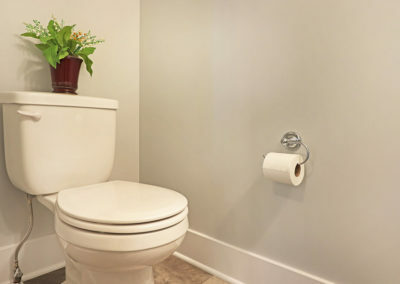 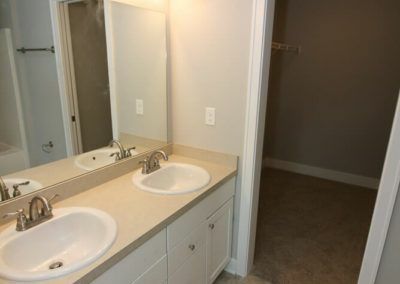 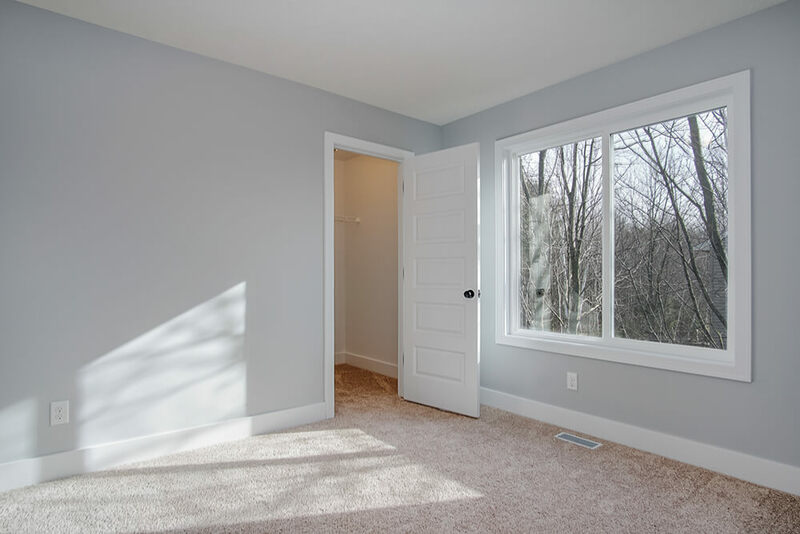 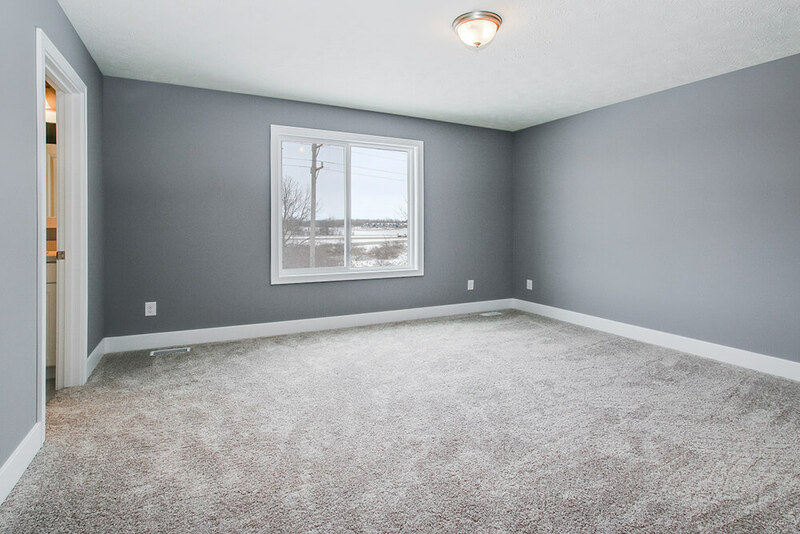 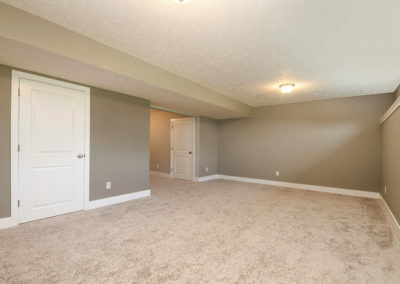 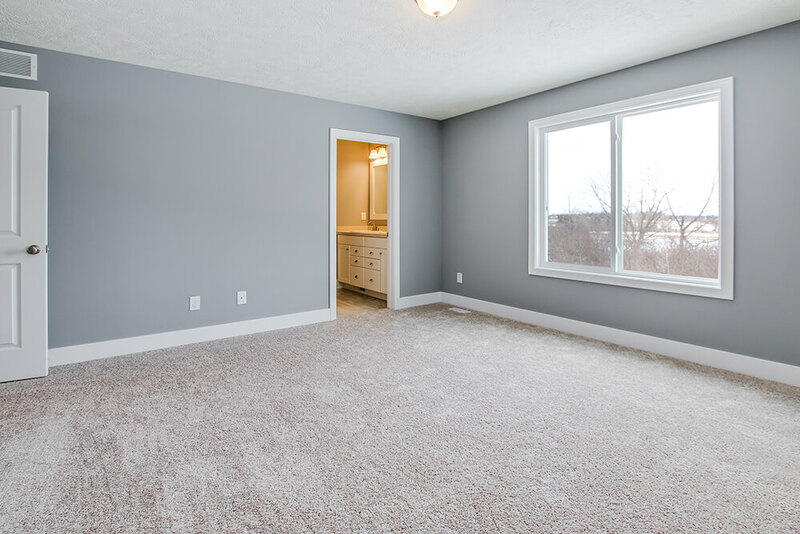 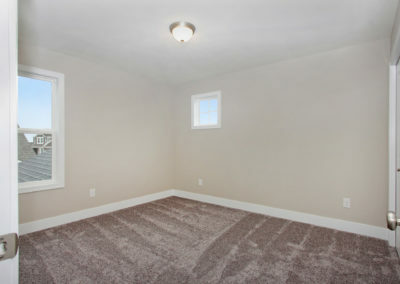 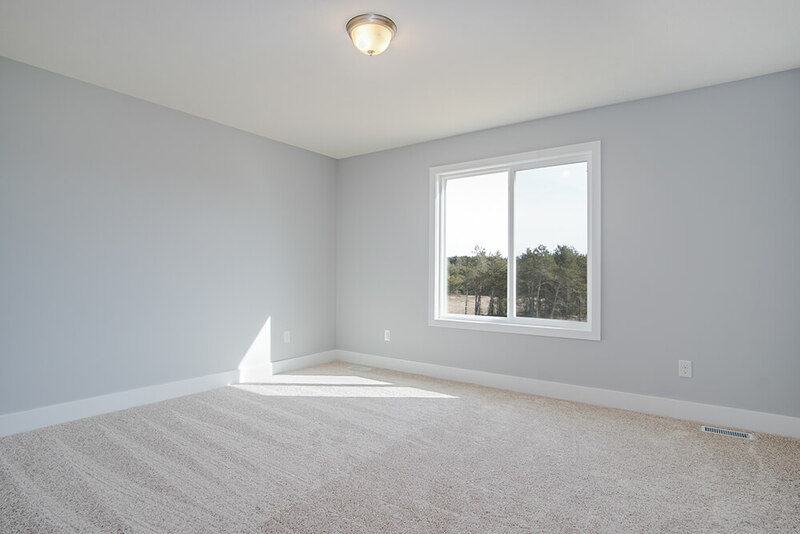 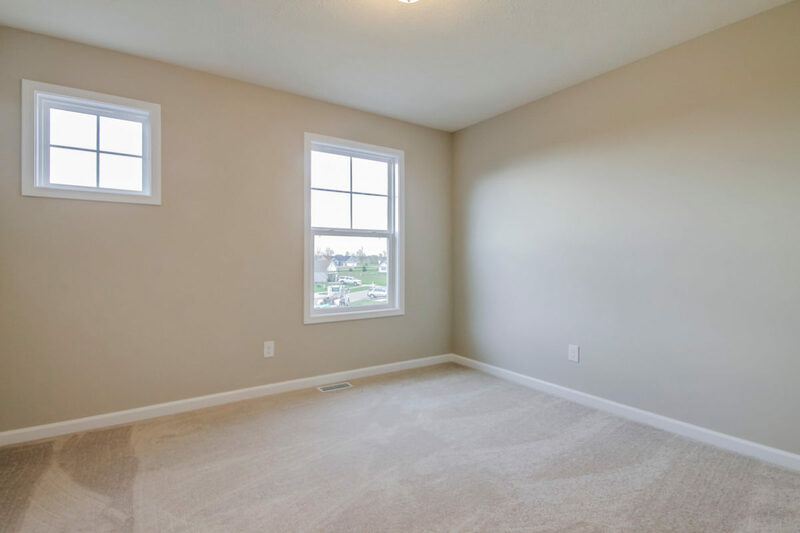 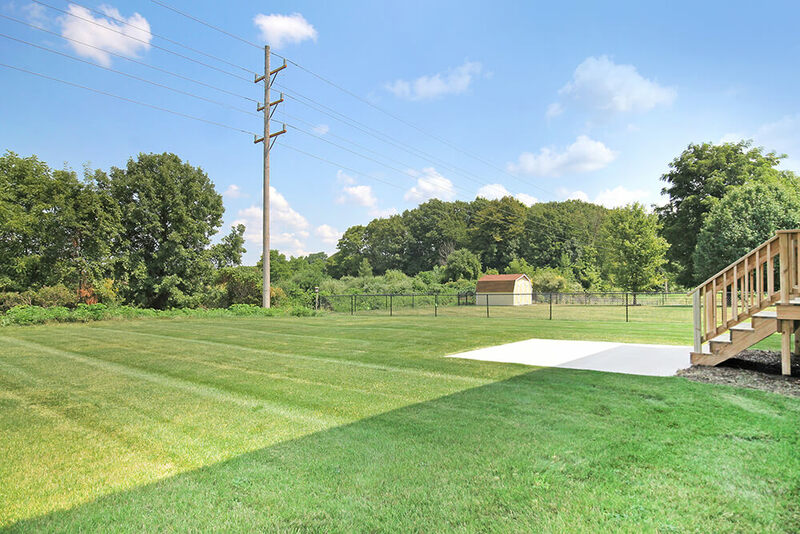 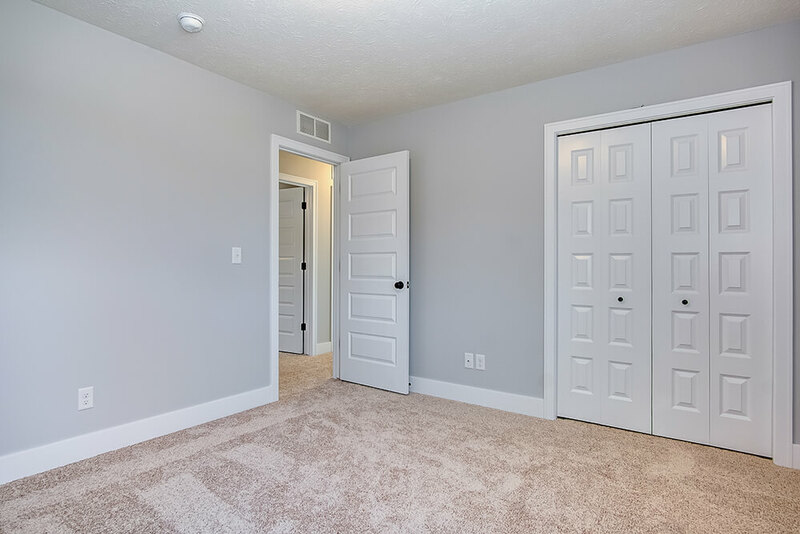 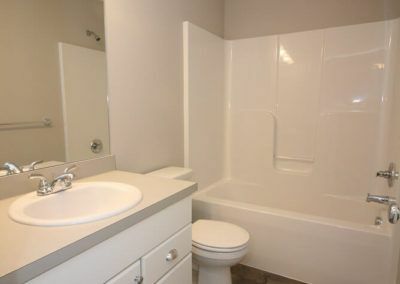 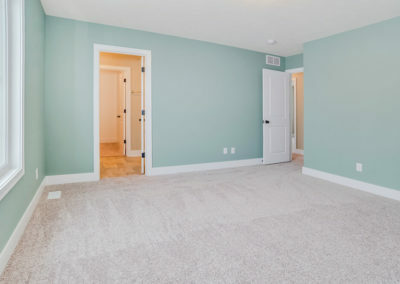 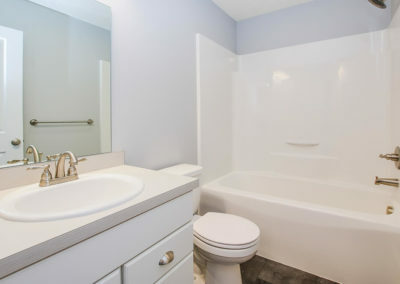 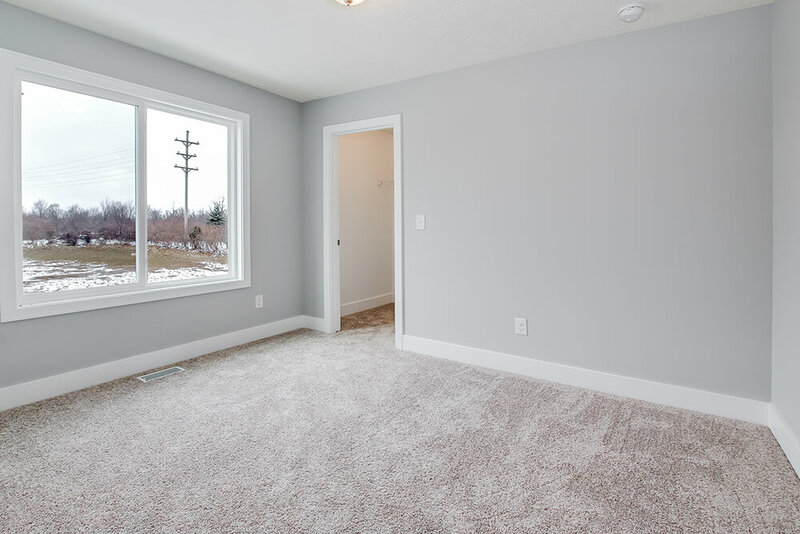 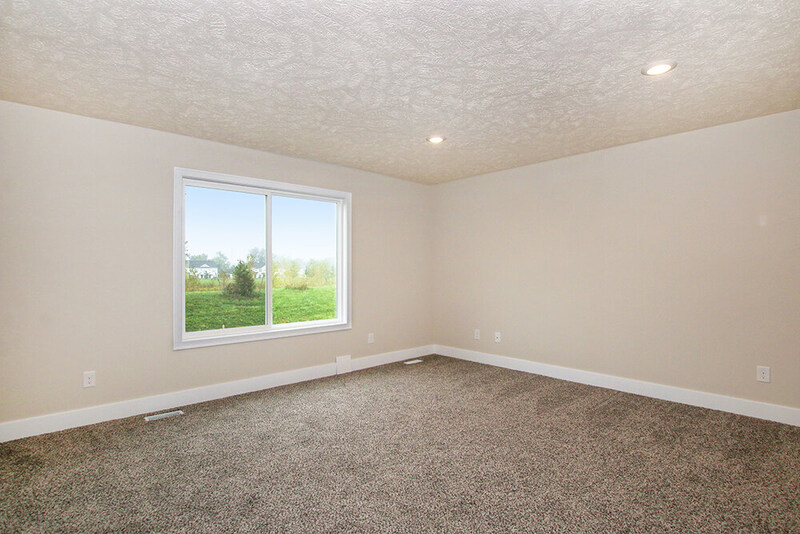 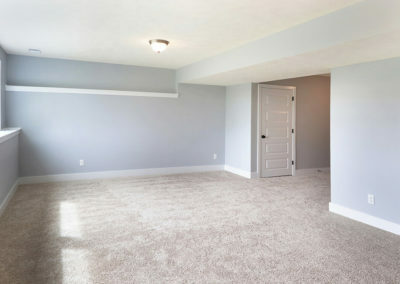 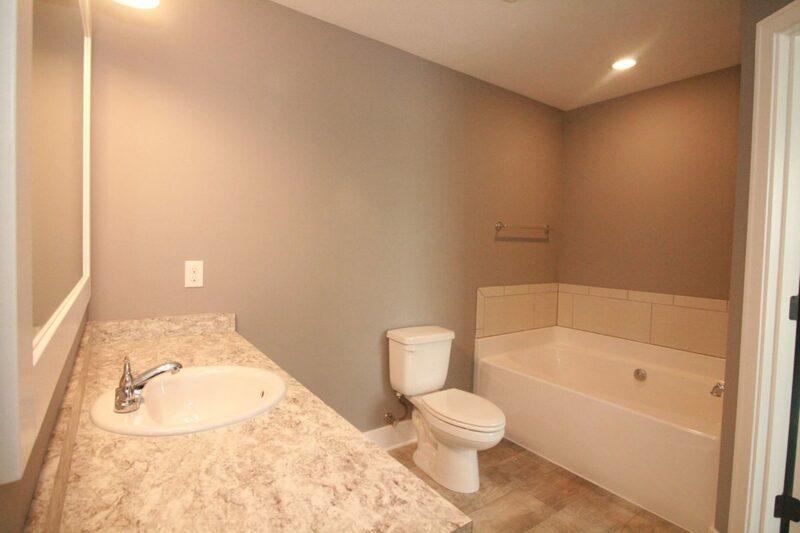 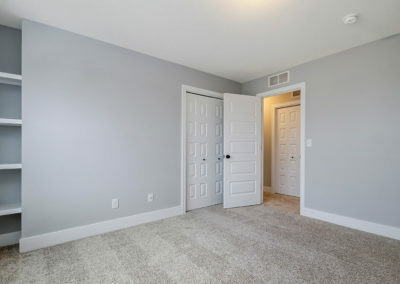 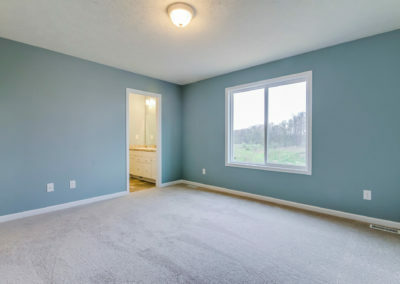 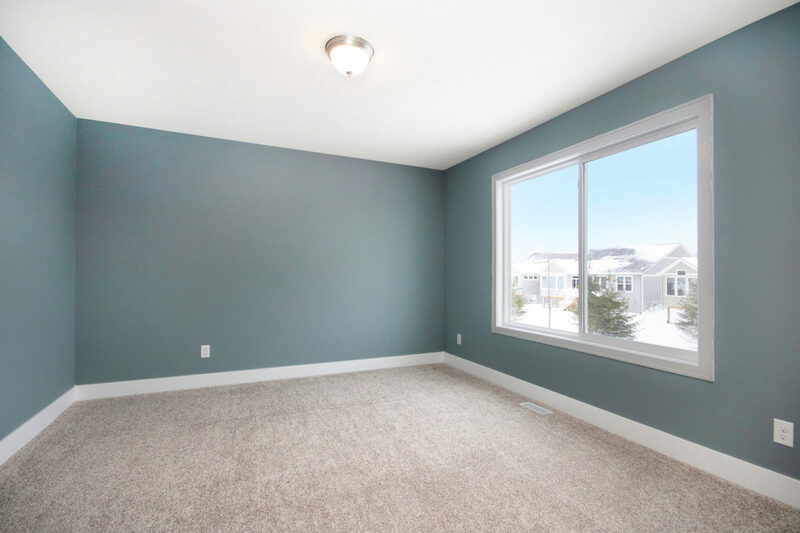 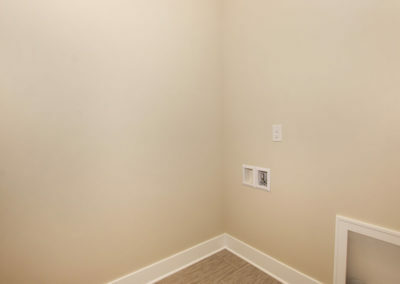 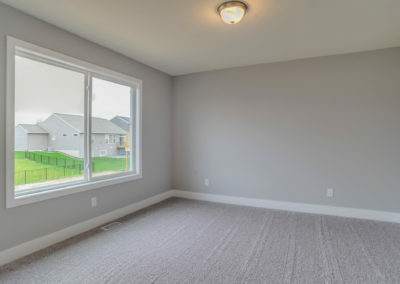 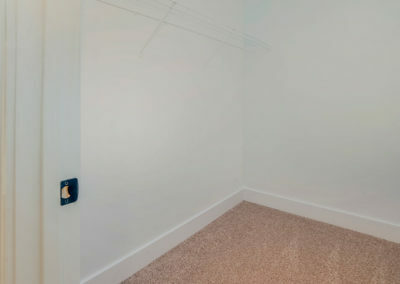 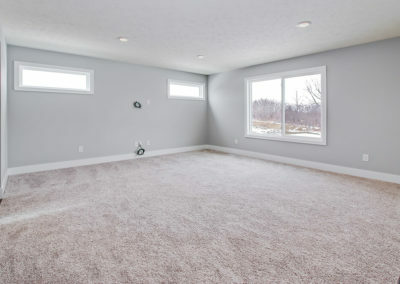 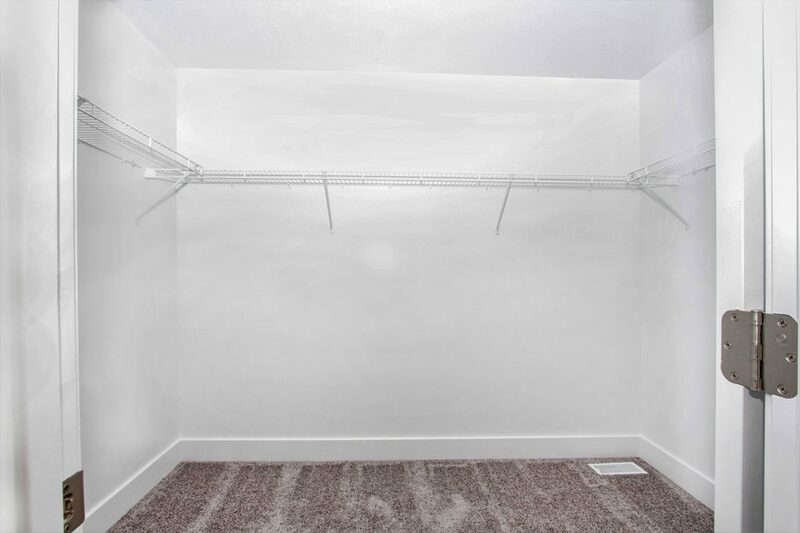 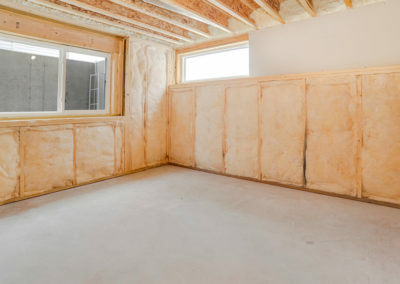 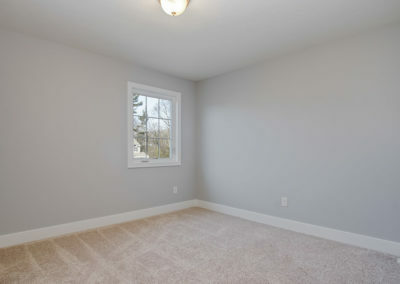 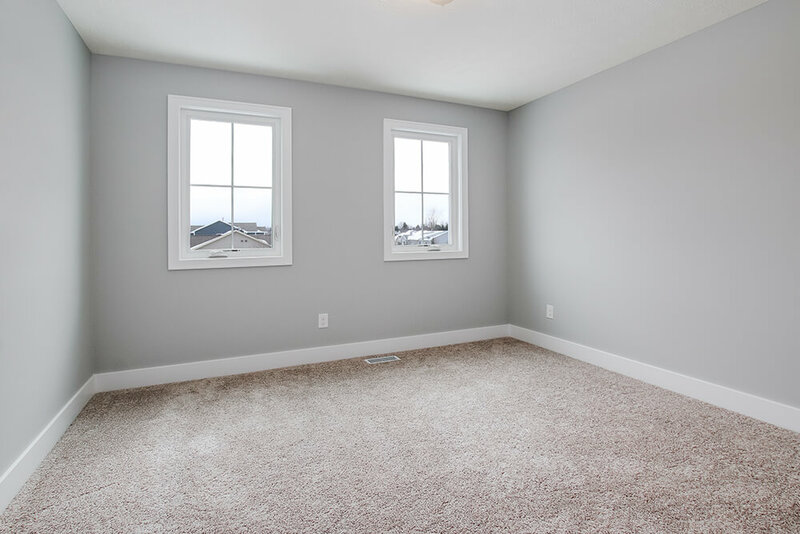 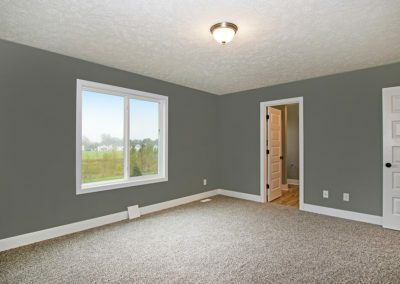 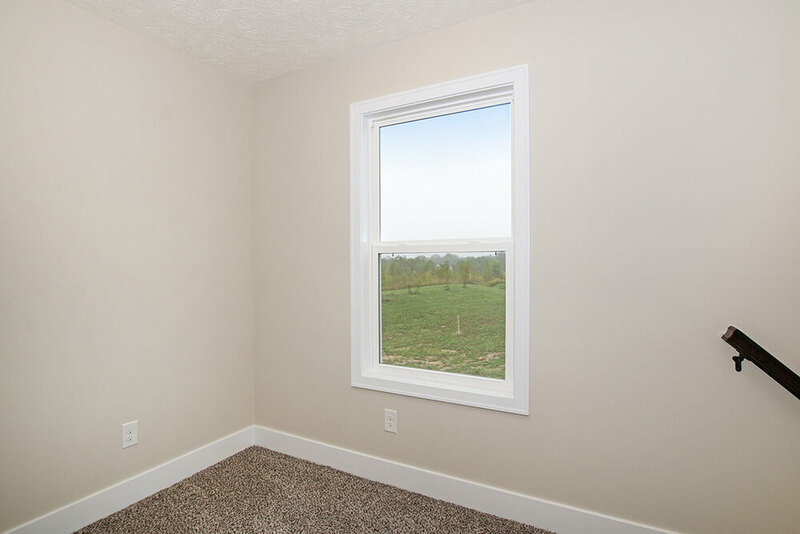 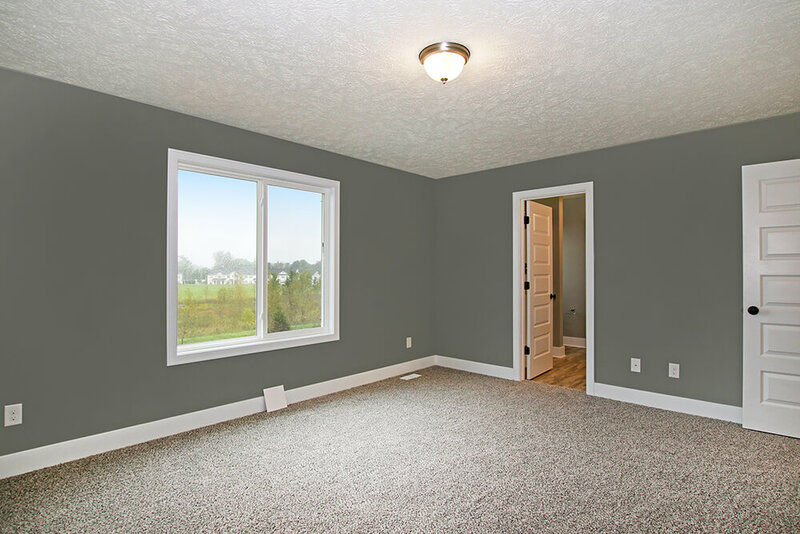 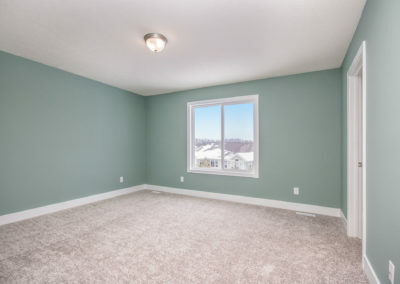 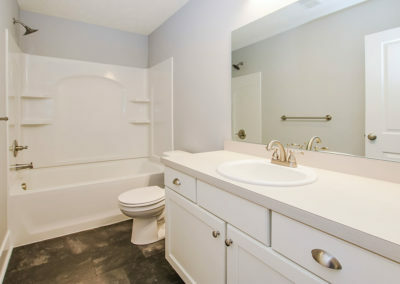 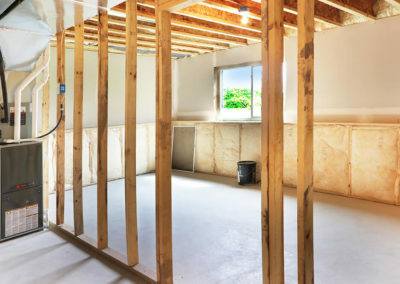 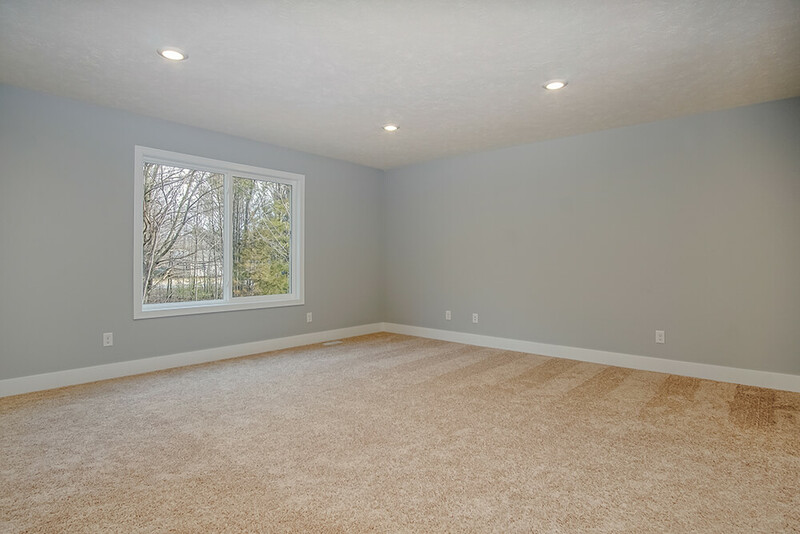 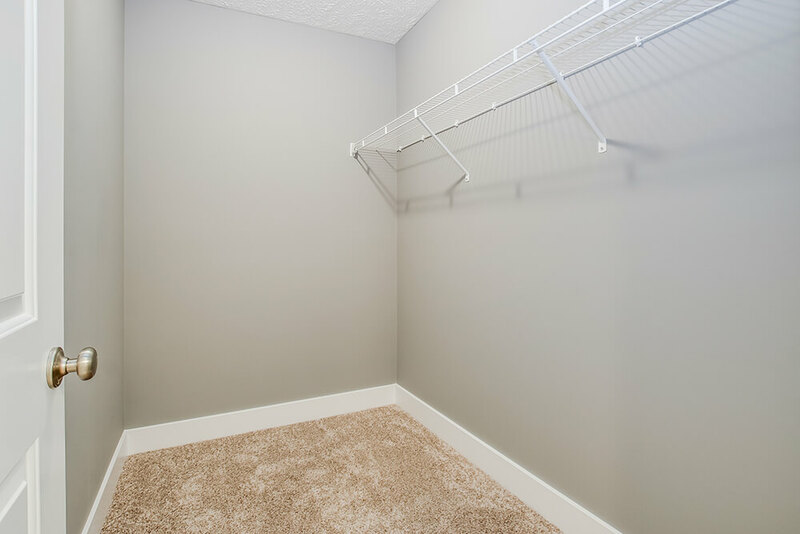 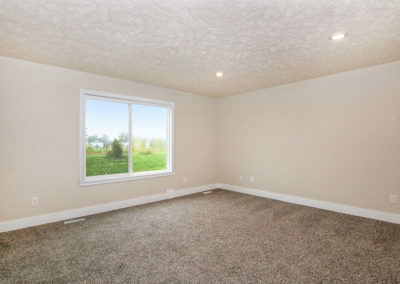 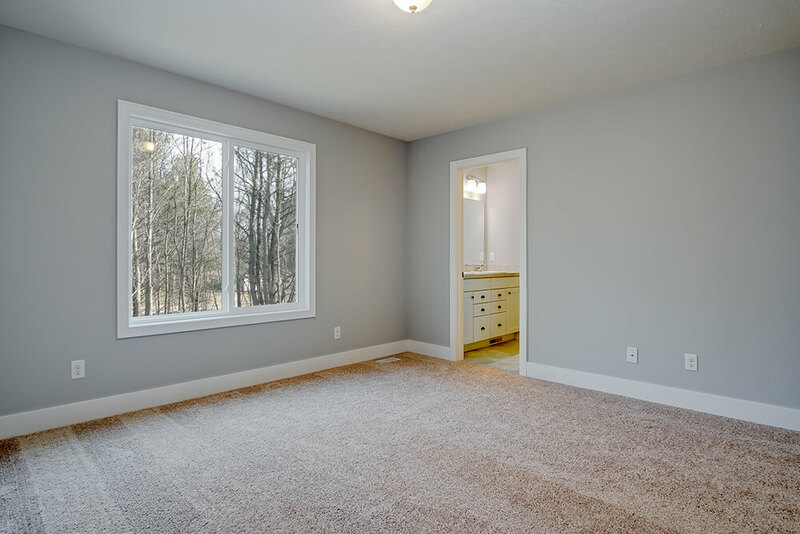 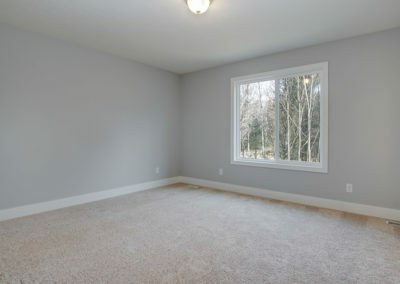 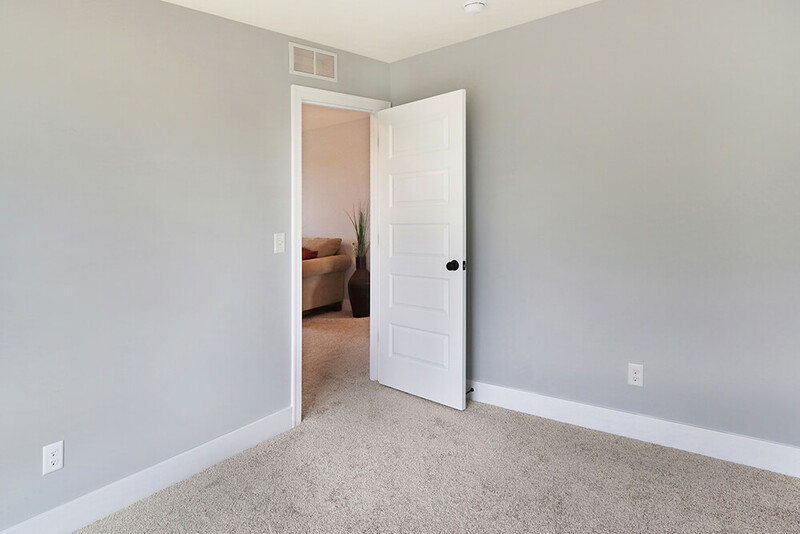 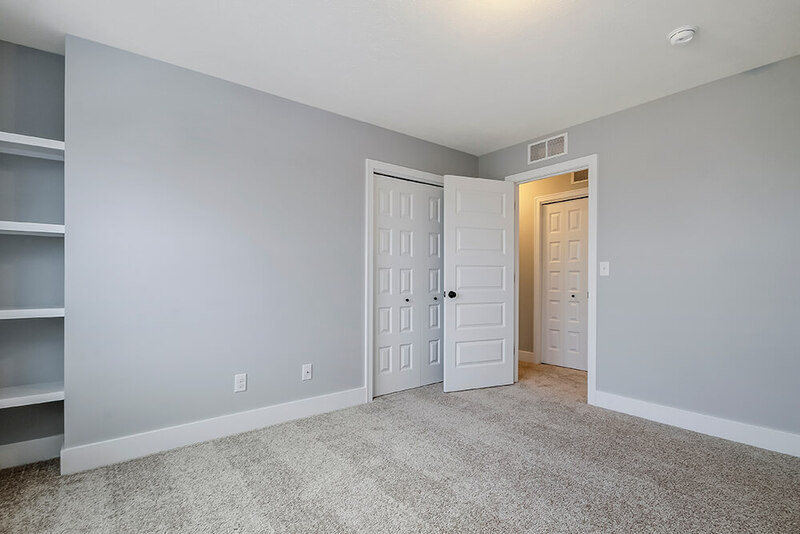 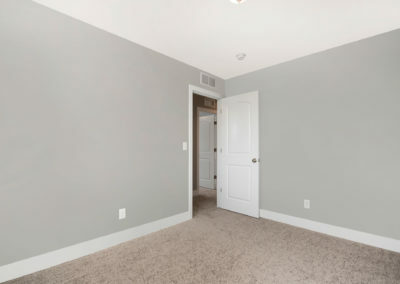 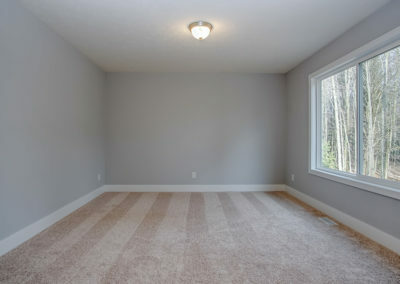 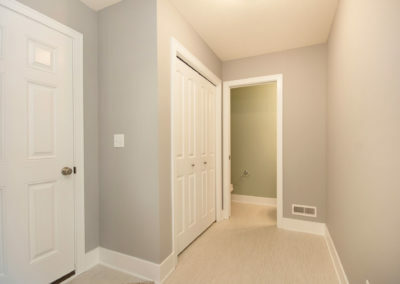 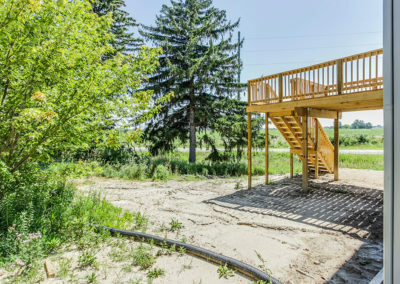 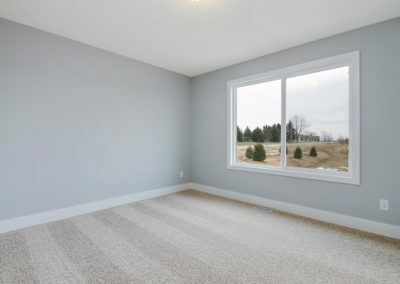 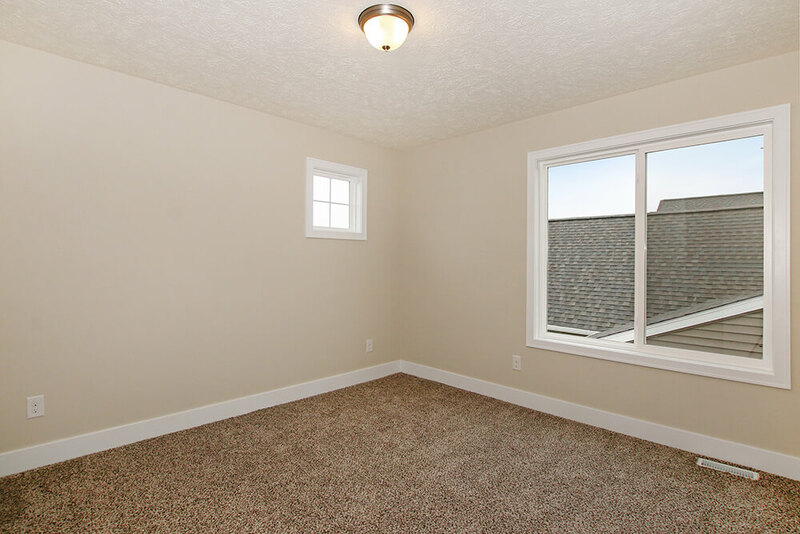 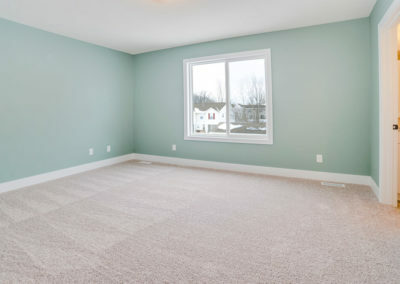 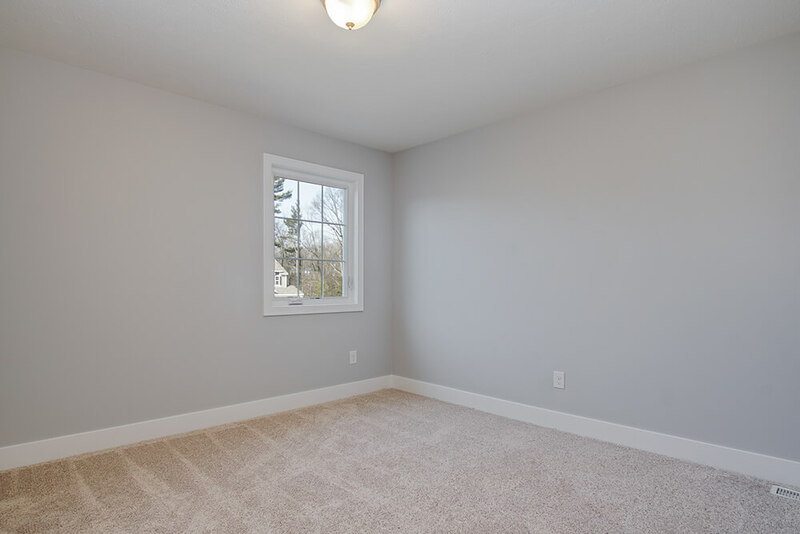 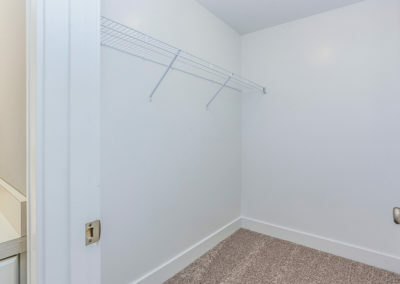 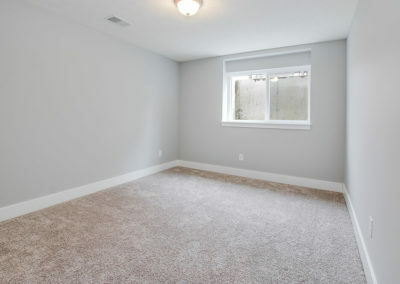 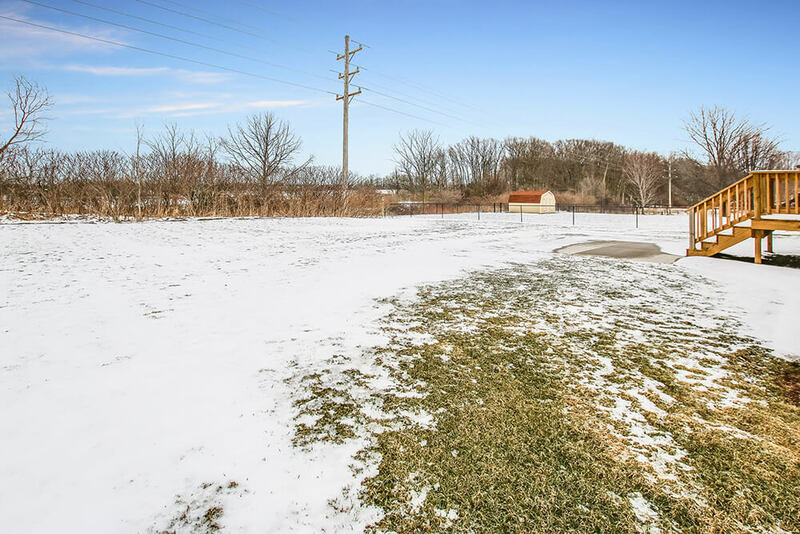 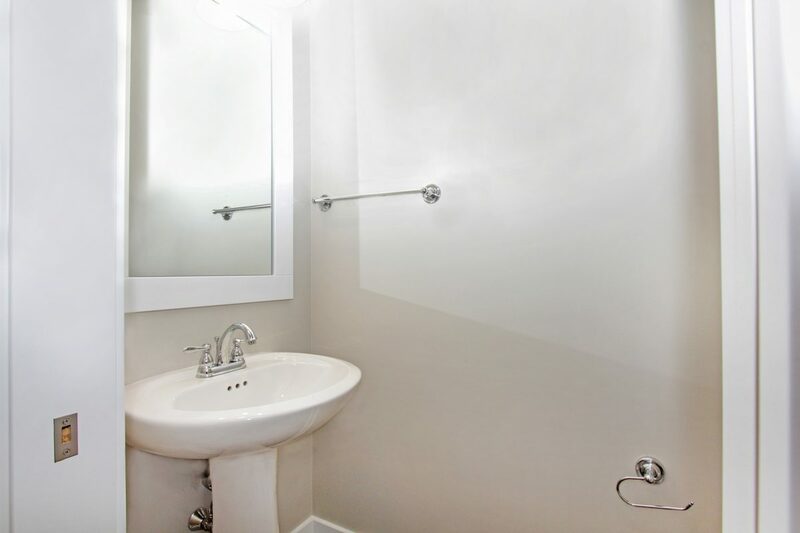 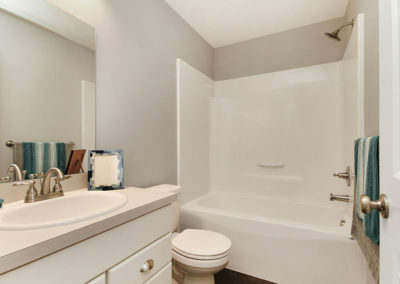 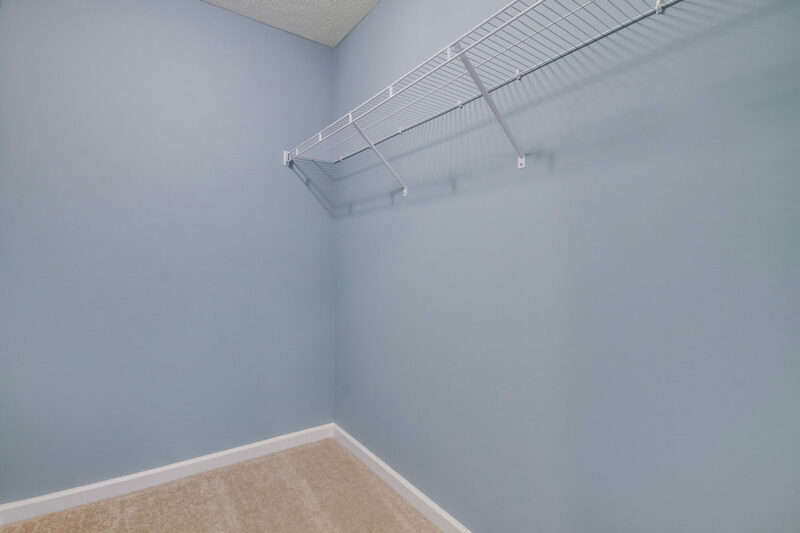 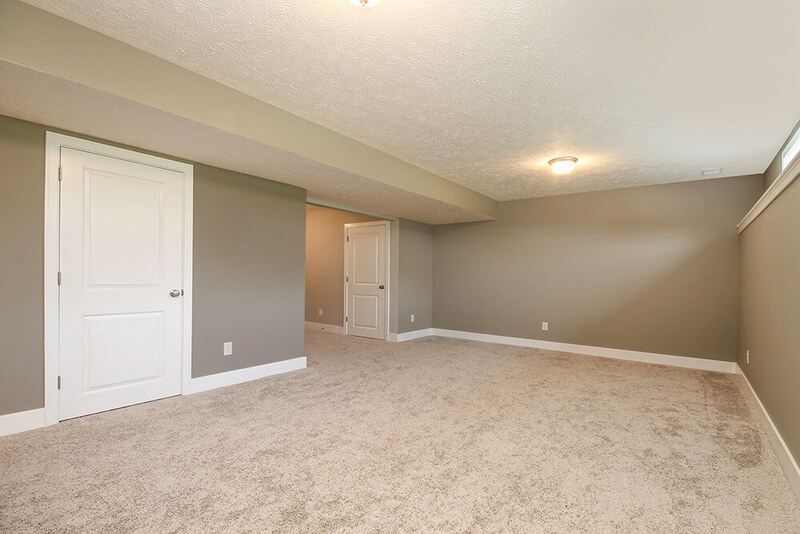 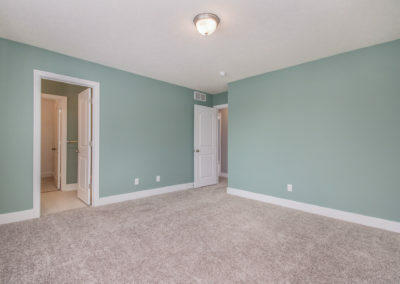 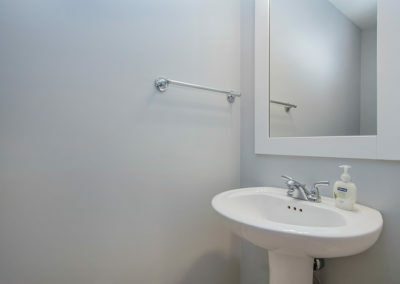 This space can be left unfinished for later expansion, or can be built out to meet your needs. 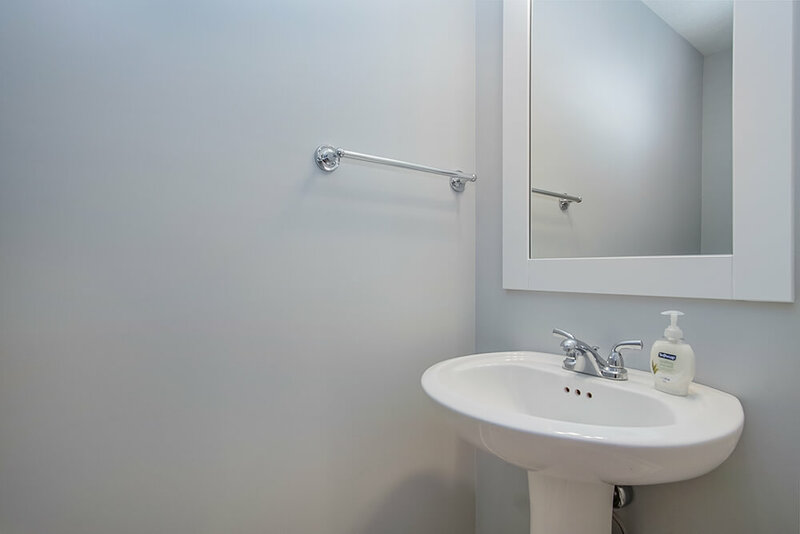 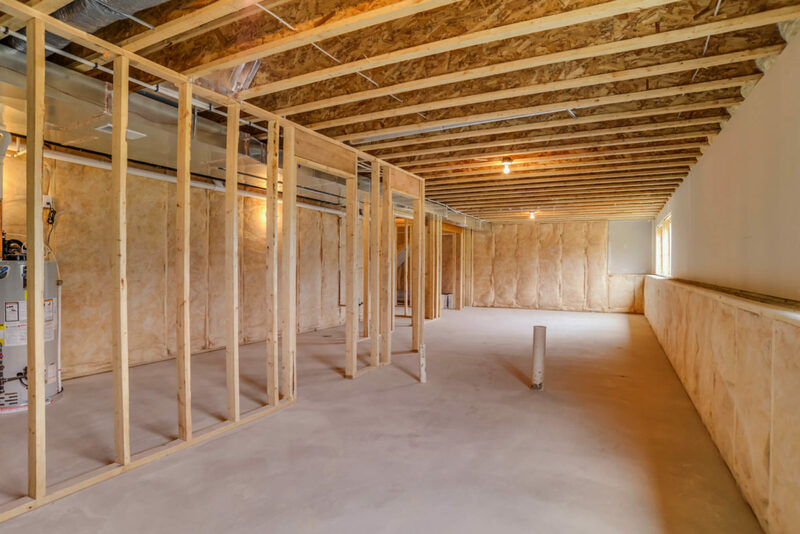 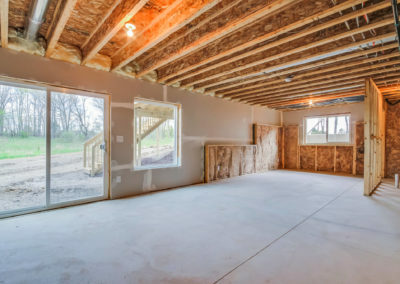 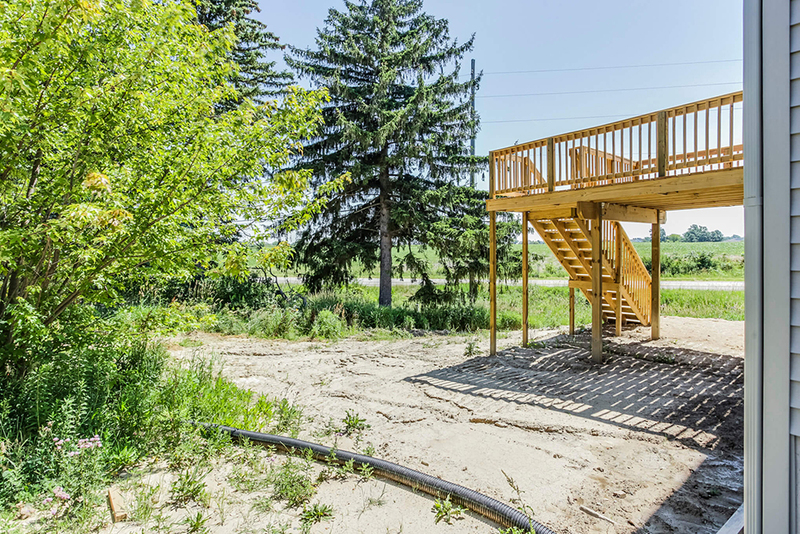 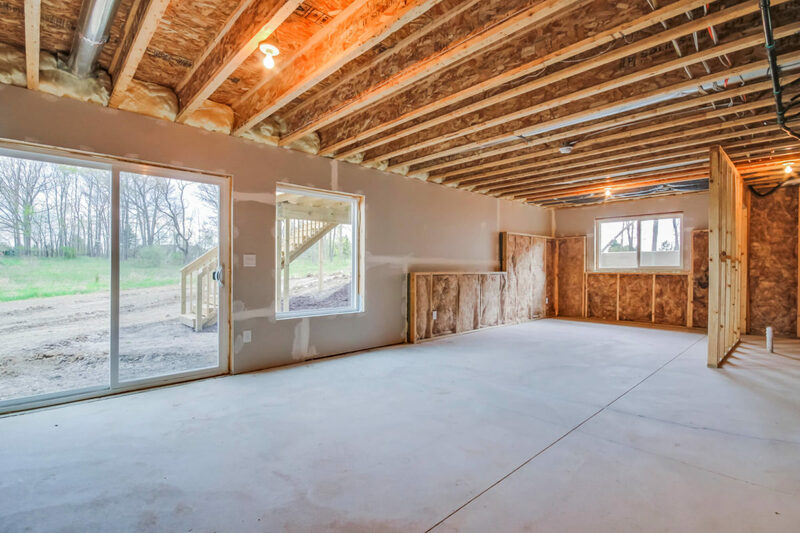 The lower level can be finished to include additional living space, a full or half bath, and additional bedrooms if your home site permits. 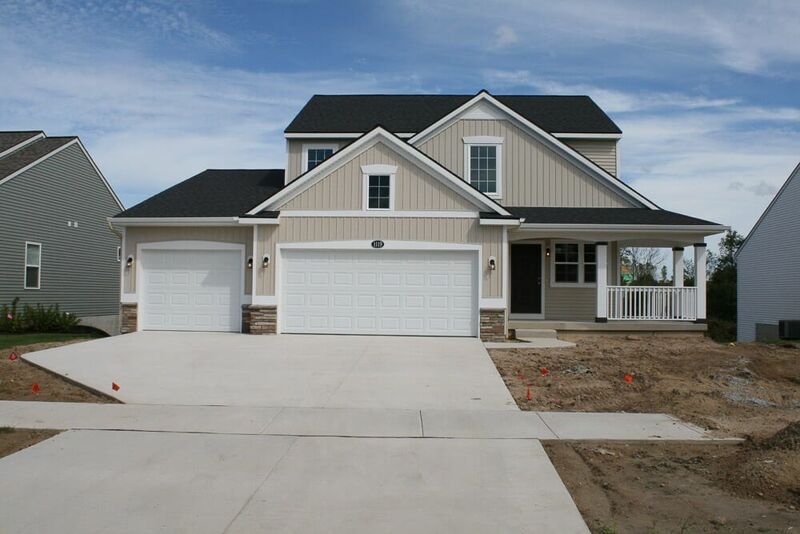 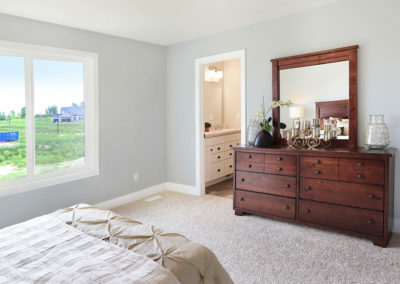 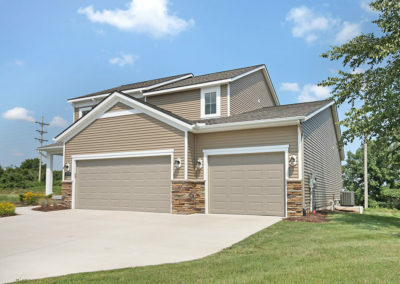 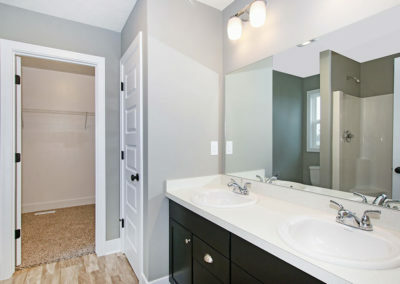 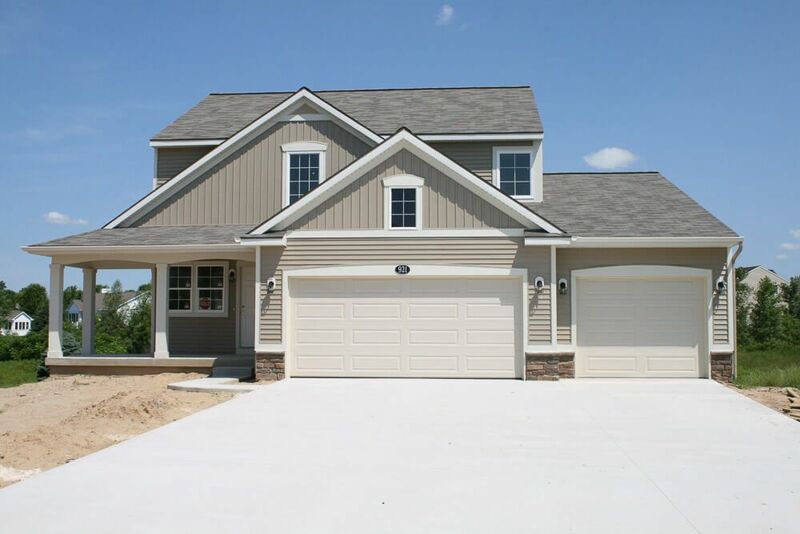 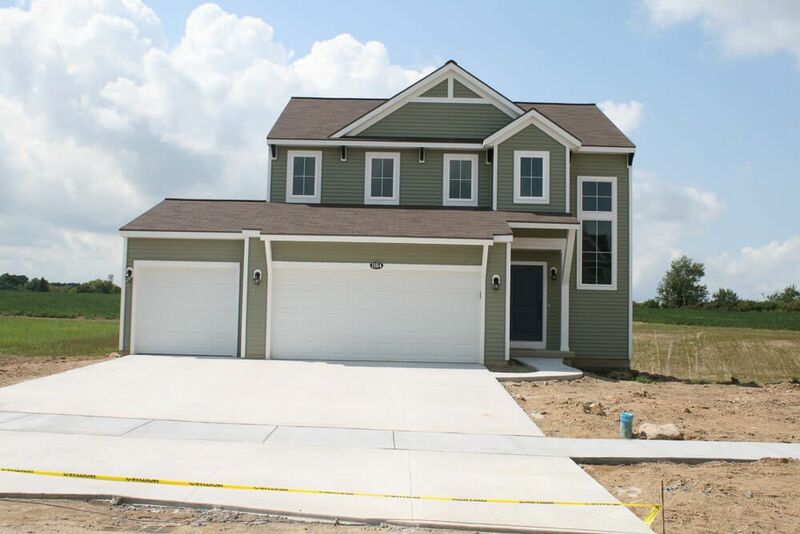 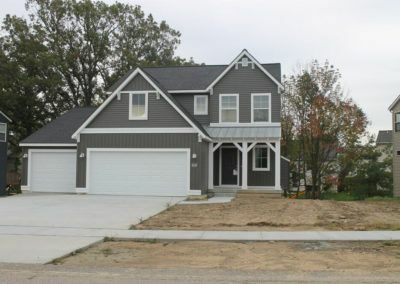 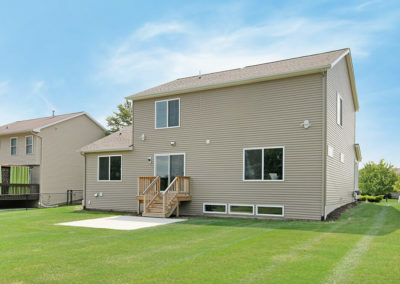 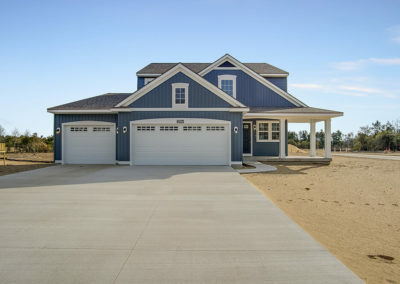 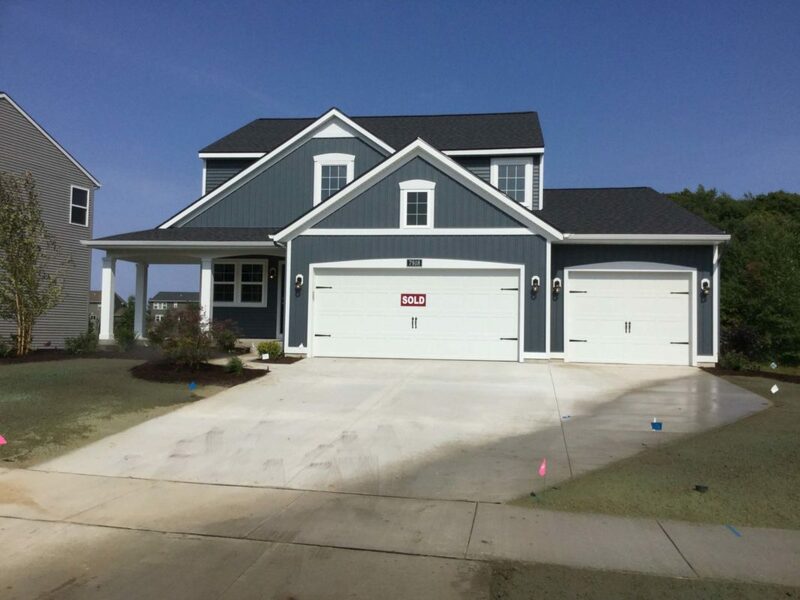 The Taylor plan offers lots of flexibility and room for growth in an attractive and inviting home plan. 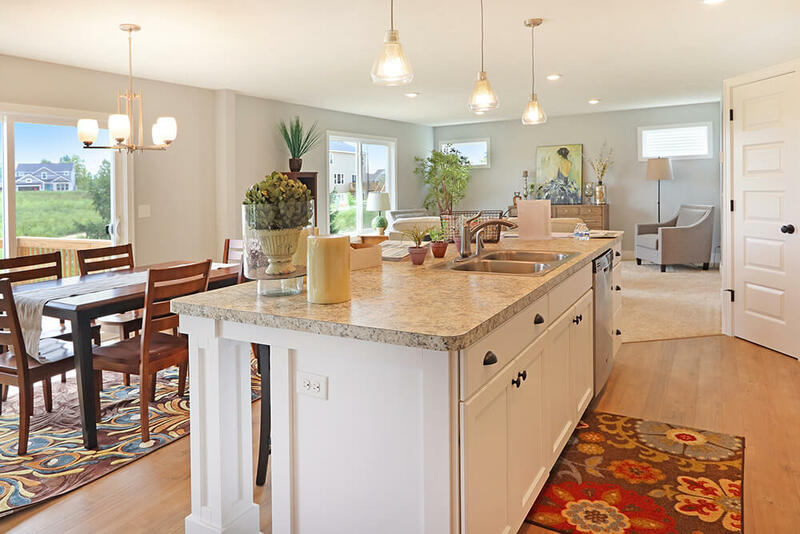 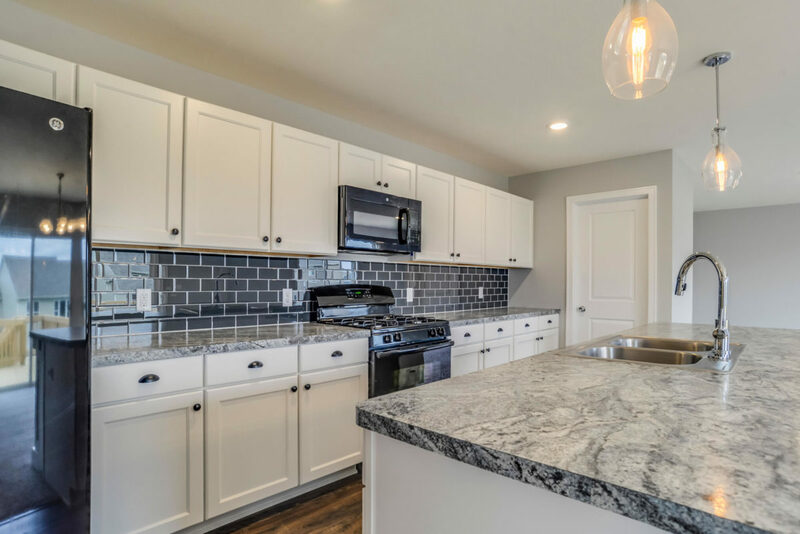 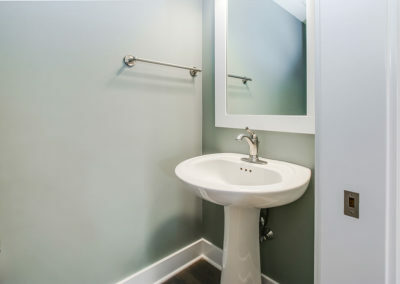 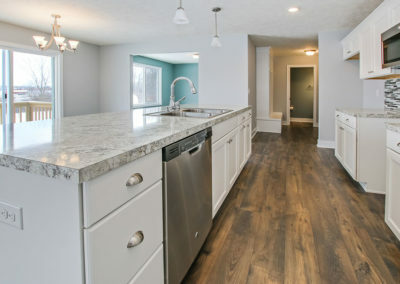 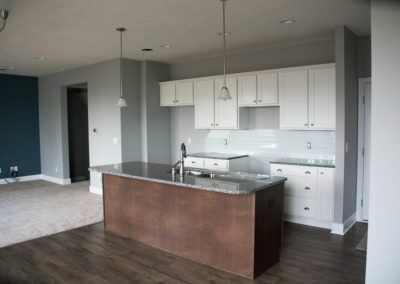 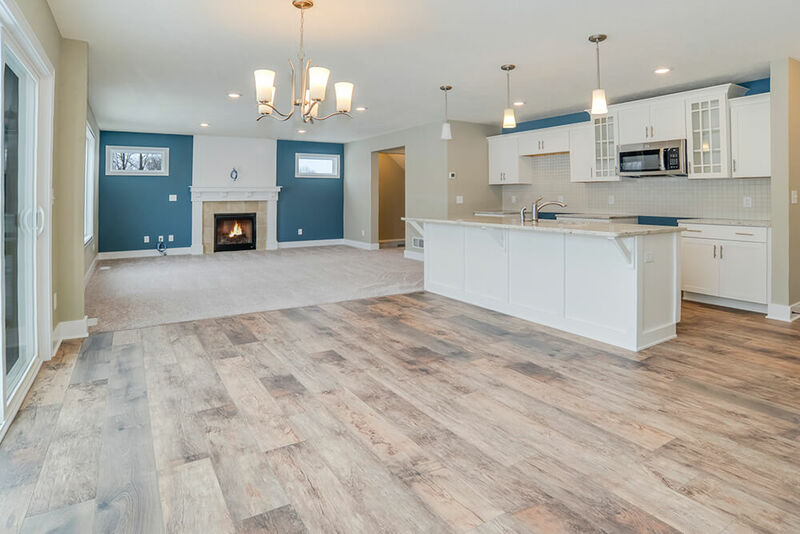 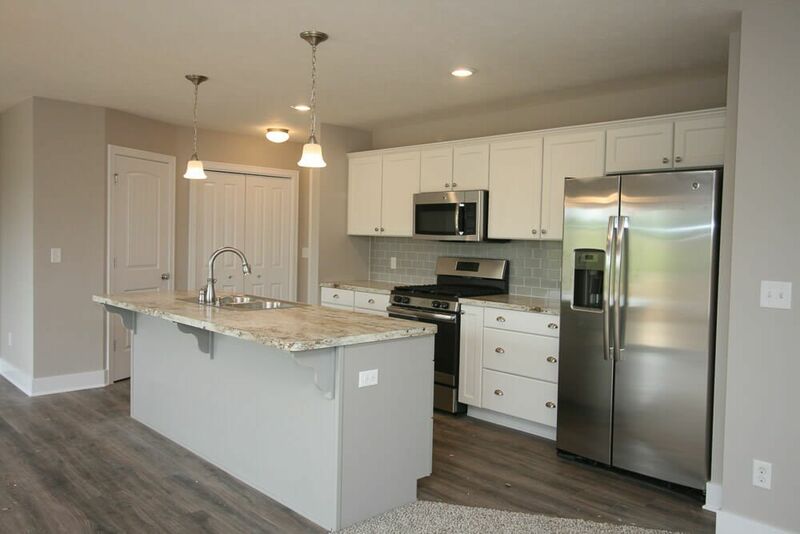 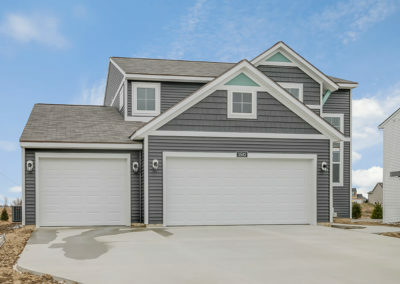 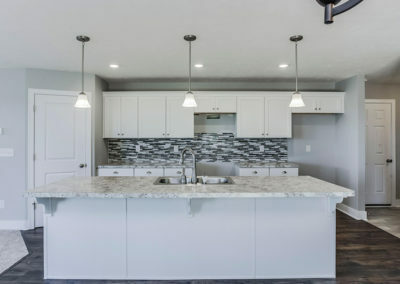 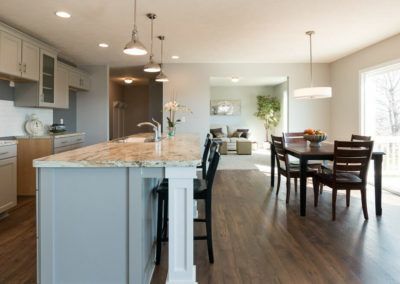 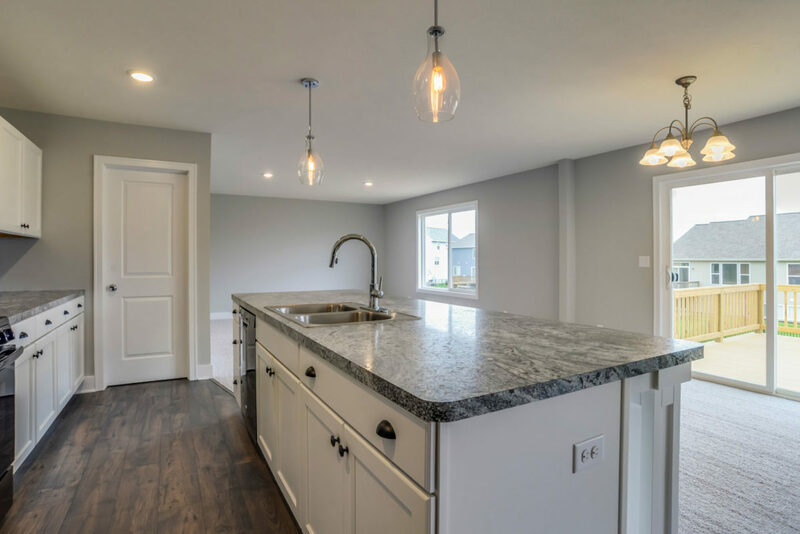 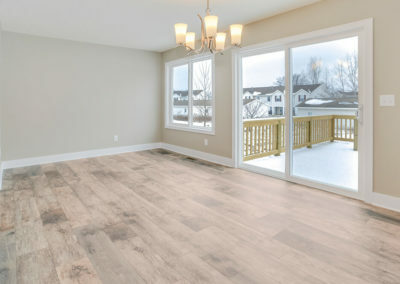 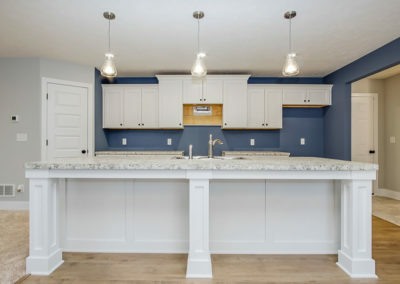 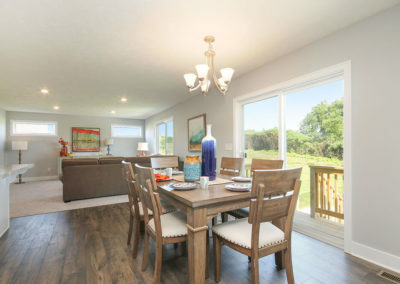 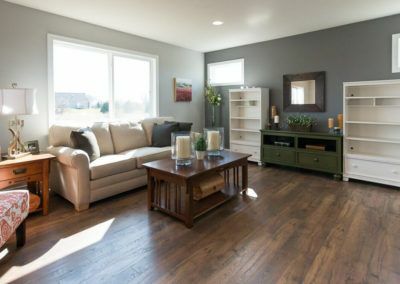 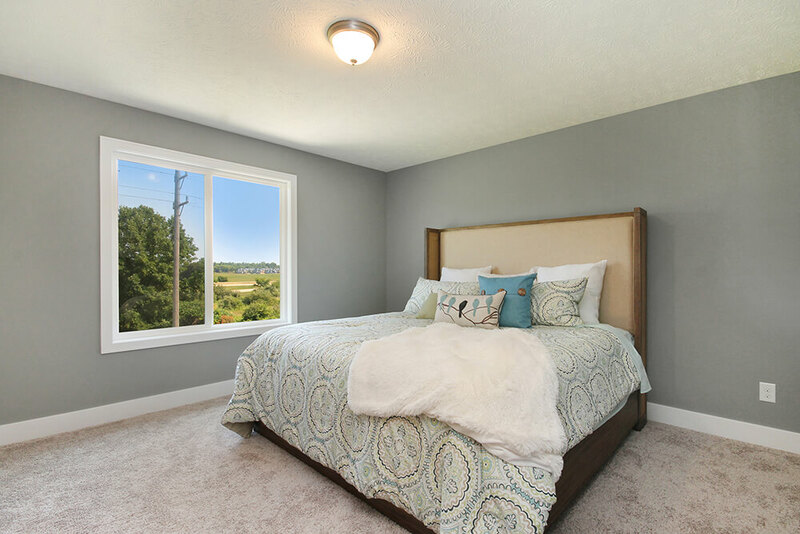 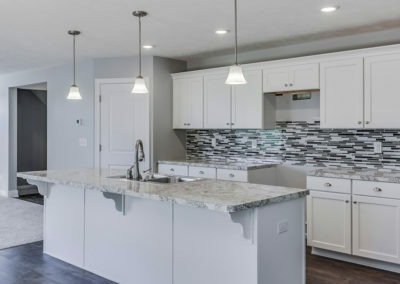 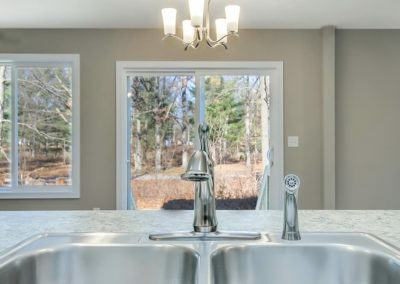 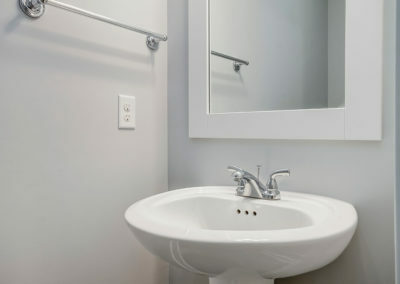 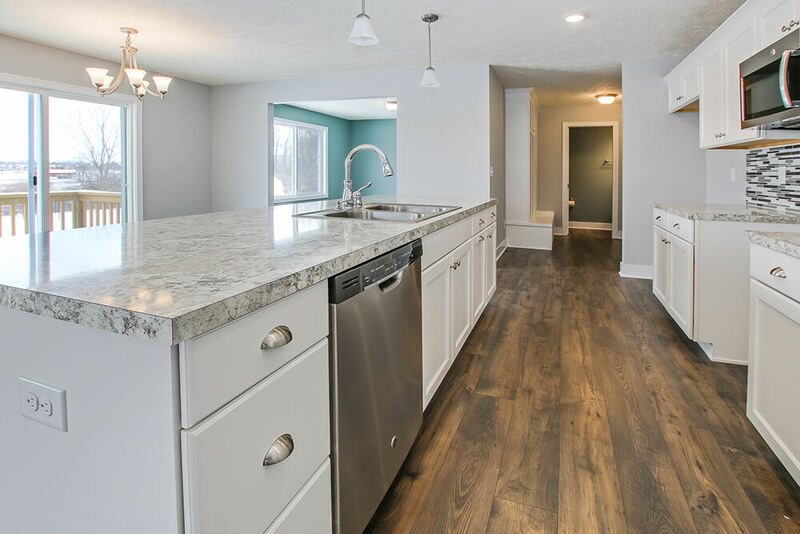 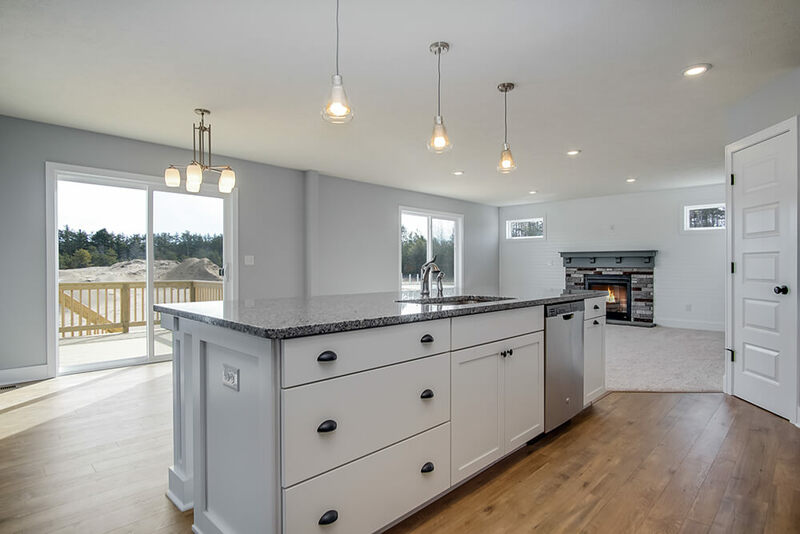 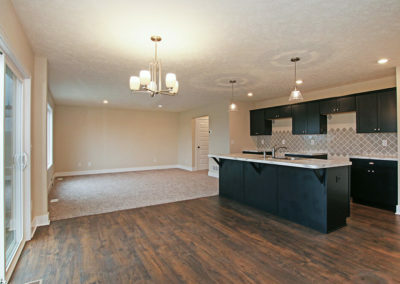 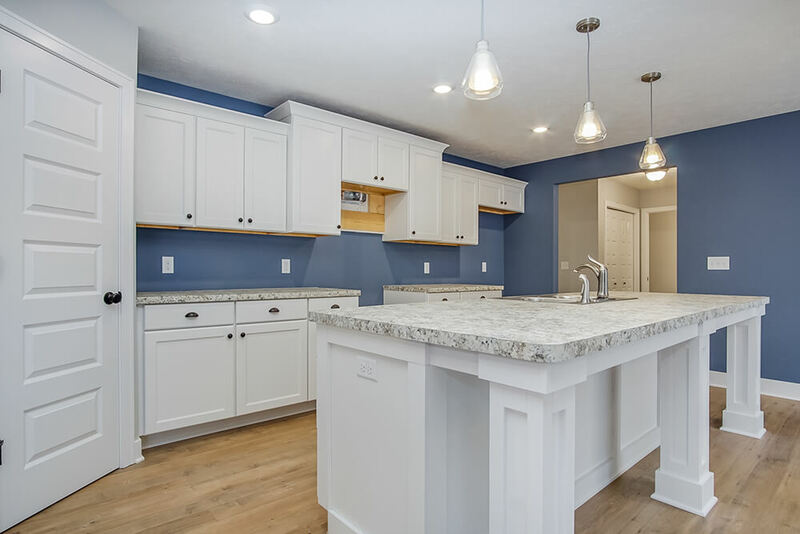 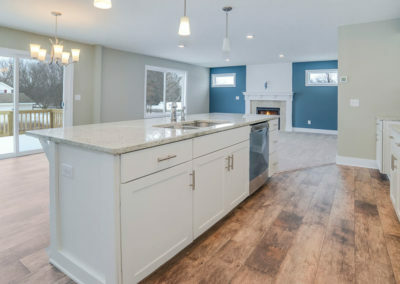 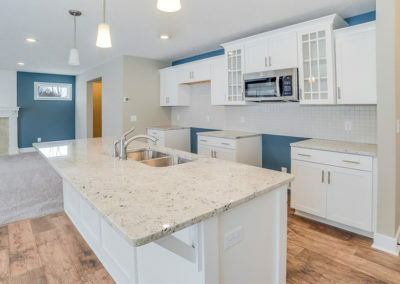 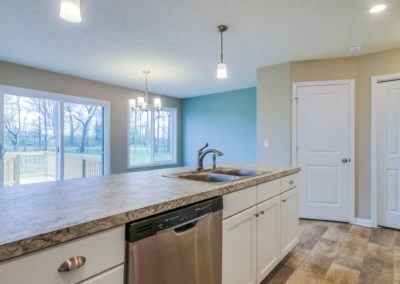 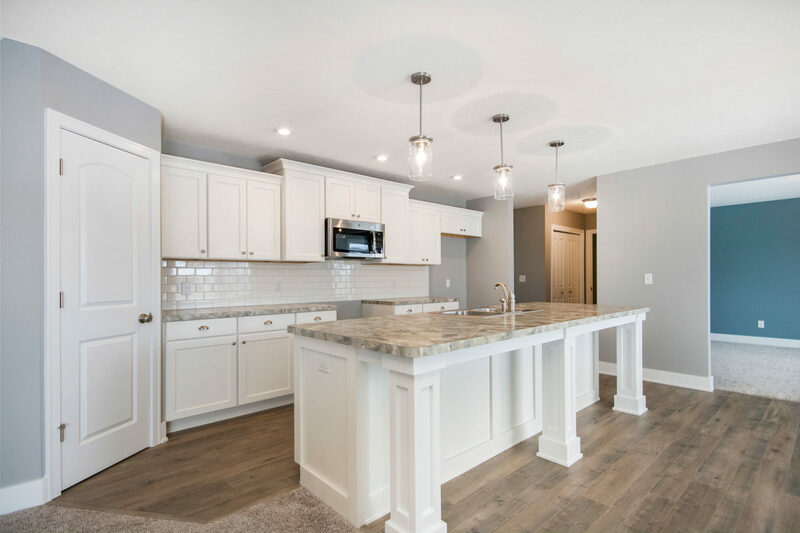 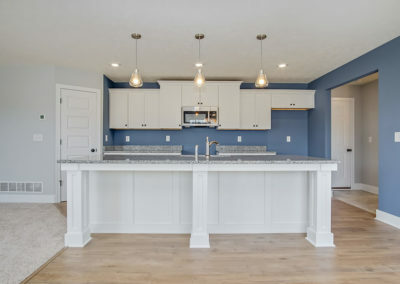 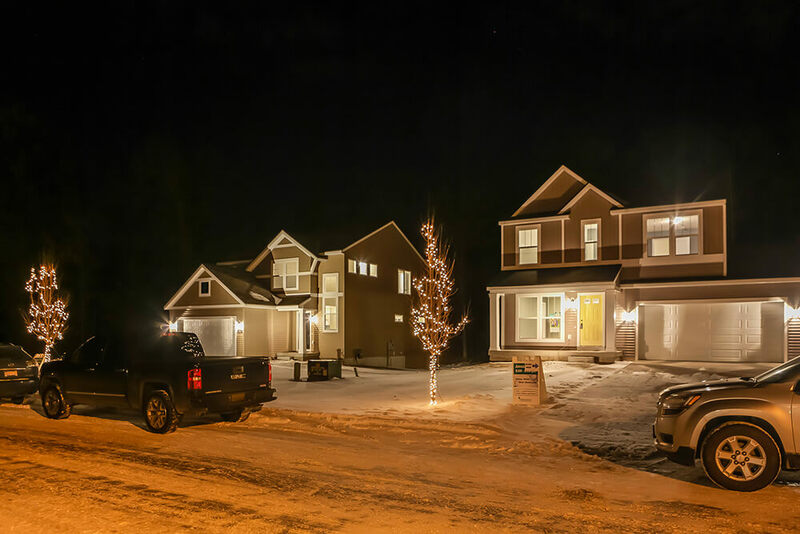 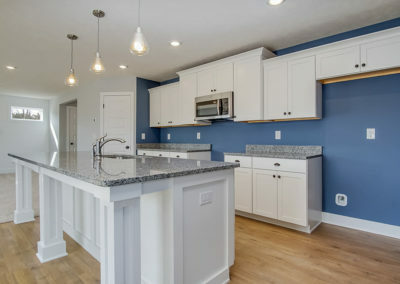 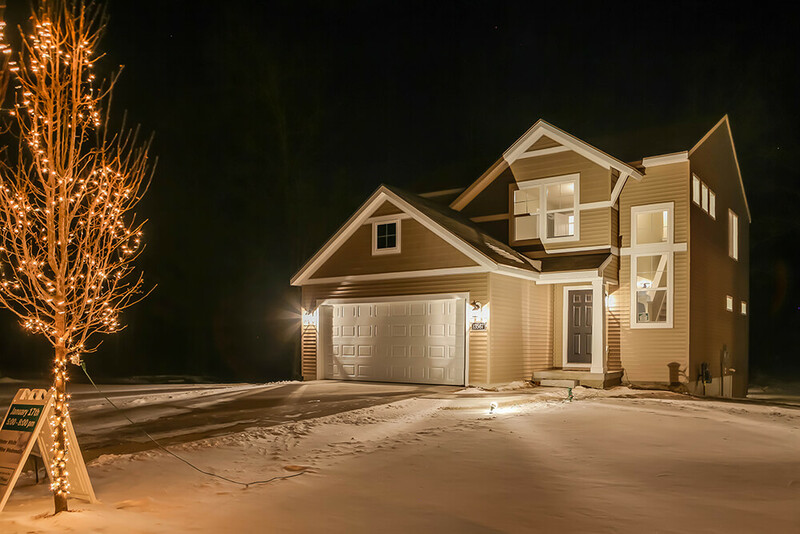 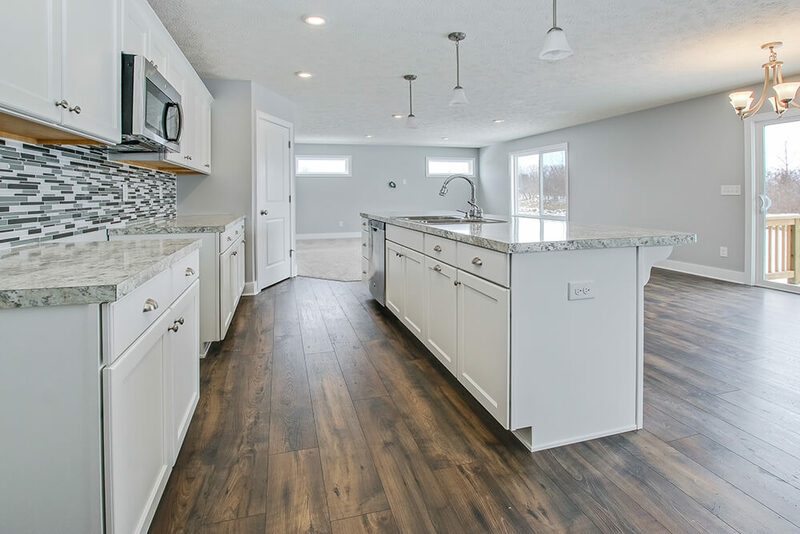 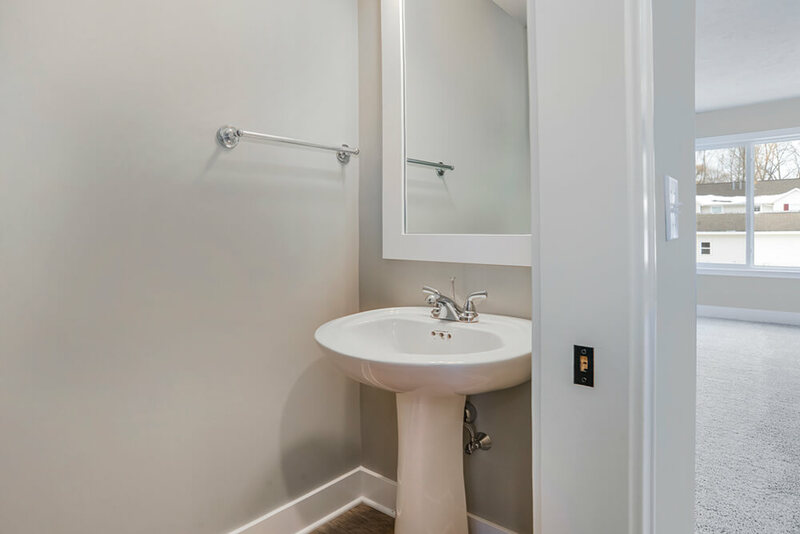 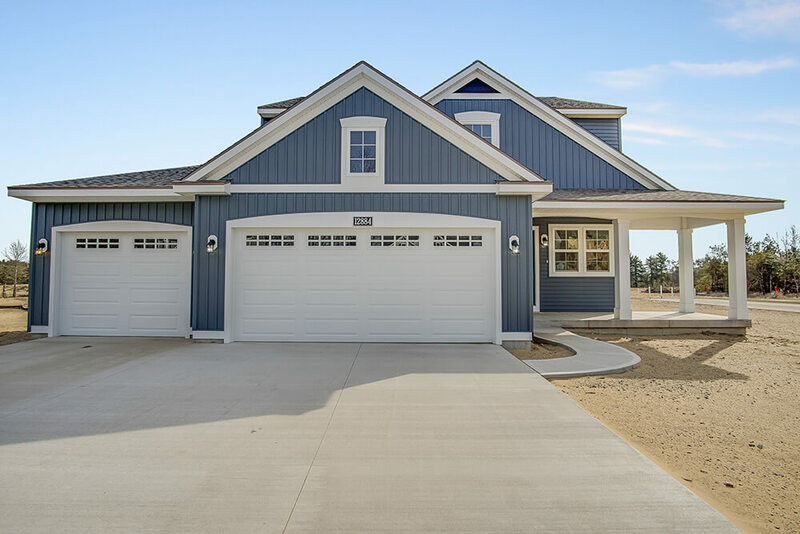 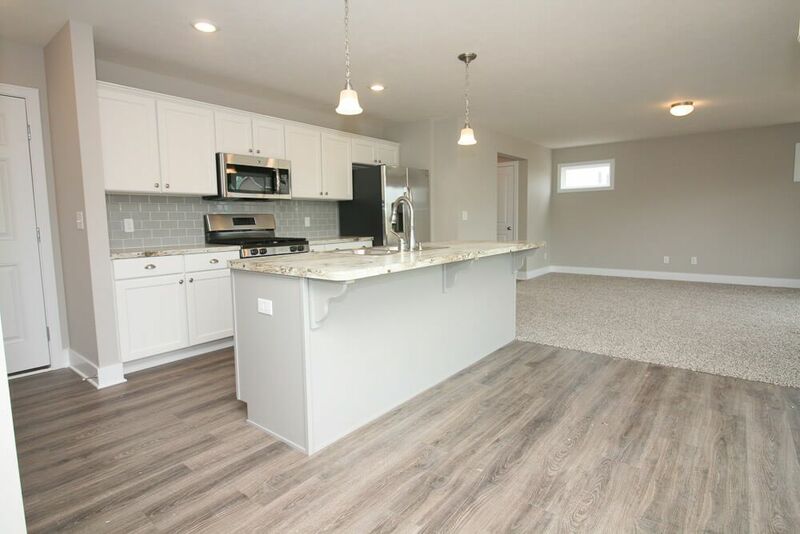 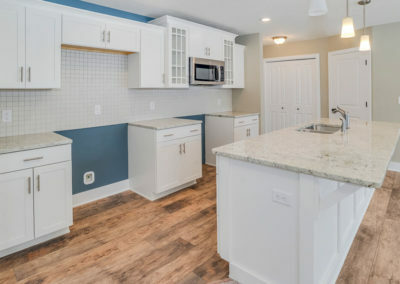 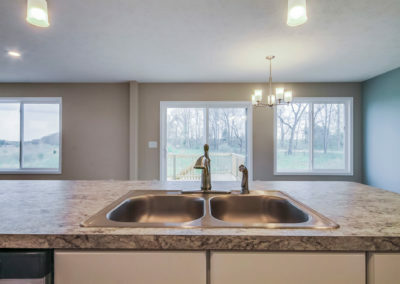 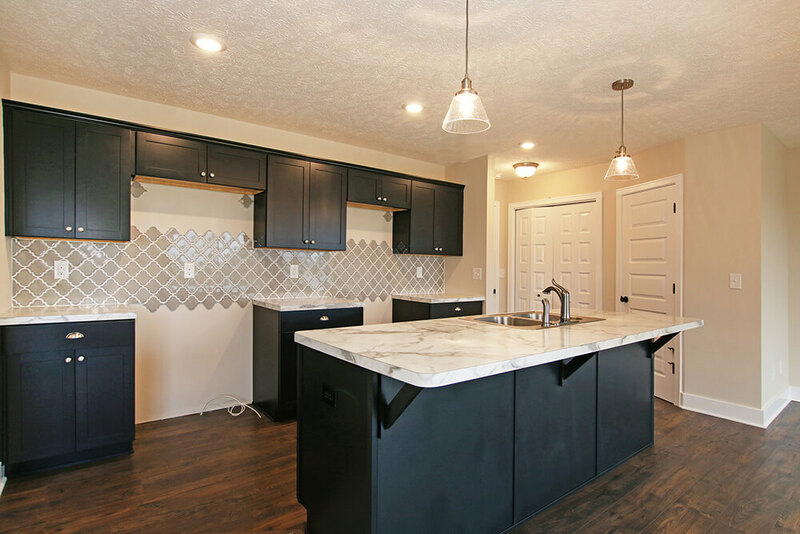 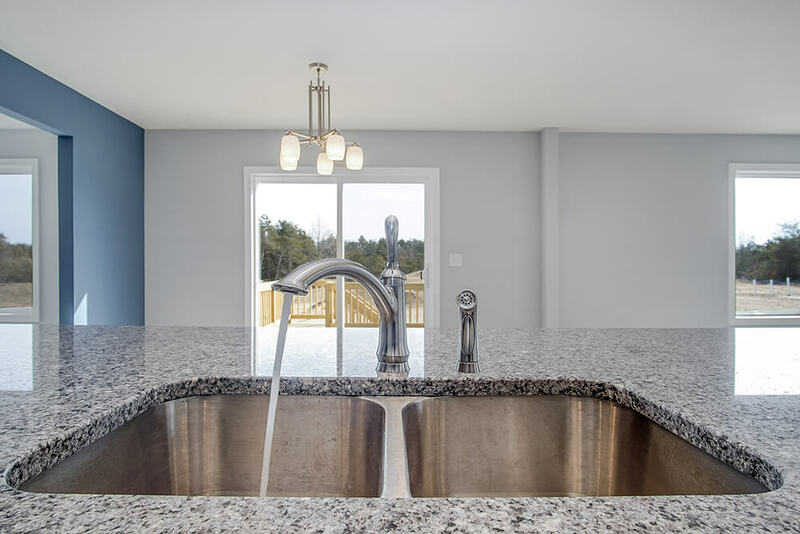 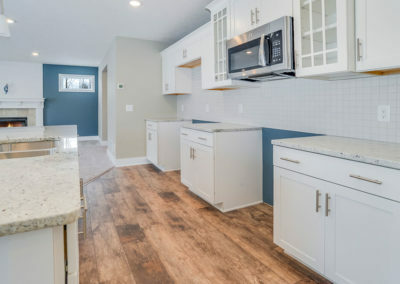 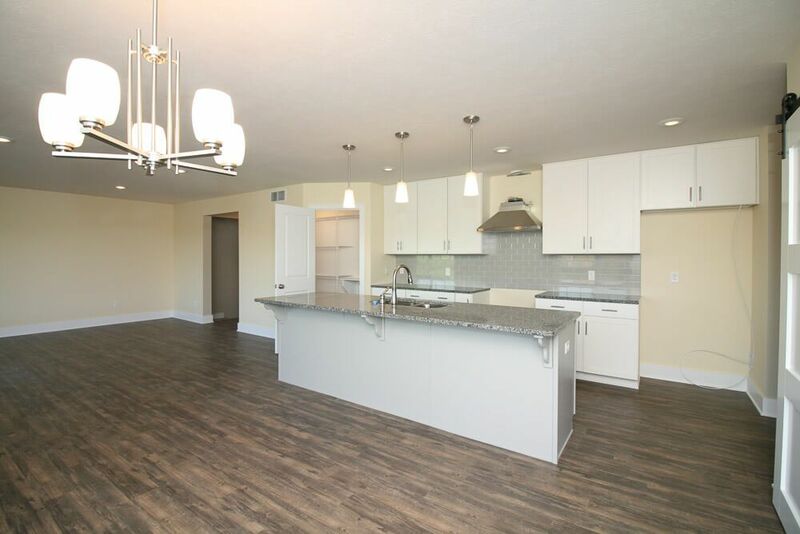 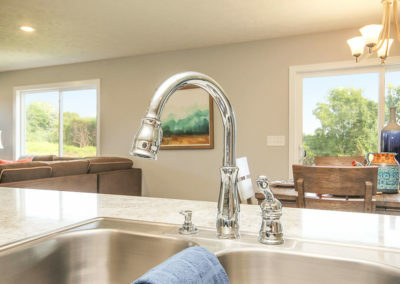 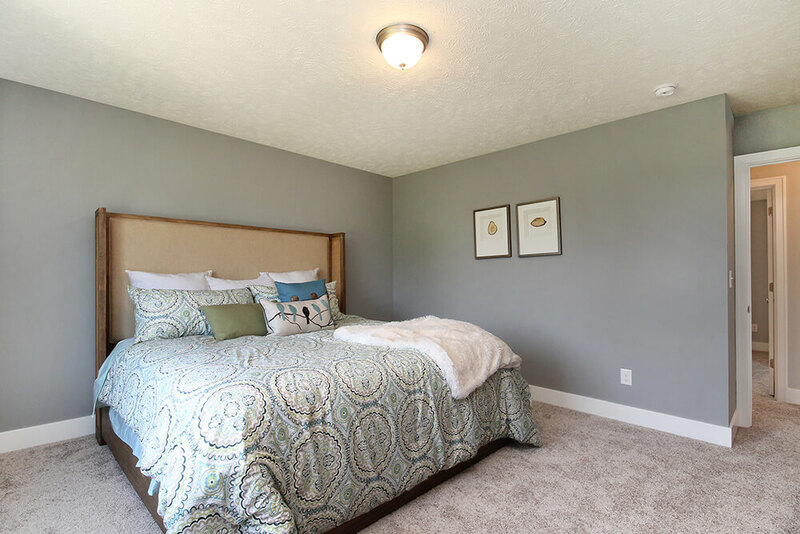 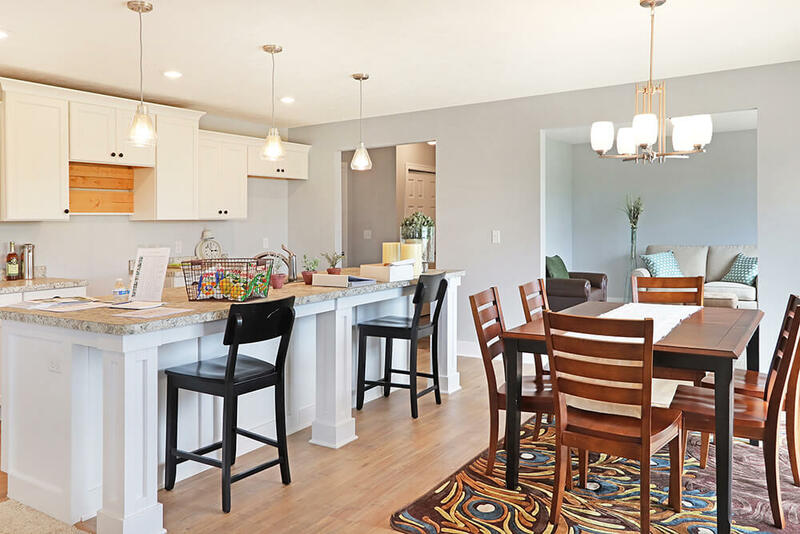 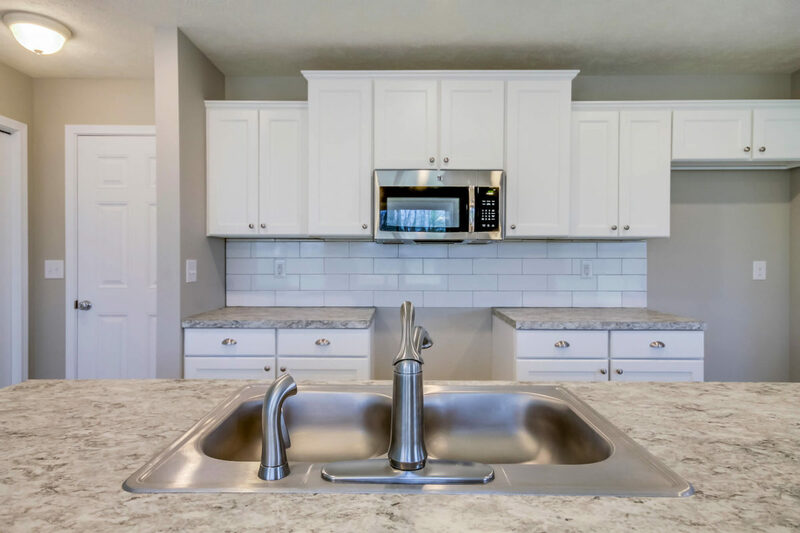 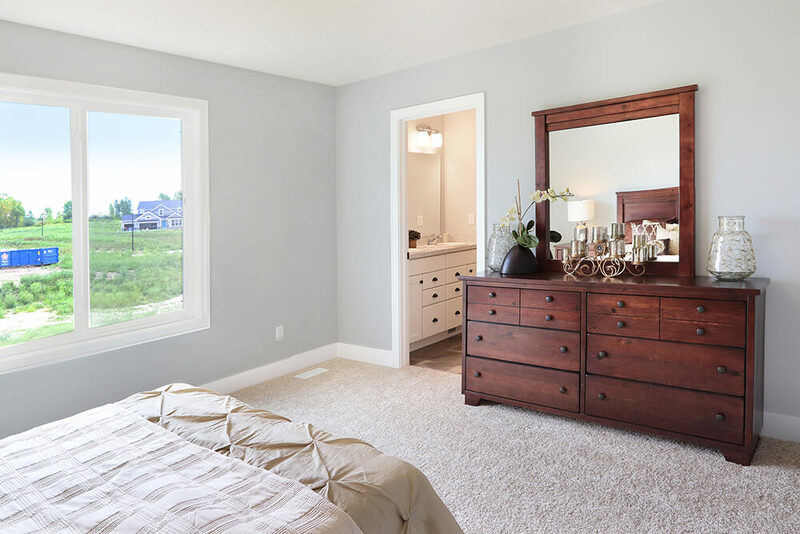 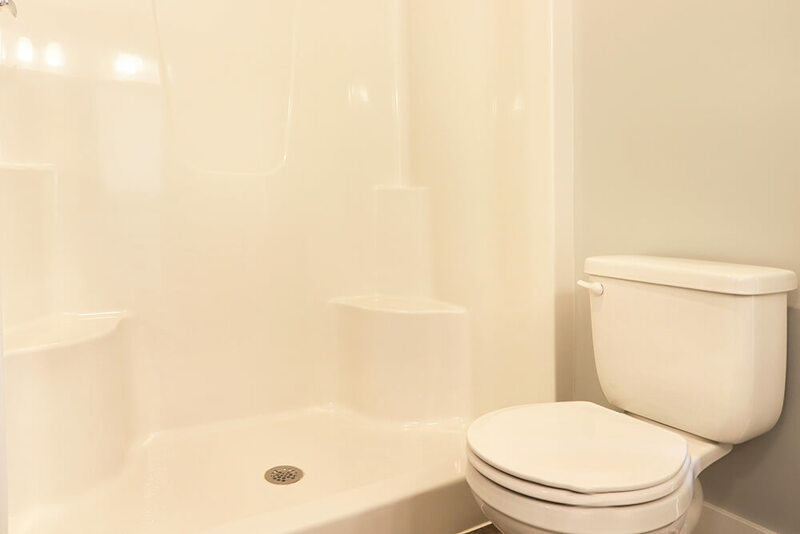 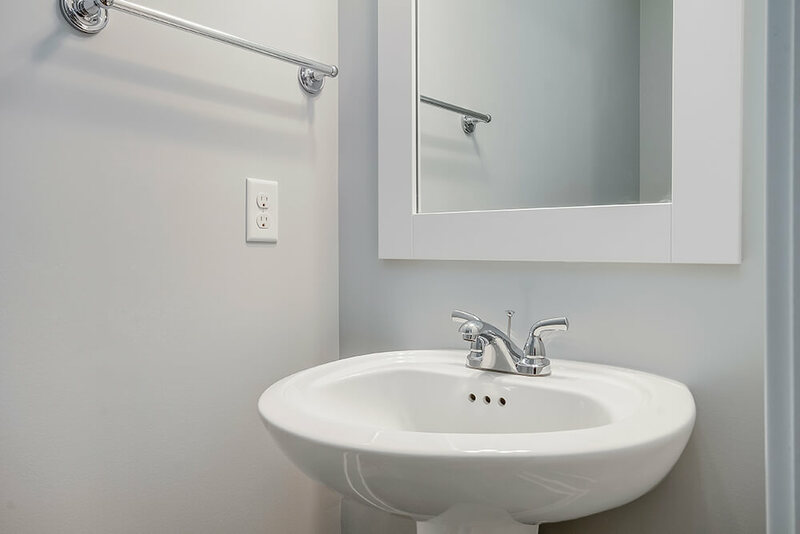 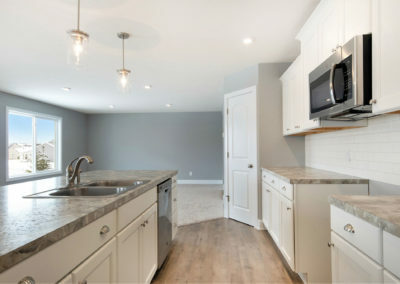 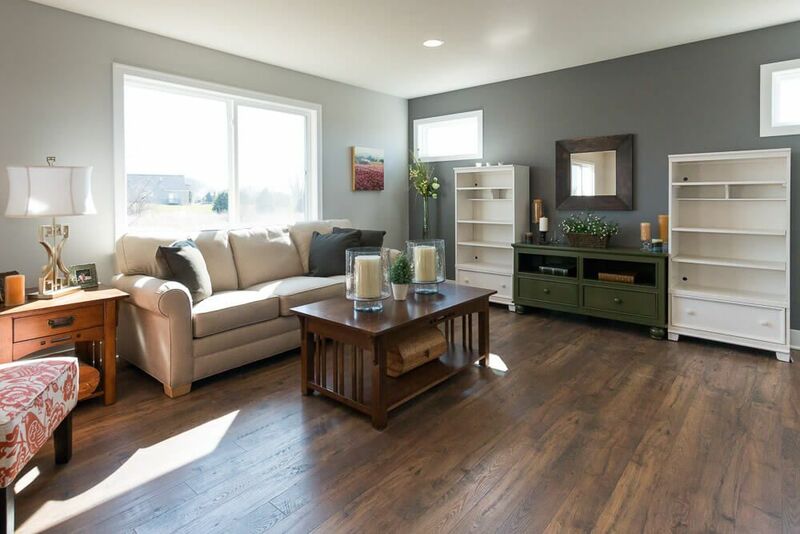 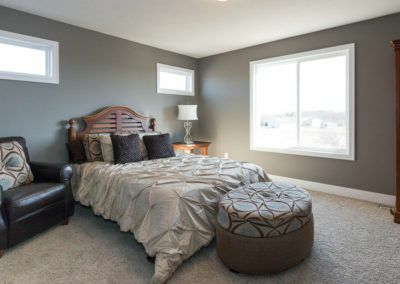 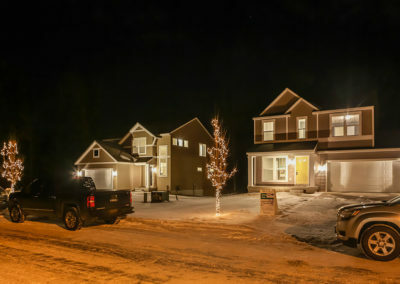 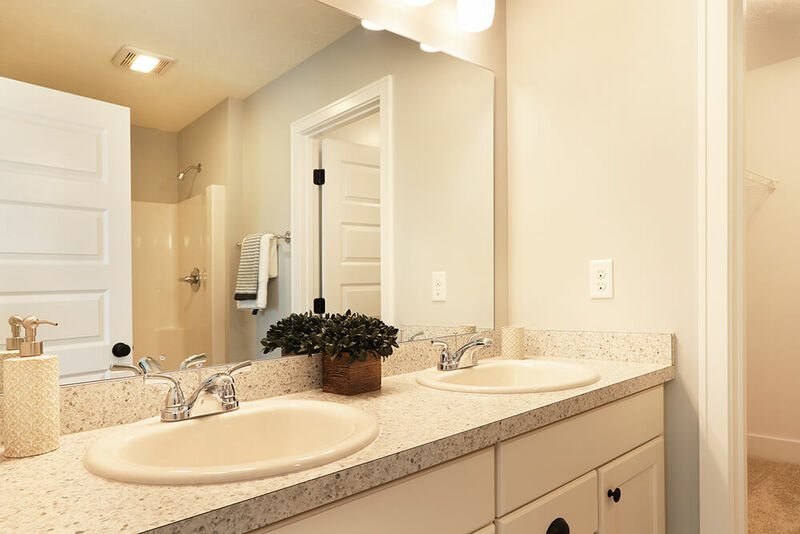 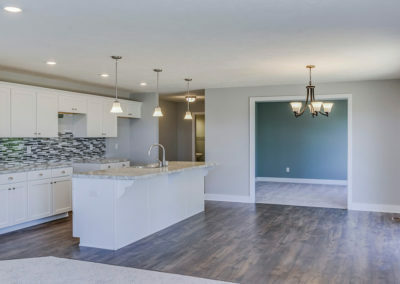 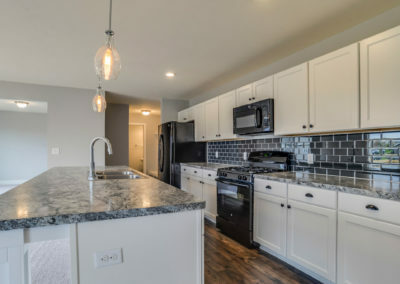 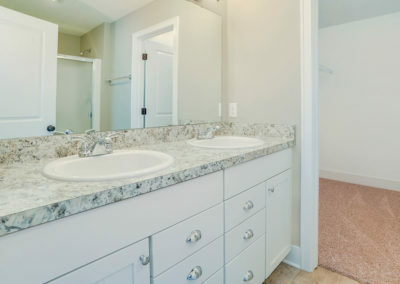 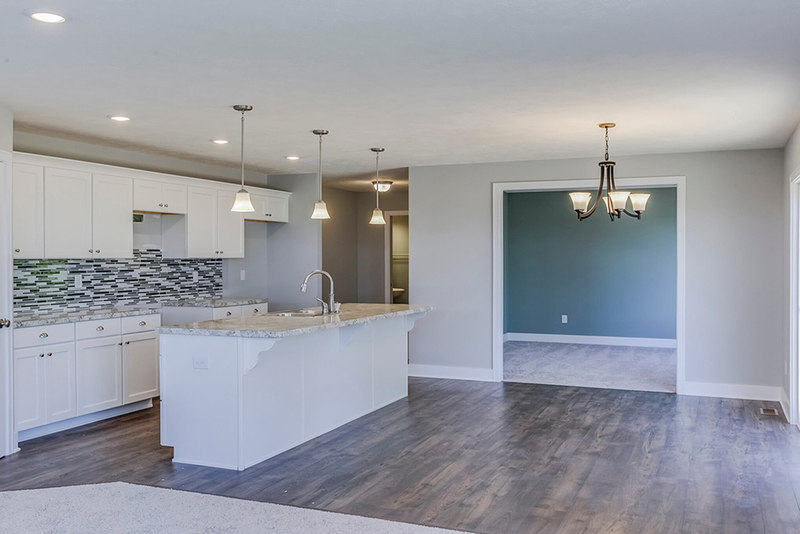 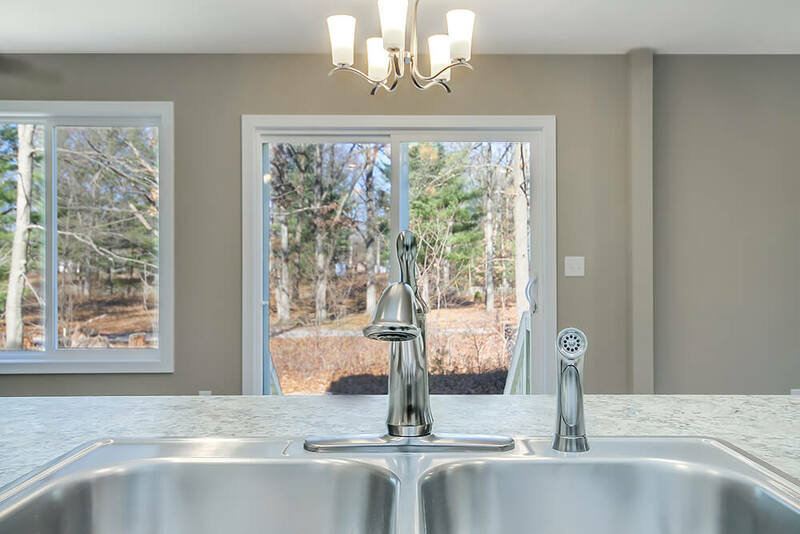 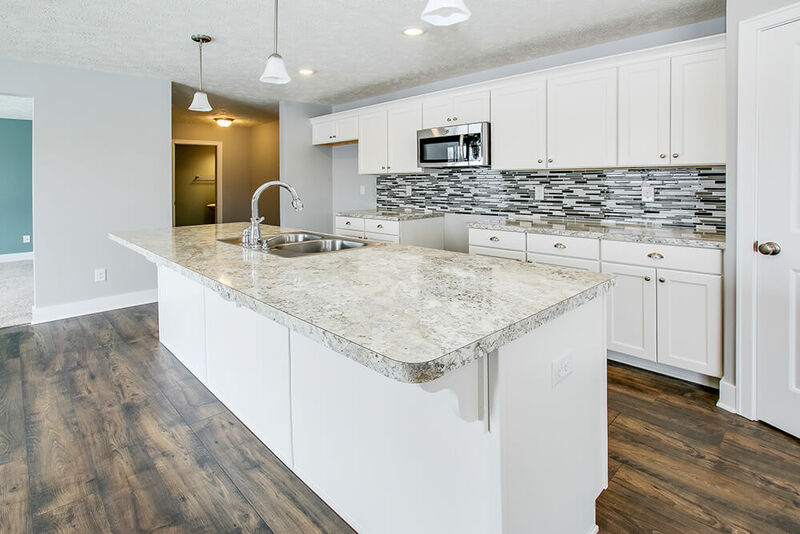 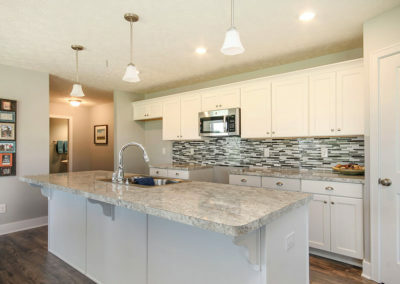 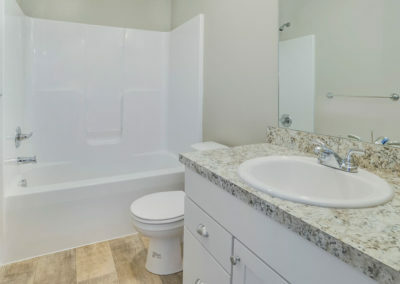 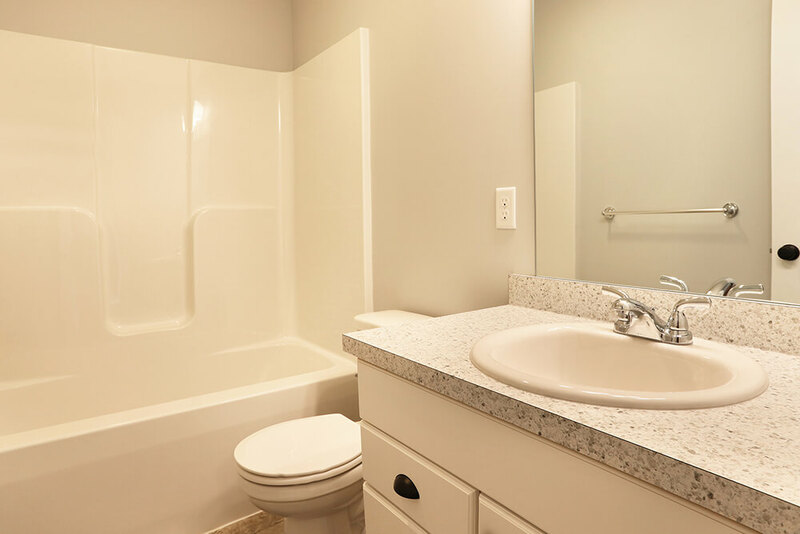 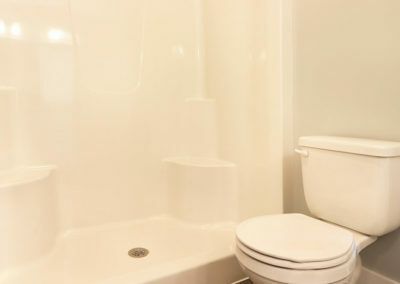 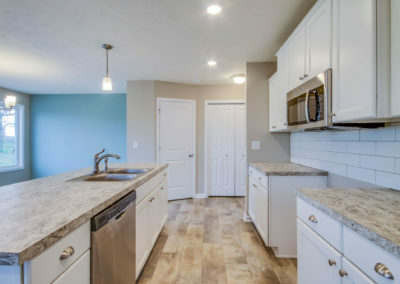 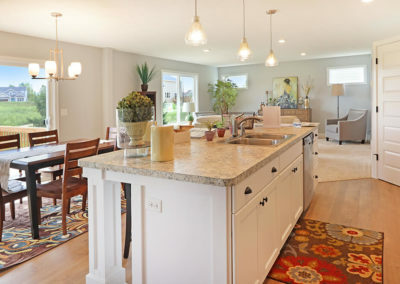 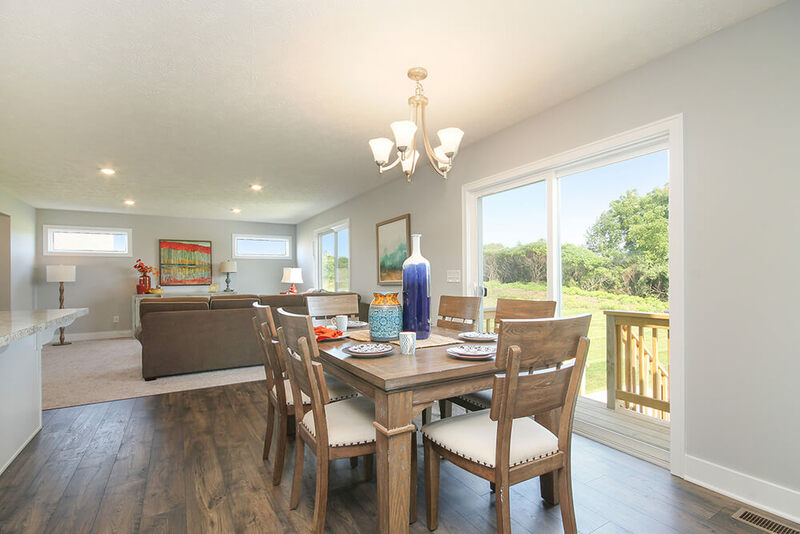 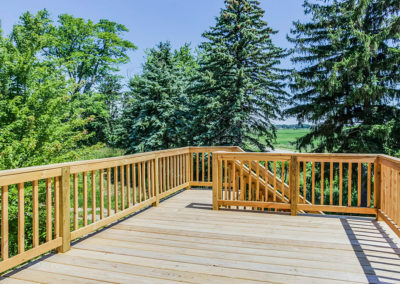 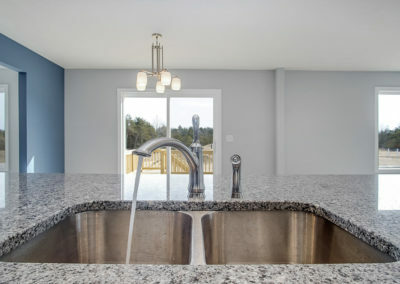 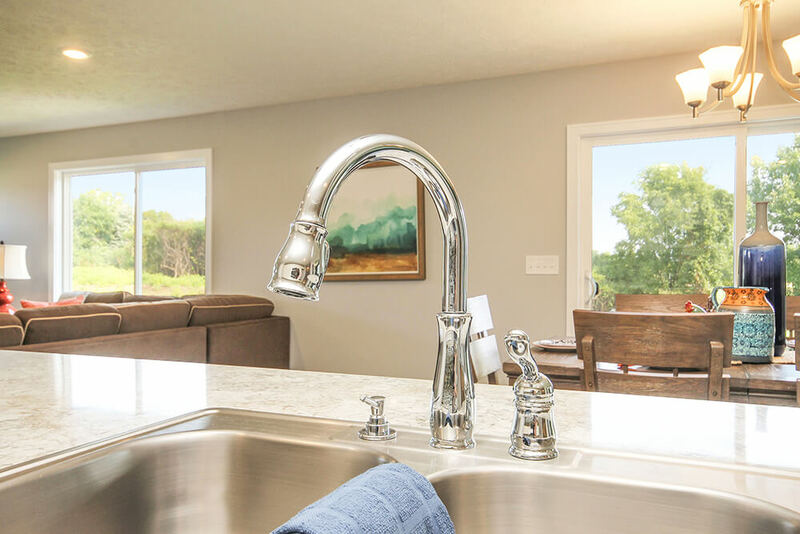 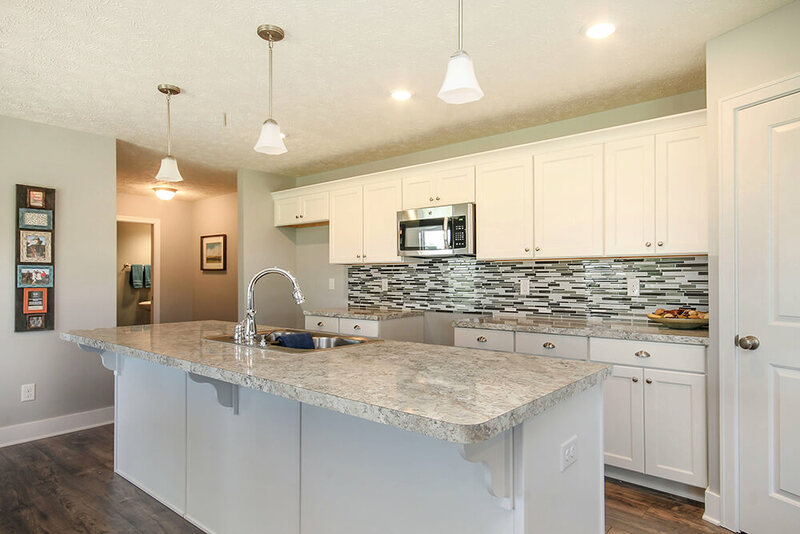 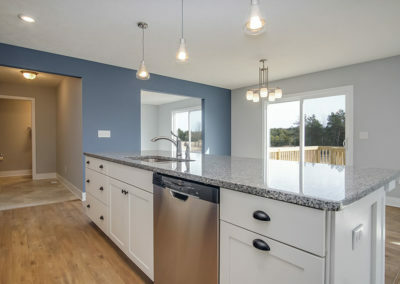 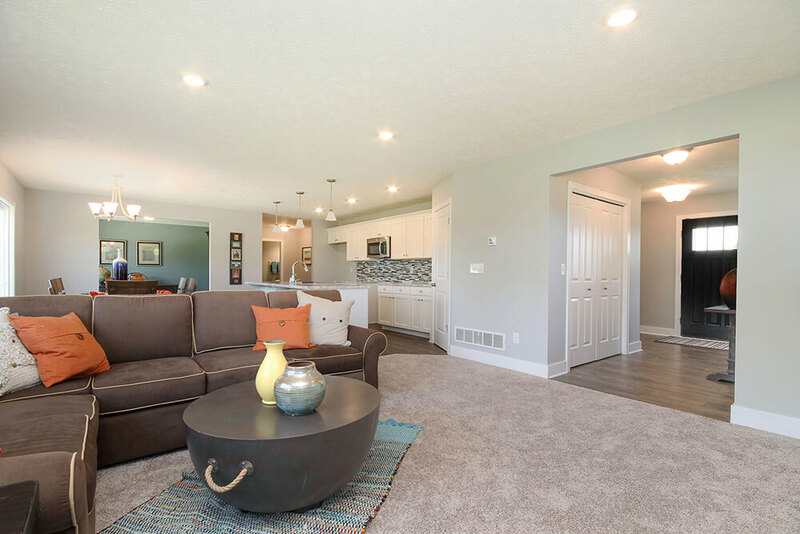 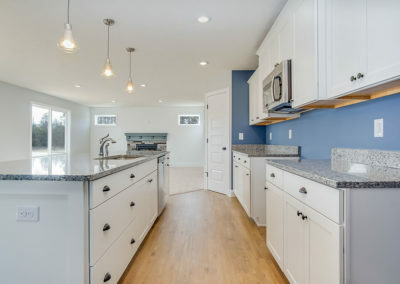 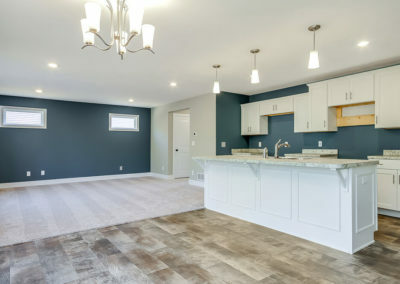 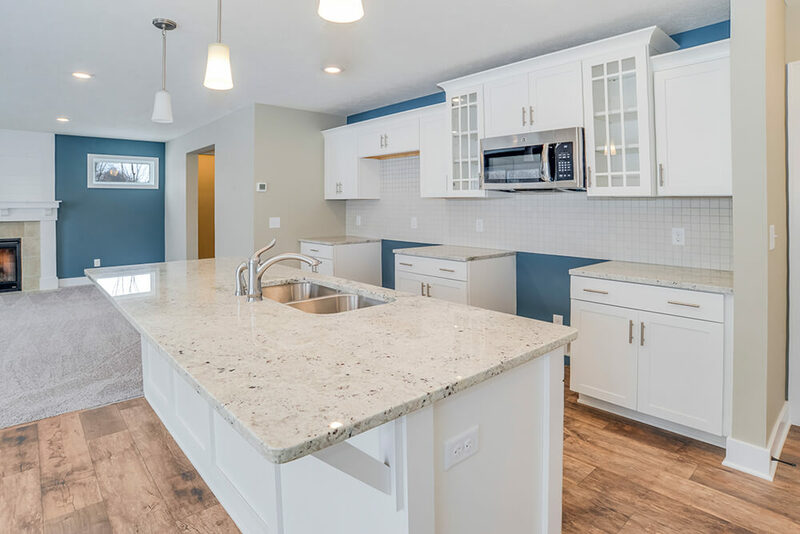 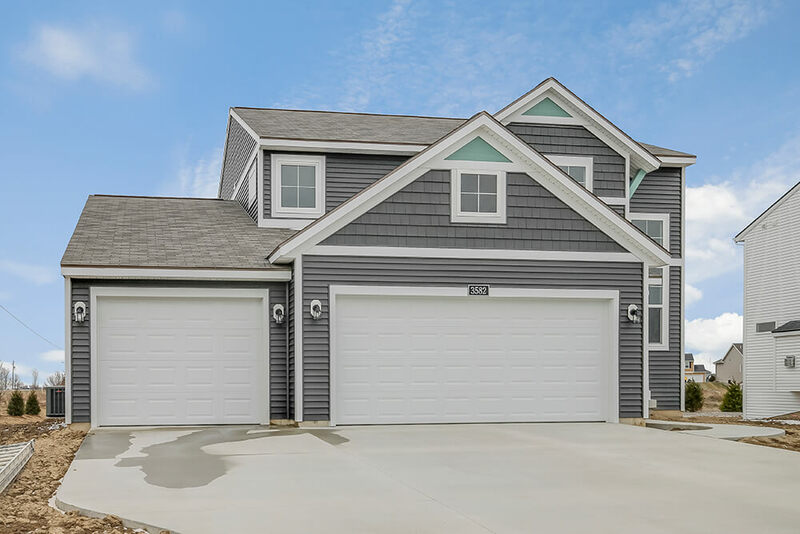 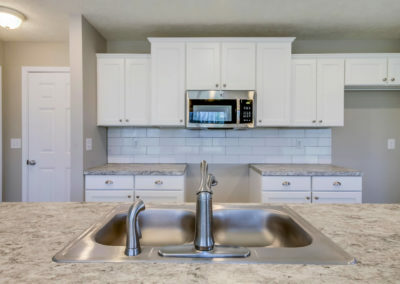 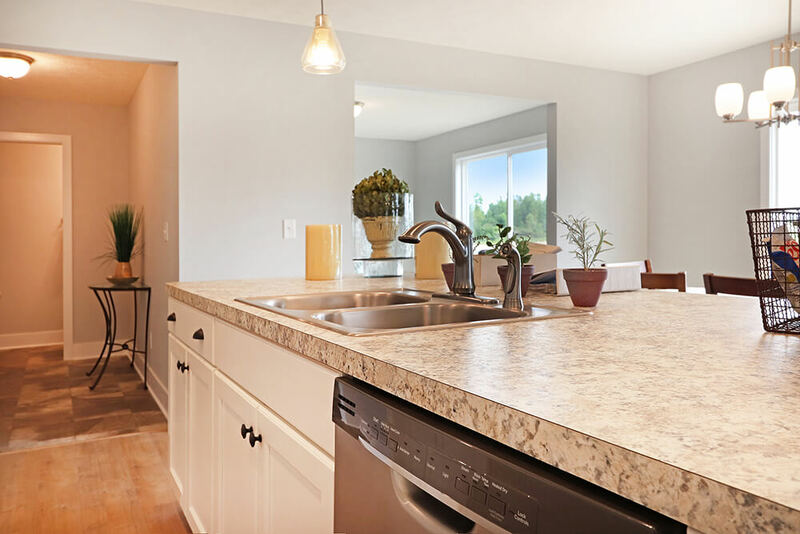 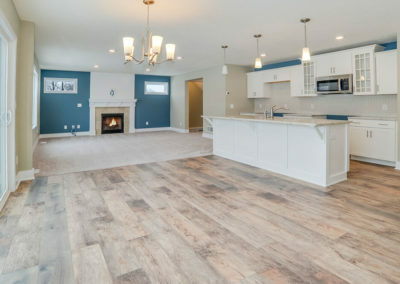 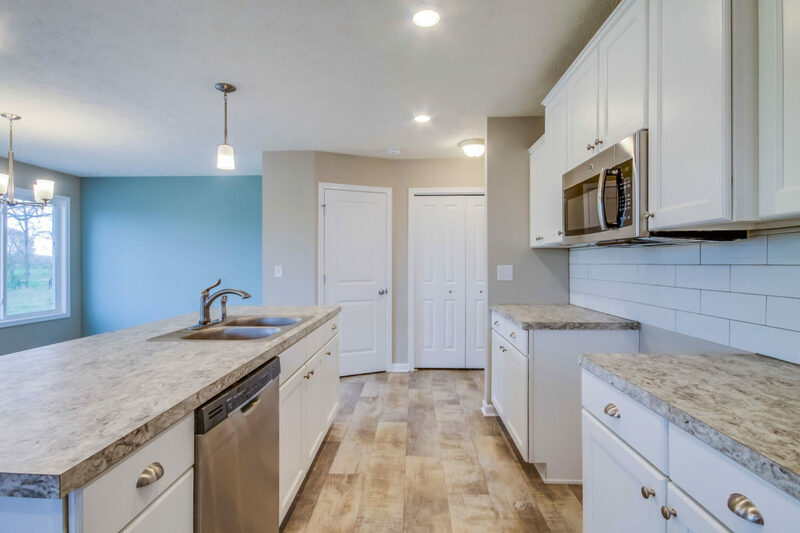 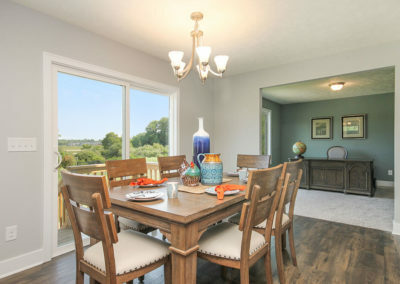 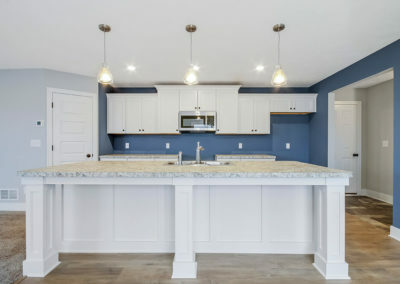 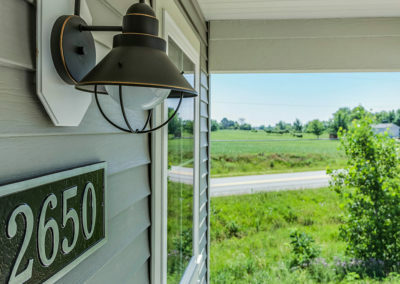 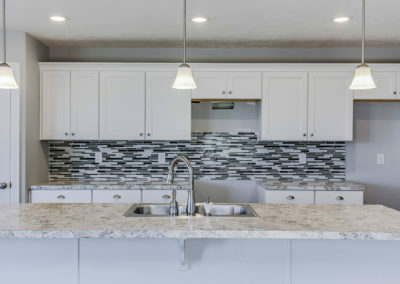 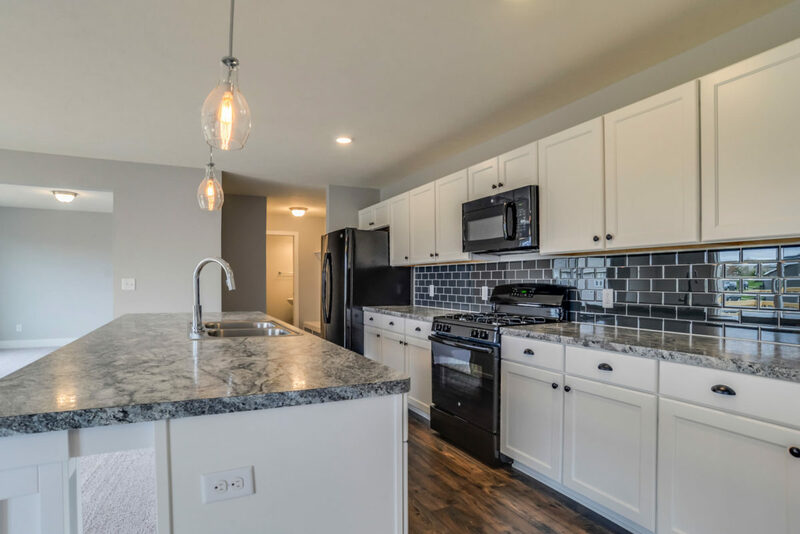 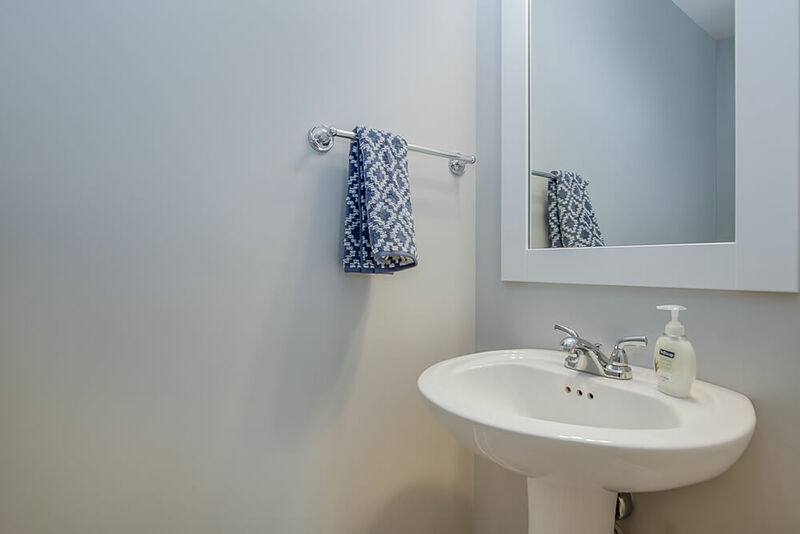 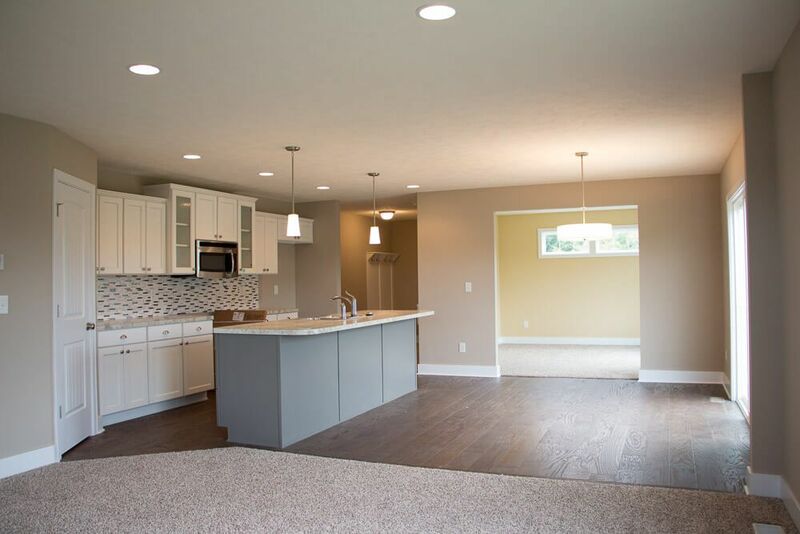 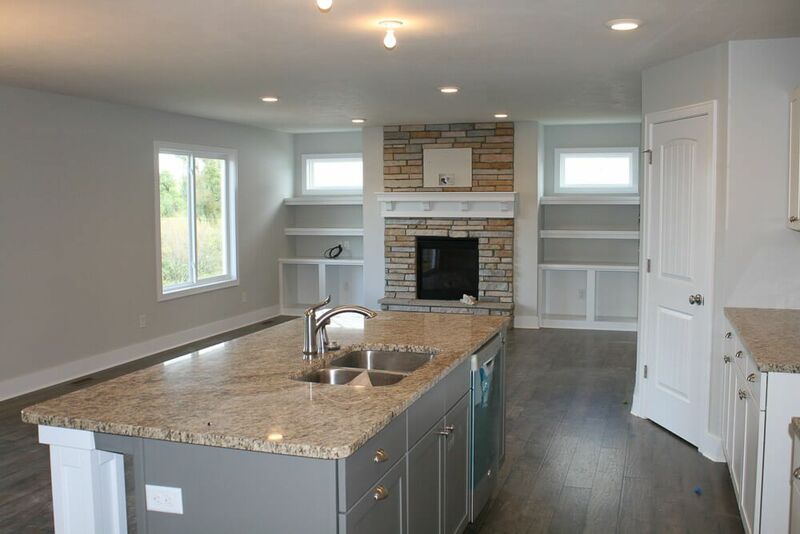 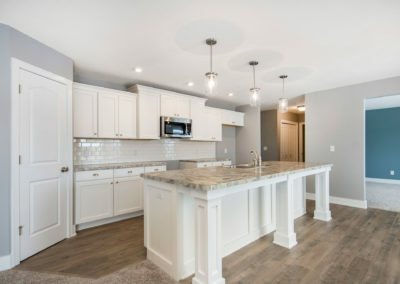 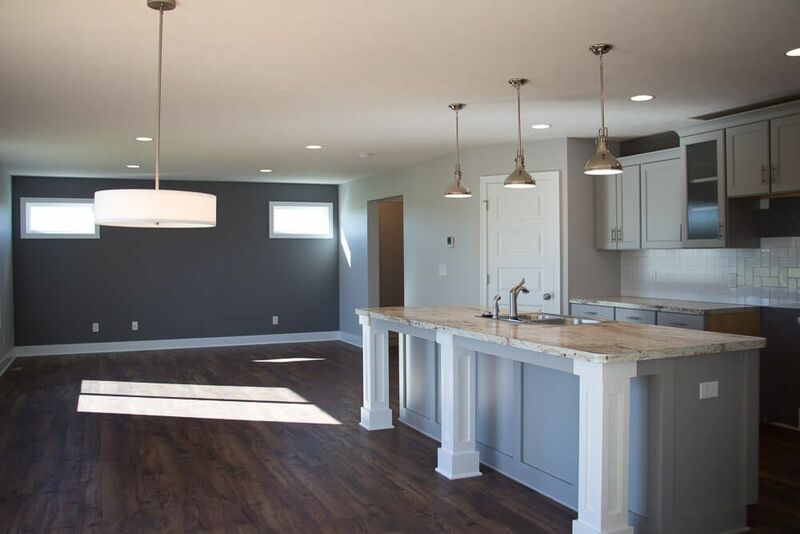 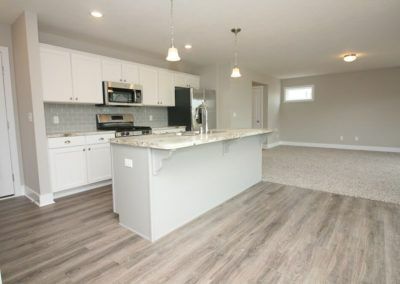 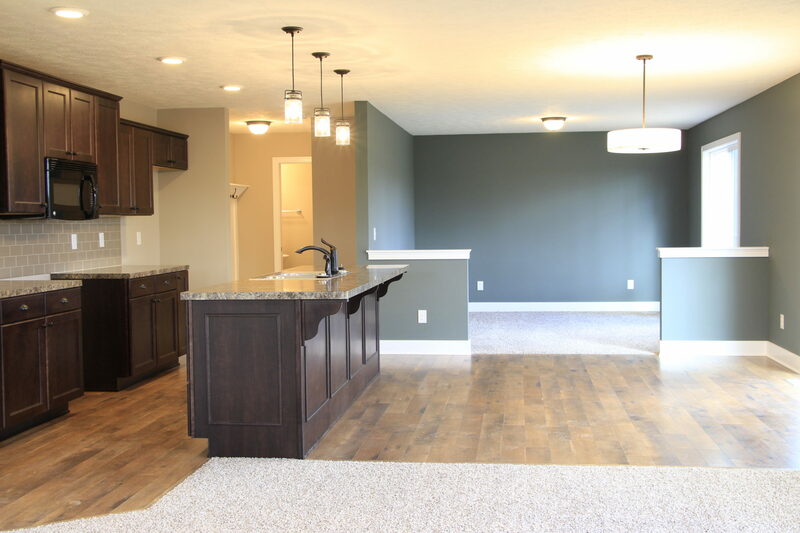 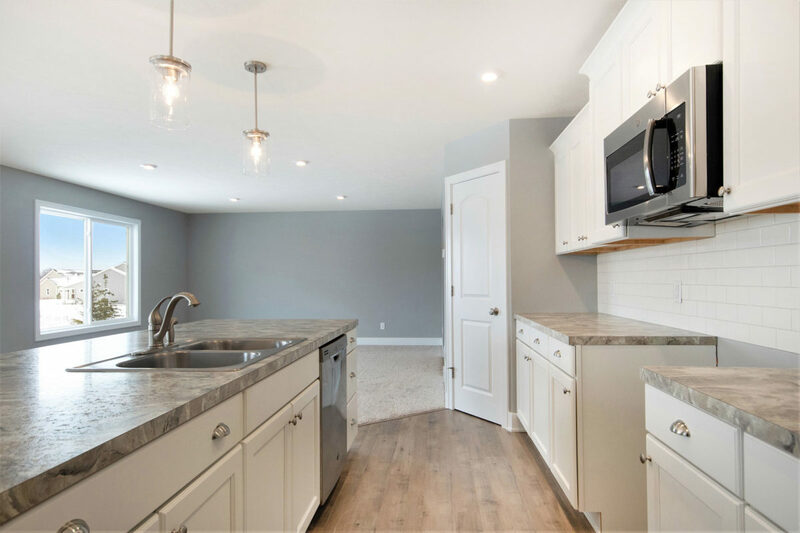 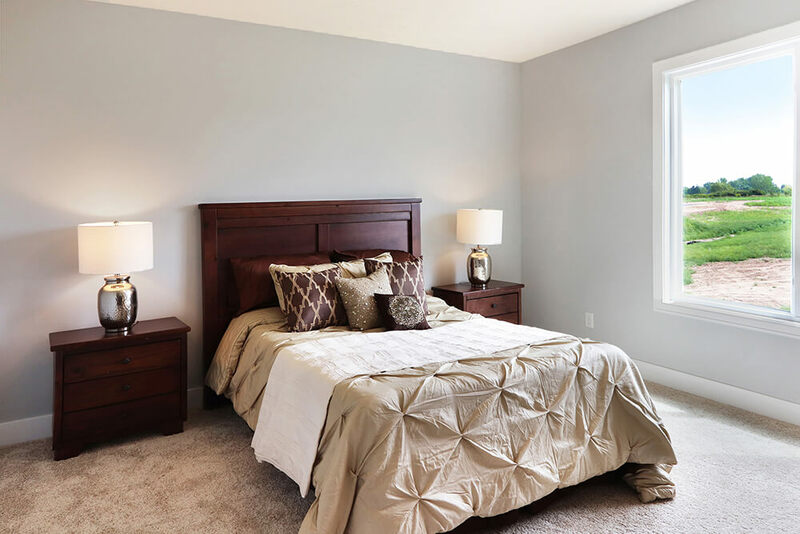 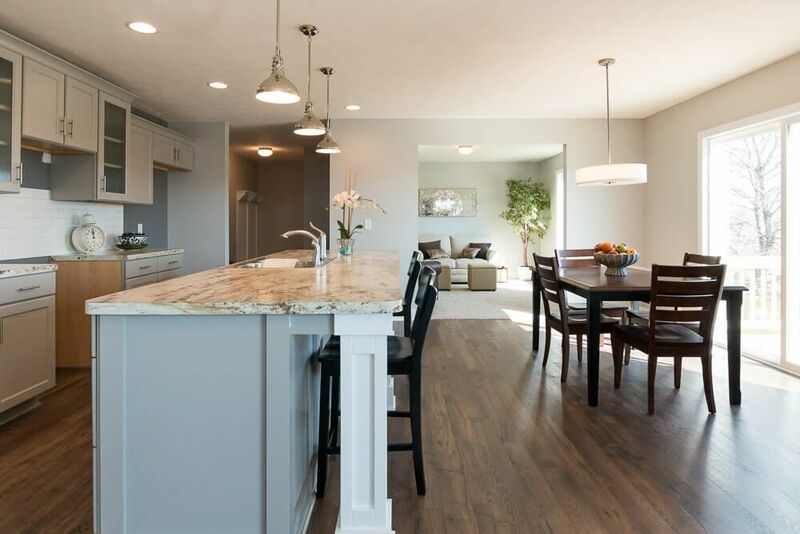 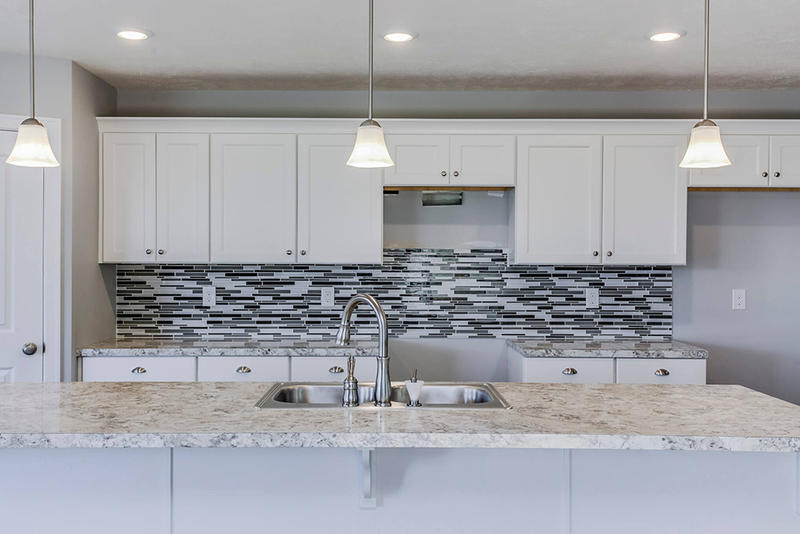 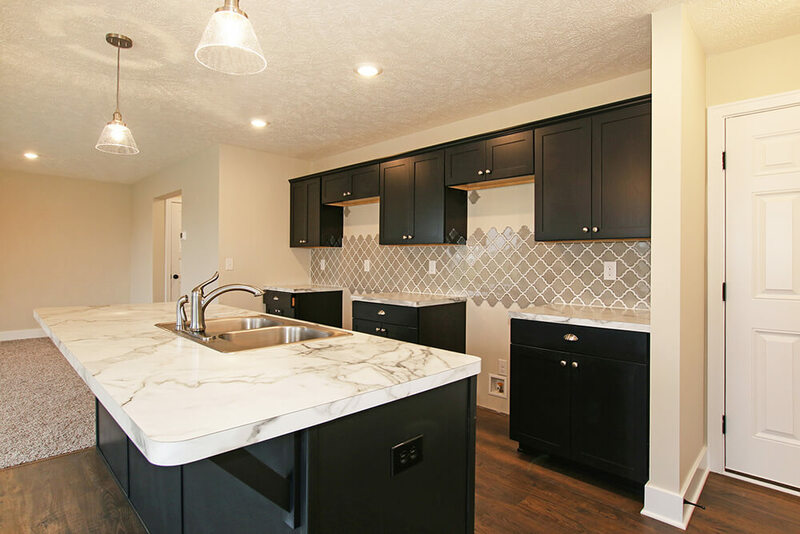 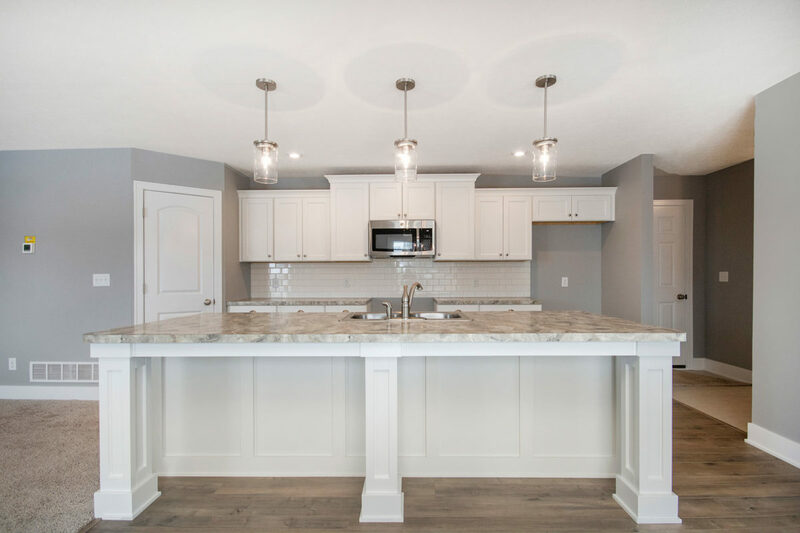 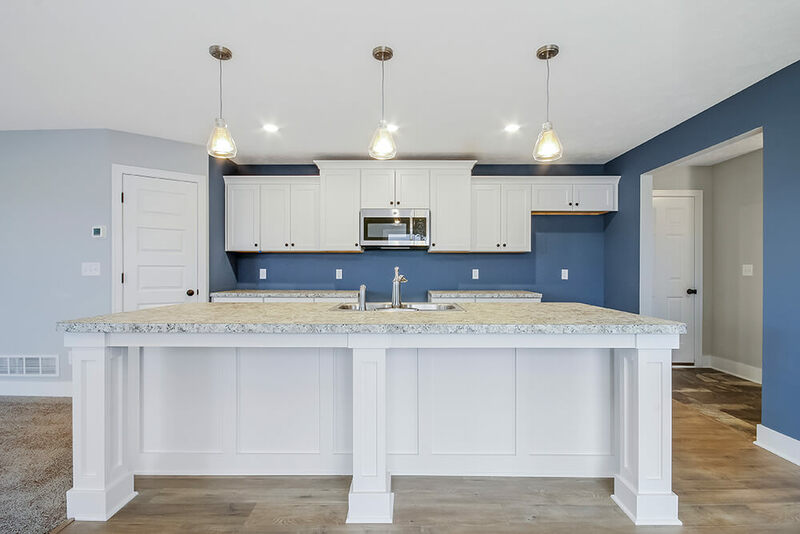 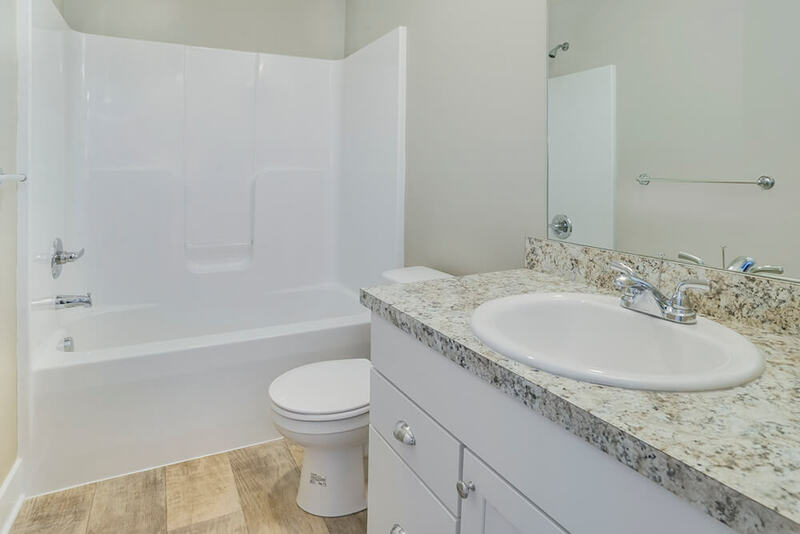 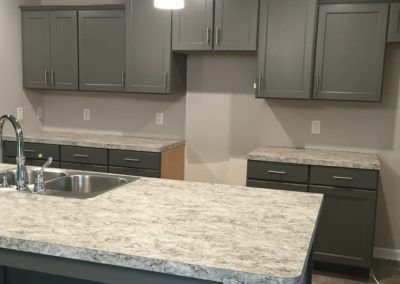 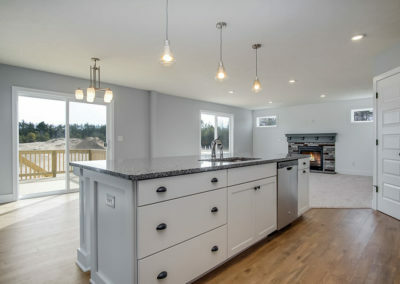 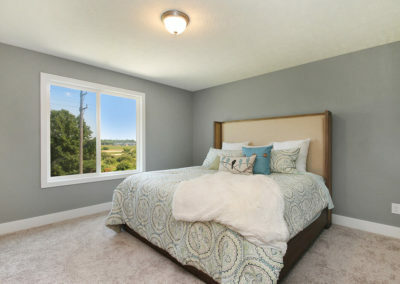 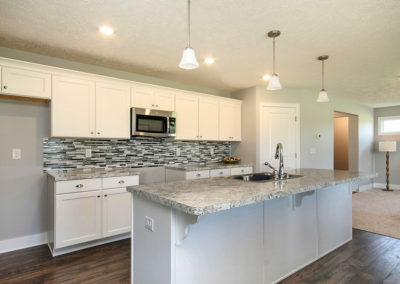 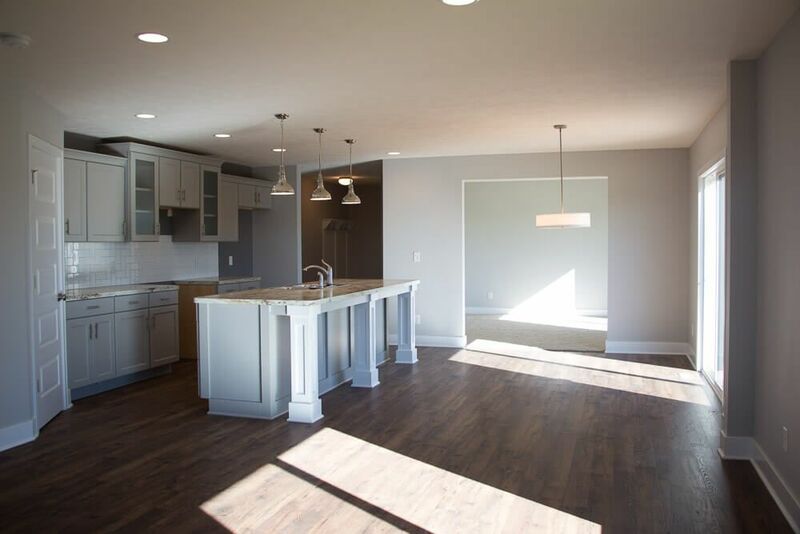 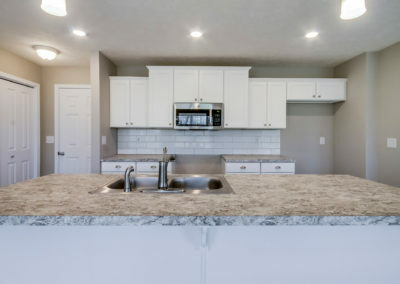 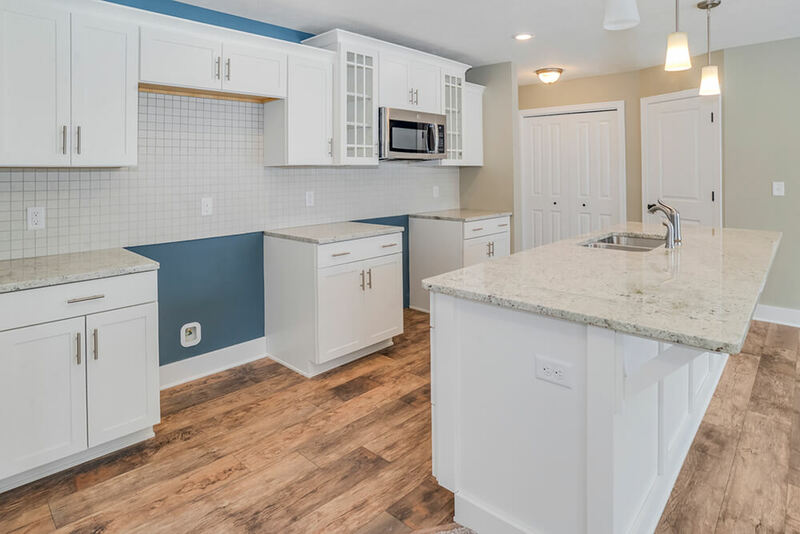 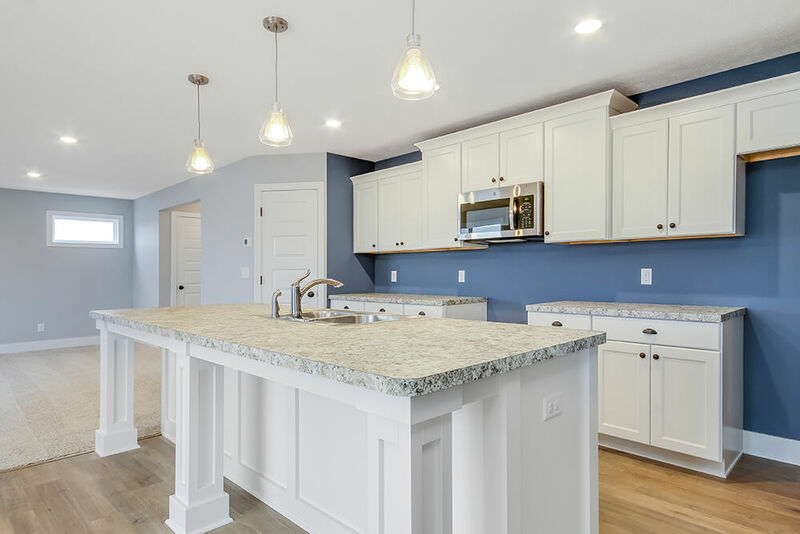 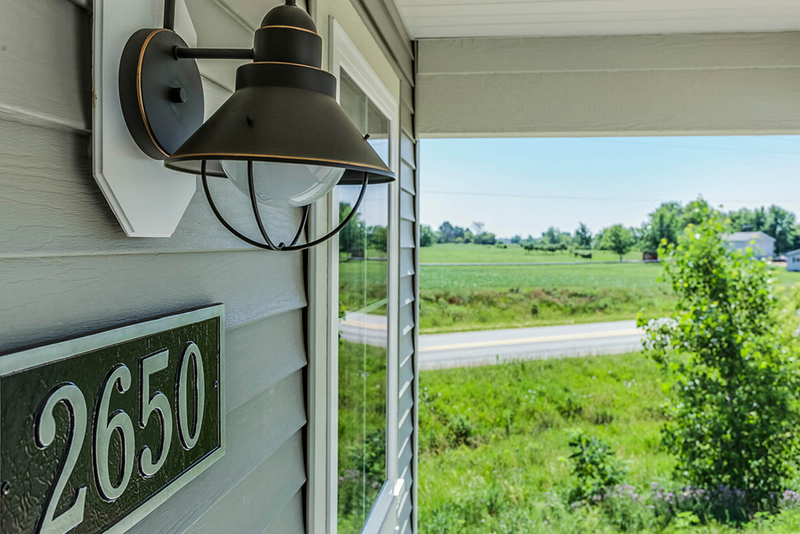 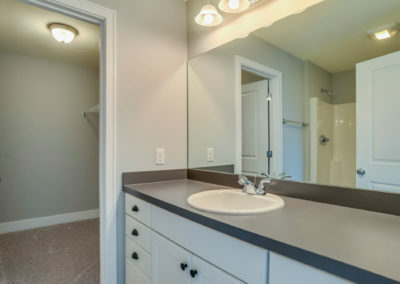 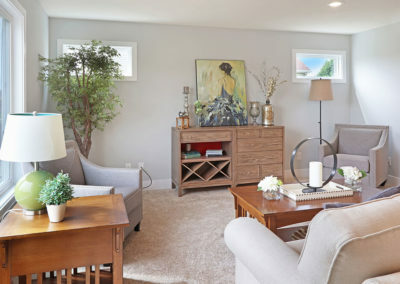 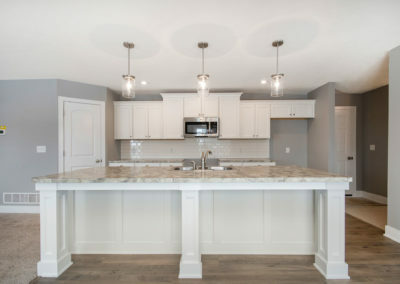 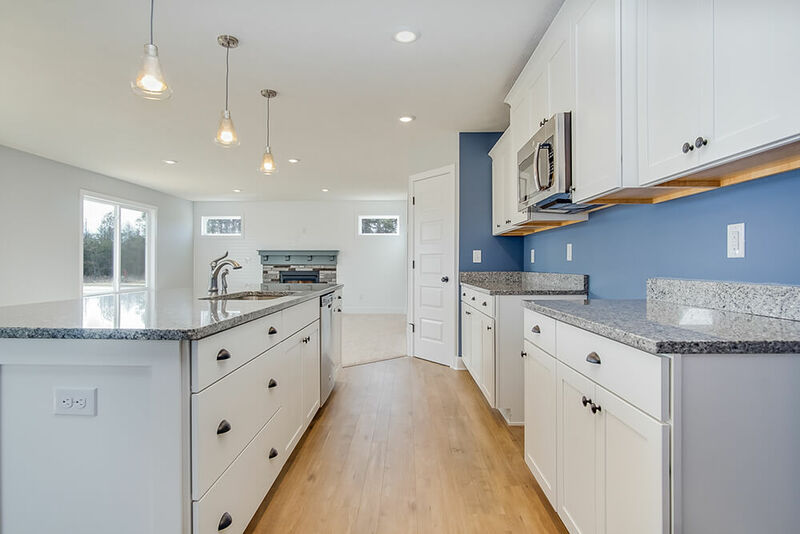 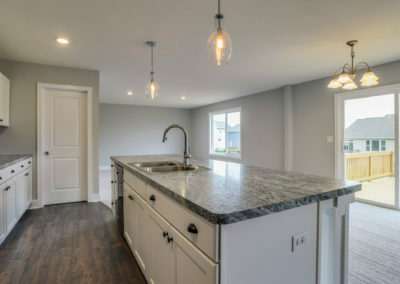 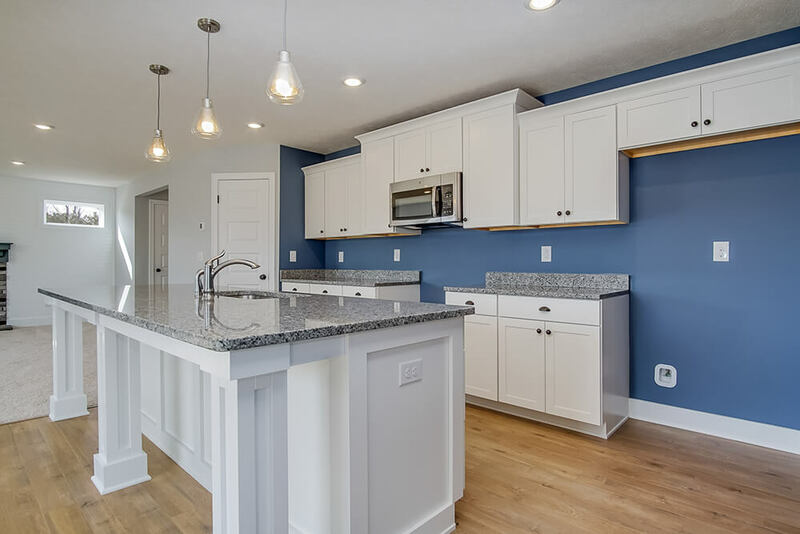 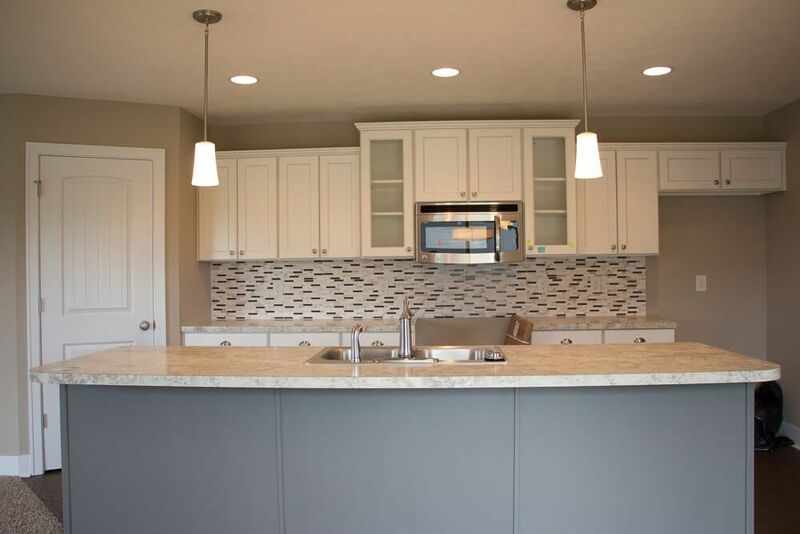 As with all homes built by Eastbrook, the Taylor is carefully crafted using the highest quality in design, materials, and workmanship, creating a home with value, appeal, and energy efficiency.